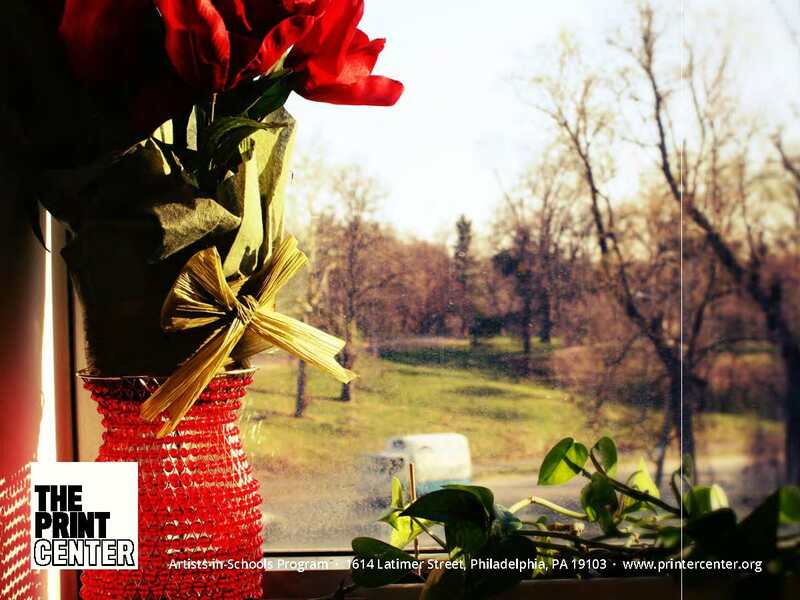 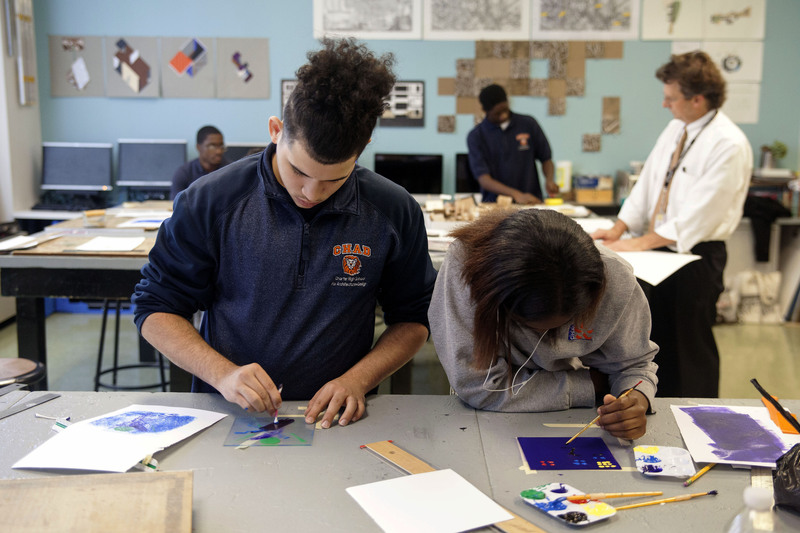 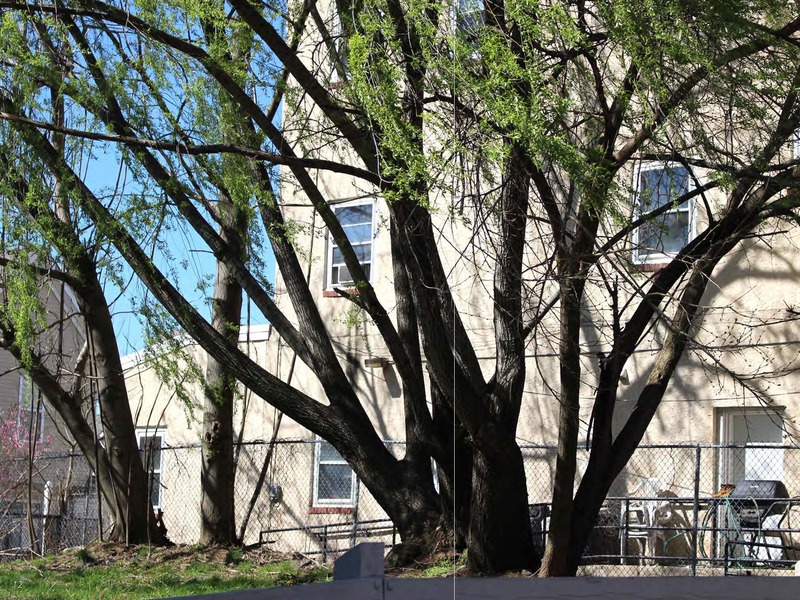 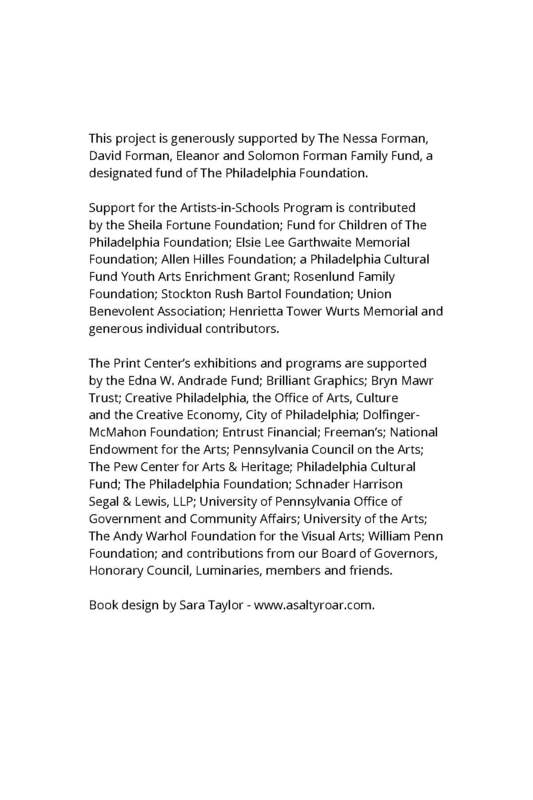 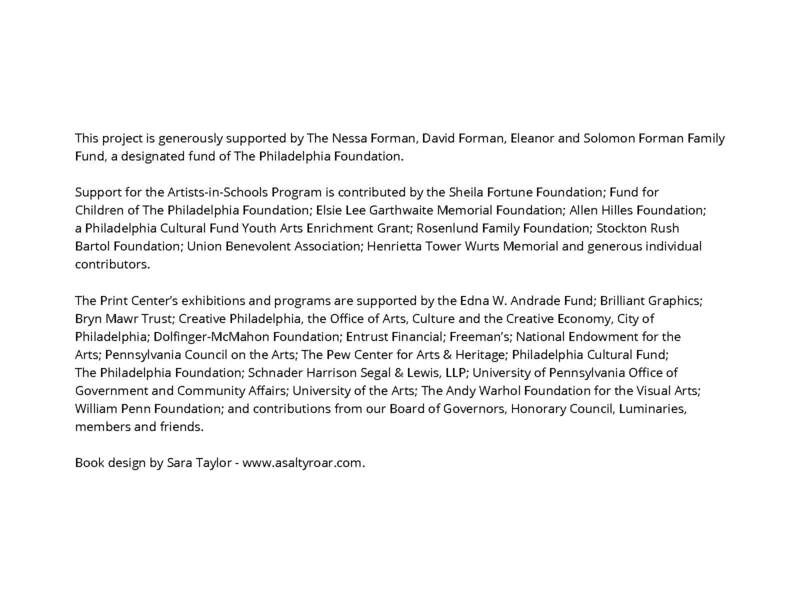 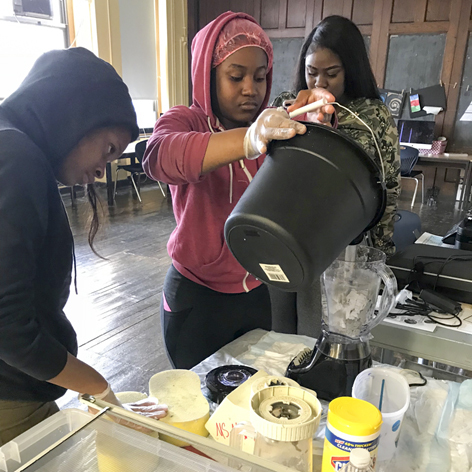 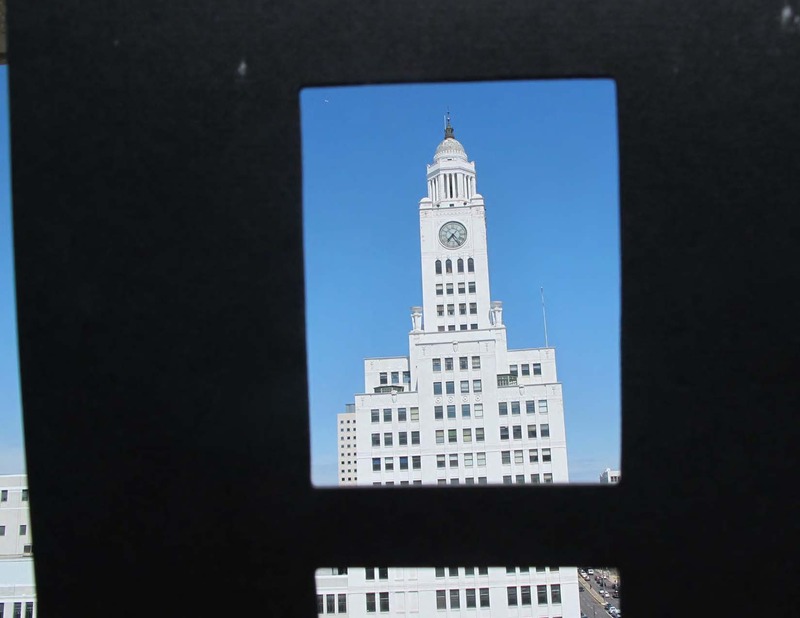 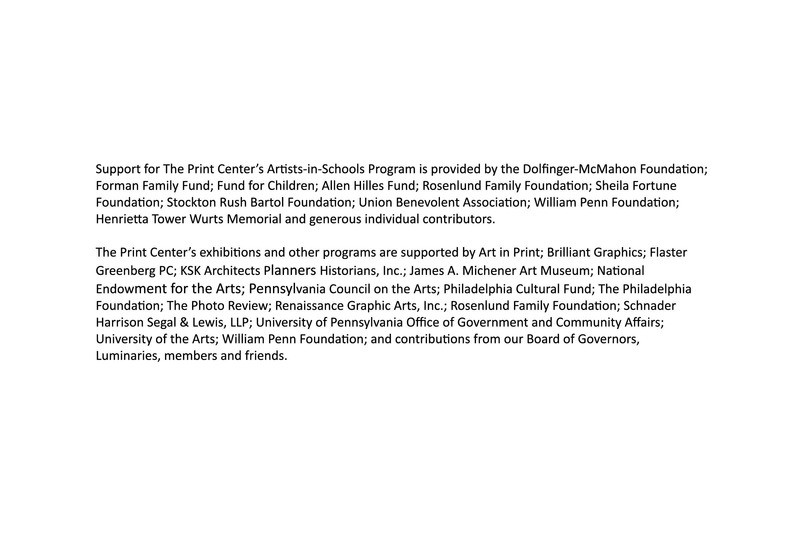 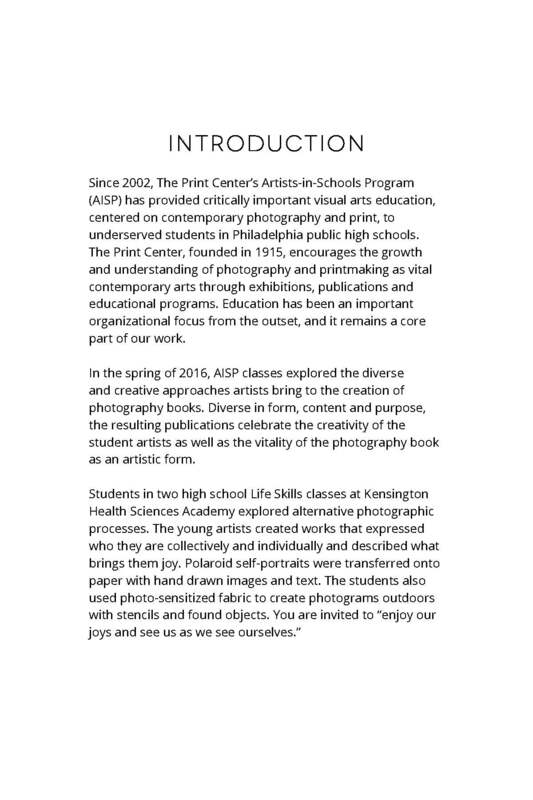 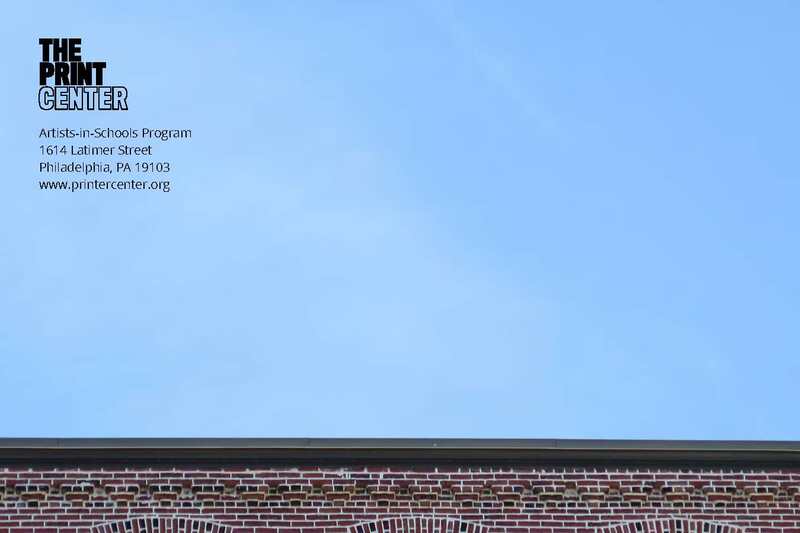 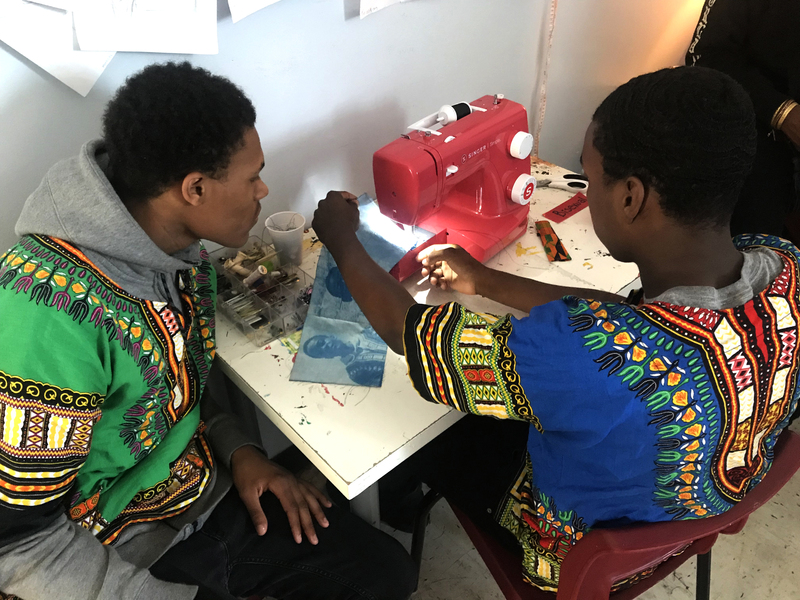 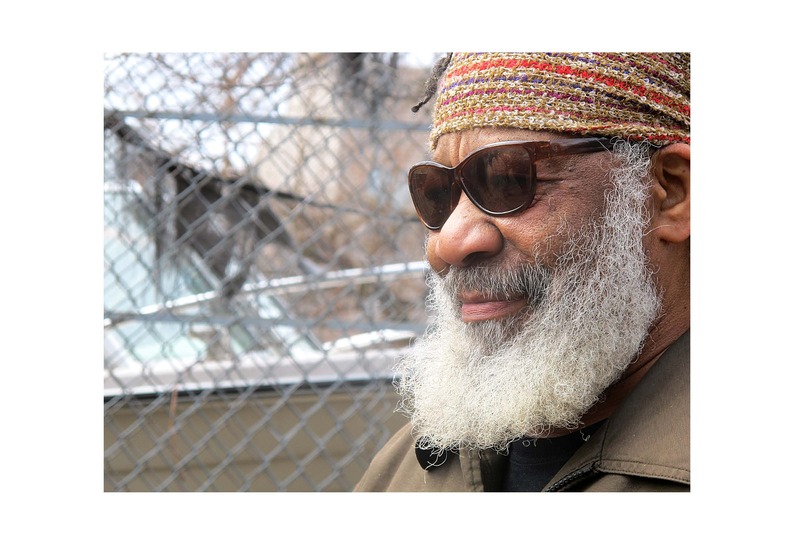 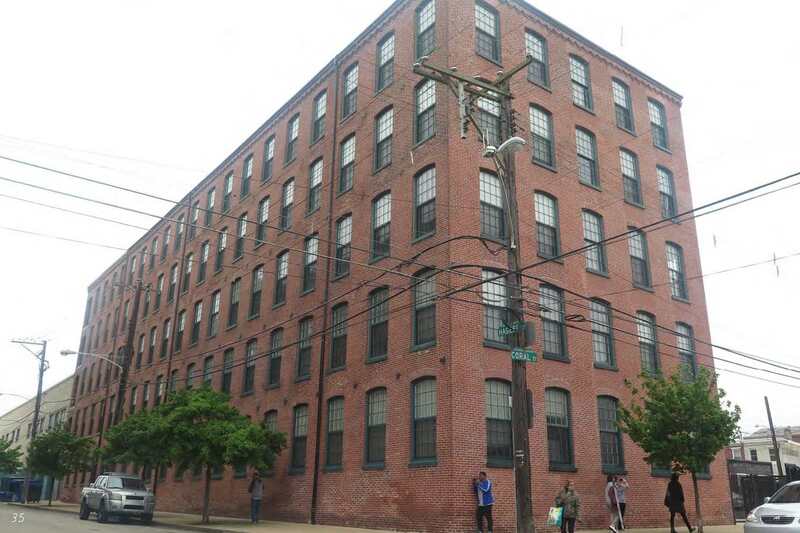 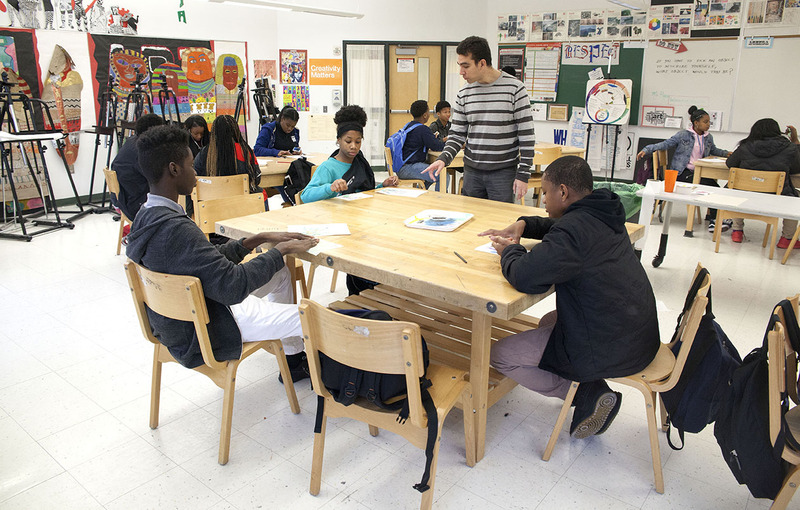 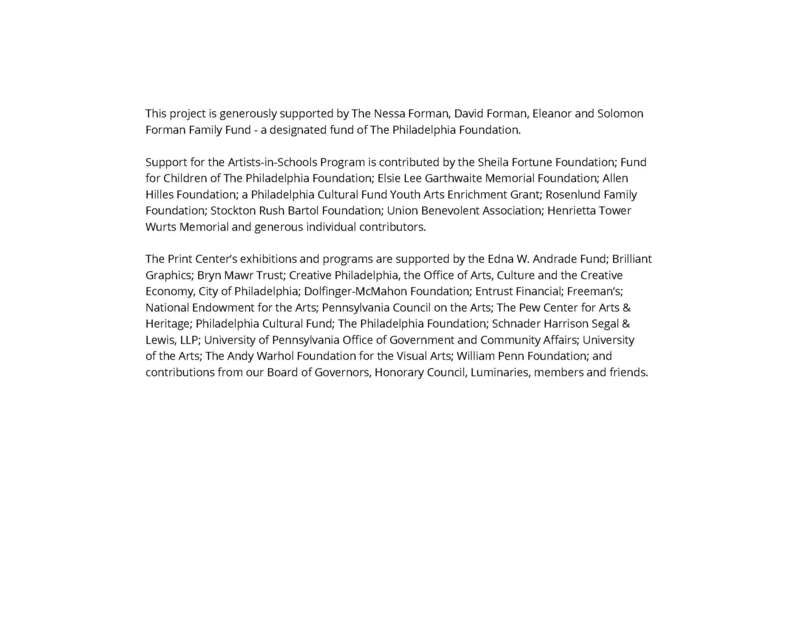 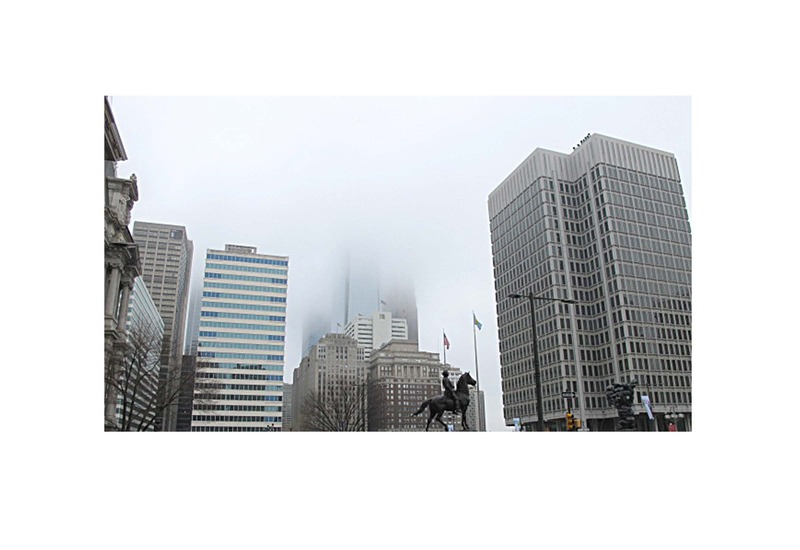 The Print Center's Artists-in-Schools Program (AISP) brings a full year of art classes focused on photography and printmaking to Philadelphia public high school students. 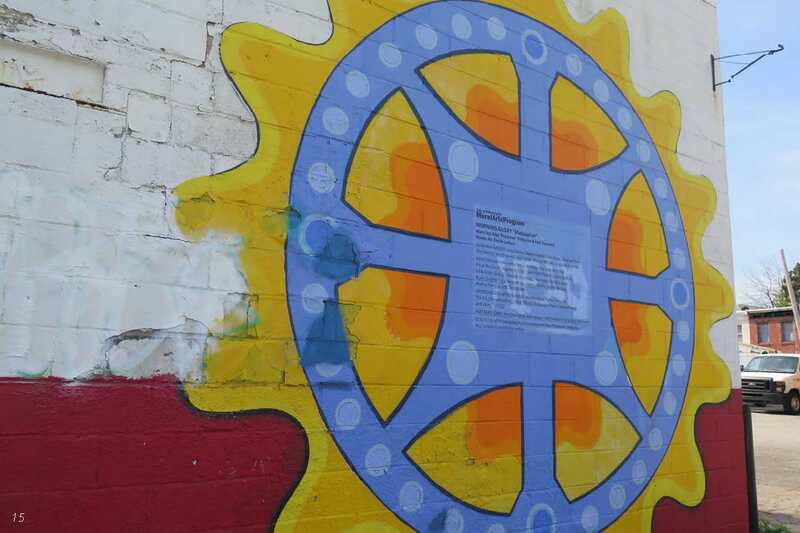 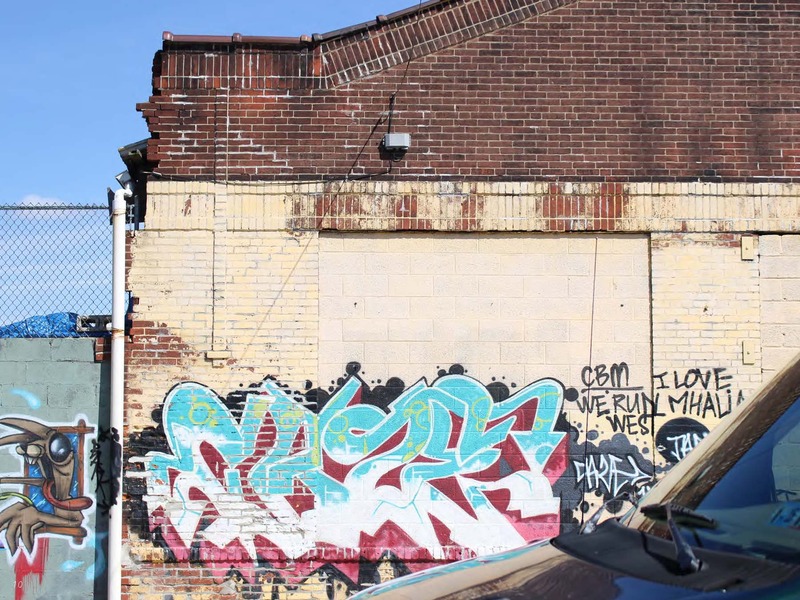 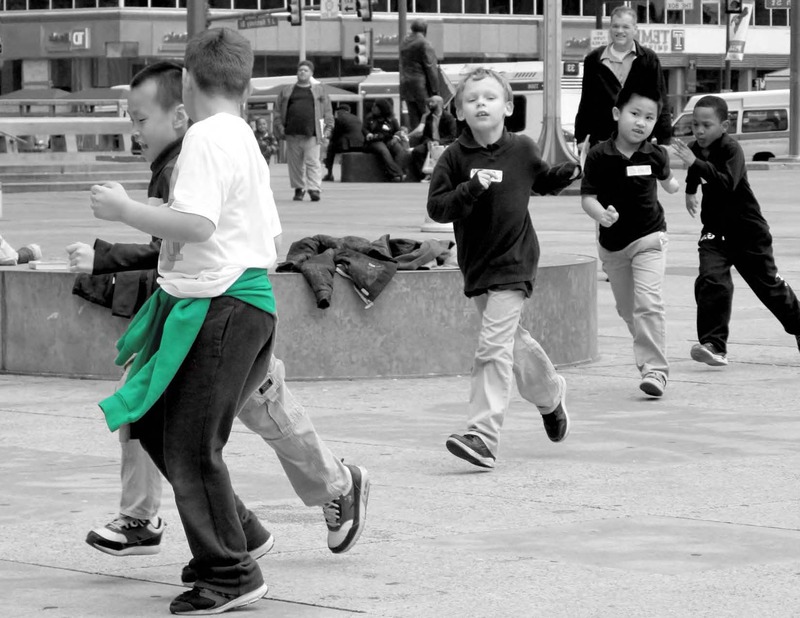 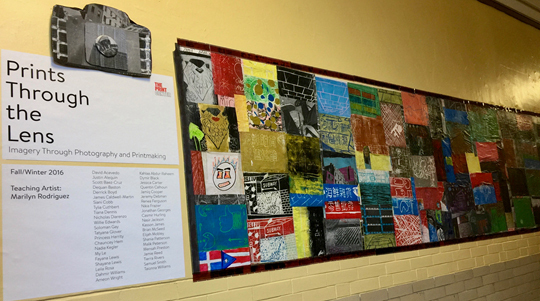 Since 2002, we are proud to have collaborated with thousands of students in public school art classrooms throughout Philadelphia's neighborhoods. 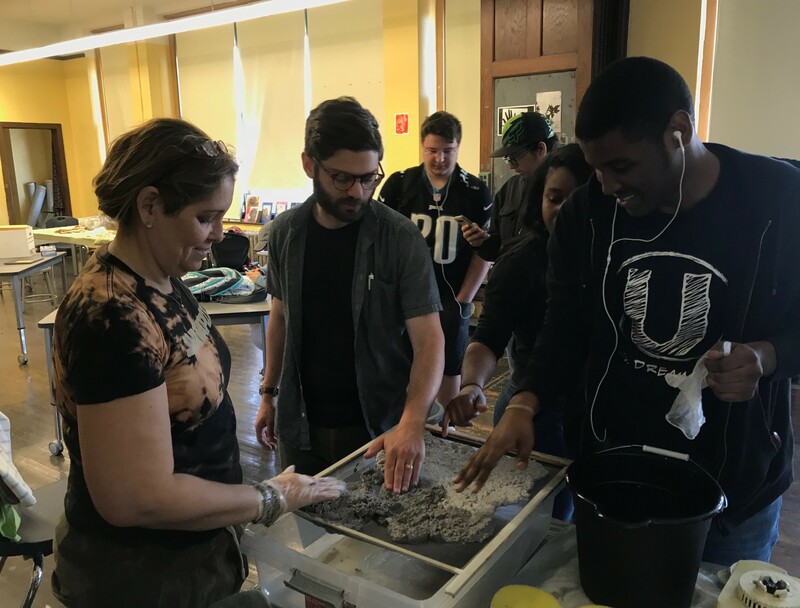 Led by Program Coordinator Lindsay Sparagana, in 2017 – 2018 we worked with over 450 students in 15 residencies at the Charter High School for Architecture + Design, The School of the Future, Northeast High School, Olney Charter High School, Sankofa Freedom Academy and The U School. 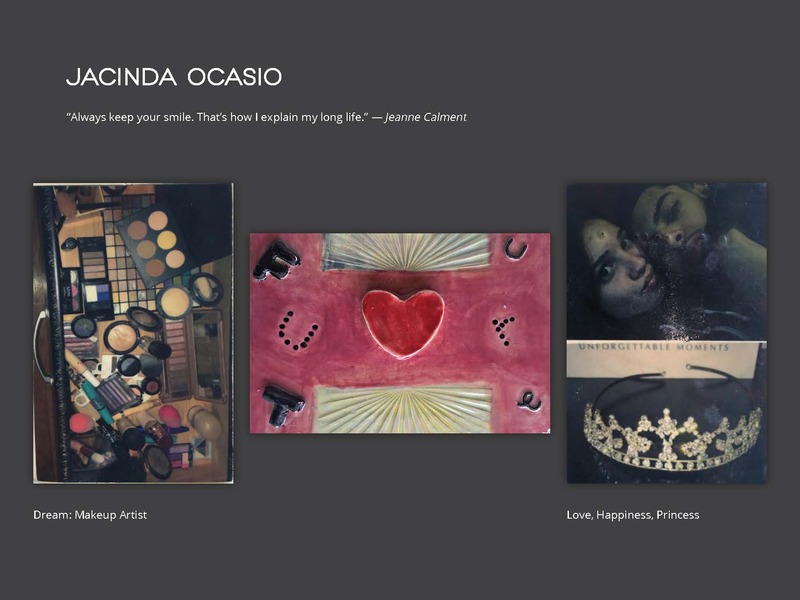 Our exceptional teaching-artists were Grimaldi Baez, Josias Figueirido, Joyce Millman, Marilyn Rodriguez, Alexandra Snowden and Lindsay Sparagana. 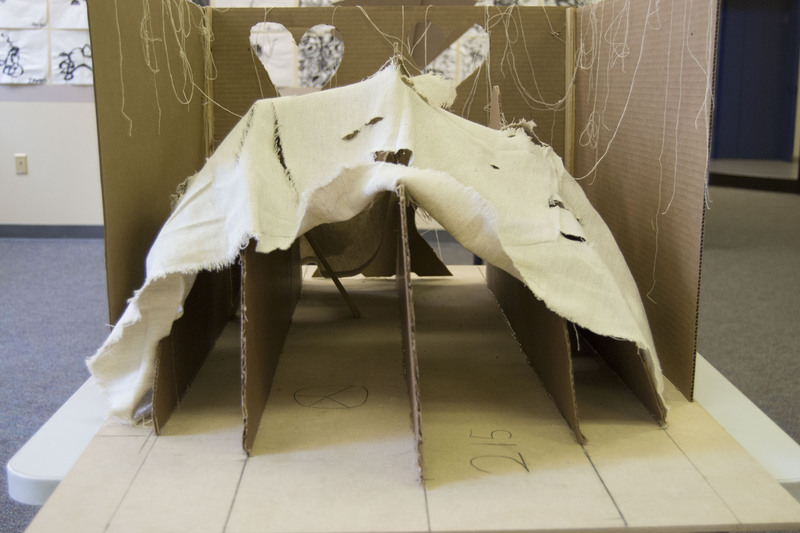 We are thrilled to share the ambitious projects made by our students during this year’s residencies. 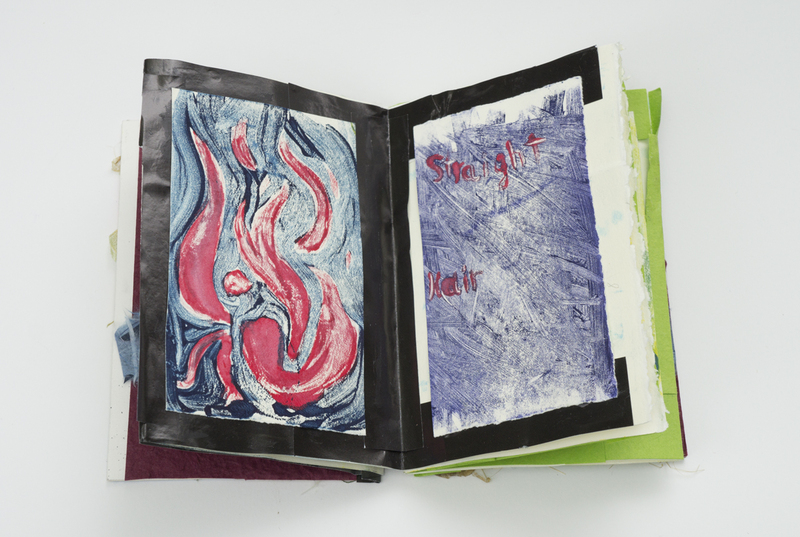 The spring 2018 Open Book curriculum celebrated the significance and versatility of handmade books and photobooks, as well as their role as a platform for personal narrative or commentary on visual culture. 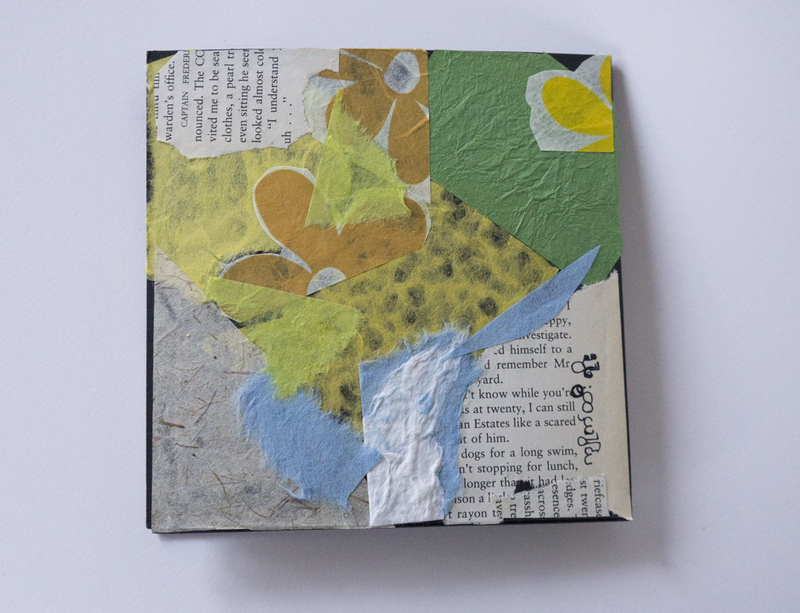 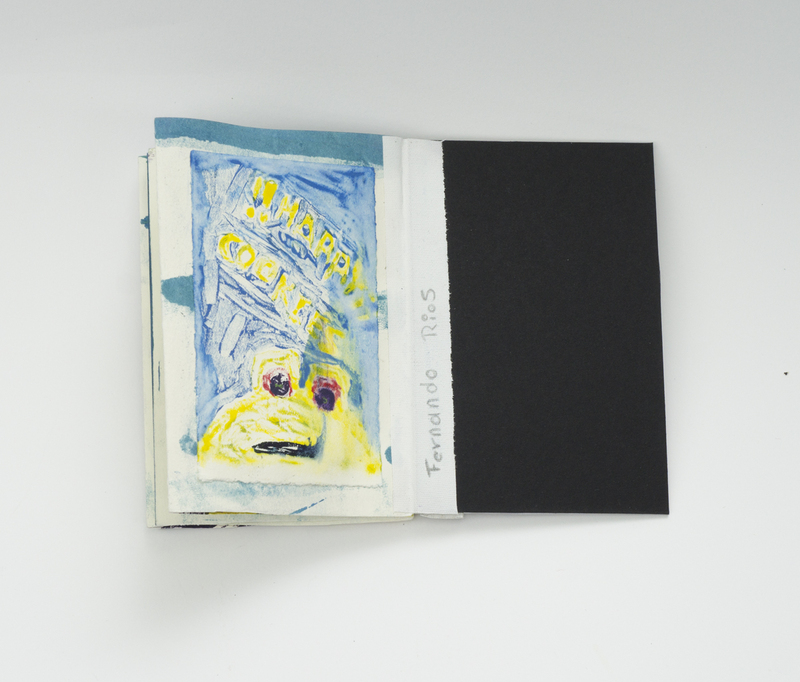 Open Book was inspired by the books and accompanying images exhibited in By the Book Vol. 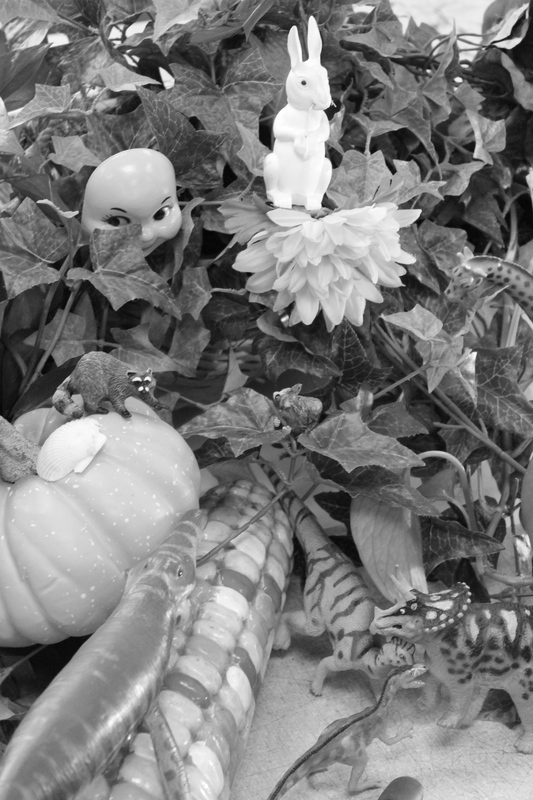 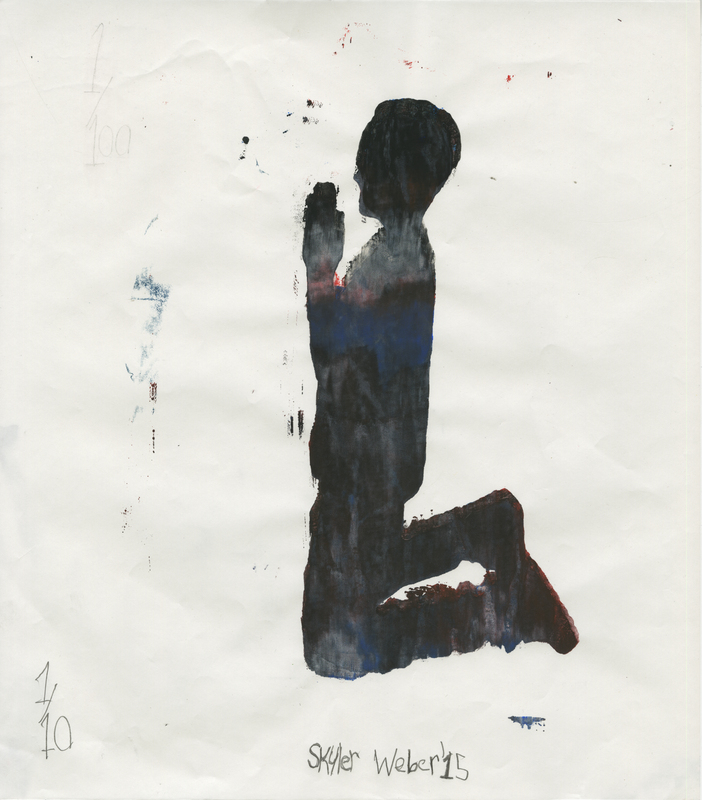 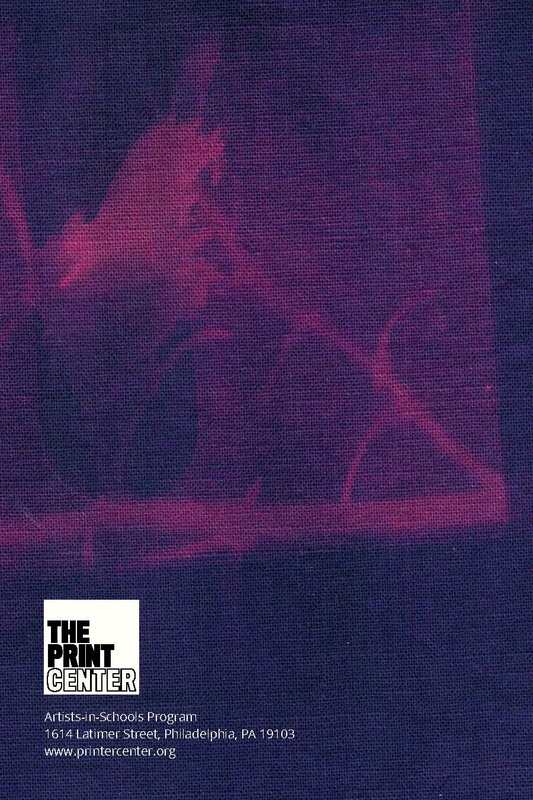 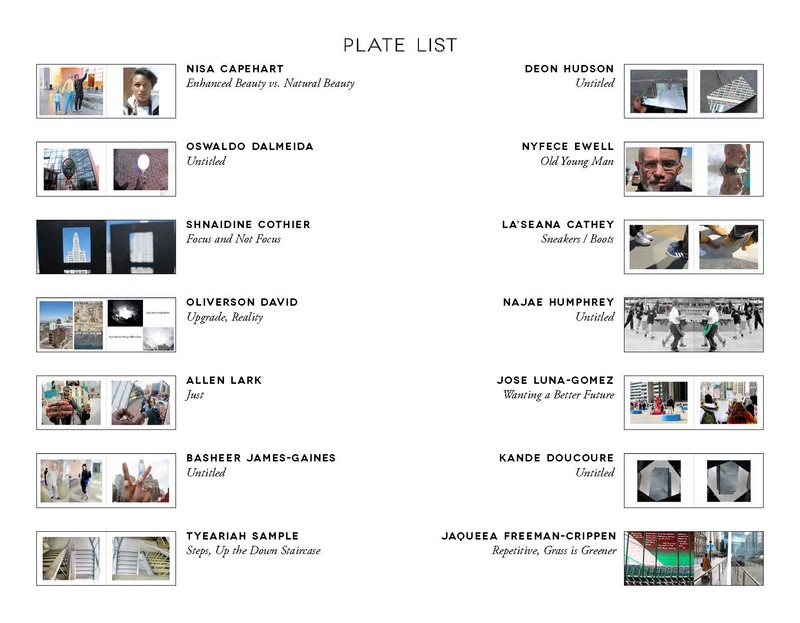 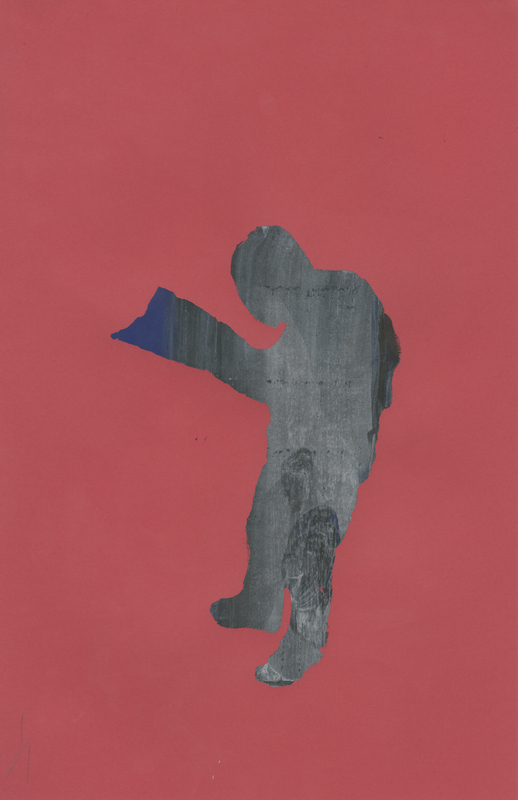 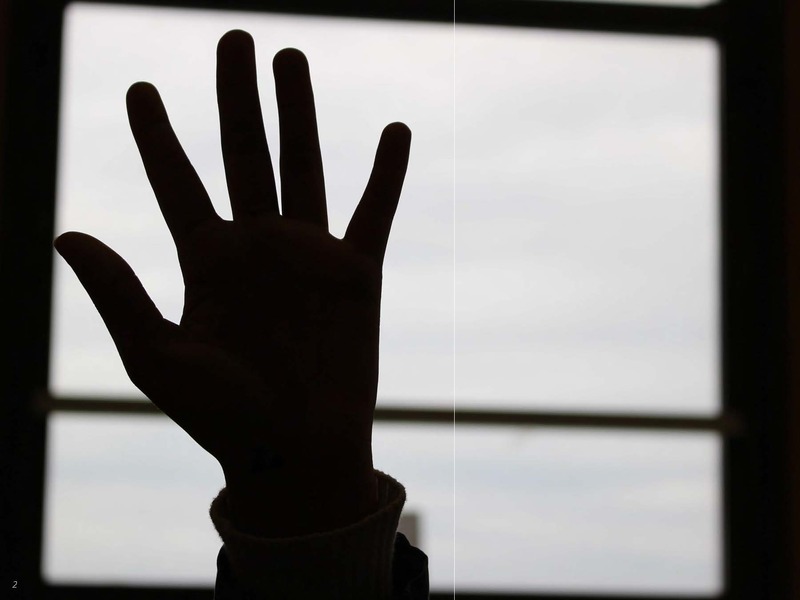 2: New Photography Publications and Collaborative Histories: Dieu Donné at The Print Center. 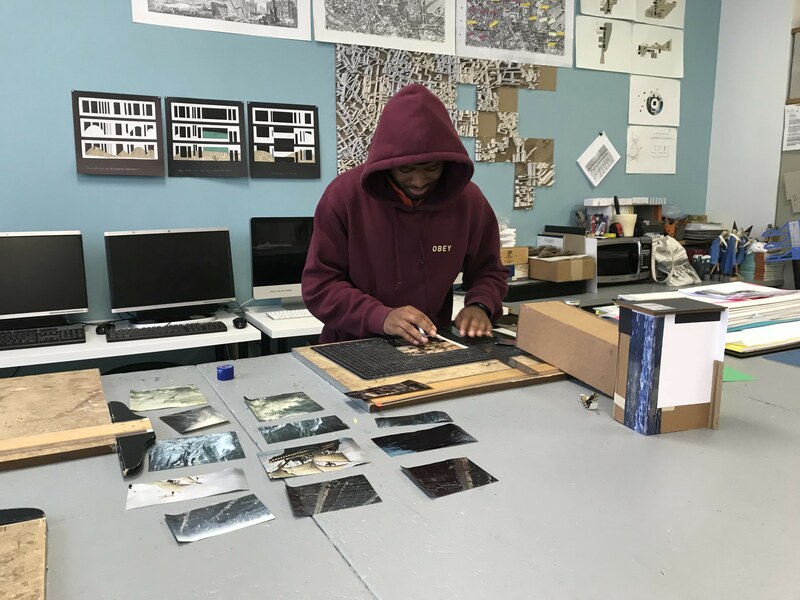 These shows provided limitless inspiration in terms of approach, content and form, and offered students an opportunity to integrate contemporary digital technologies with historical print, papermaking and photographic processes. 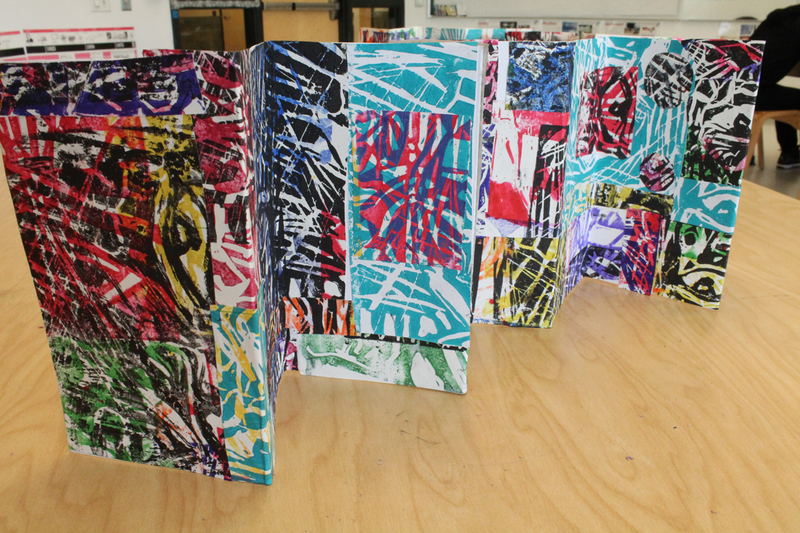 Students from the Charter High School for Architecture + Design (CHAD) interpreted ideas featured in By the Book Vol. 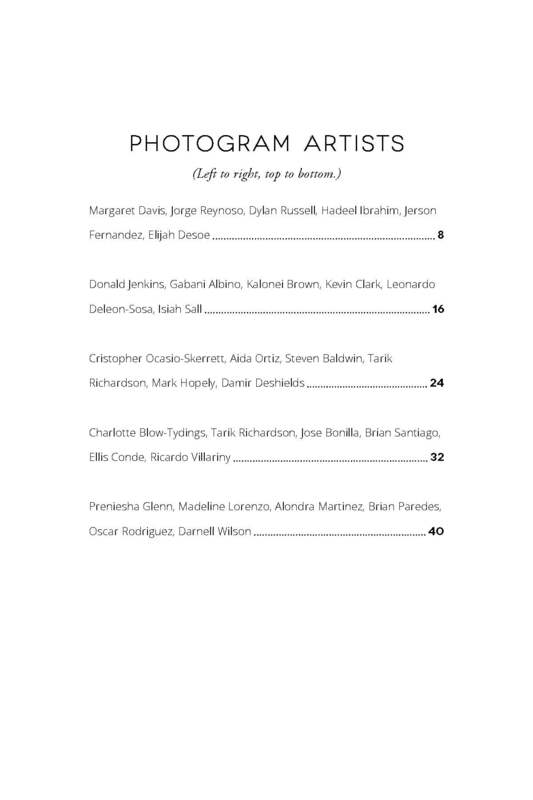 2: New Photography Publications through lessons in photography with an emphasis on architecture and built environments. 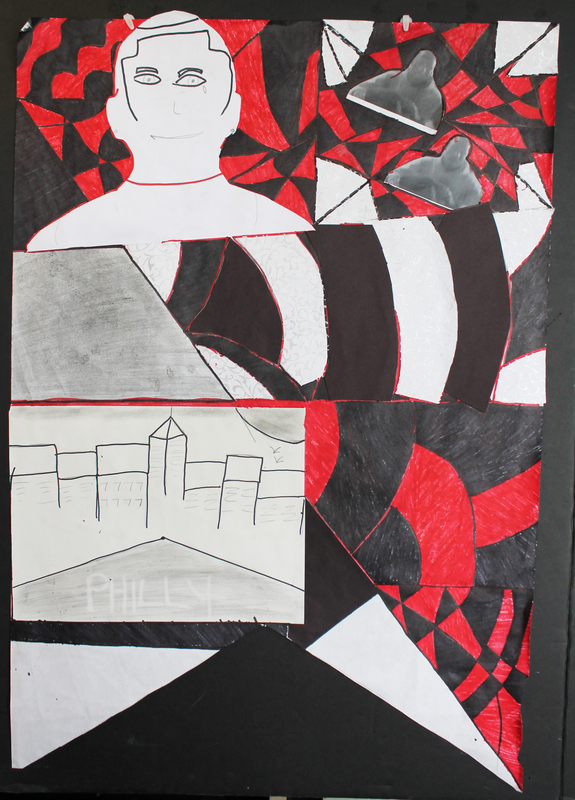 Students developed new ways of seeing their surroundings through the photographic lens and built their draughtsmanship skills, technical abilities and knowledge of contemporary art. 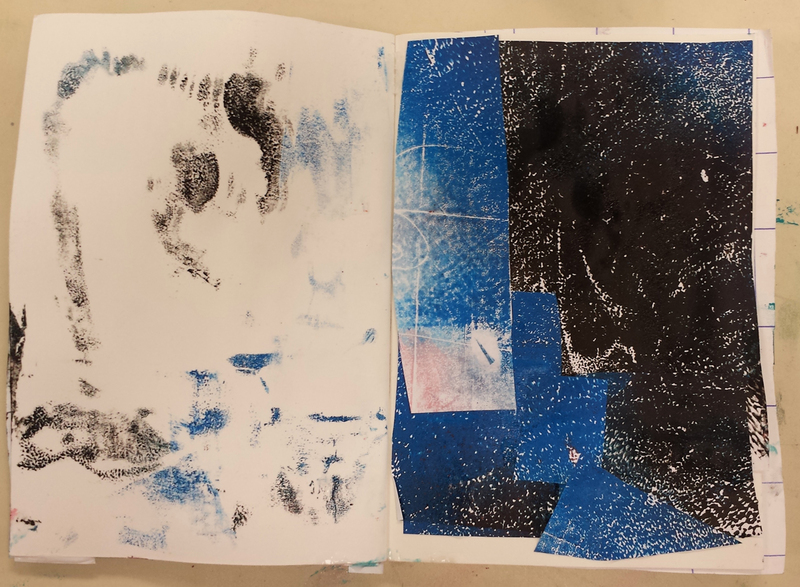 They experimented with monoprinting and collage. 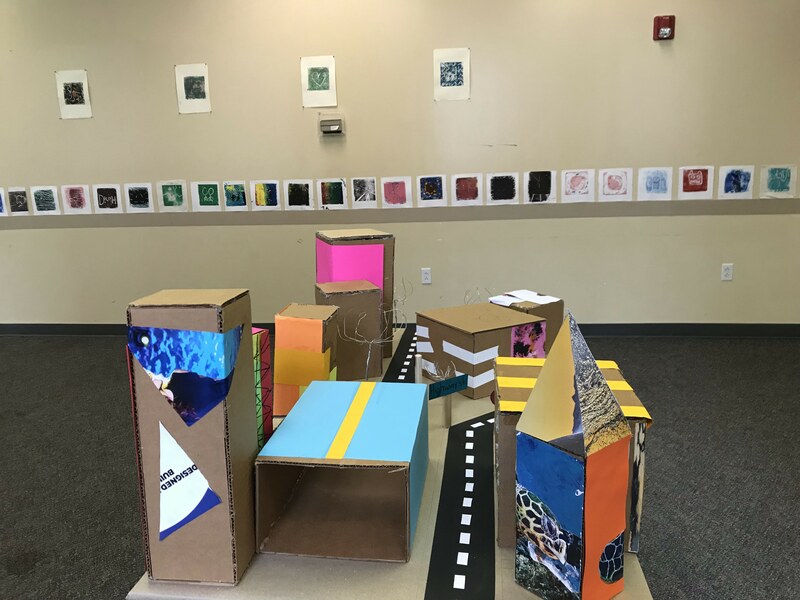 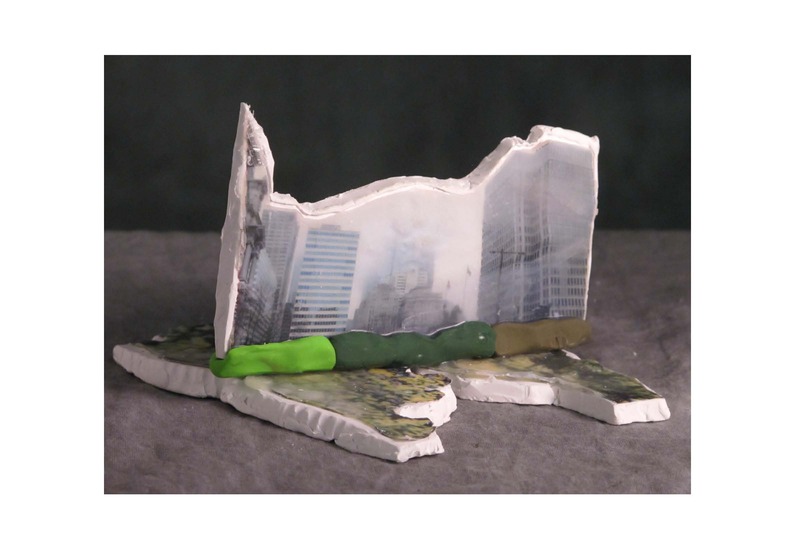 To complement CHAD’s junior architecture curriculum, students collaborated to create model urban spaces by combining their individual monoprints and photographs into collages that were applied to three-dimensional modular structures. 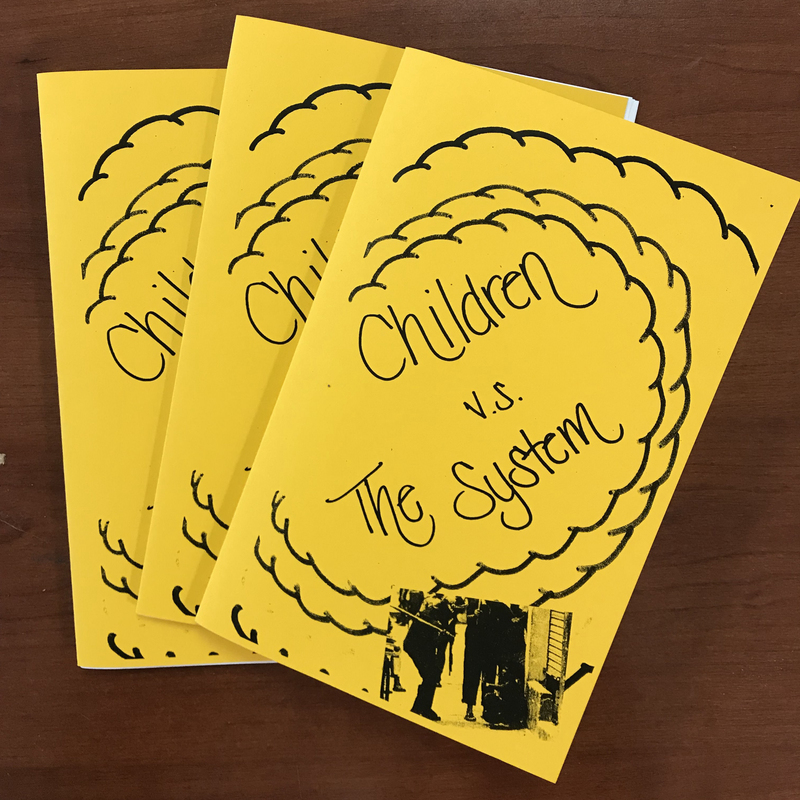 In response to By the Book Vol. 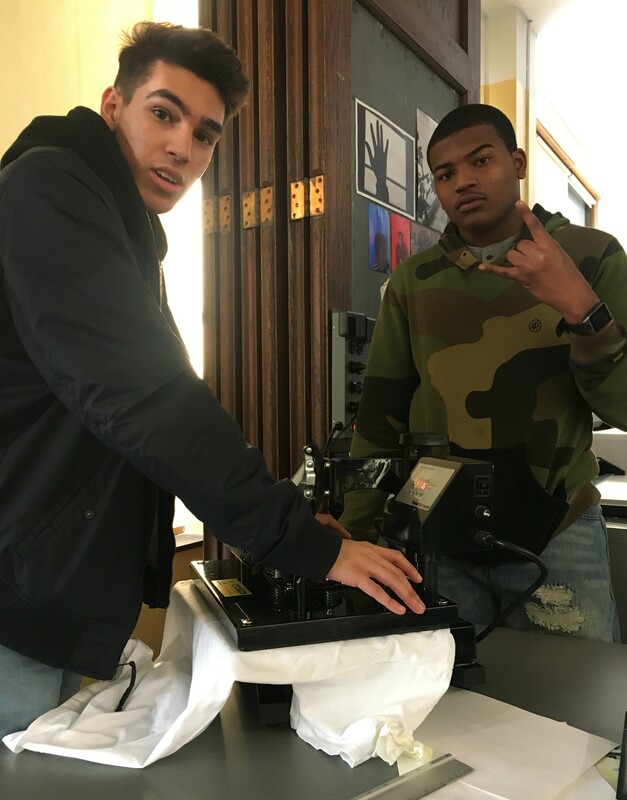 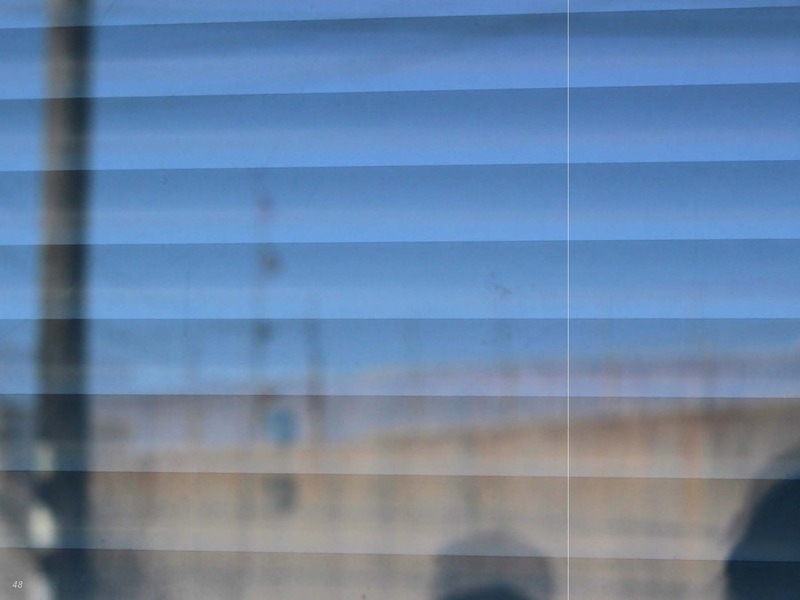 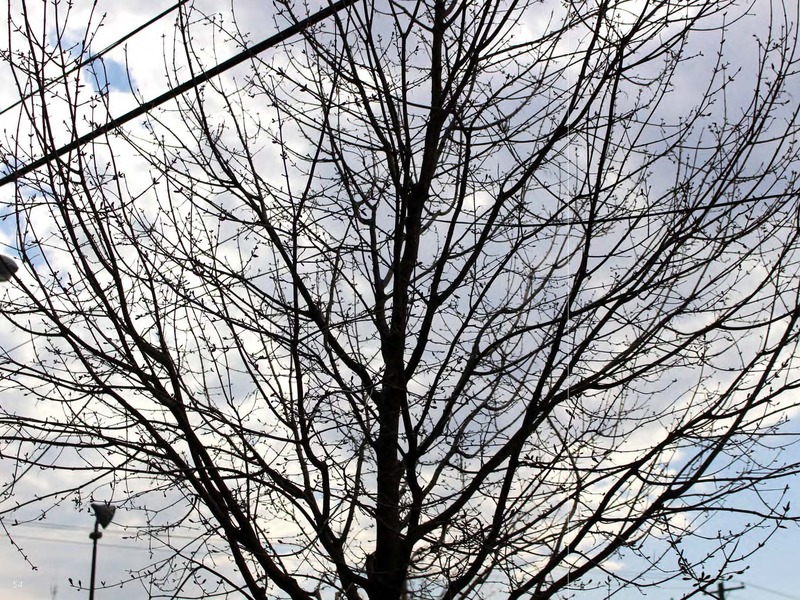 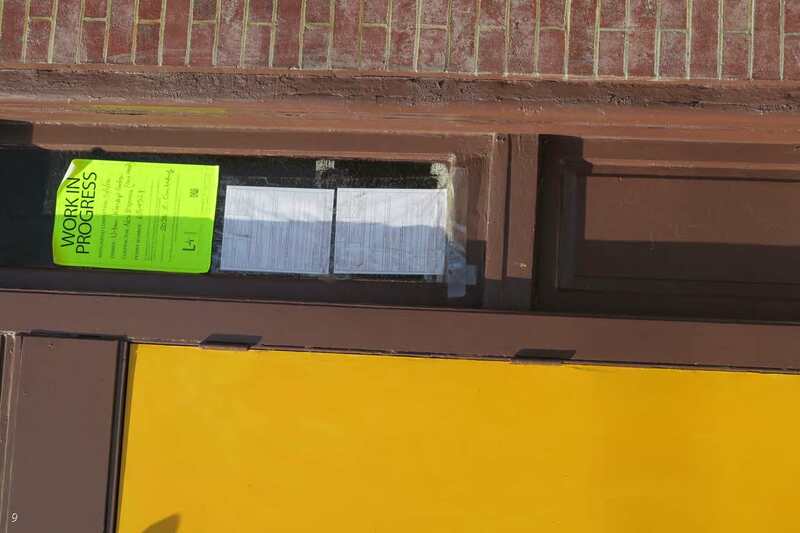 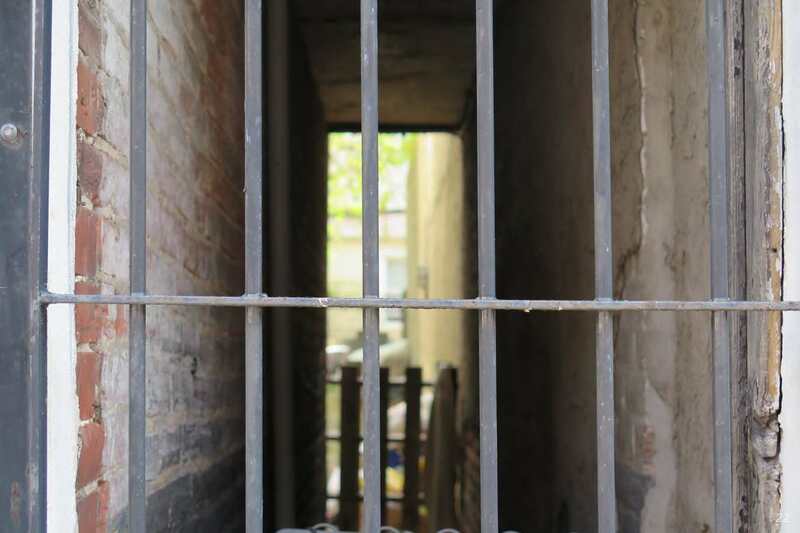 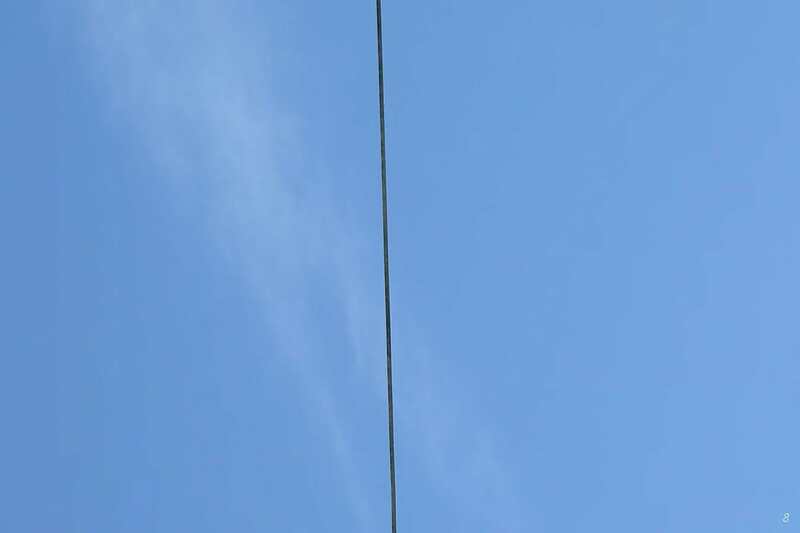 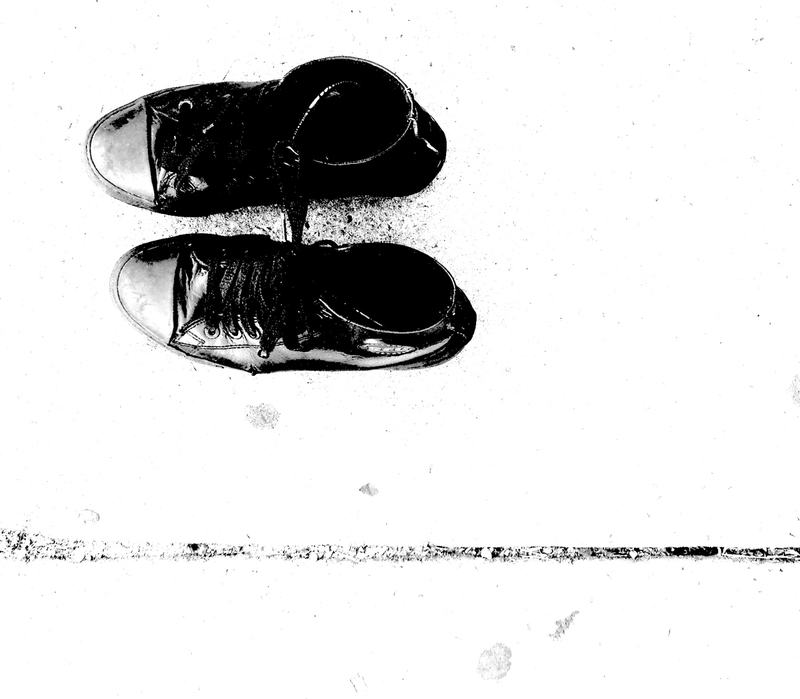 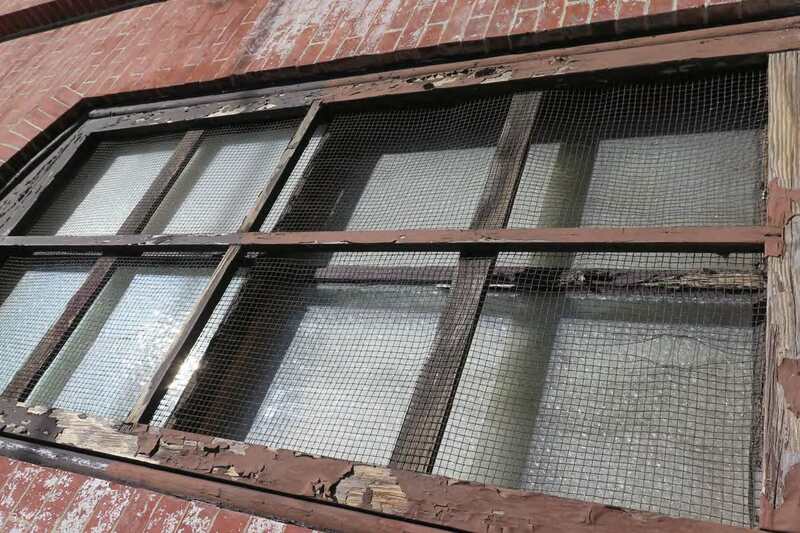 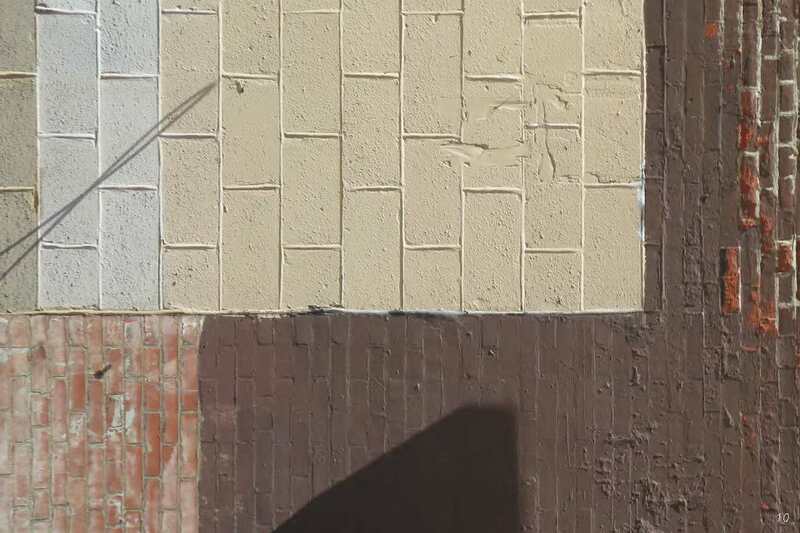 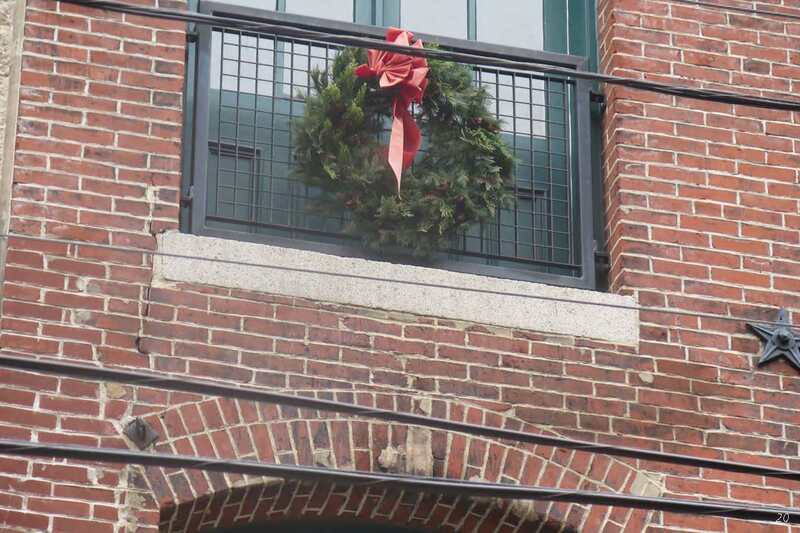 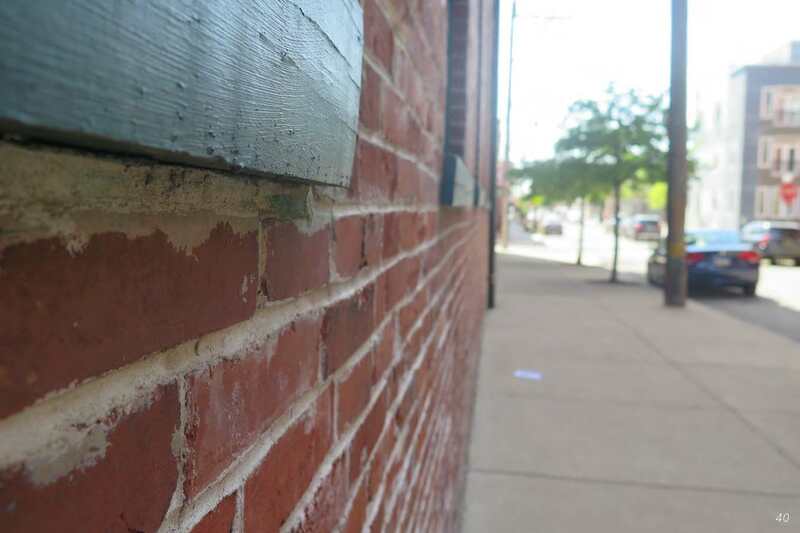 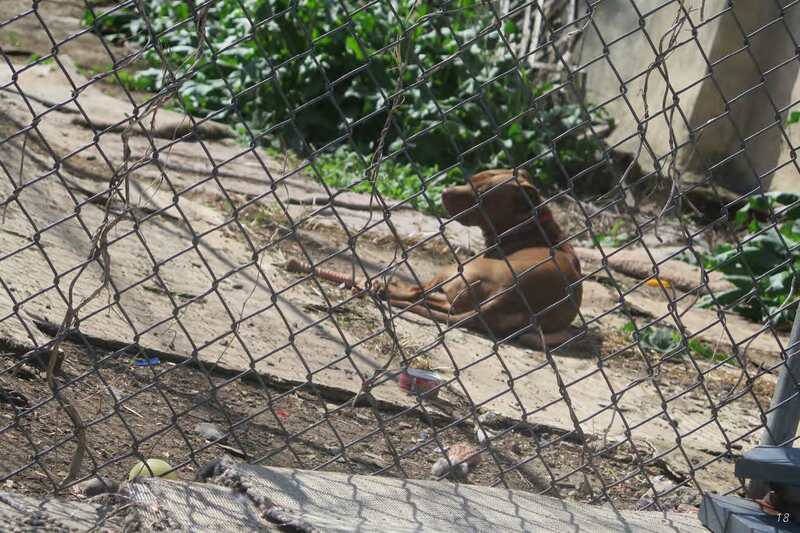 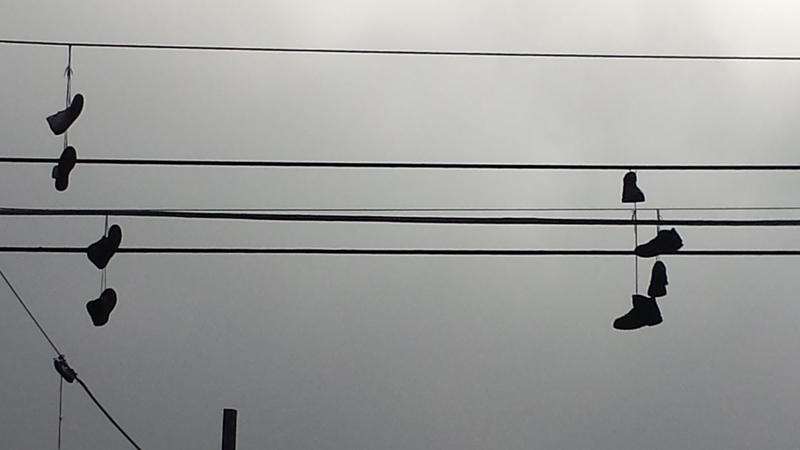 2: New Photography, students at the Charter High School for Architecture + Design focused intently on honing their photography skills during photo walks around their neighborhood. 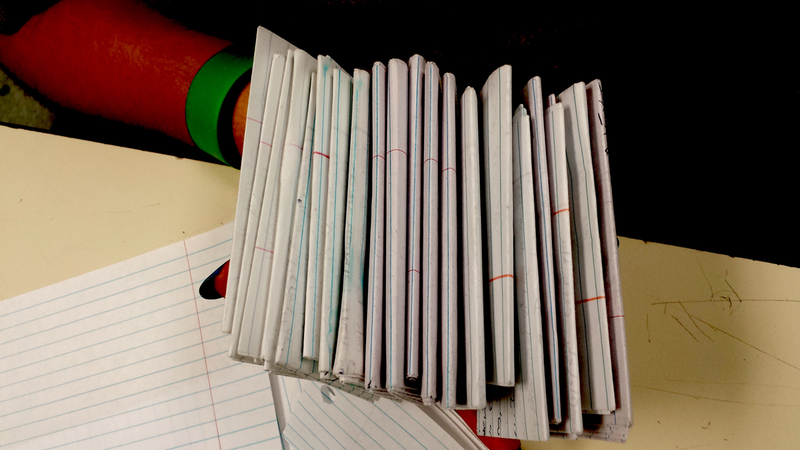 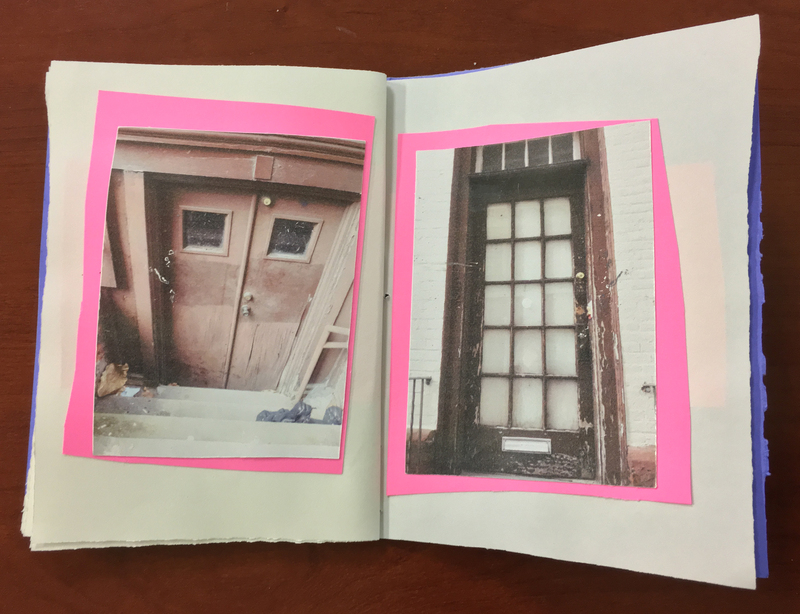 Each student took photographs of a specific subject, such as texture, light or reflection, and then made a hand-bound book to display their images. 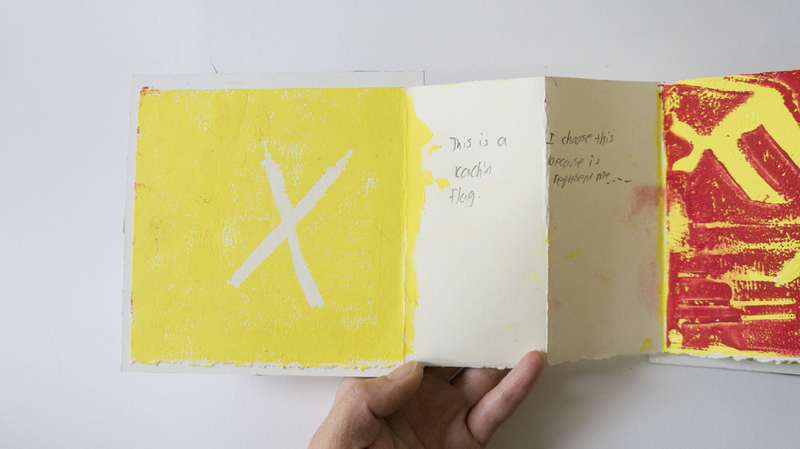 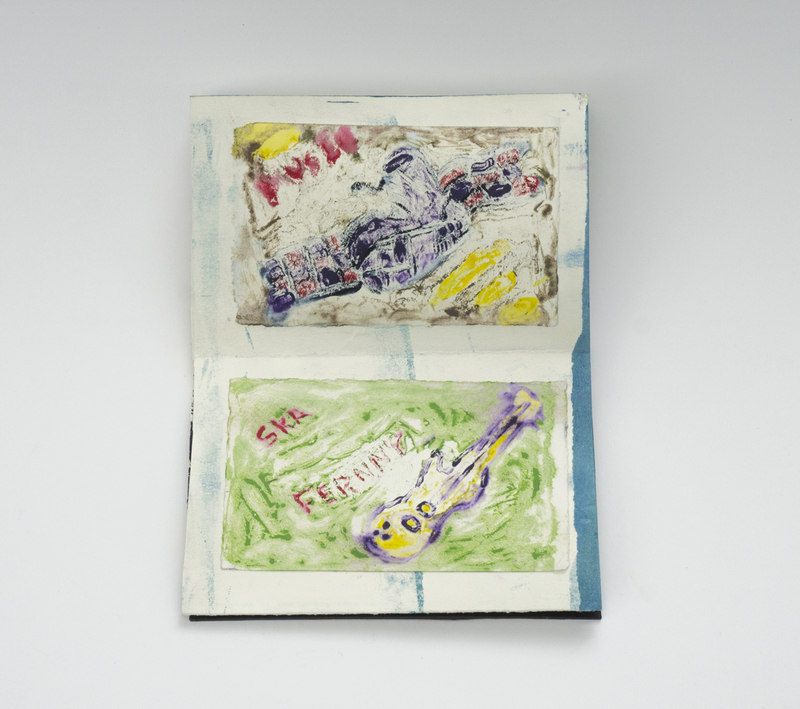 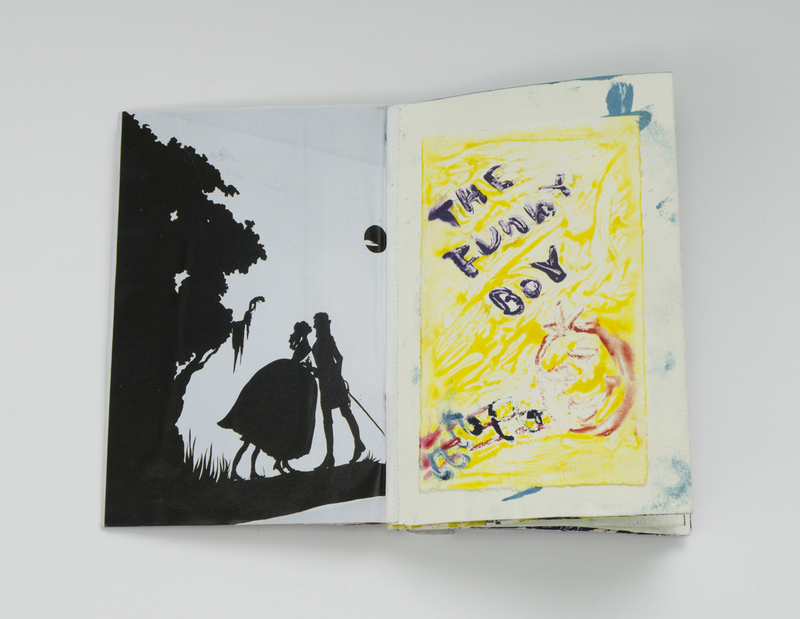 Students also crafted zines that combined text and imagery to convey an idea to viewers. 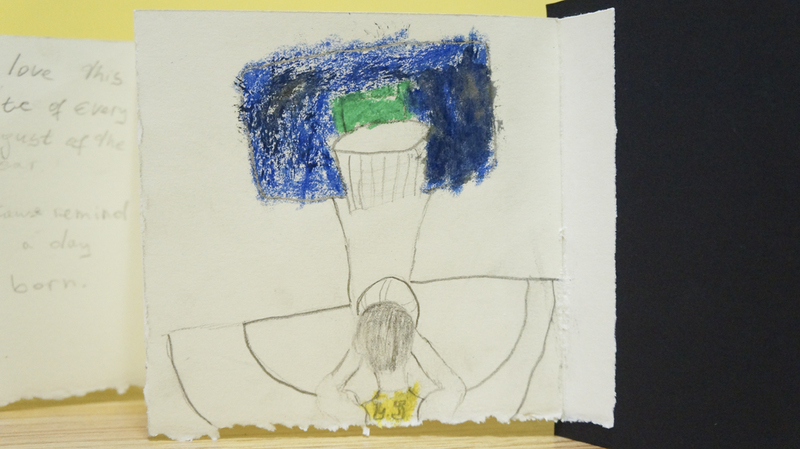 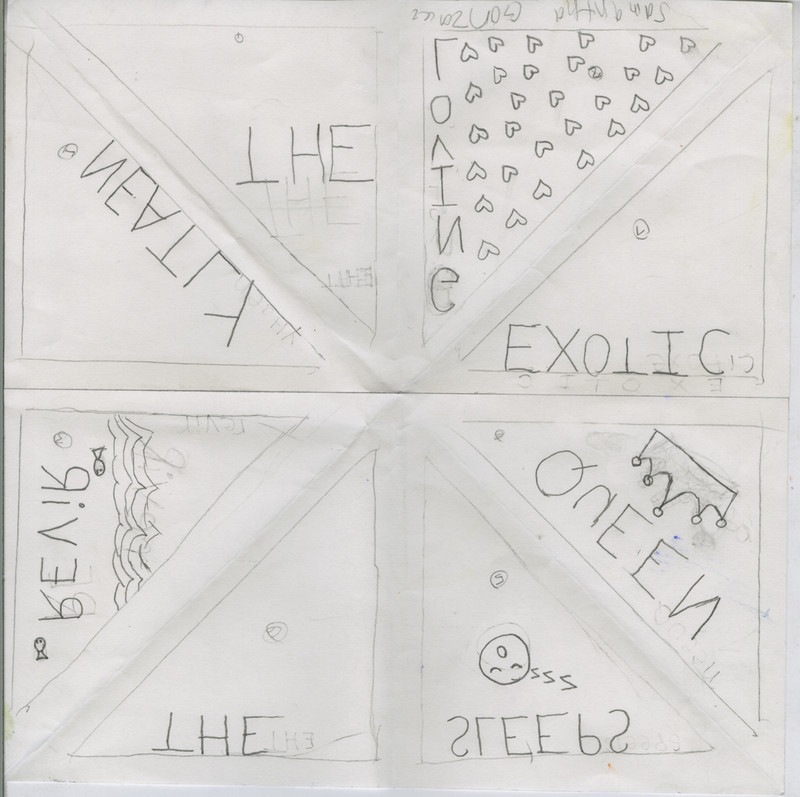 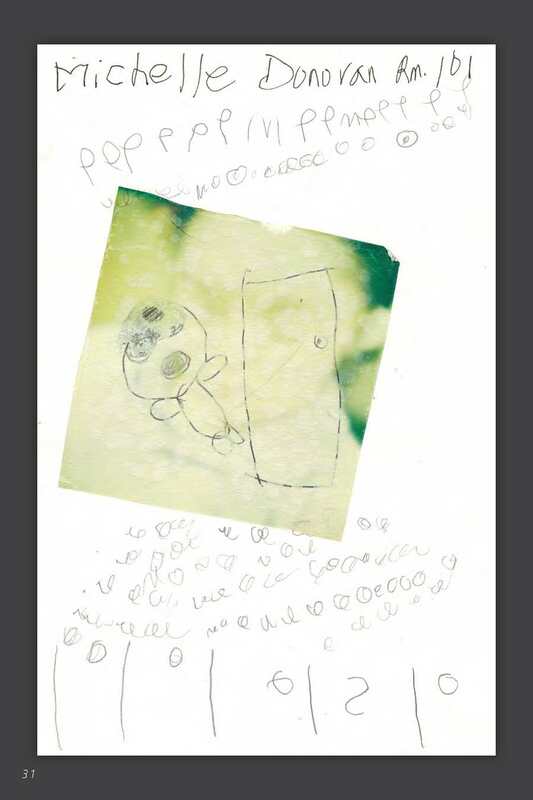 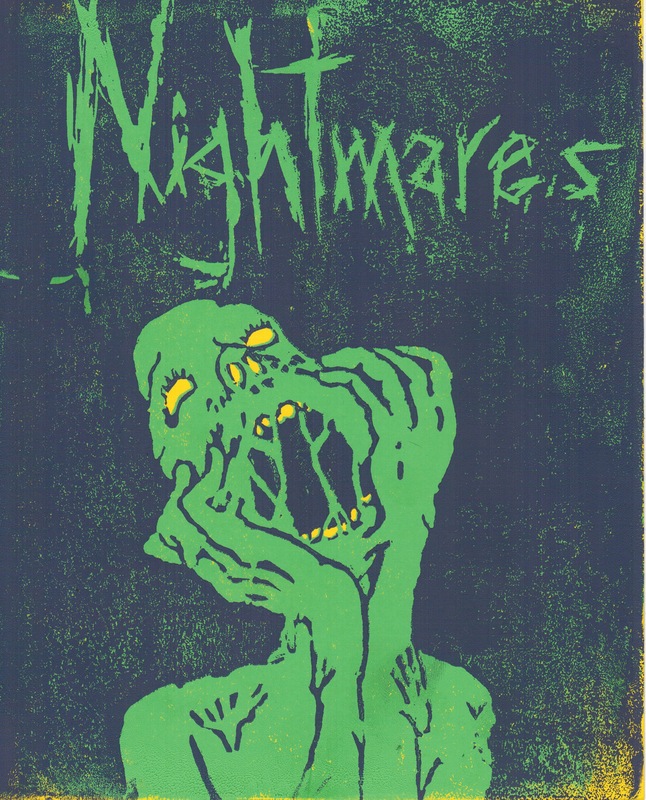 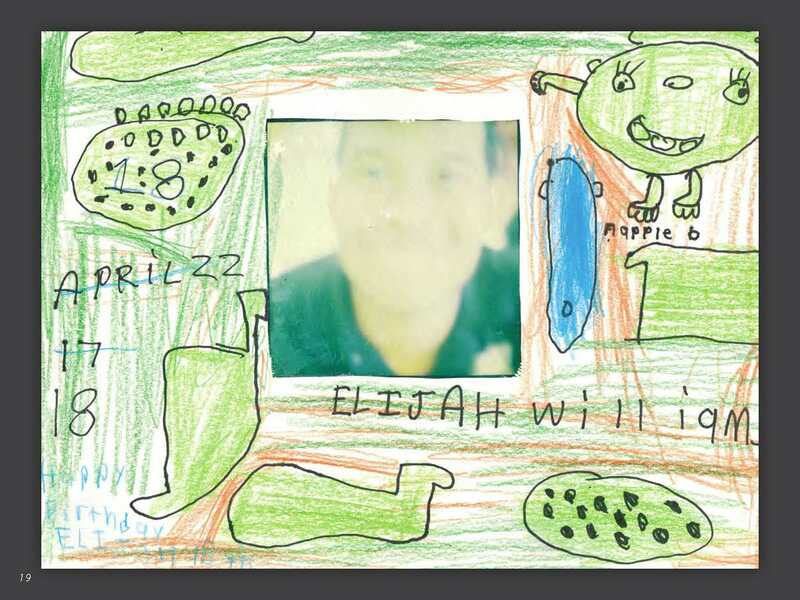 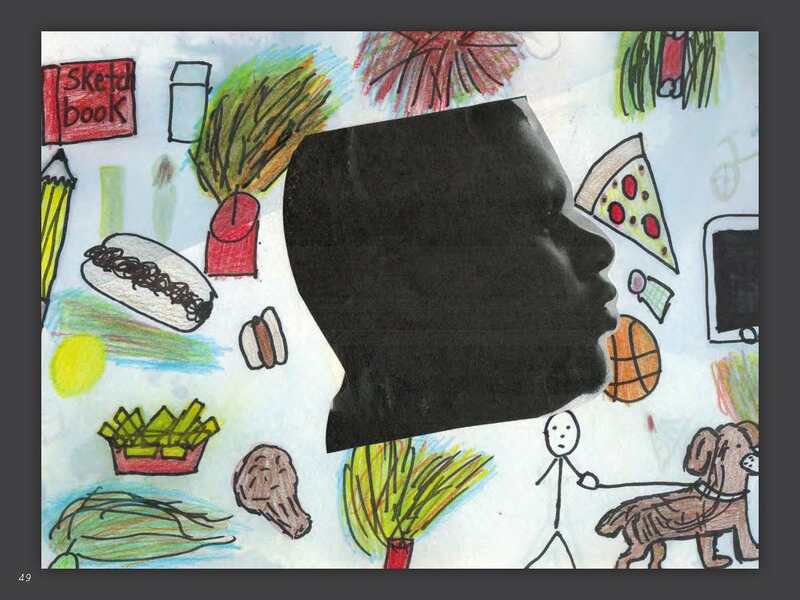 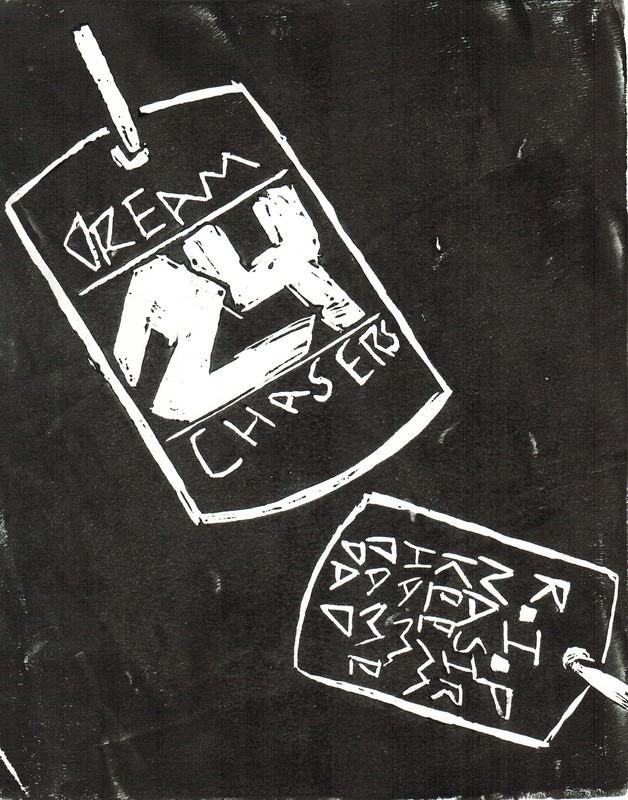 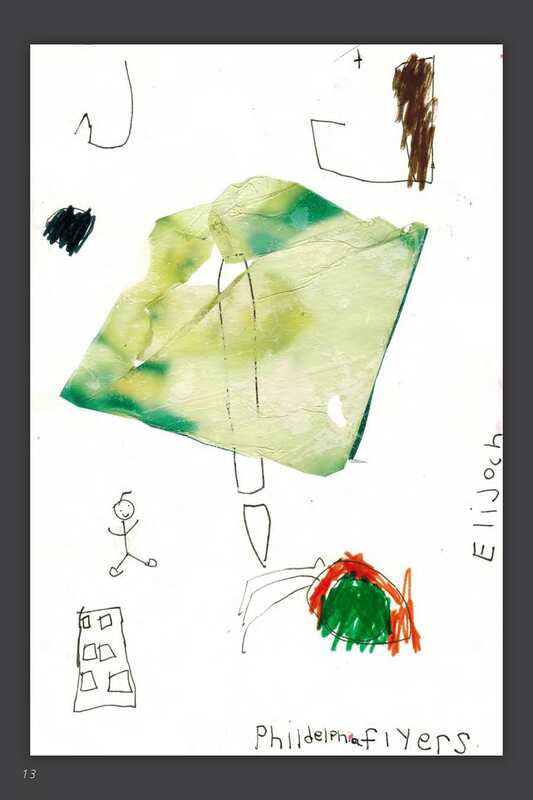 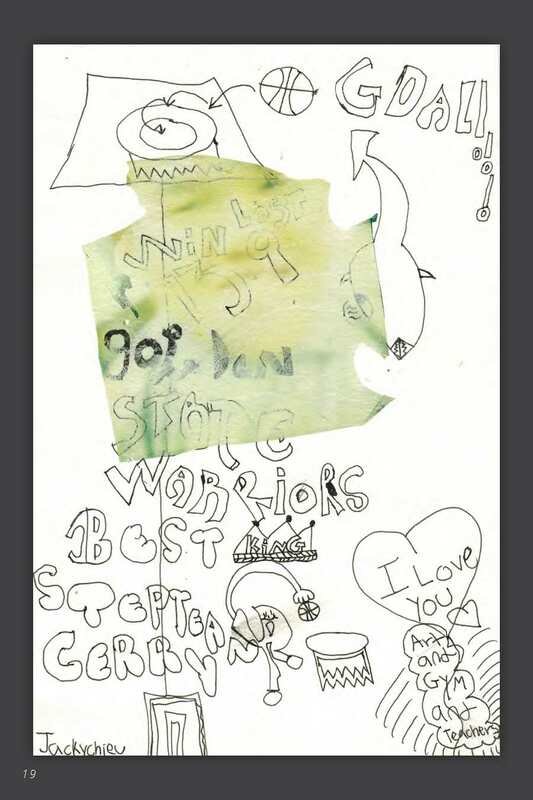 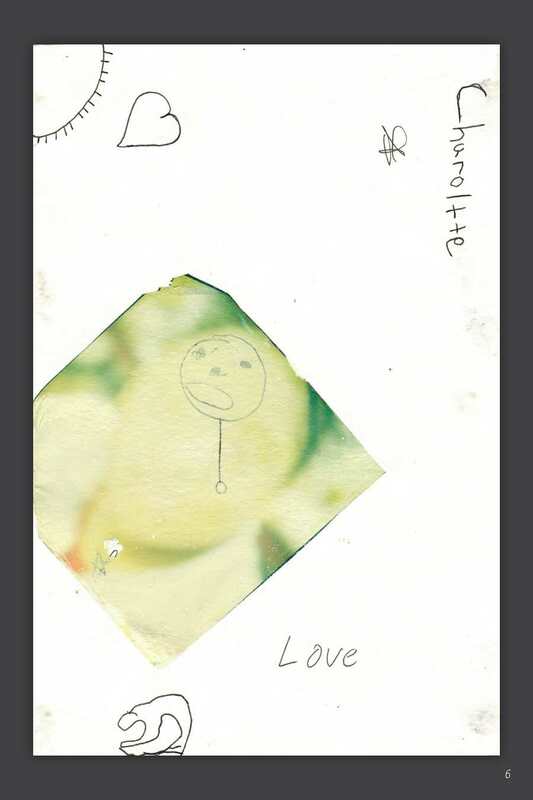 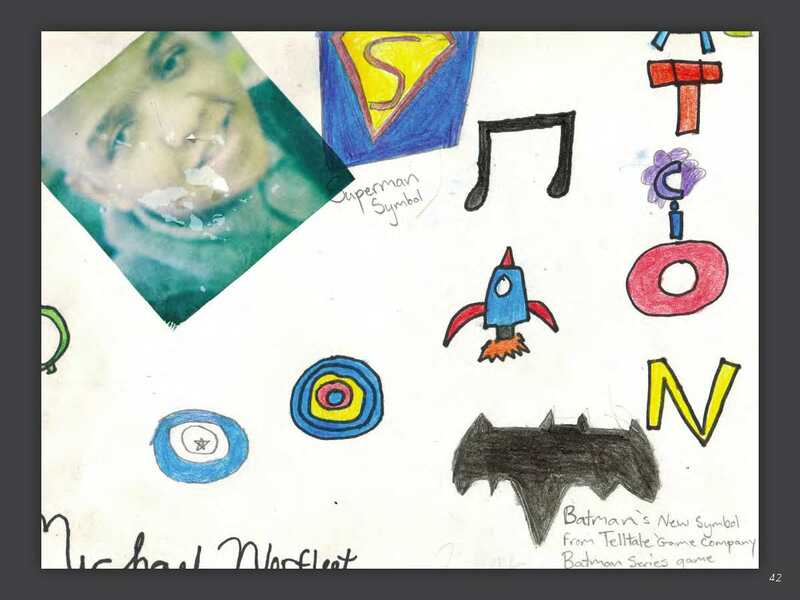 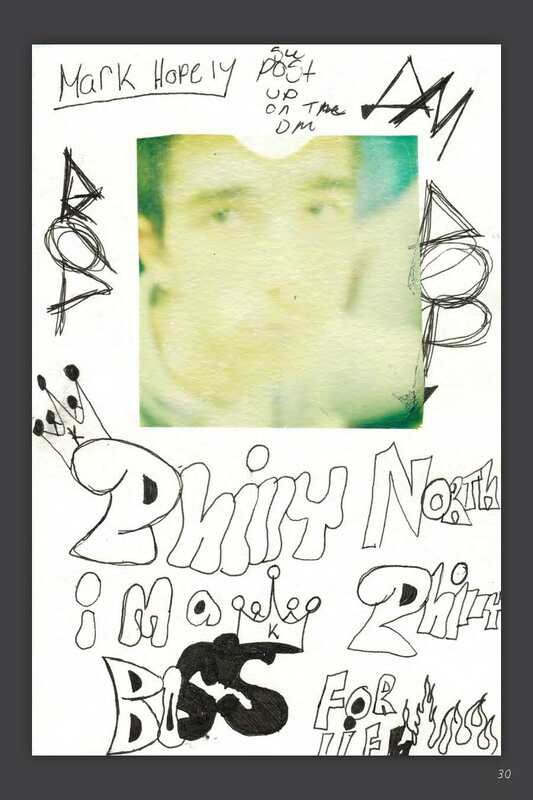 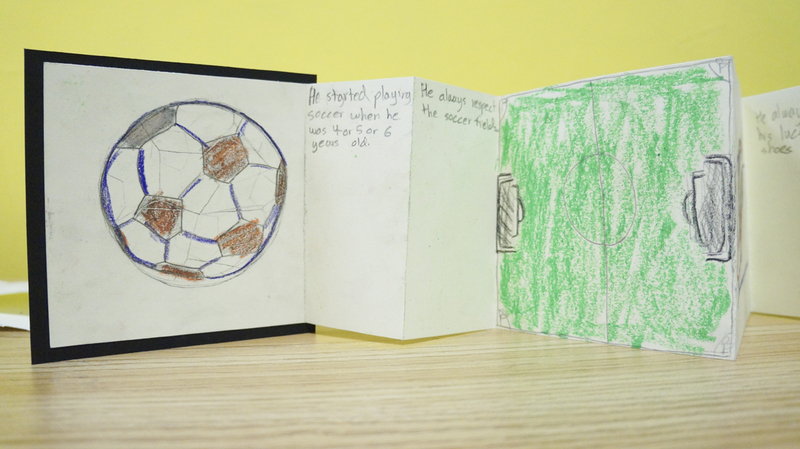 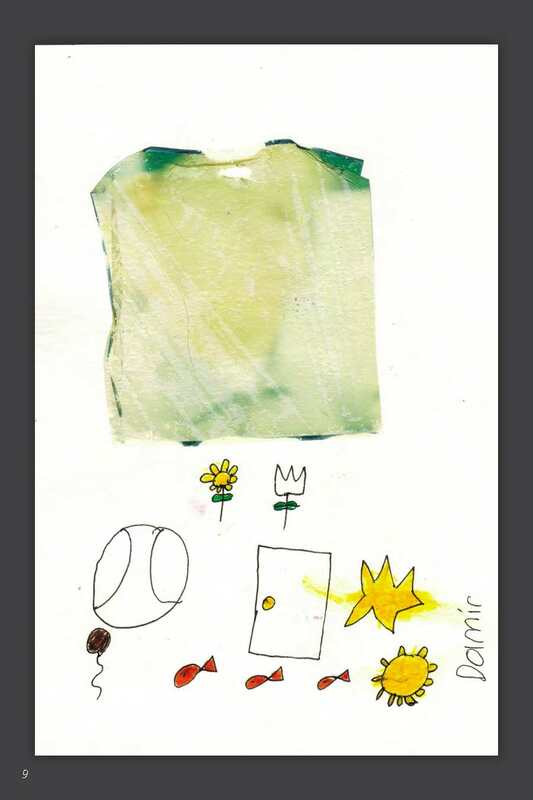 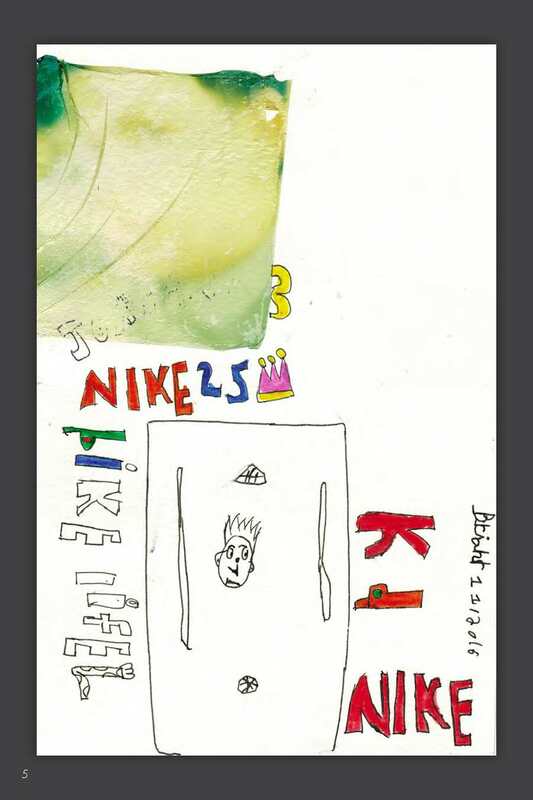 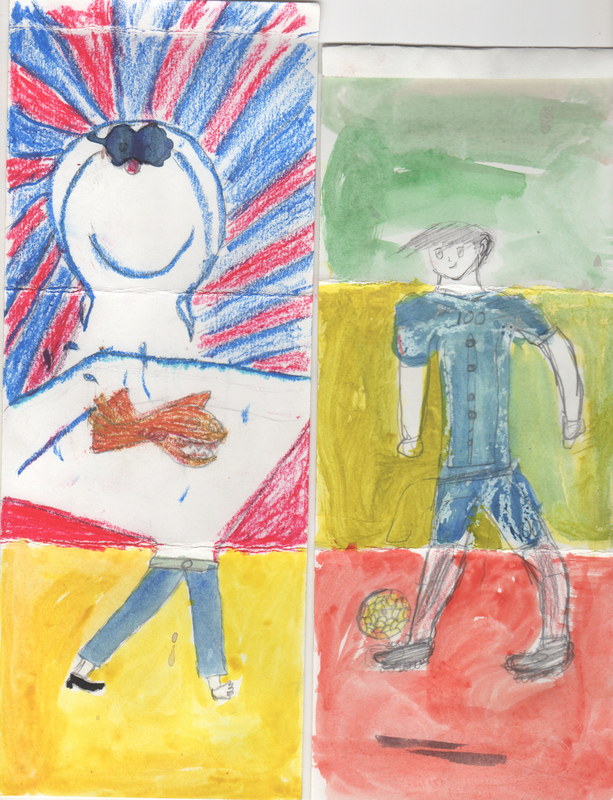 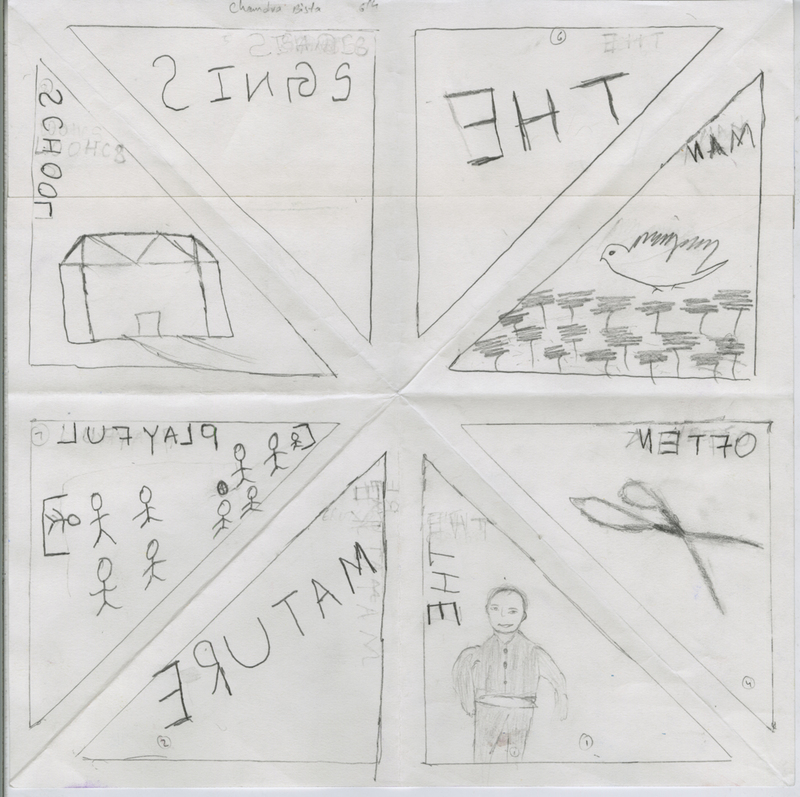 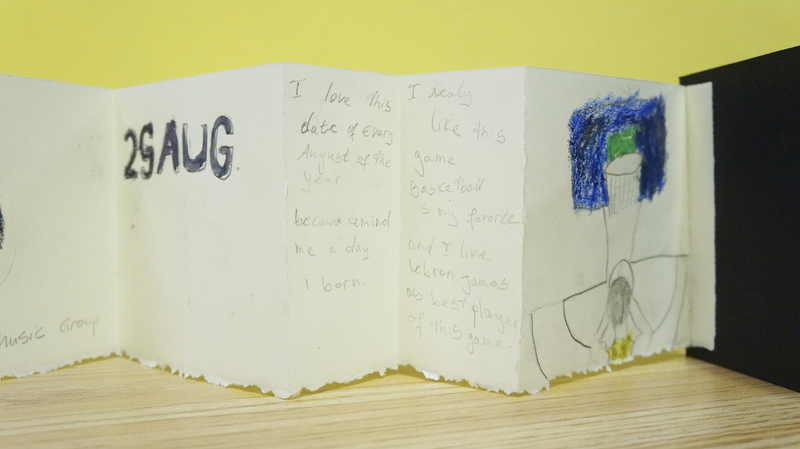 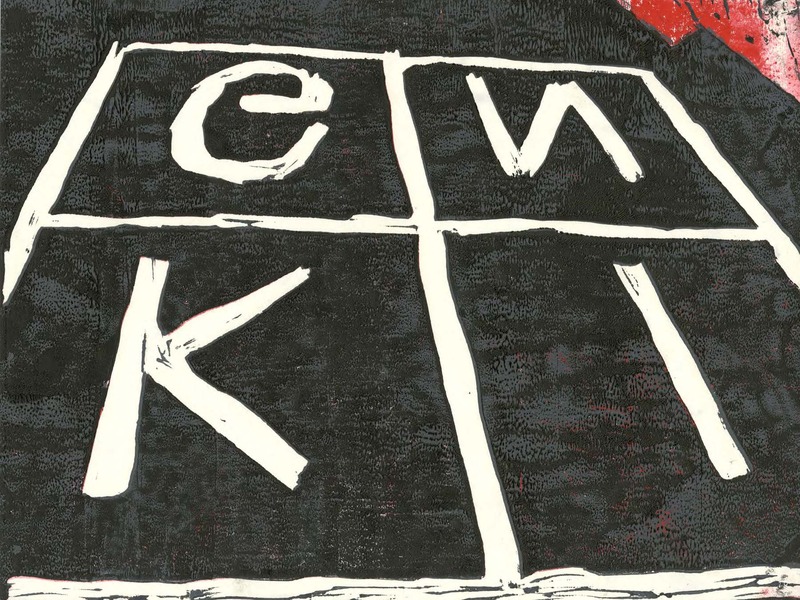 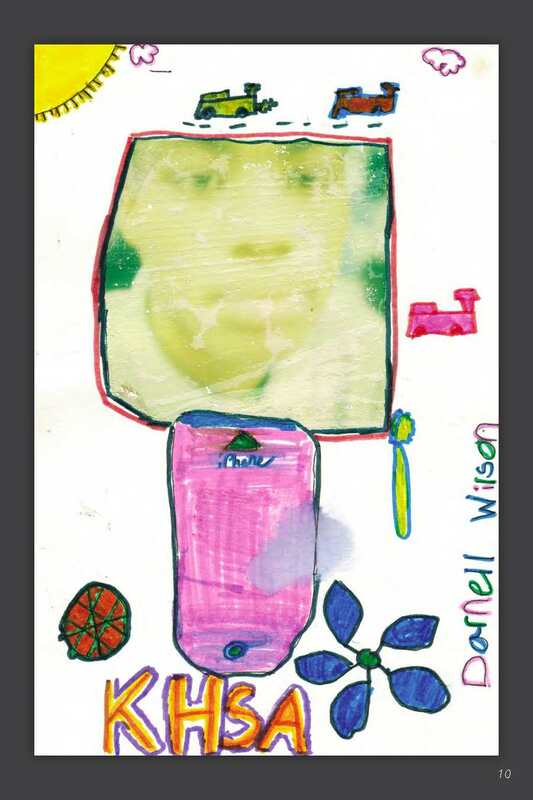 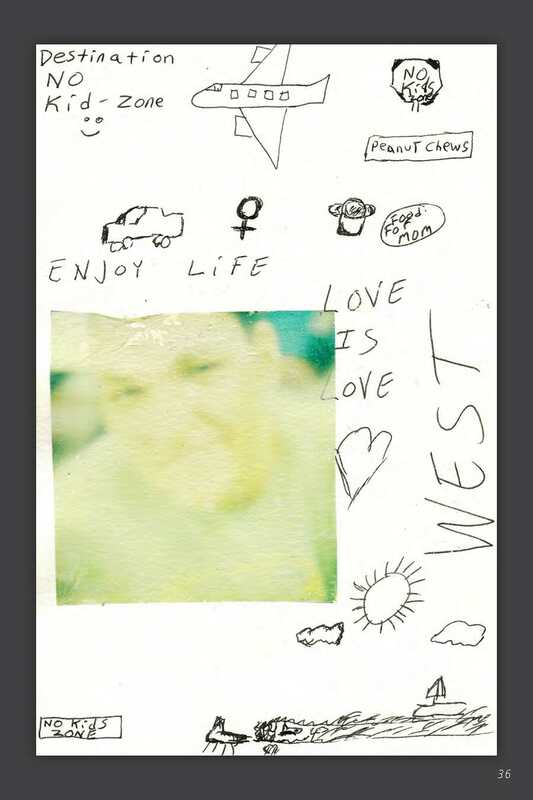 Many students focused their zine on political or social messages, and some students incorporated humor or an emphasis on their personal interests, such as sports. 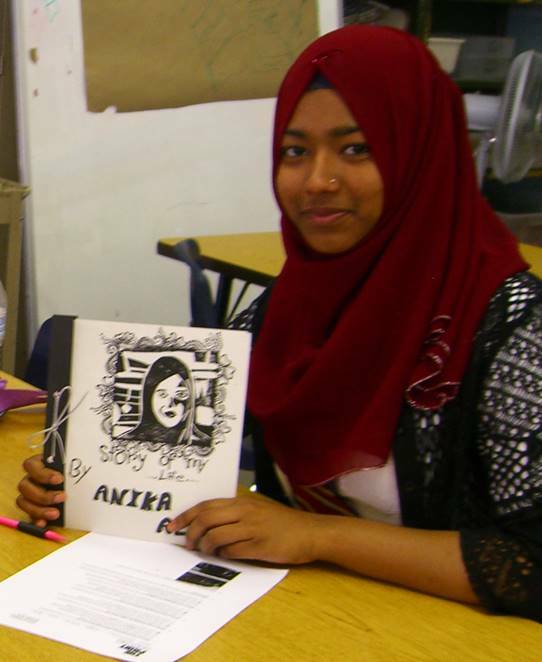 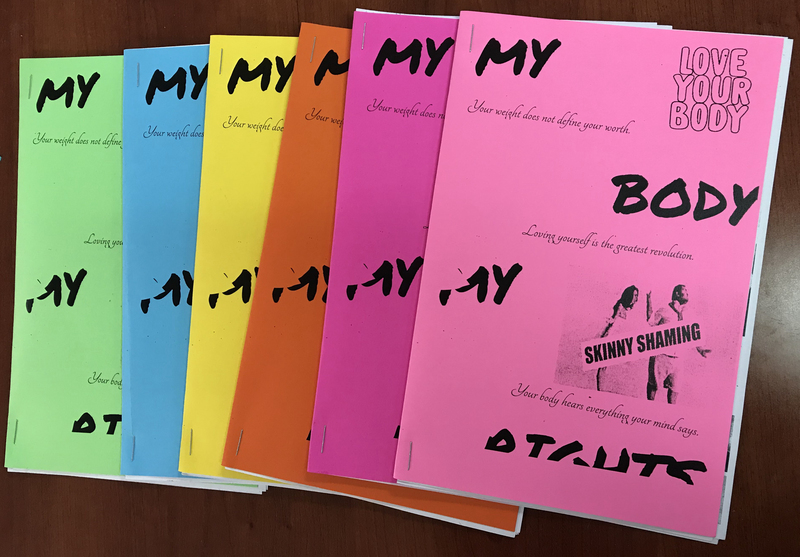 Students created multiple copies of their zines to distribute amongst their peers. 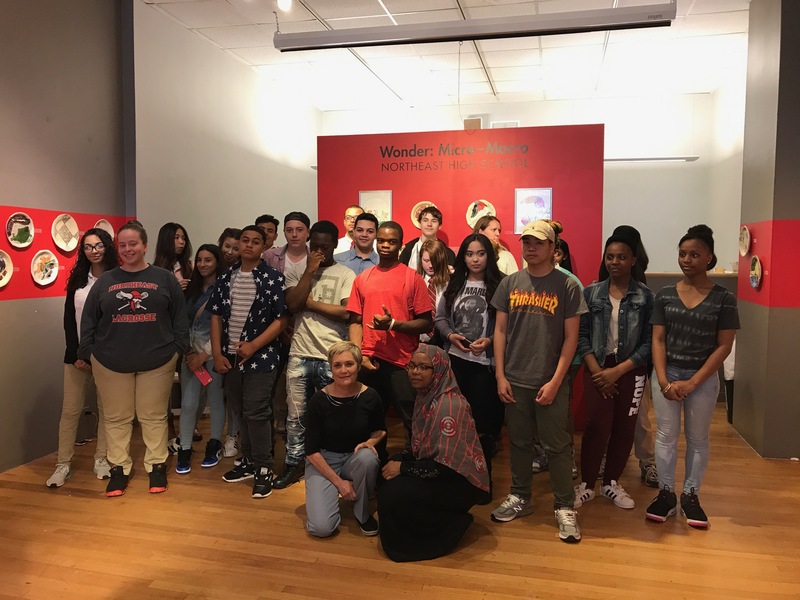 Students at Northeast High School explored their unique identities, cultures and languages through discussion, artmaking and writing. 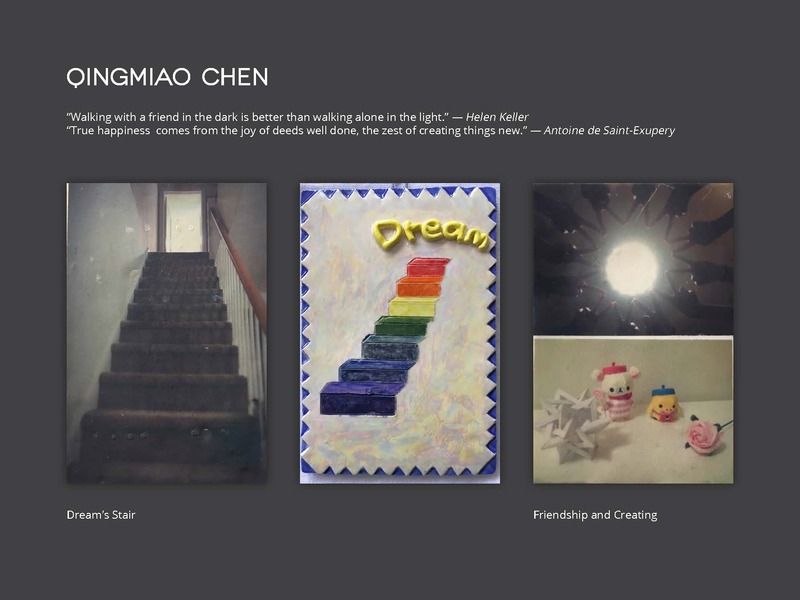 Inspired by the photobook as a medium for self-expression, they read a poem from Sandra Sisneros' book, A House on Mango Street called “My Name”. 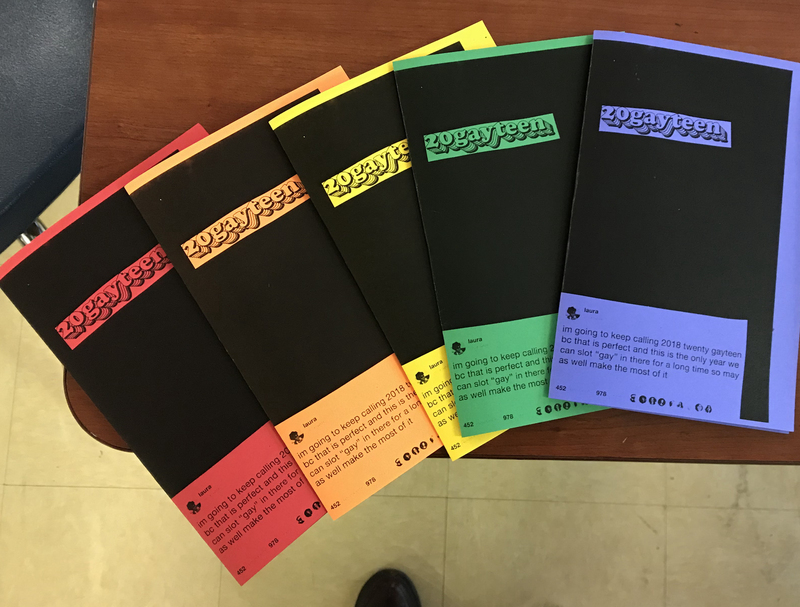 Each student created their own book, beginning with a short paragraph inspired by the poem about the meaning of their name and its cultural significance. 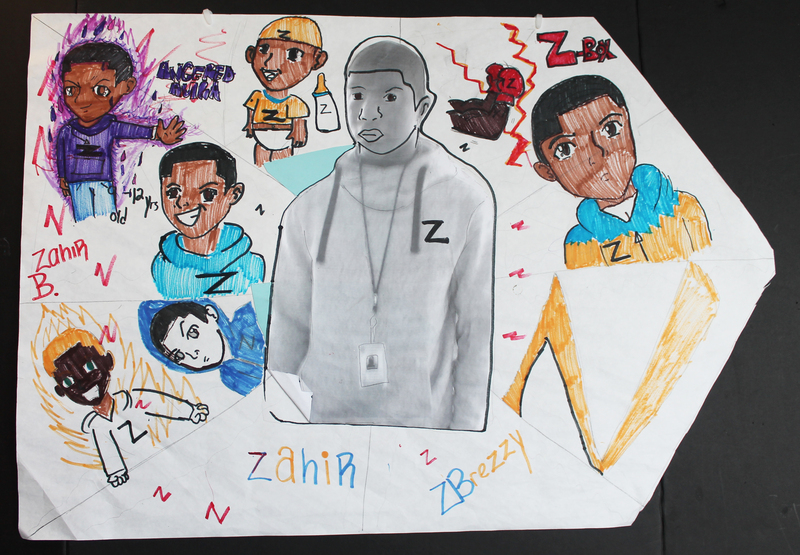 They added pen and ink illustrations showing important components of their lives. 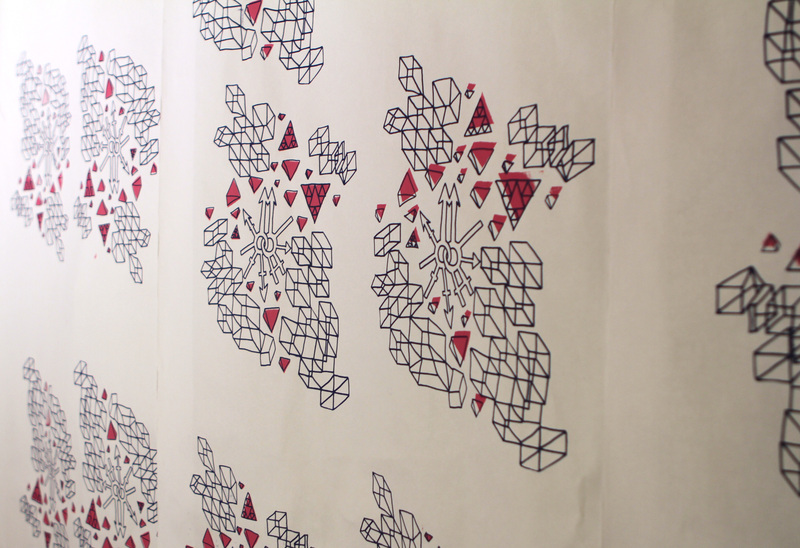 They impressed patterns on Styrofoam strips that were then printed in a square to frame these illustrations. 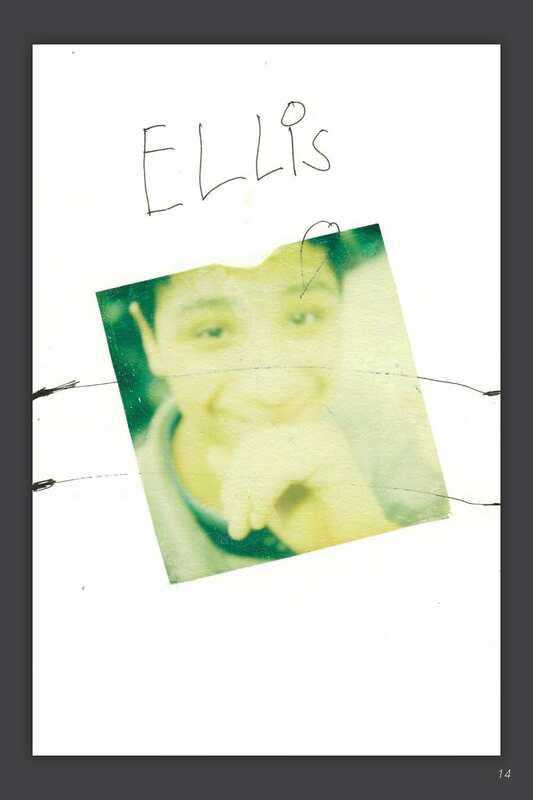 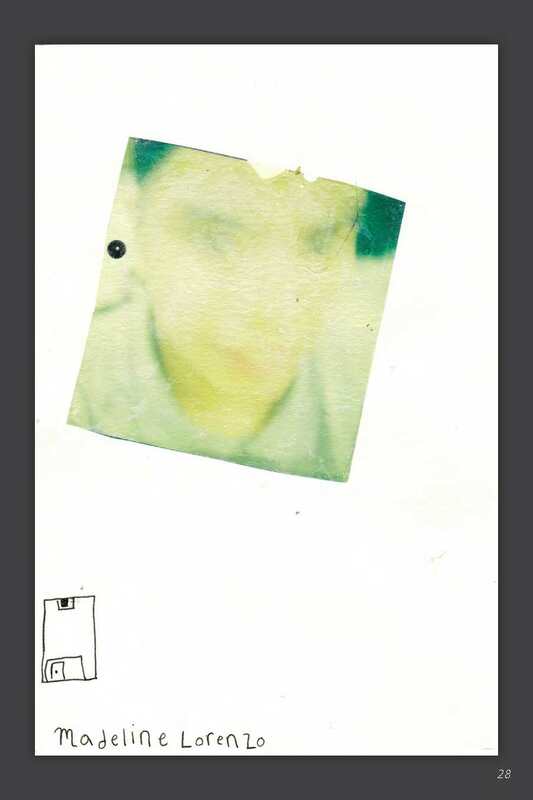 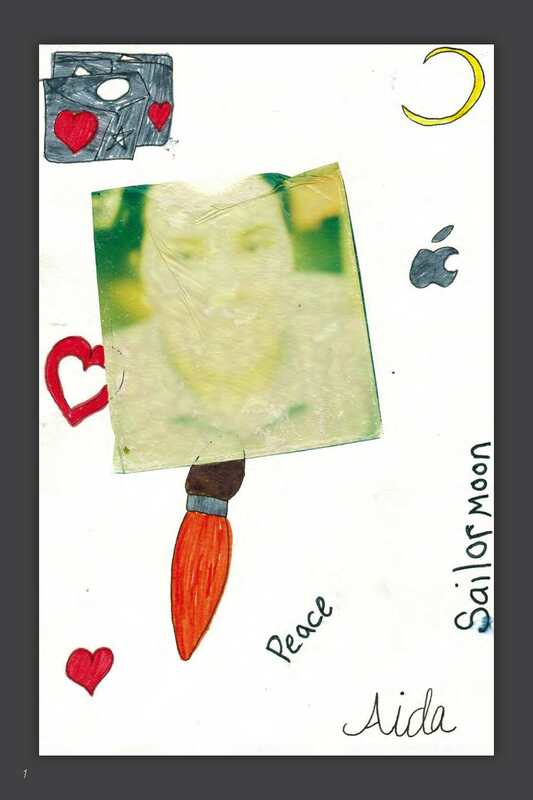 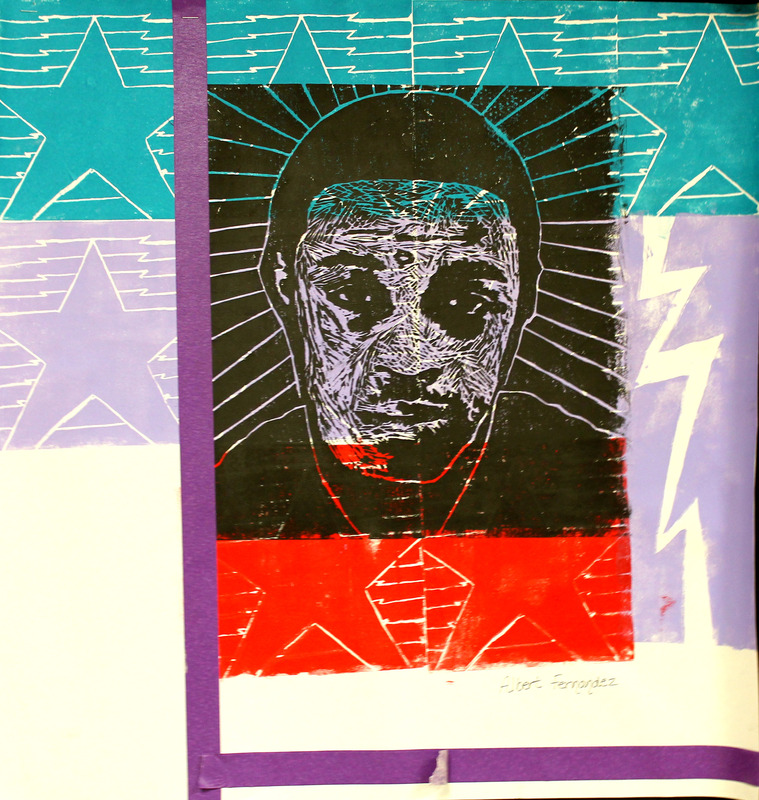 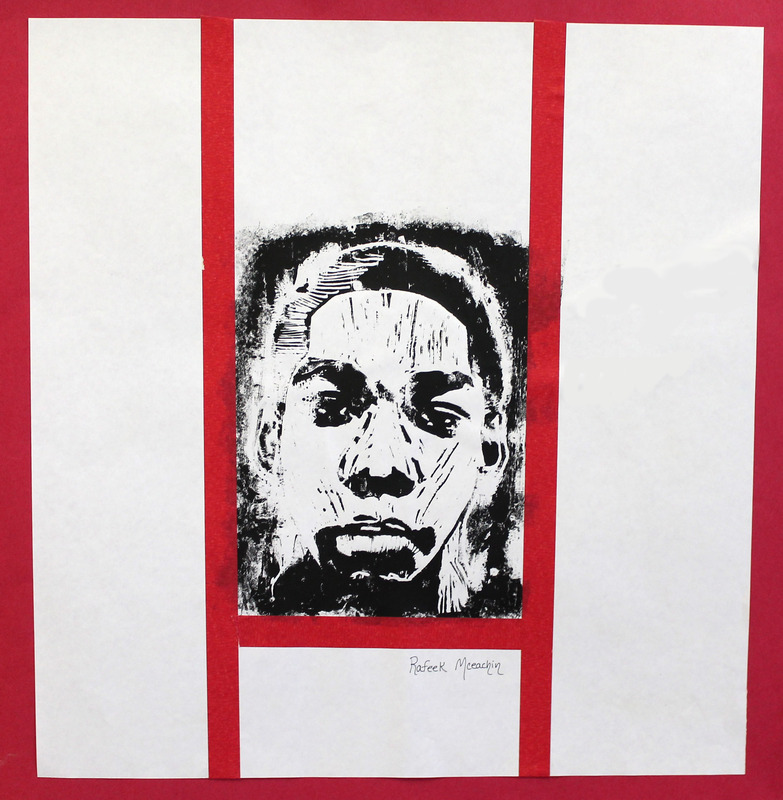 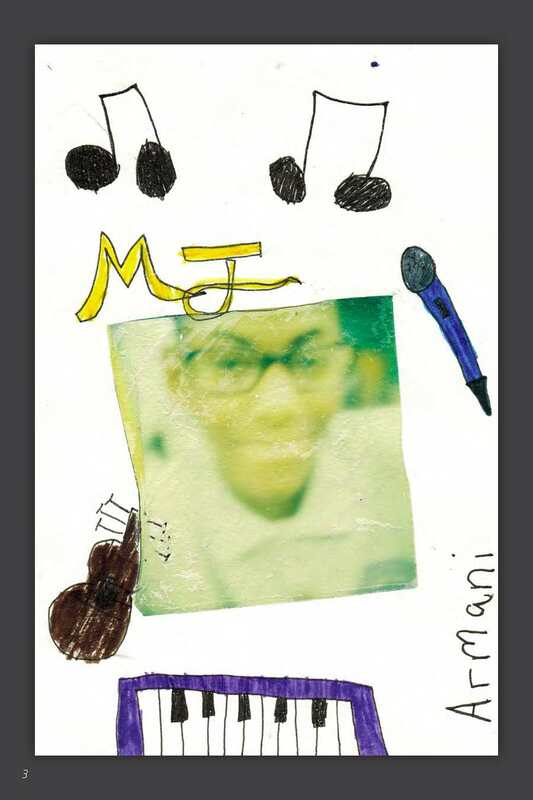 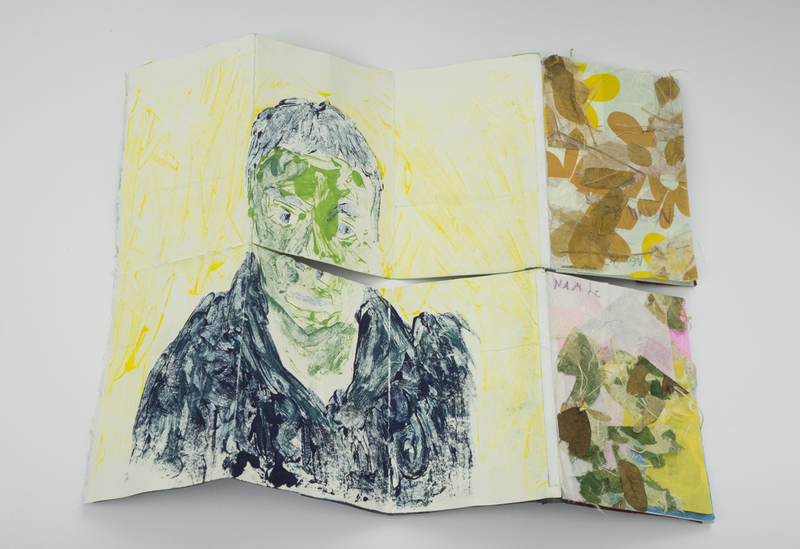 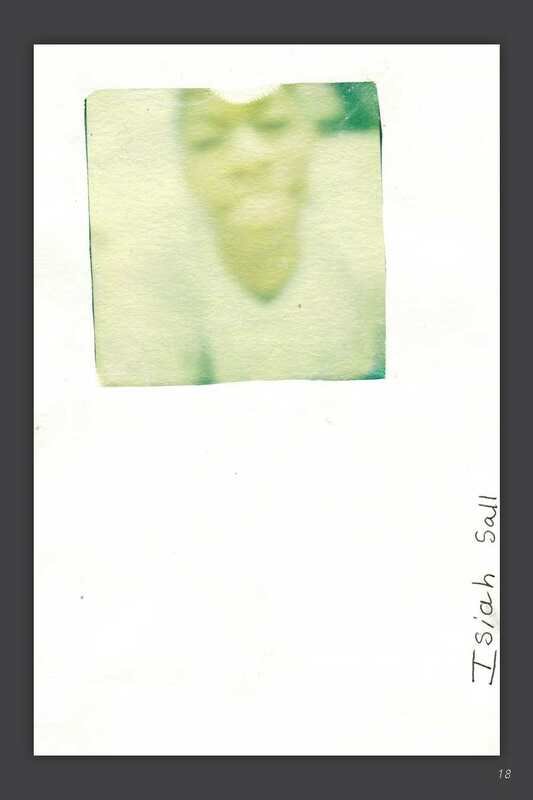 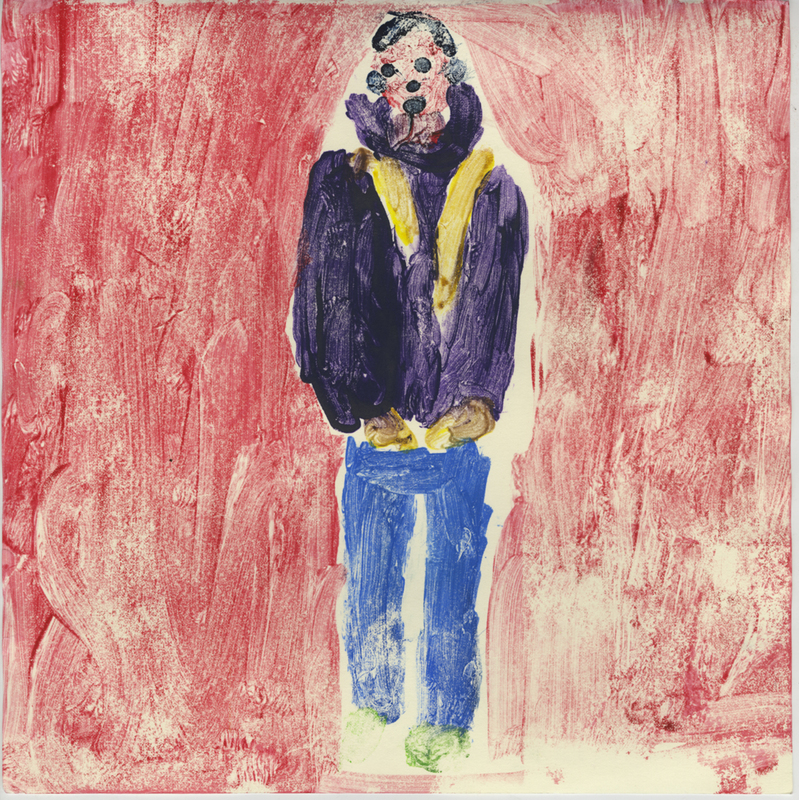 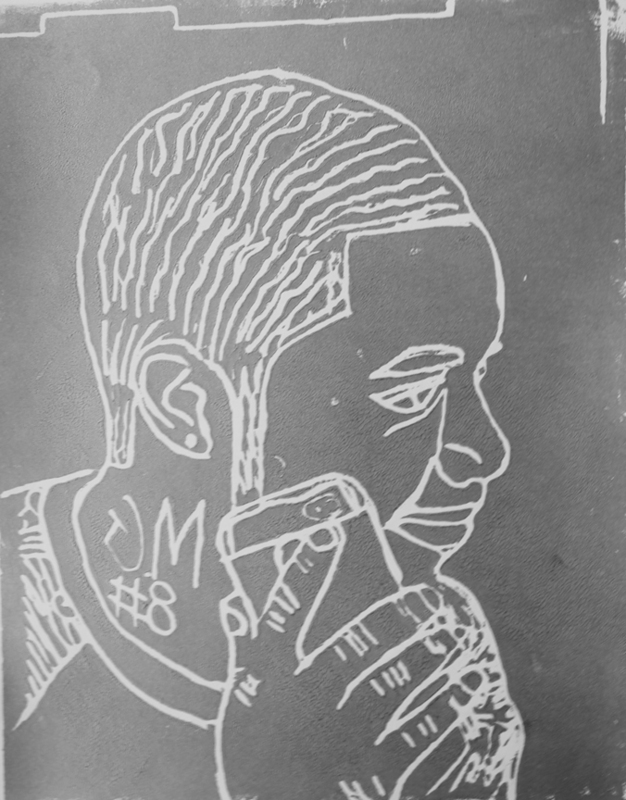 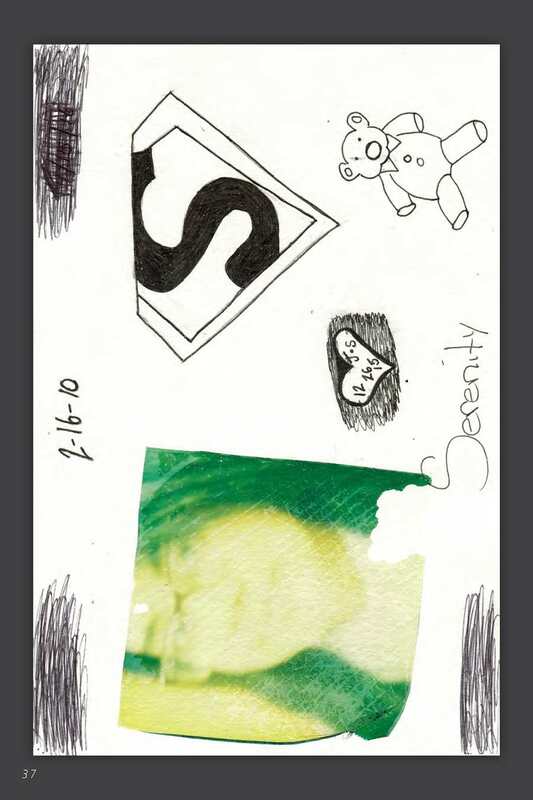 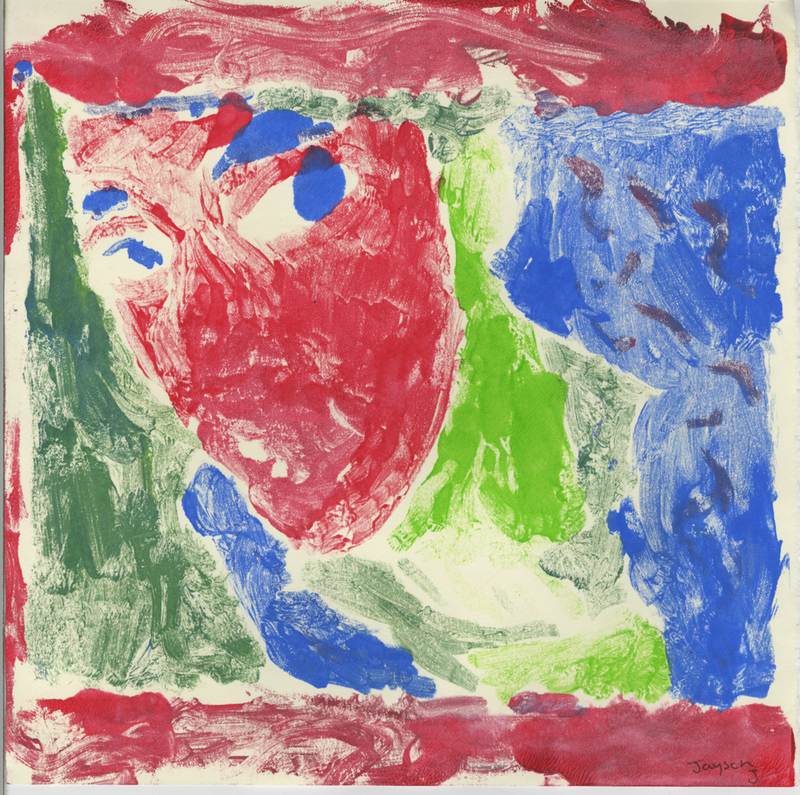 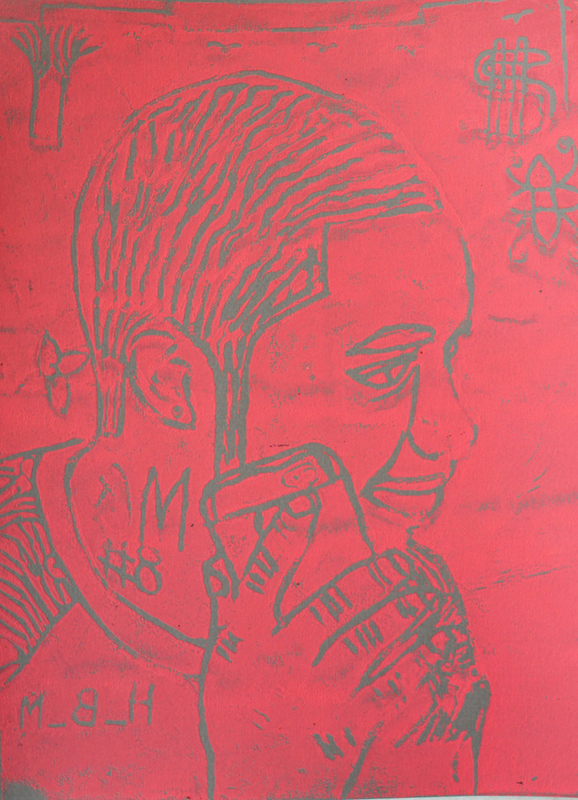 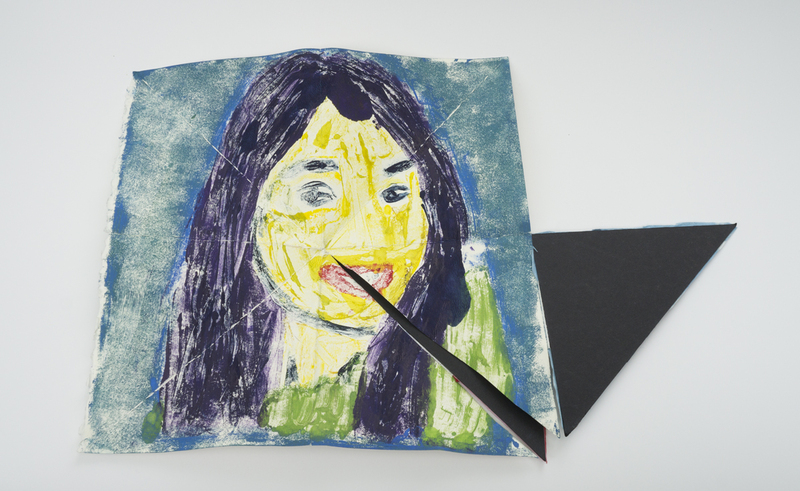 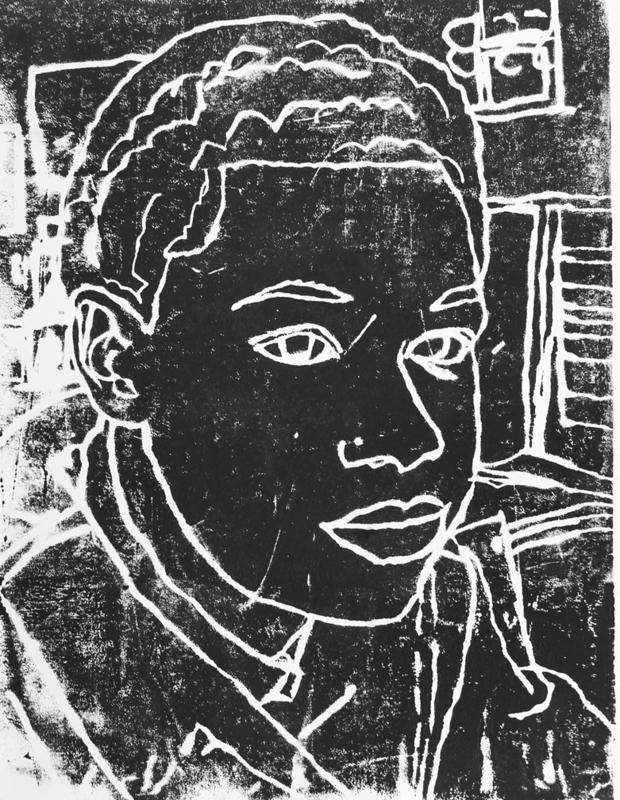 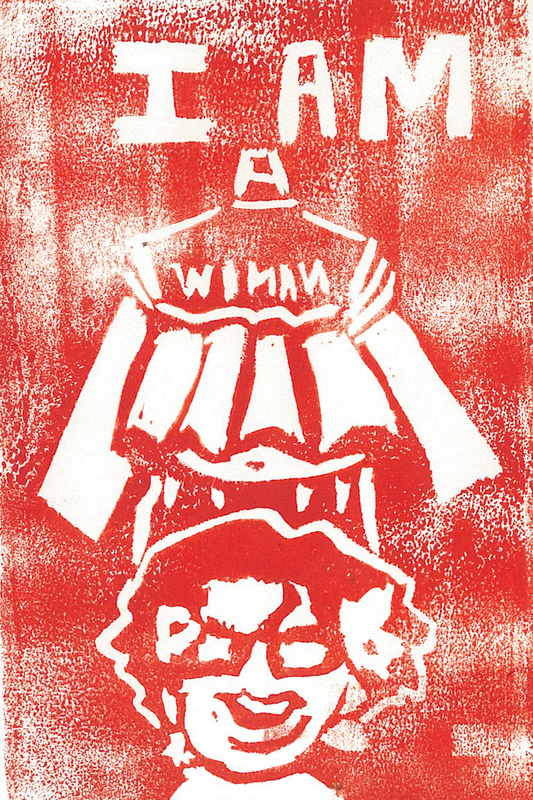 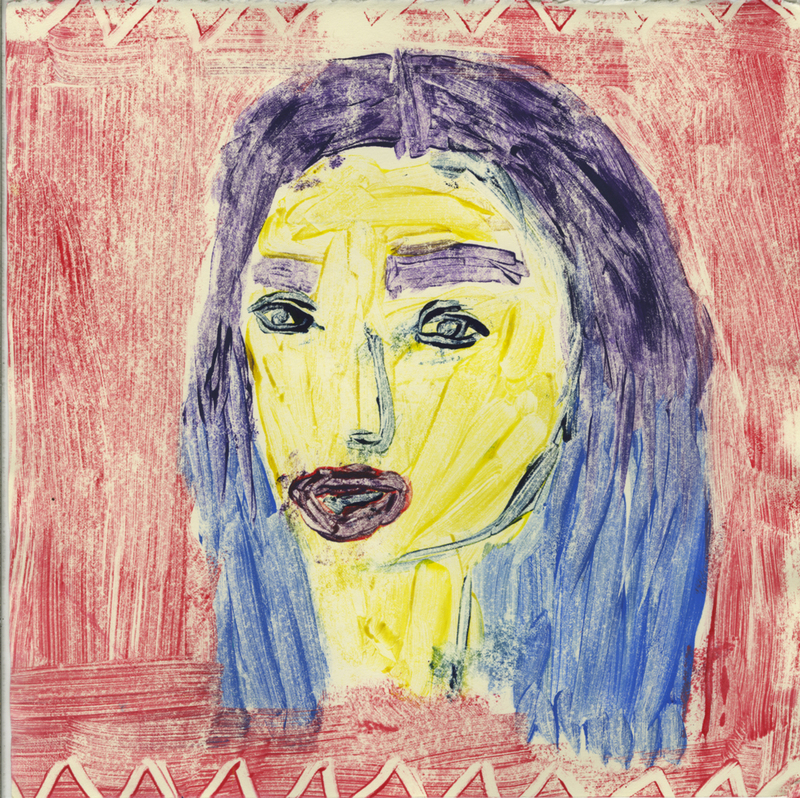 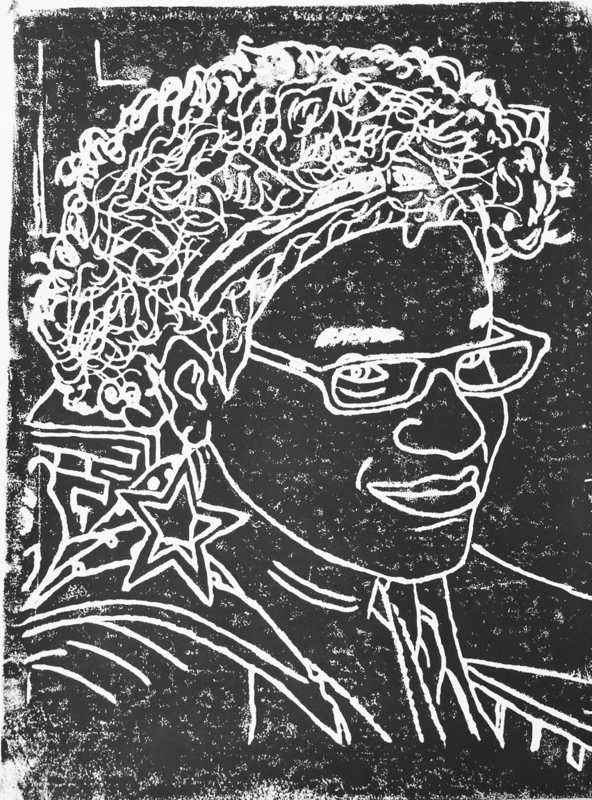 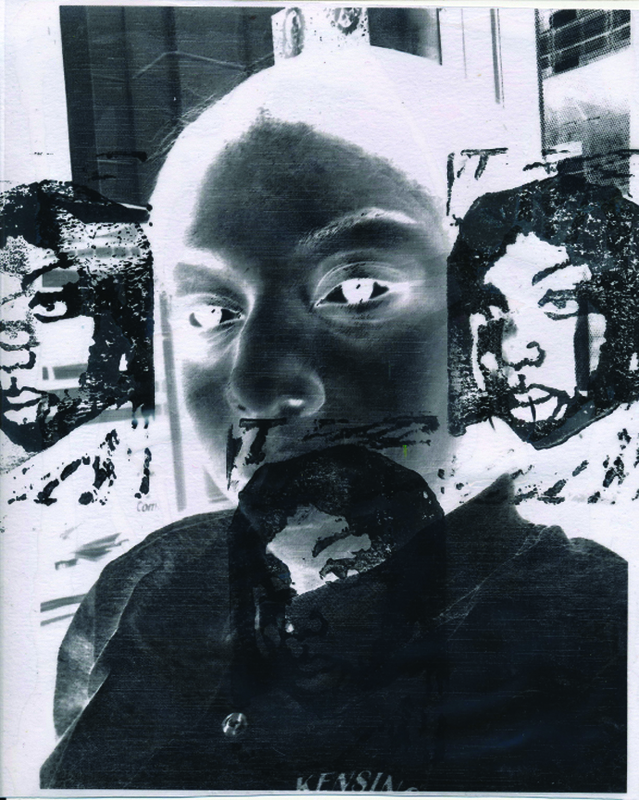 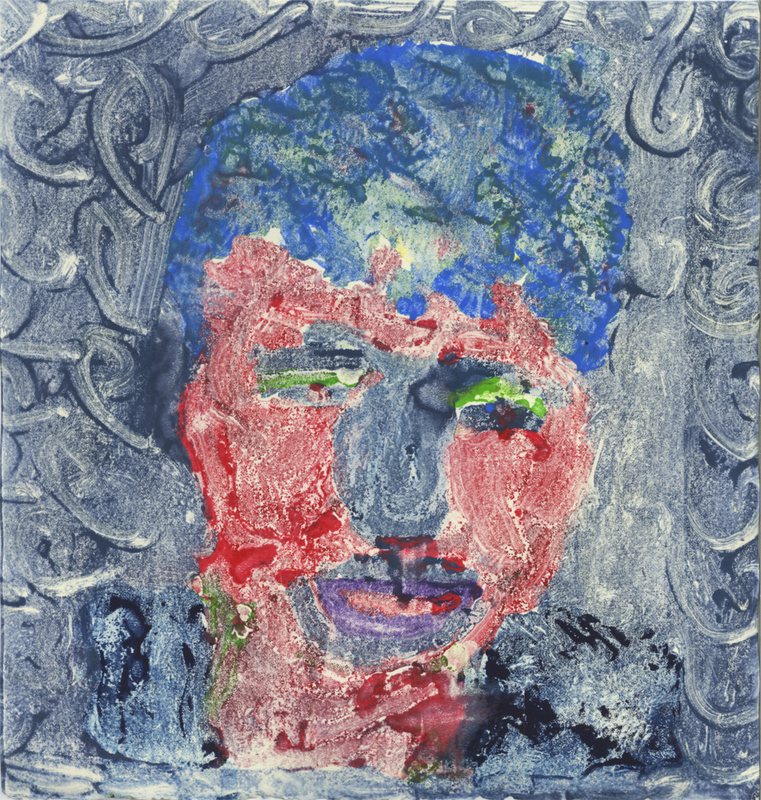 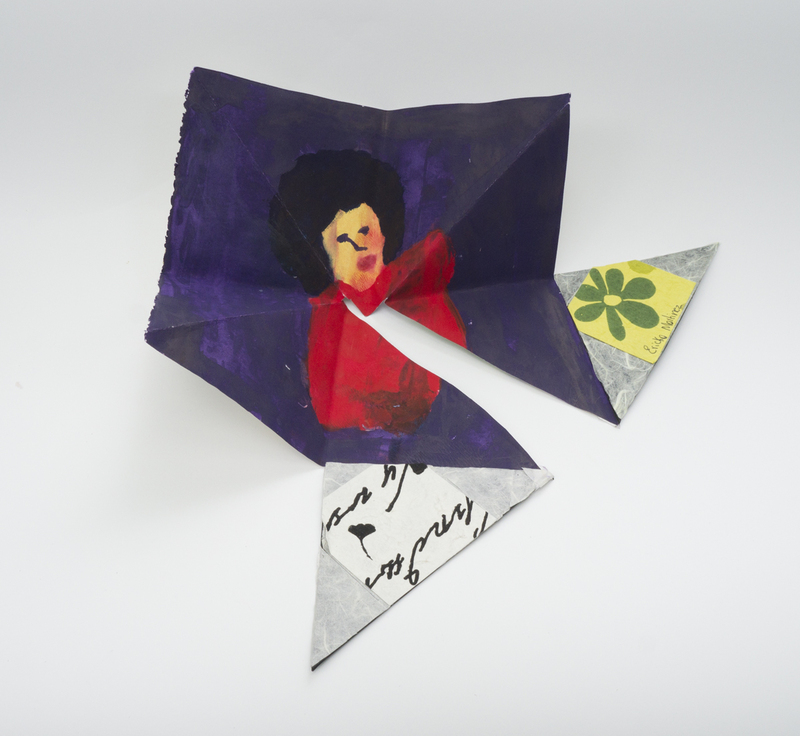 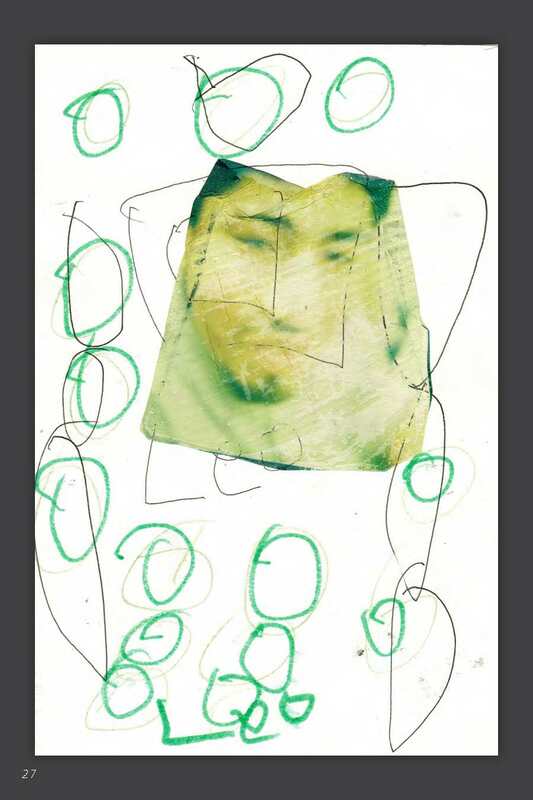 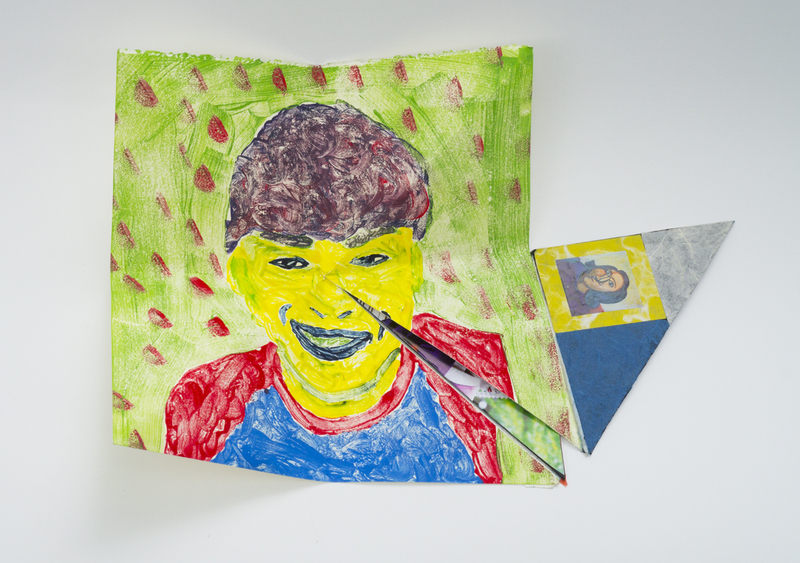 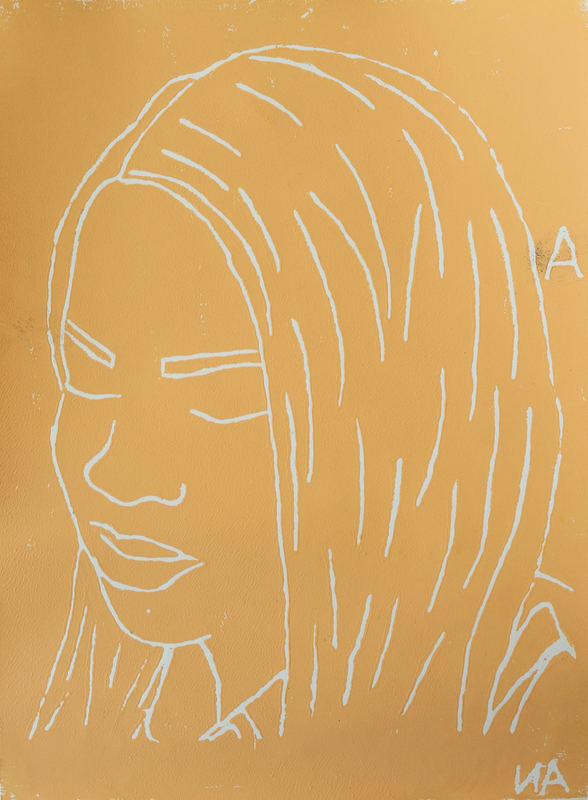 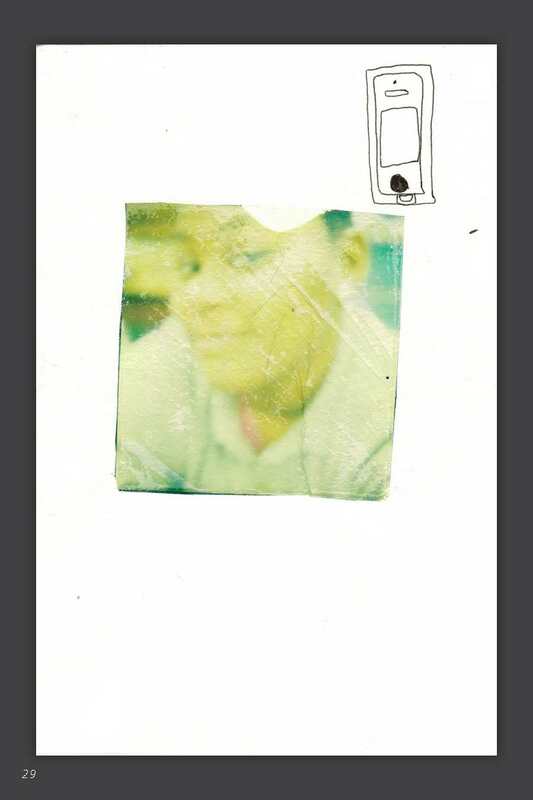 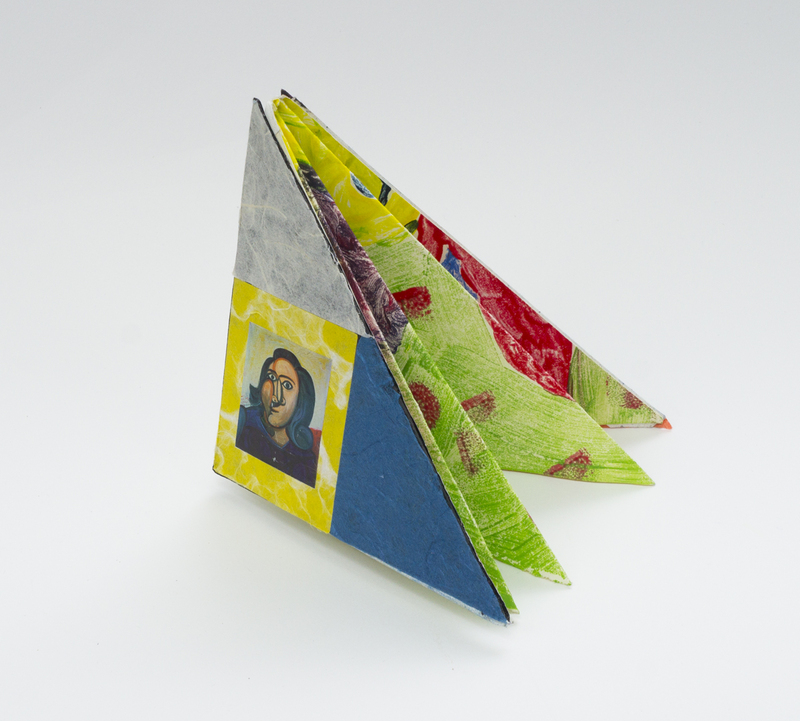 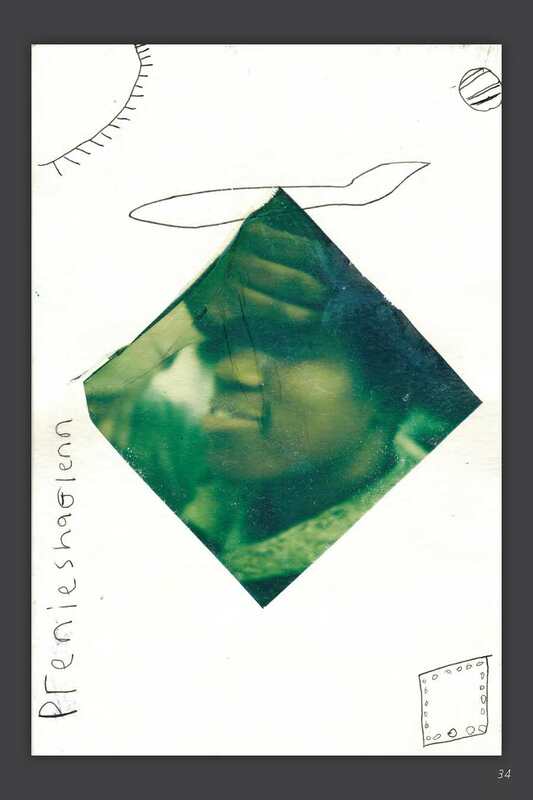 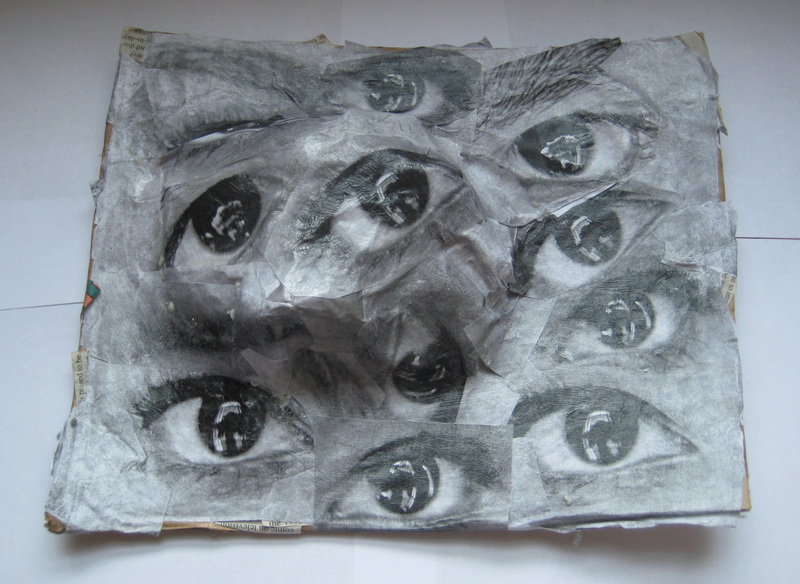 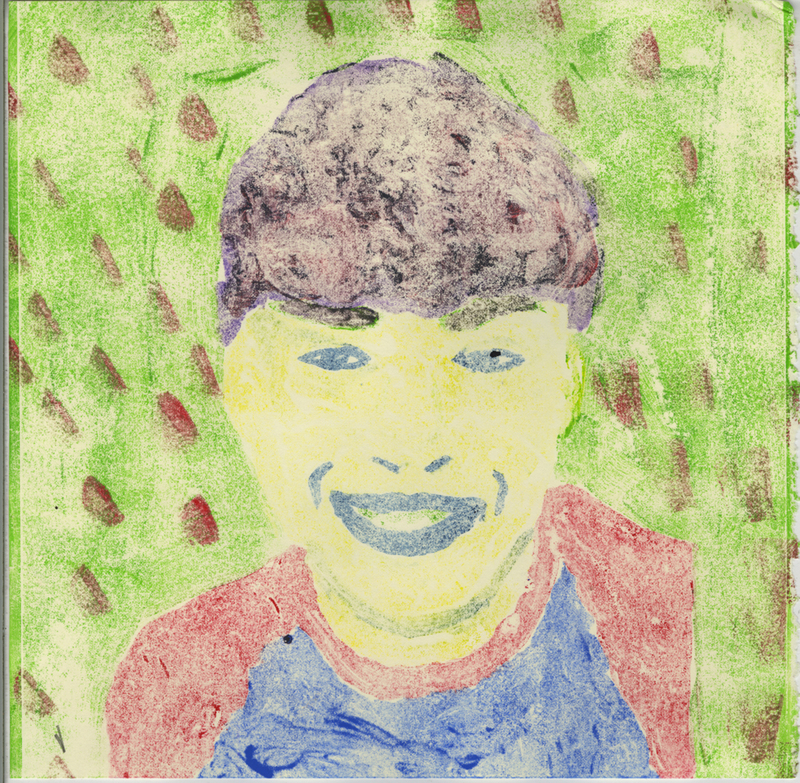 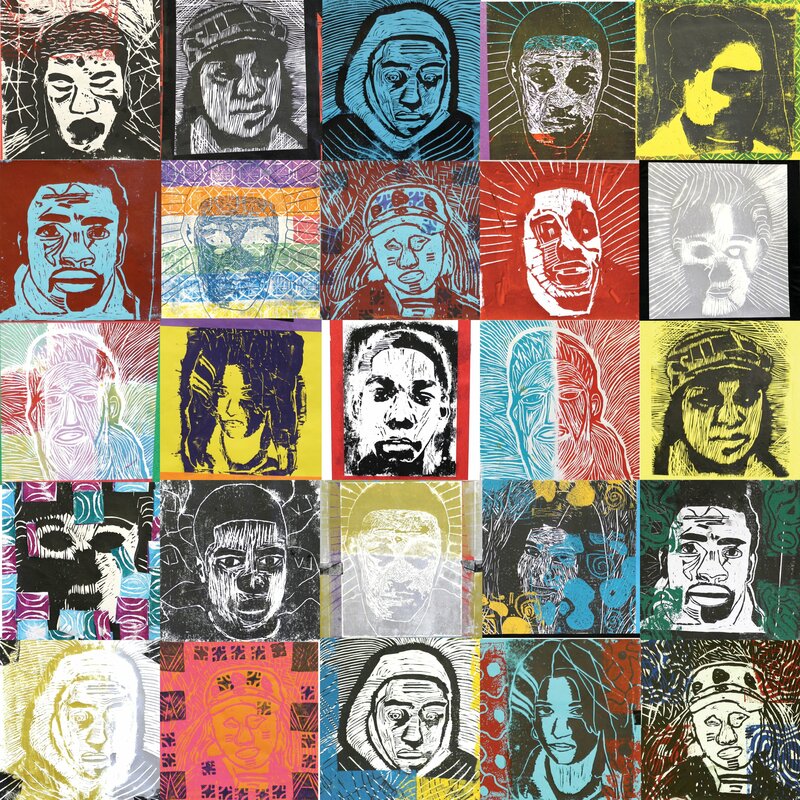 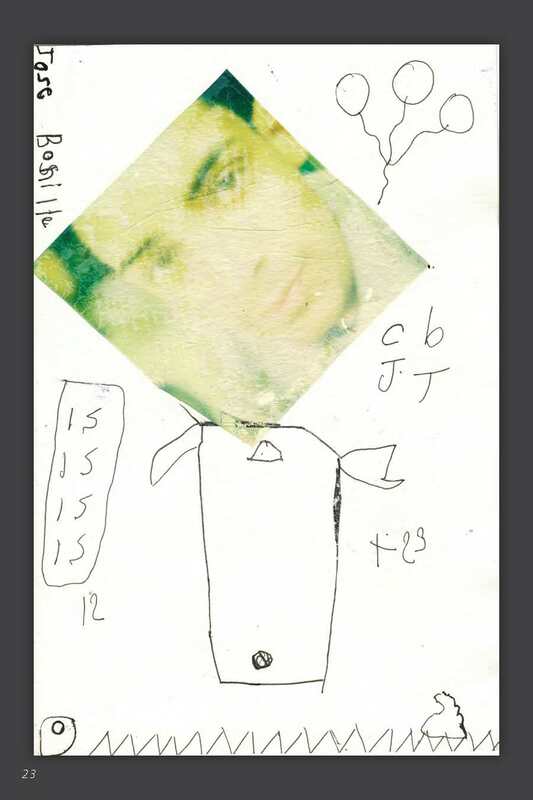 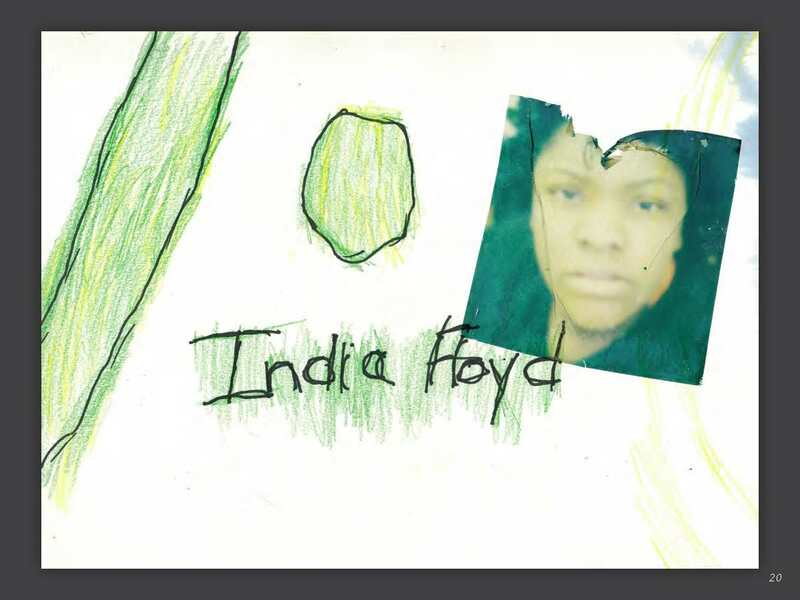 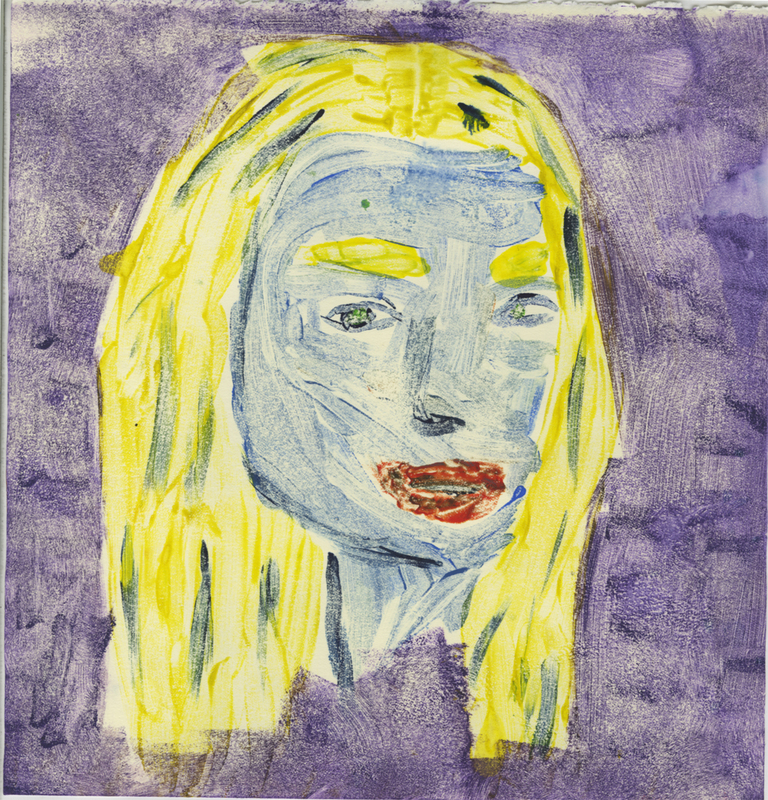 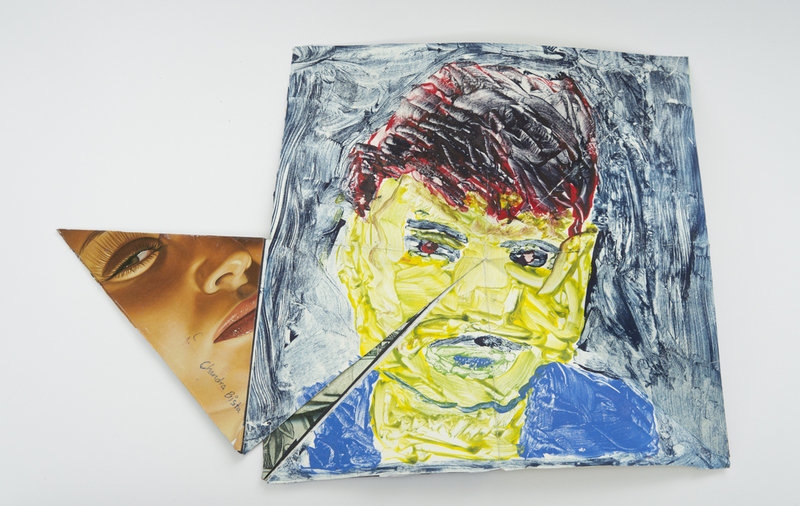 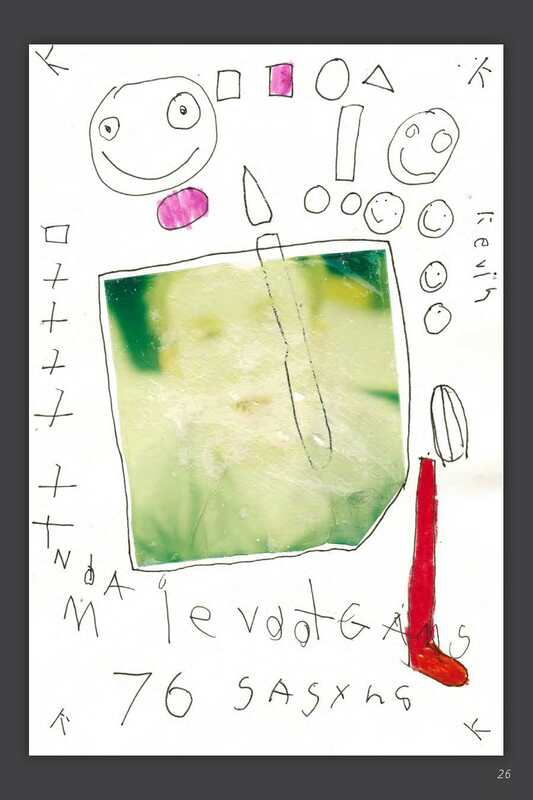 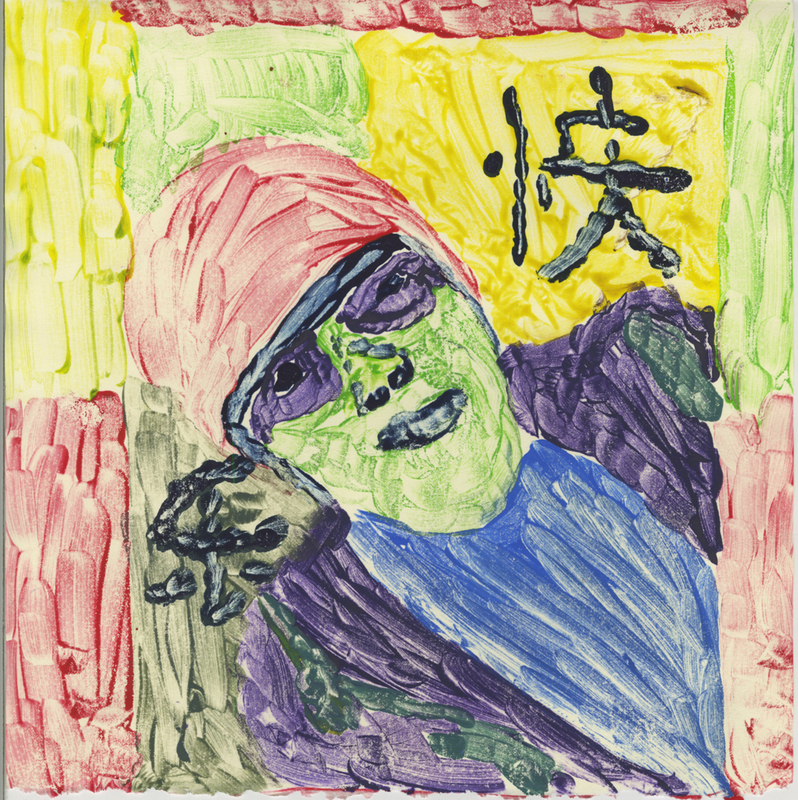 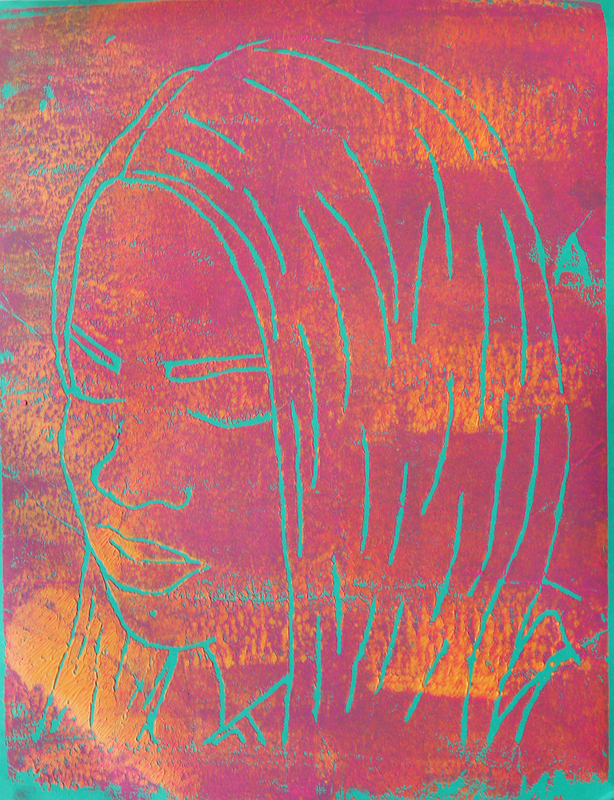 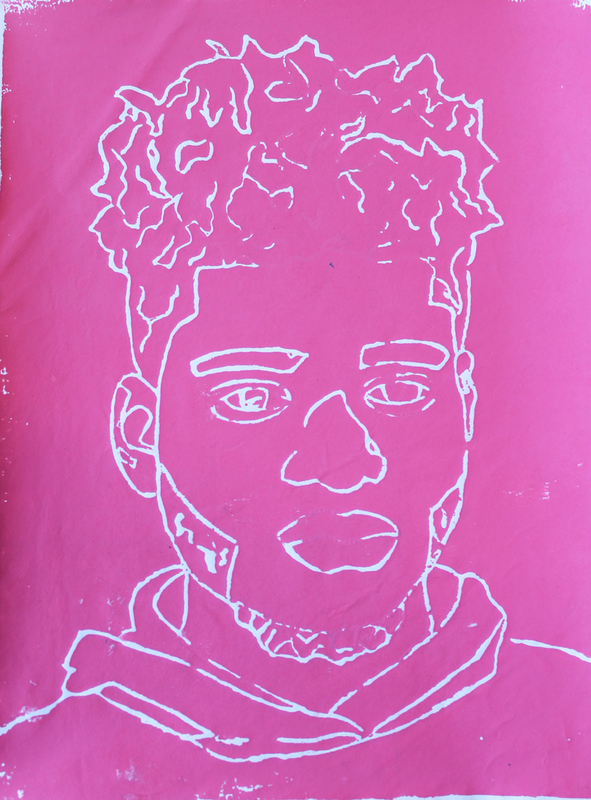 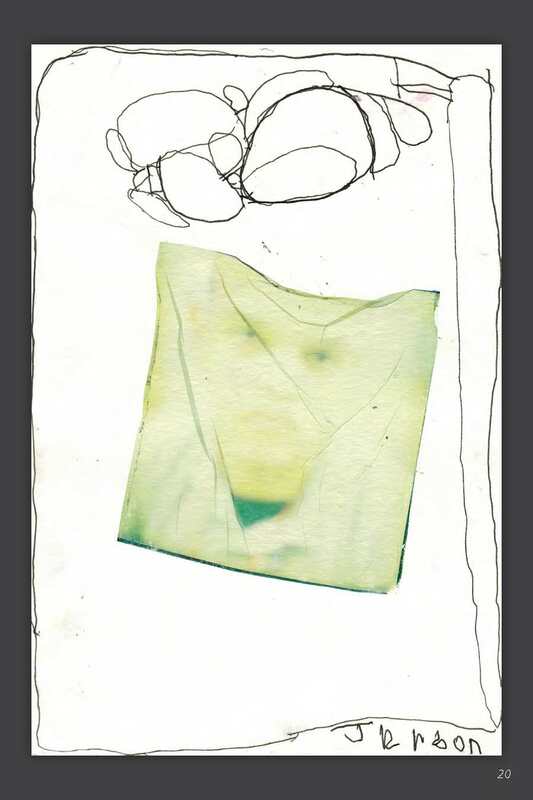 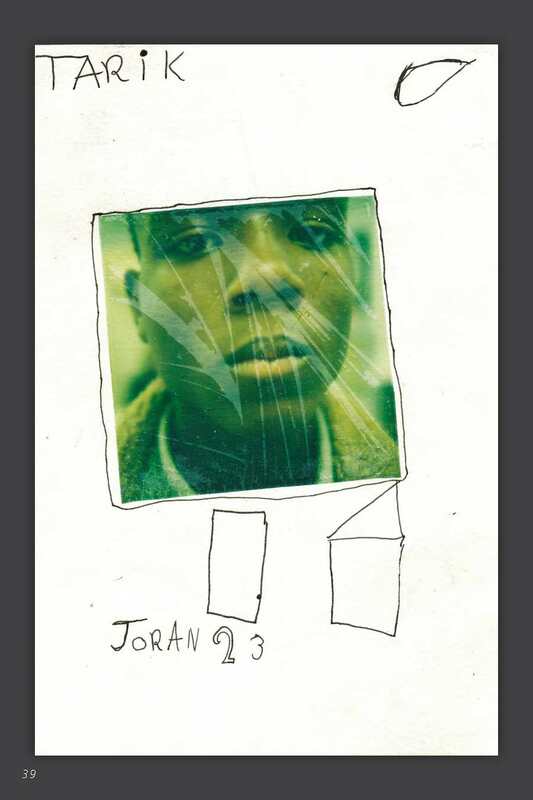 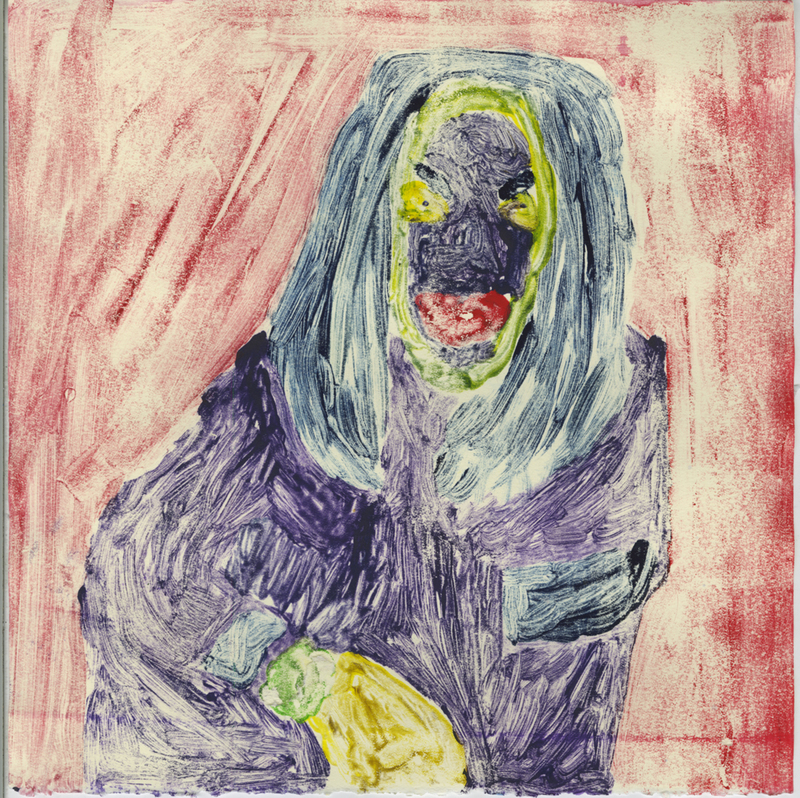 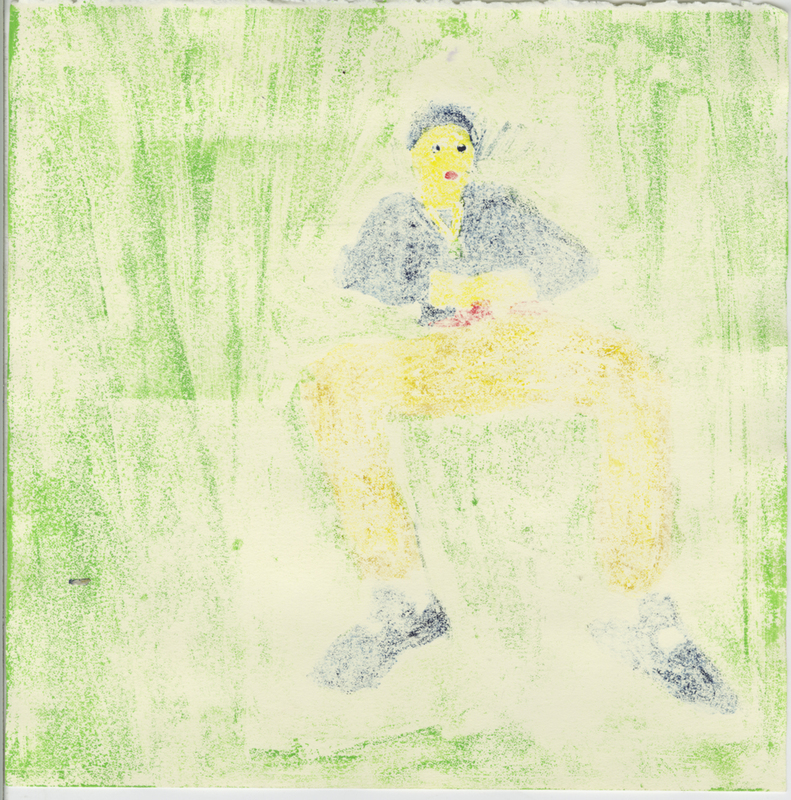 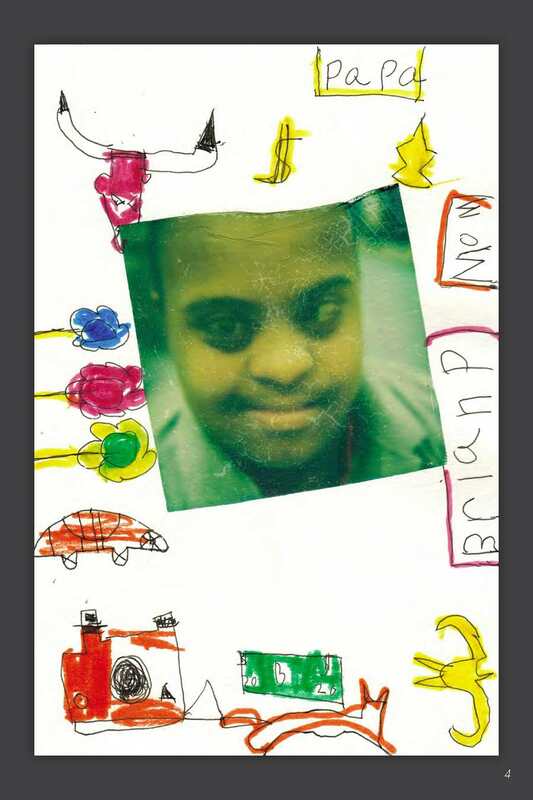 Using work by Steve Prince and other contemporary artists as examples, students made photographs of themselves that were transferred onto linoleum blocks, carved and used to make monoprinted book covers. 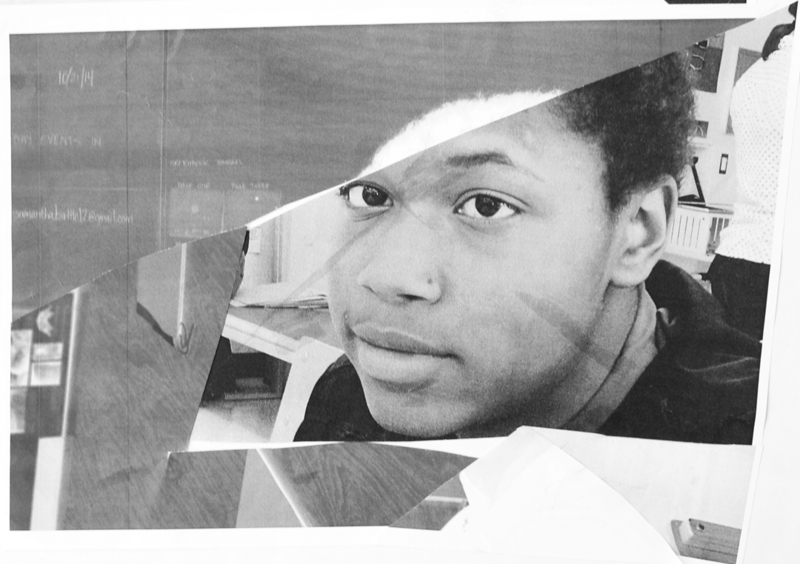 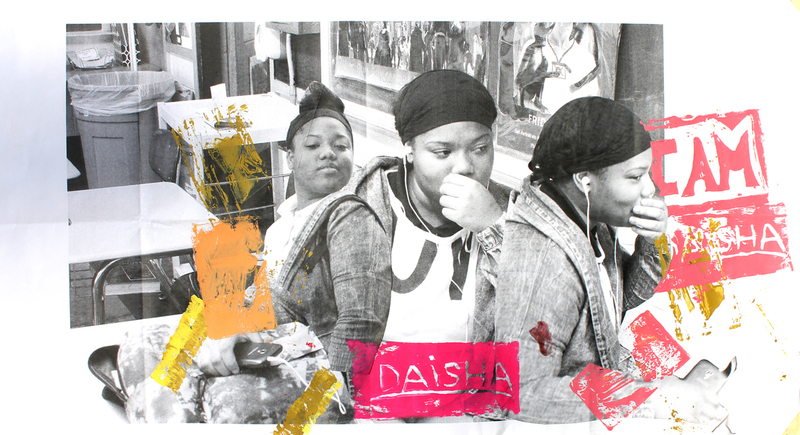 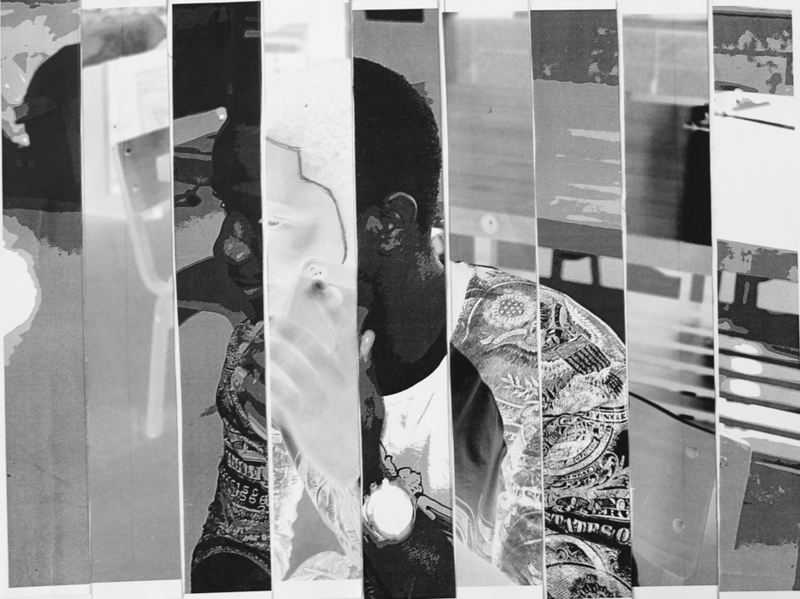 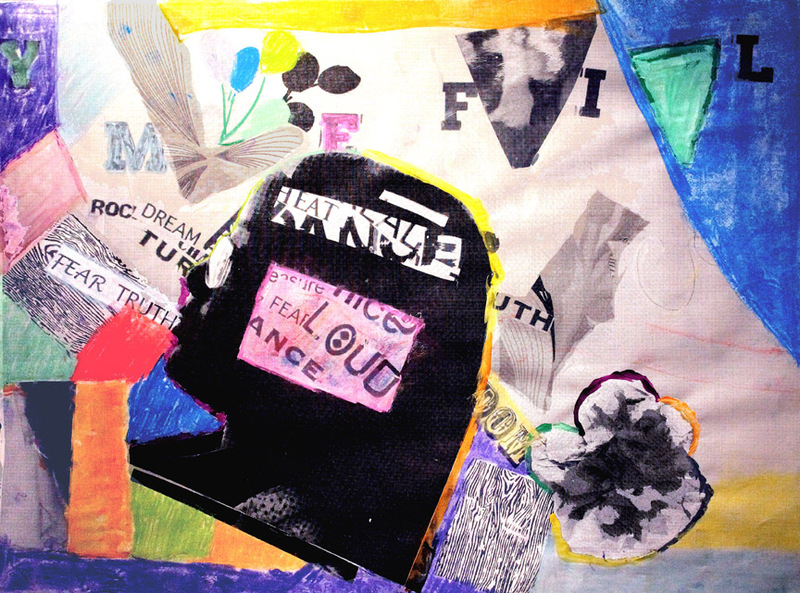 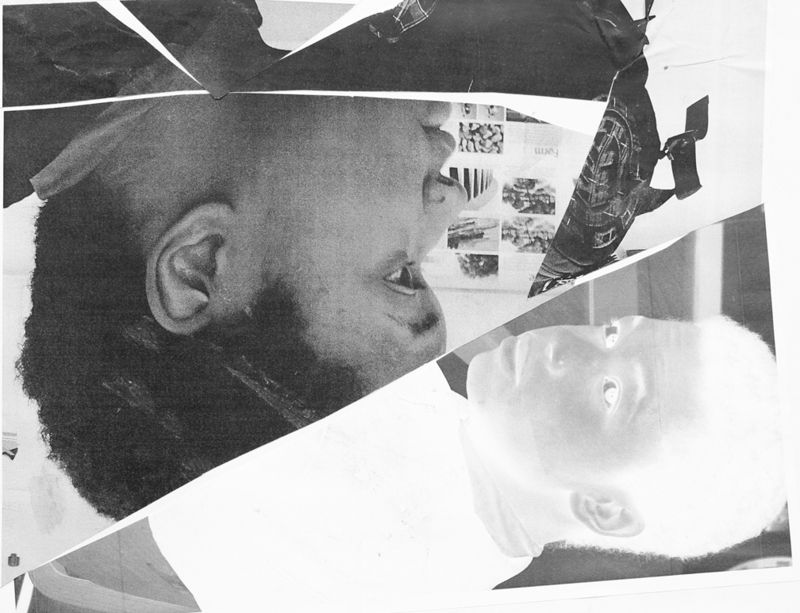 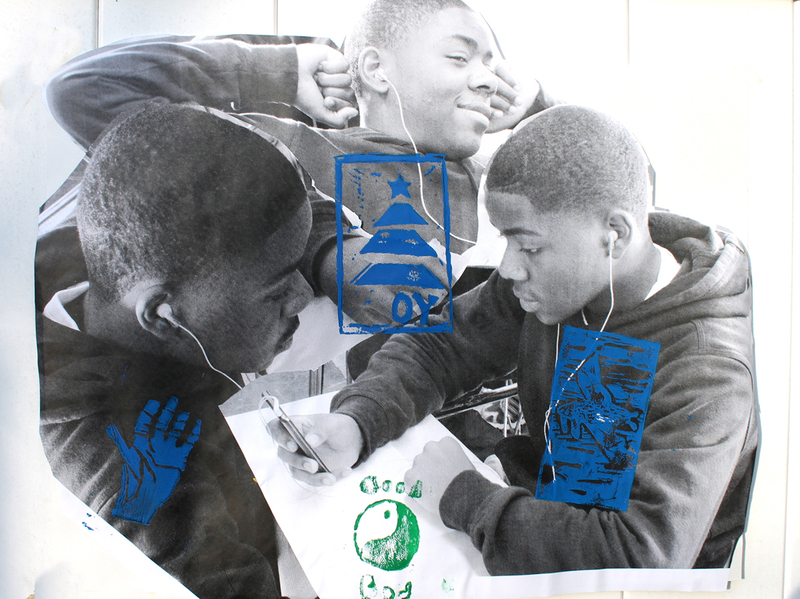 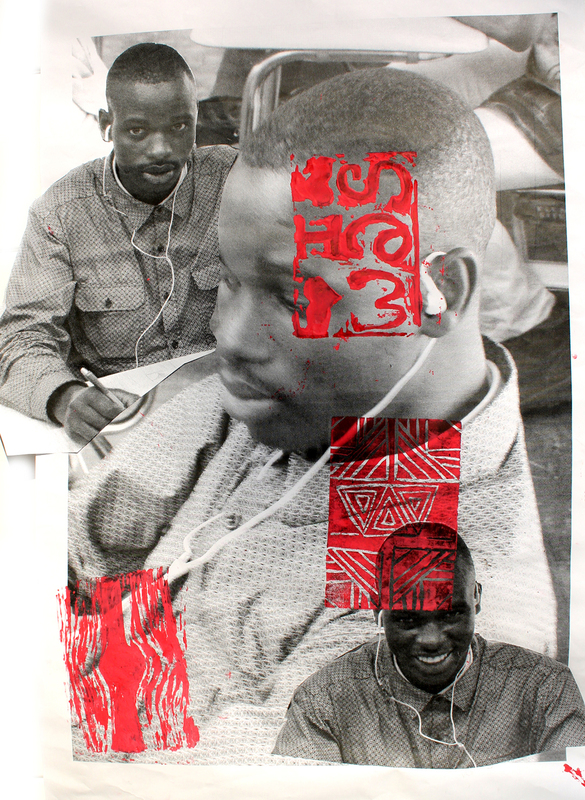 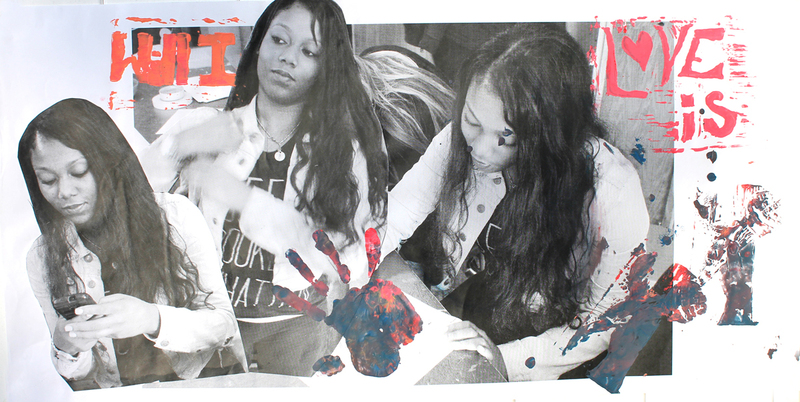 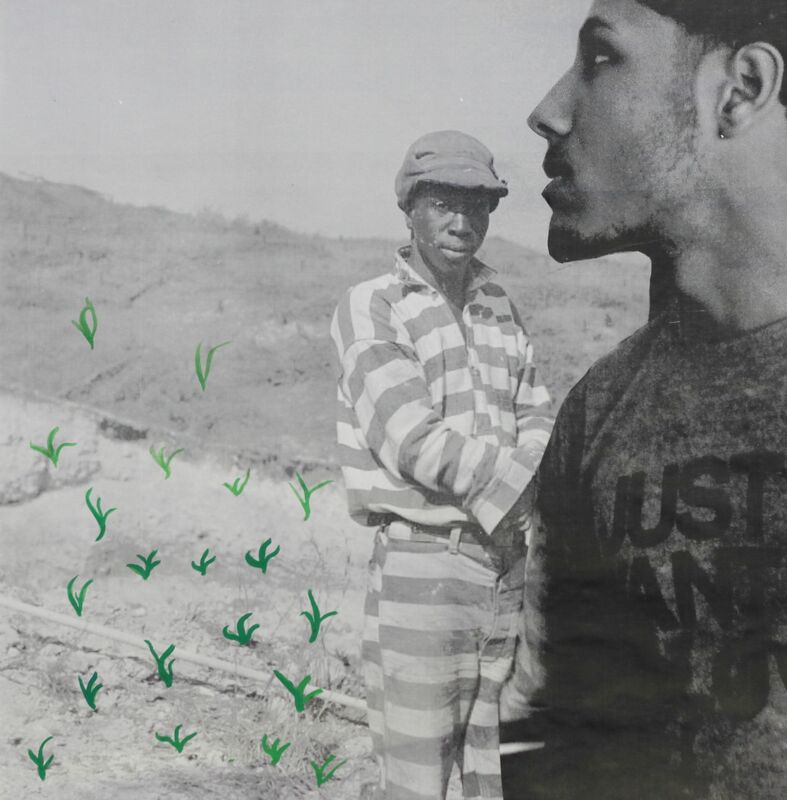 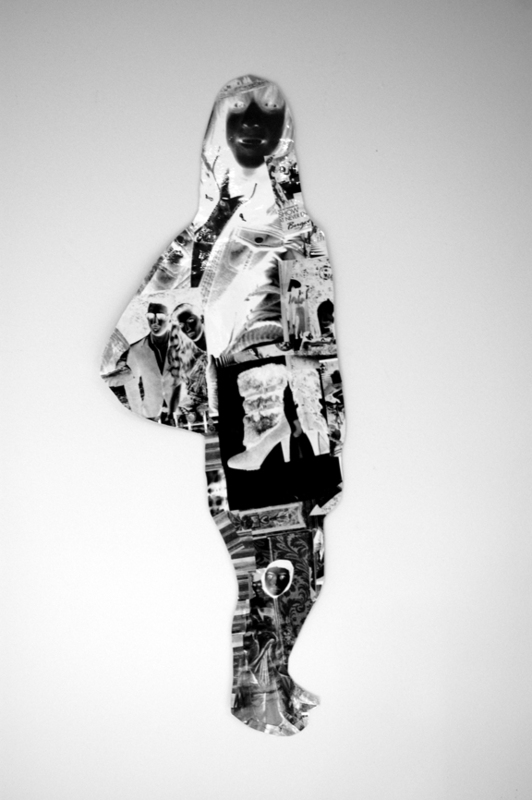 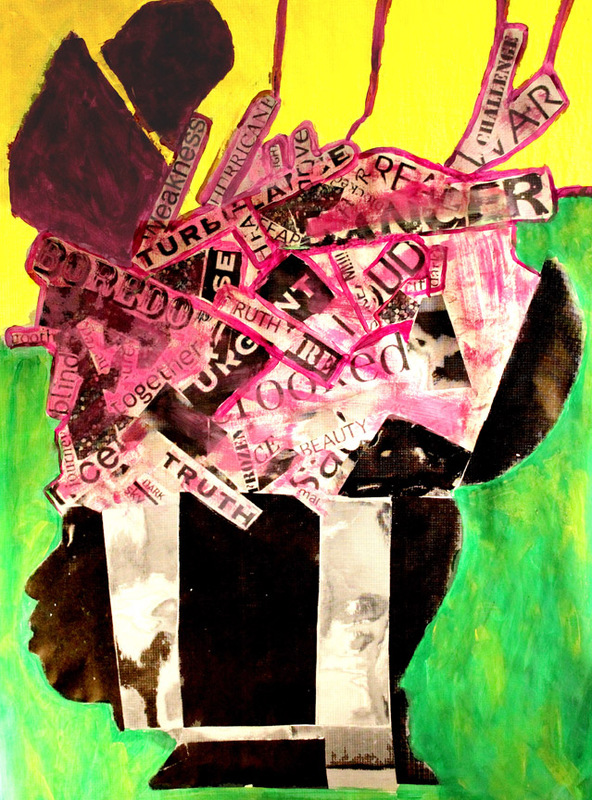 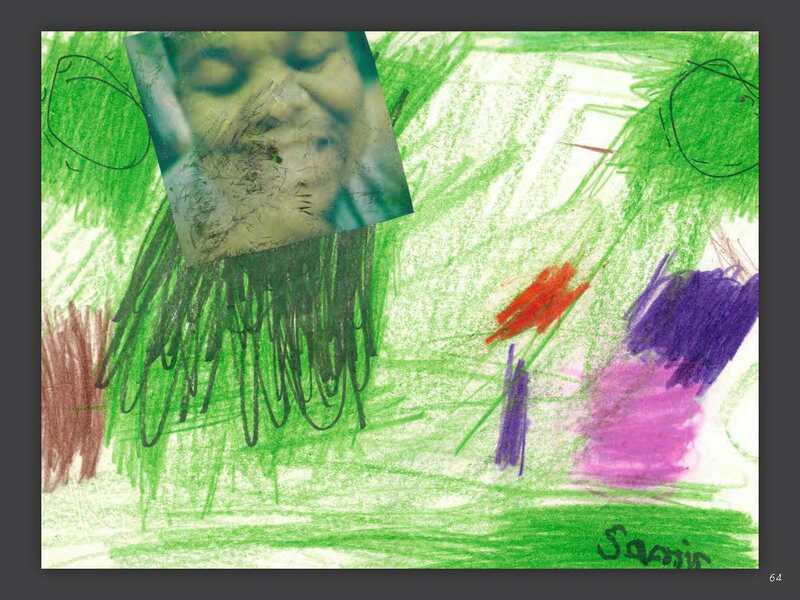 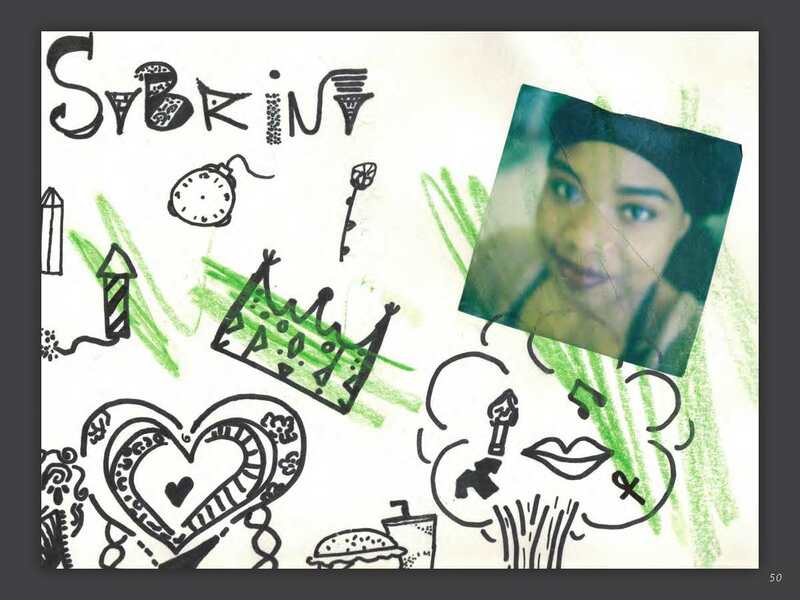 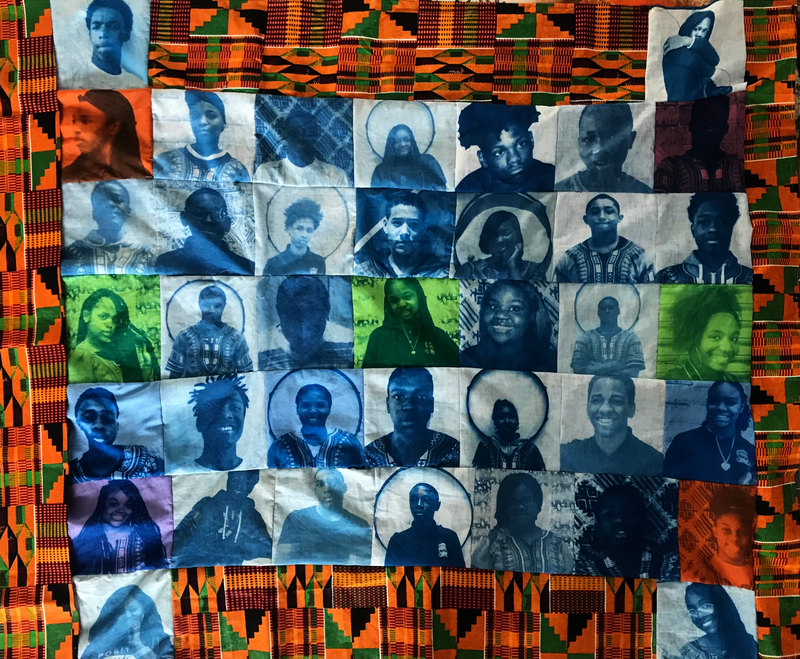 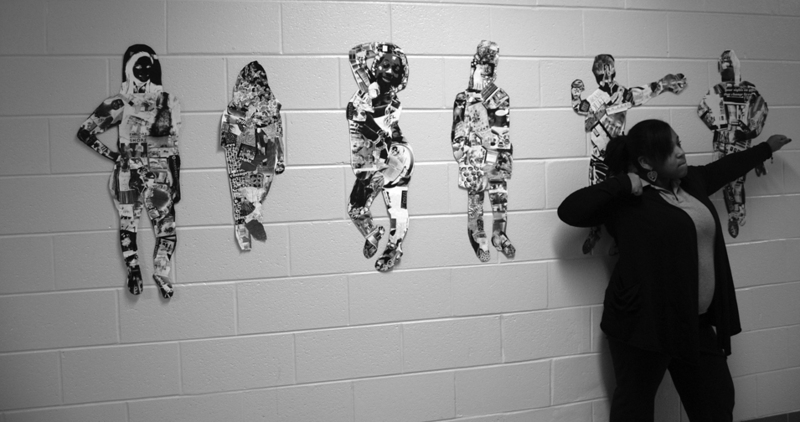 Through photography, printmaking, collage and mixed media techniques, students explored their individual identity as well as their collective identity as members of the student body at Sankofa Freedom Academy. 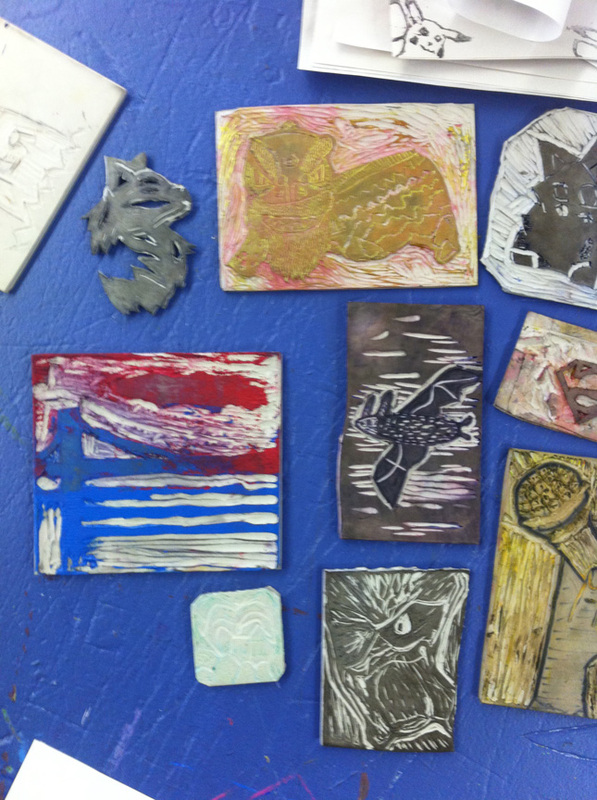 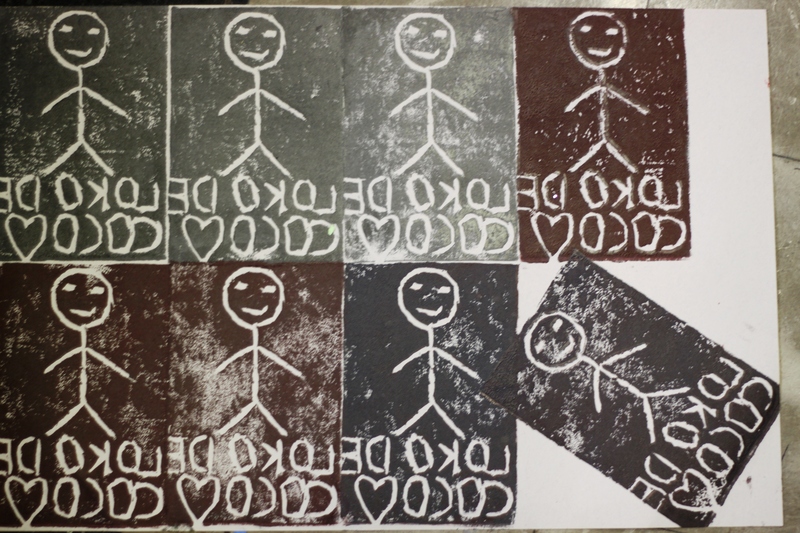 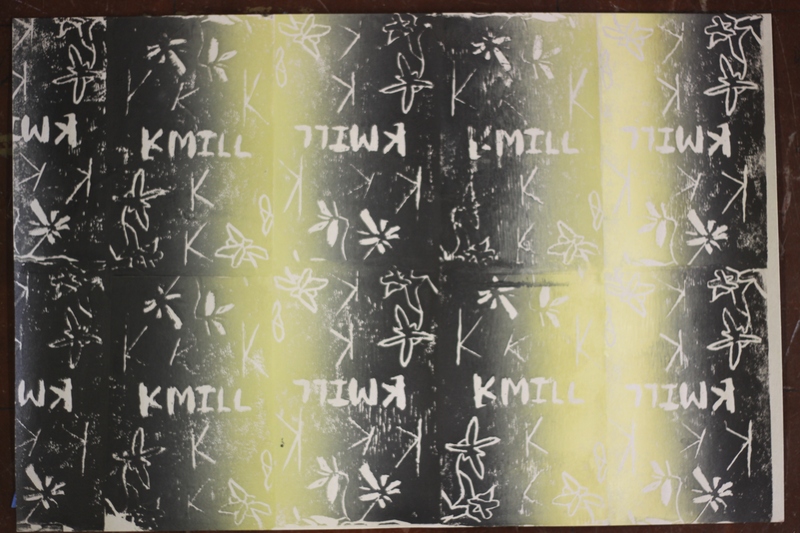 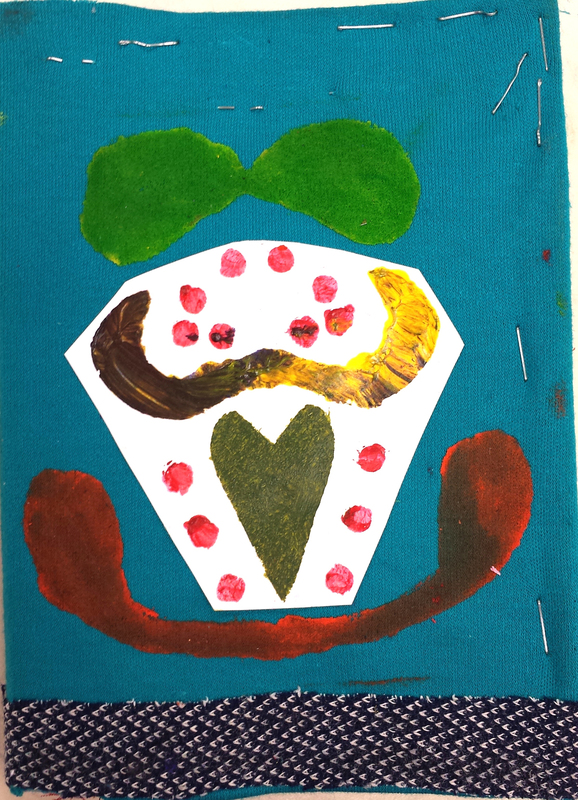 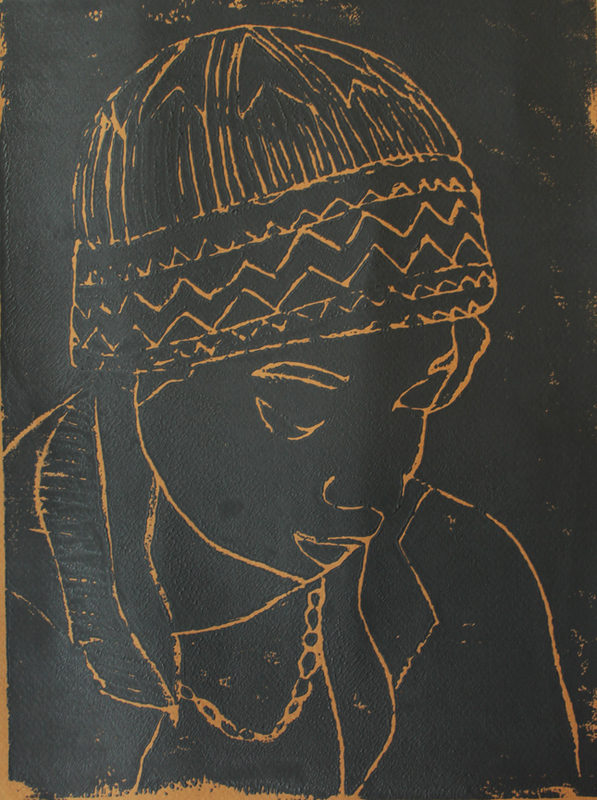 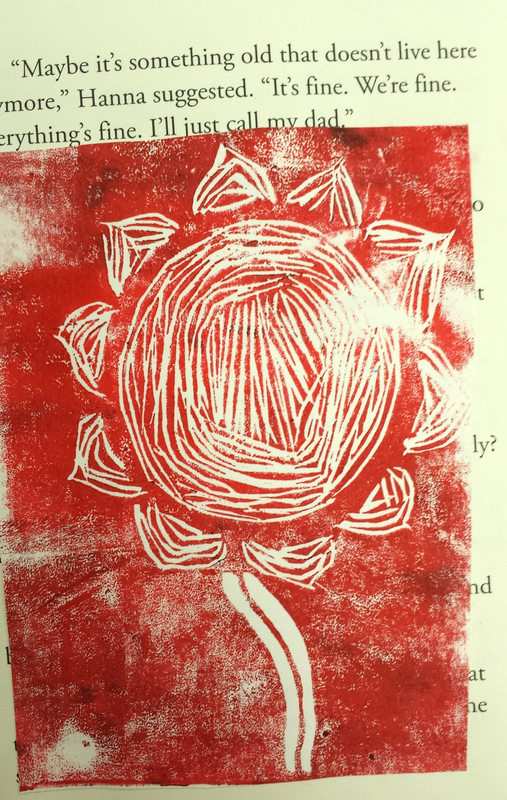 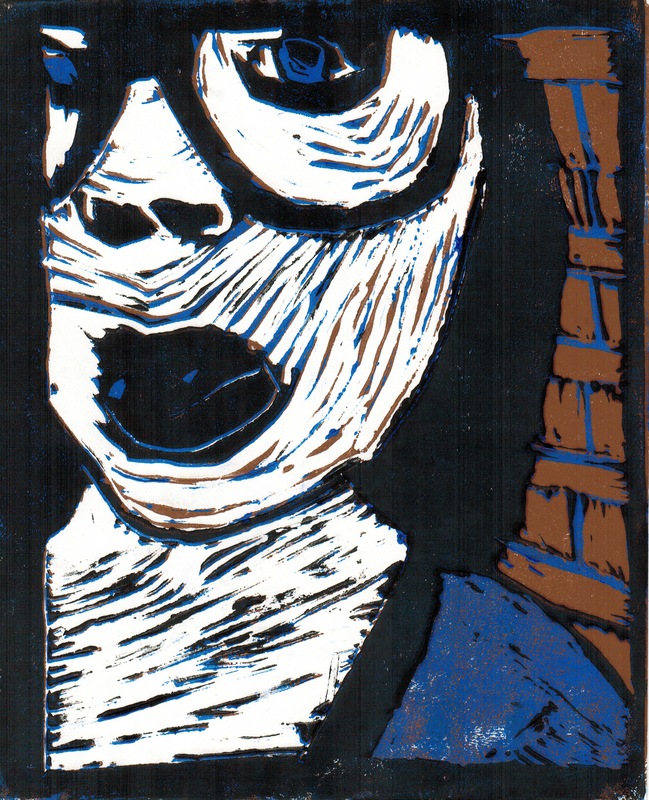 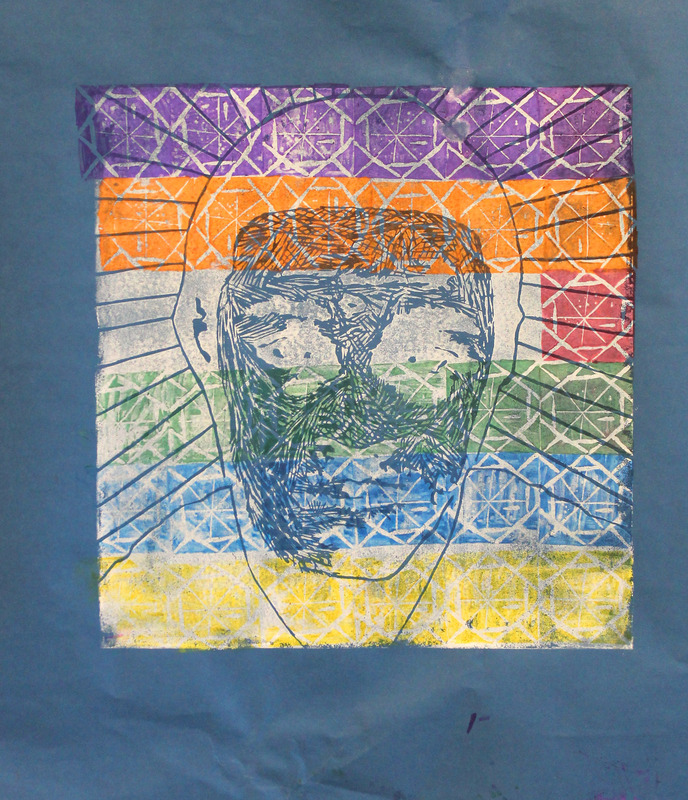 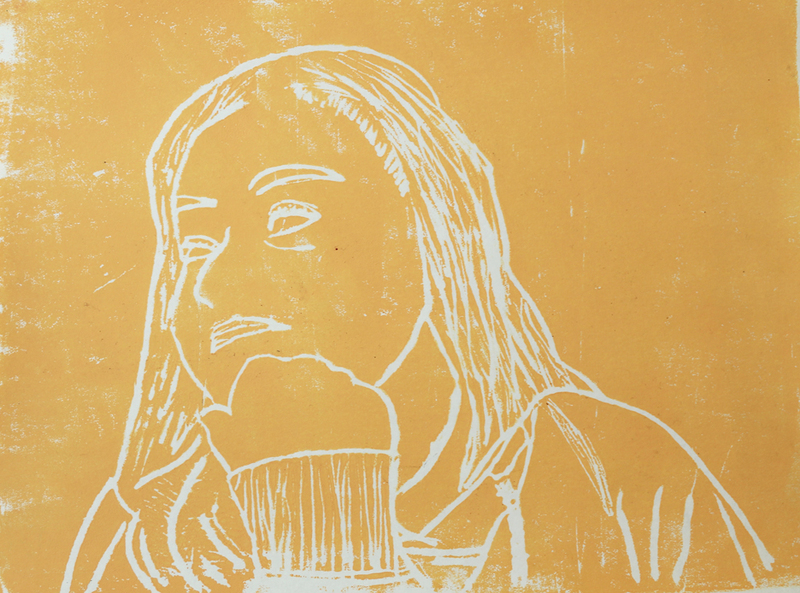 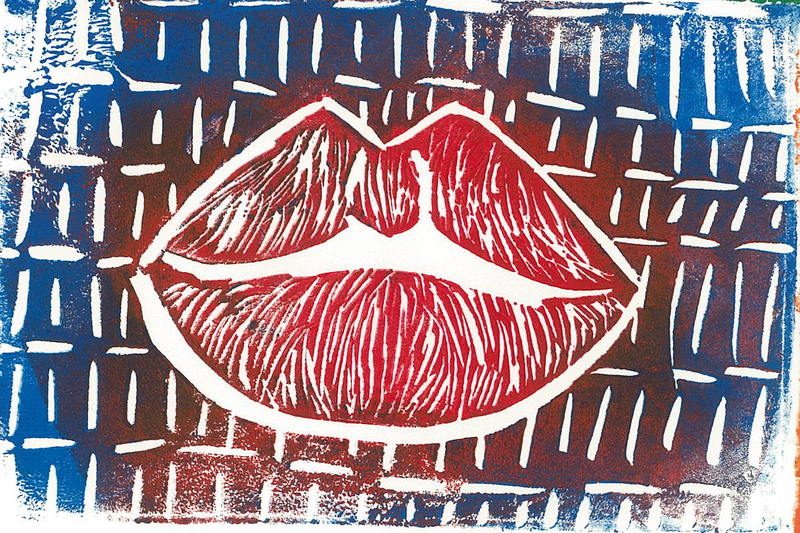 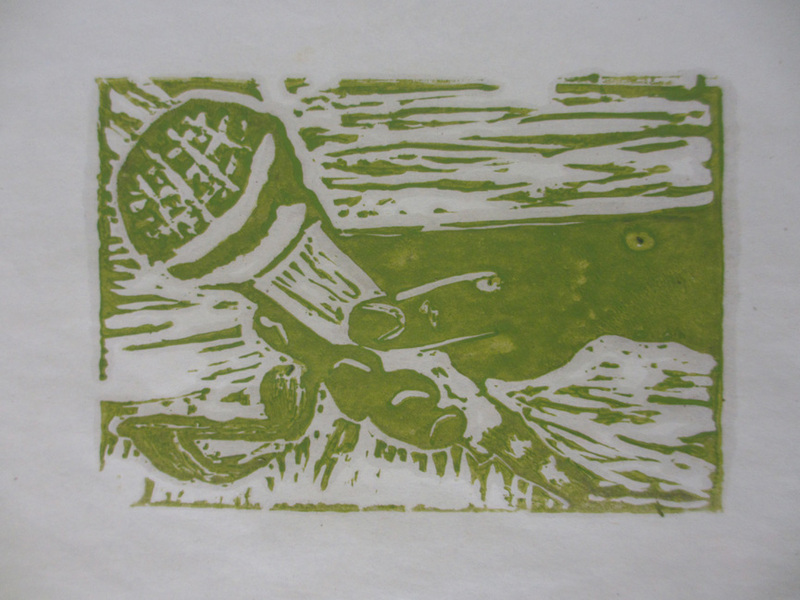 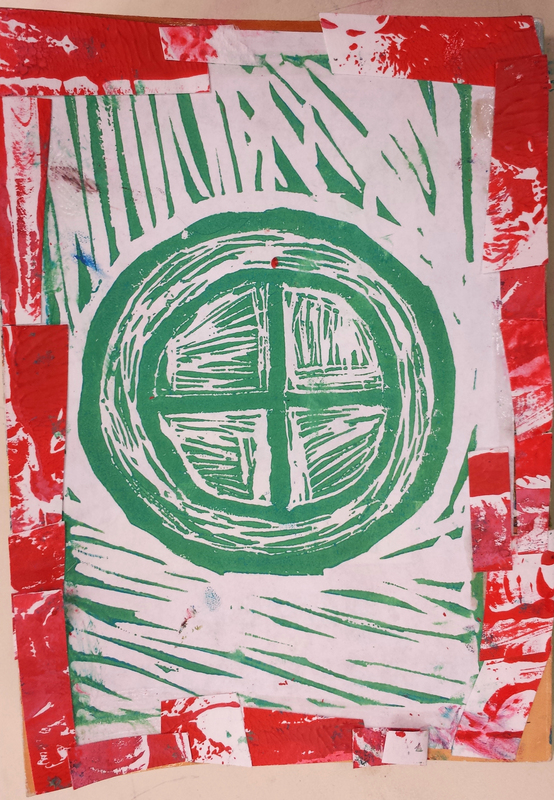 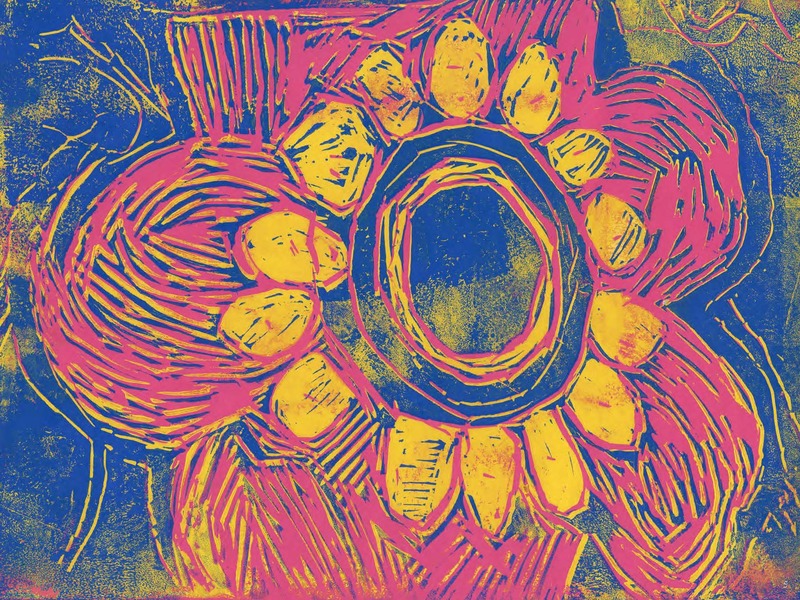 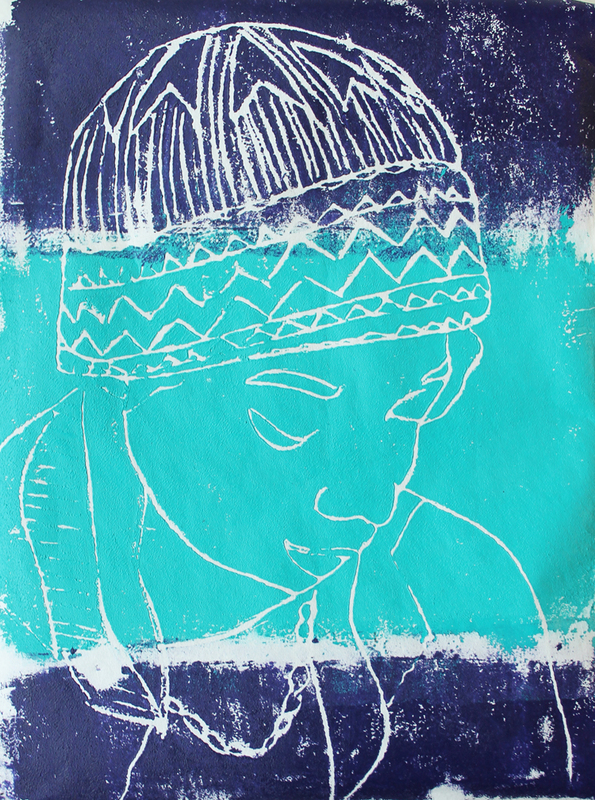 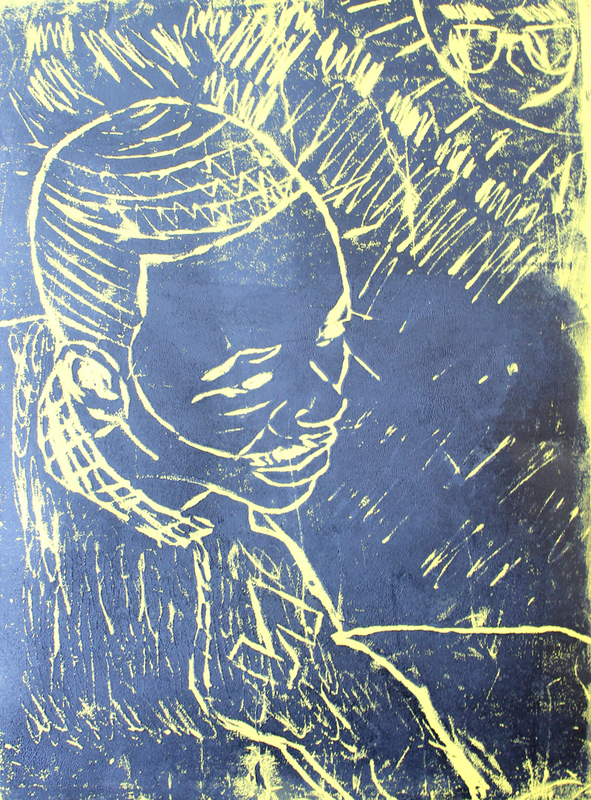 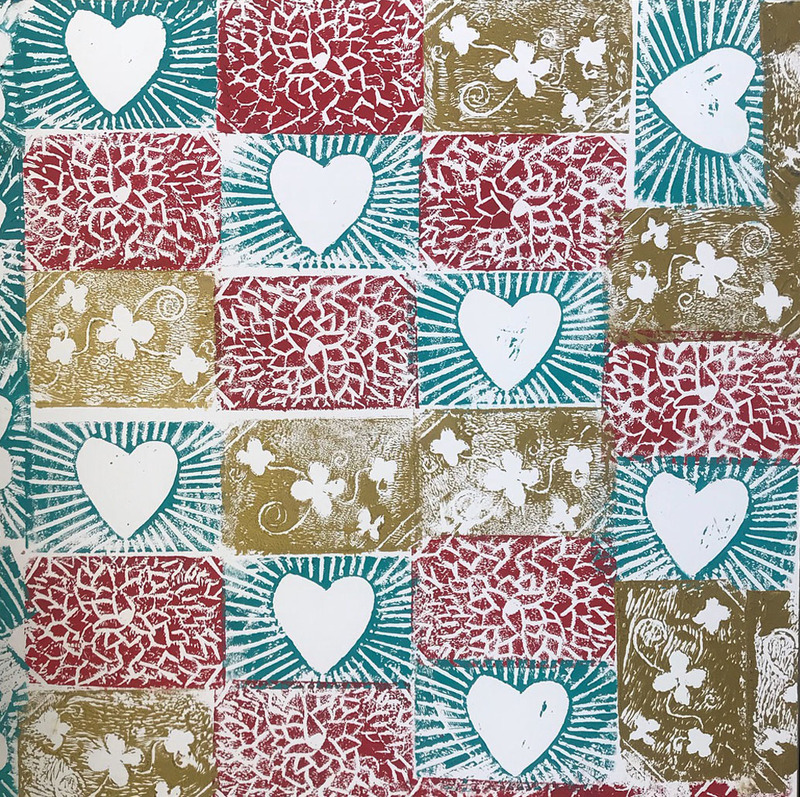 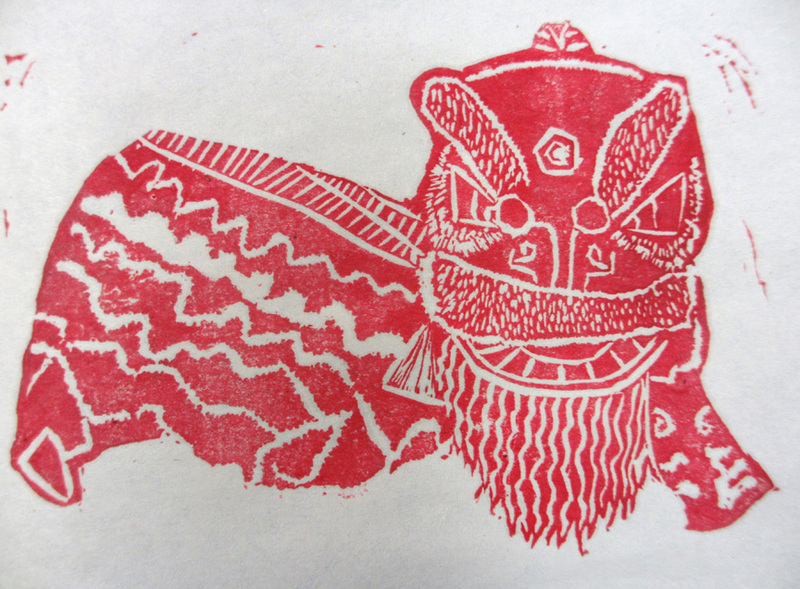 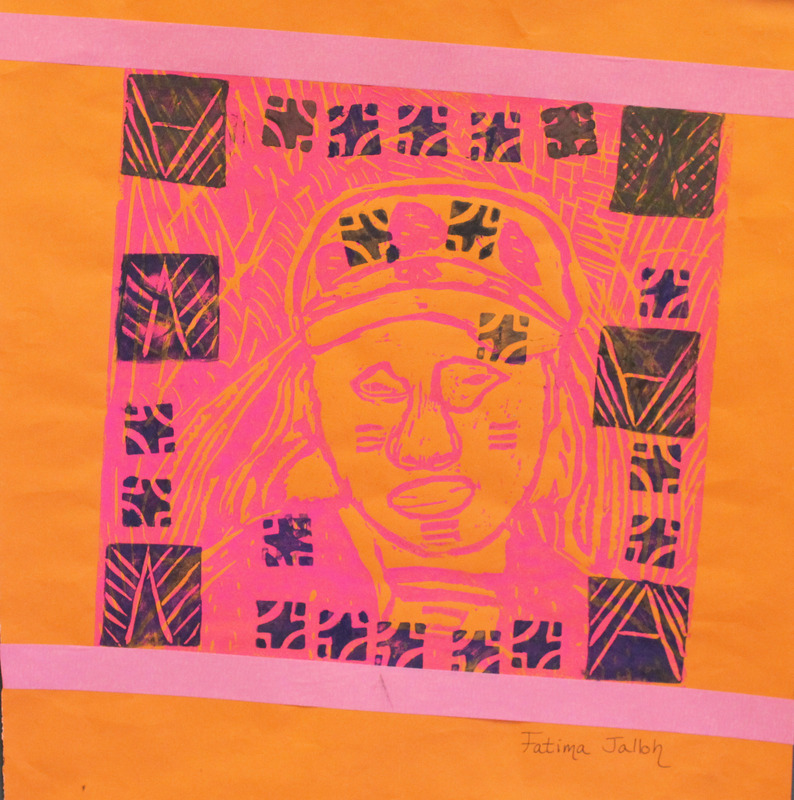 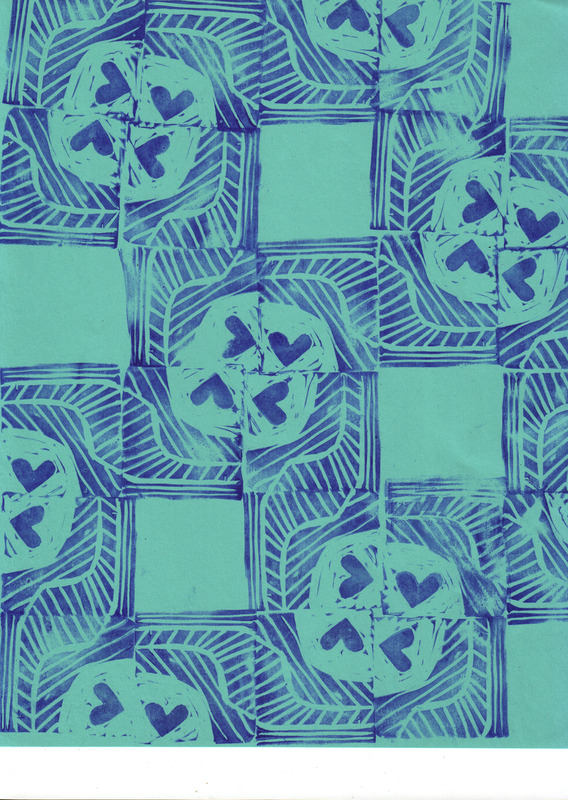 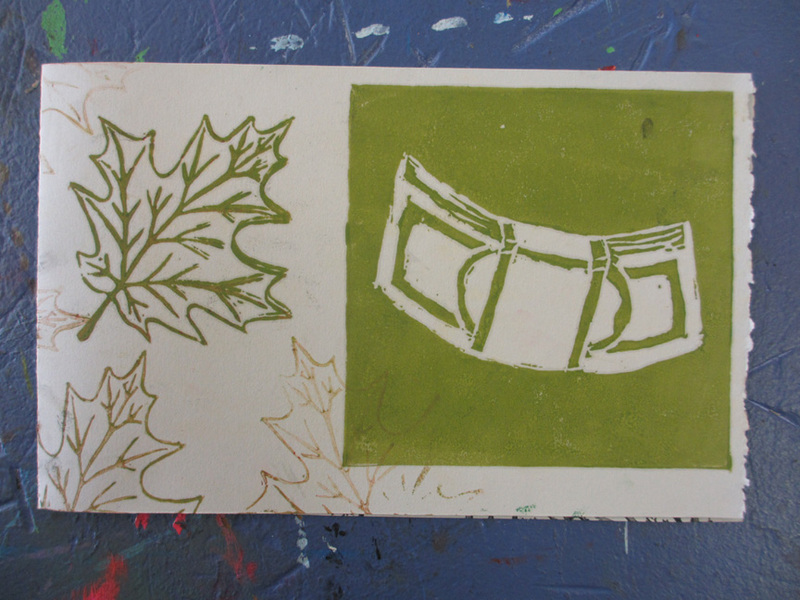 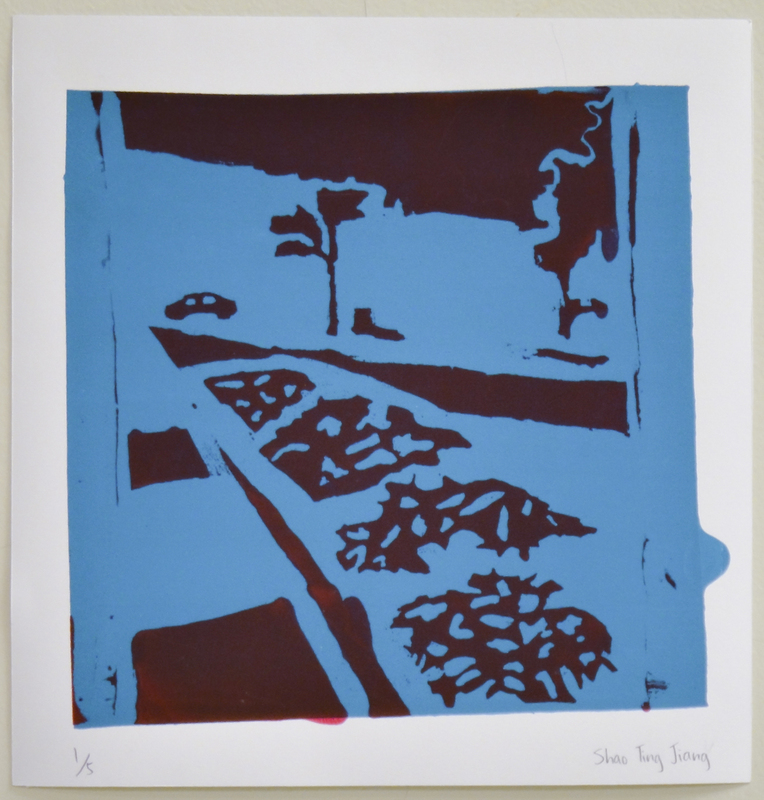 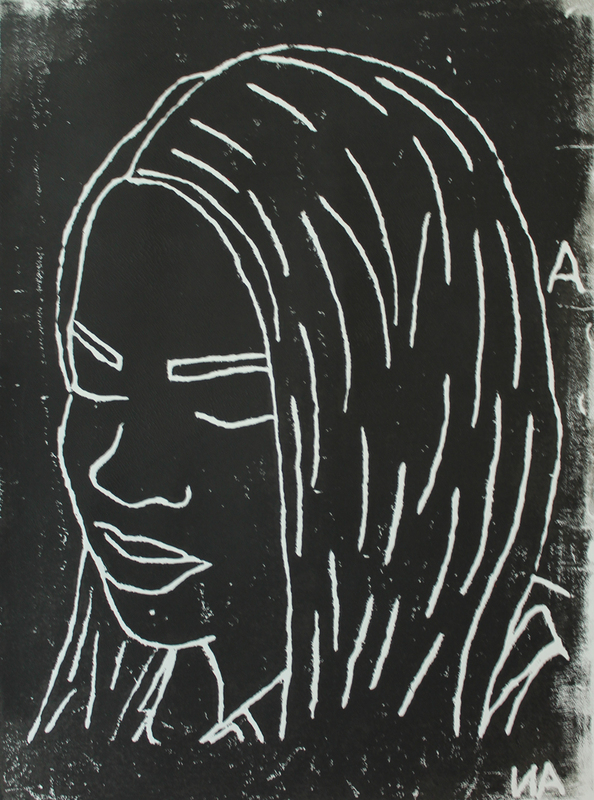 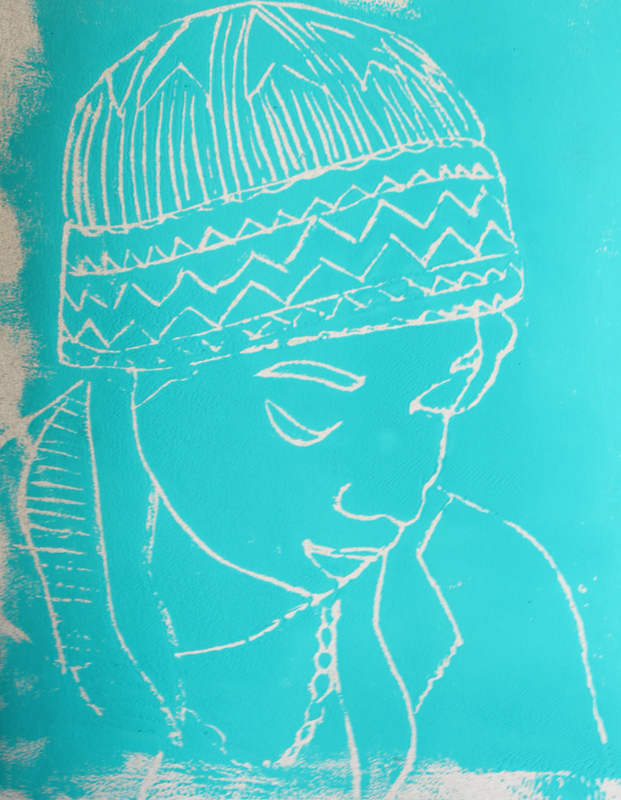 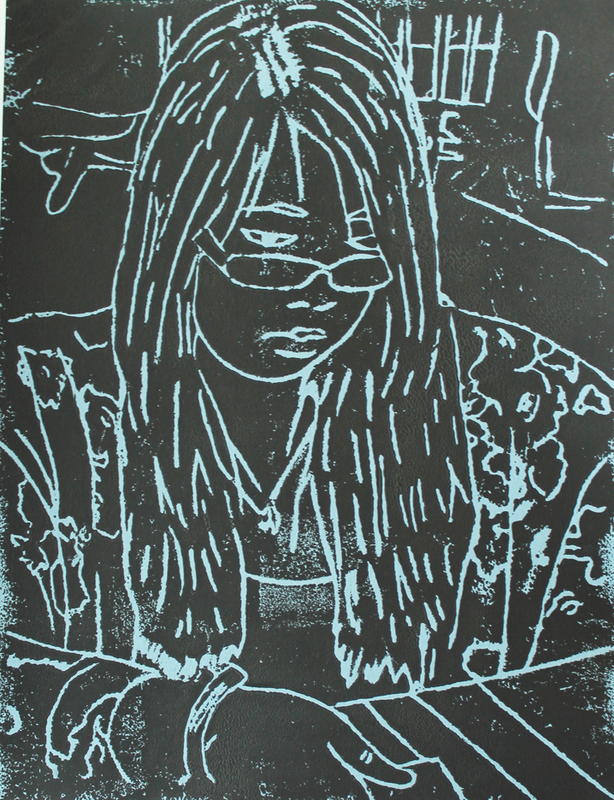 All students began by experimenting with printmaking and patterning through linoleum block printing. 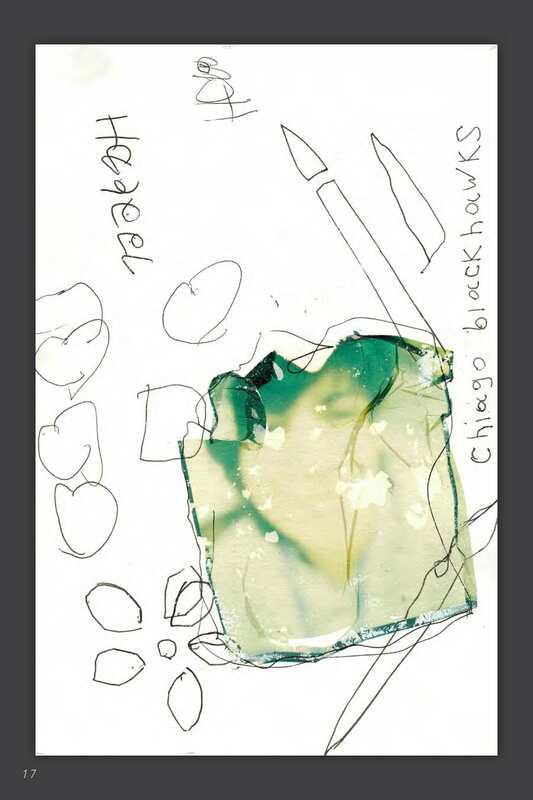 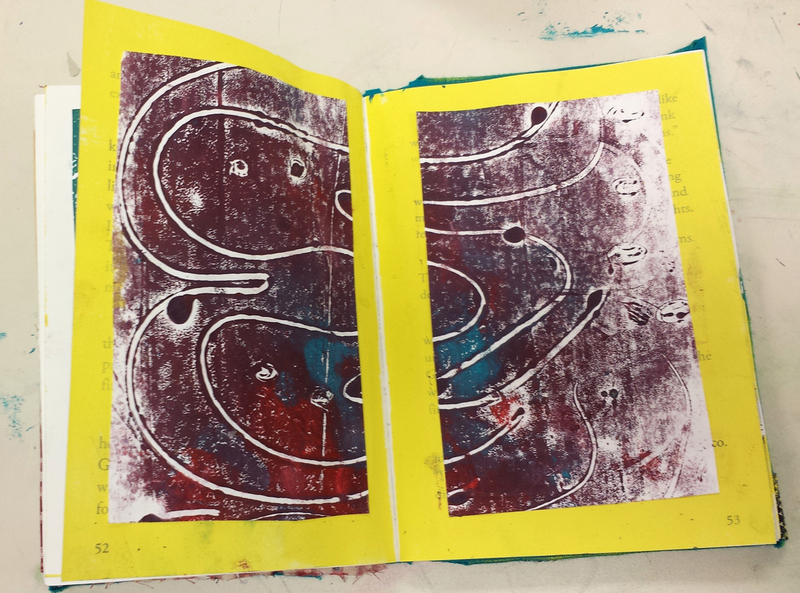 After discussions about photobooks, lessons in digital photography and demonstrations of altered books, students worked on two collaborative projects that incorporated their block prints well as photographs that they made. 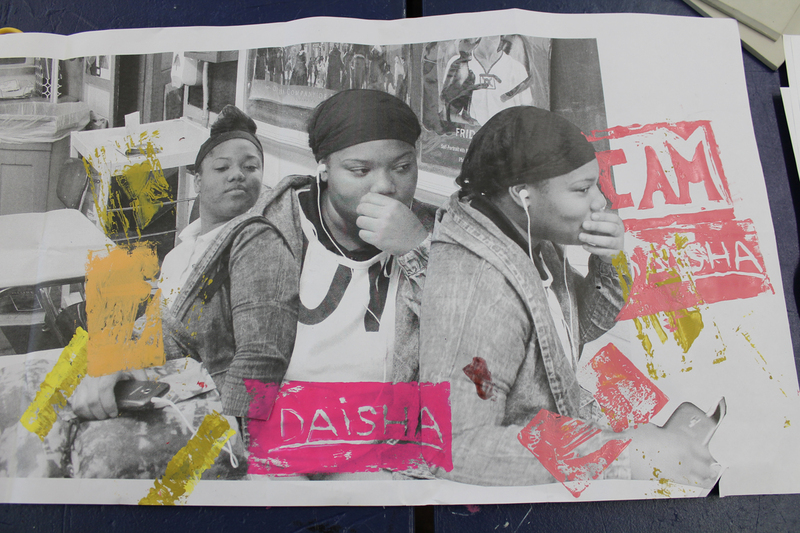 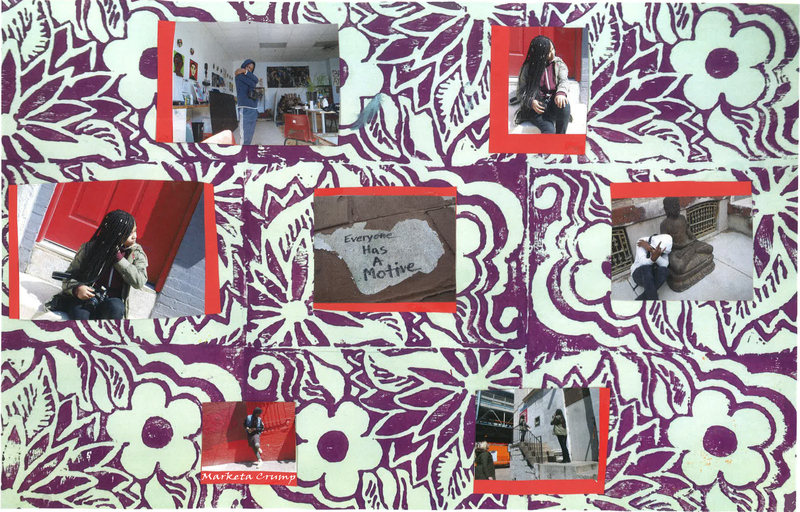 One group made a photobook with each student represented by a page of photos collaged over their prints. 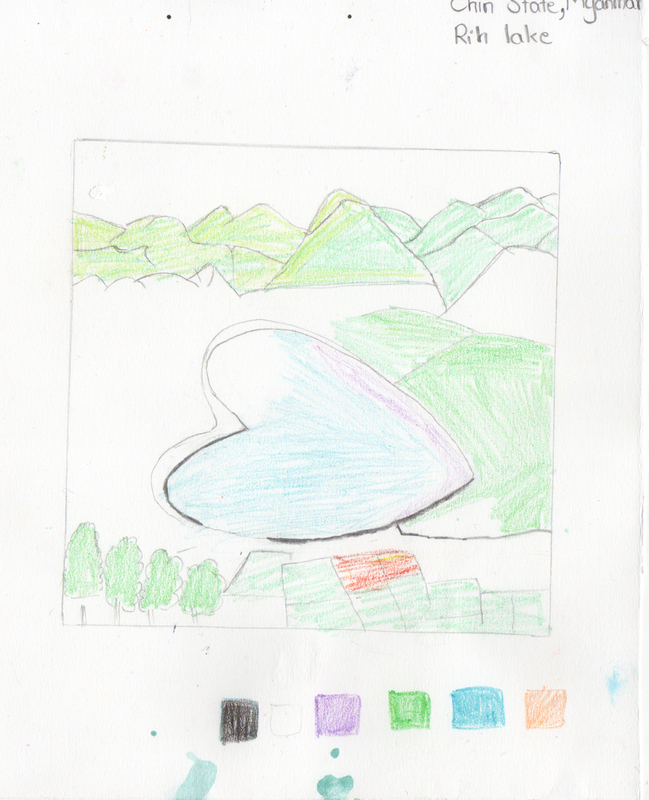 They made decisions about color, scale and placement. 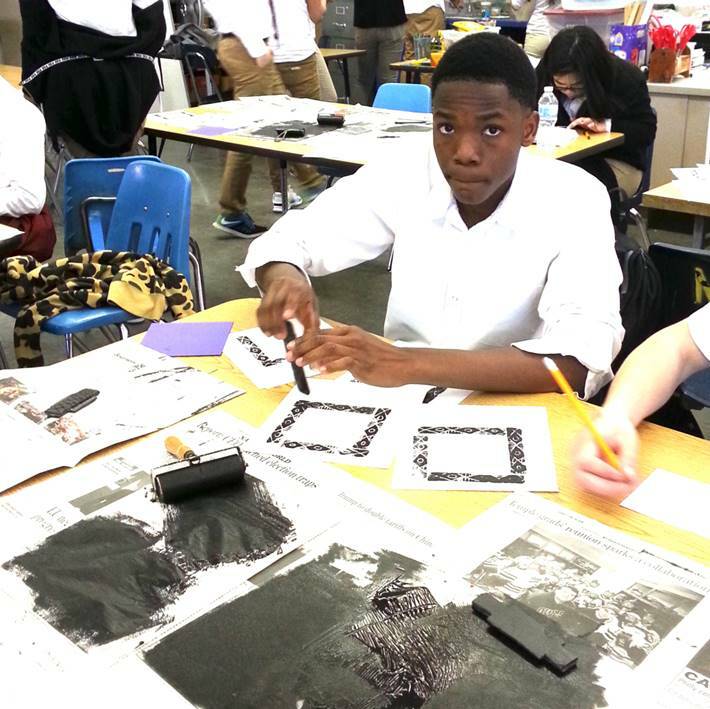 The other group aspired to photograph the entire ninth grade, and did so using their block prints as backdrops for the photographs. 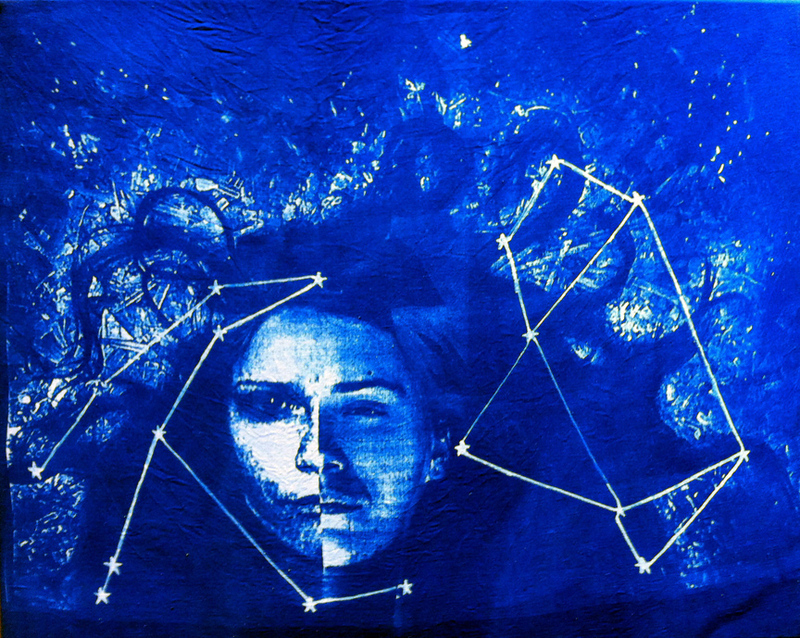 They exposed the portraits on small squares of cyanotype fabric and sewed them together to create a large wall hanging. 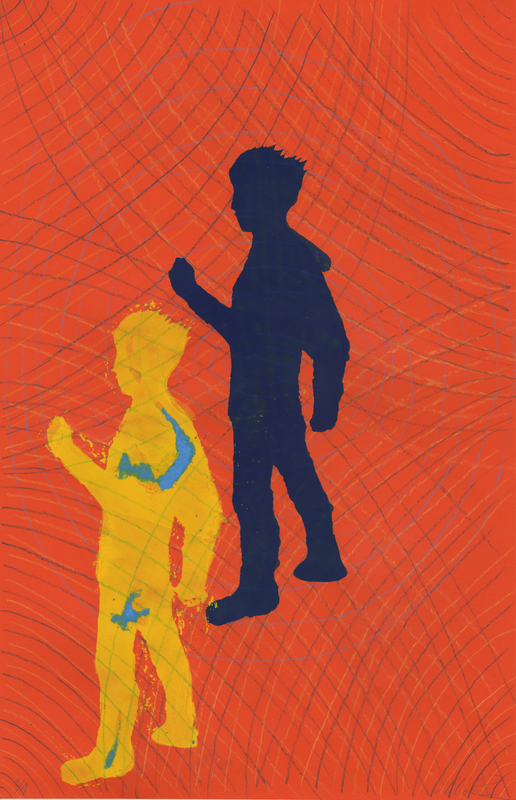 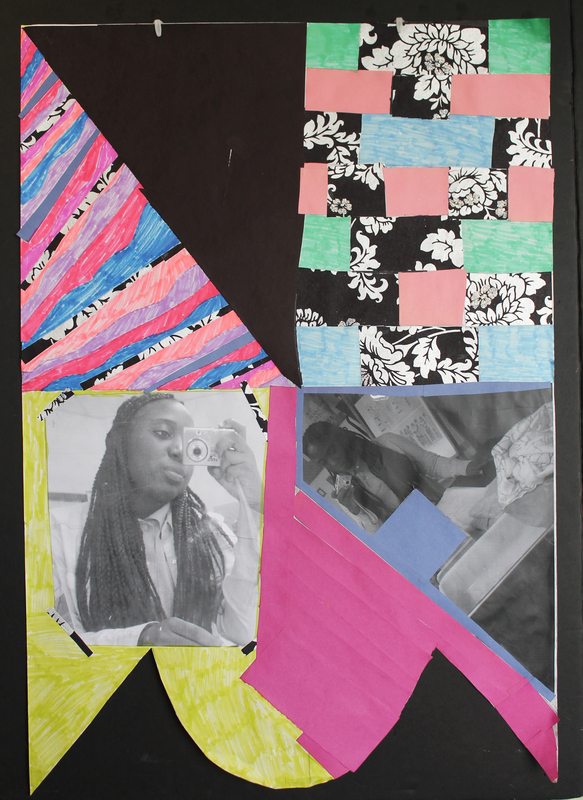 This became a portrait of the ninth grade as a whole and now hangs in a public space in the school. 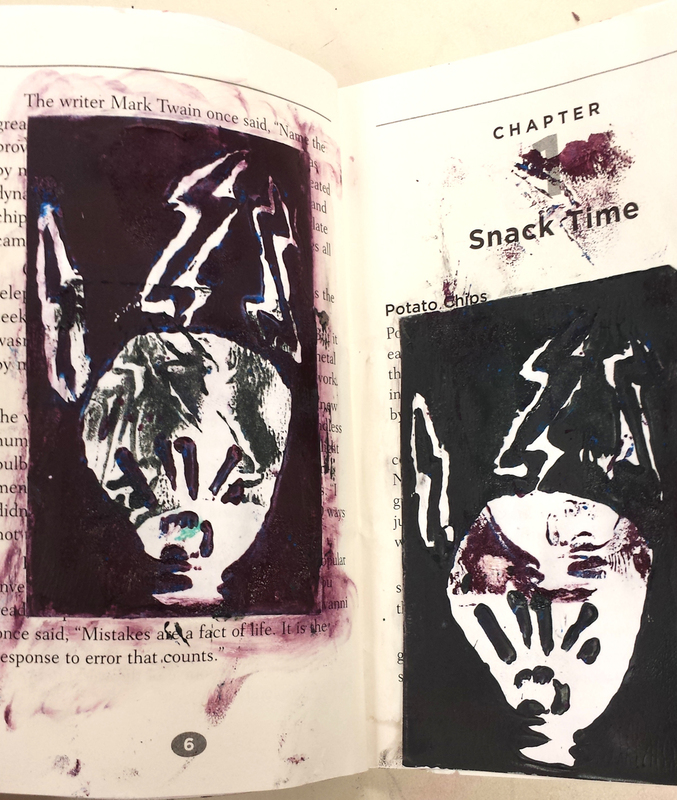 Inspired by the exhibitions By the Book Vol. 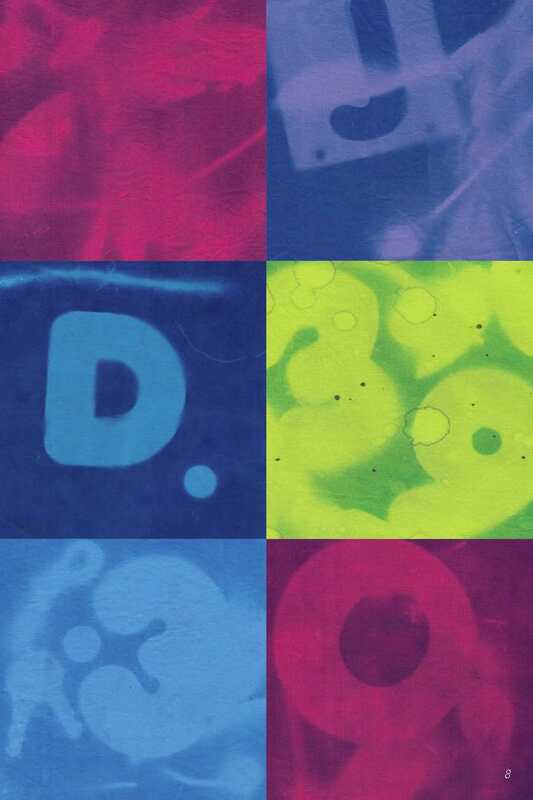 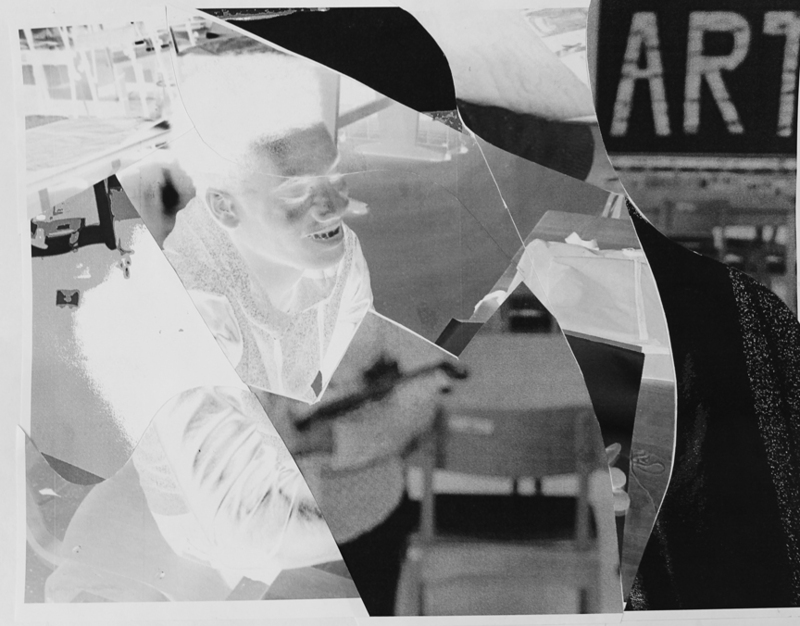 2: New Photography Publications and Collaborative Histories: Dieu Donné, two classes from the School of the Future investigated photography and papermaking. 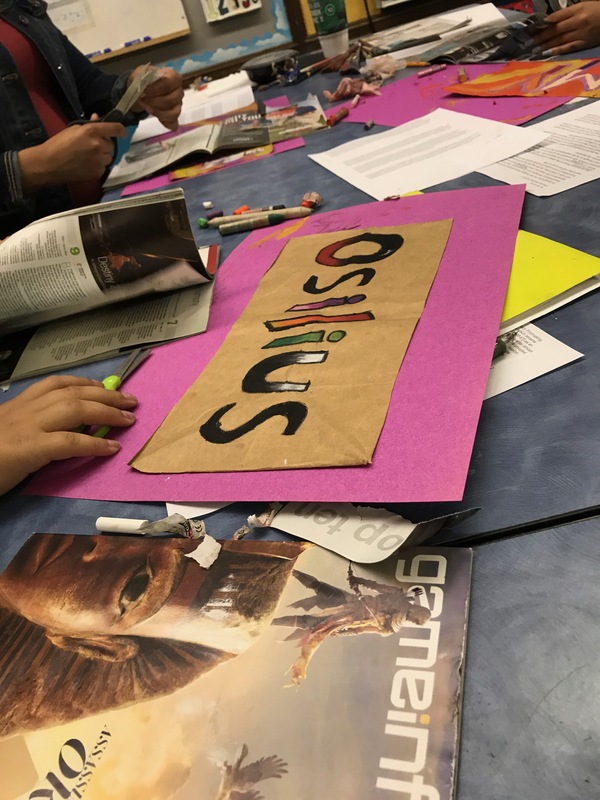 They engaged in storytelling workshops that began with discussions and creative writing prompts that in turn informed their artmaking. 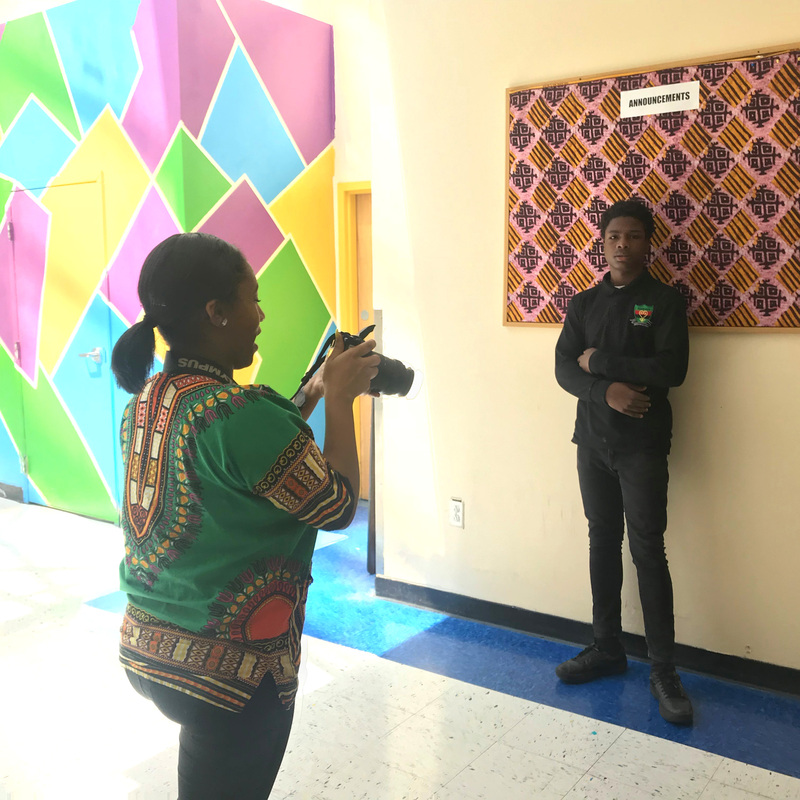 They took photographs during their everyday activities and then developed interactive story panels that reinforced their oral storytelling skills. 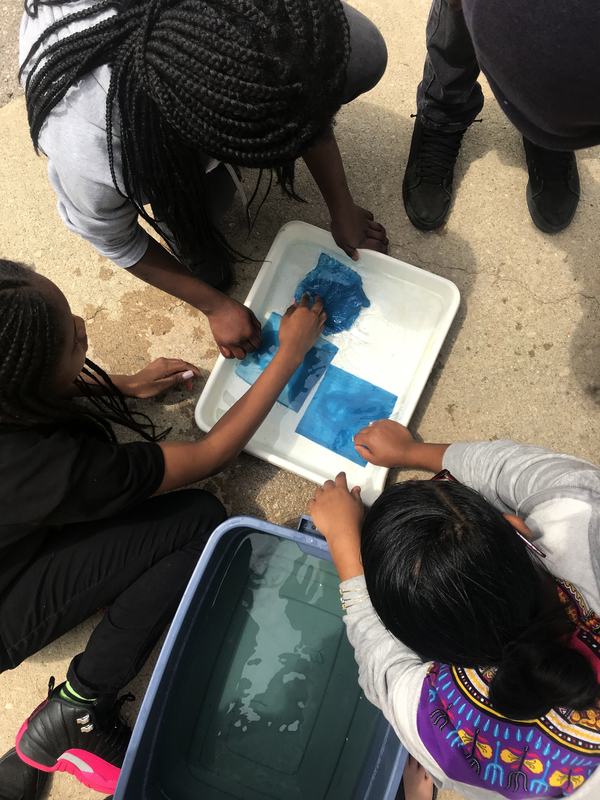 Students collected natural materials outdoors and used them to make paper. 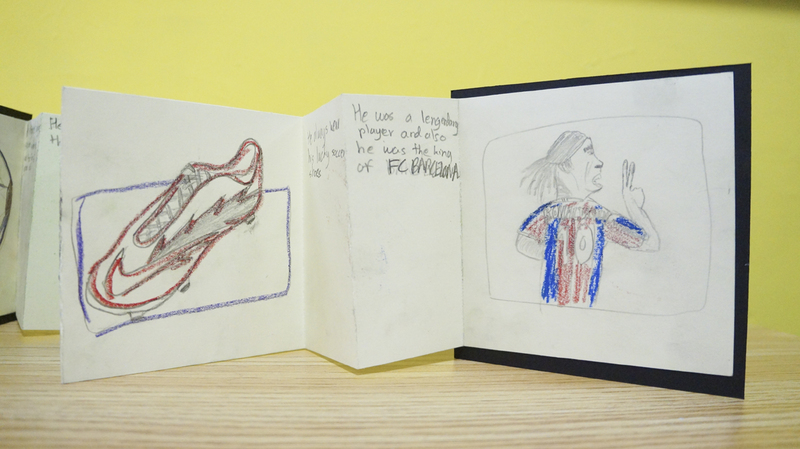 They incorporated their photographs and writings onto the paper they made. 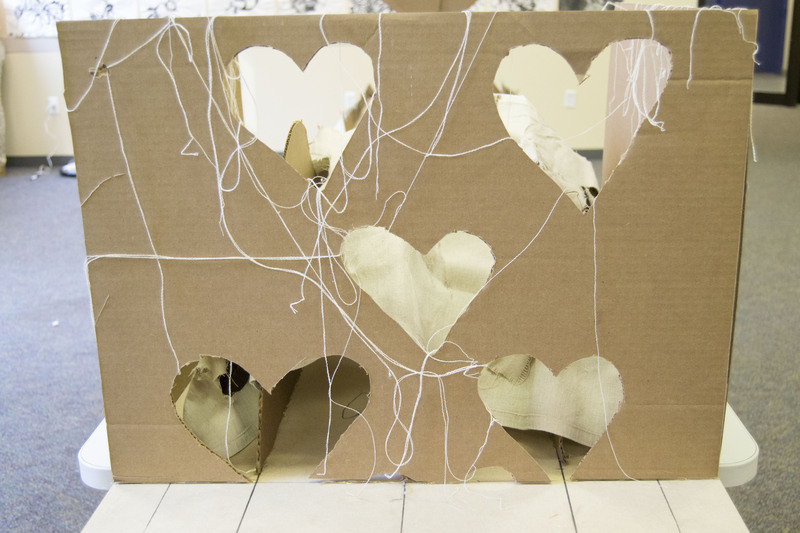 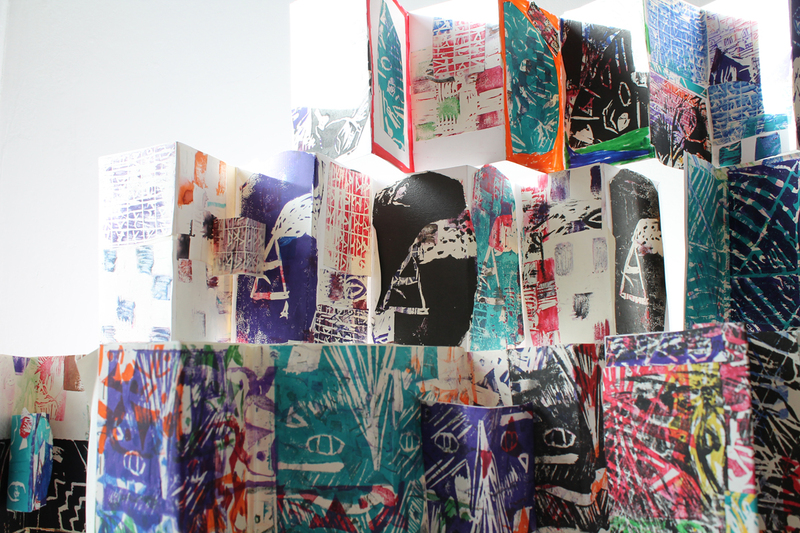 For the final project, the individual sheets of paper were combined to create a collaborative installation exploring the modularity which was displayed in one of the school’s common areas. 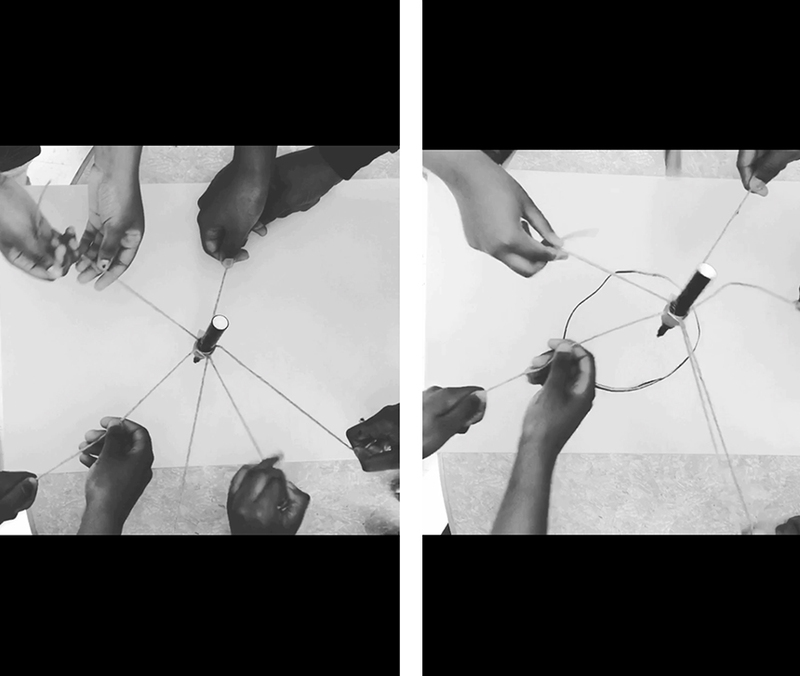 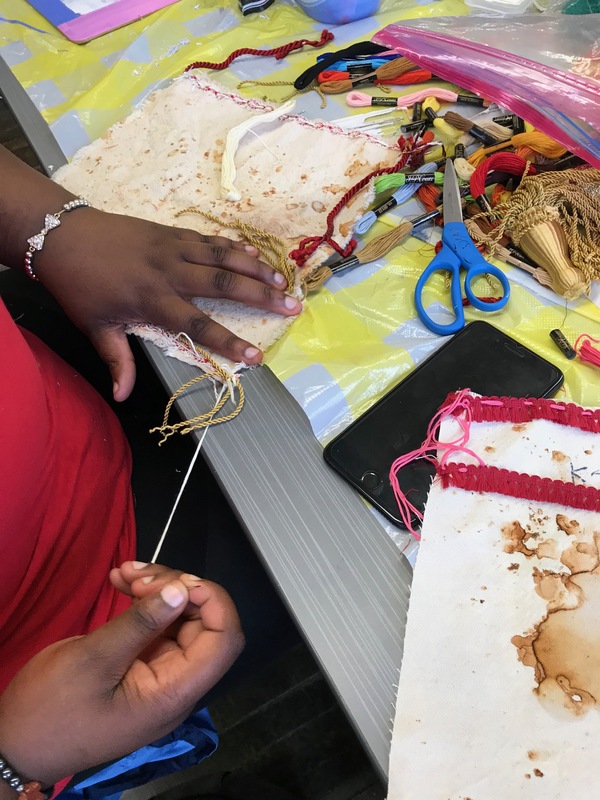 The central theme for this U School class project grew from an interest in experimental artmaking processes inspired by the exhibition Collaborative Histories: Dieu Donné. 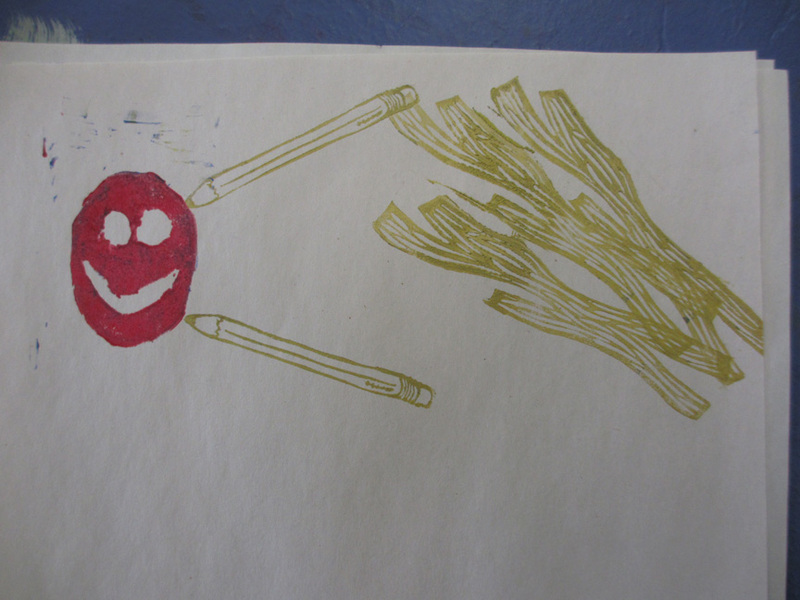 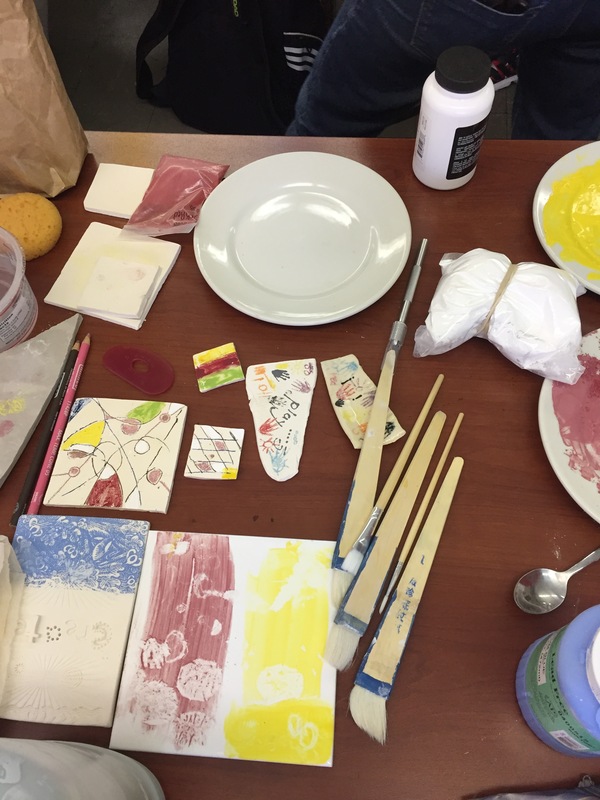 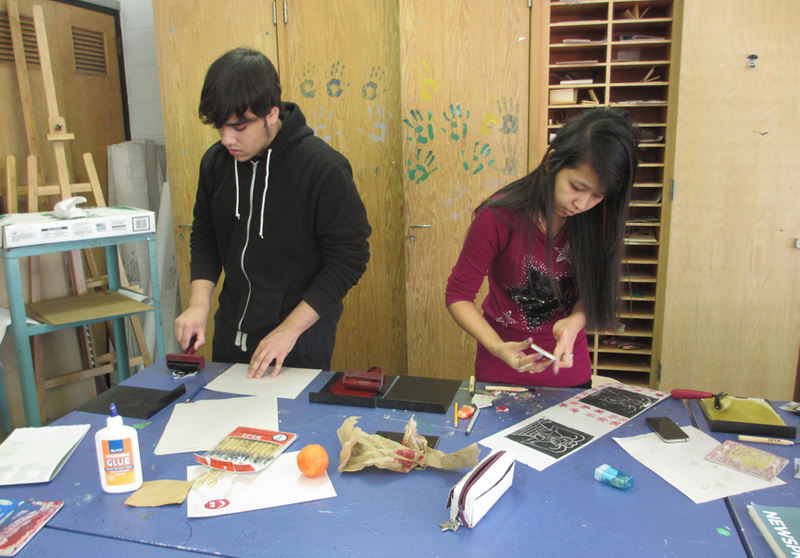 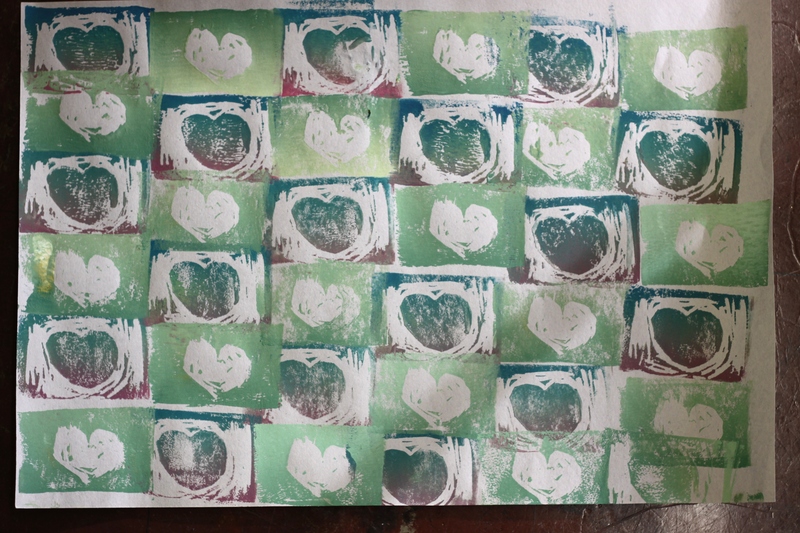 Students learned to incorporate basic, everyday materials into printmaking to create a variety of images. 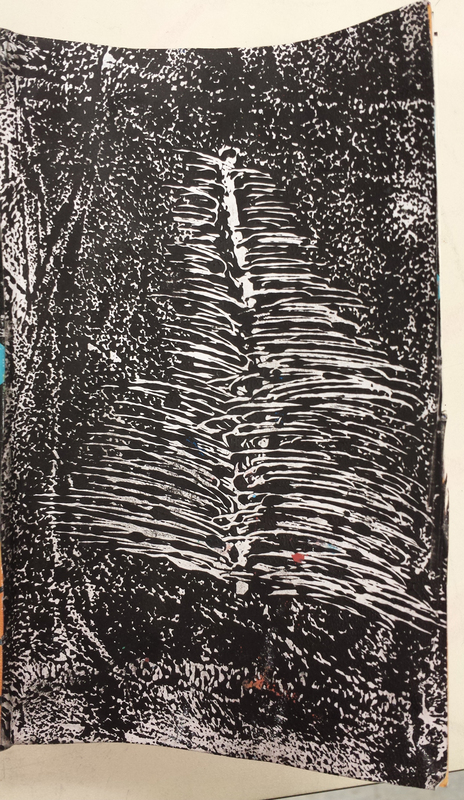 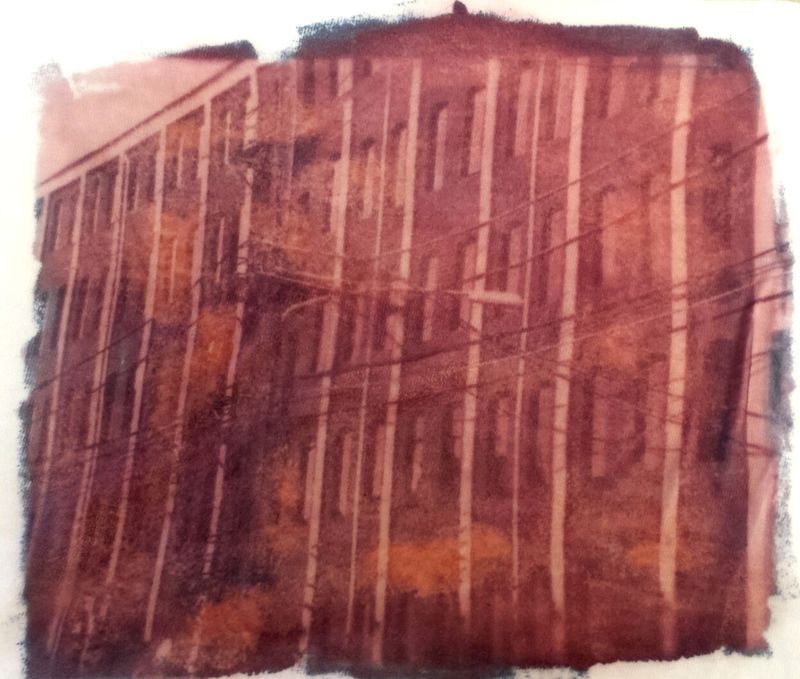 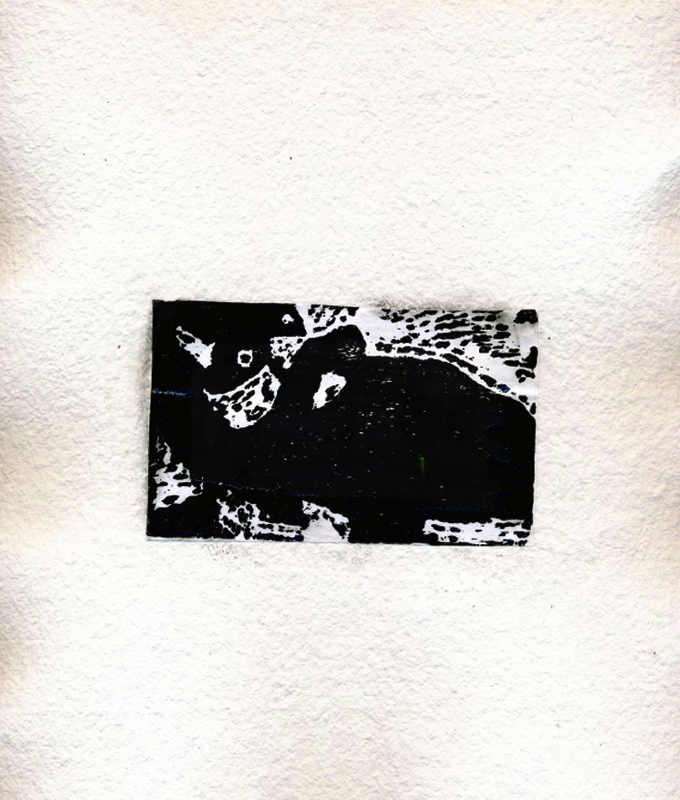 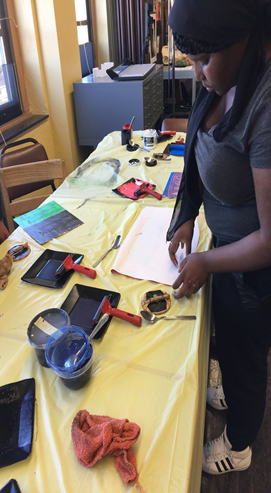 After working with some familiar printmaking techniques such as relief and monoprinting, students learned the photo-transfer process. 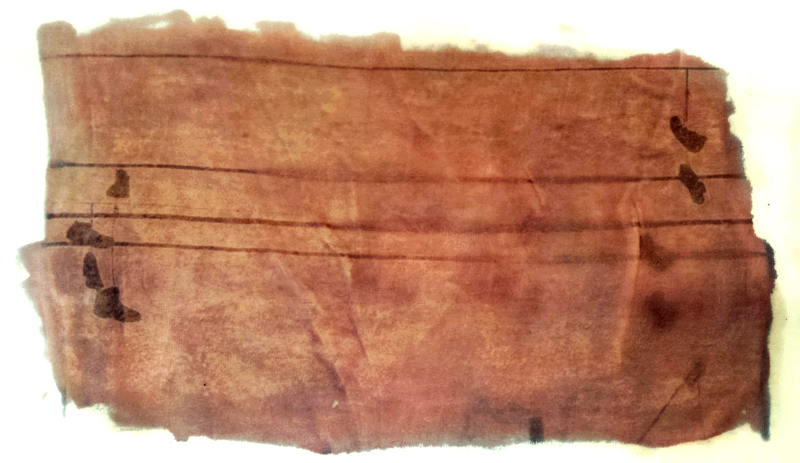 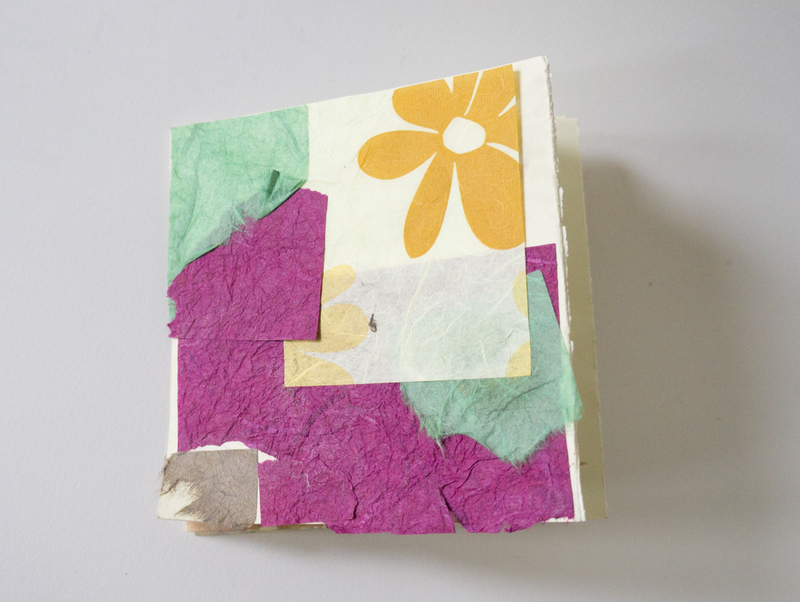 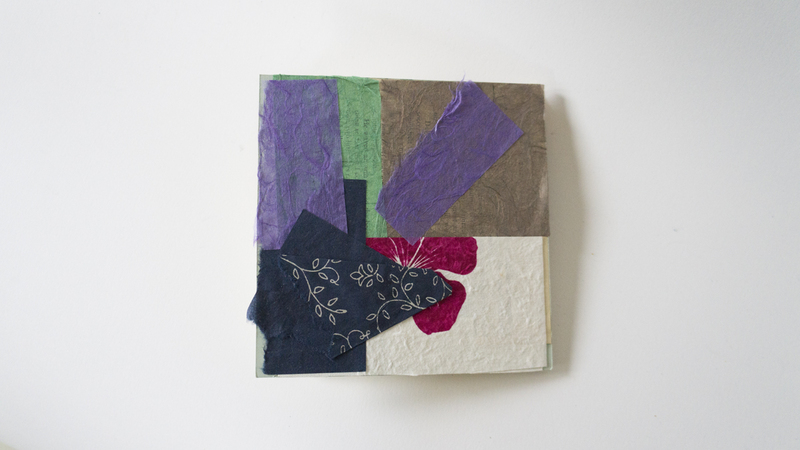 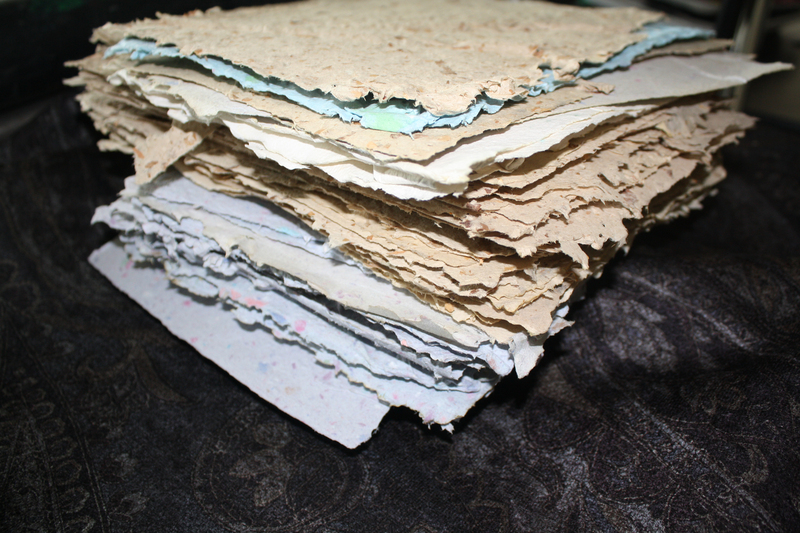 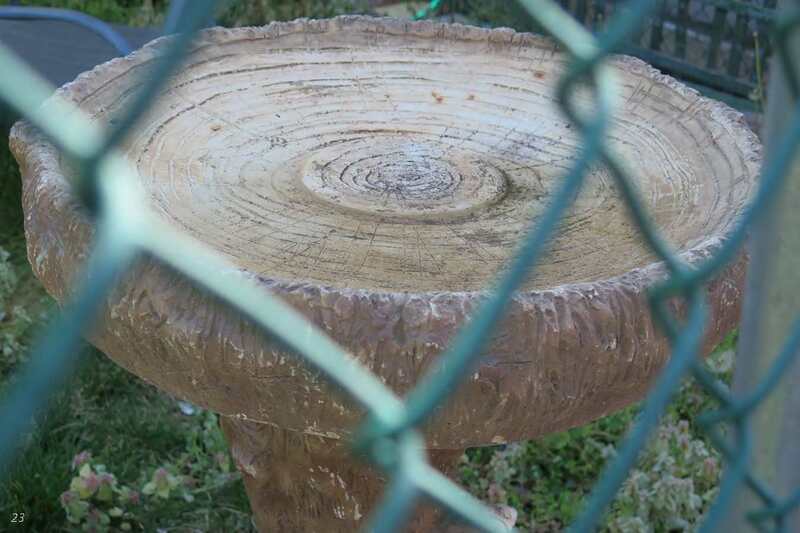 They created handmade paper to use as a surface for experimentation. 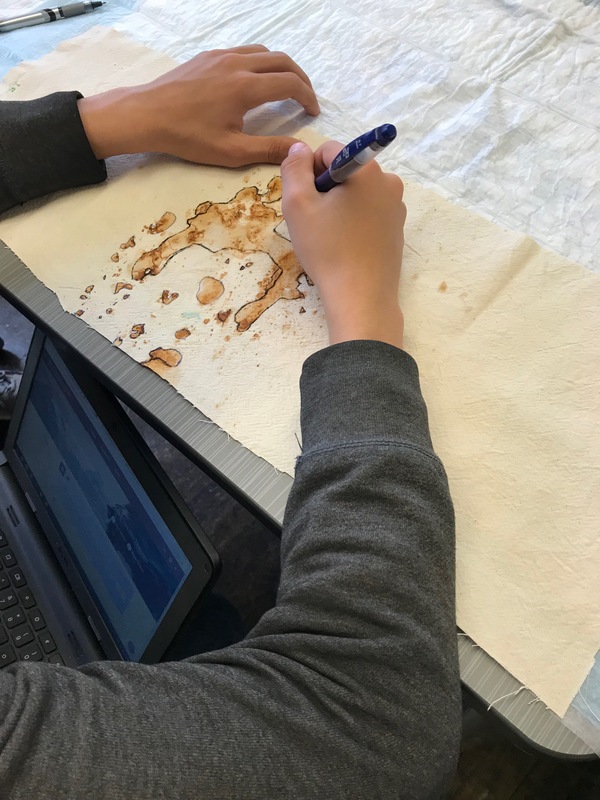 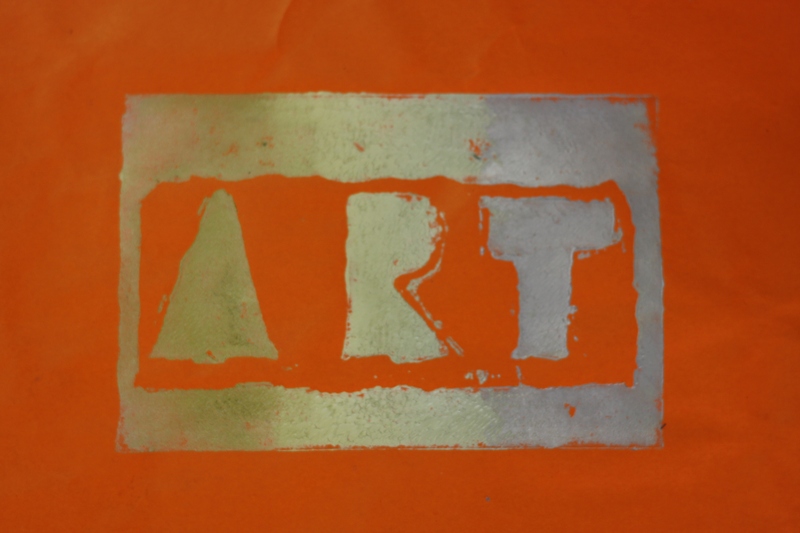 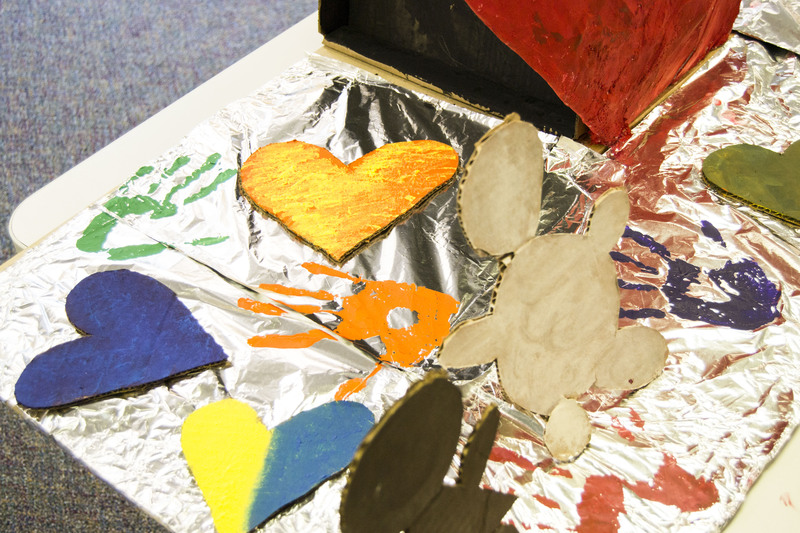 Students also used non art, metallic materials such as brillo pads, scrub sponges, screws, wires, washers, etc., to create abstract images formed by rust on large sheets of canvas. 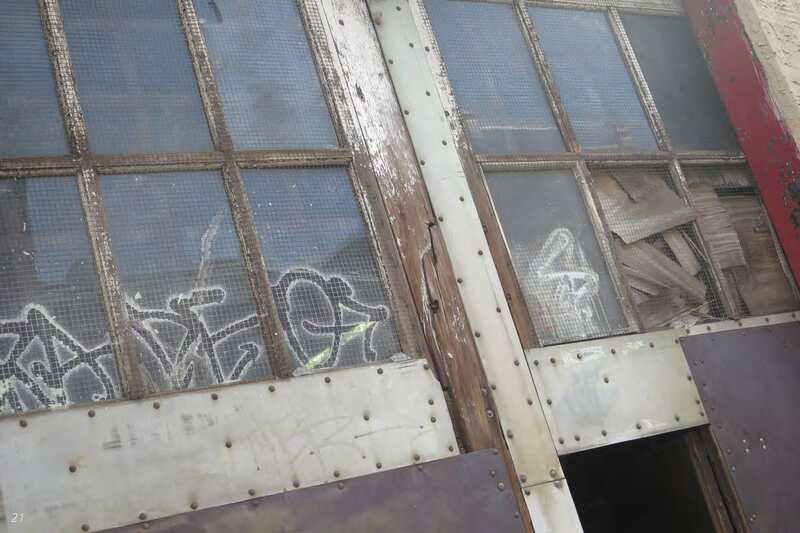 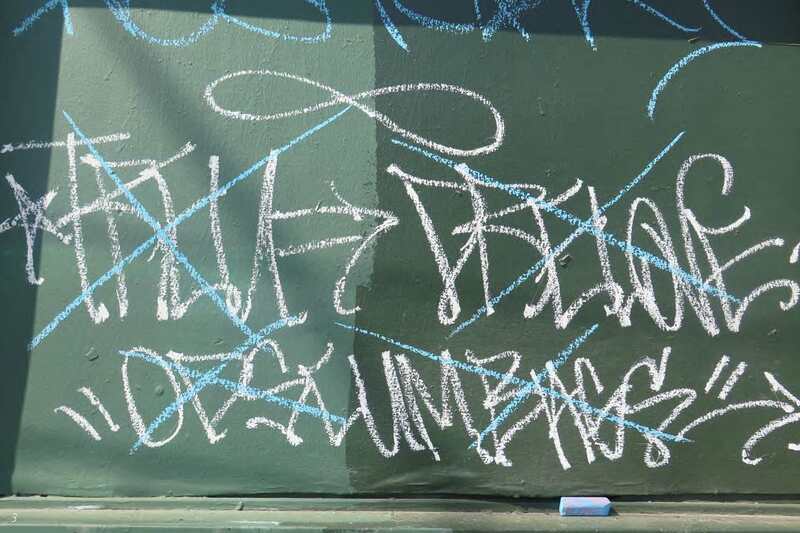 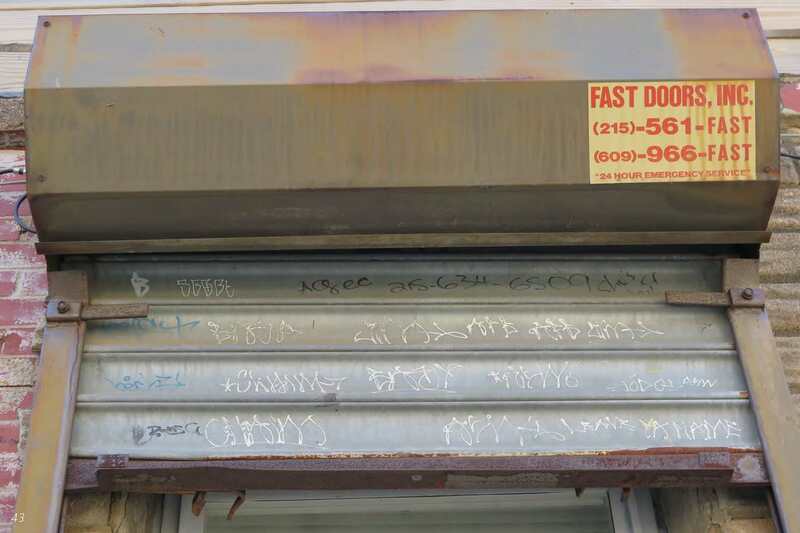 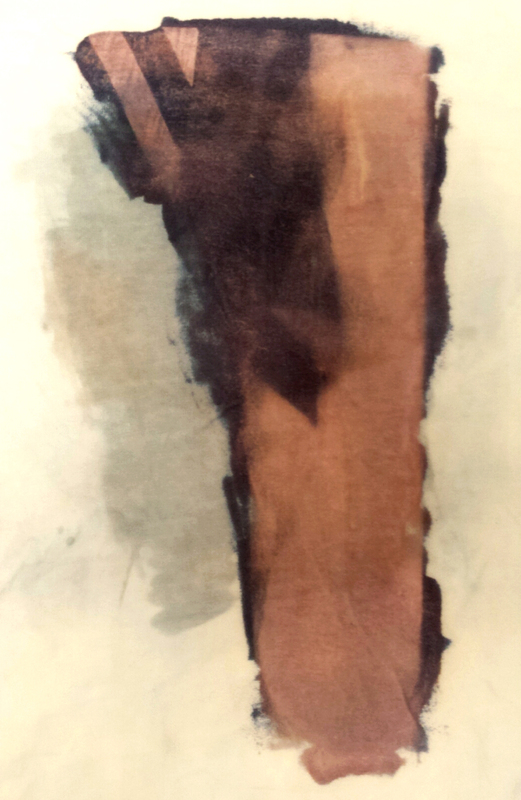 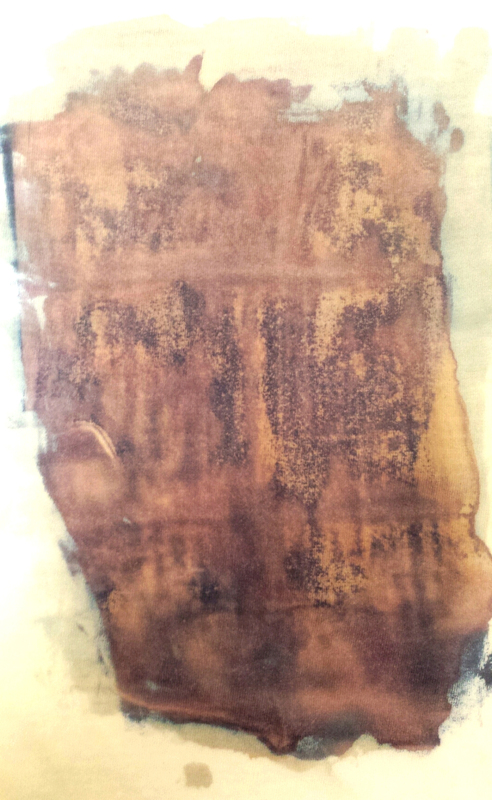 The students then drew around the basic forms that were created by the rust. 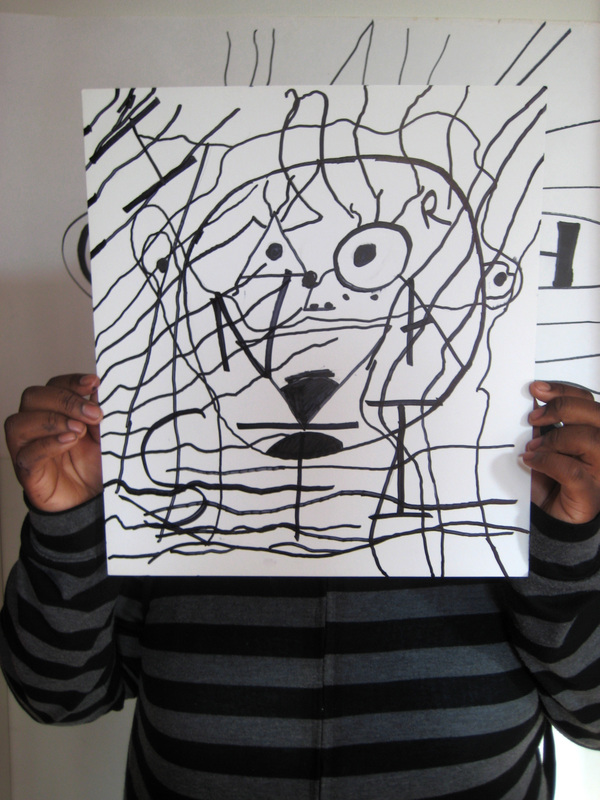 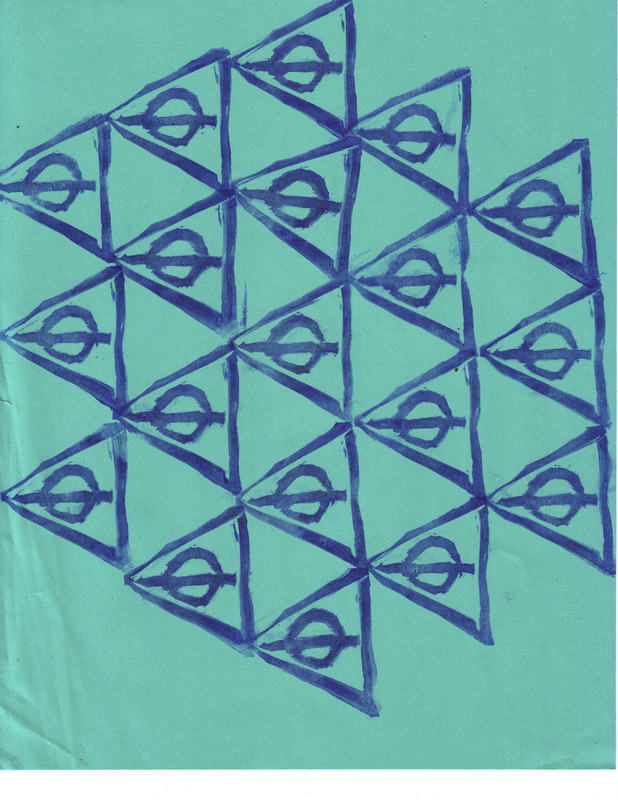 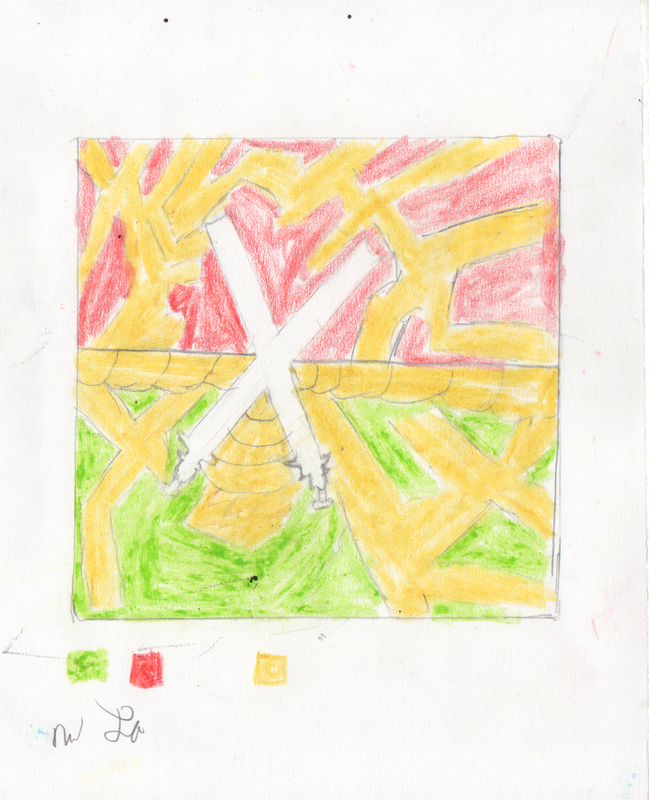 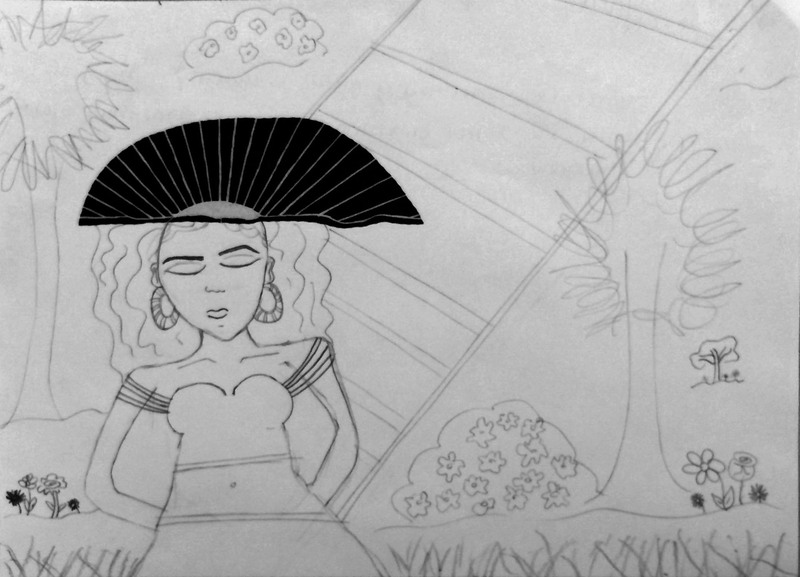 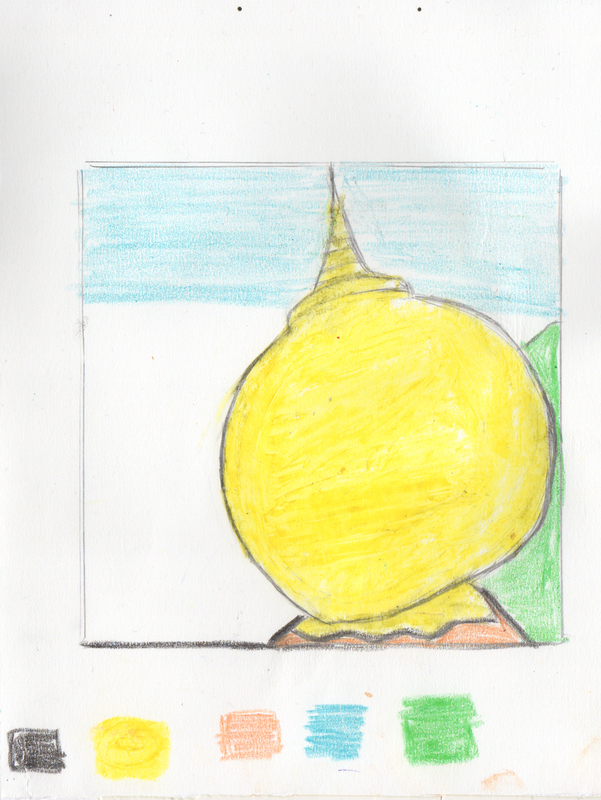 Some were very free with the drawing process and others followed the pattern more closely. 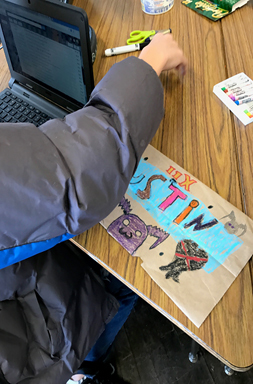 They continued by adding color using marker and paint. 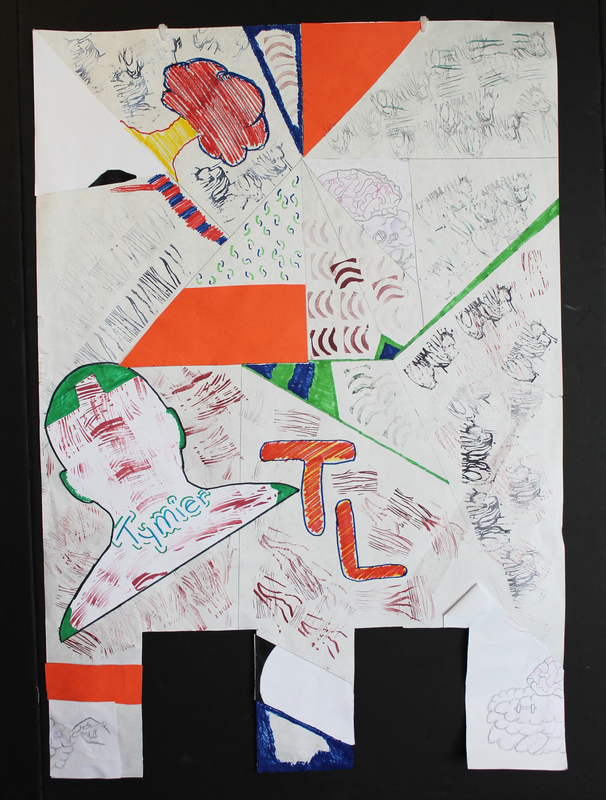 The final collaborative piece incorporated multiple canvas panels to create a visual map, narrated by the students. 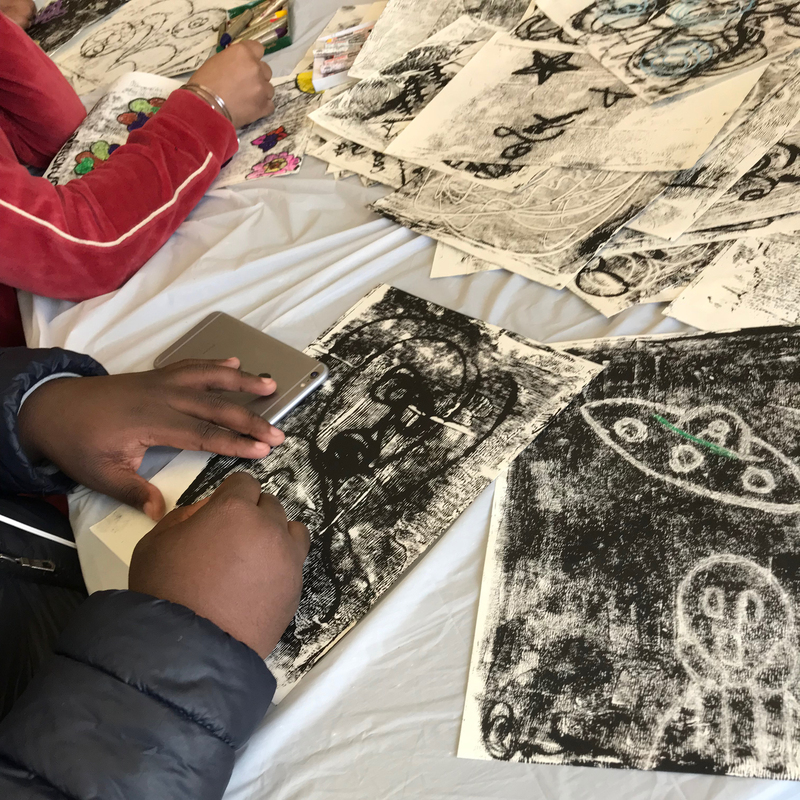 The fall 2017 Informed Curiosity curriculum was based on the prints of internationally renowned artist Martin Puryear and their role in informing his sculptural works as explored in The Print Center’s exhibition Martin Puryear: Prints, 1962 – 2016. 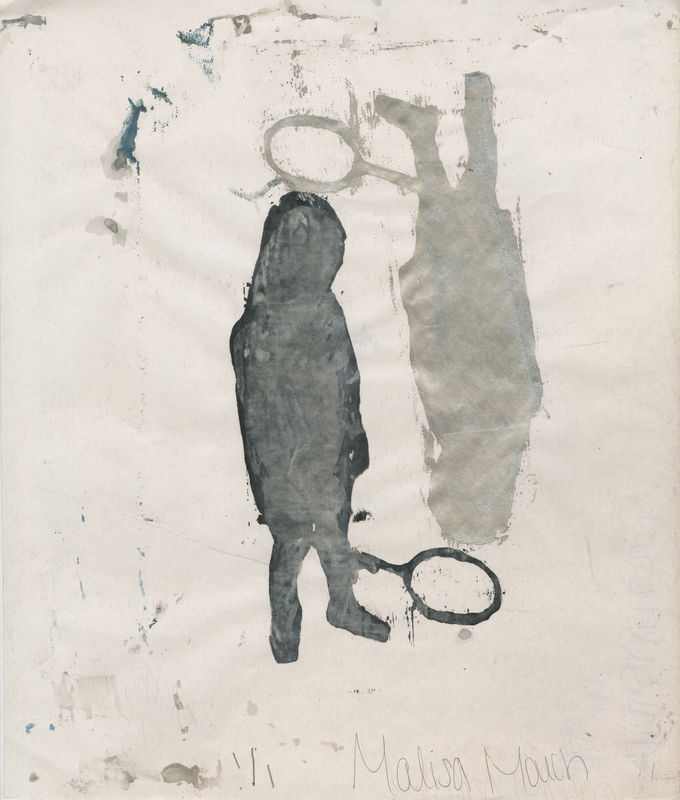 The show offered an in-depth investigation of the printed works created from 1962 to 2016. 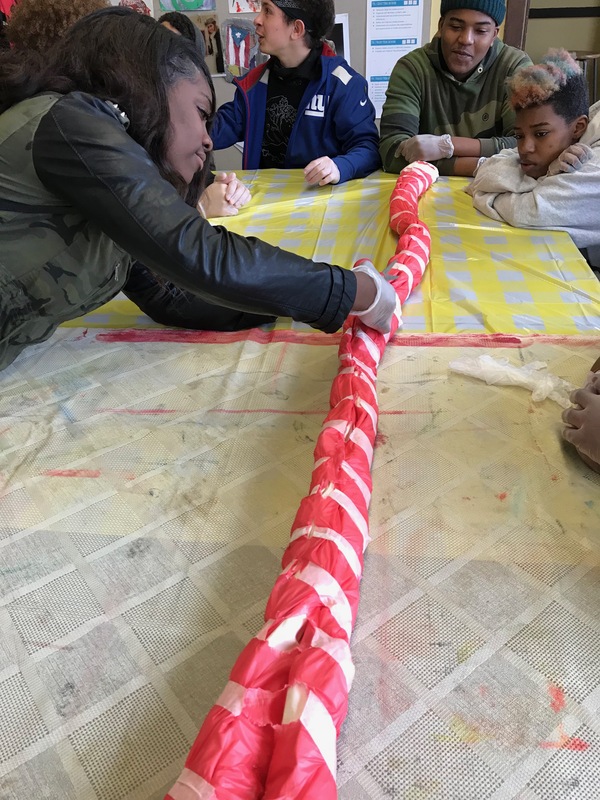 Students were introduced to Puryear’s early figurative works, which were influenced by his time spent in Africa as a Peace Corp volunteer through his recently created, large abstractions. 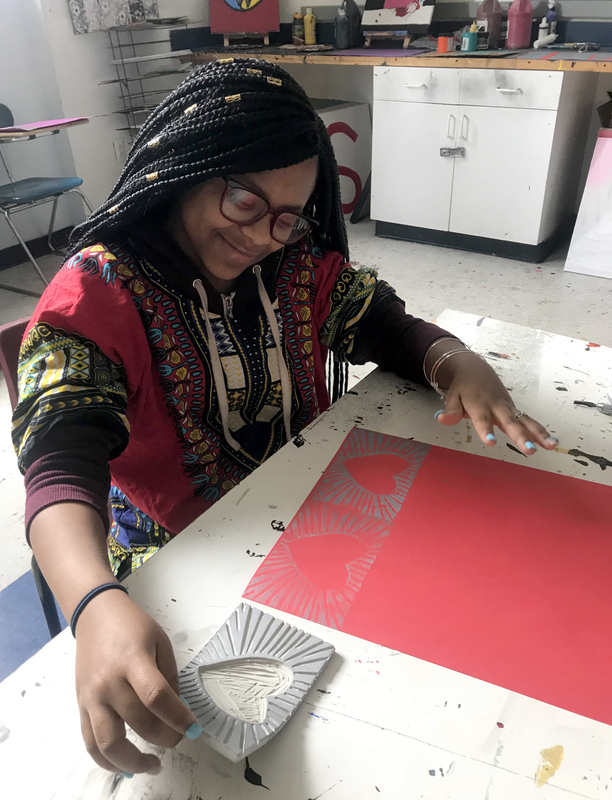 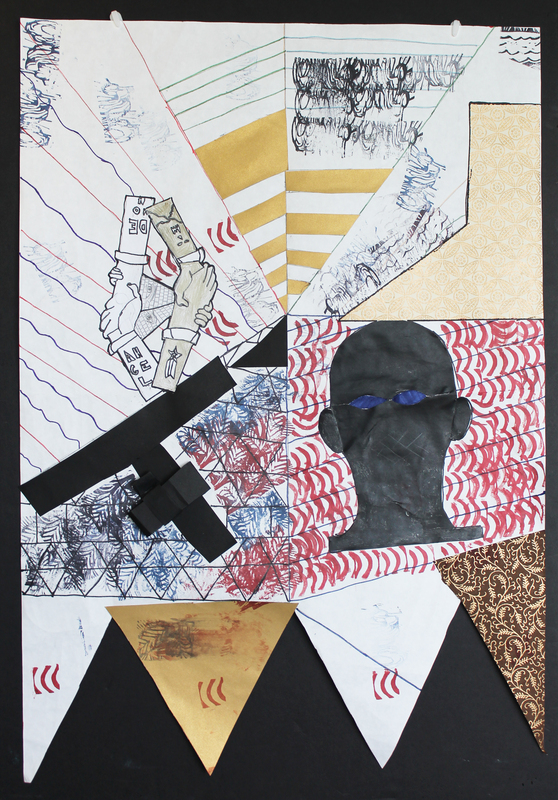 They were encouraged to explore themes of identity, African American history, symbolism and abstraction through printmaking, photography and three-dimensional design. 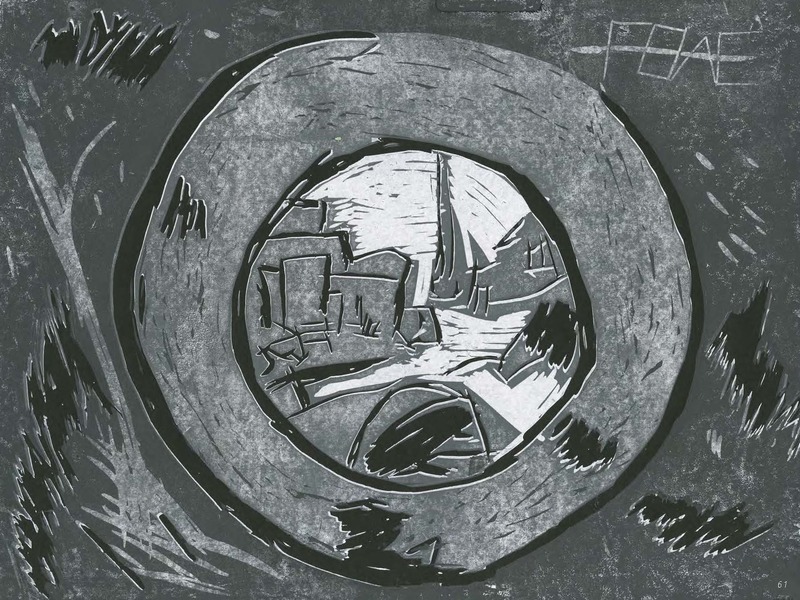 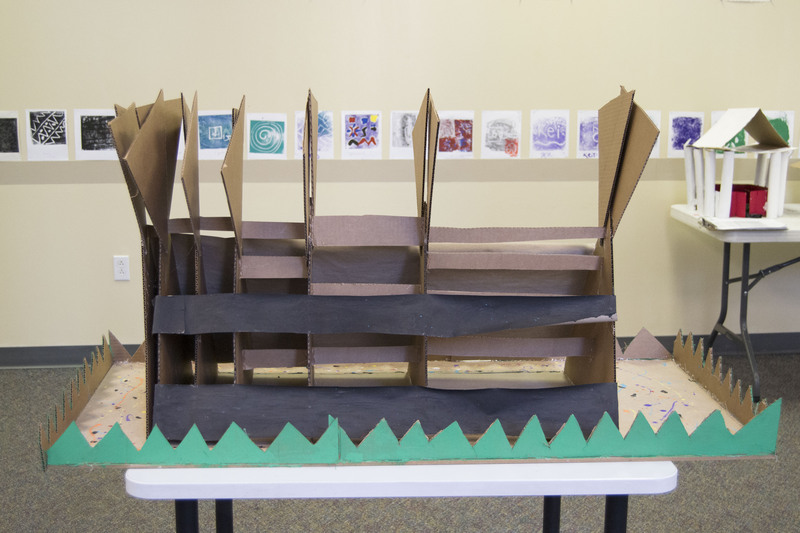 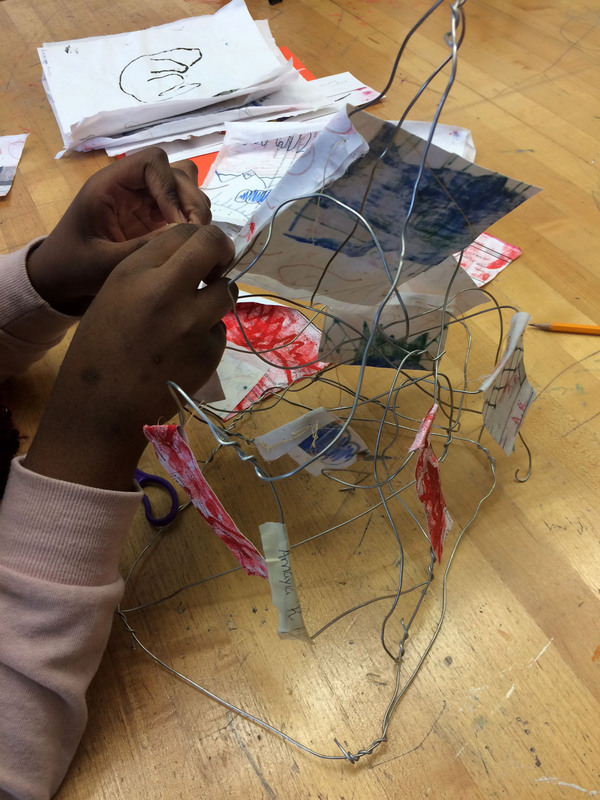 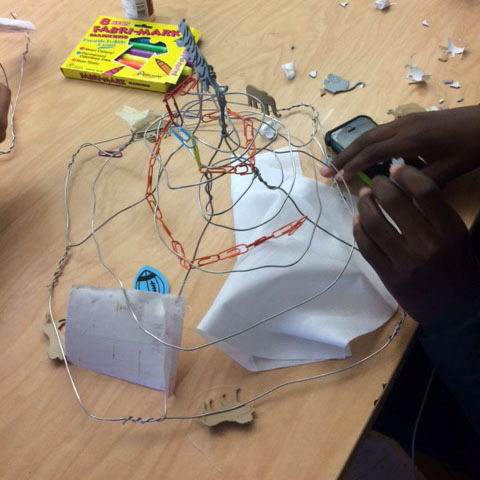 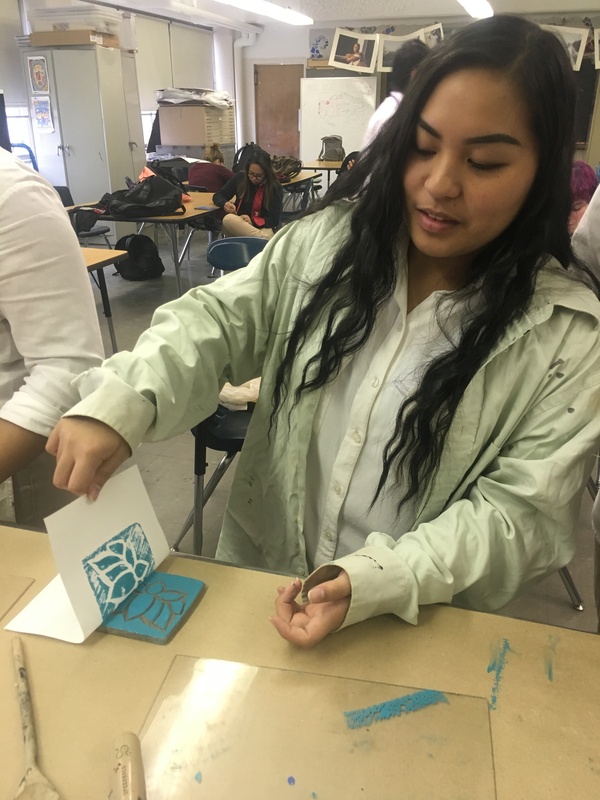 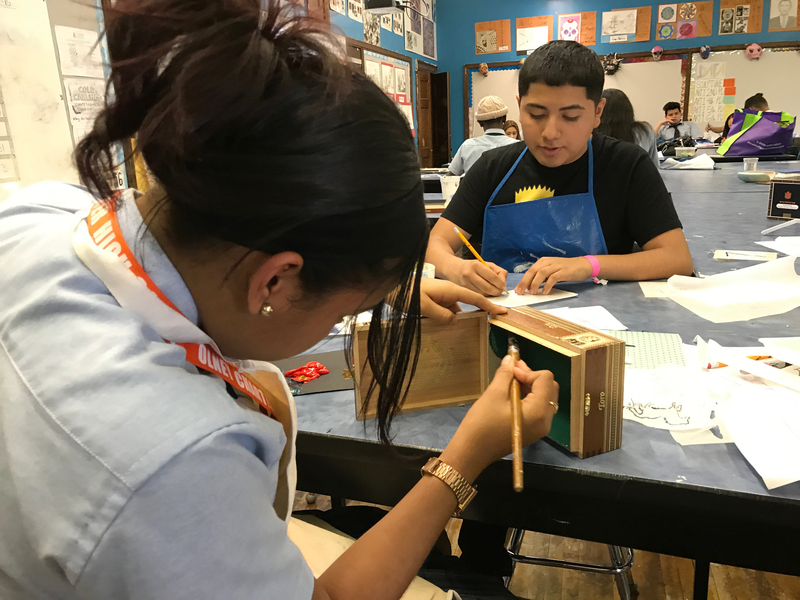 An architecture class from the Charter High School for Architecture + Design completed projects in printmaking, sculpture and public art influenced by the works of Martin Puryear. 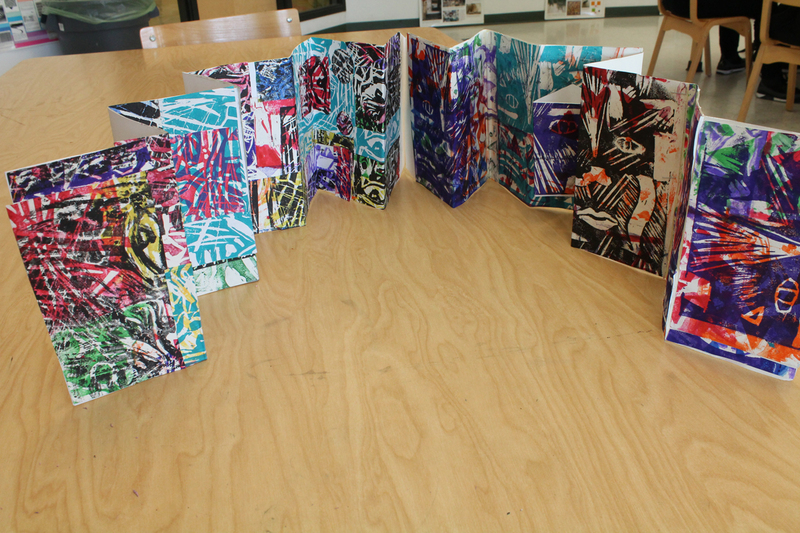 Student projects included monoprinting and experimentation with other media to interpret and make abstract art. 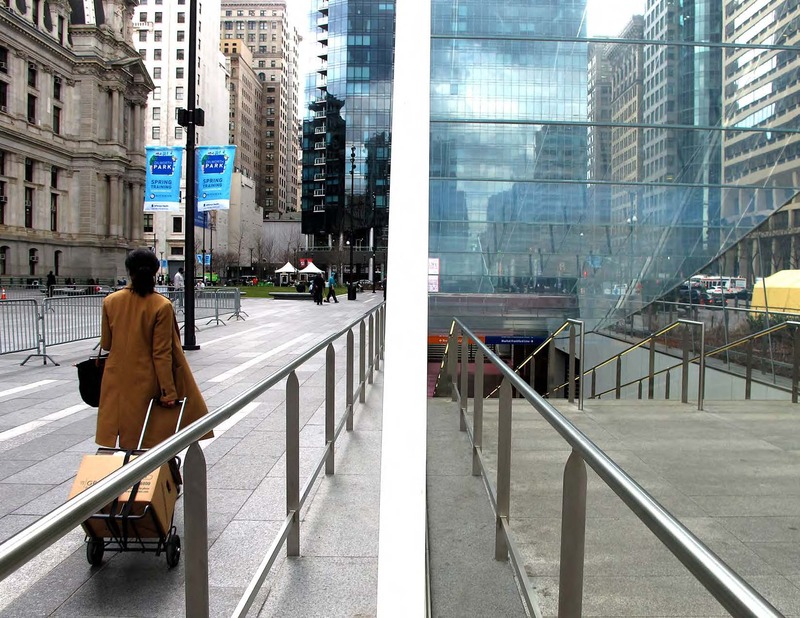 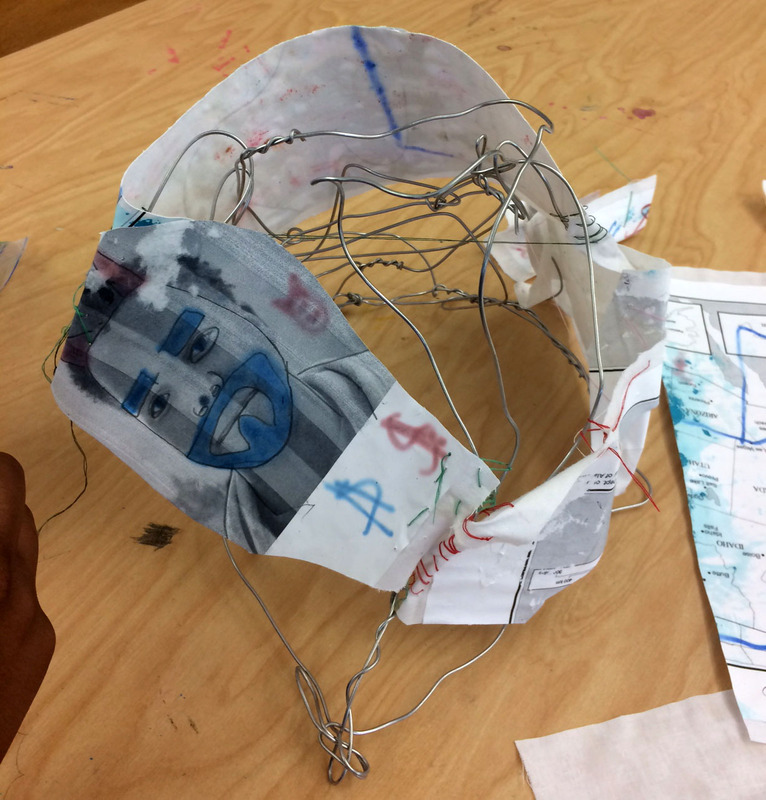 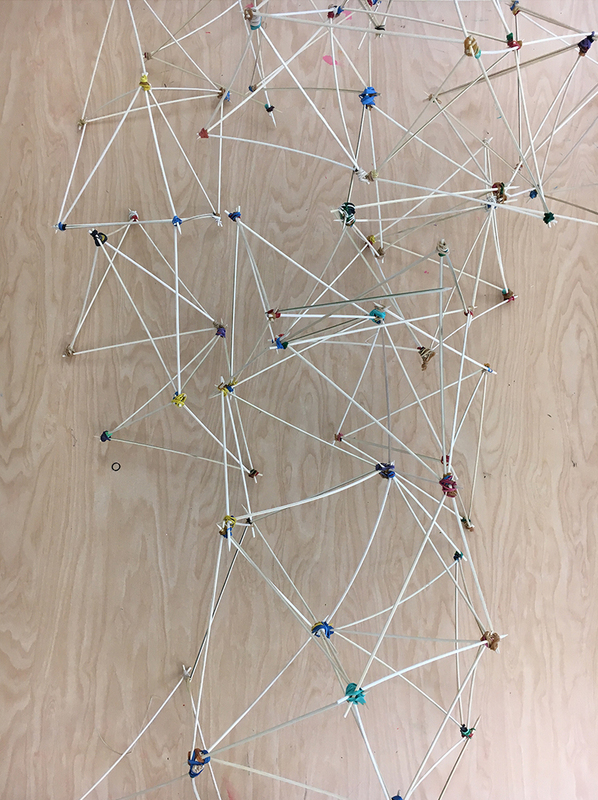 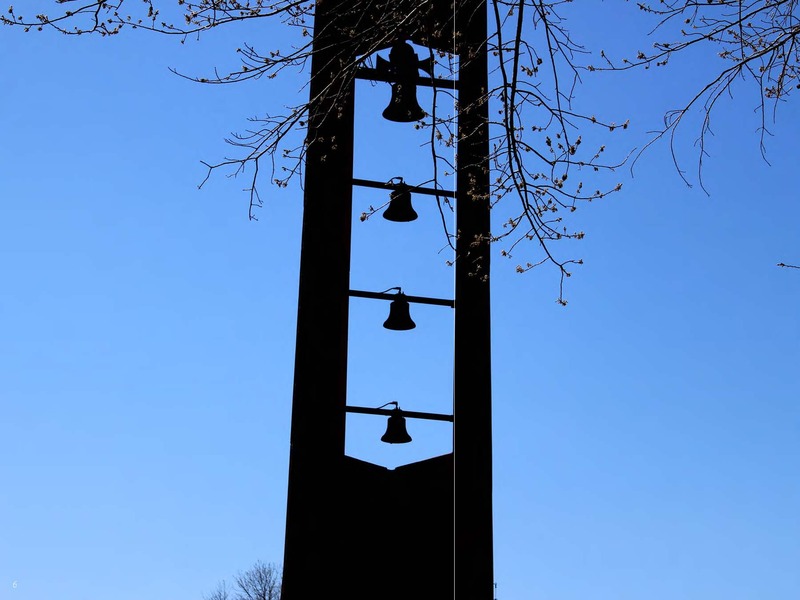 Inspired by a field trip to Puryear’s monumental public sculpture Big Bling, the final group project explored the design of public artworks that addressed issues like inclusion and homelessness. 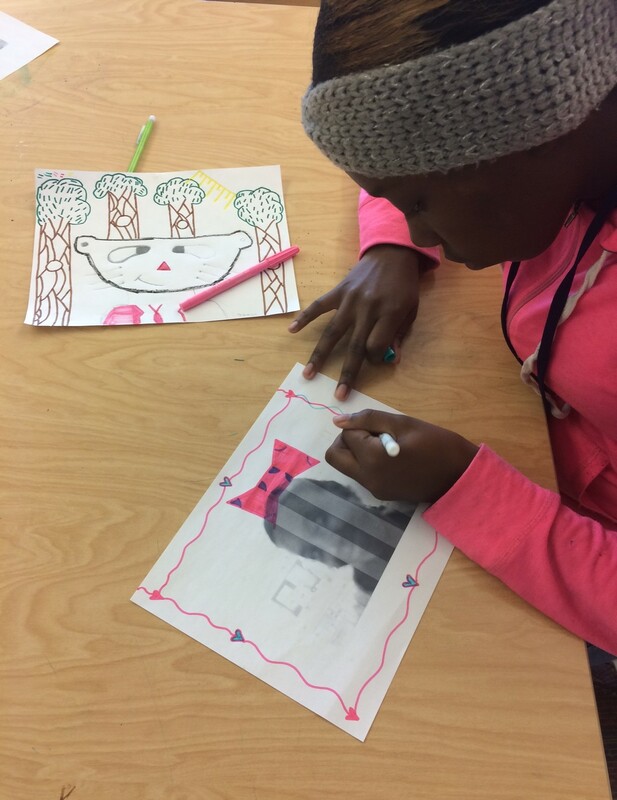 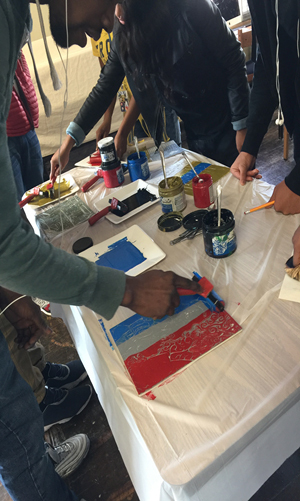 Graphic design students at the Charter High School for Architecture + Design learned techniques in printmaking, collage and image manipulation which they used to interpret themes that emerged from the exhibition Martin Puryear: Prints, 1962-2016. 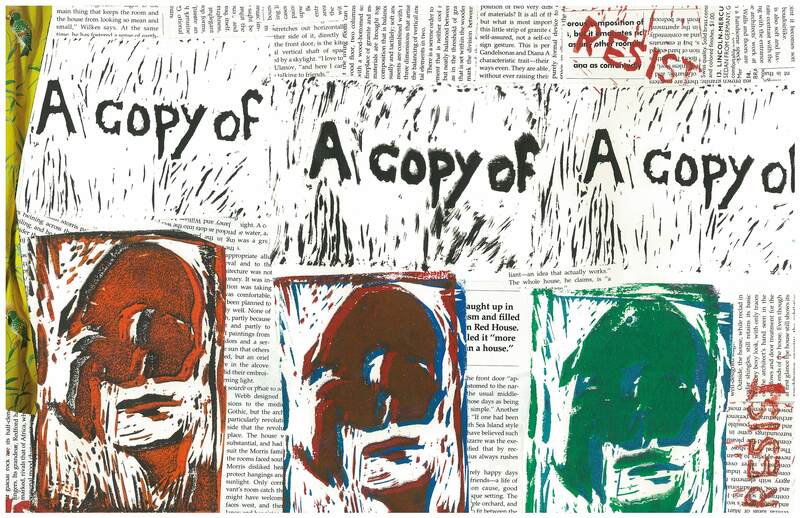 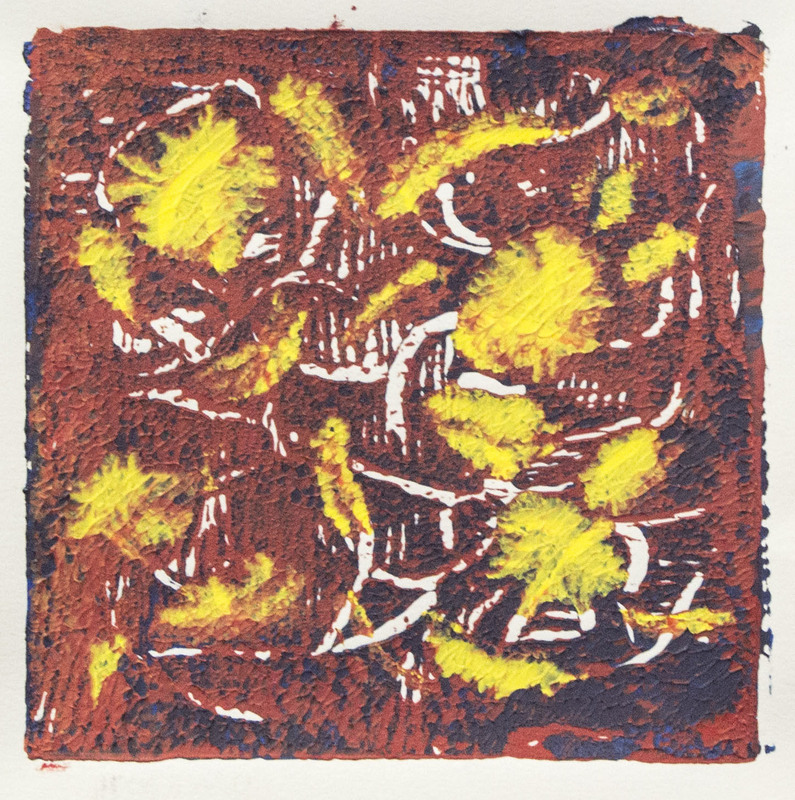 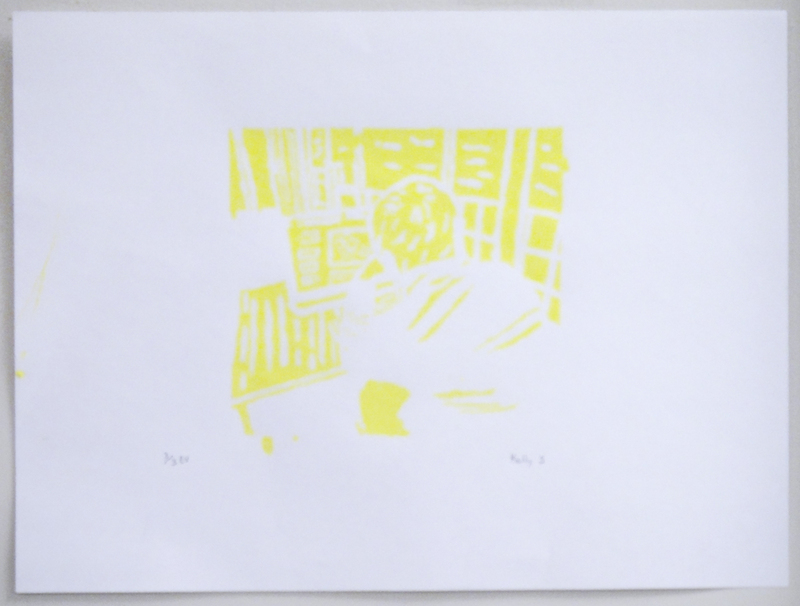 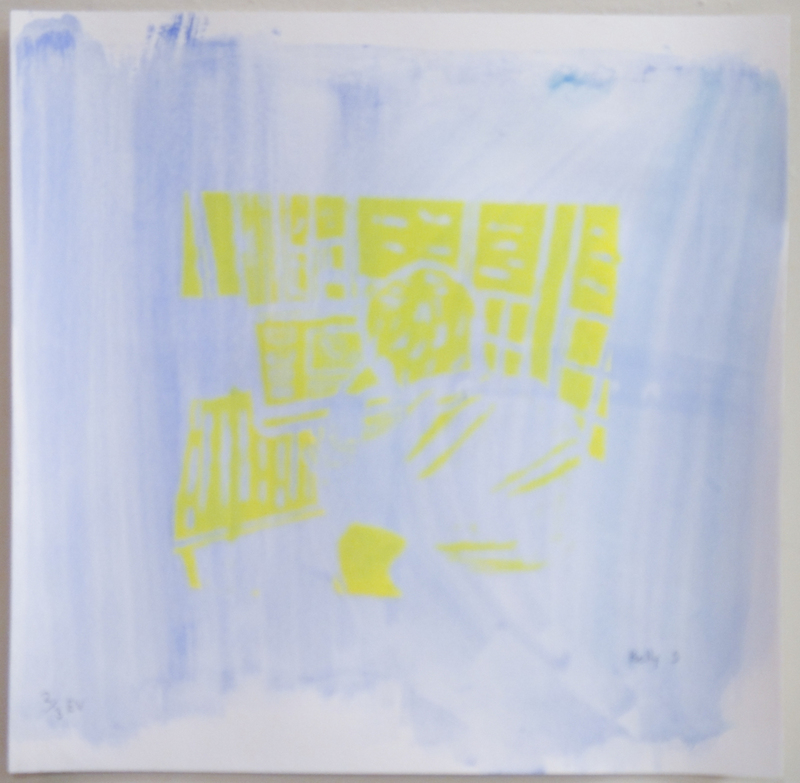 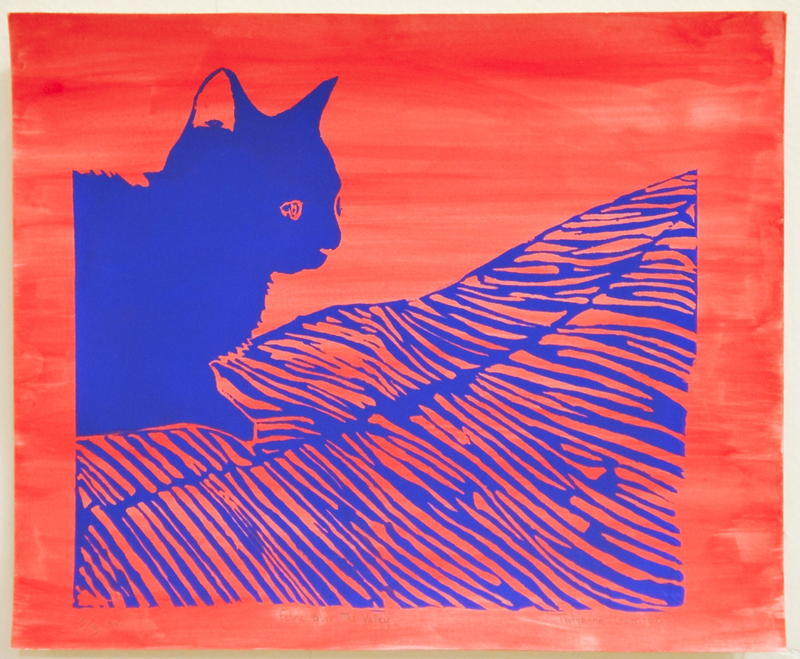 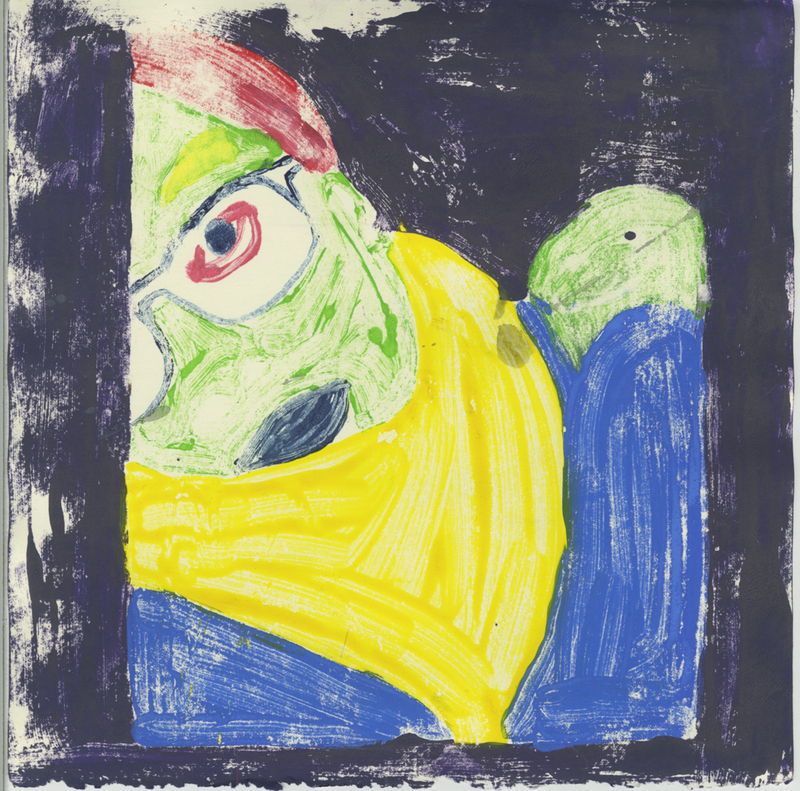 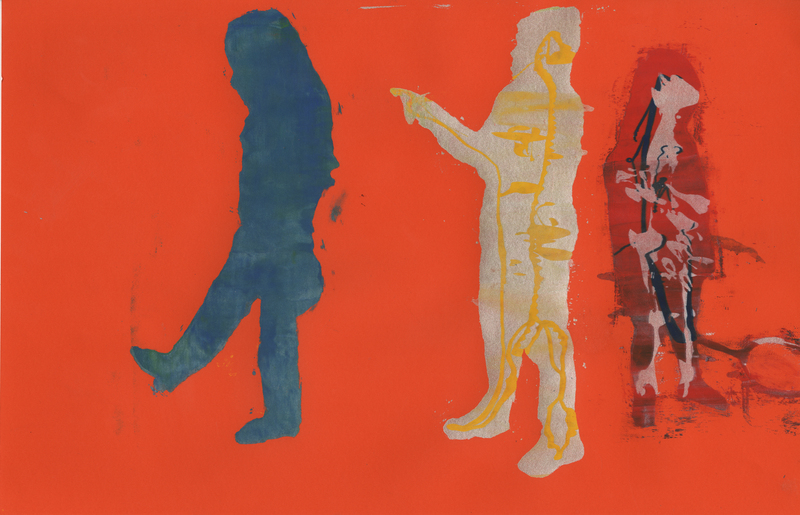 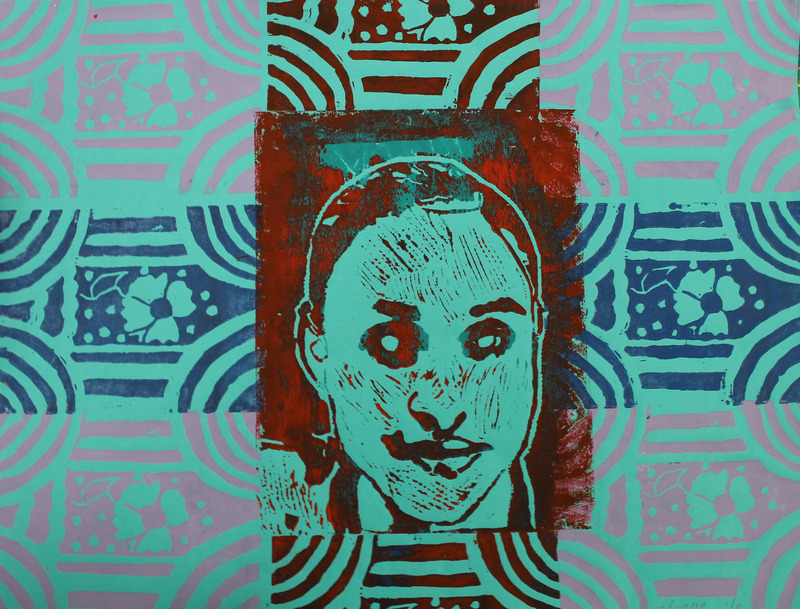 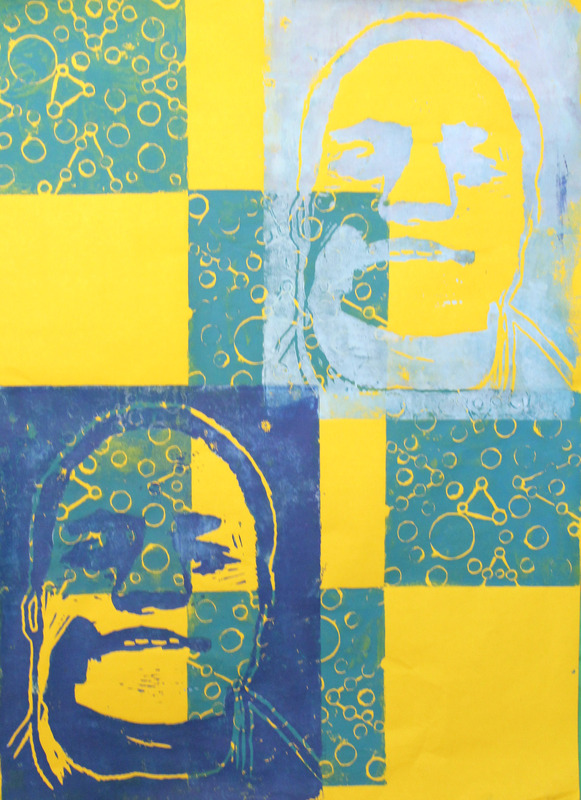 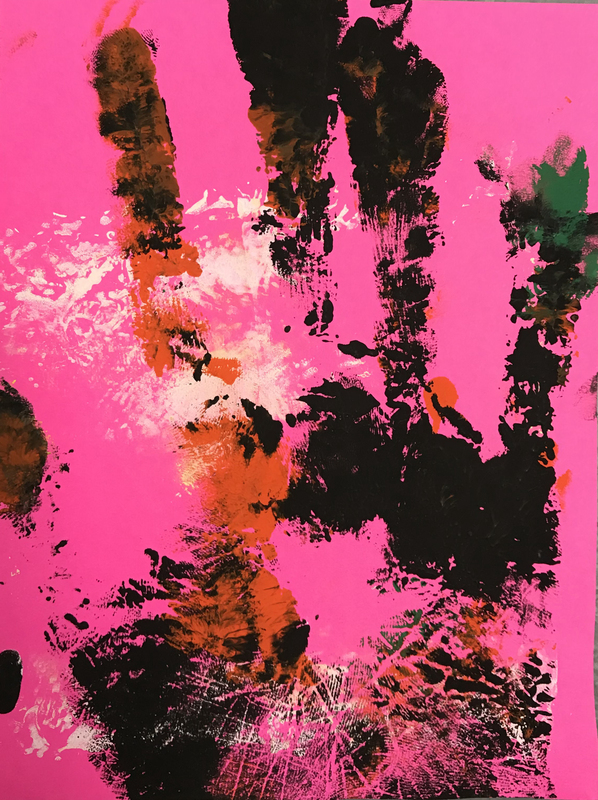 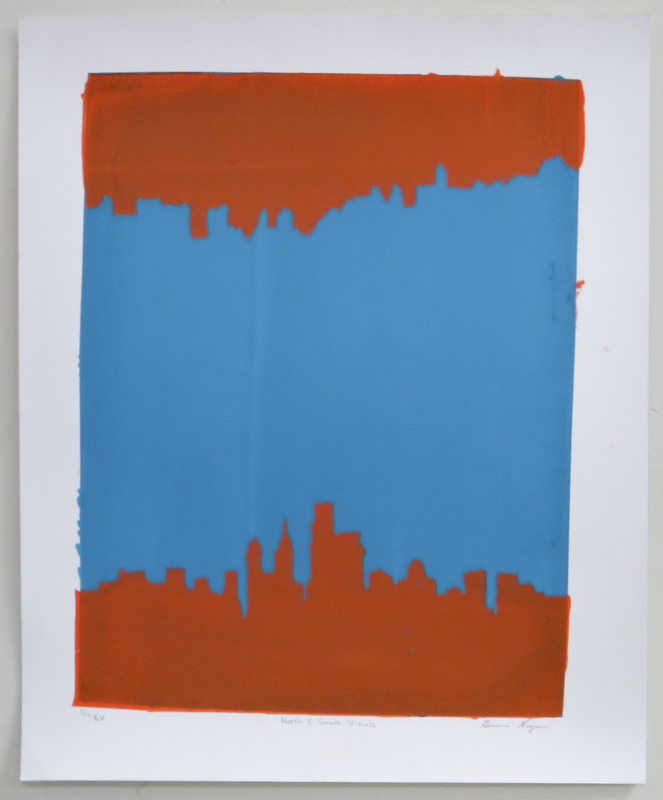 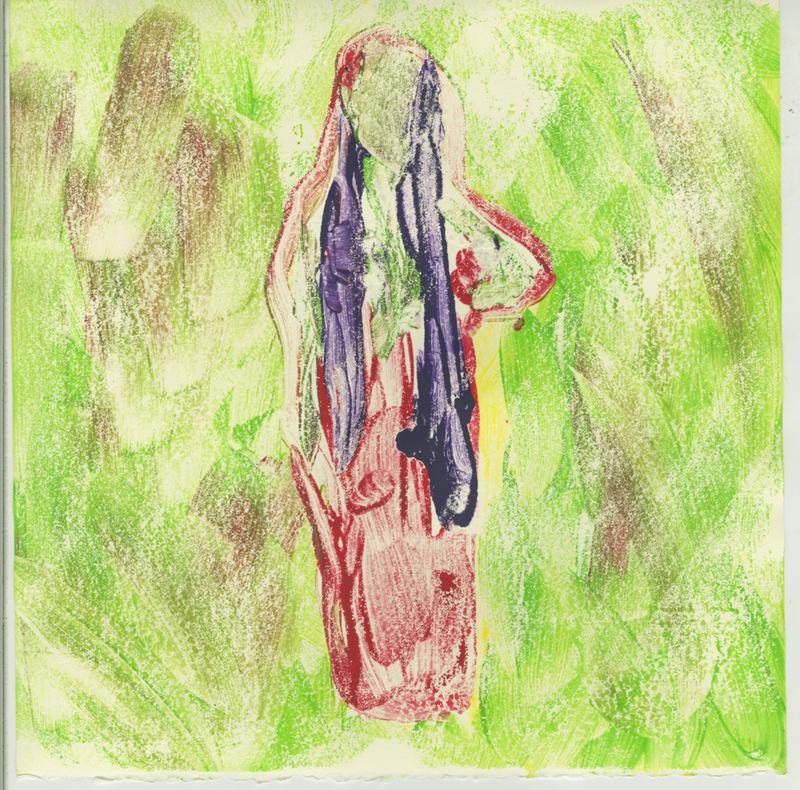 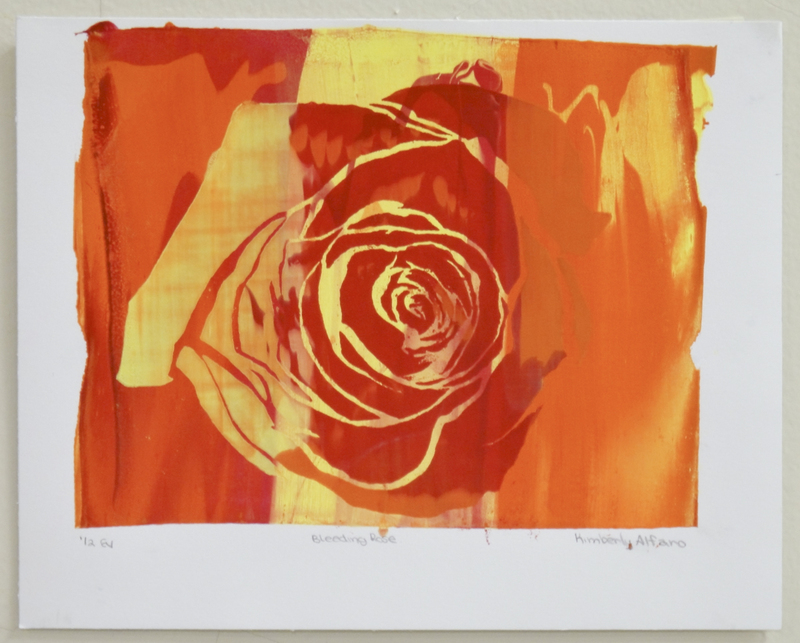 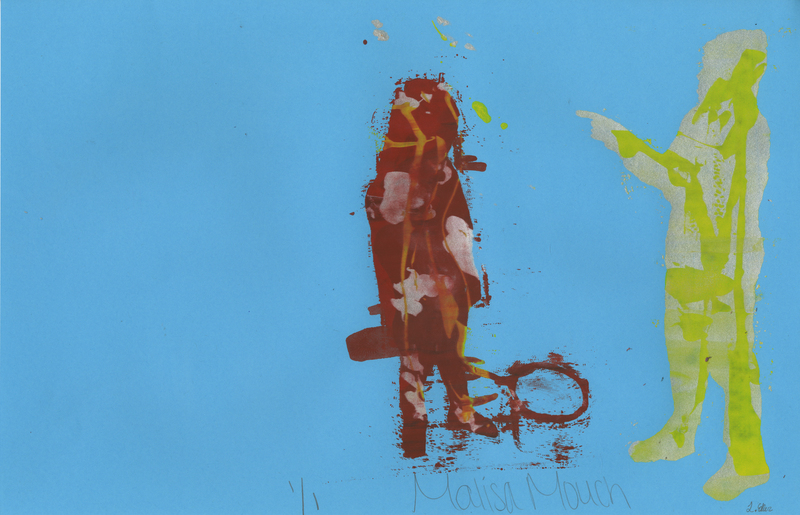 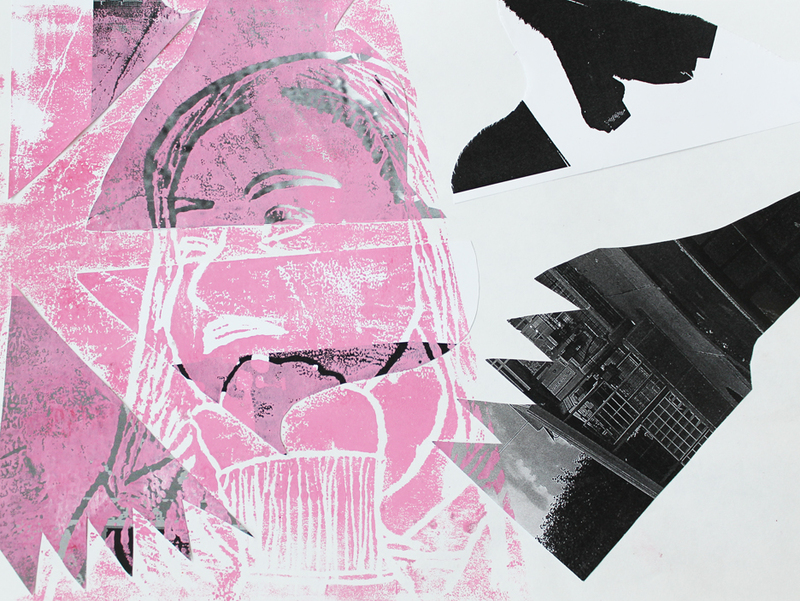 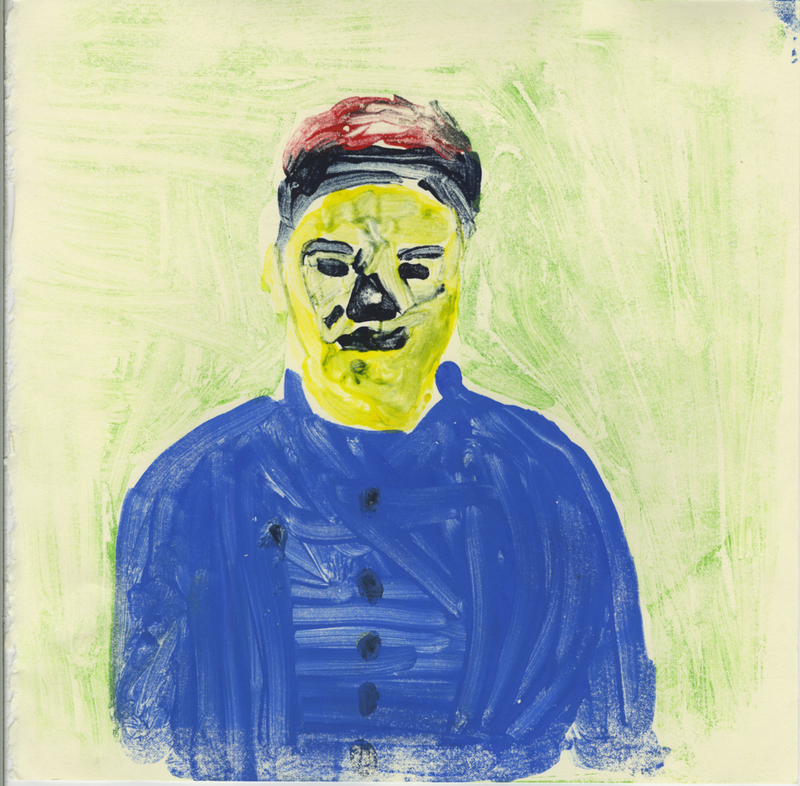 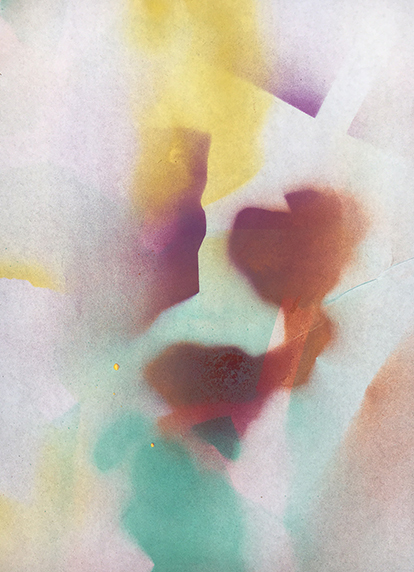 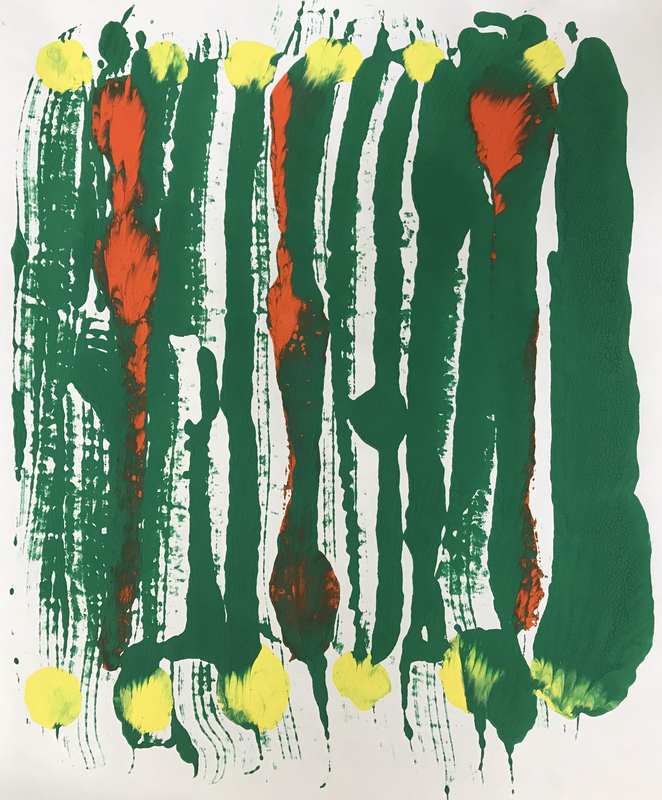 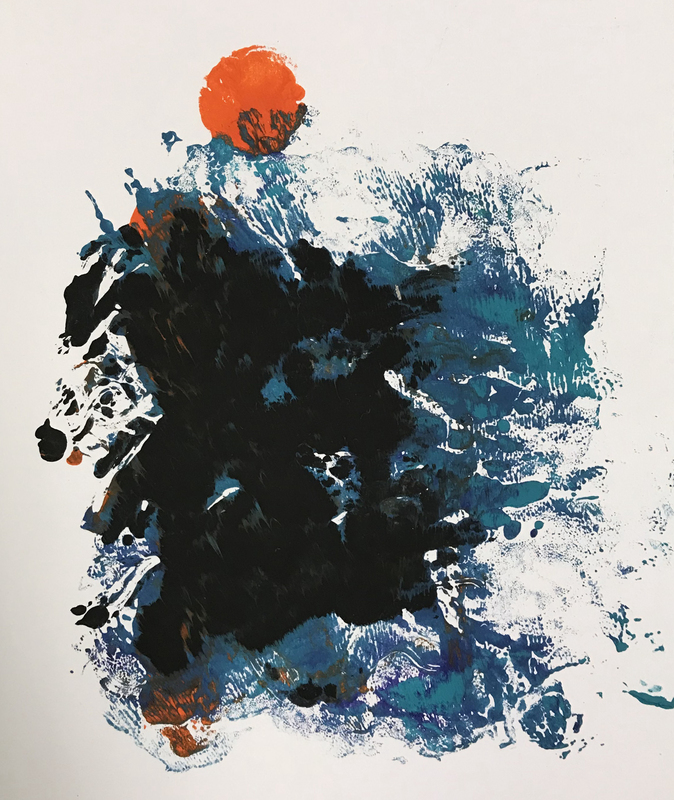 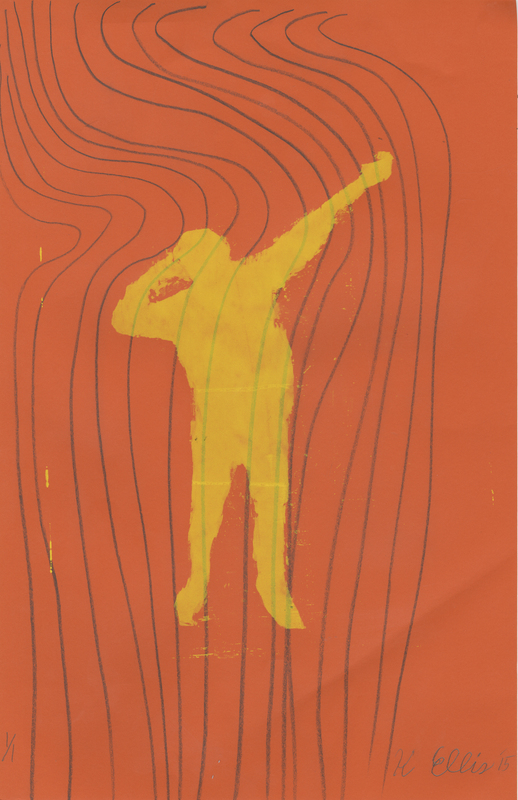 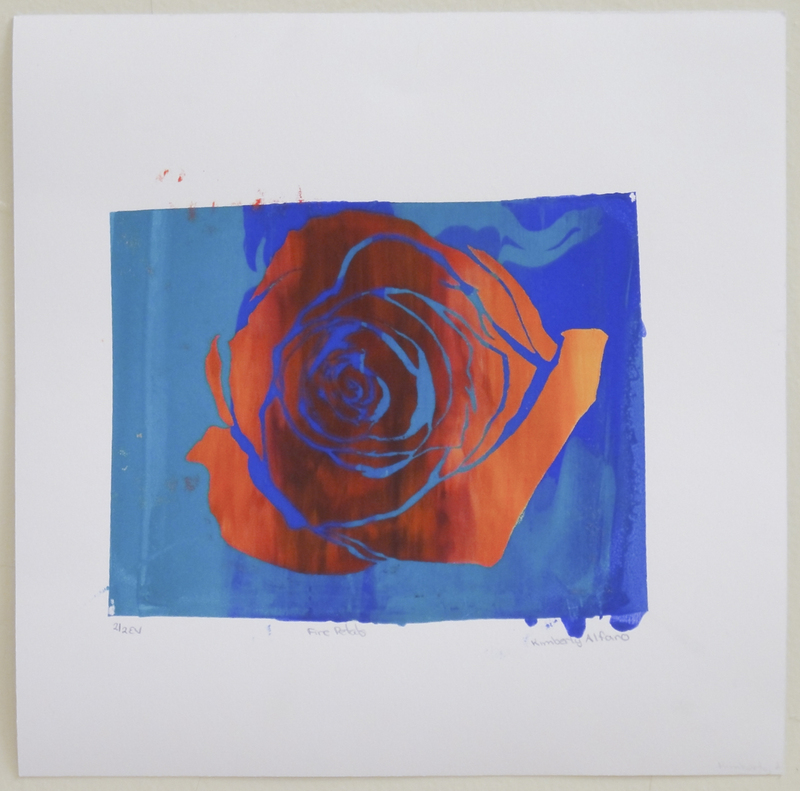 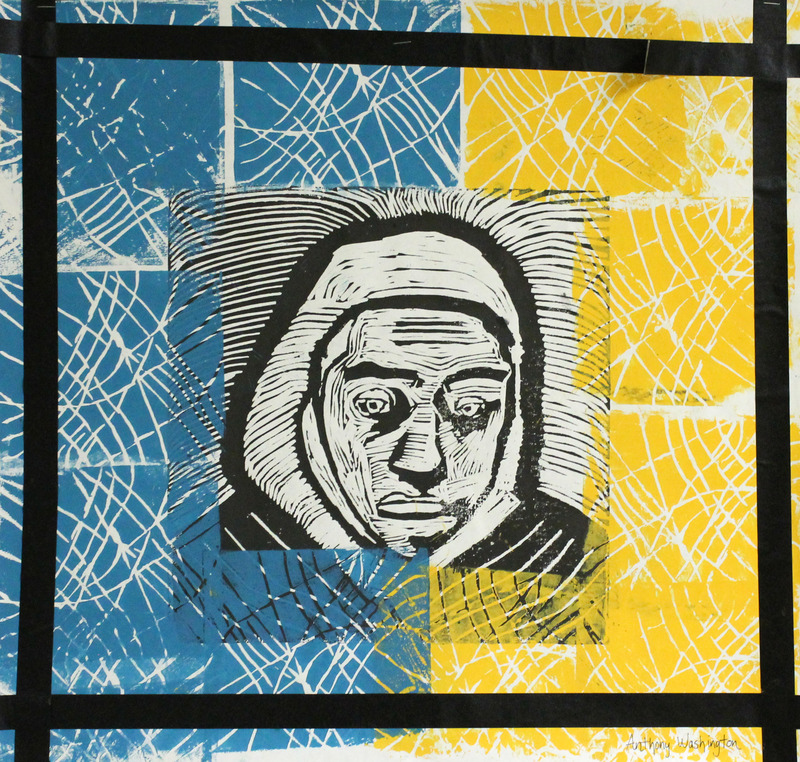 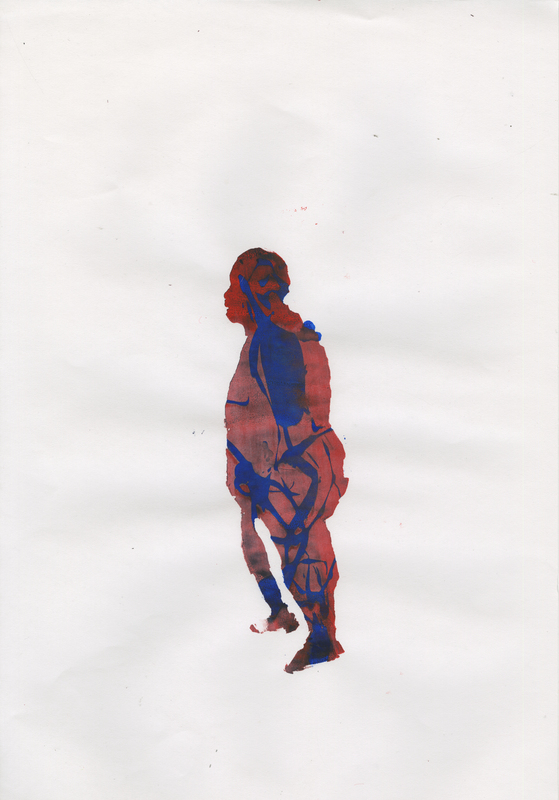 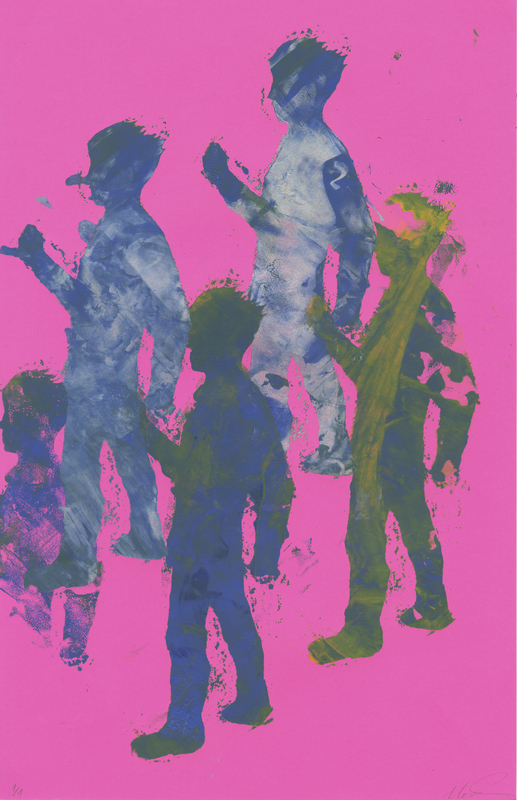 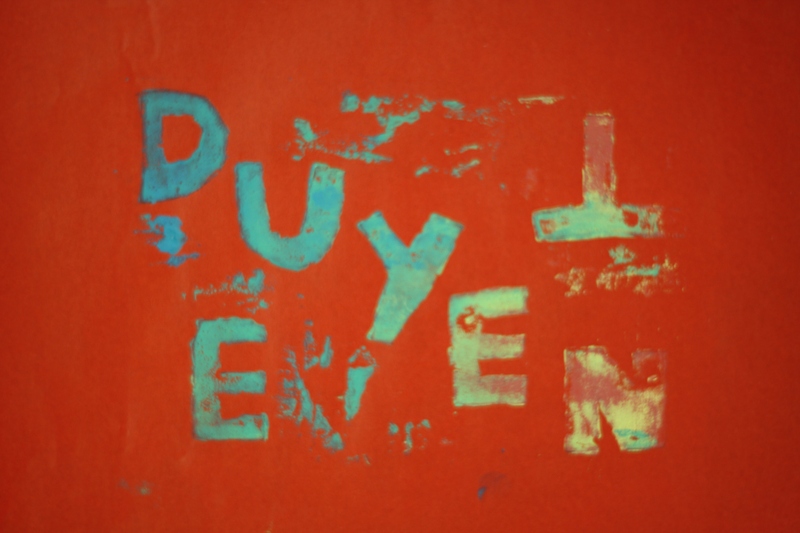 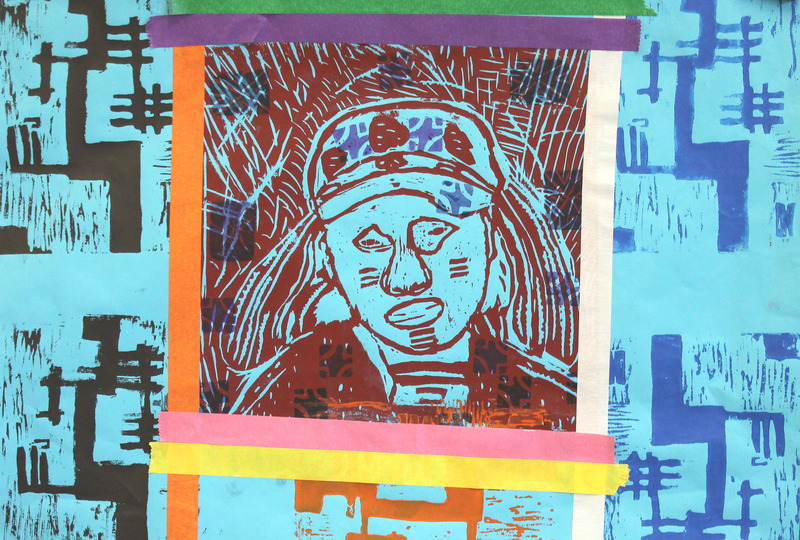 Students explored formal concerns in print through experimentation with repetition and color, and they created a series of monoprints based on the theme of identity. 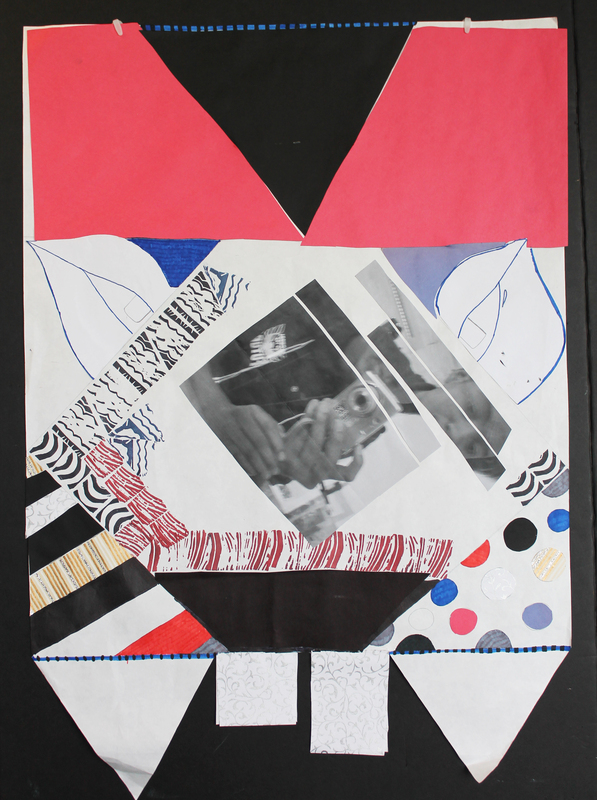 They created photographic collages on the theme of abstraction as part of a challenge to incorporate non-traditional methods of self-representation in their projects. 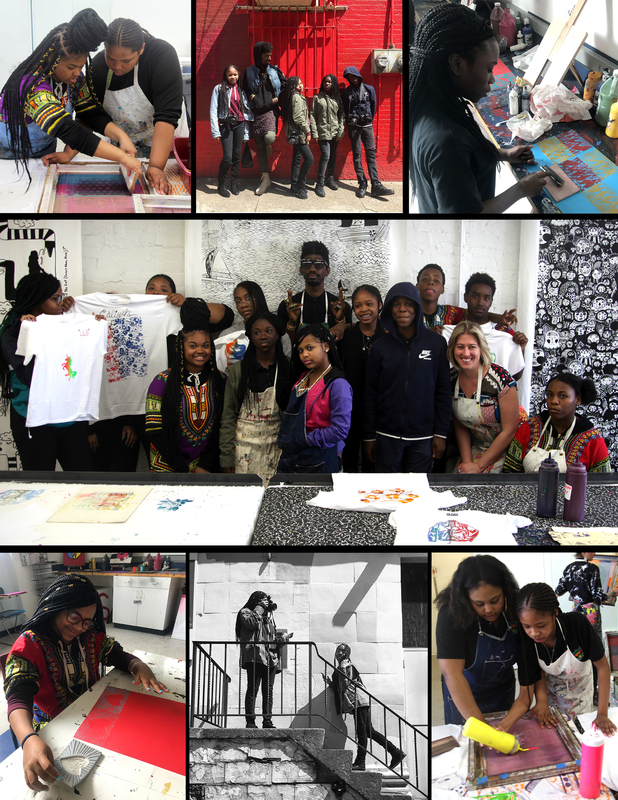 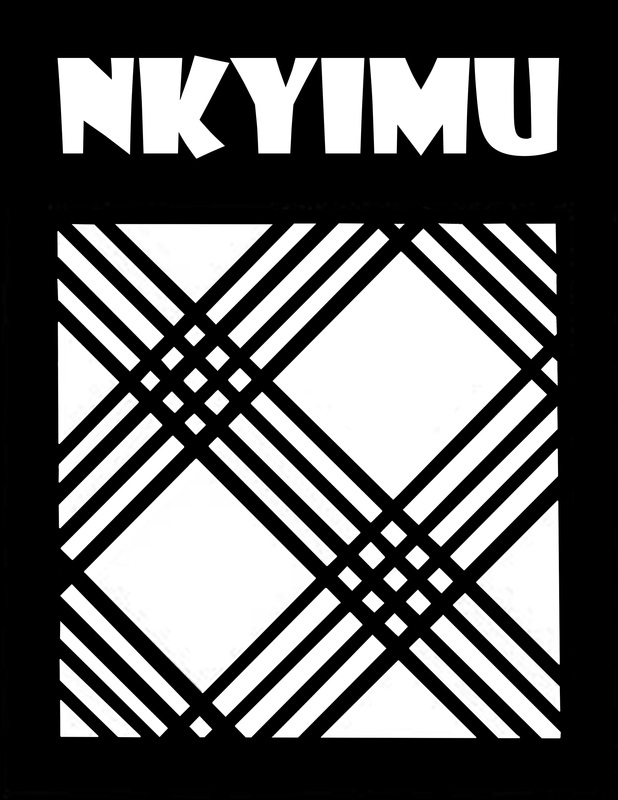 Olney Charter High School students collaborated on a series of printmaking, painting and sculpture projects that explored the question, “What is Black Art?” Learning about the work of artists such as Martin Puryear, Odili Donald Odita, Hank Willis Thomas and Jayson Musson sparked thoughtful discussions as students questioned what the work of each artist represented. 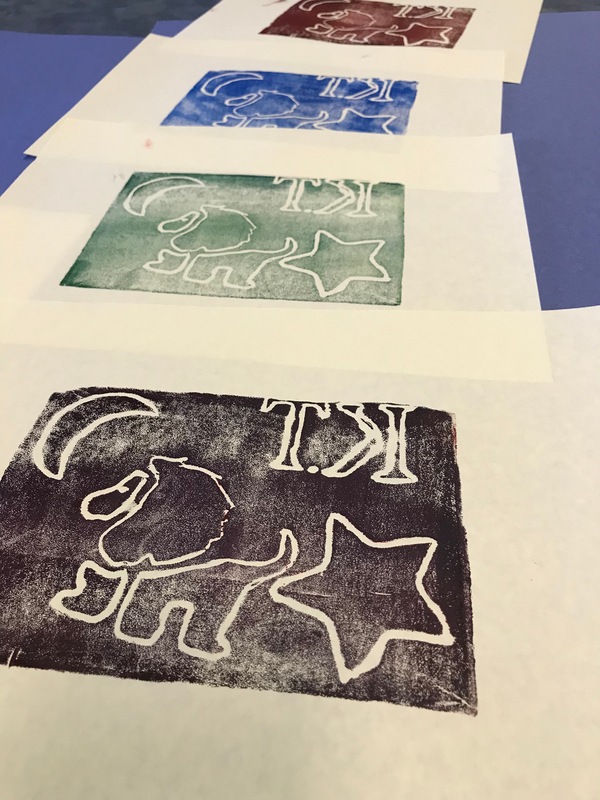 Students then focused on creating prints and small sculptures that revealed information about their lives, personal histories and interests. 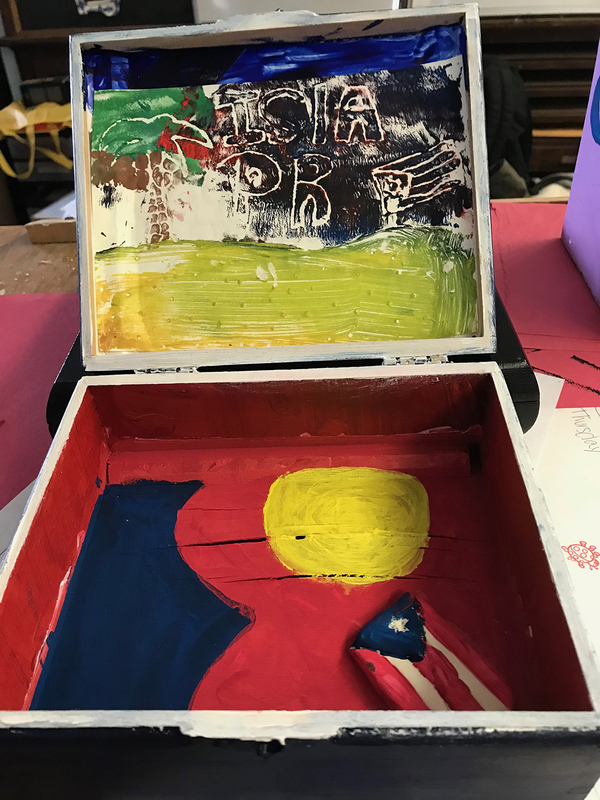 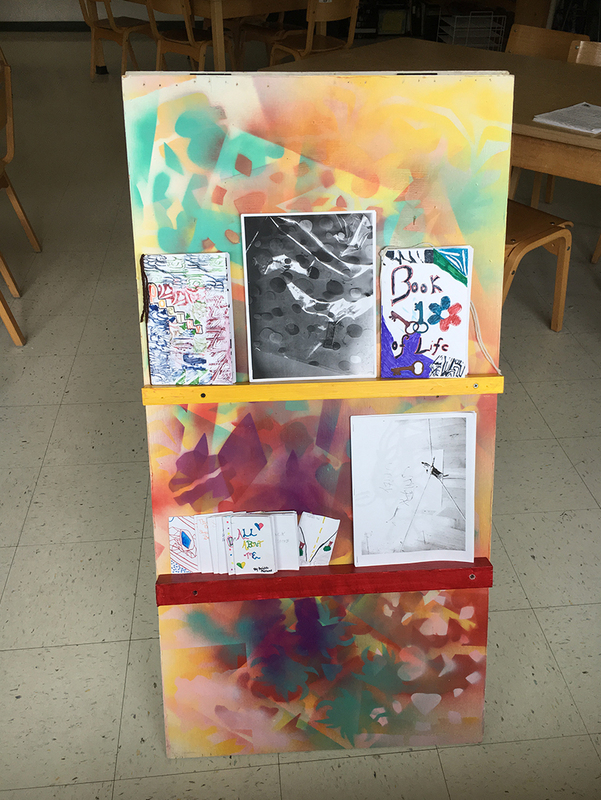 These individual artworks were combined and curated into “identity boxes” that contained visual symbols of each student’s personal narrative. 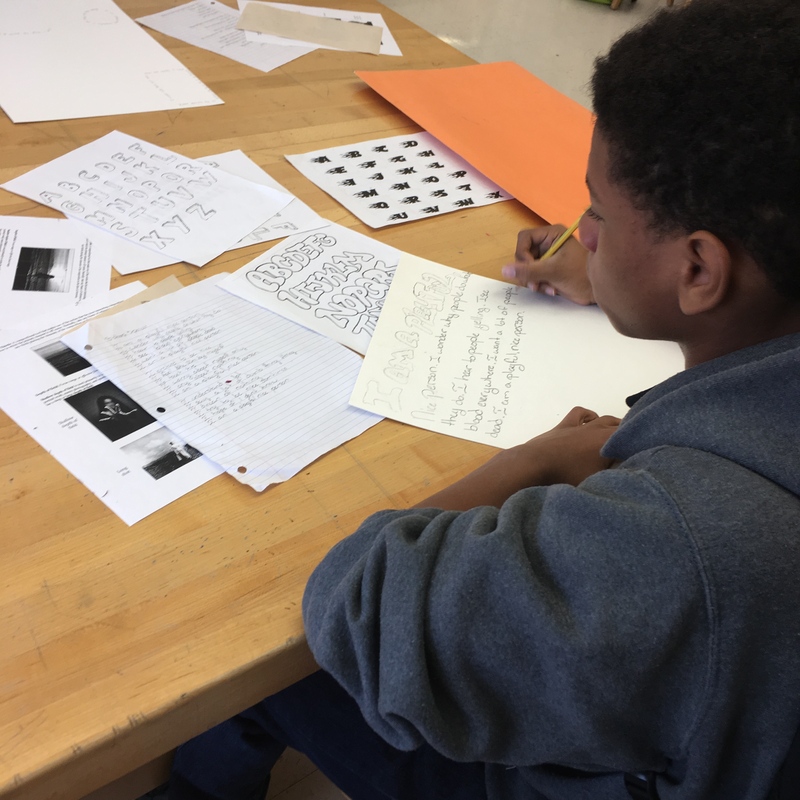 Students at The High School of the Future explored topics of identity, the passage of time and future aspirations through the conceptual and methodological framework of Martin Puryear’s use of line. 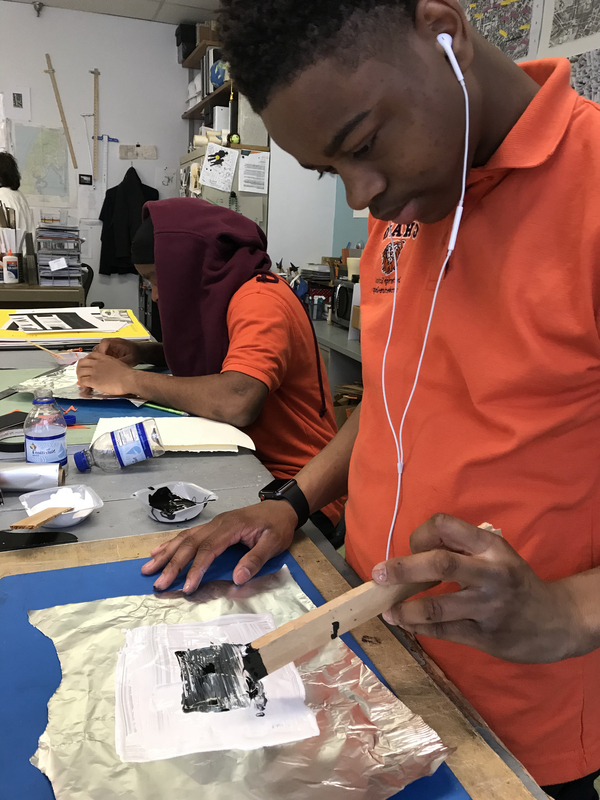 Students began the residency by working two-dimensionally on paper to learn a variety of printmaking processes, including monotypes, collograph and relief. 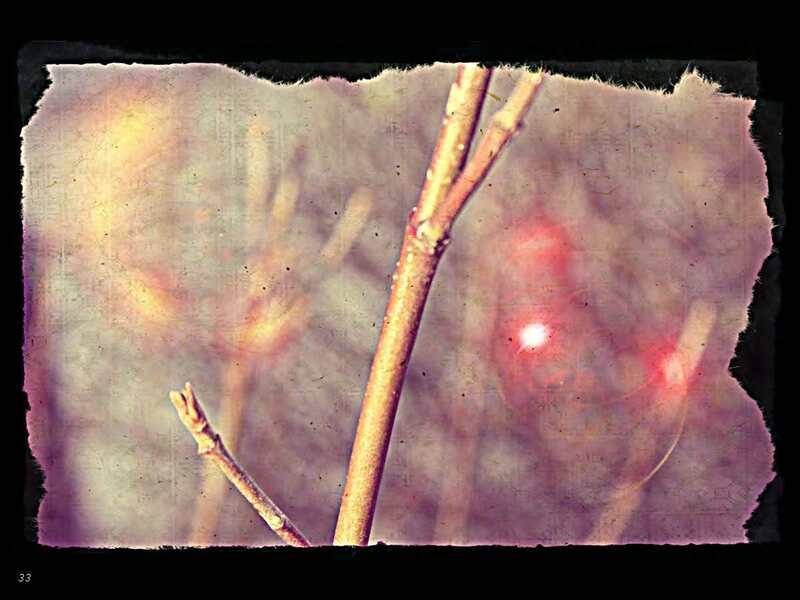 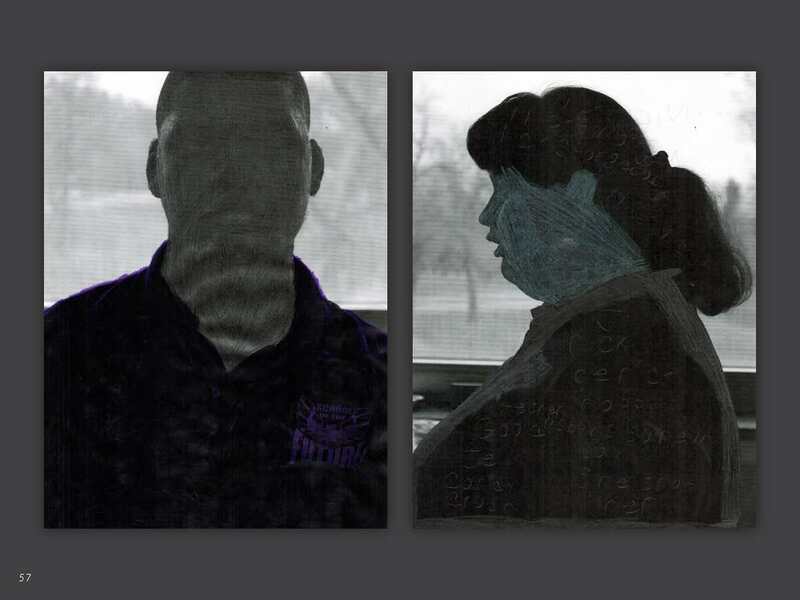 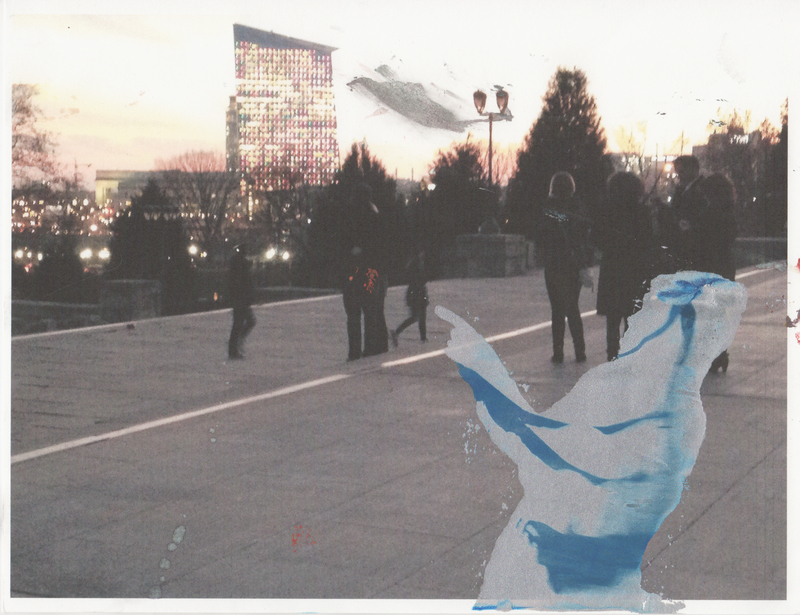 They also experimented with hand-altering their own digital photographs. 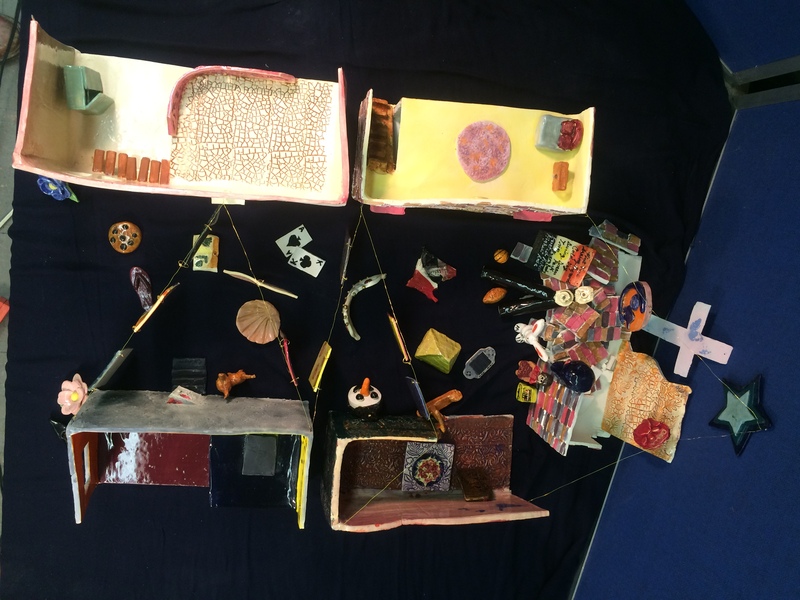 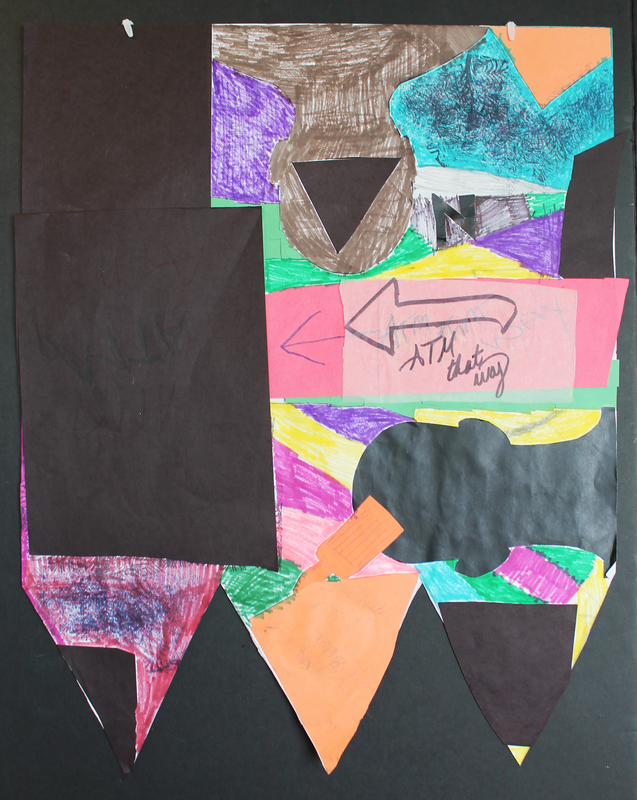 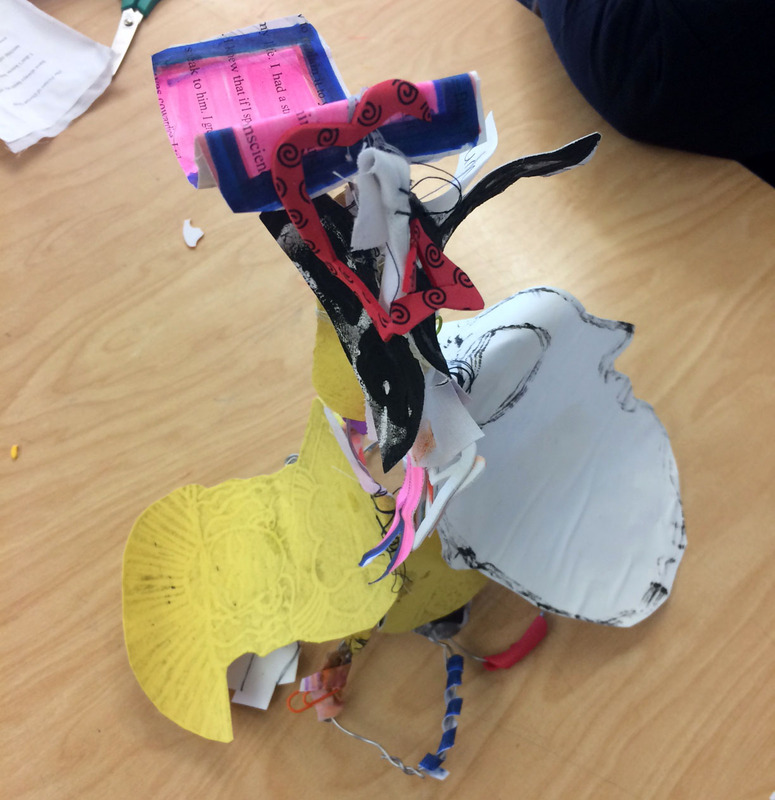 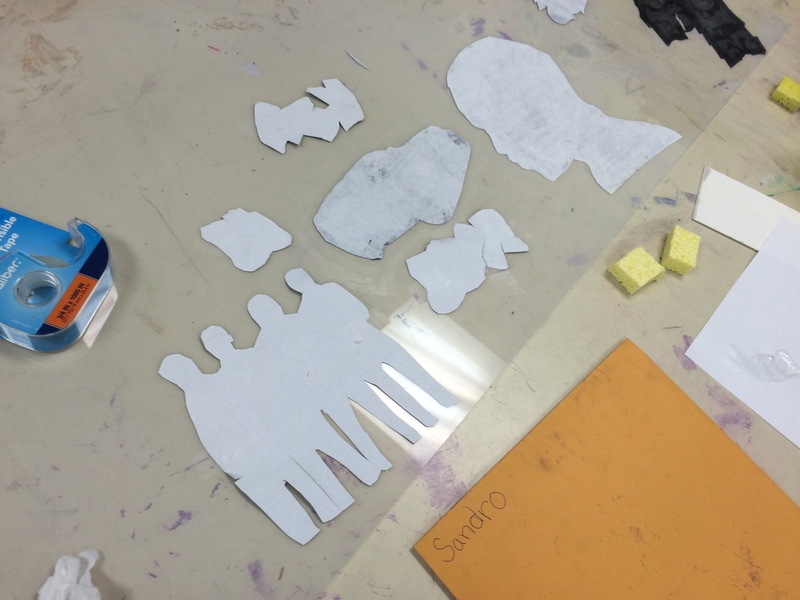 Students then gathered all of their works on paper and selected pieces to use to create a three-dimensional form. 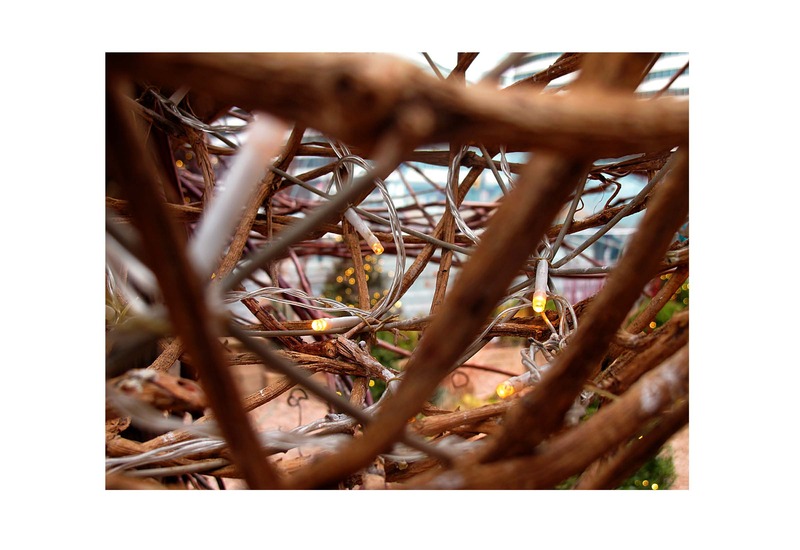 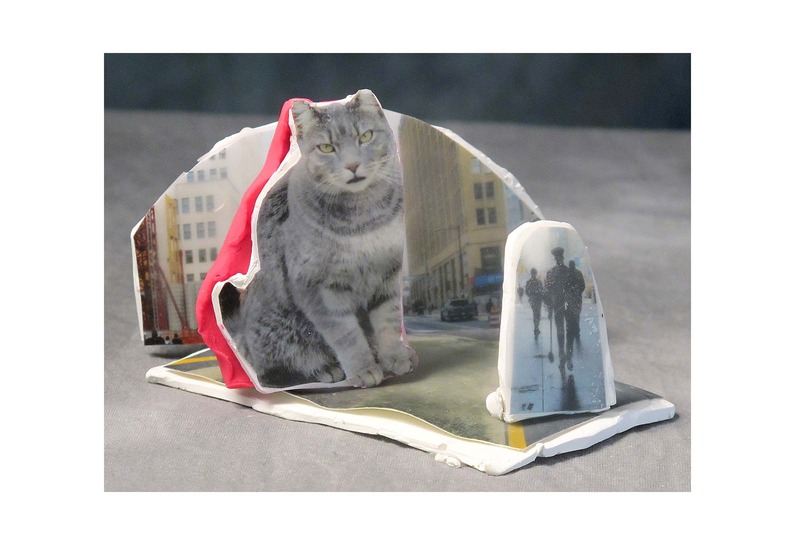 They built sculptural structures using wire, onto which they sewed and glued their prints and photographs. 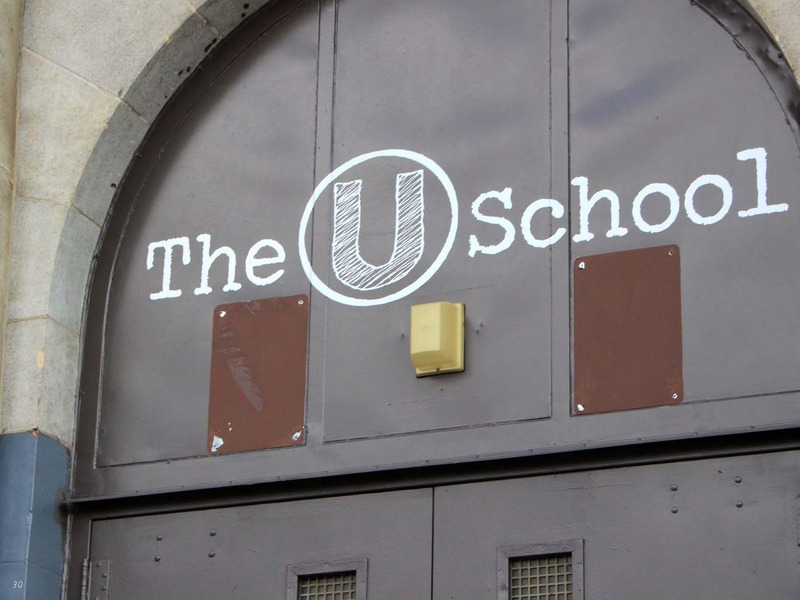 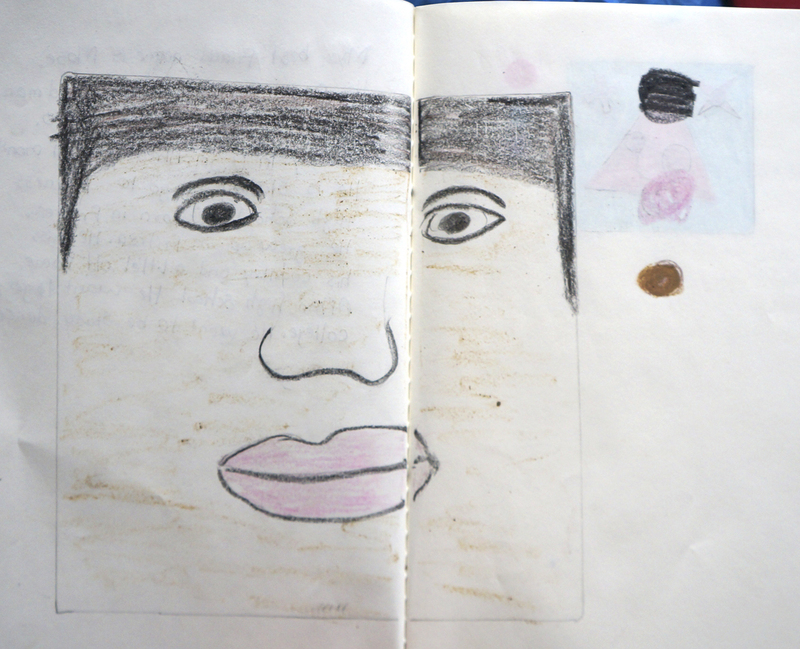 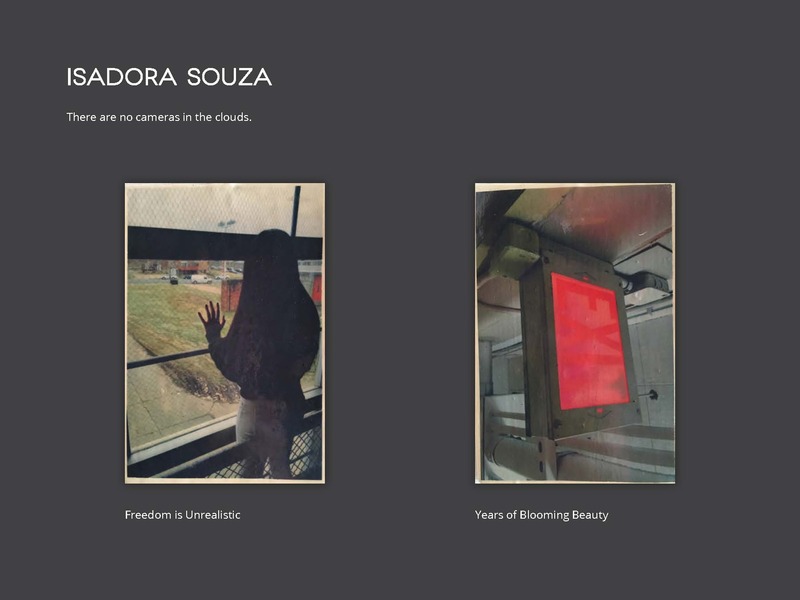 Students at The U School conducted an investigation of portraiture, their histories and their intentions through the use of data in art and design. 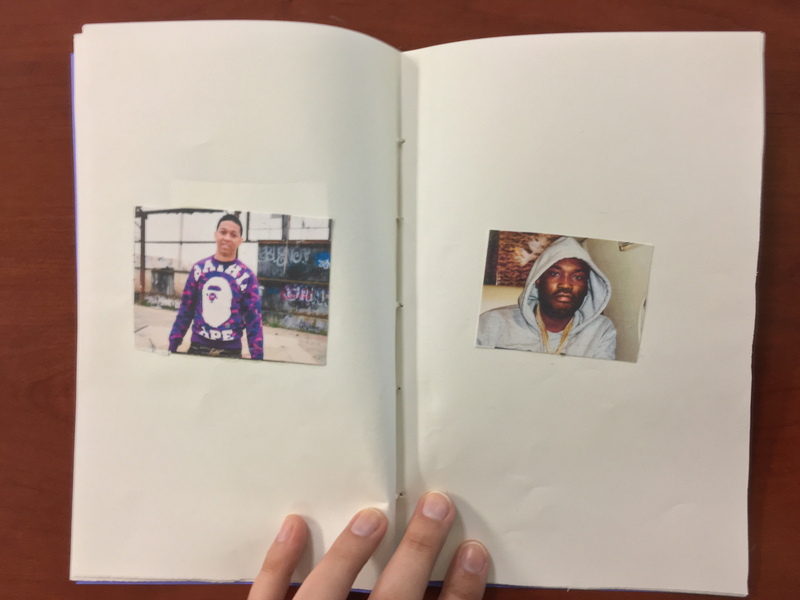 They conducted self-analyses of their daily activities, such as talking to loved ones, singing, texting or viewing social media apps. 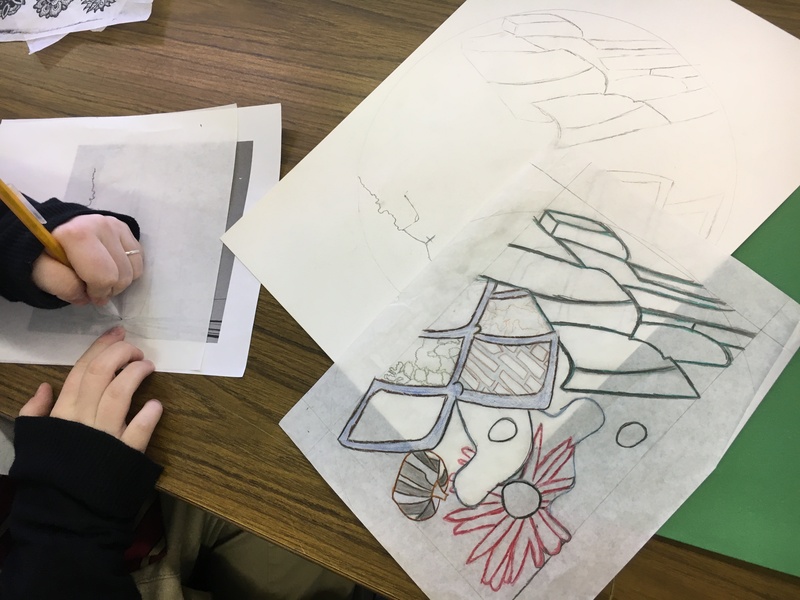 They discussed iconography and designed symbols that represented each activity, which were then incorporated into larger designs. 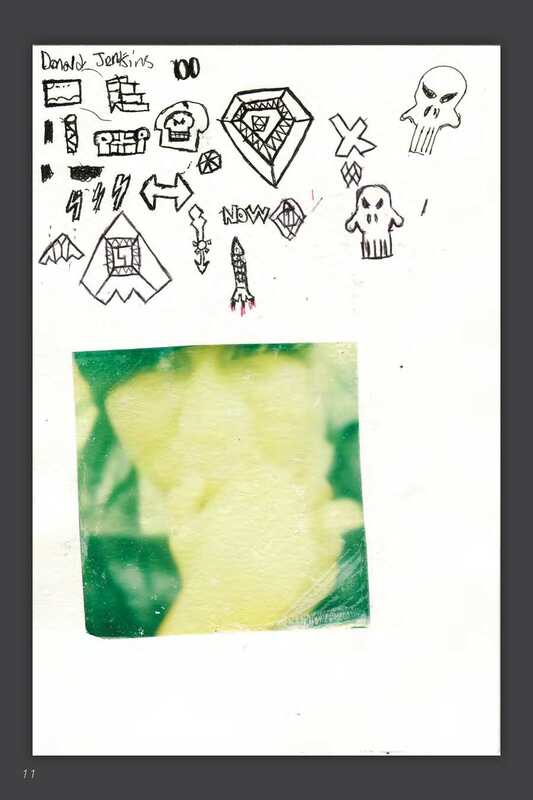 Those designs were scanned and transferred onto t-shirts. 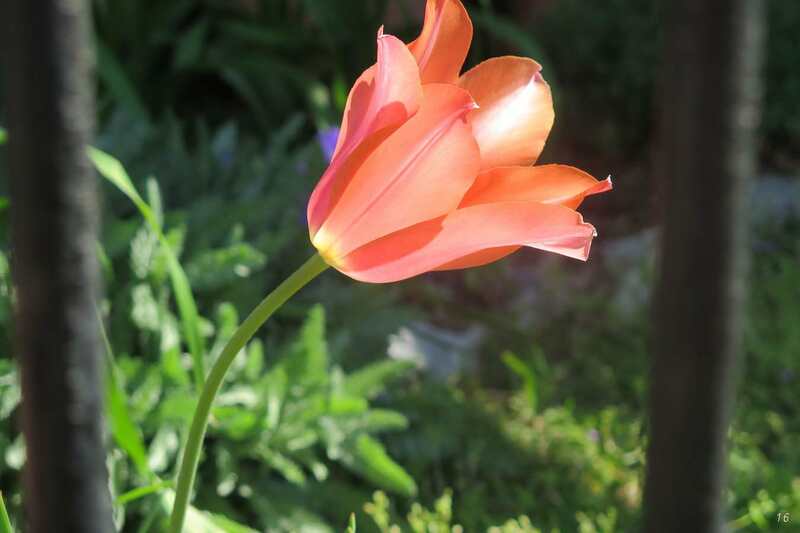 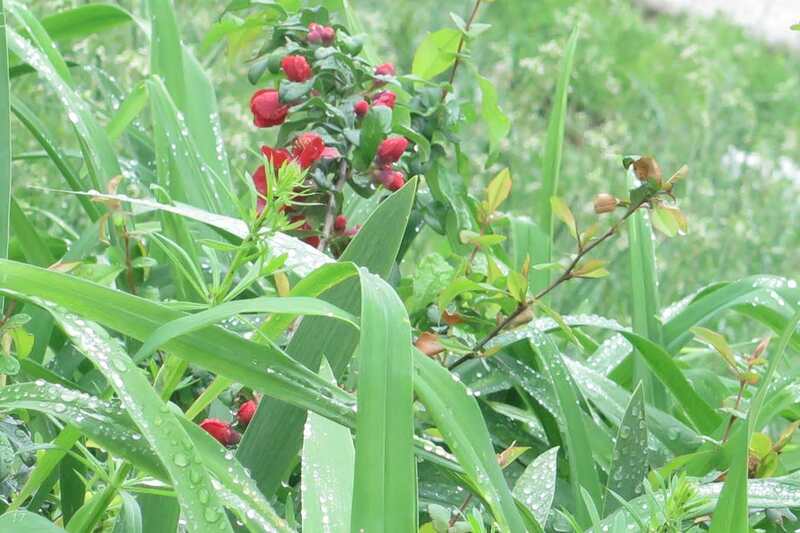 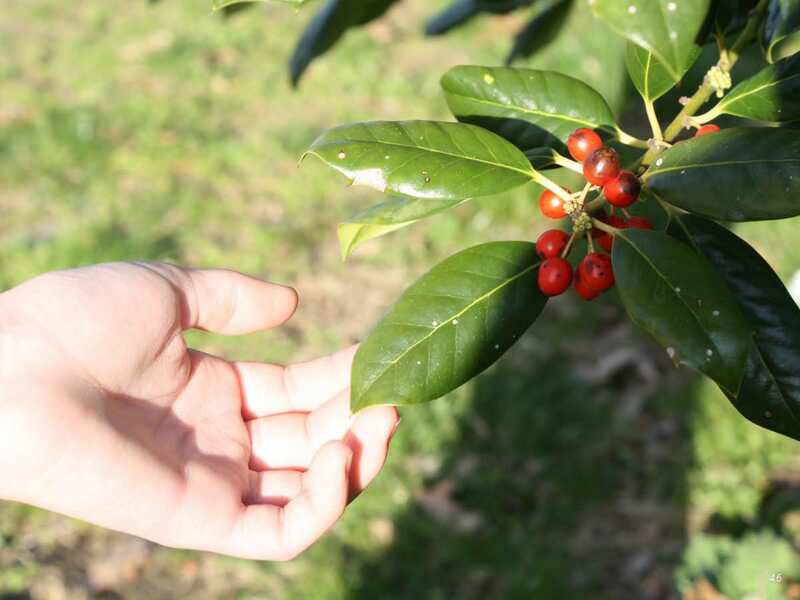 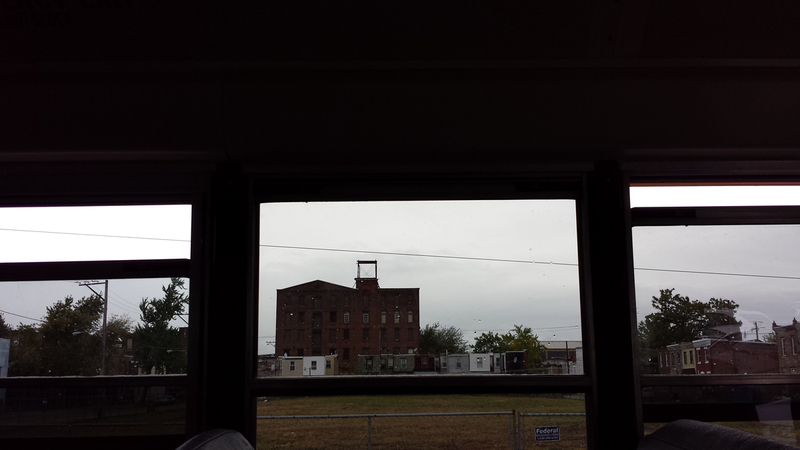 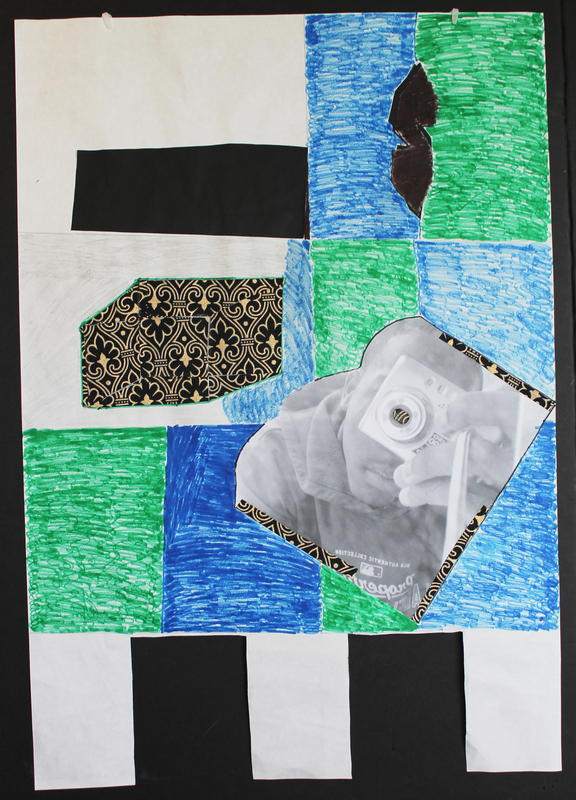 Additionally, students learned to document their art using digital cameras. 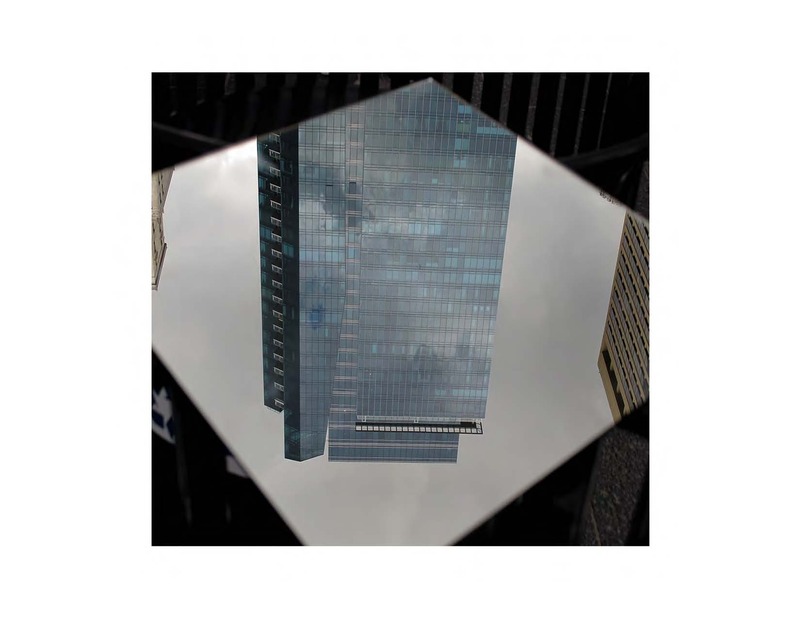 In the spring of 2017, AISP classes responded to two exhibitions at The Print Center: Rebecca Gilbert: wonder and Daily Life: Photography from Lithuania. 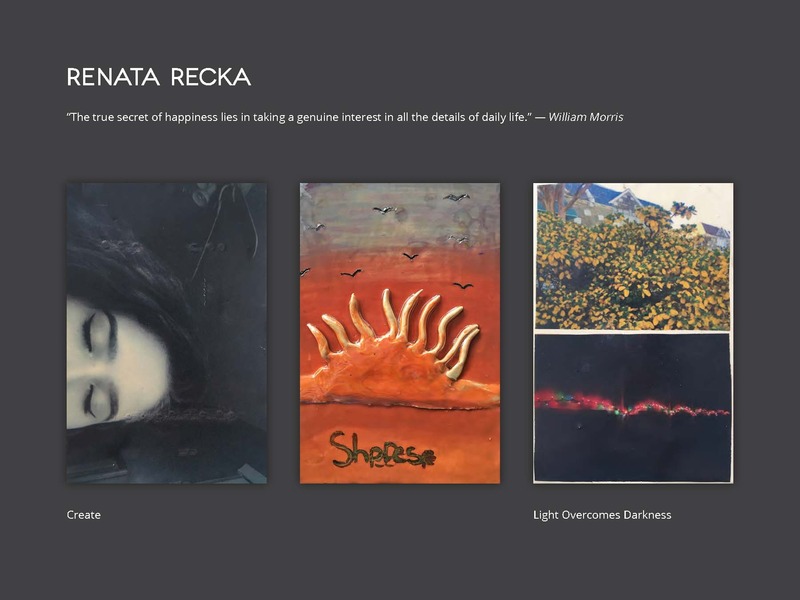 The curriculum examined the depictions of everyday life offered by the Lithuanian photographers contrasted with Gilbert’s idiosyncratic representations of her discoveries during her travels in a remote area of New Mexico. 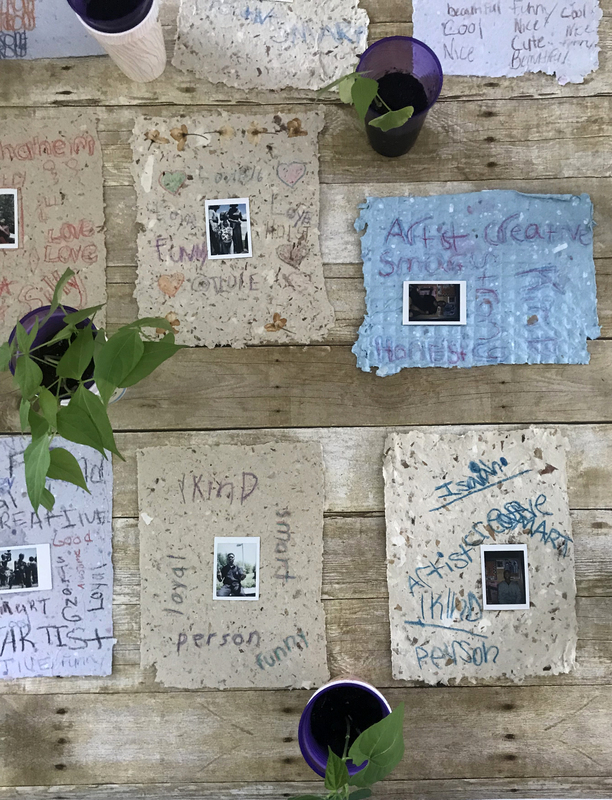 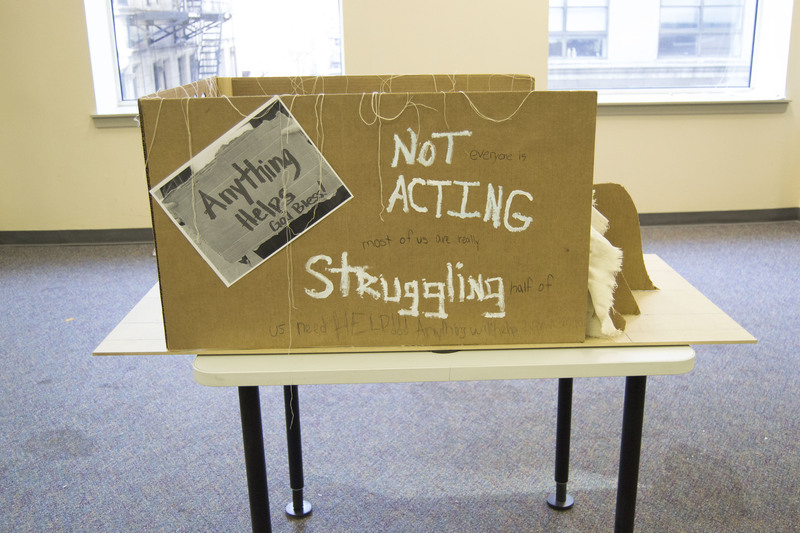 Students were encouraged to examine the ways that capturing the fleeting, invisible and mundane parts of life can reveal a great deal about what both individuals and the larger society value. 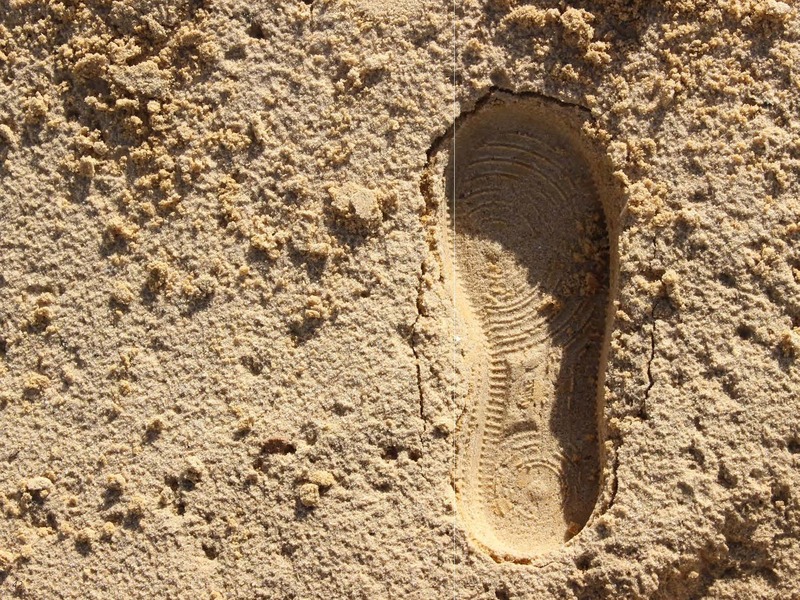 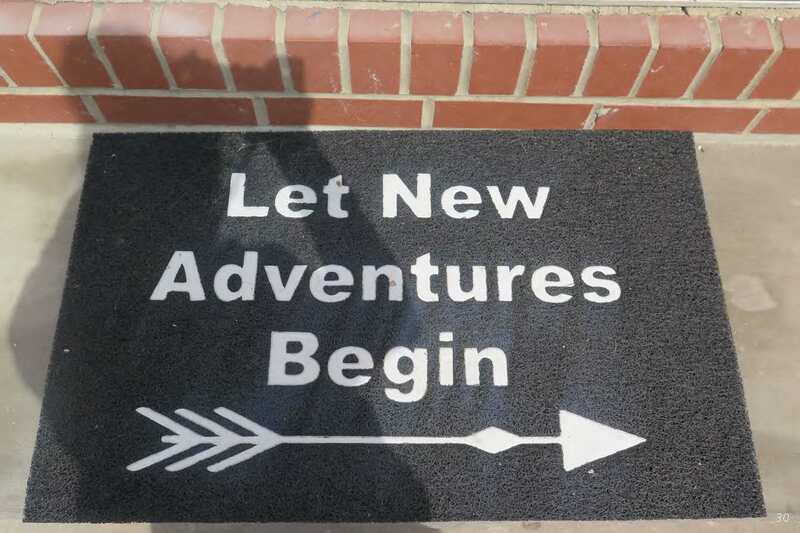 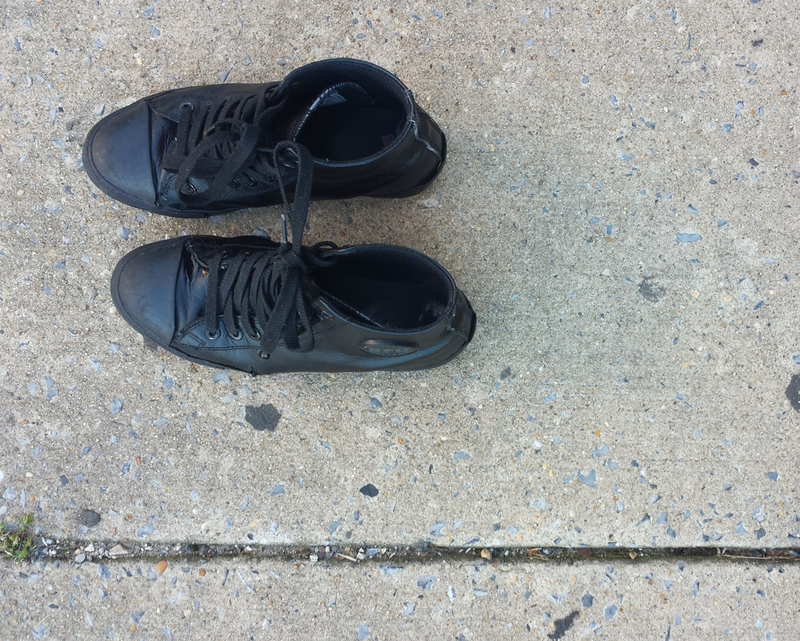 Just as the minutiae of our daily lives can reveal a great deal about us, so can our departures into the unknown. 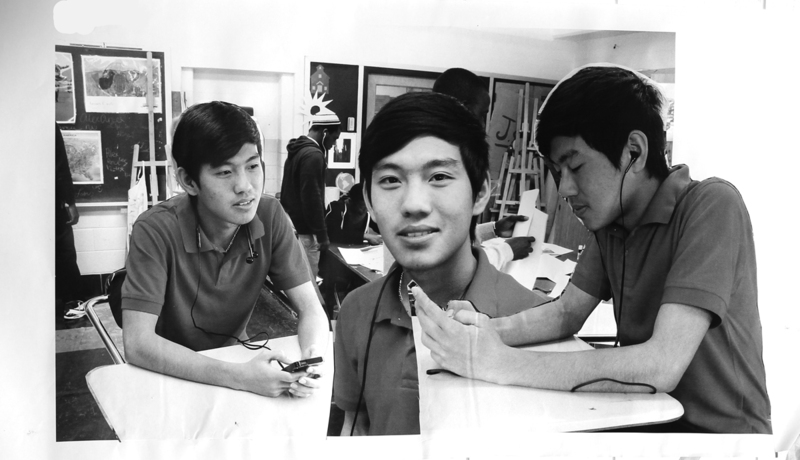 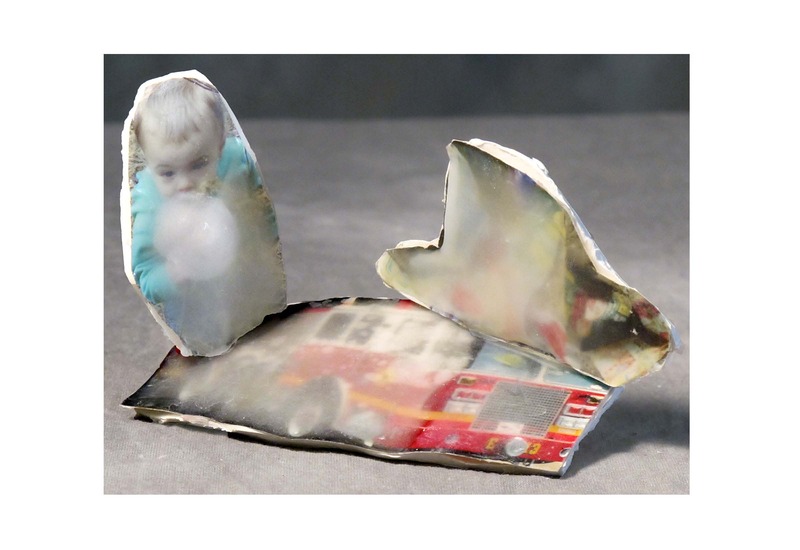 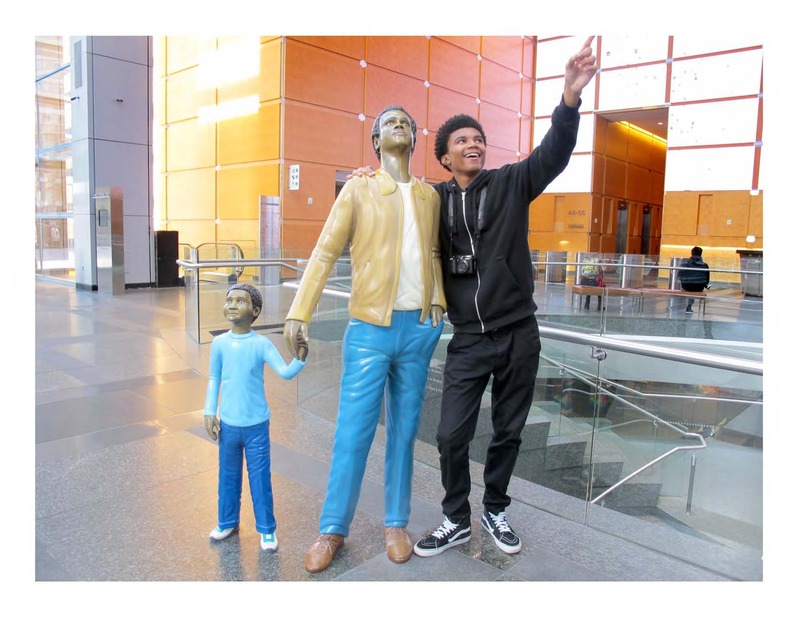 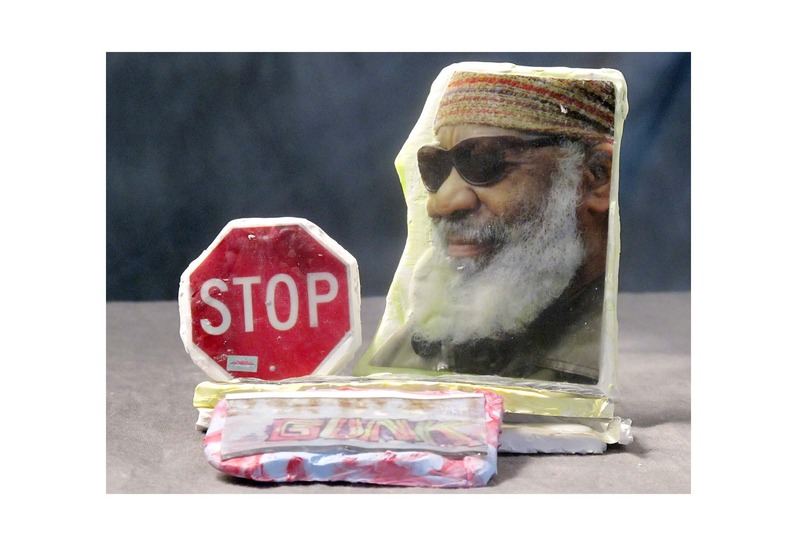 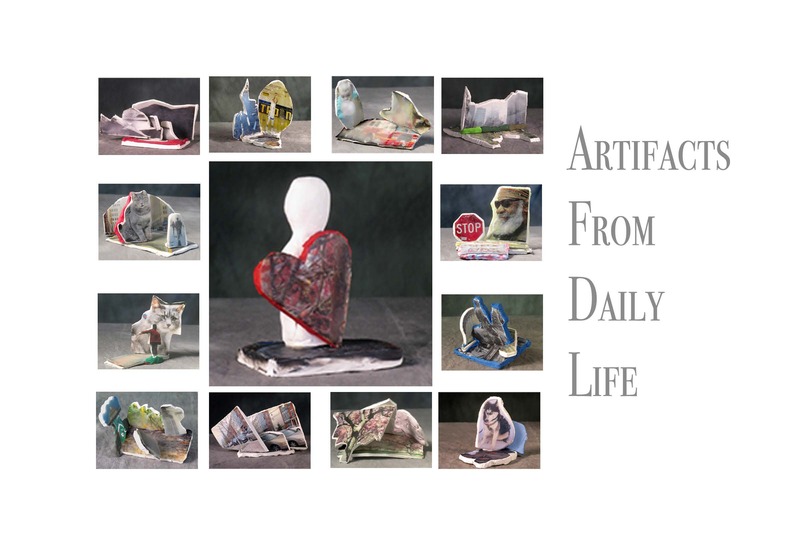 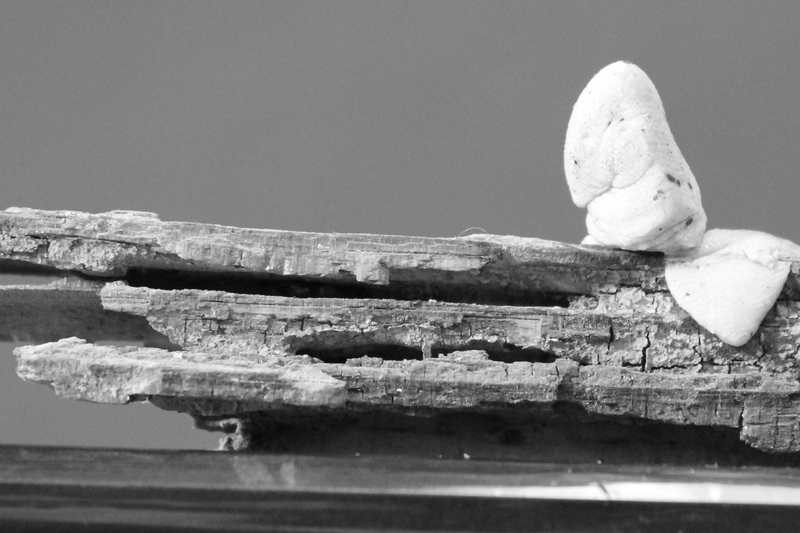 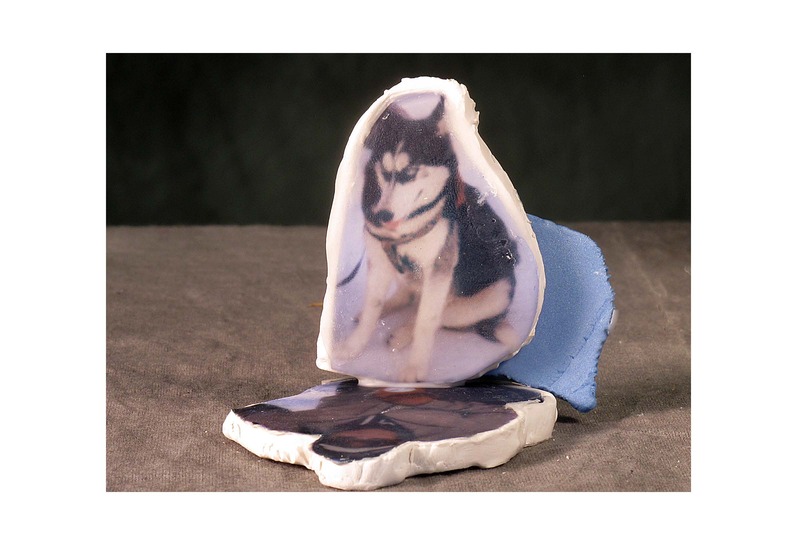 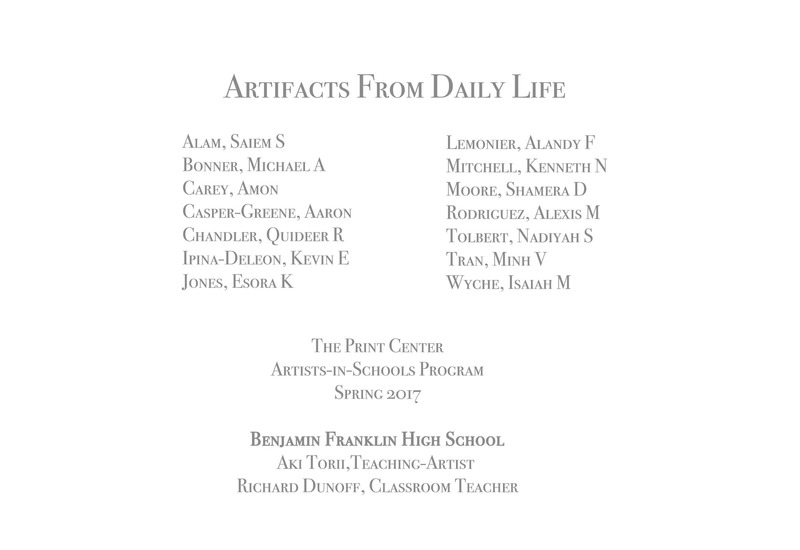 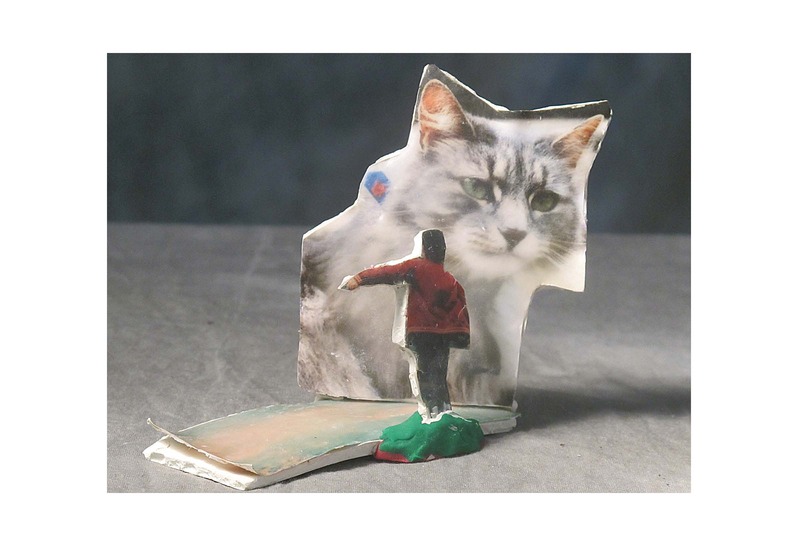 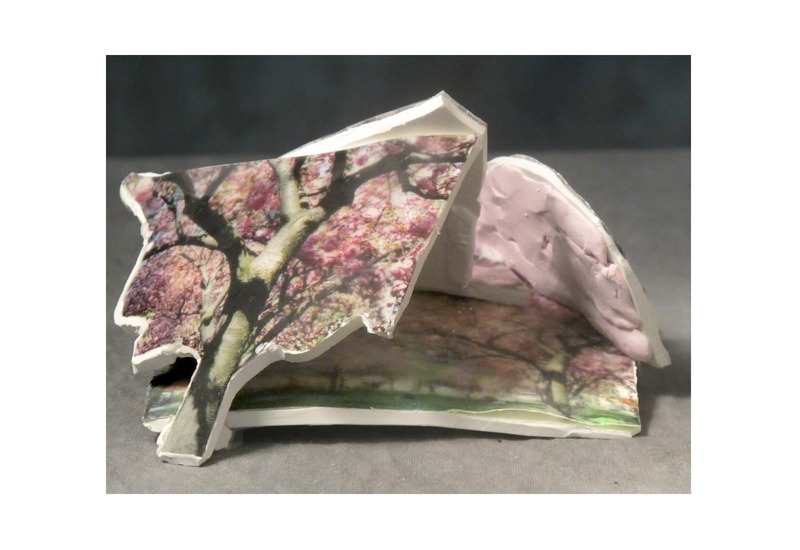 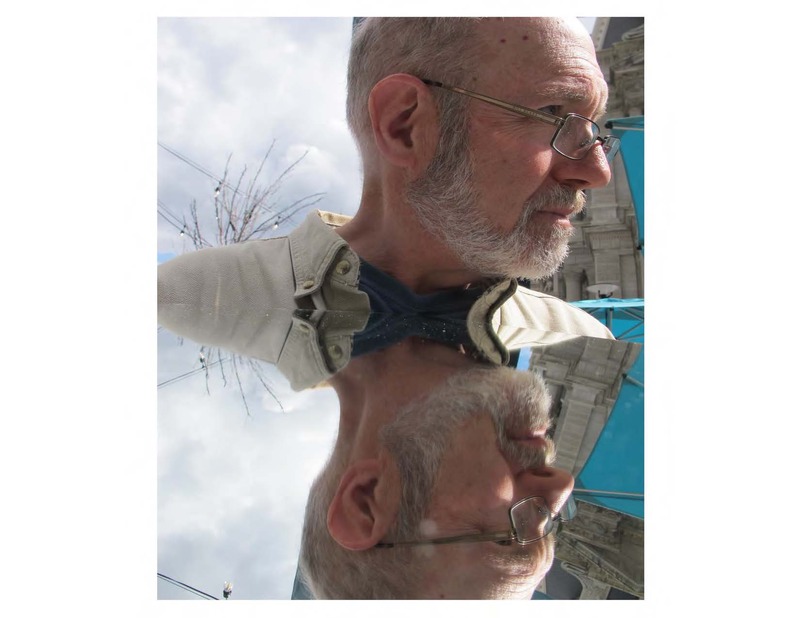 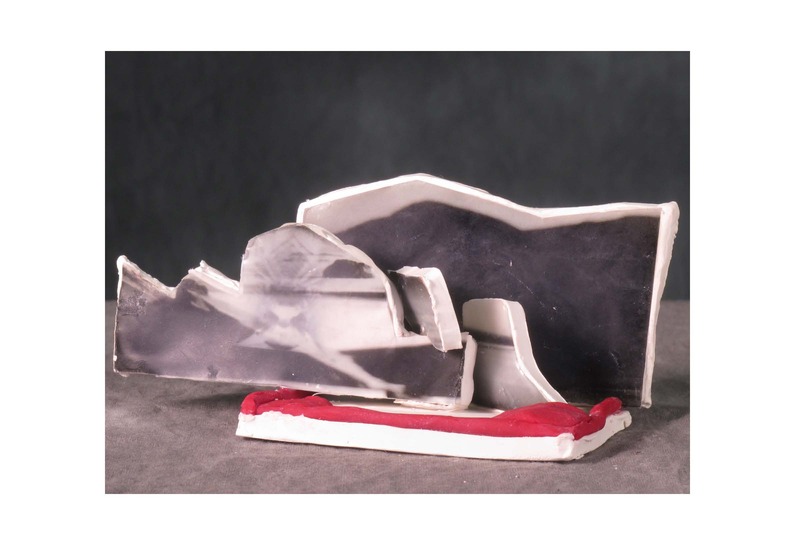 One of art teacher Richard Dunoff’s photography classes from Benjamin Franklin High School worked with teaching-artist Aki Torii to create sculptures incorporating photographs, as well as a photo book, that highlighted work from each student. 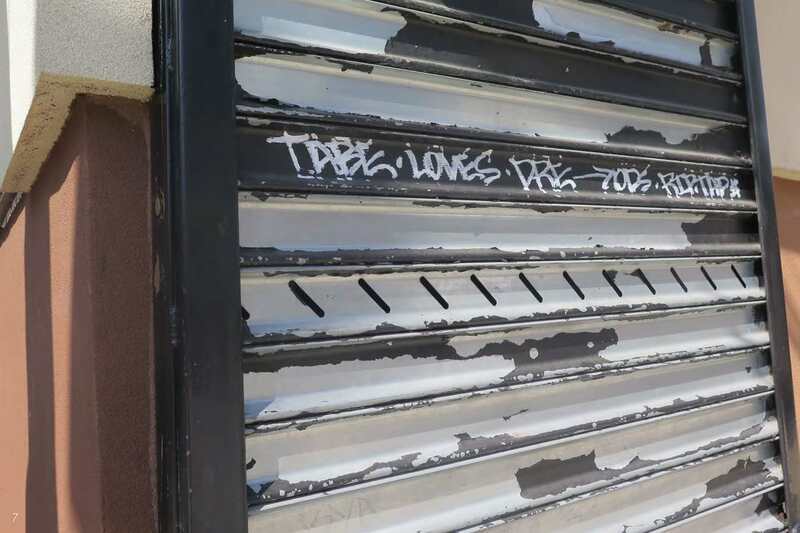 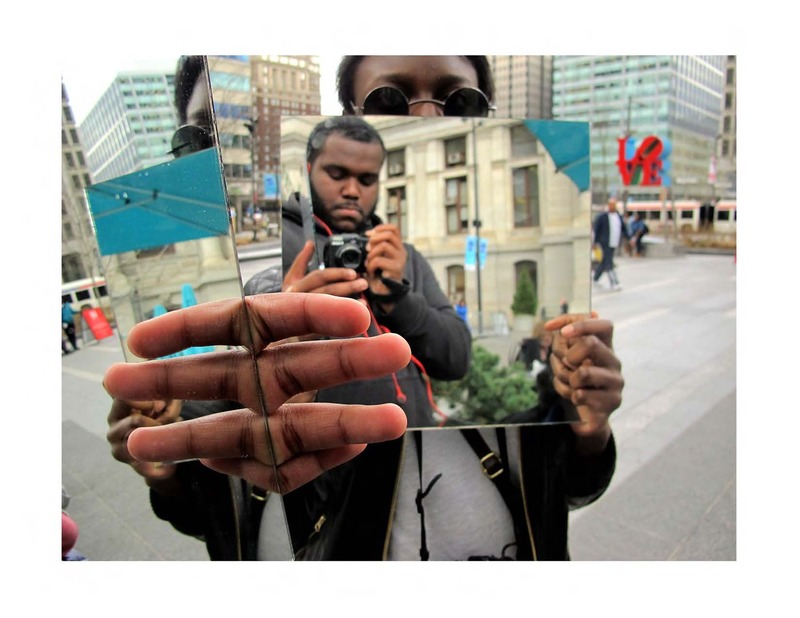 Students began the residency with a series of photo-shooting field trips to sites near their school and elsewhere in the city. 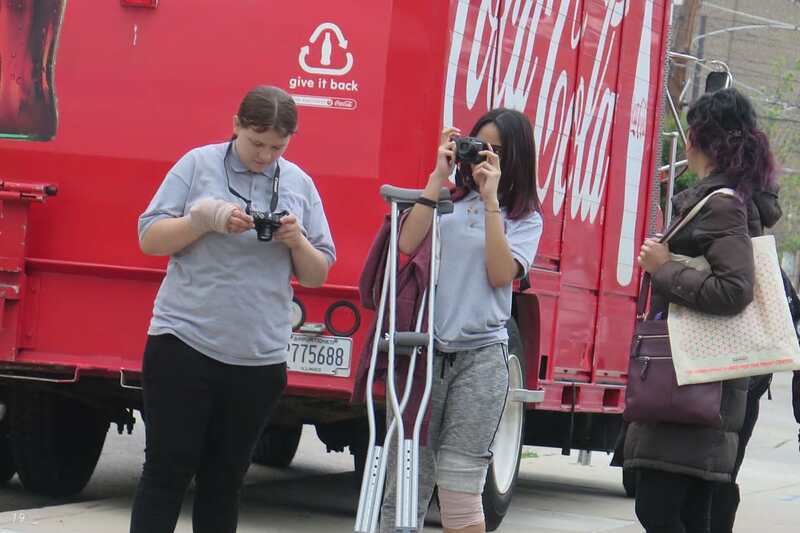 The images resulting from these trips were shared and discussed as a group, along with other photos students had taken elsewhere. 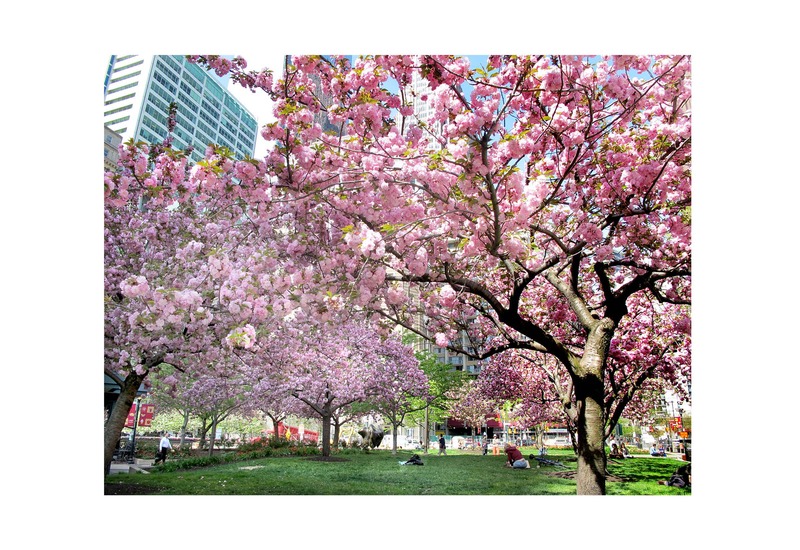 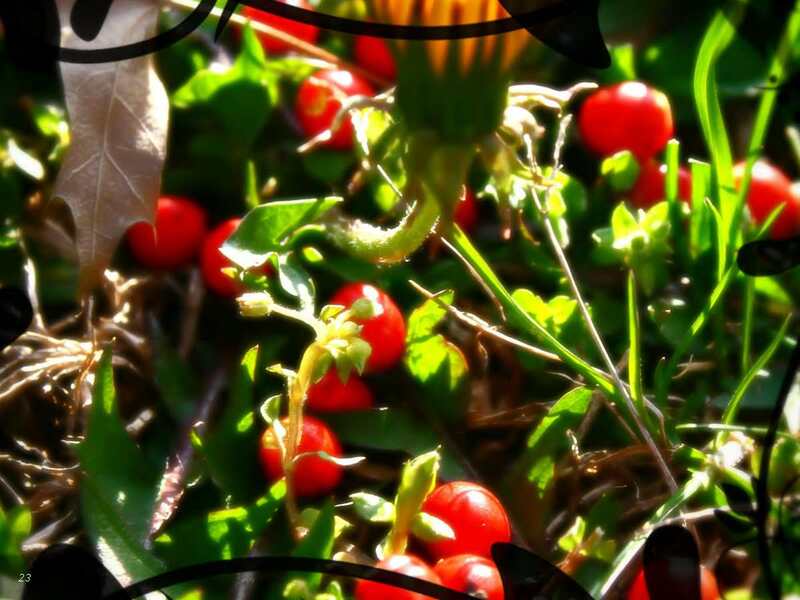 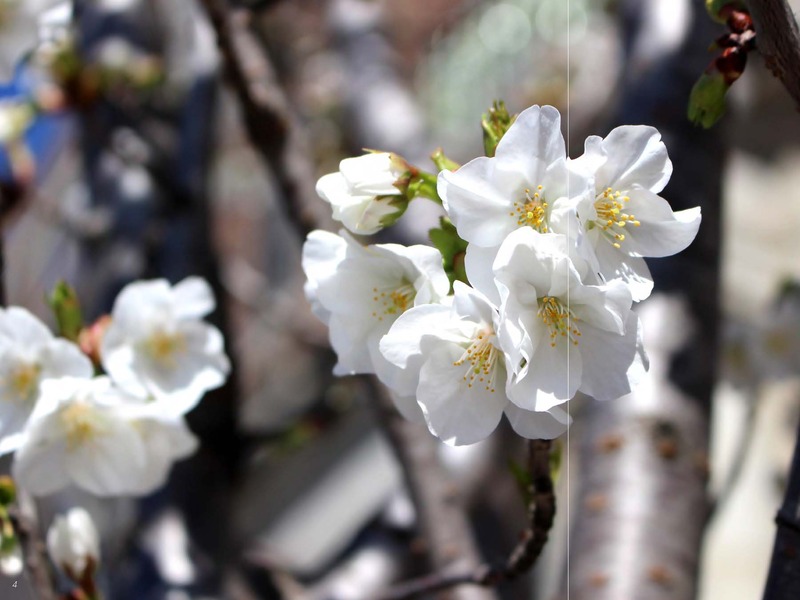 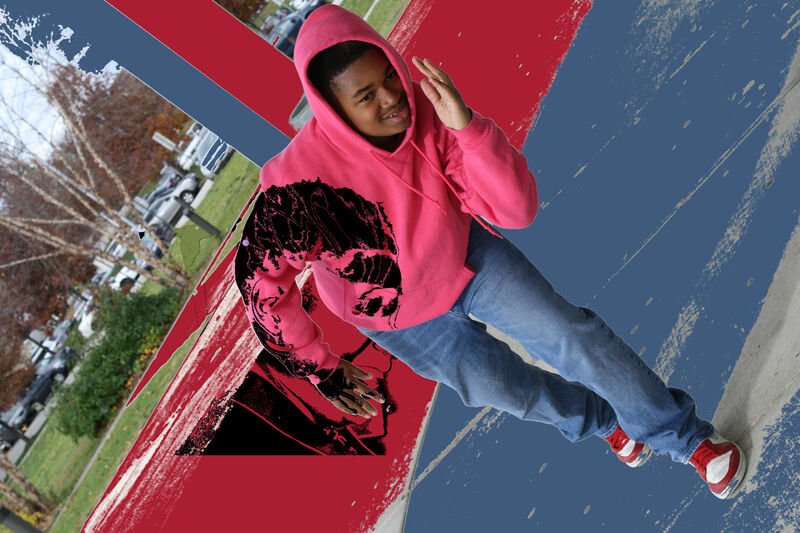 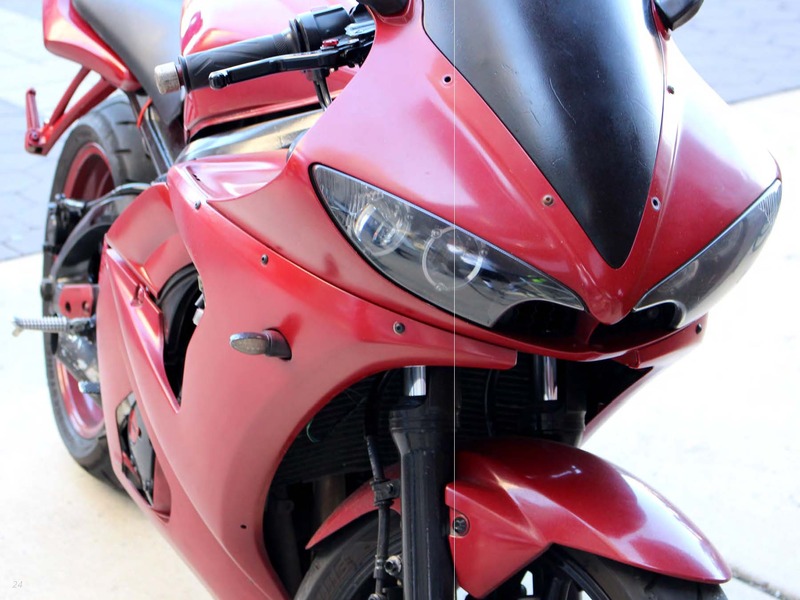 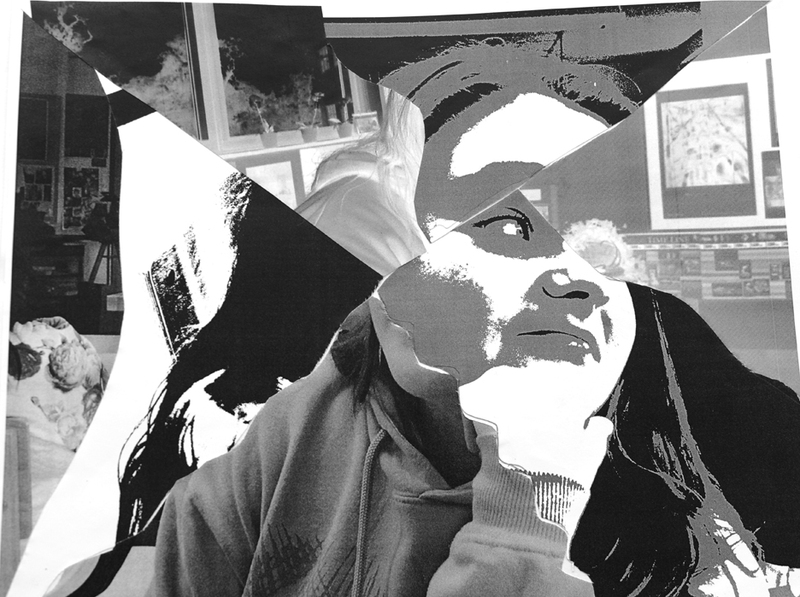 Students modified their images in multiple ways using Photoshop. 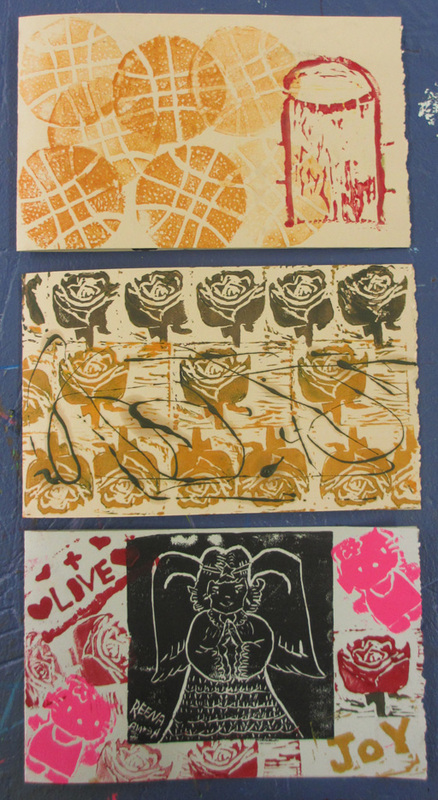 Prints of these images were made and then covered in liquid clay. 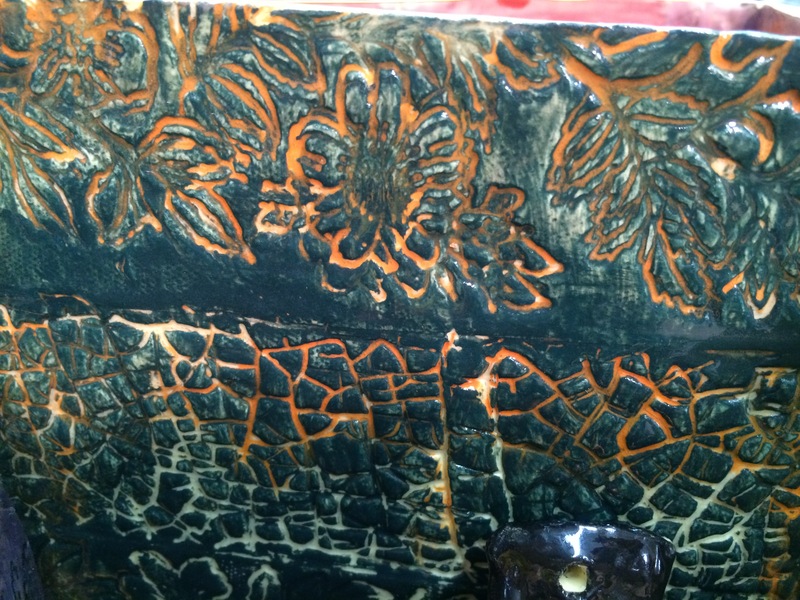 The prints were then baked, so attaching the image to the surface of the clay. 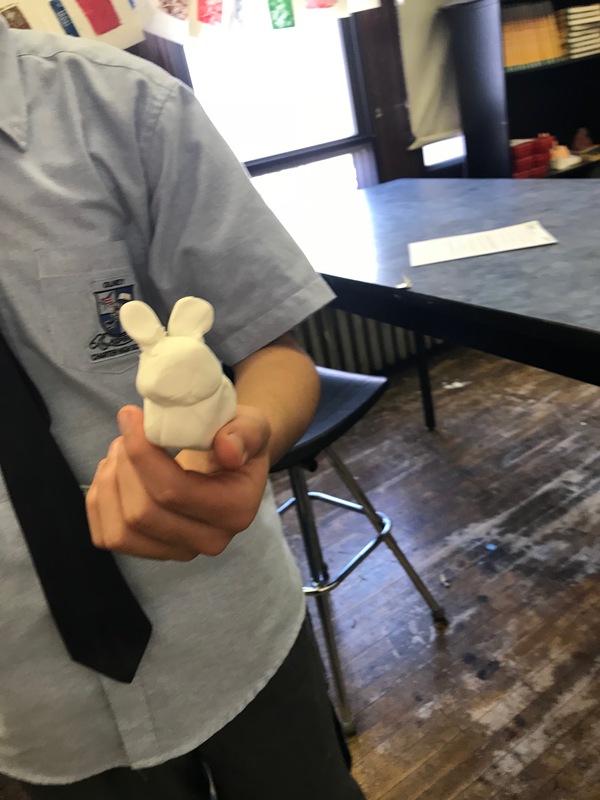 Multiple clay components were then joined together to form sculptures. 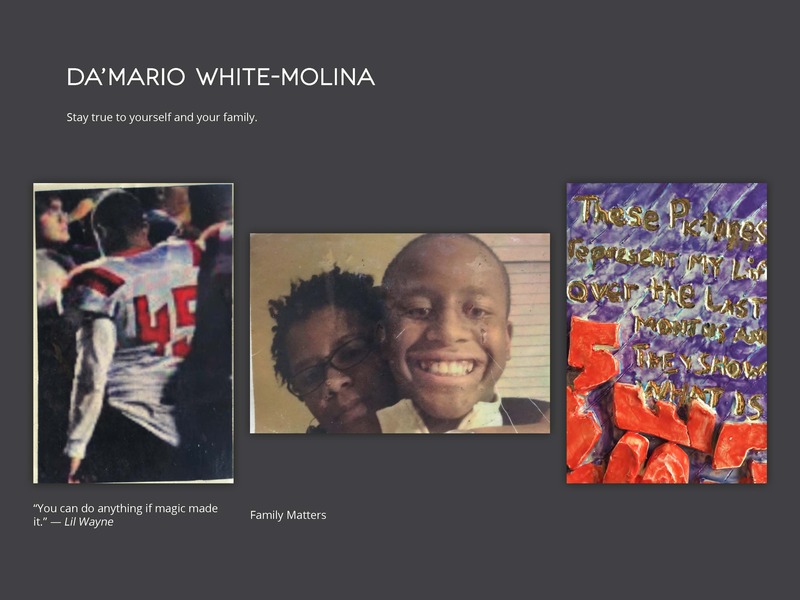 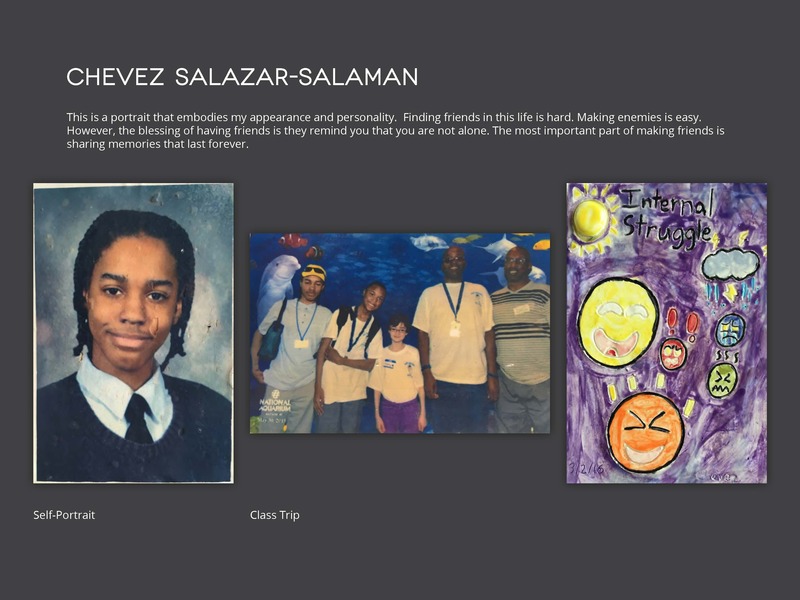 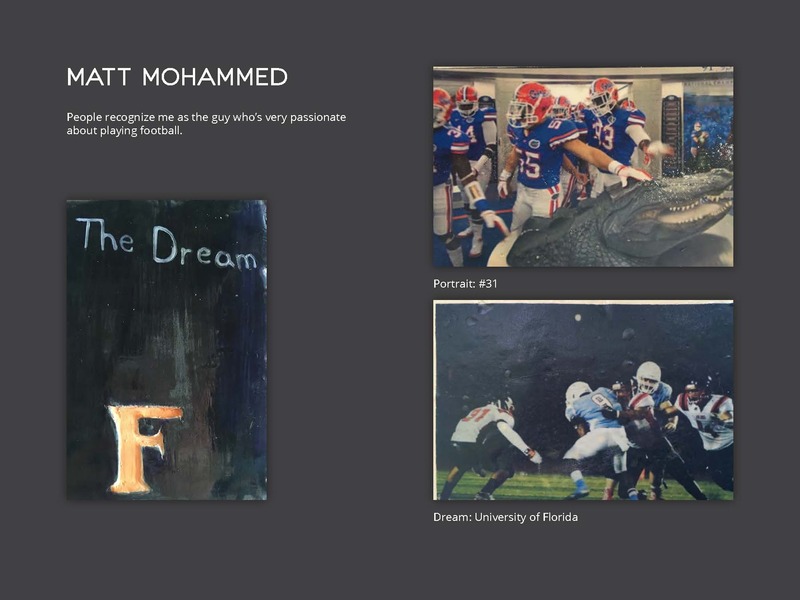 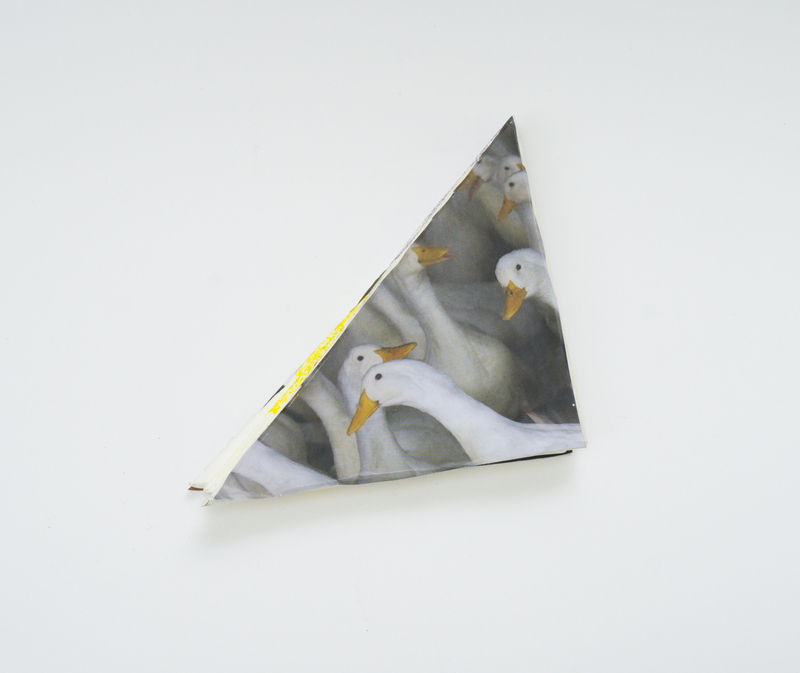 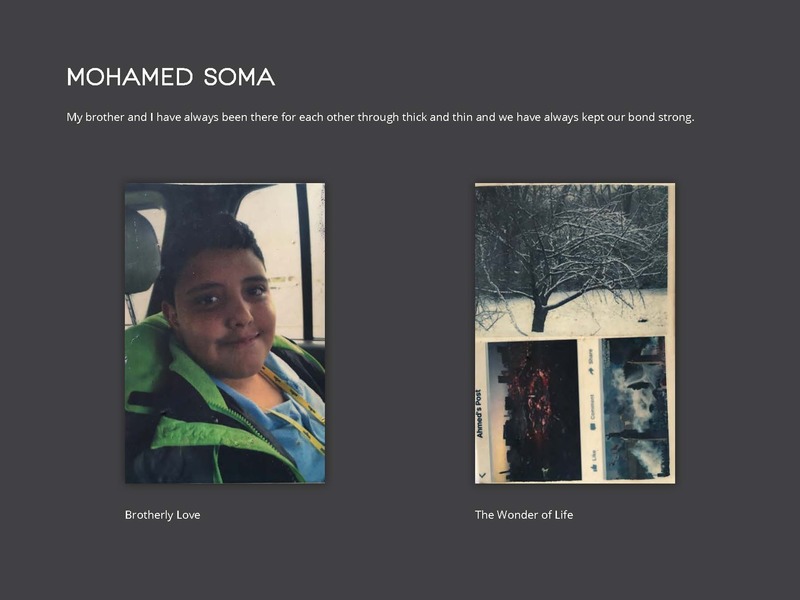 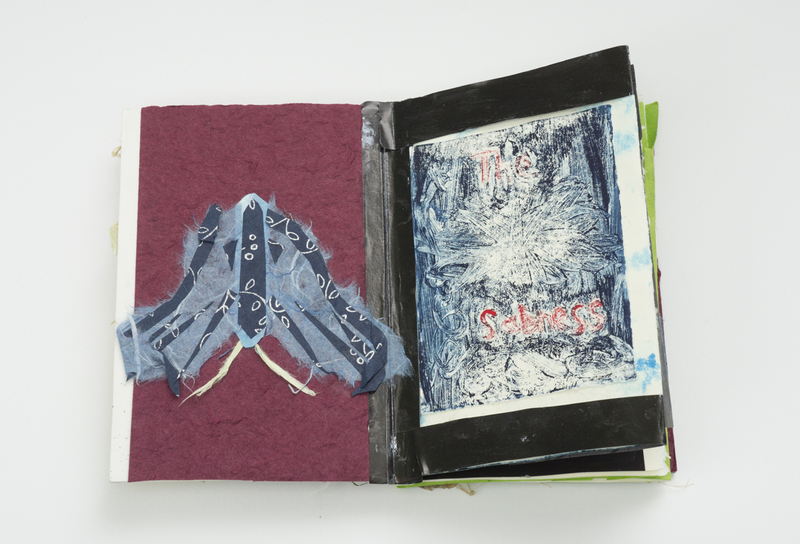 In the photo book created by the class, each student is represented by one of their photographs on one page and their sculpture on the opposite page. 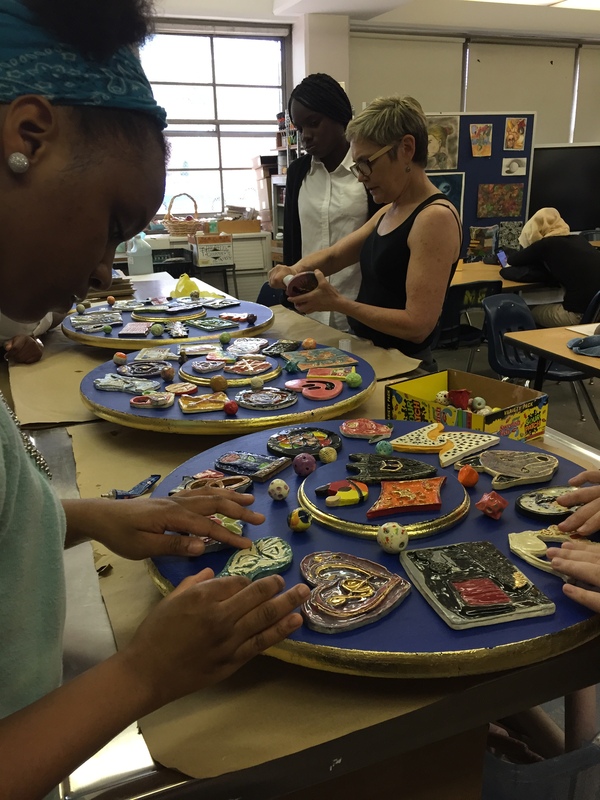 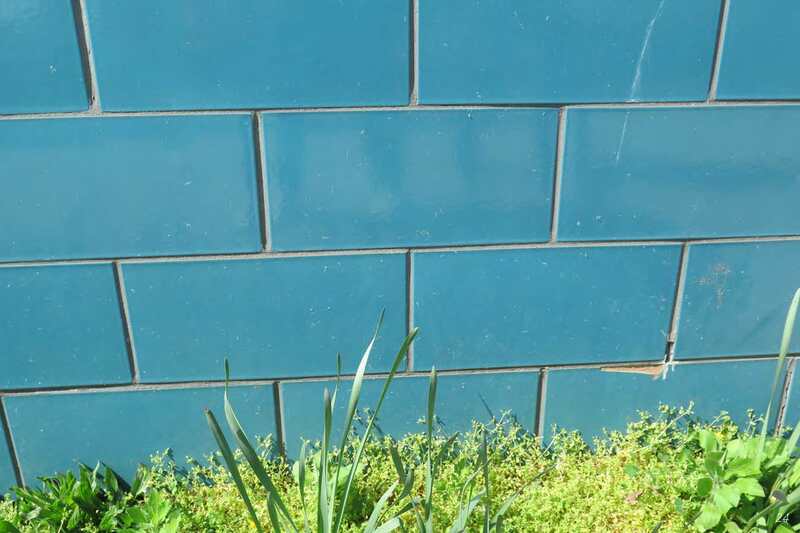 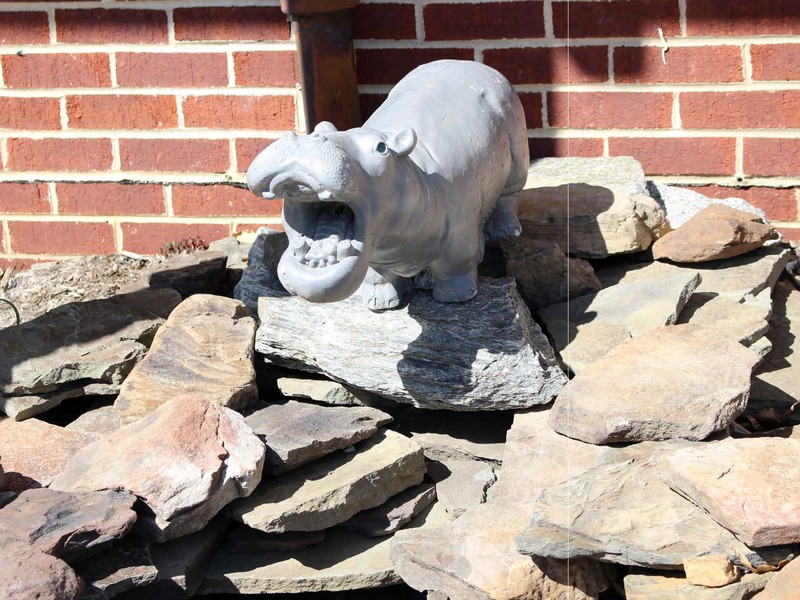 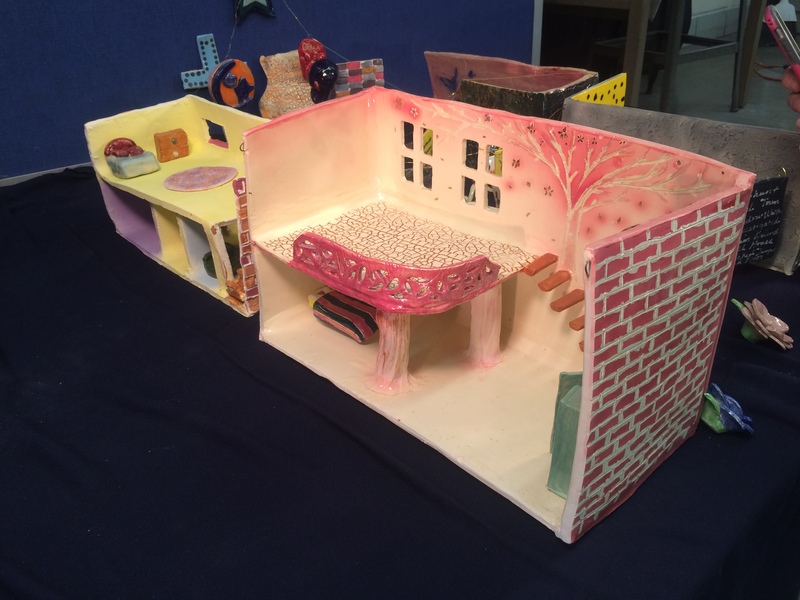 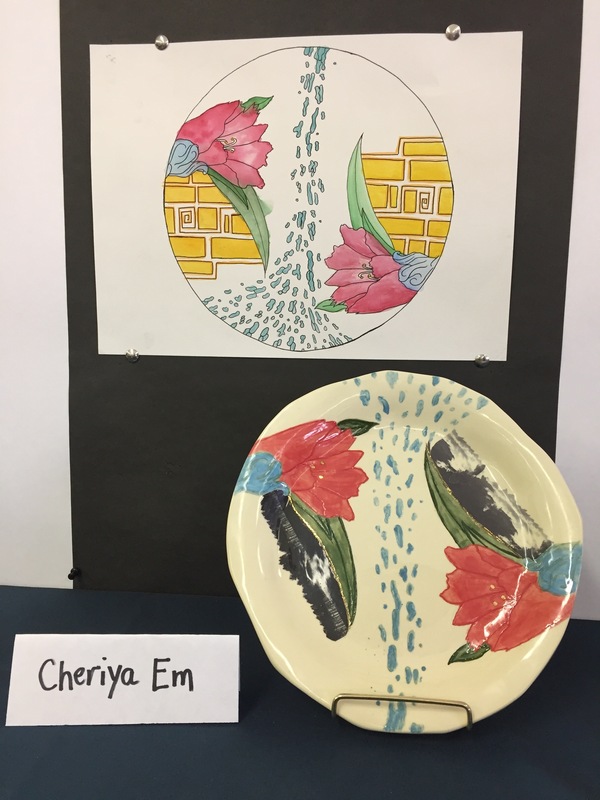 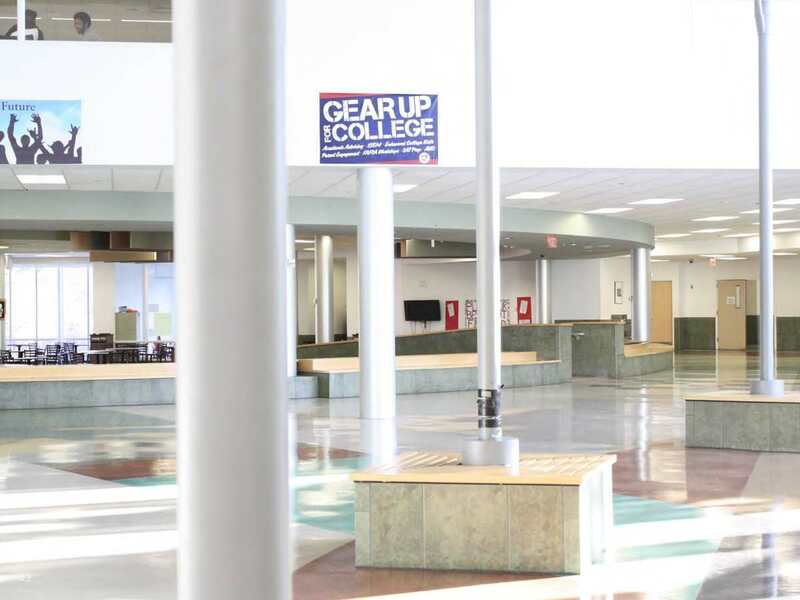 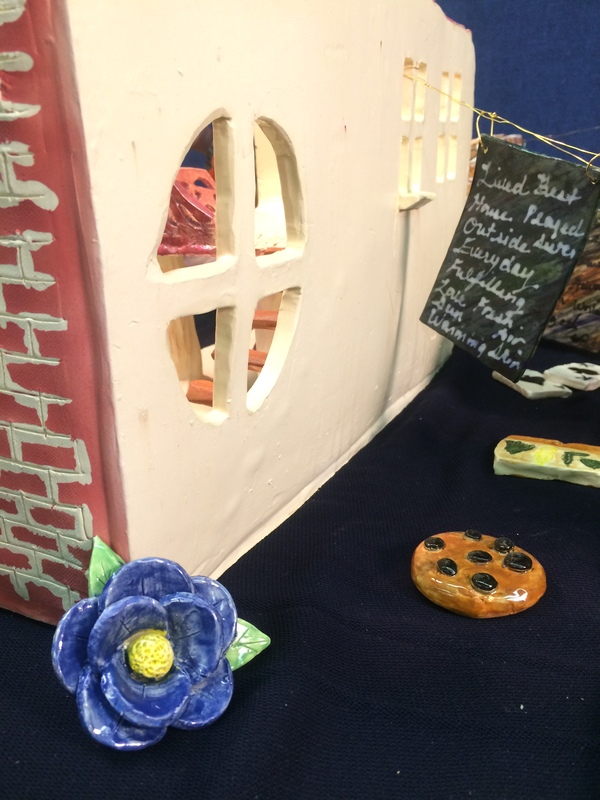 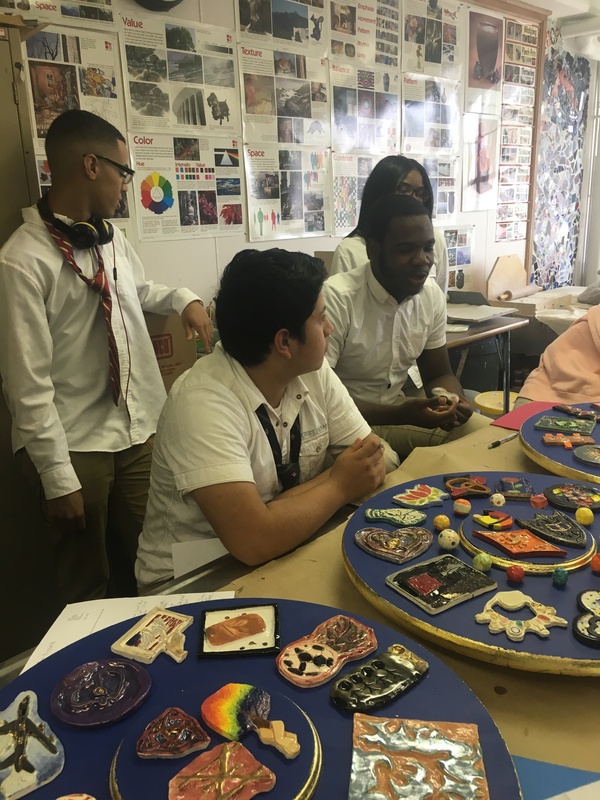 Two of art teacher Harmony Thompson’s ceramics classes at Northeast High School worked with teaching-artist Marguerita Hagan to create a permanent installation in their school. 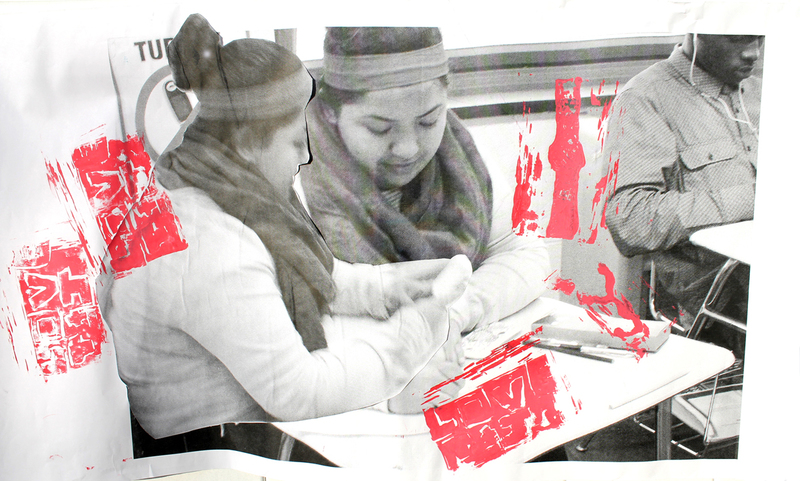 The semester began with students creating lists of things they valued. 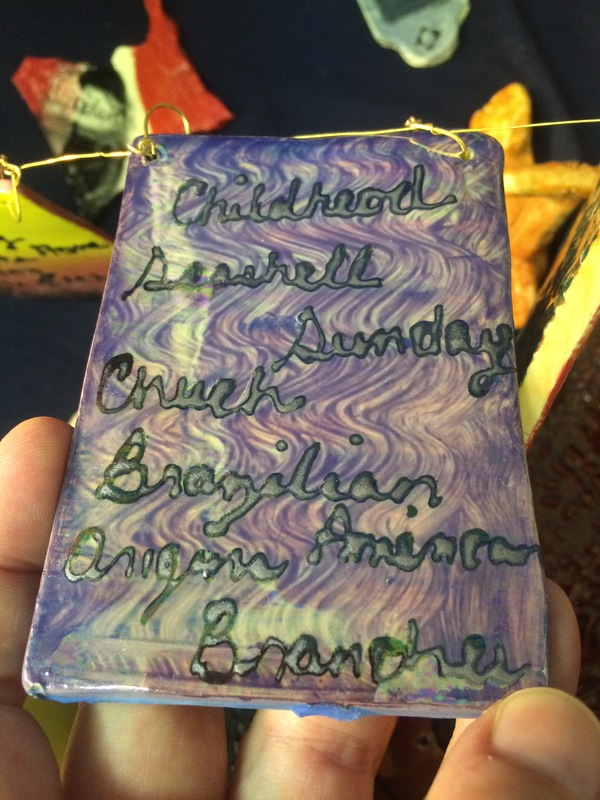 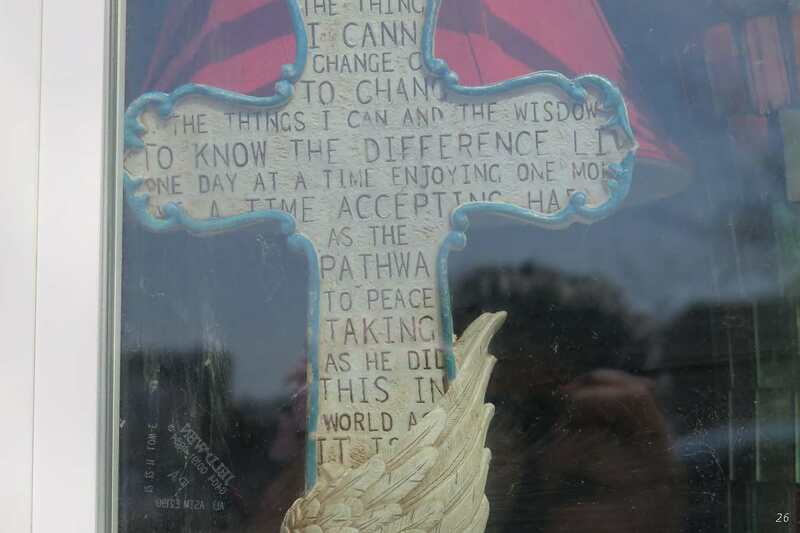 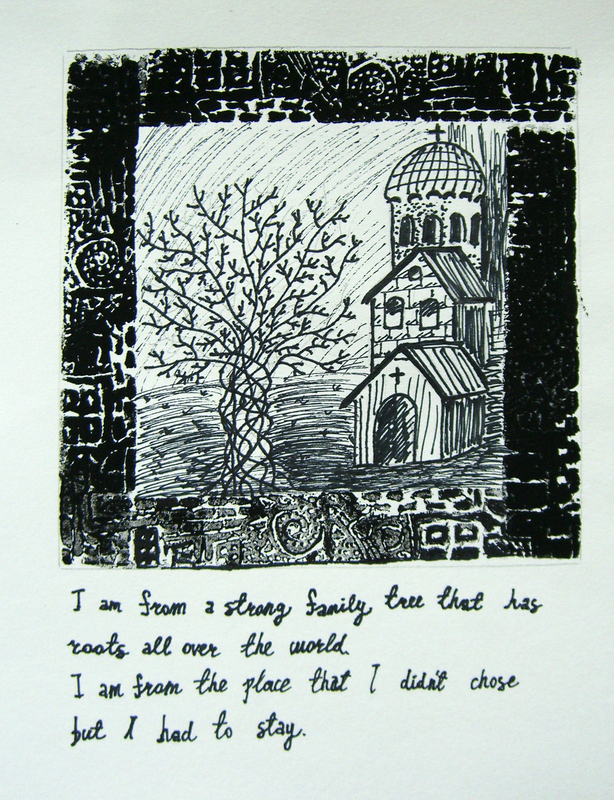 From that list, they each made drawings, which were then translated into carved clay slabs. 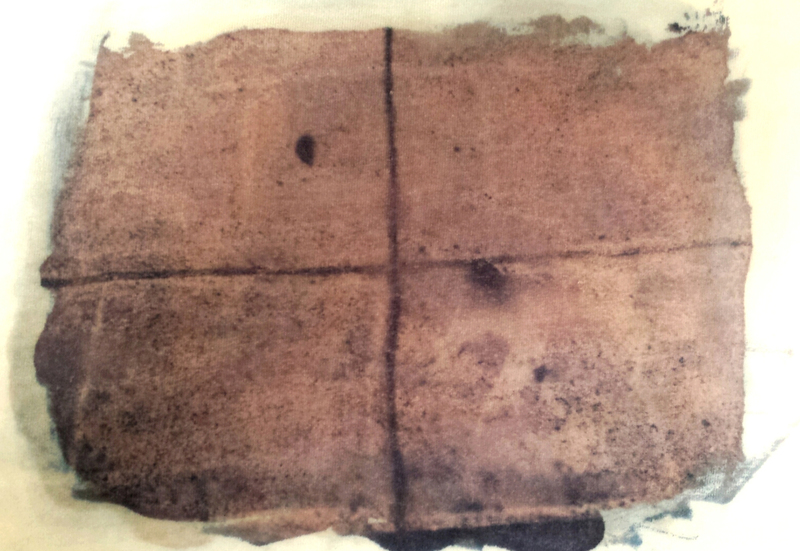 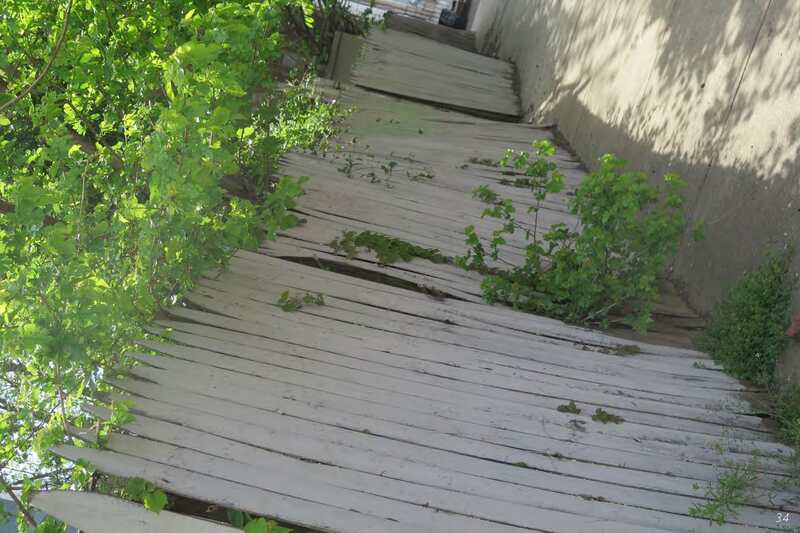 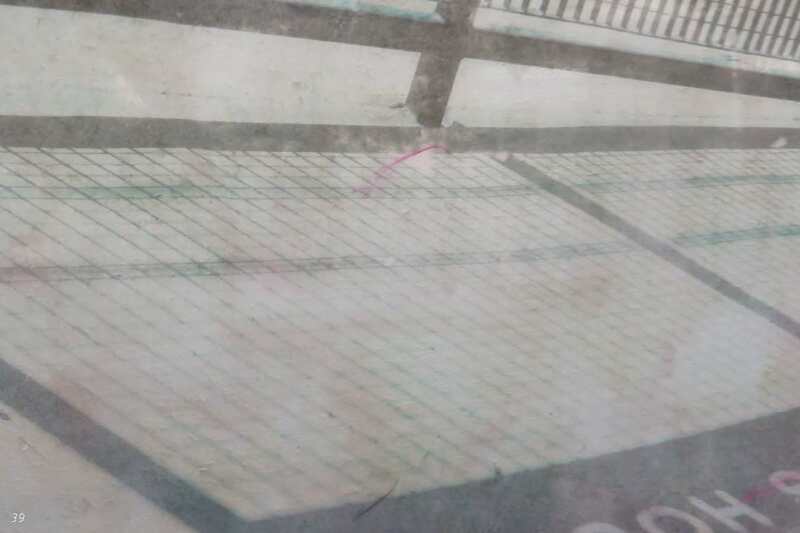 The slabs, which were kept damp, were then used as a printing matrix to create block prints. 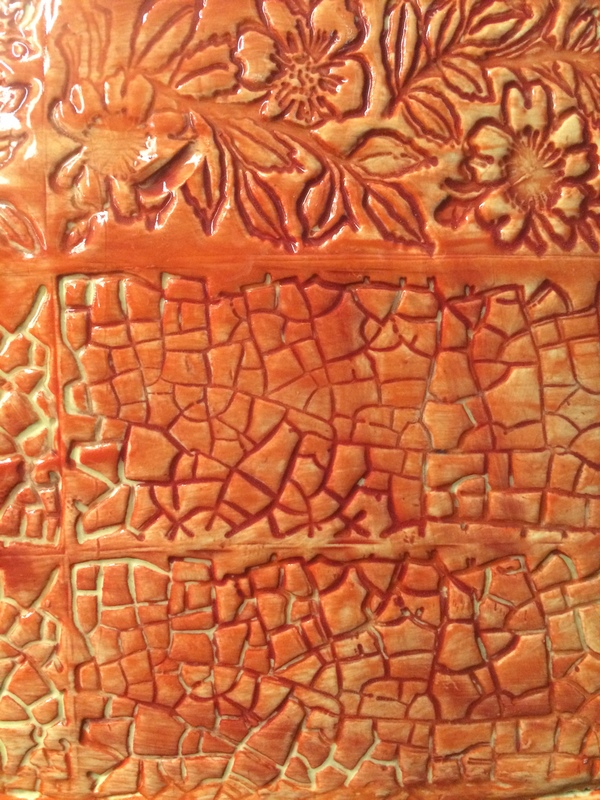 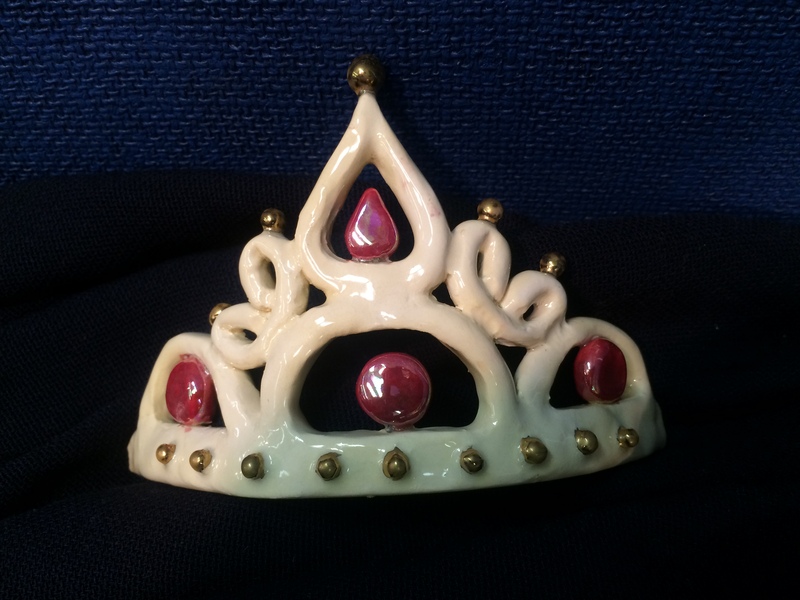 Once the prints were pulled, the pieces of clay were bisque fired, glazed and then refired. 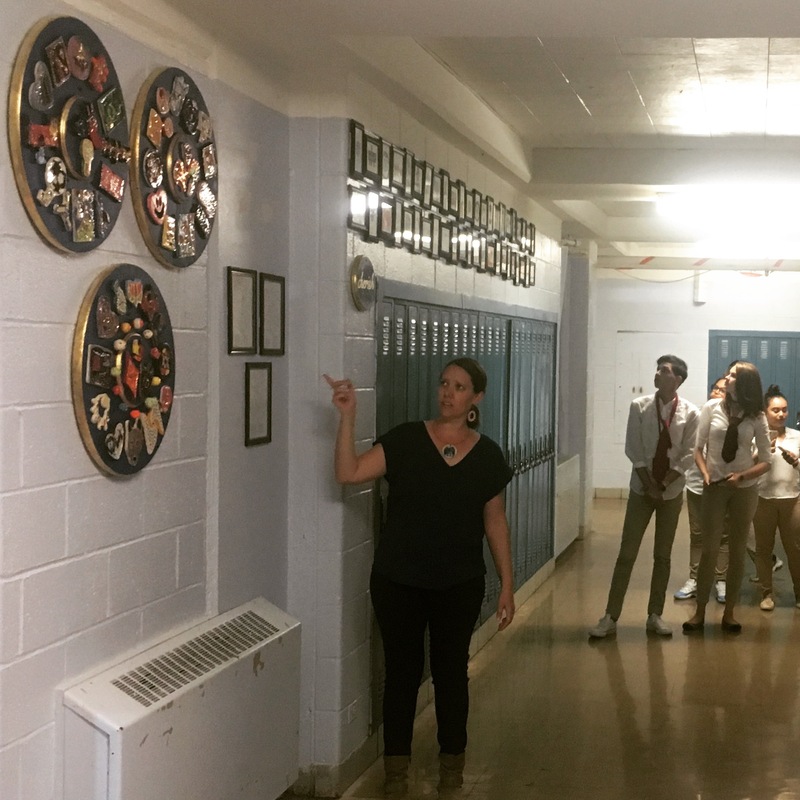 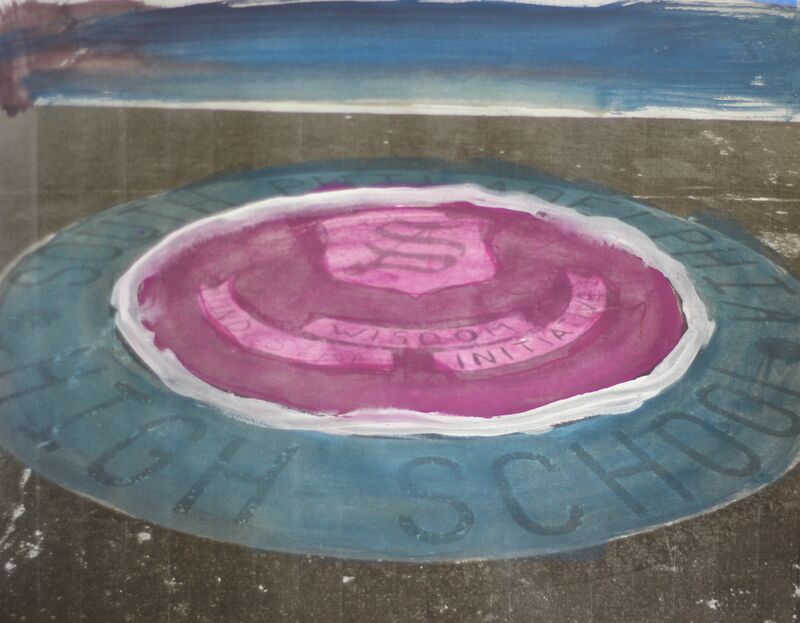 The resulting clay medallions were mounted onto panels, in an order that responded to the visual qualities of the individual contributions as determined by the students. 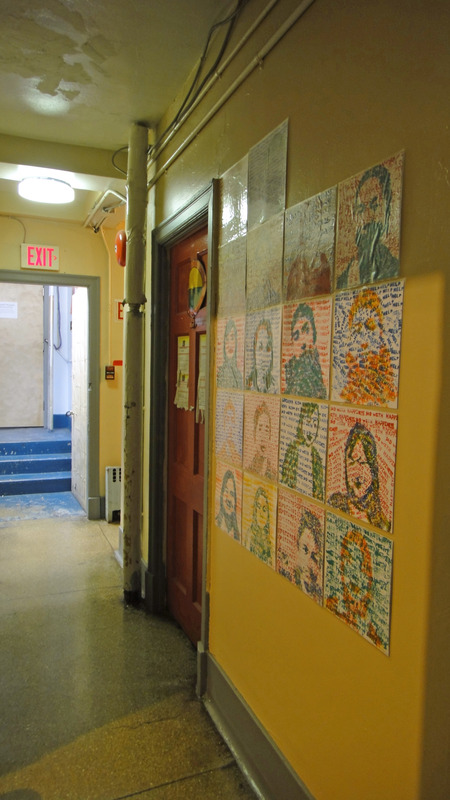 The panels were installed in the hall outside the ceramics studio along with a suite of the corresponding prints. 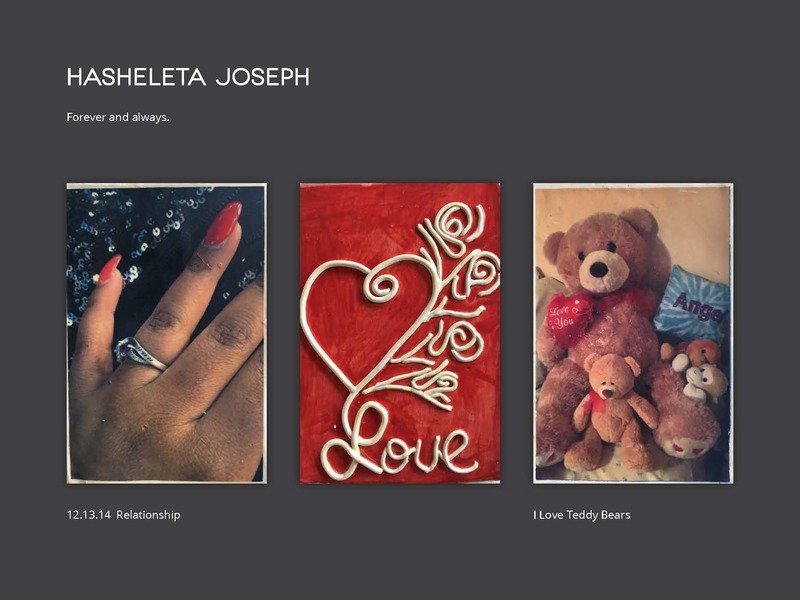 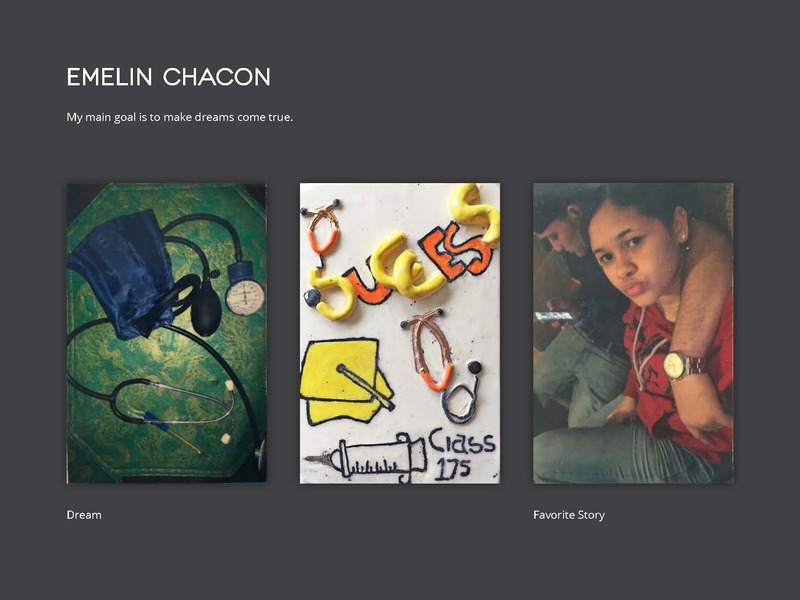 Entitled Cherish, this project literally and figuratively brought the students’ values, learning and methods full circle. 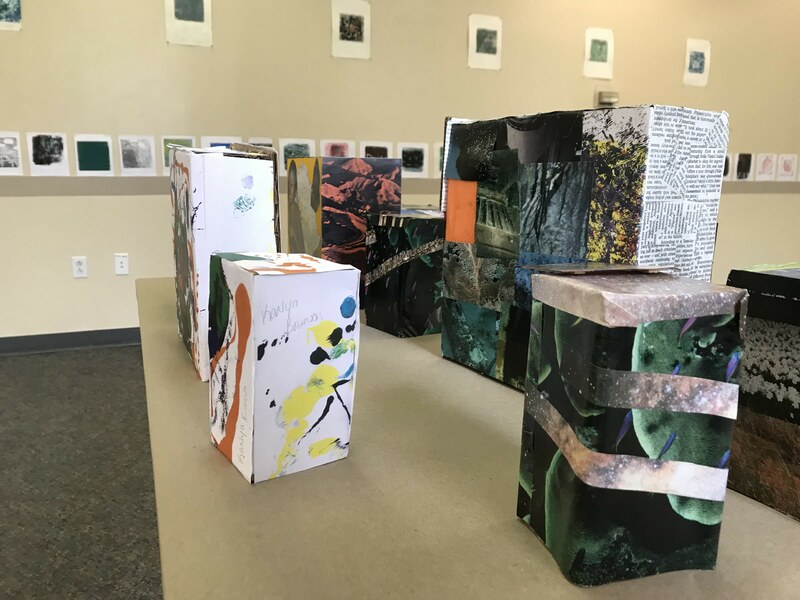 Students from two of art teacher Linda Heeg’s classes at School of the Future collaborated with teaching-artist Grimaldi Baez to create a series of publications, videos and a site specific installation in the classroom, which functioned as a library and reading room. 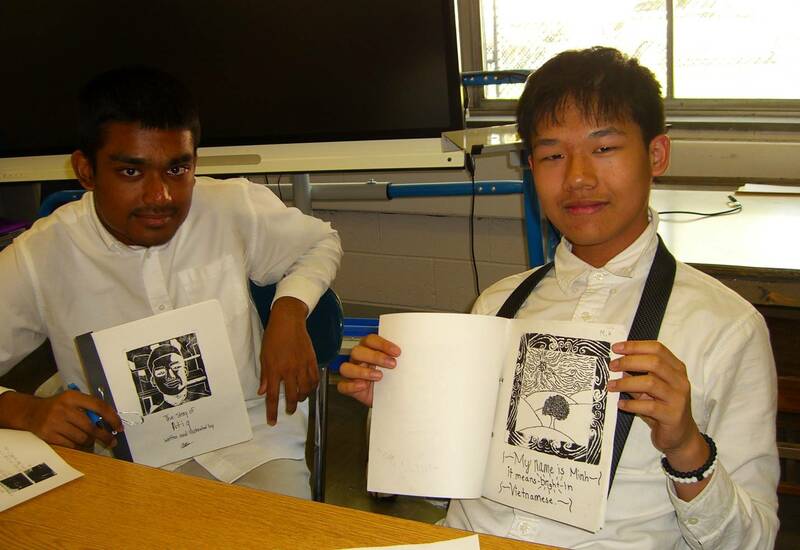 Agreeing as a group that their school’s library was “not for them,” the students decided to create their own library in what they called “their own image.” The checklist for their library included comfortable seating, books, music, “cool art,” a place to socialize and “no adults.” Using a photocopier, students made their own publications, the contents of which were created through a series of exercises designed by the students, which included designing and creating their own art-making tools. 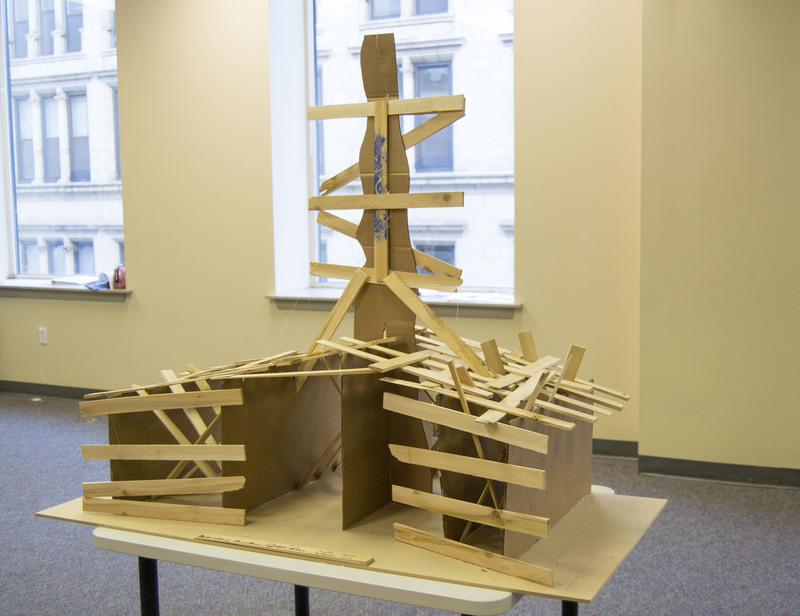 Projects undertaken during the semester relied on critical thinking, ingenuity and collective effort. 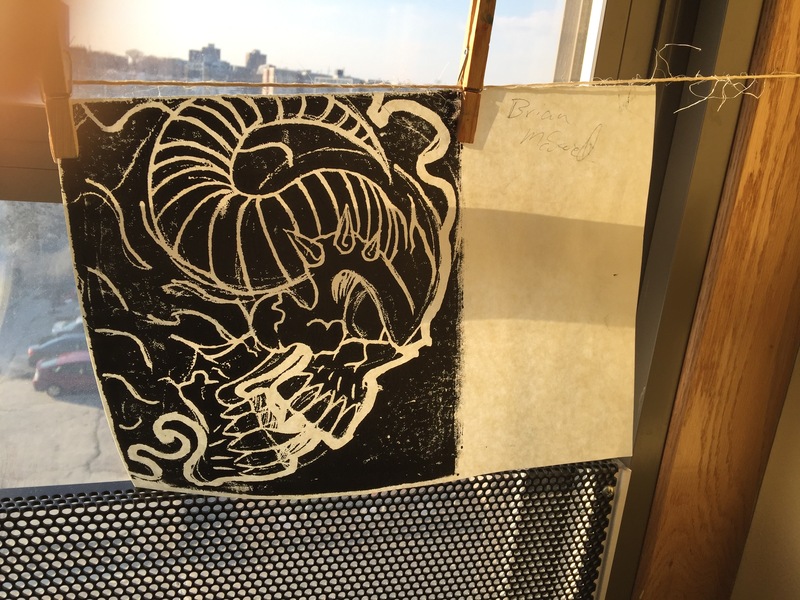 In the fall of 2016, AISP classes responded to two exhibitions at The Print Center: Victoria Burge: Penumbra and Celestial/Terrestrial. 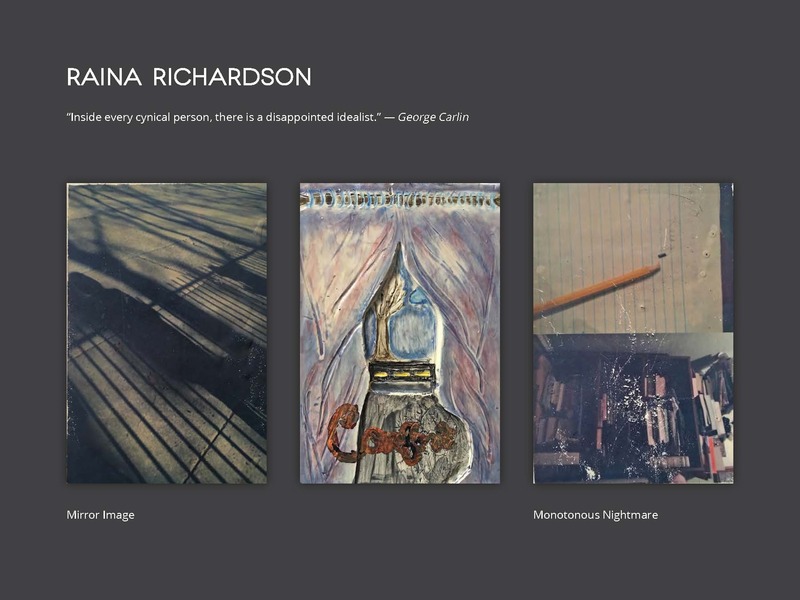 The curriculum drew on the ways the artists in these exhibitions approached the idea of the sublime. 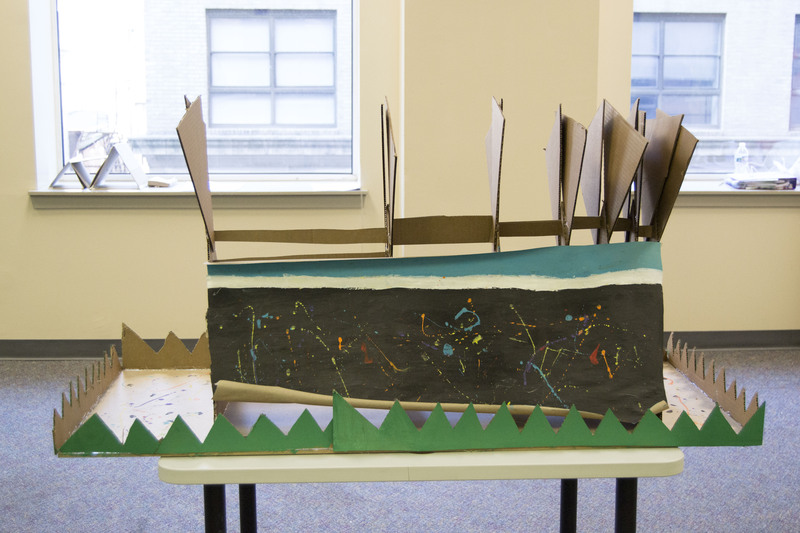 Projects explored the variety of scale through which each of us may experience the sublime, from the epic to the minute. 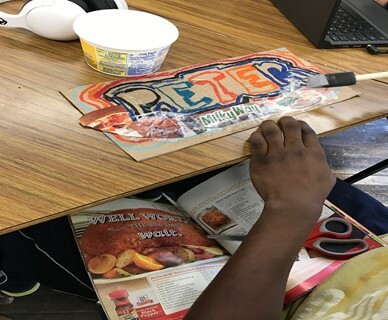 Students were asked to create art works that manifested the things that awed them, drove them crazy and connected them to a life that is bigger than themselves. 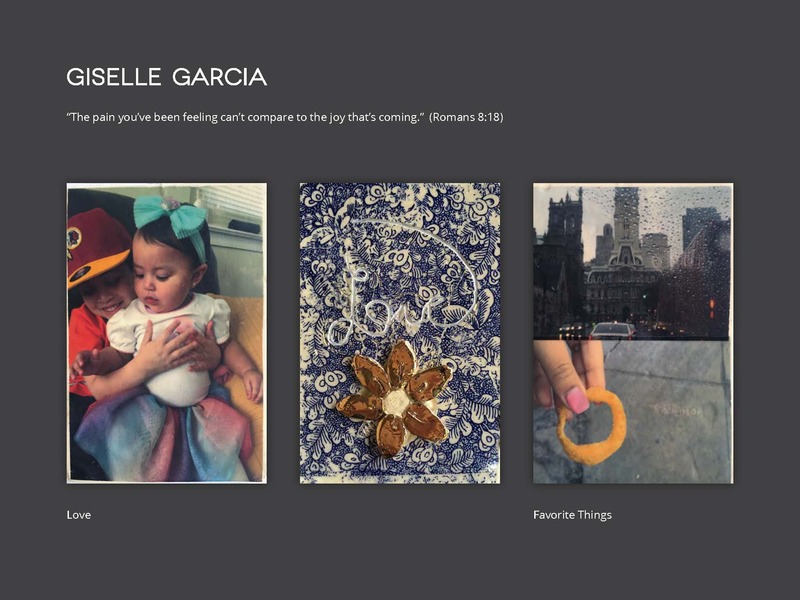 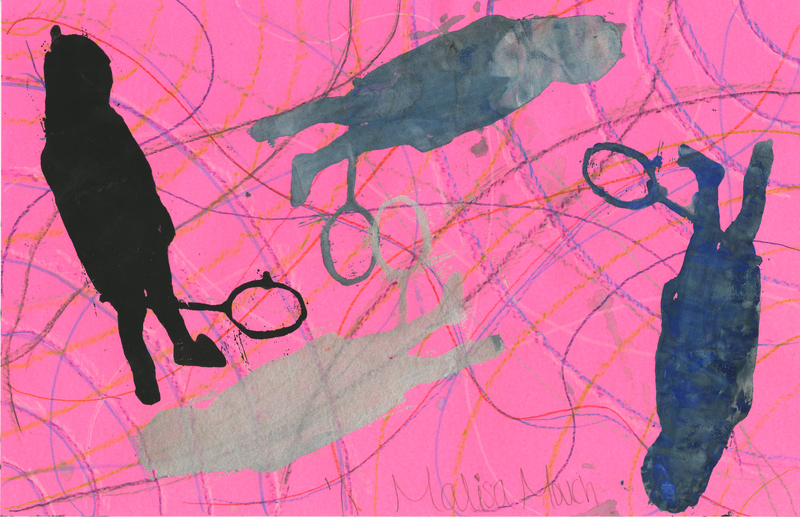 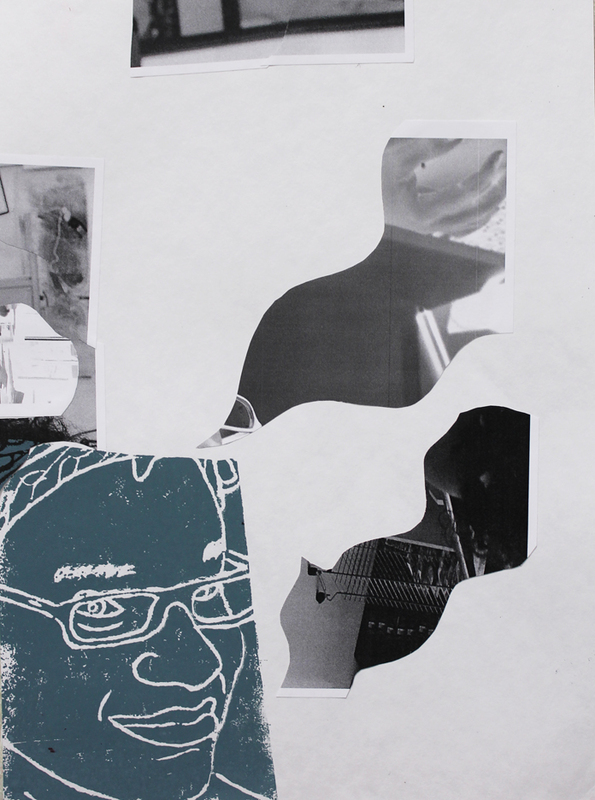 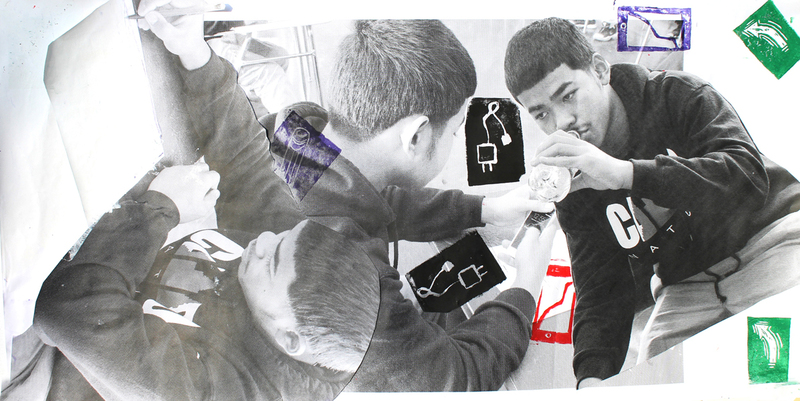 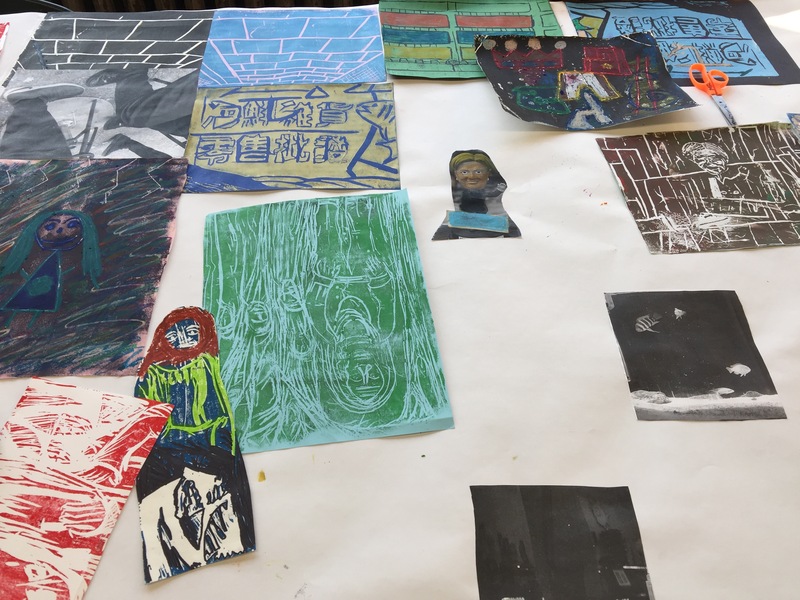 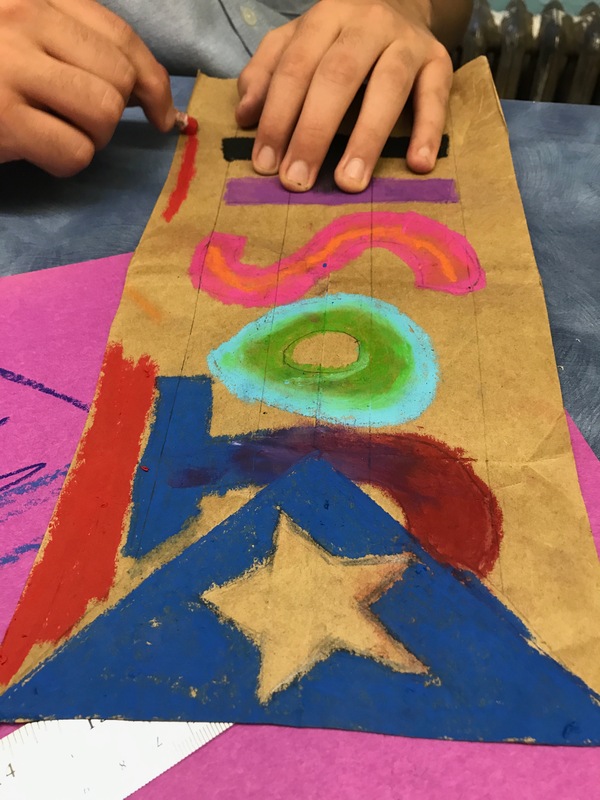 Two of art teacher Josh Kleiman’s classes at The U School worked with teaching-artist Marilyn Rodriguez on projects exploring collage, printmaking and photography. 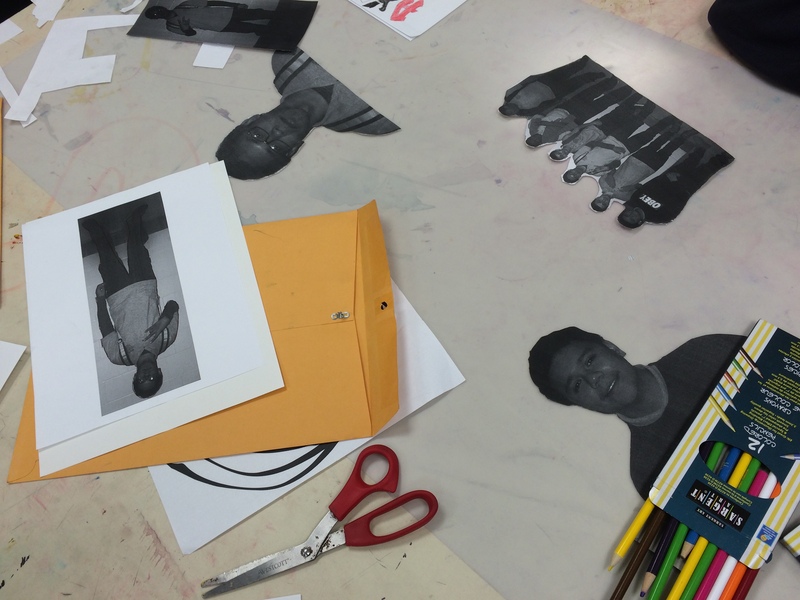 The semester started with students creating collaged nameplates, using a variety of printed materials. 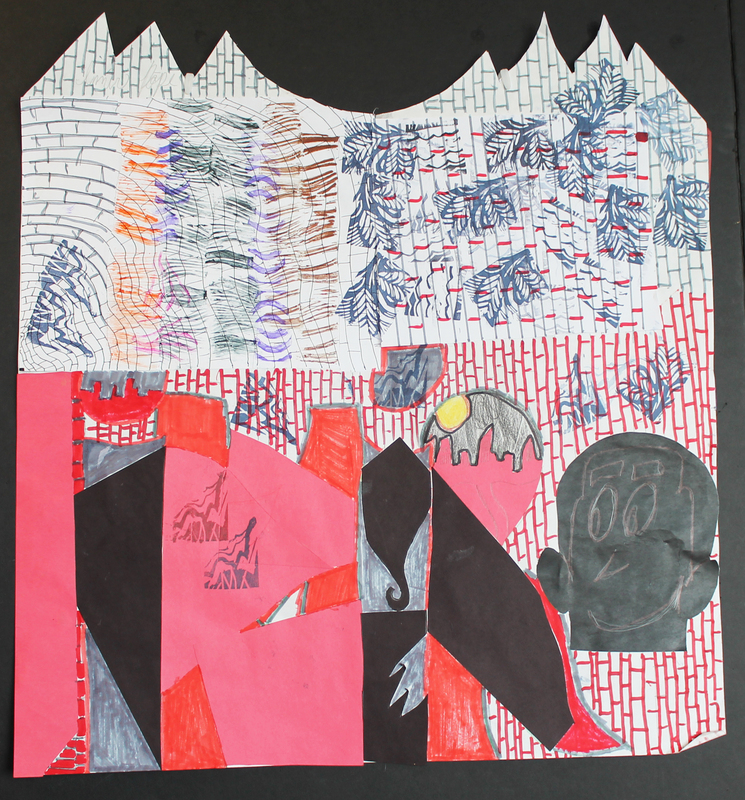 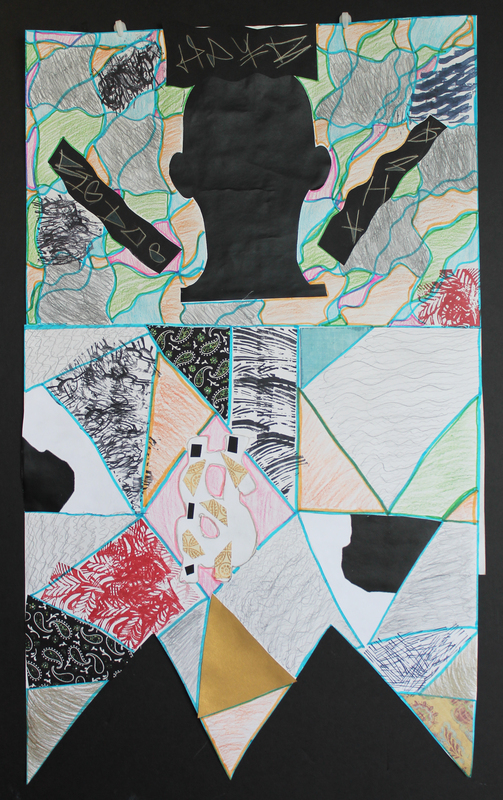 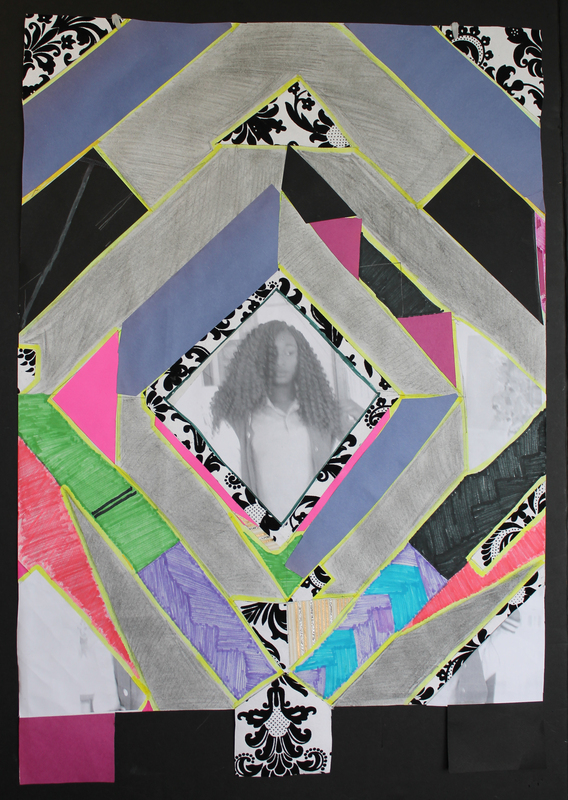 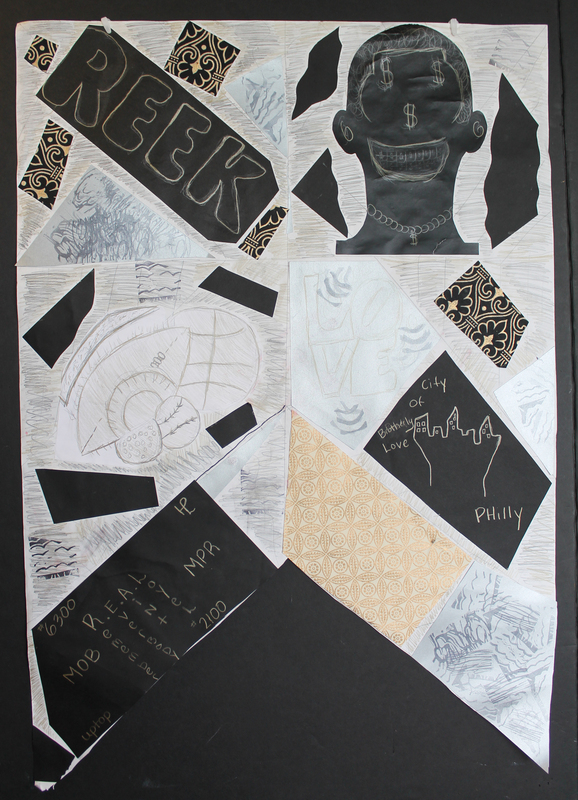 Students worked over these collages with pencil, pastels and other drawing media. 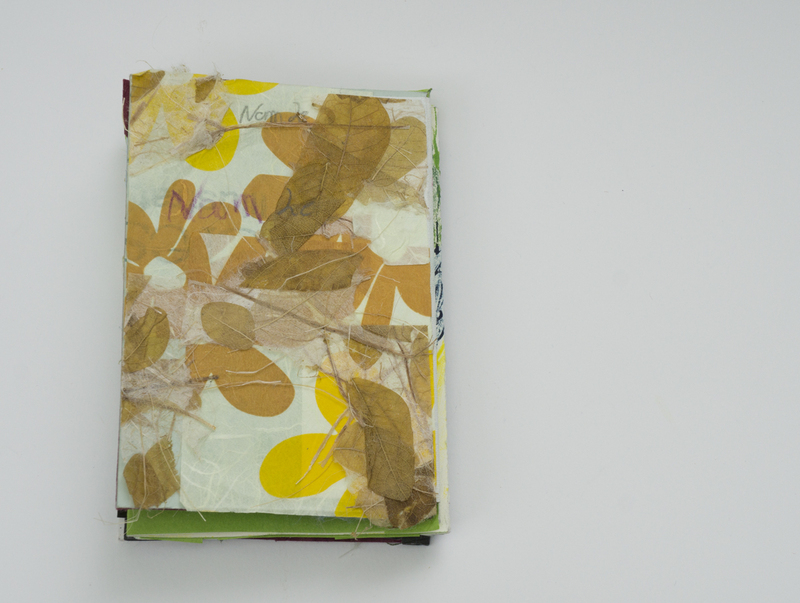 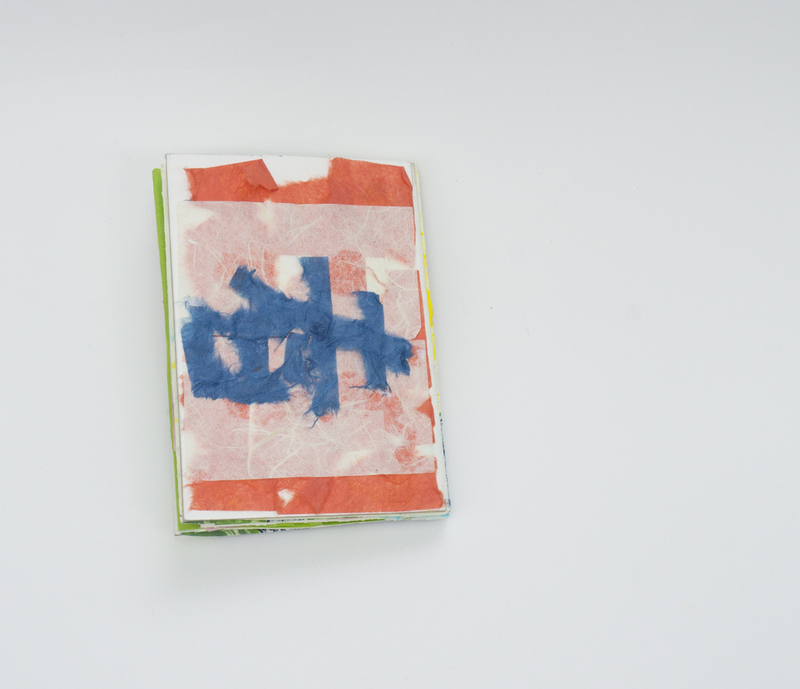 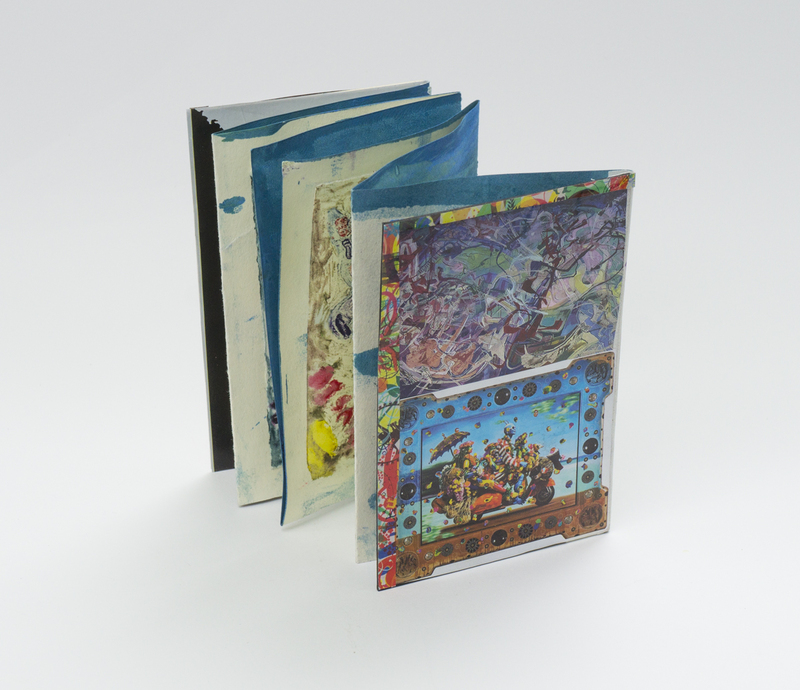 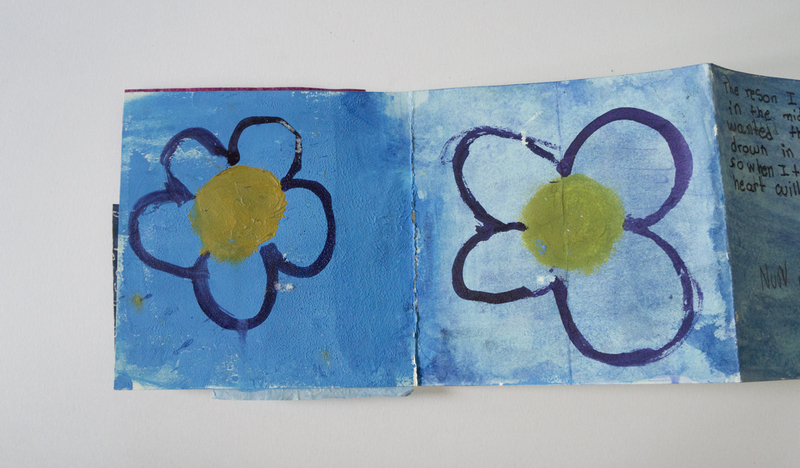 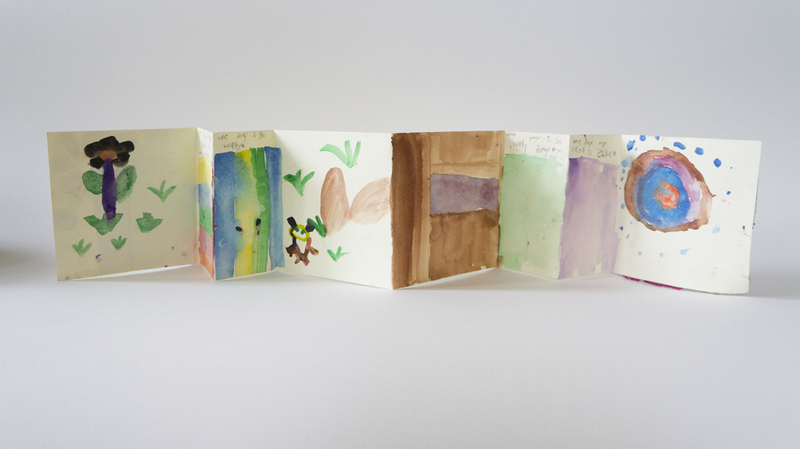 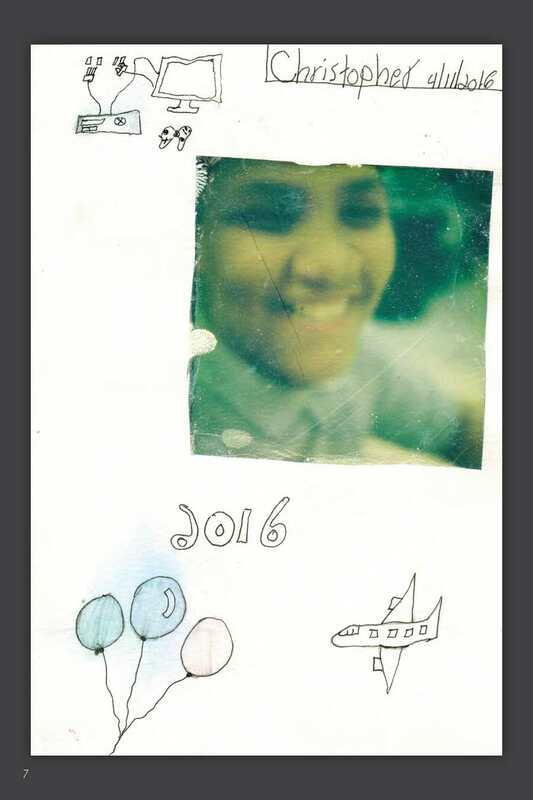 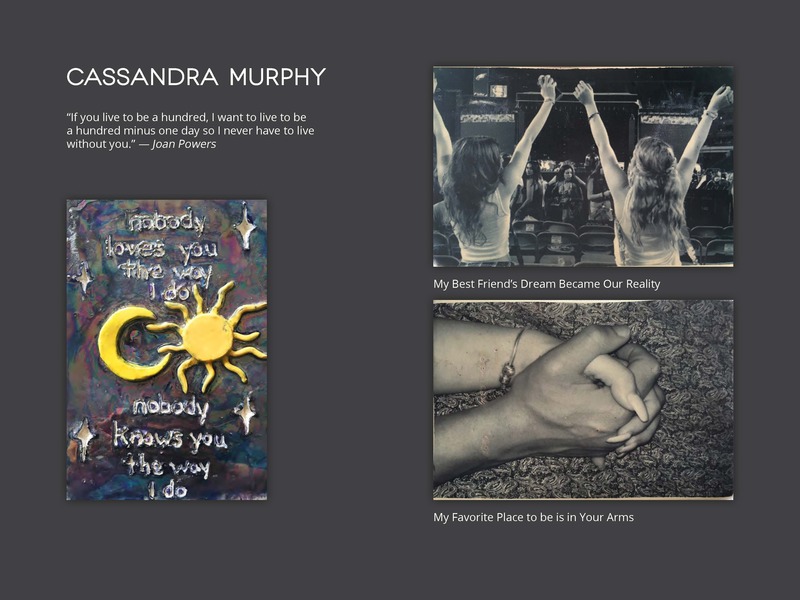 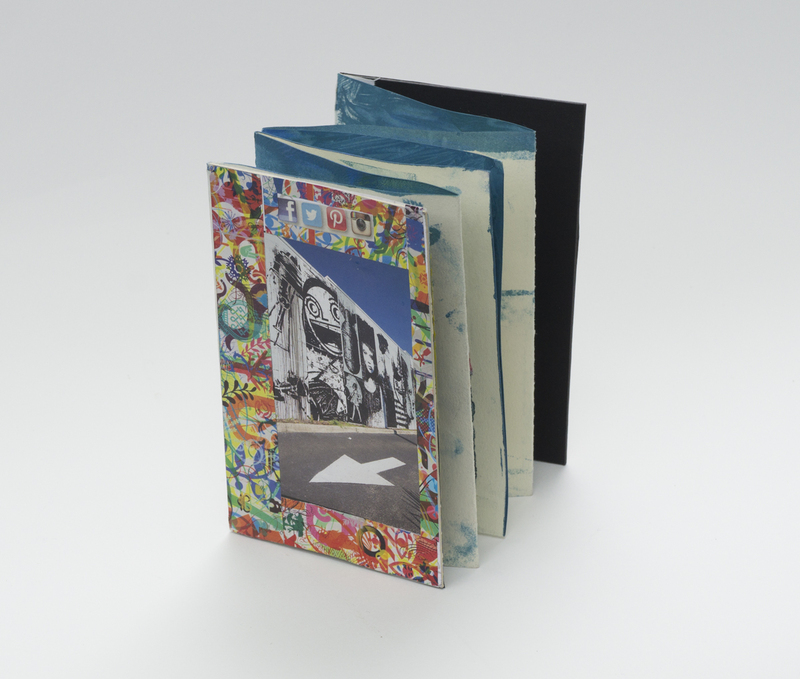 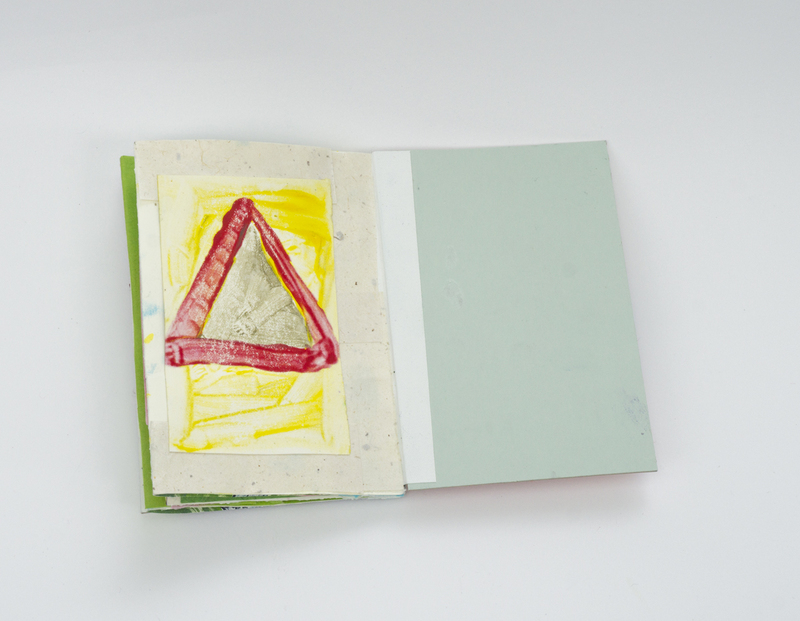 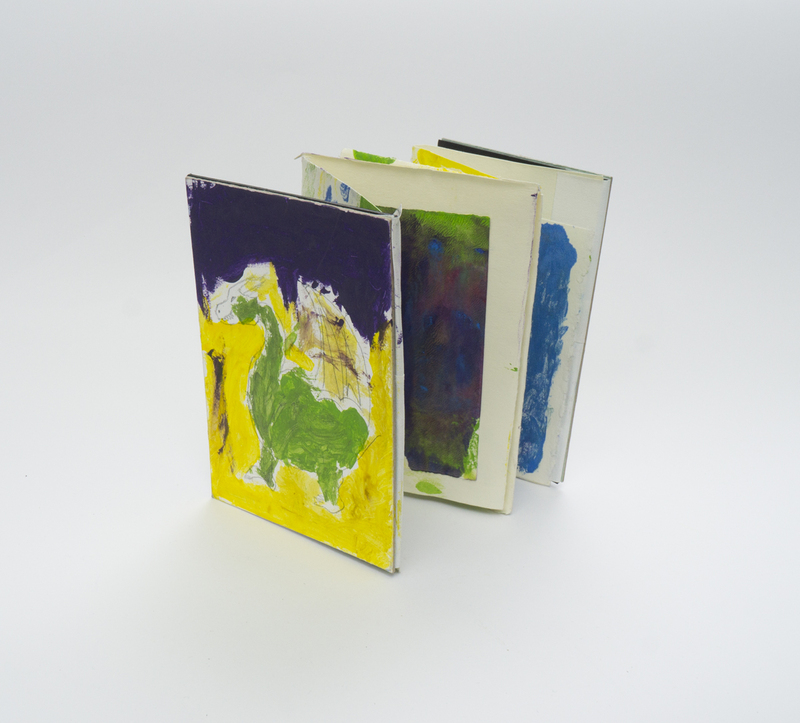 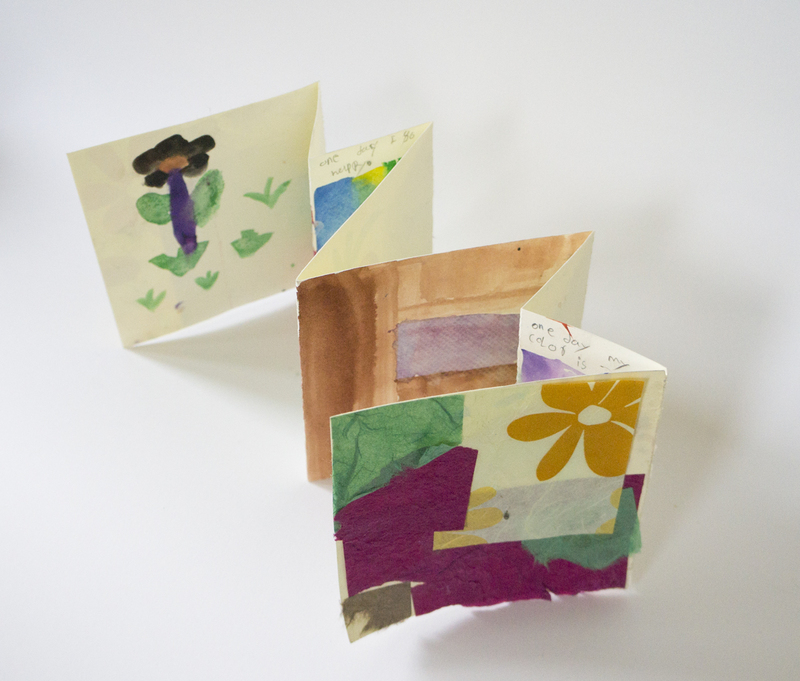 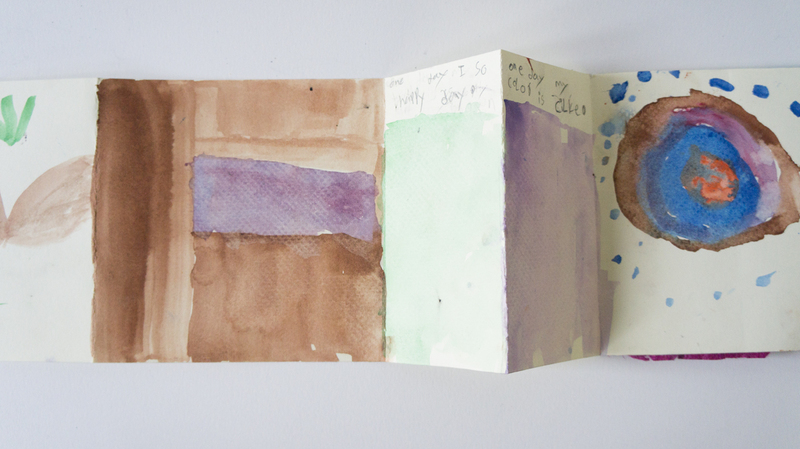 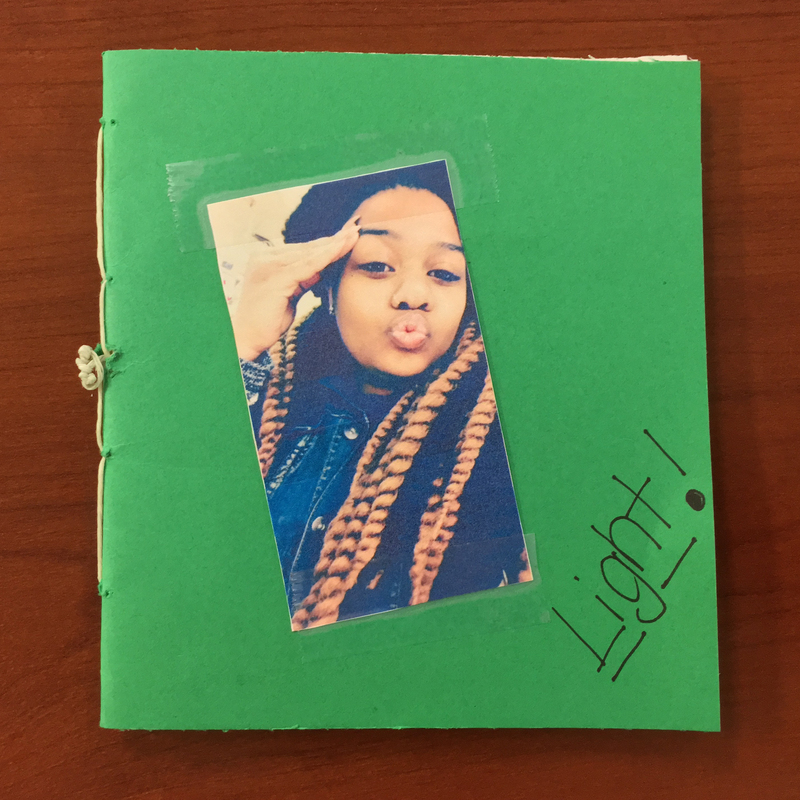 For a second project, students created their own personal hand-bound photo books. 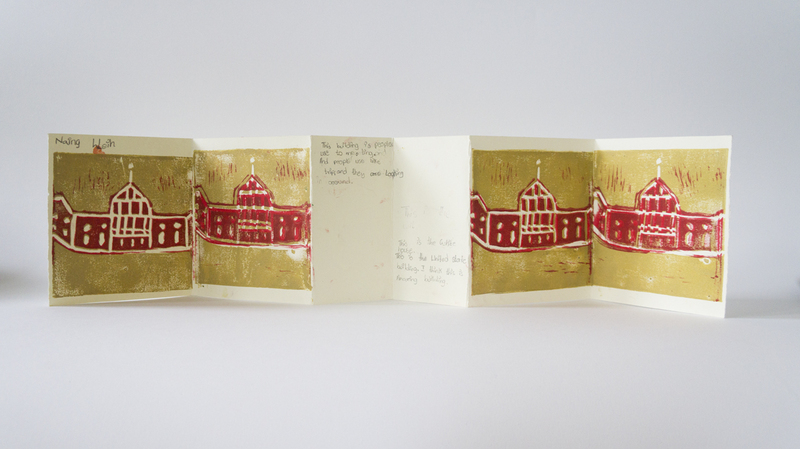 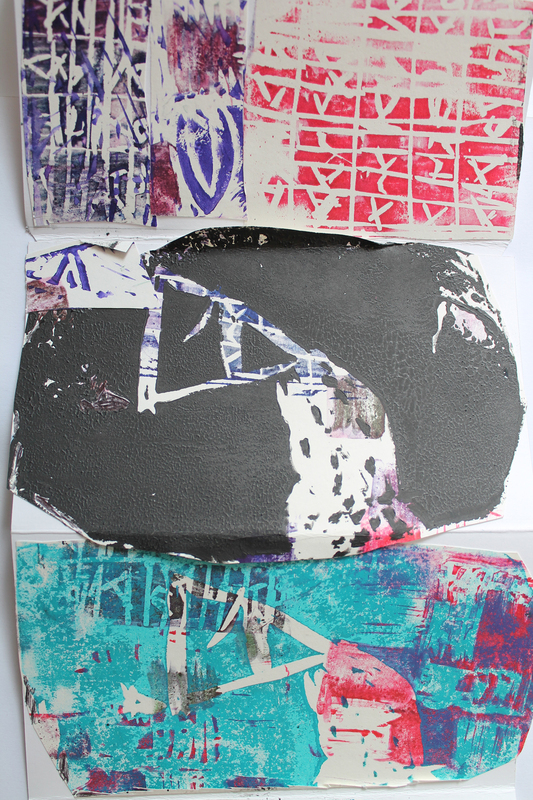 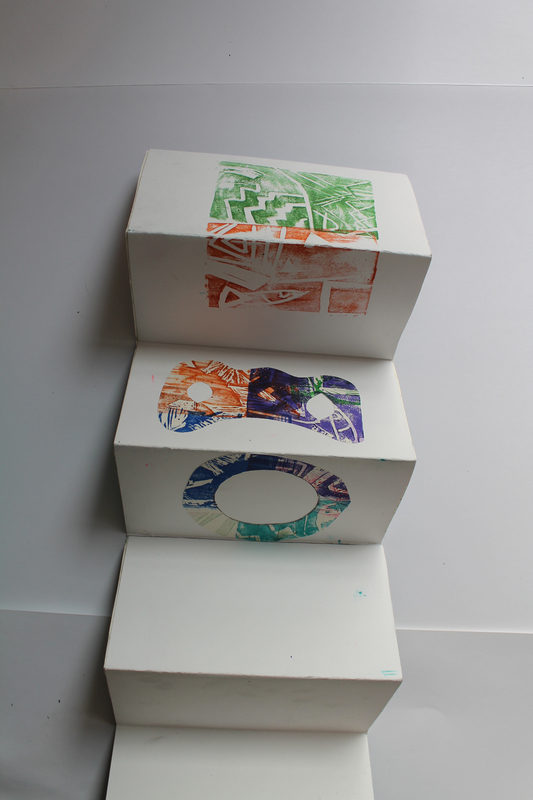 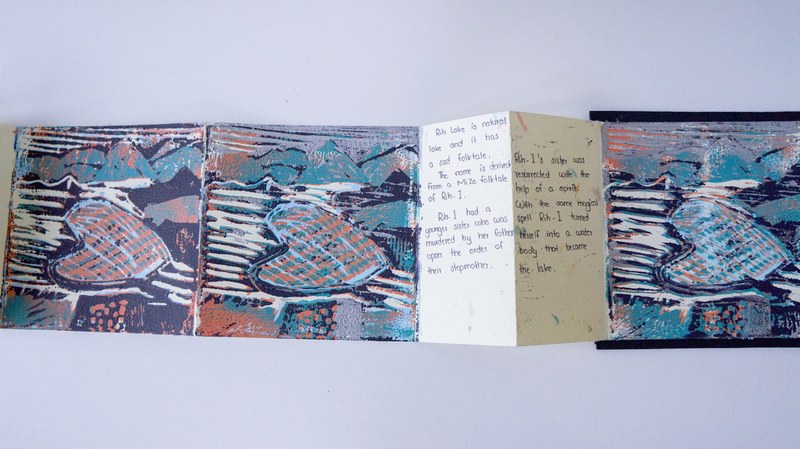 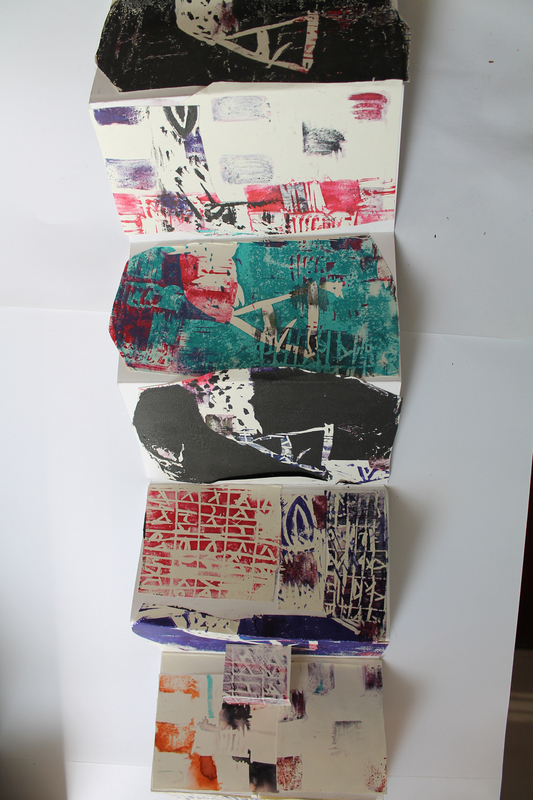 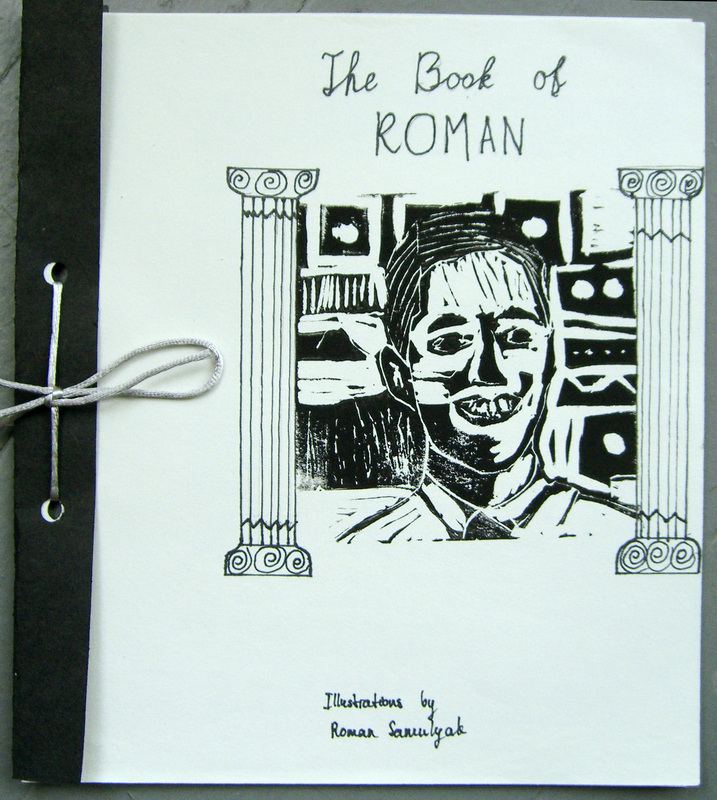 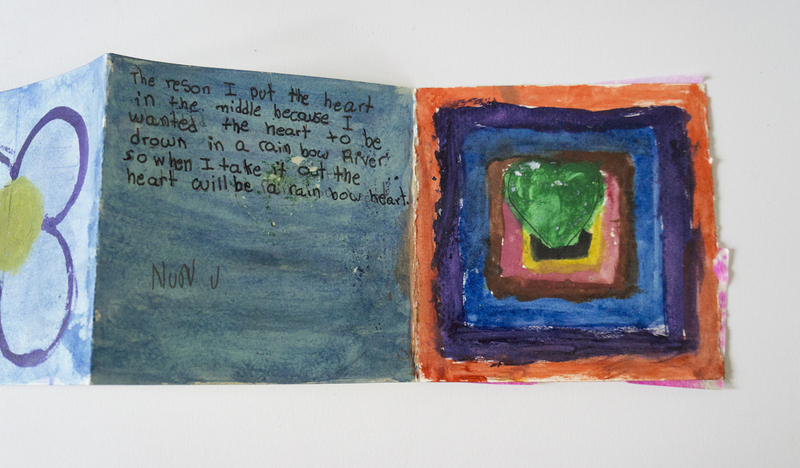 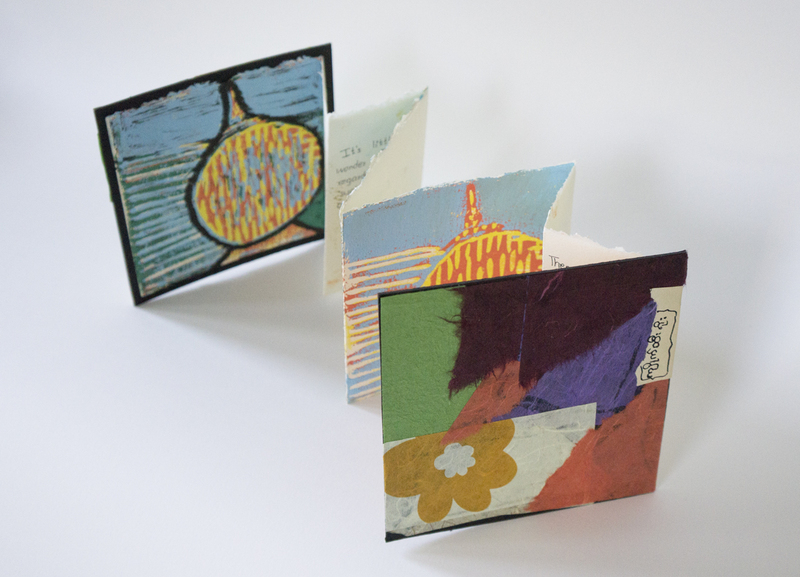 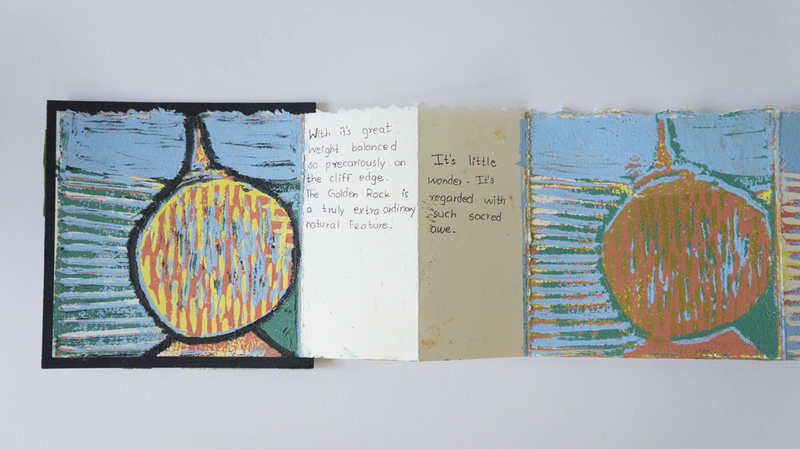 The covers of the books were made by the students using collagraph prints. 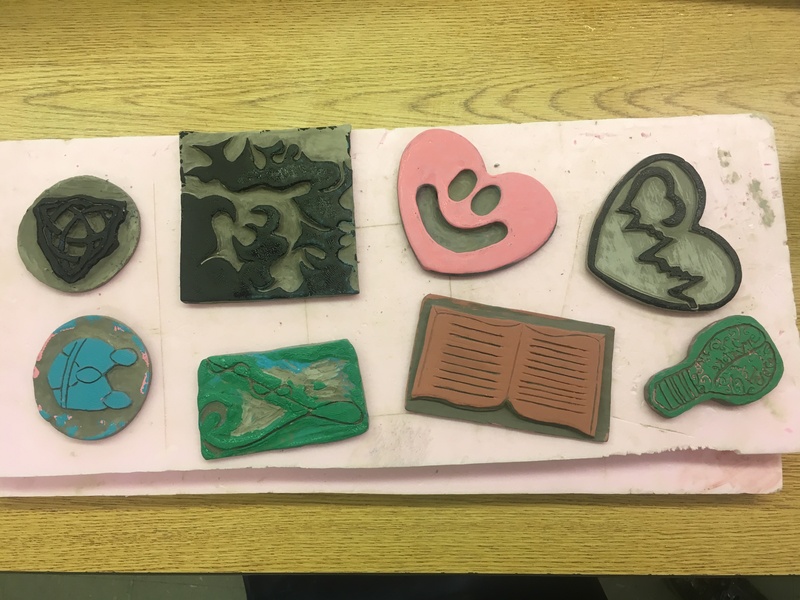 Students created these prints during experimentation with making plates using fun-foam and a variety of relief printing processes. 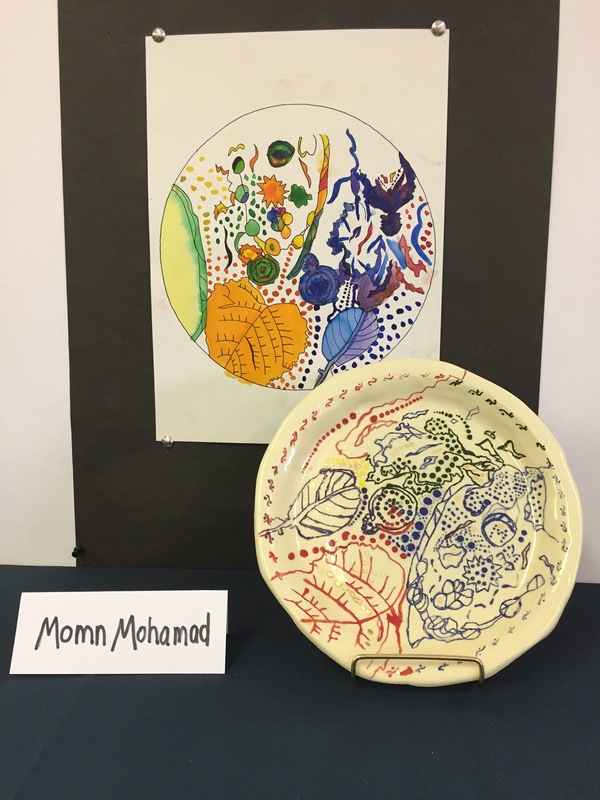 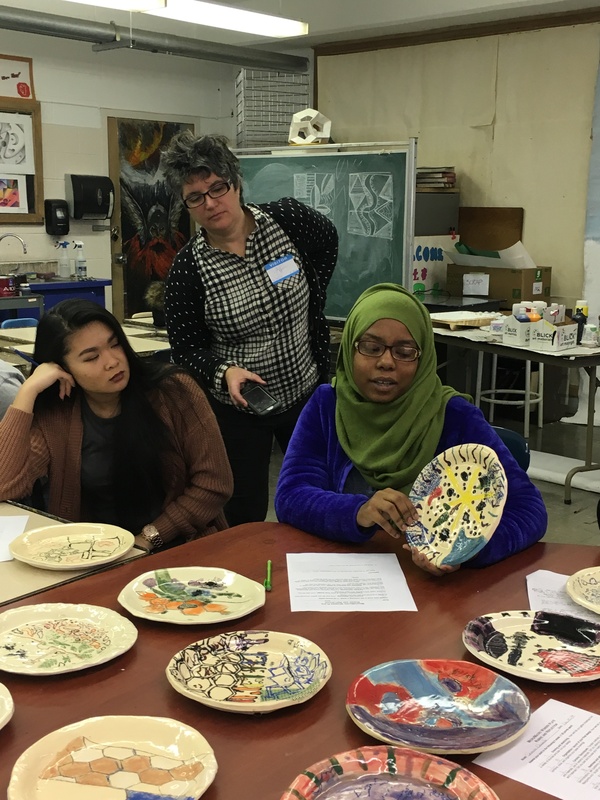 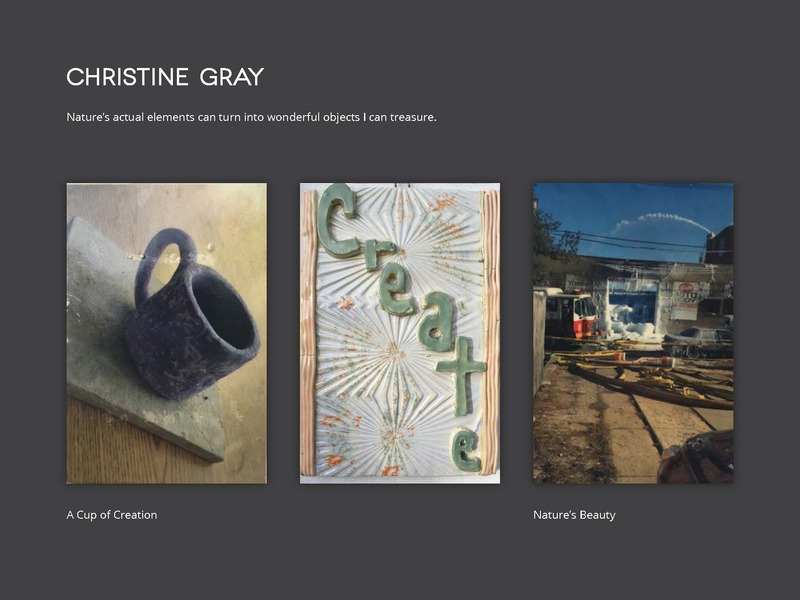 Two of art teacher Harmony Thompson’s ceramics classes at Northeast High School worked with teaching-artist Marguerita Hagan on projects that combined scientific exploration, printmaking and ceramics. 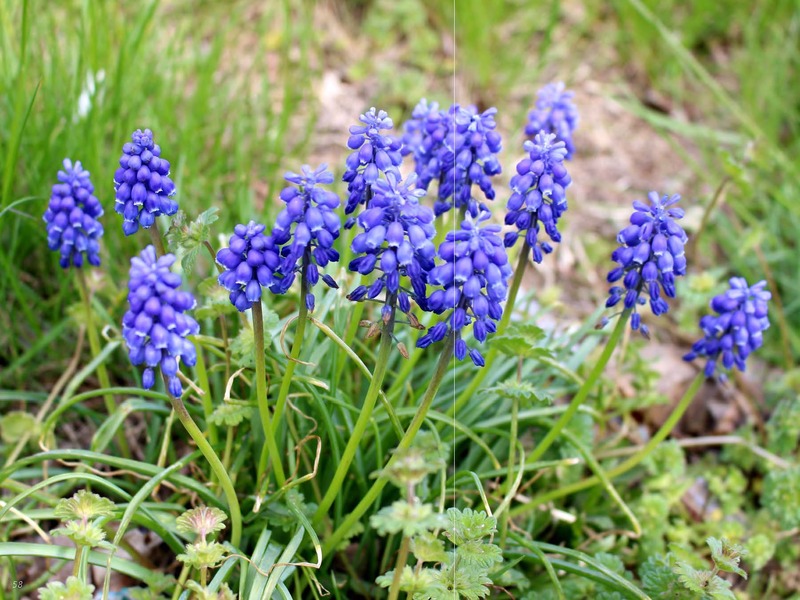 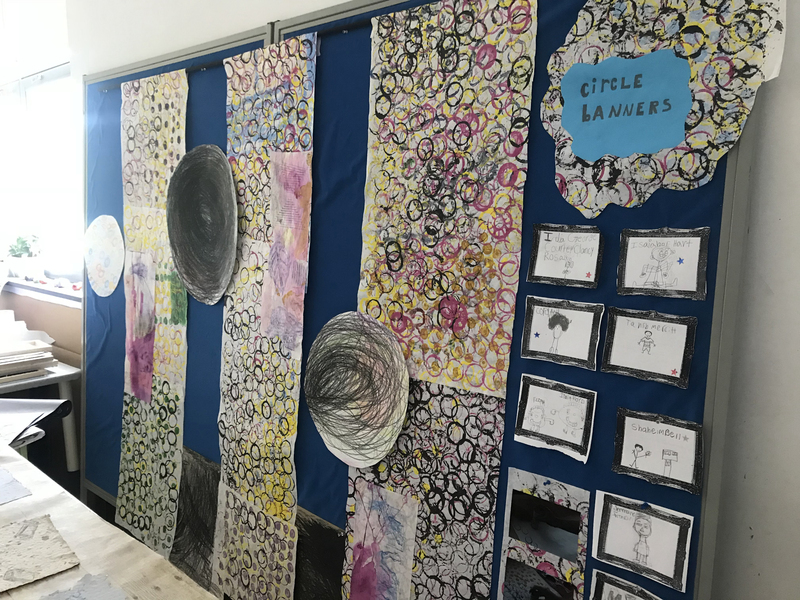 The classes worked on school grounds to make drawings and photographs from nature, exploring the theme of “Micro and Macro”. 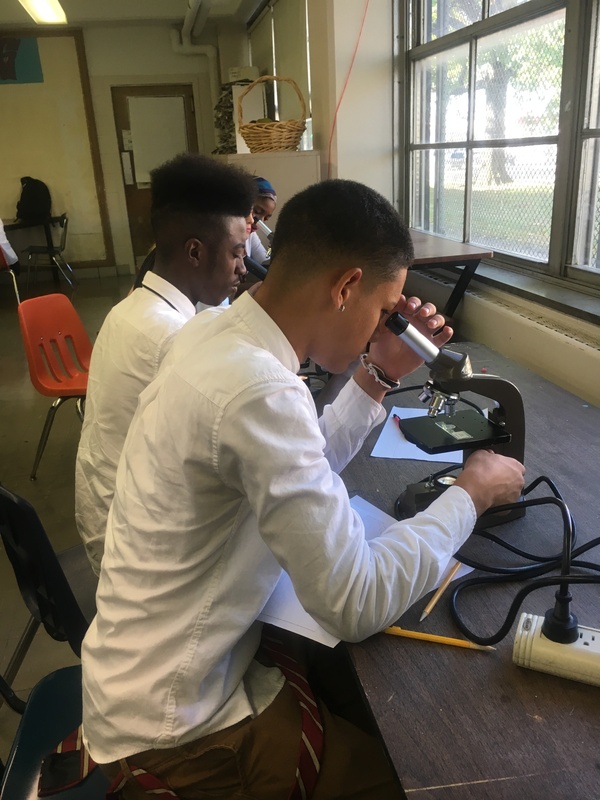 Students also collected samples for viewing under microscopes, which were made available through a collaboration with the school’s Science Department. 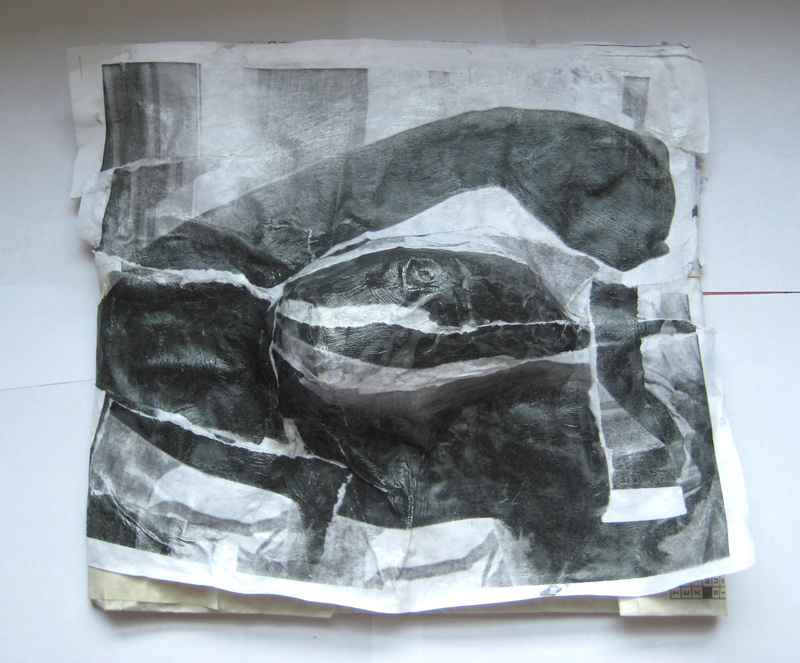 The “Micro" images served as inspiration for more drawings, which were then traced, cropped, edited and recomposed. 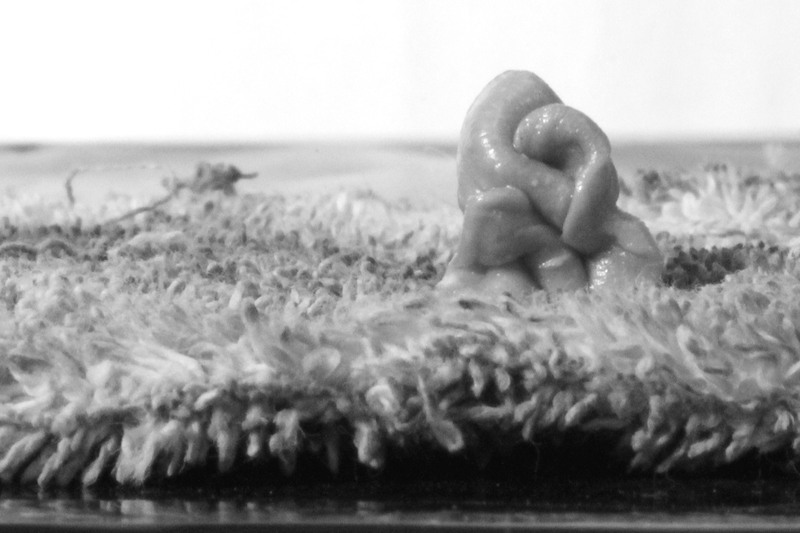 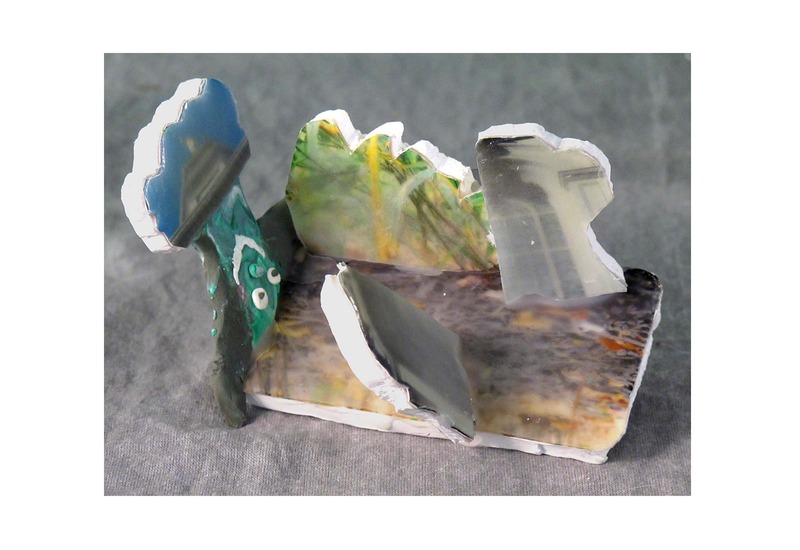 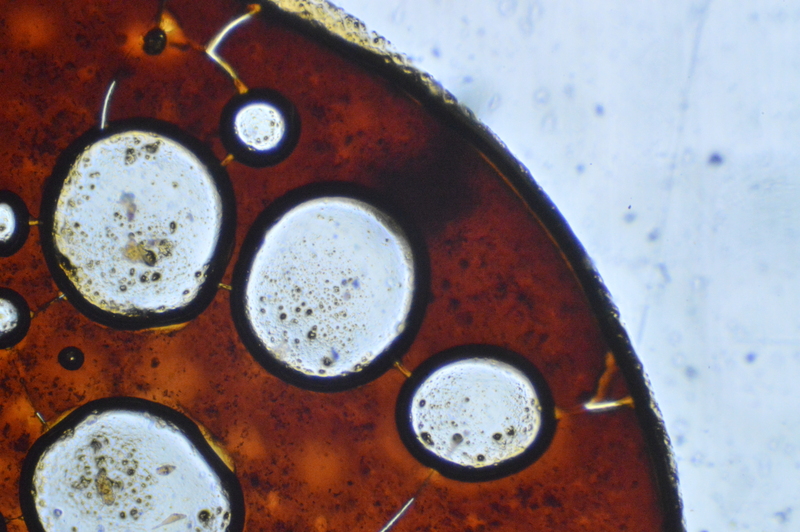 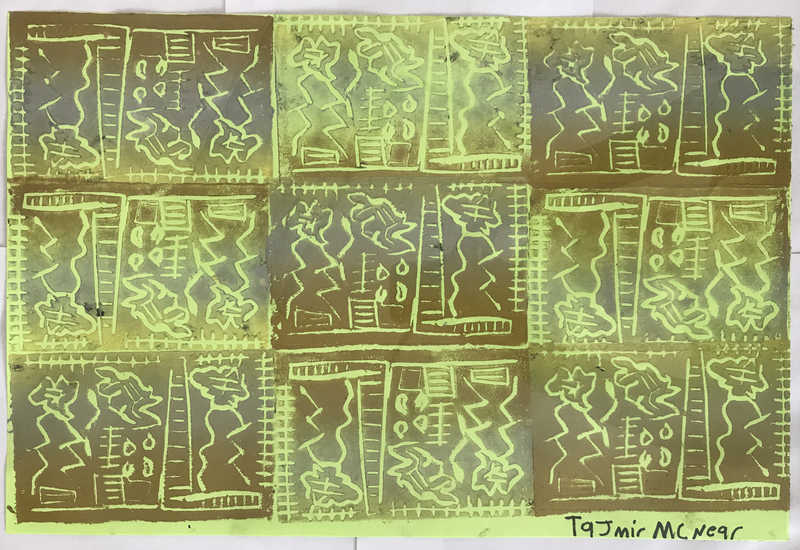 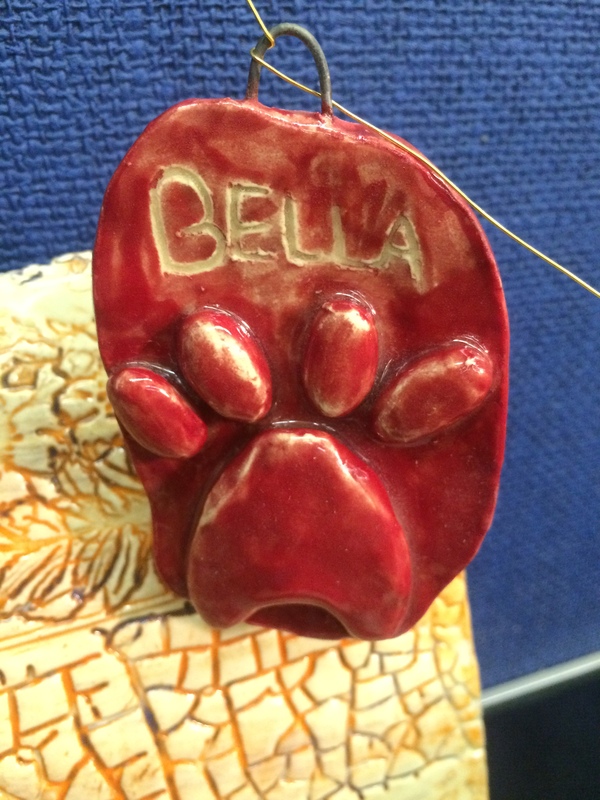 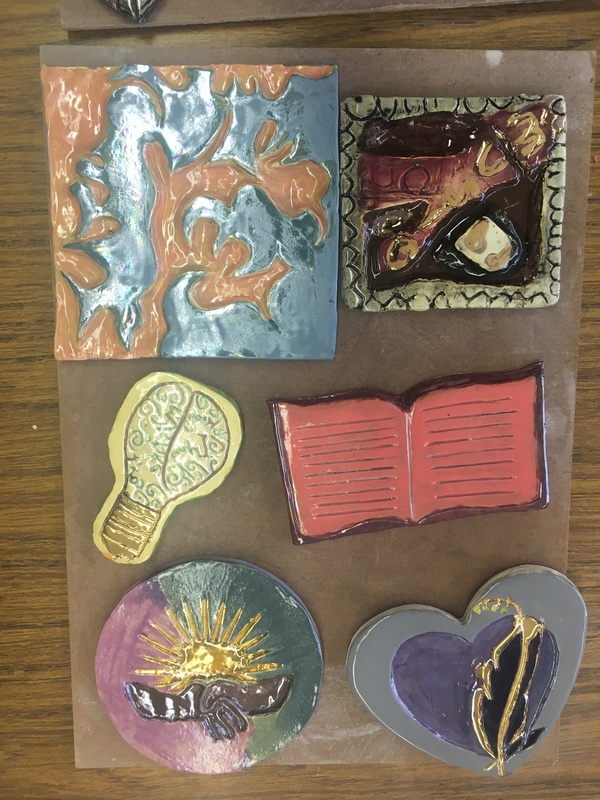 Using multiple processes and techniques, students experimented with how to best transfer their imagery to clay plate forms. 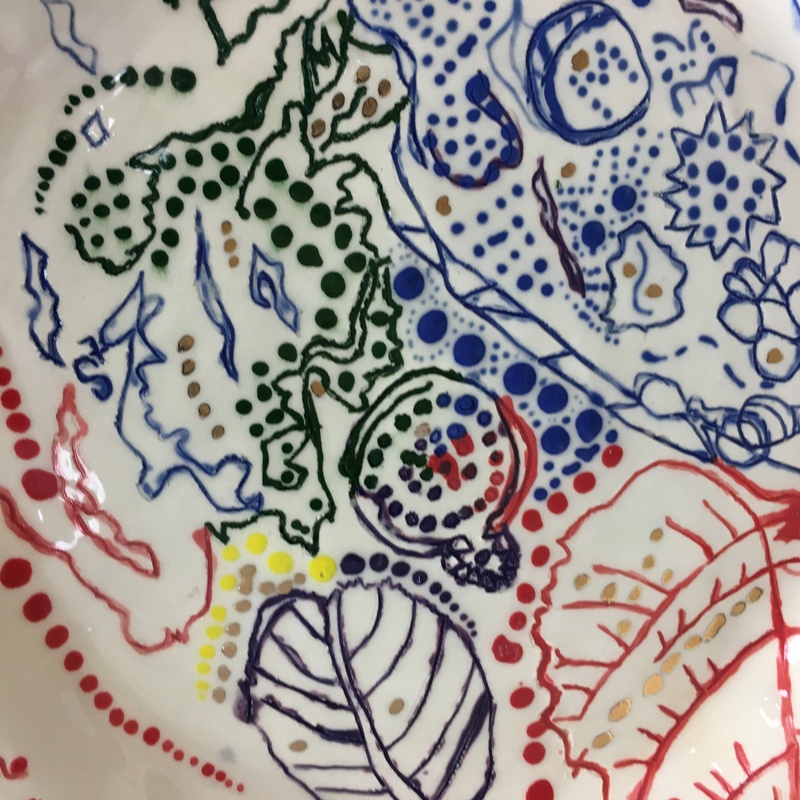 The final transfer process involved multiple steps, including the creation and then application of printed decals onto the clay, resulting in the transferware plates. 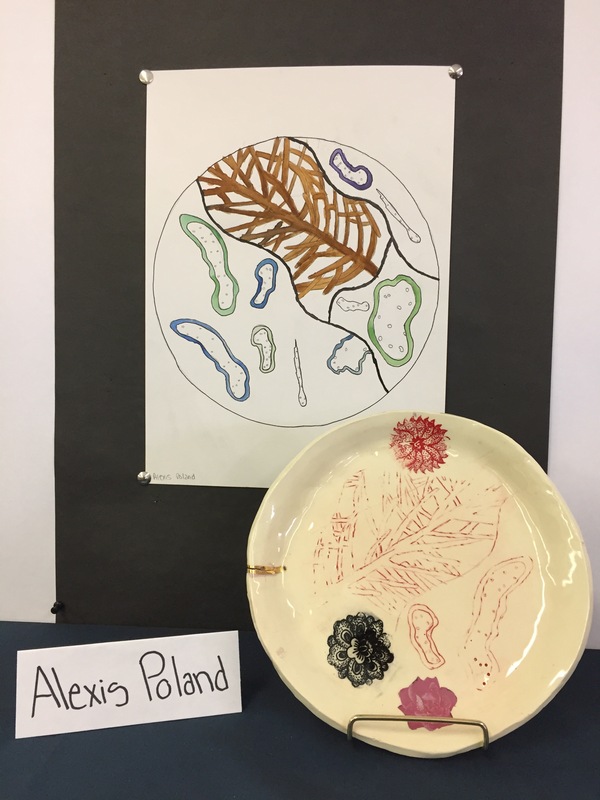 Exhibitions of the students’ final images and plates were mounted in the library of the school and at The Clay Studio. 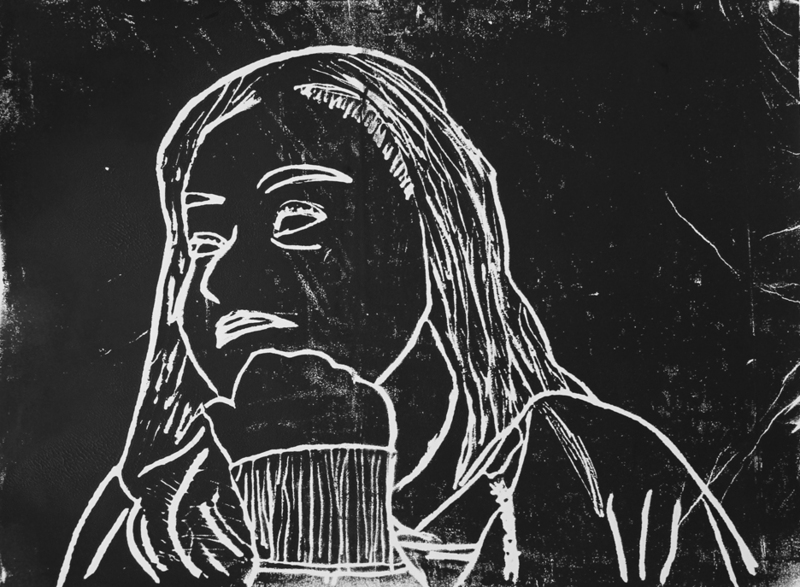 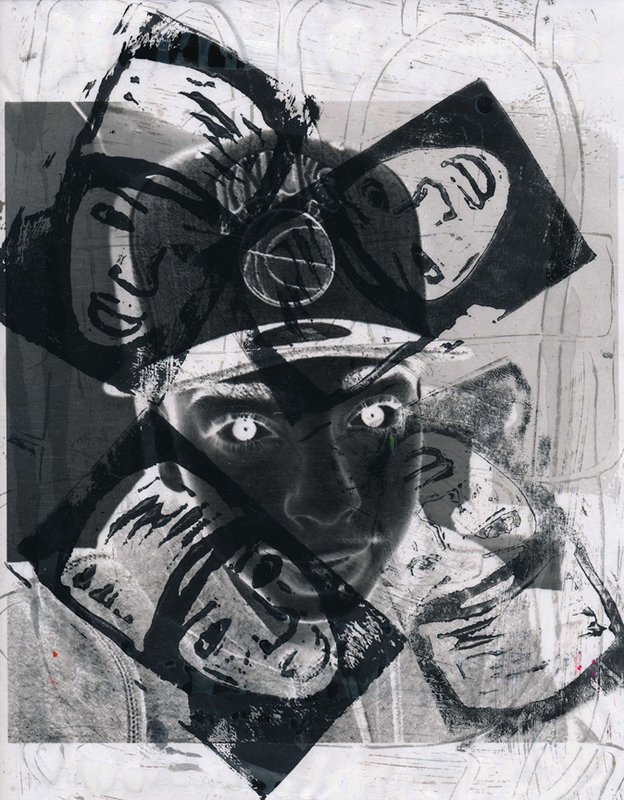 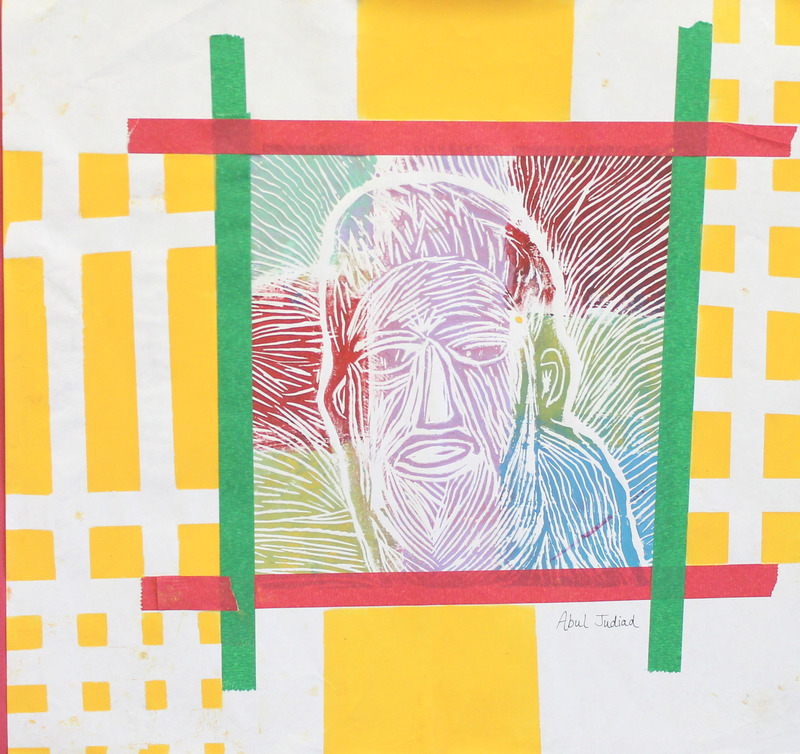 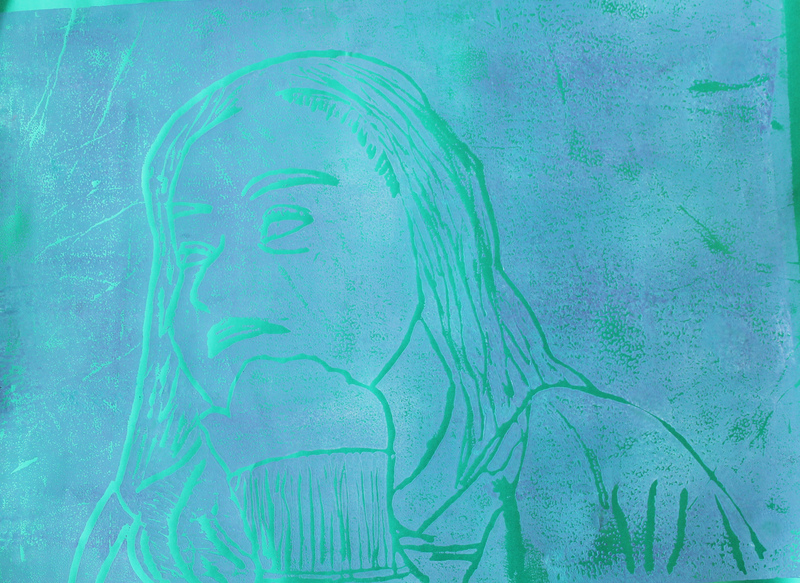 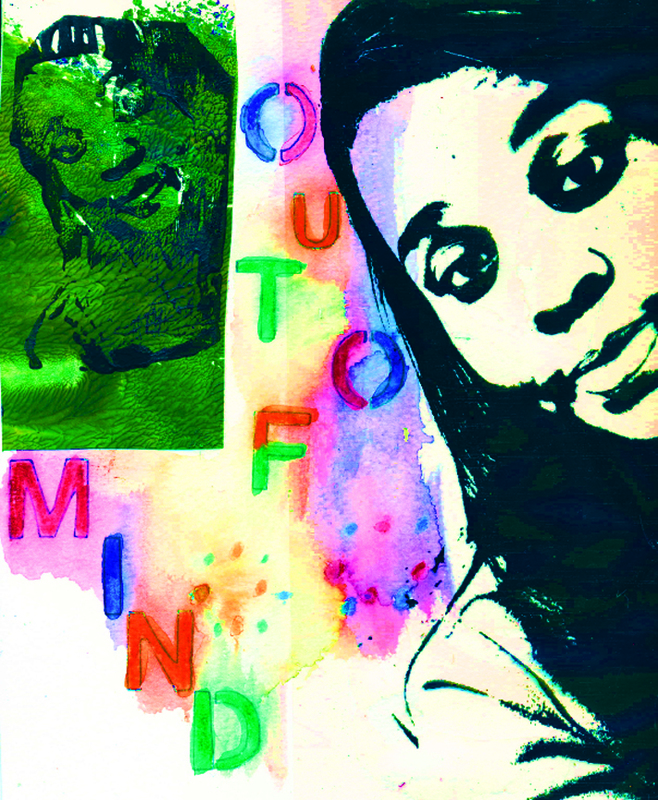 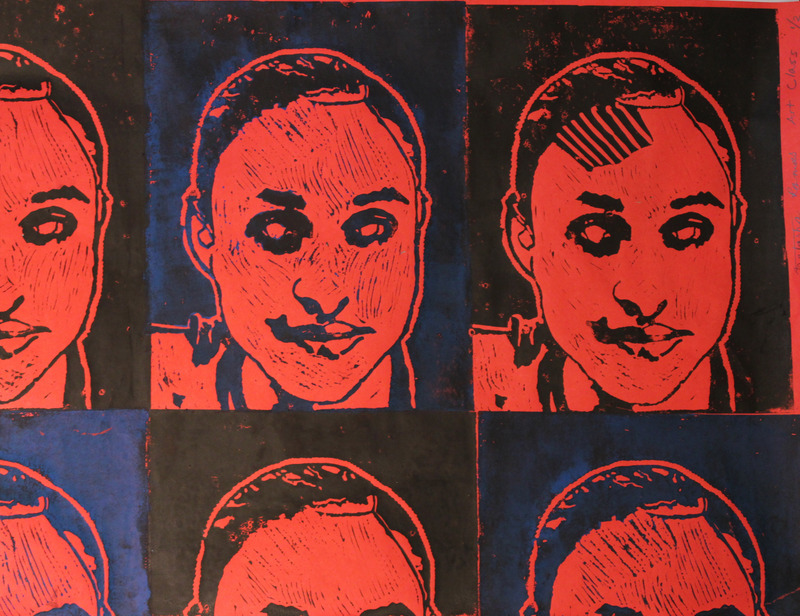 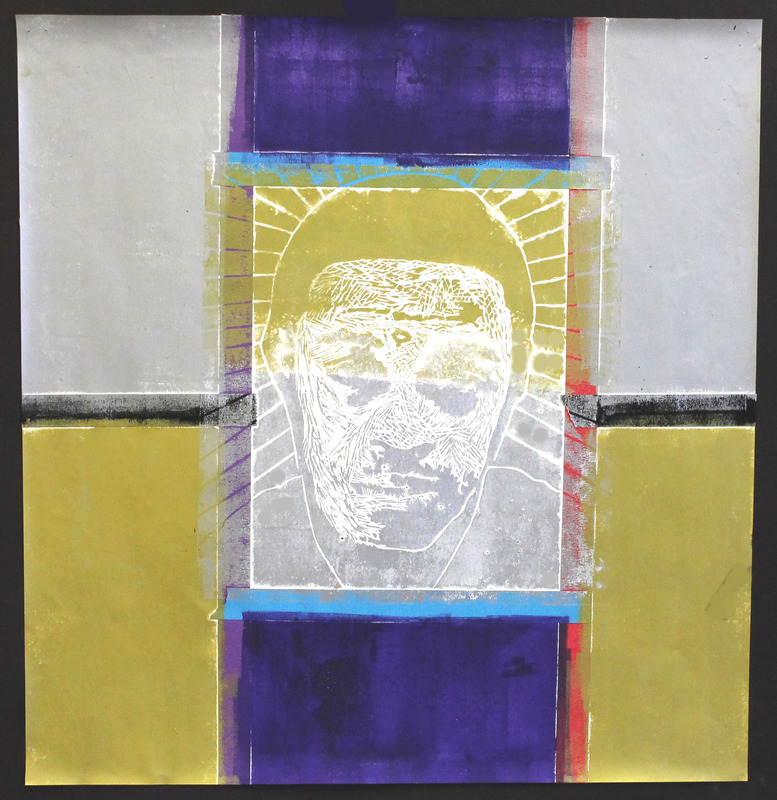 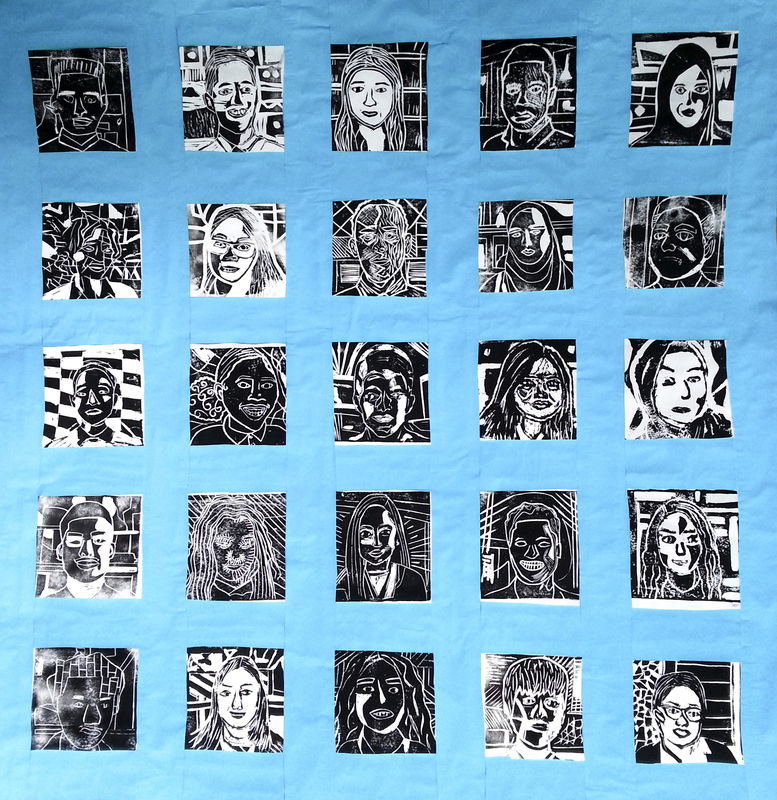 Two of art teacher Linda Heeg’s classes at the School of the Future worked with teaching-artist Mendal Polish to create self-portraits utilizing several different printed and drawn media. 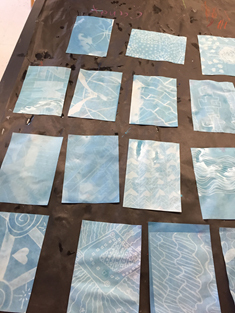 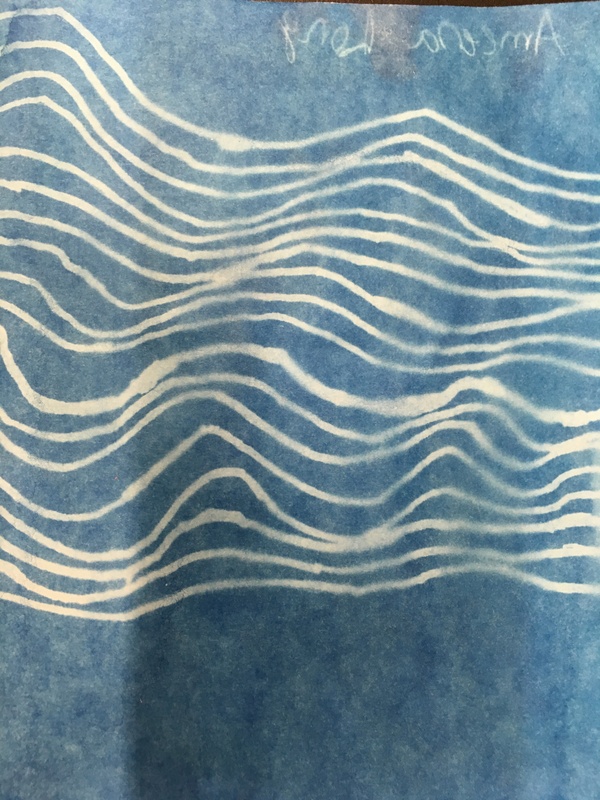 Students started the semester making a series of cyanotypes (sun prints) created from abstract drawings, which were then used as a light resist to make prints. 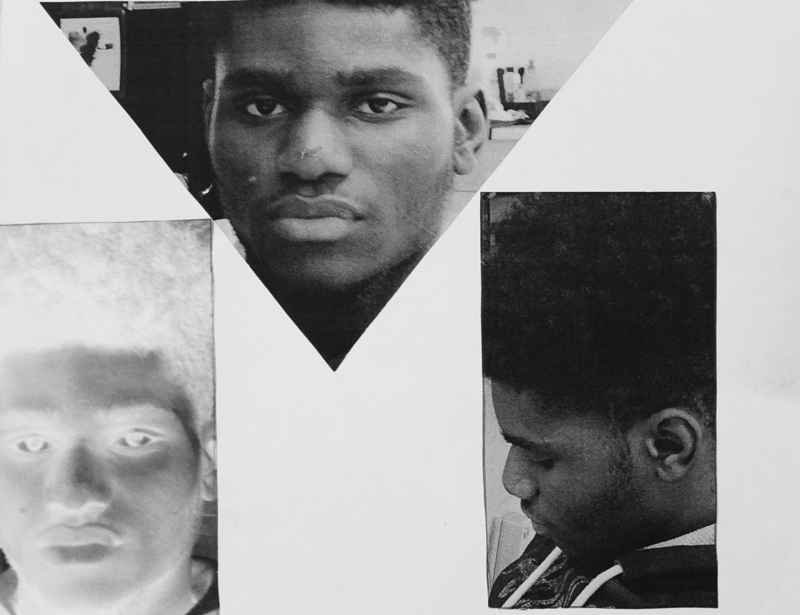 Students then experimented with creating photographic portraits of each other using DSLR cameras, with the intended goal of using these images as the starting point for a multi-layered work. 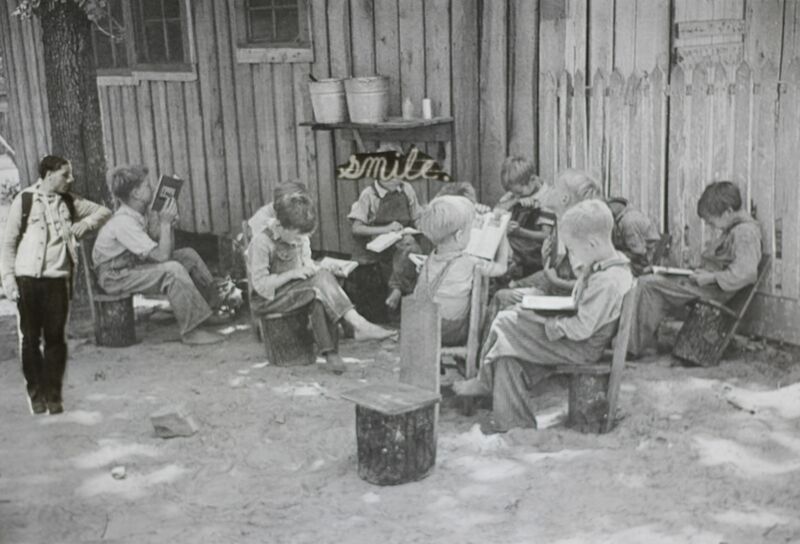 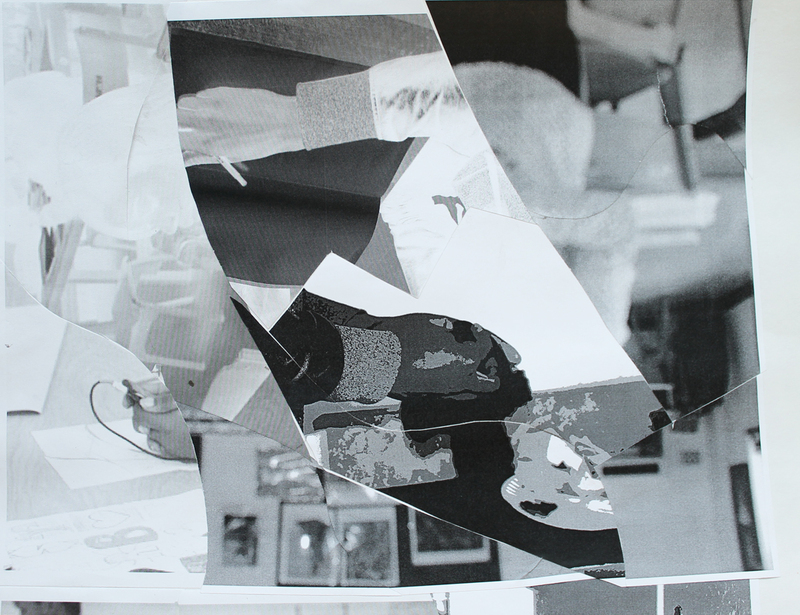 Prints of these photos were used as the basis for collages, using a variety of materials. 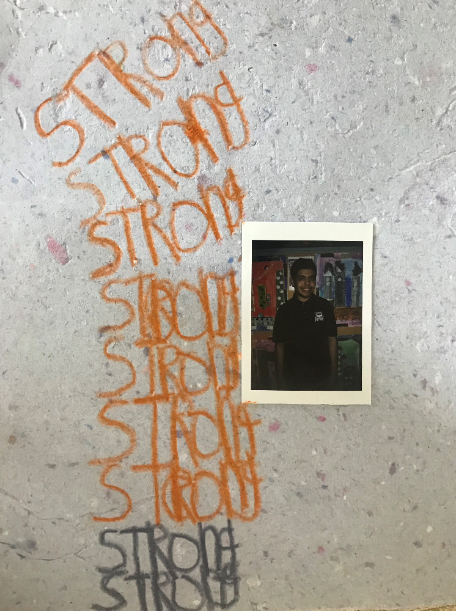 The residency continued with students carrying out a series of creative writing exercises, culminating with each student writing a poem entitled I Am. 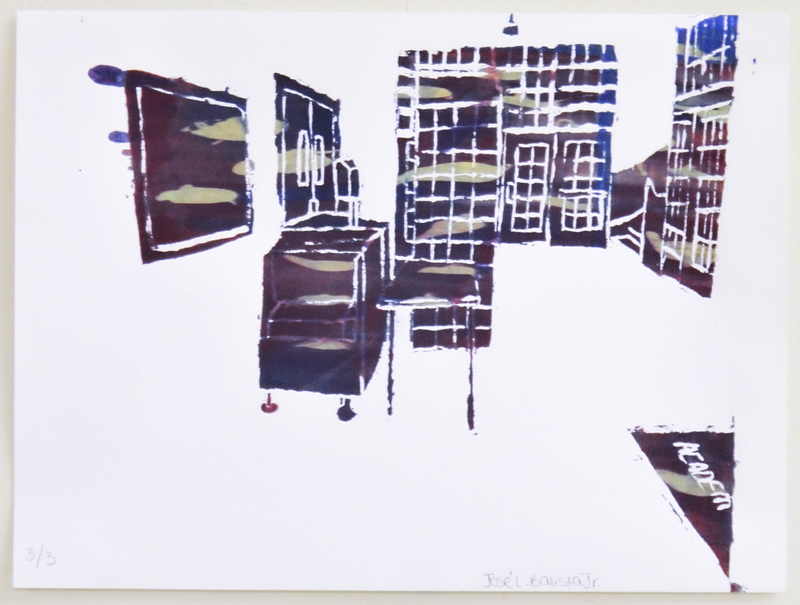 Each poem was accompanied by a large watercolor painting. 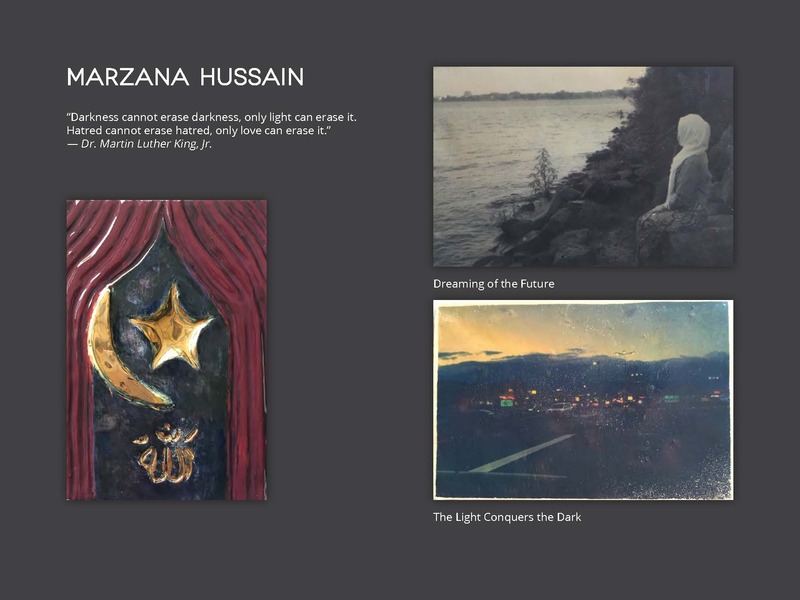 Finally, numerous images, including the photographs, poems and watercolors, were layered digitally by the students and printed. 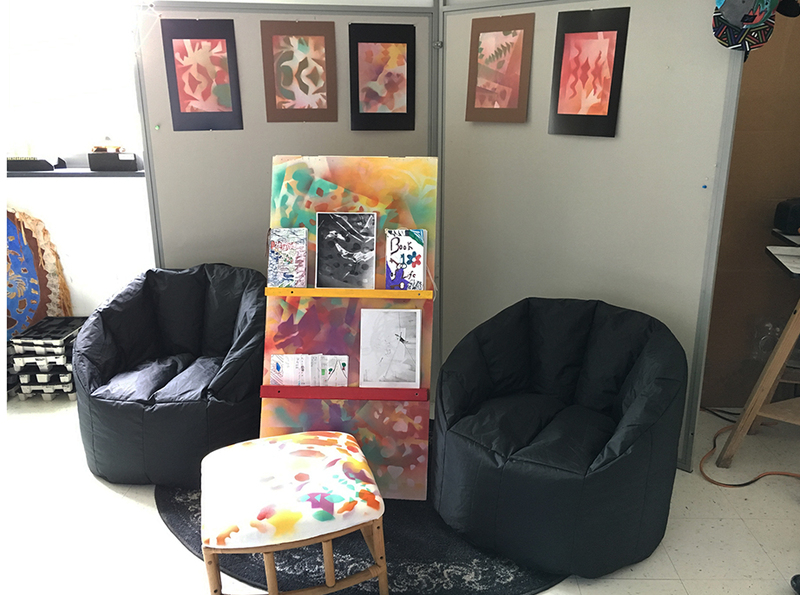 These works were exhibited in the classroom. 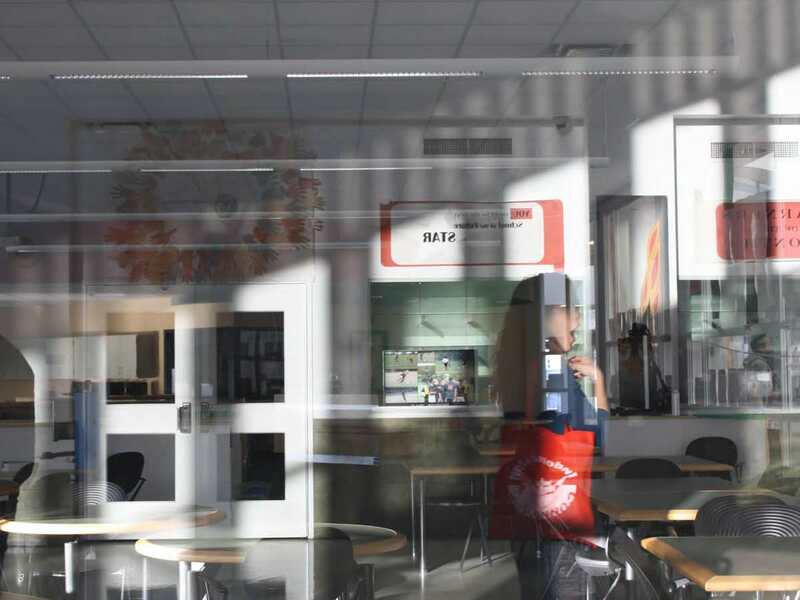 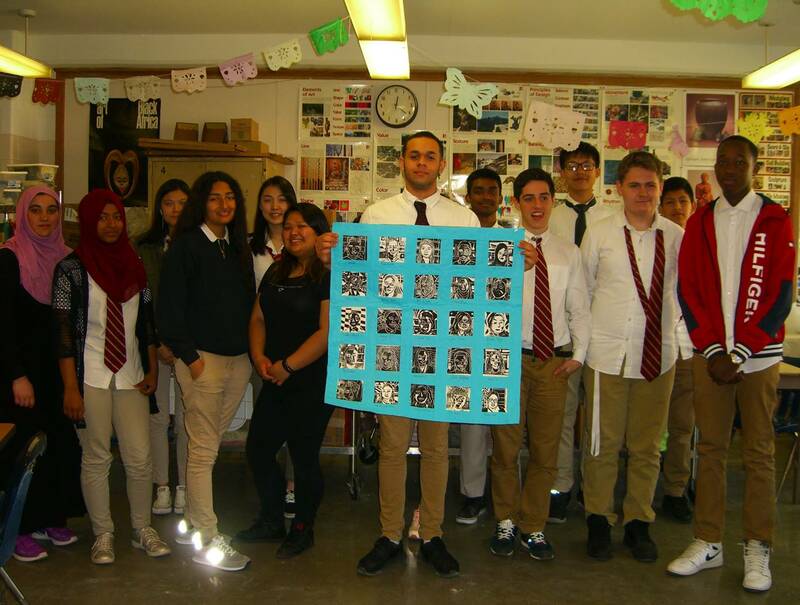 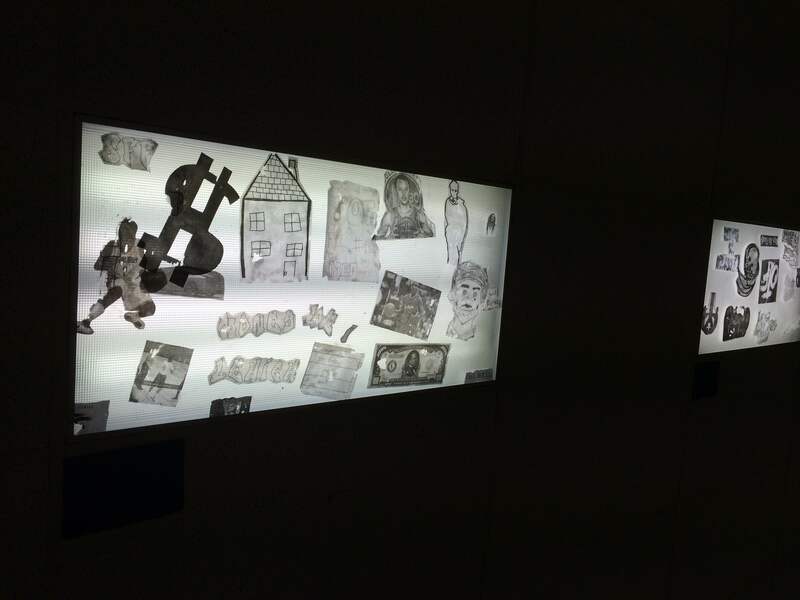 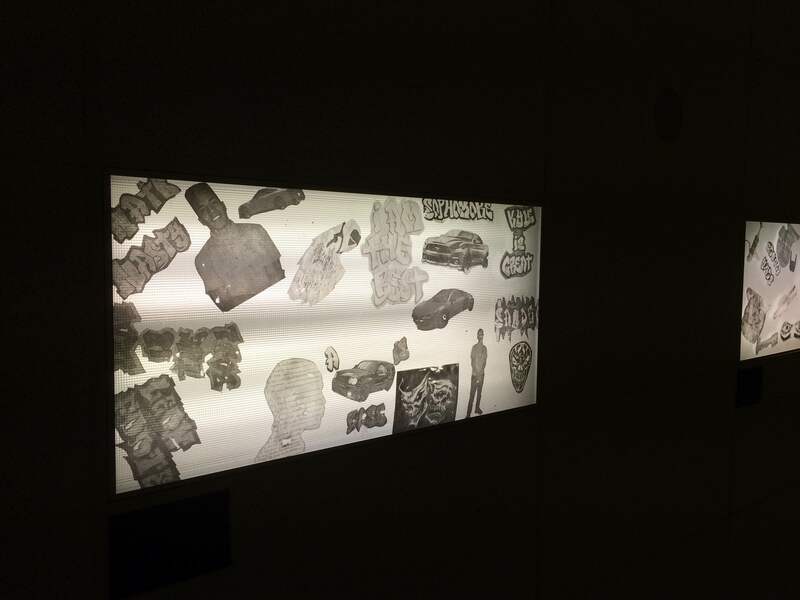 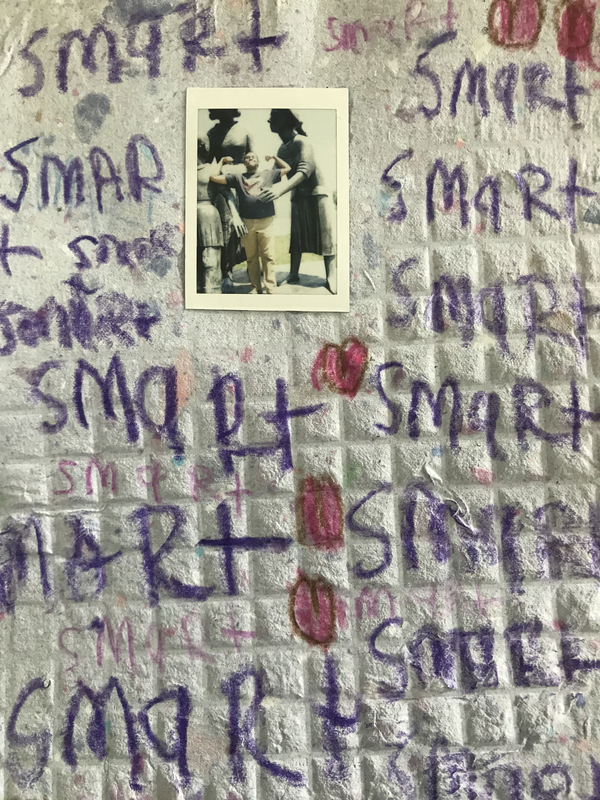 Two of art teacher Josh Kleiman’s classes at The U School worked with teaching-artist Marilyn Rodriguez on a project that combined a wide array of print and photo processes and resulted in a permanent installation in the school. 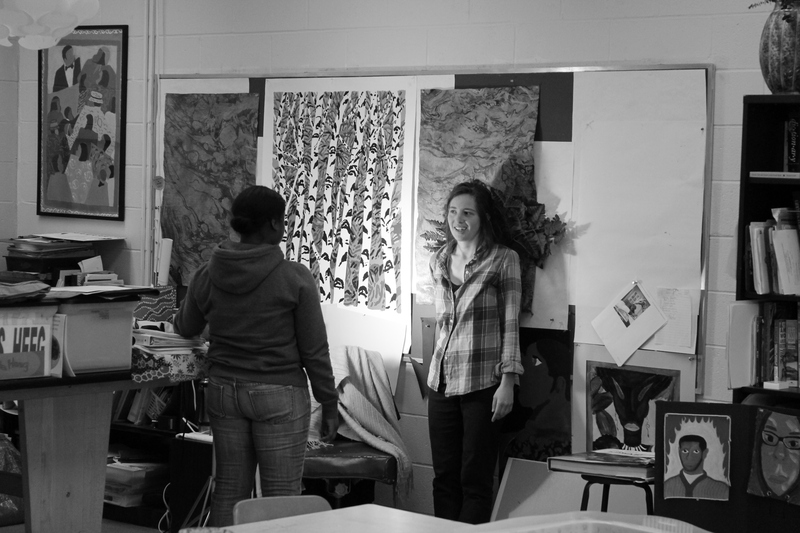 The residency started with the group collectively discussing what form their project should take. 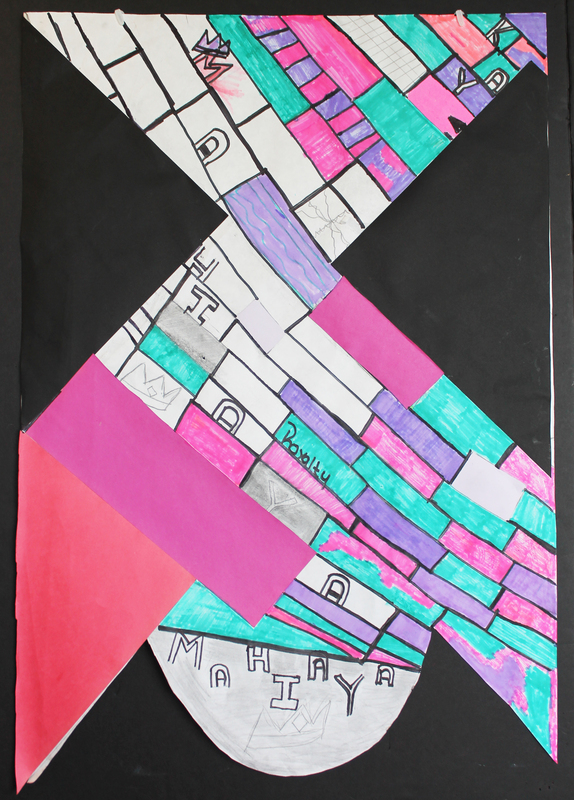 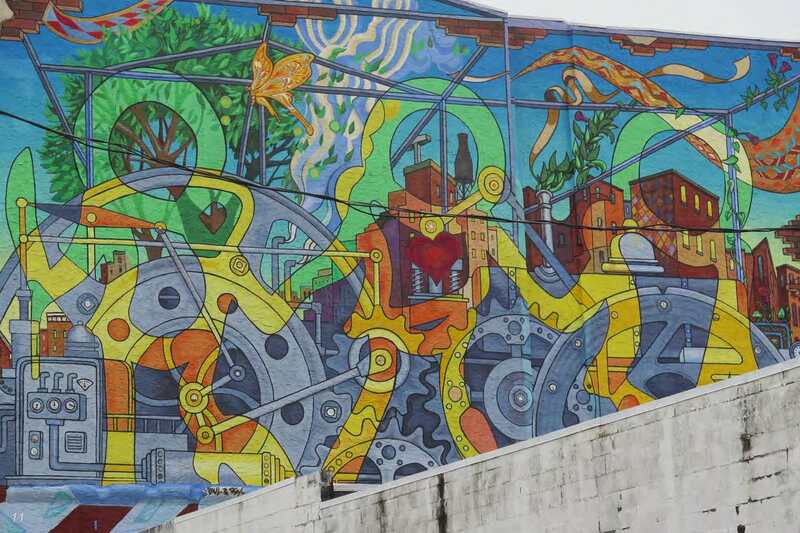 They opted to create a multi-layered, strongly graphic mural. 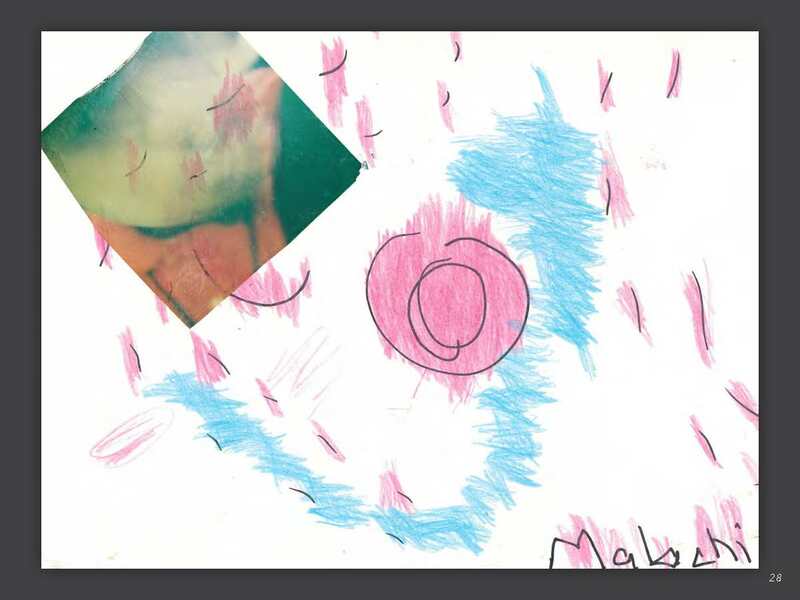 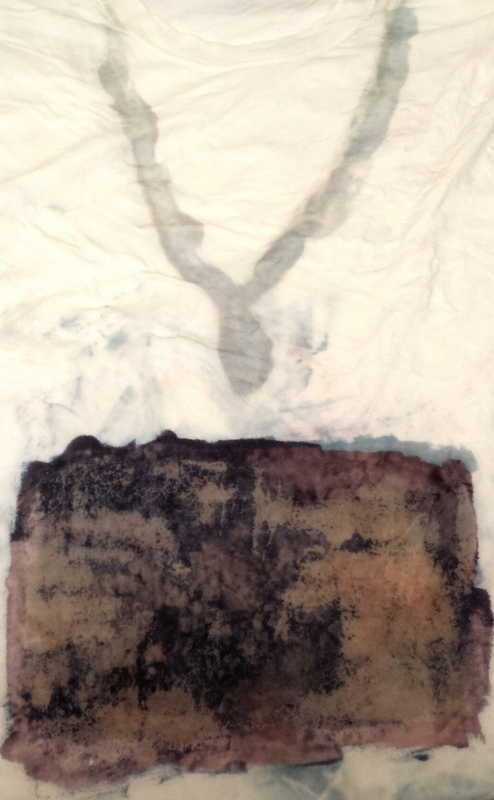 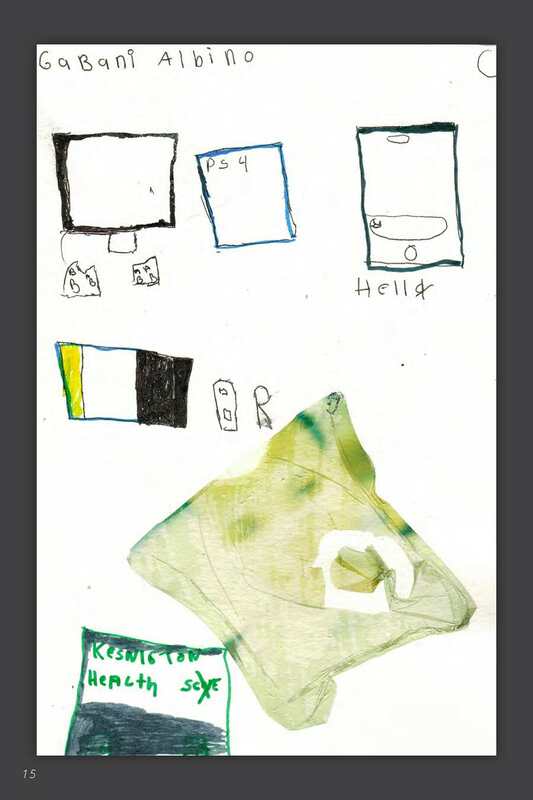 Students created rubbings on paper using objects that they had on their person: a phone, a key, a necklace. 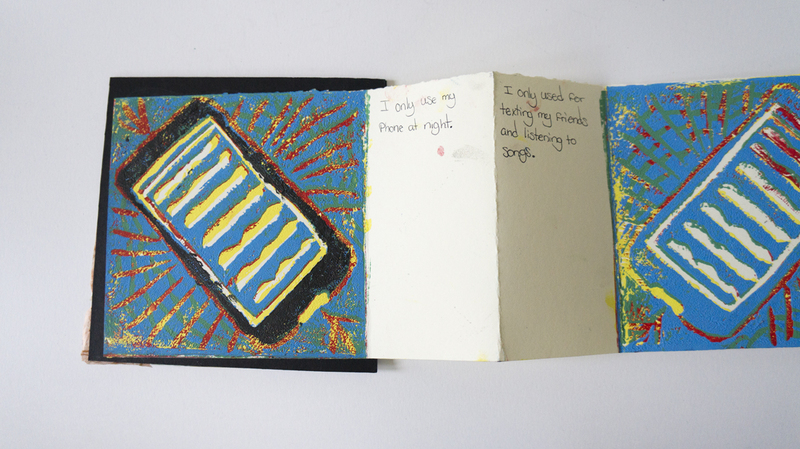 They also experimented with scratch board to make drawings of other everyday objects. 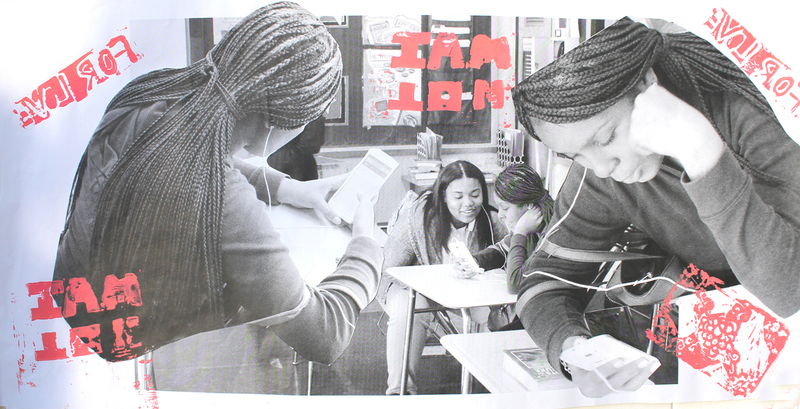 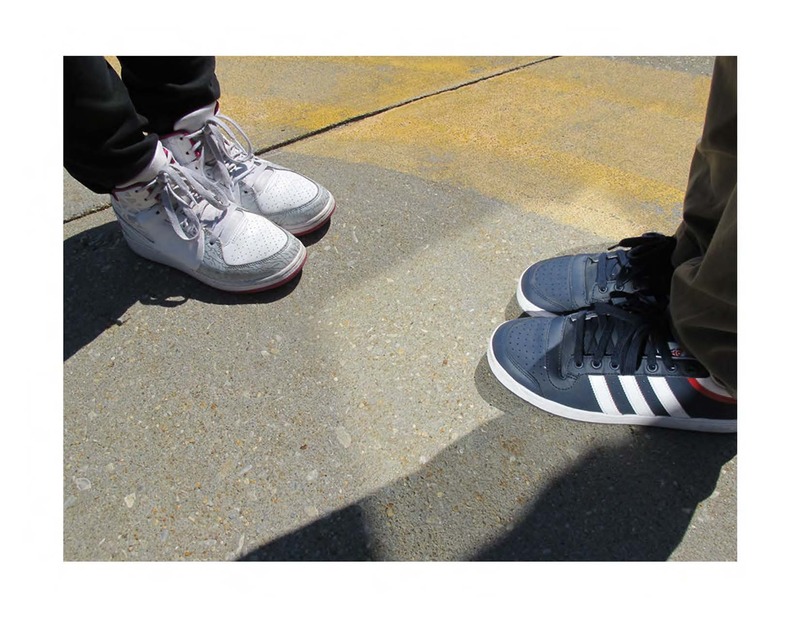 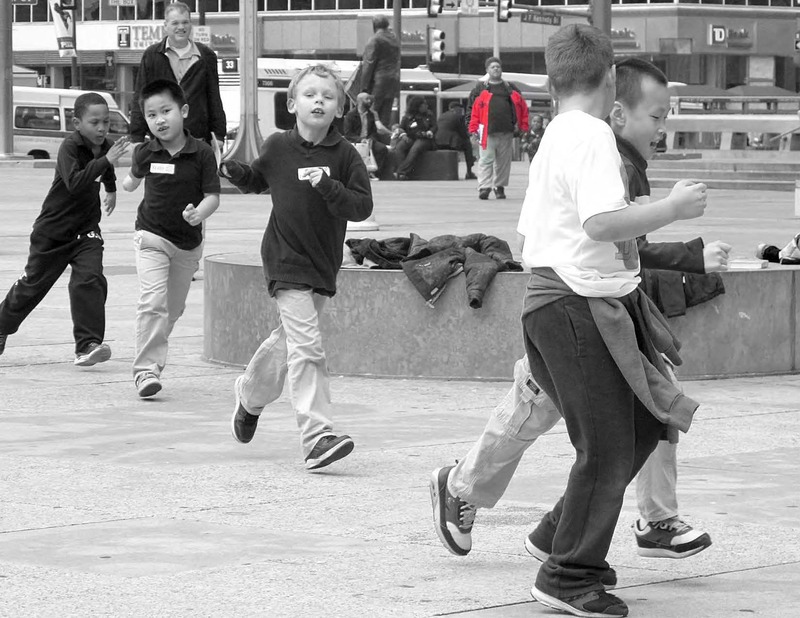 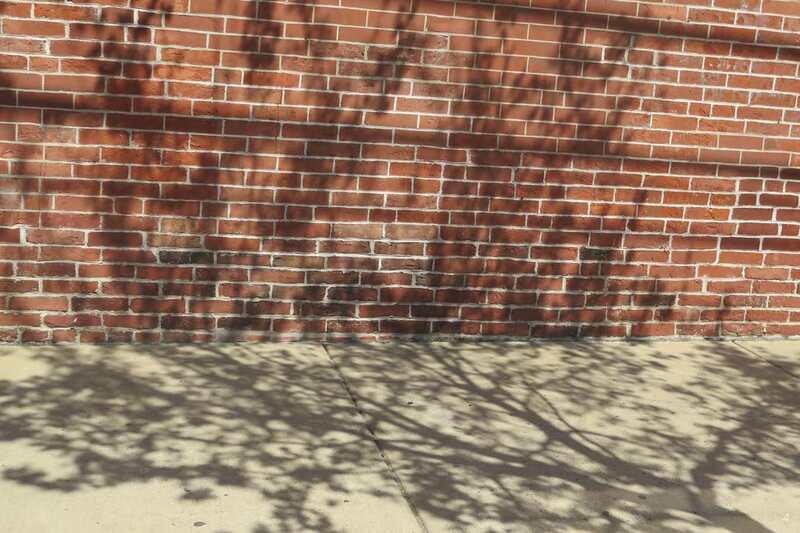 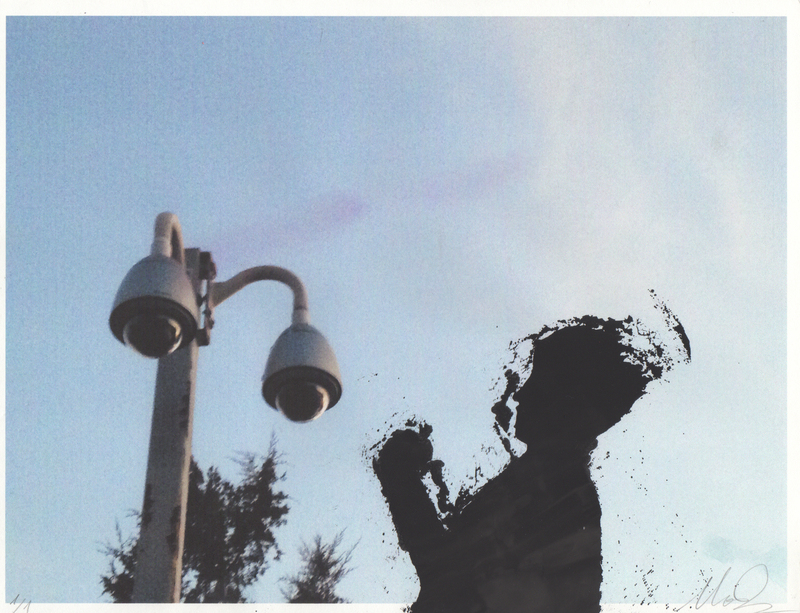 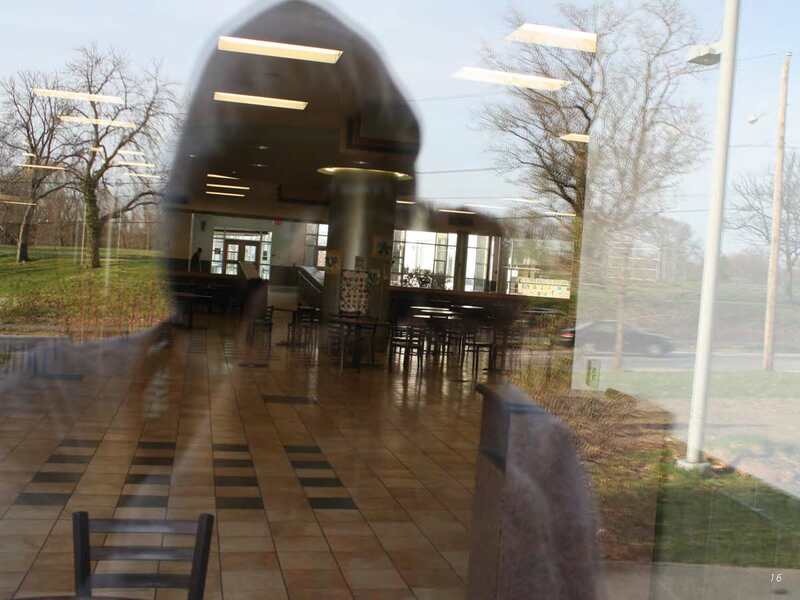 At the same time, students began taking photographs and combining them with images drawn from the internet. 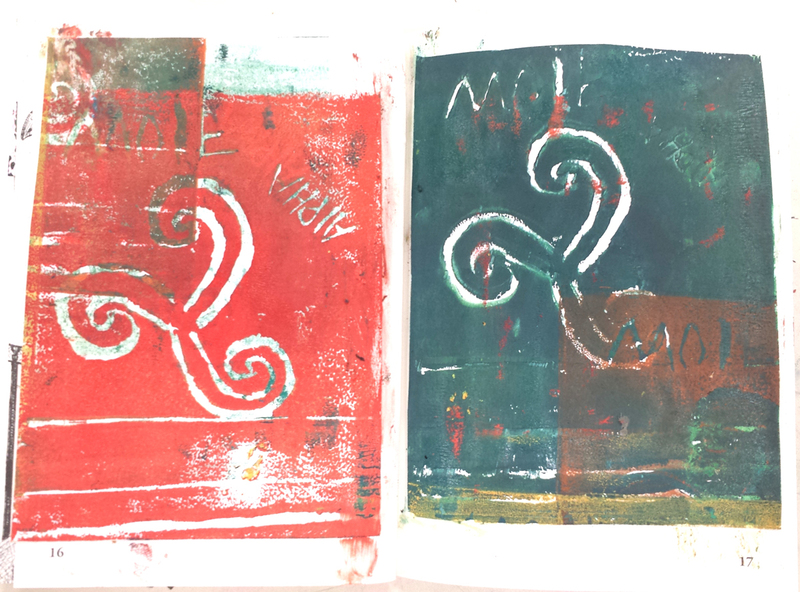 These served as inspiration for relief prints made with foam and linoleum plates. 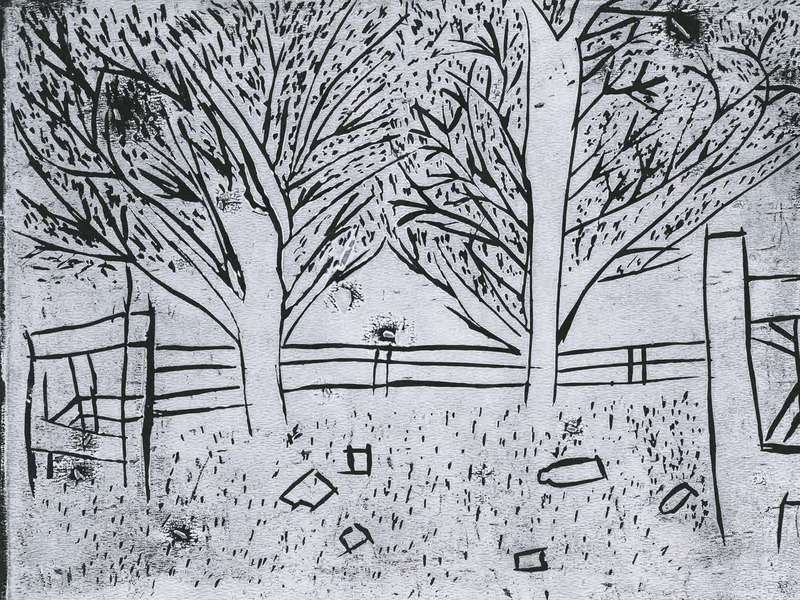 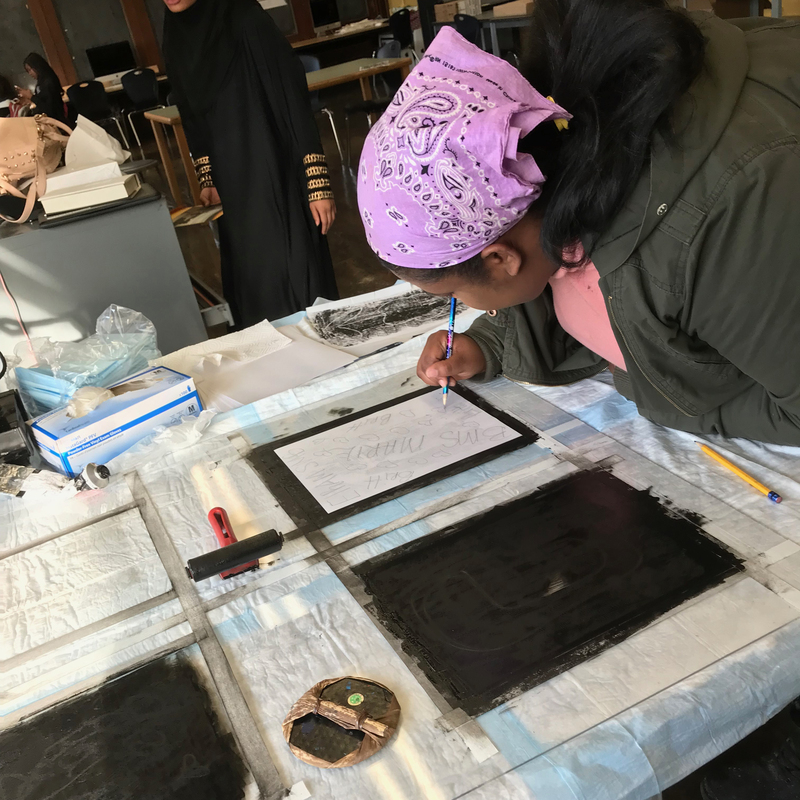 Prints of the photographs, along with the rubbings, drawings and relief prints were combined into one large work, which students drew on top of. 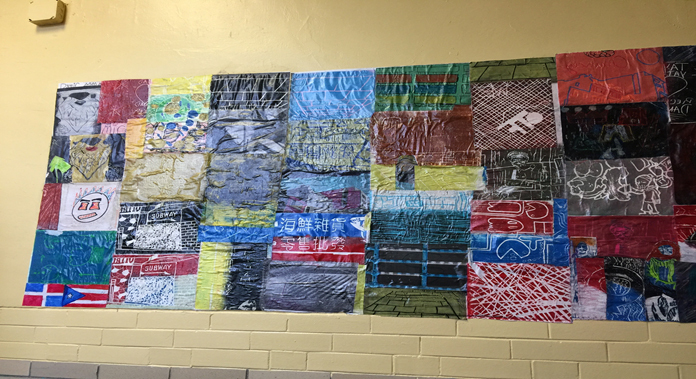 This large work was wheat-pasted to the wall outside the classroom. 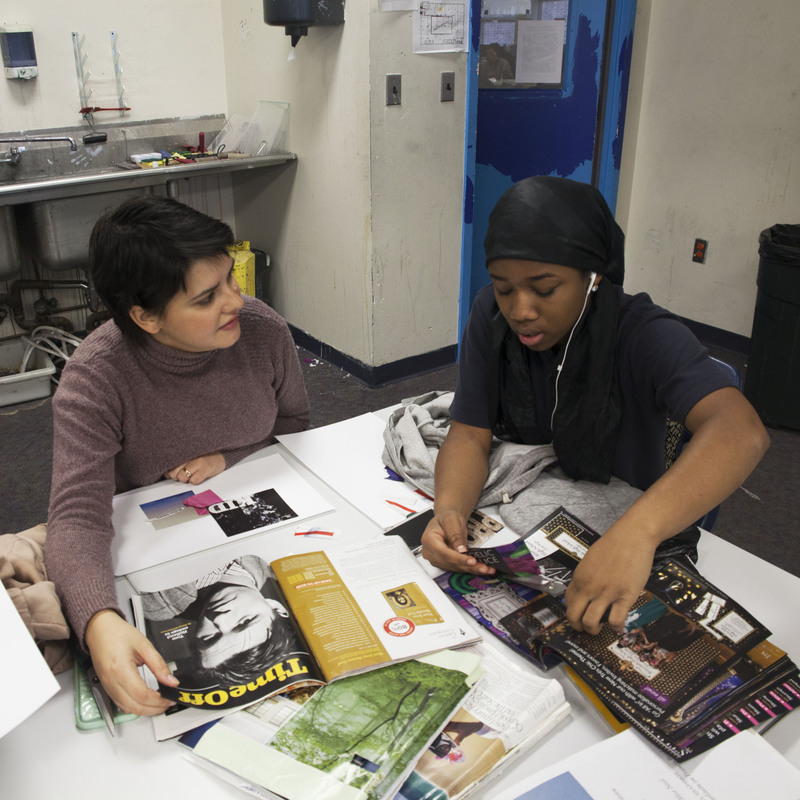 In the spring of 2016, AISP classes explored the diverse and creative approaches artists bring to the creation of photography books. 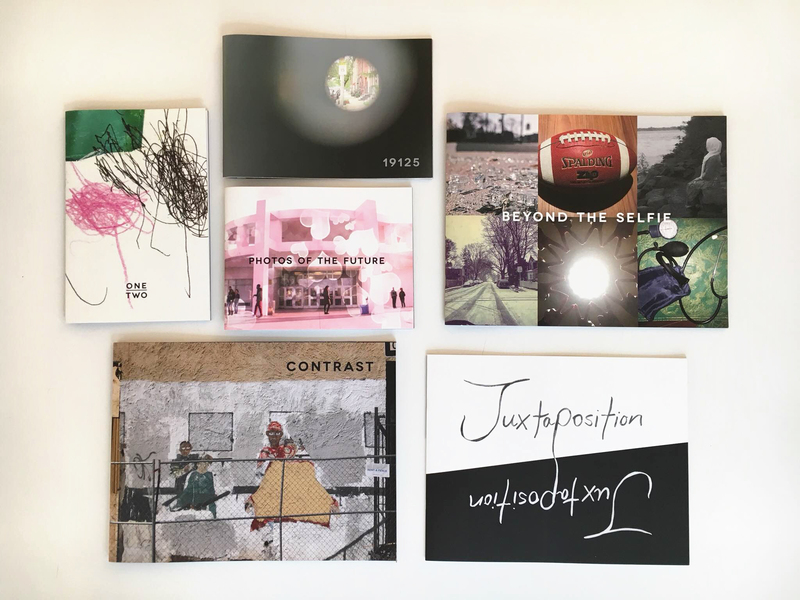 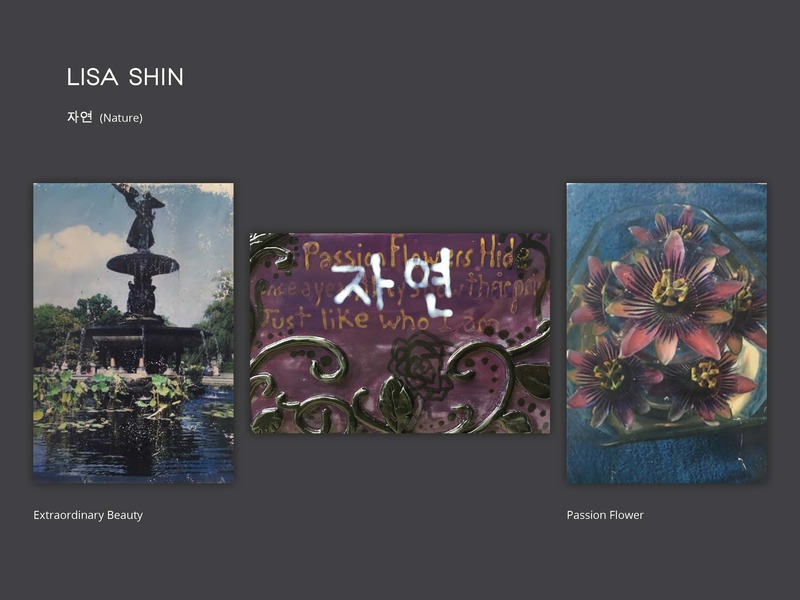 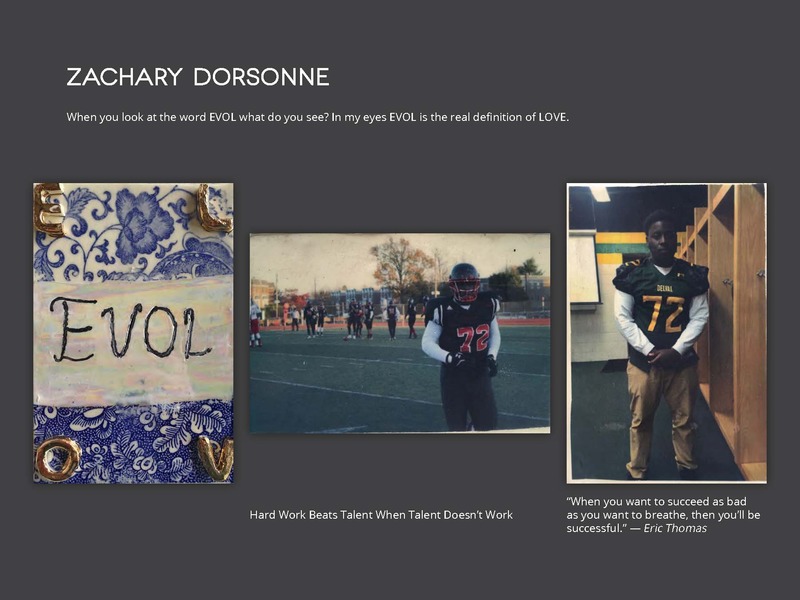 Diverse in form, content and purpose, the resulting publications celebrate the creativity of the student artists as well as the vitality of the photography book as an artistic form. 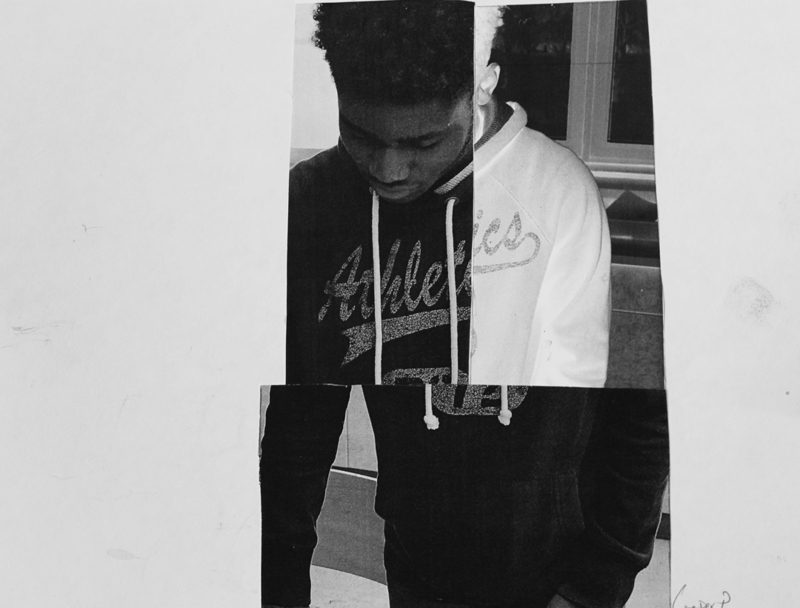 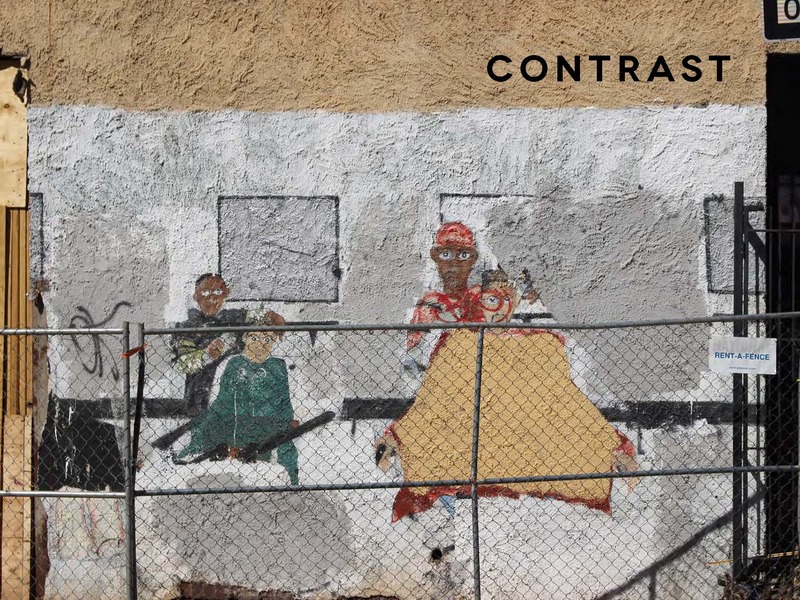 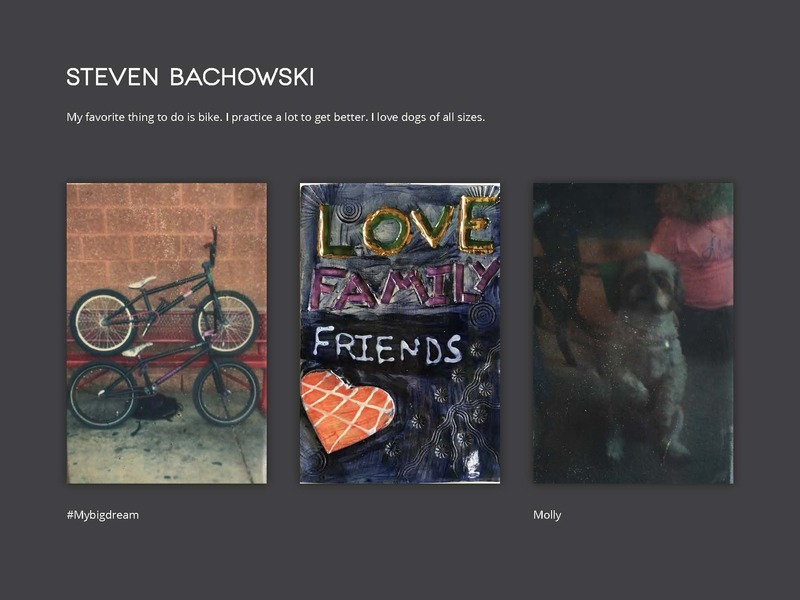 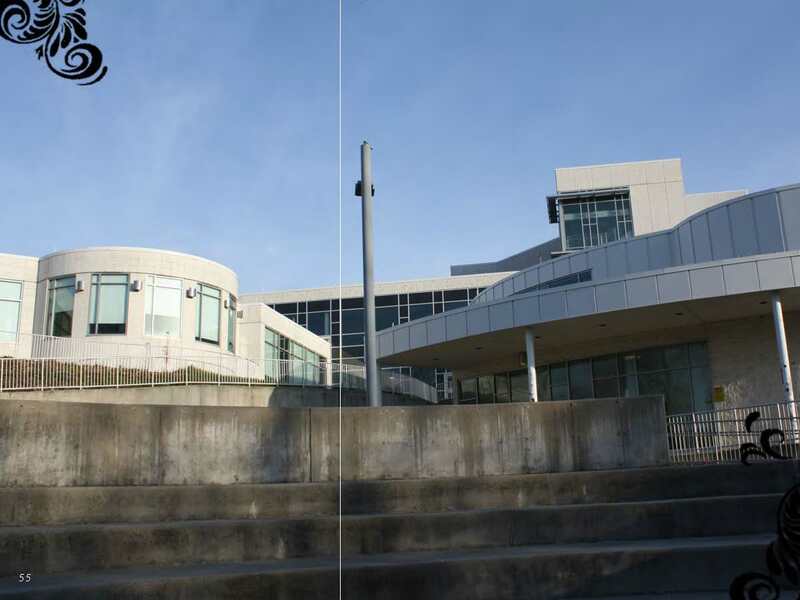 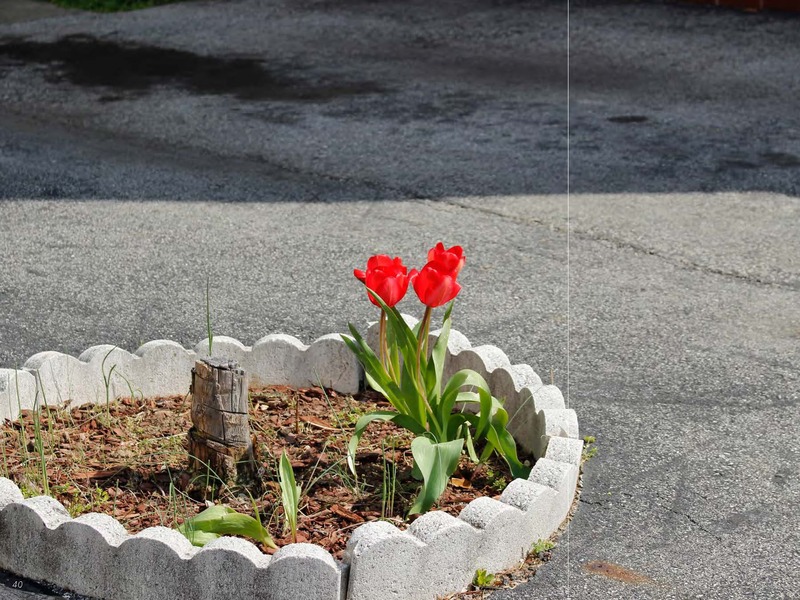 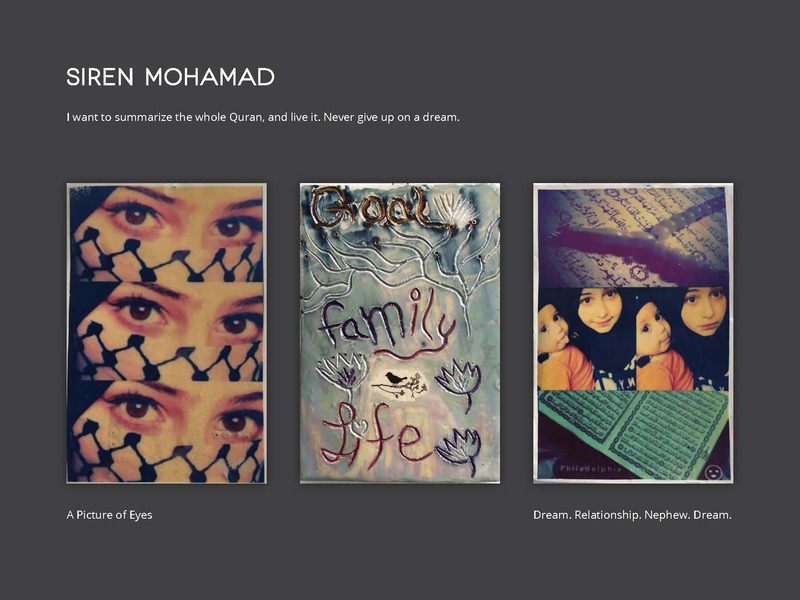 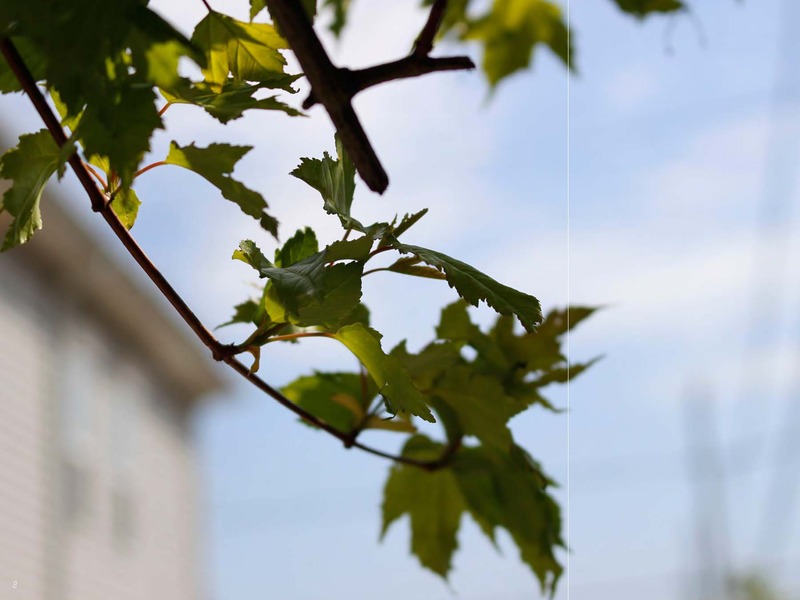 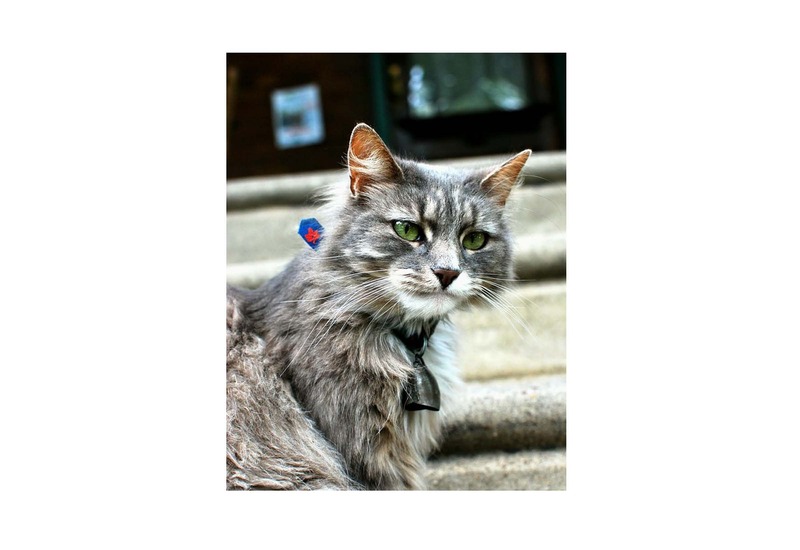 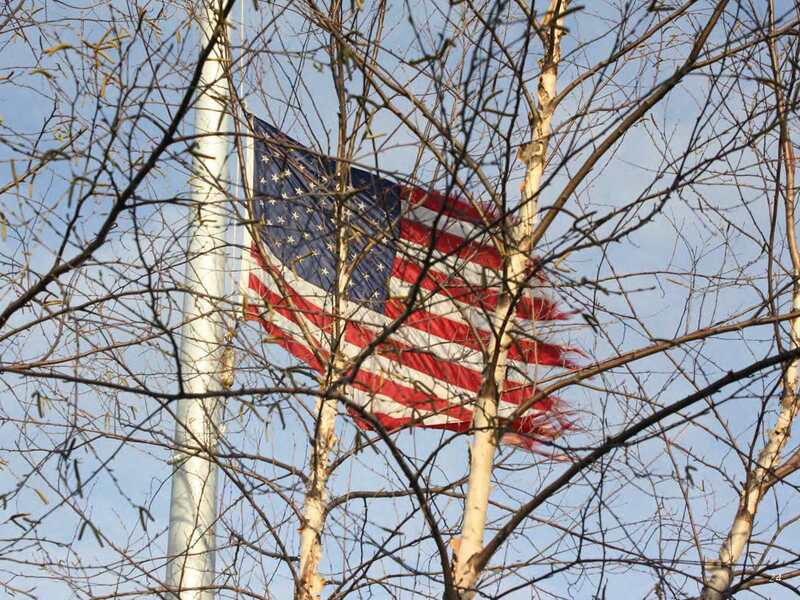 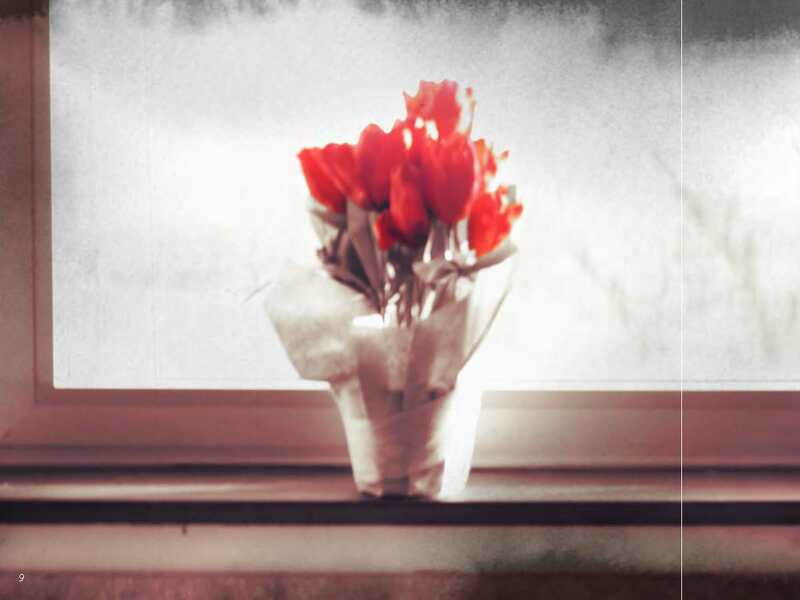 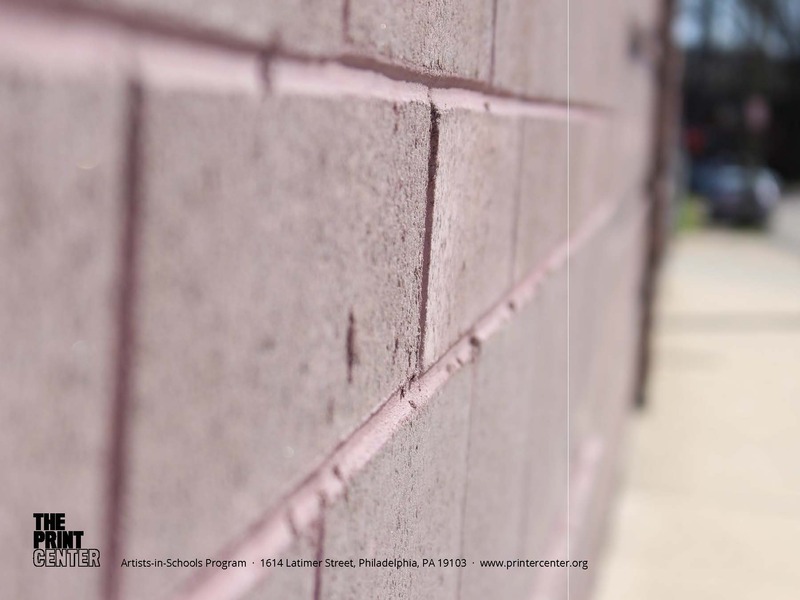 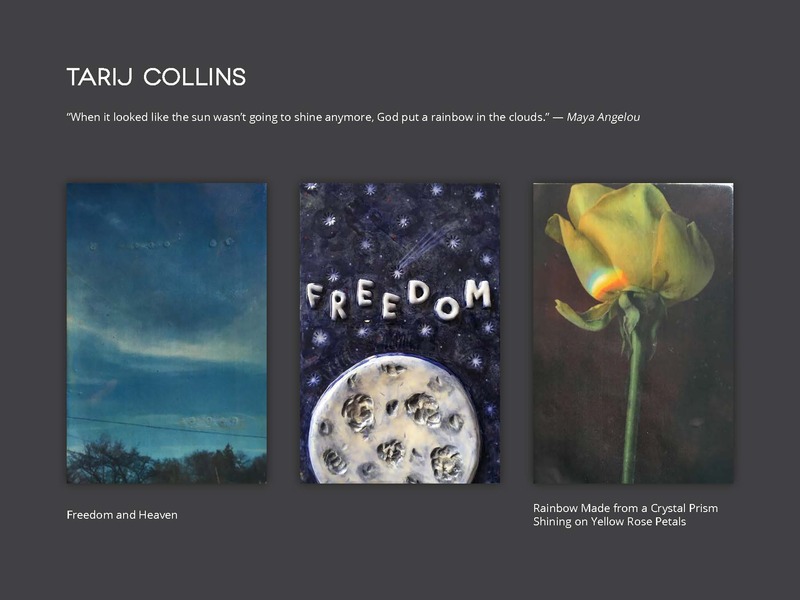 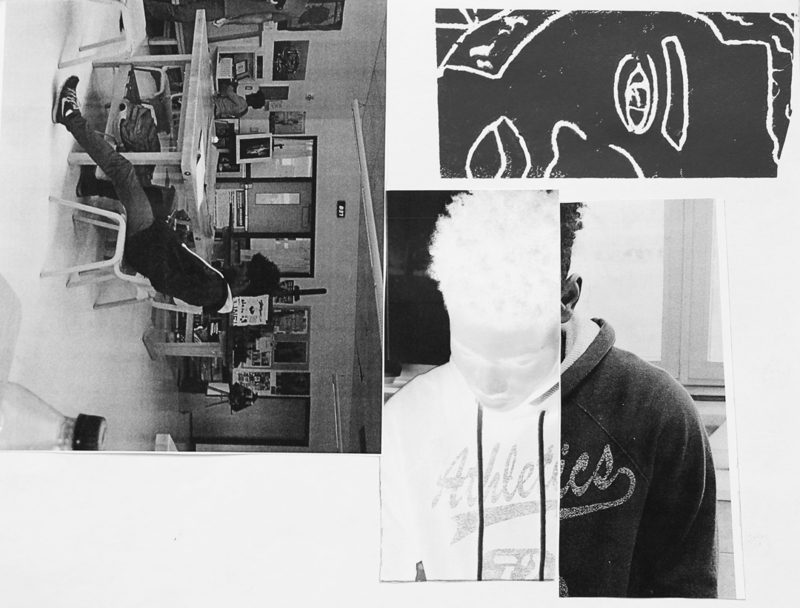 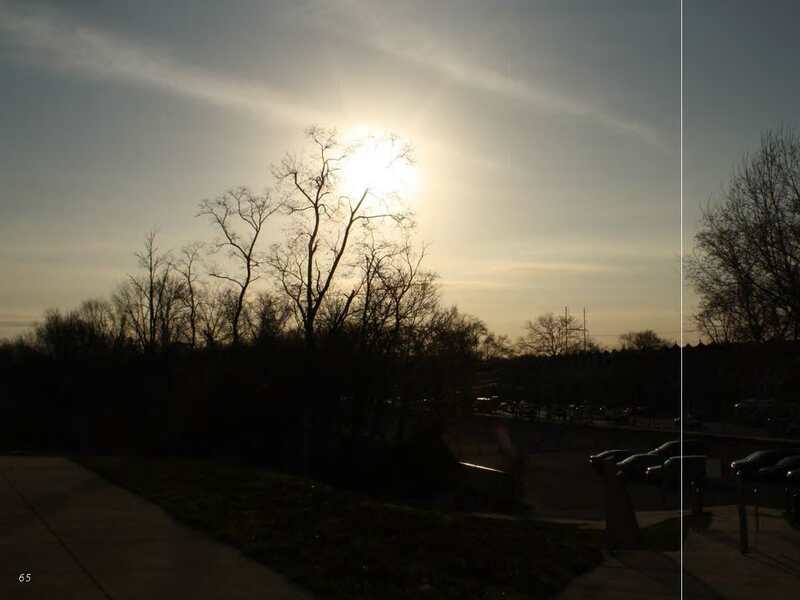 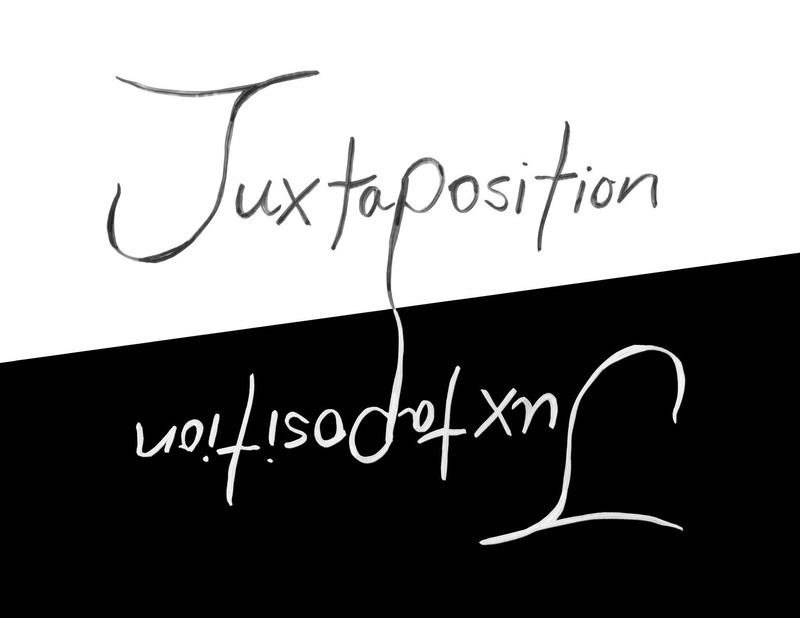 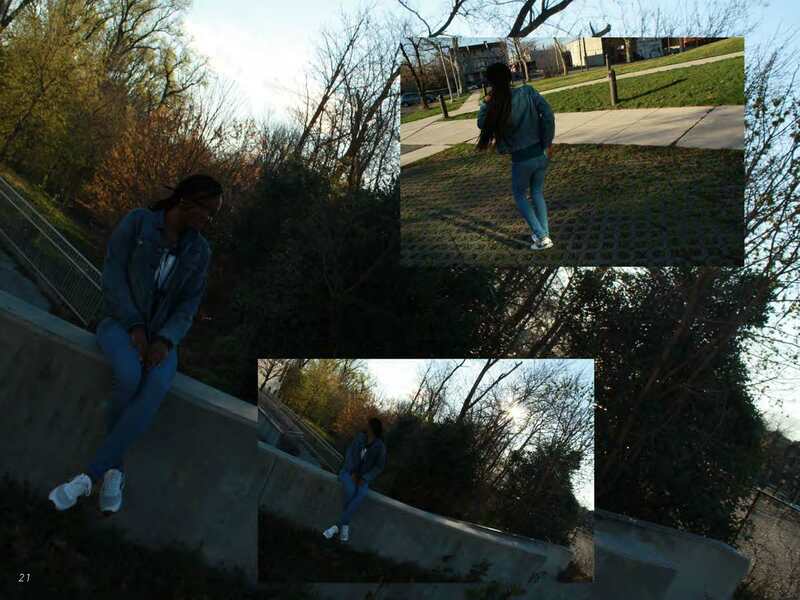 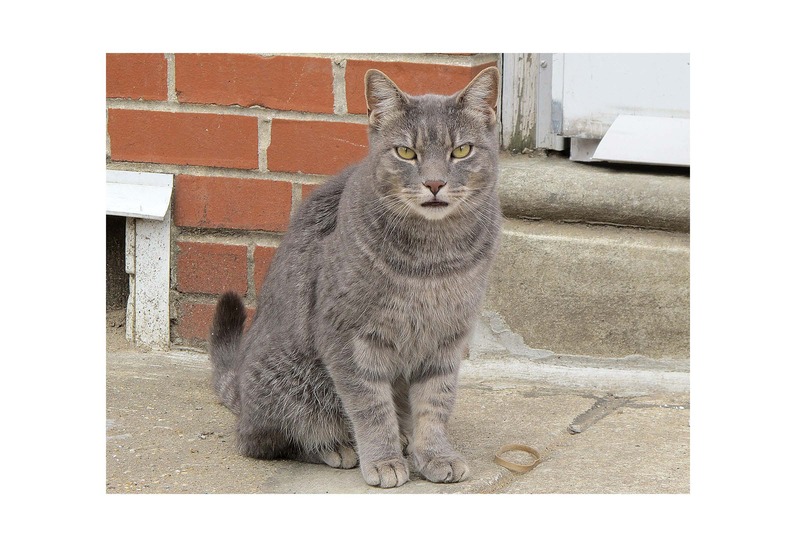 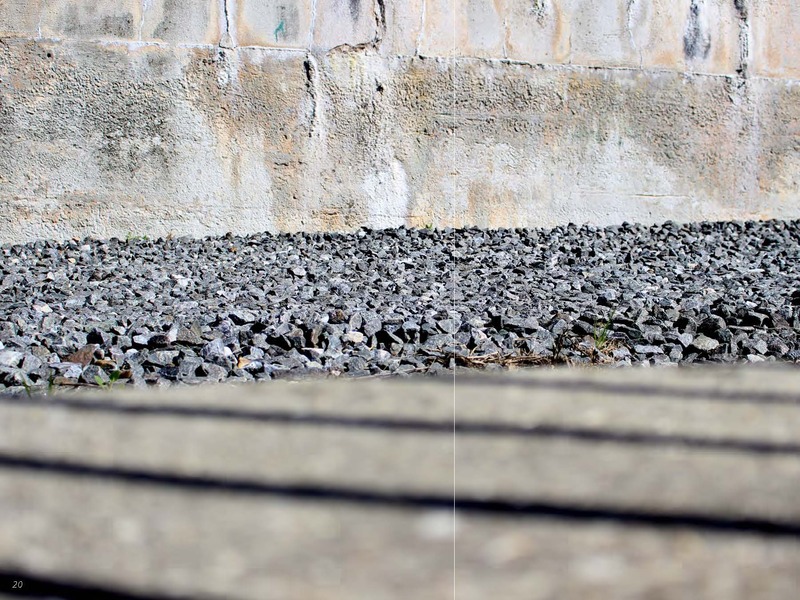 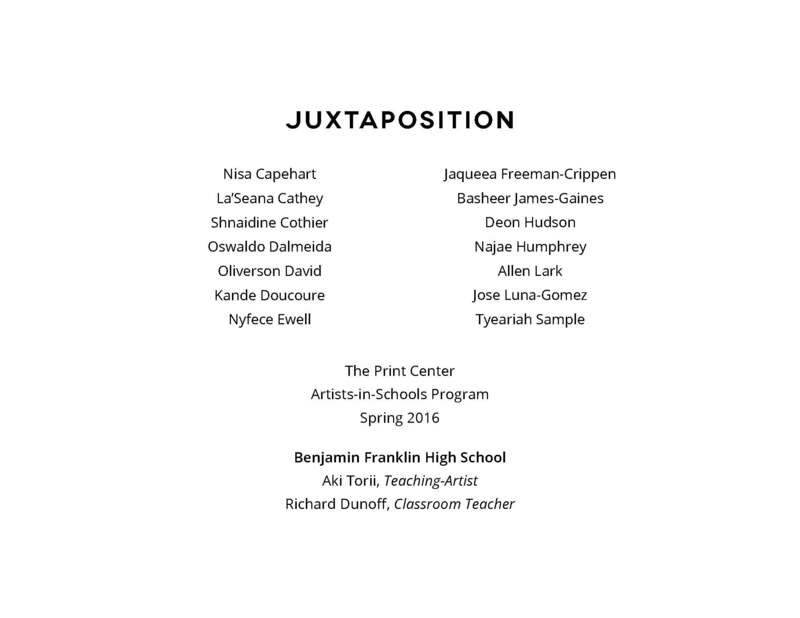 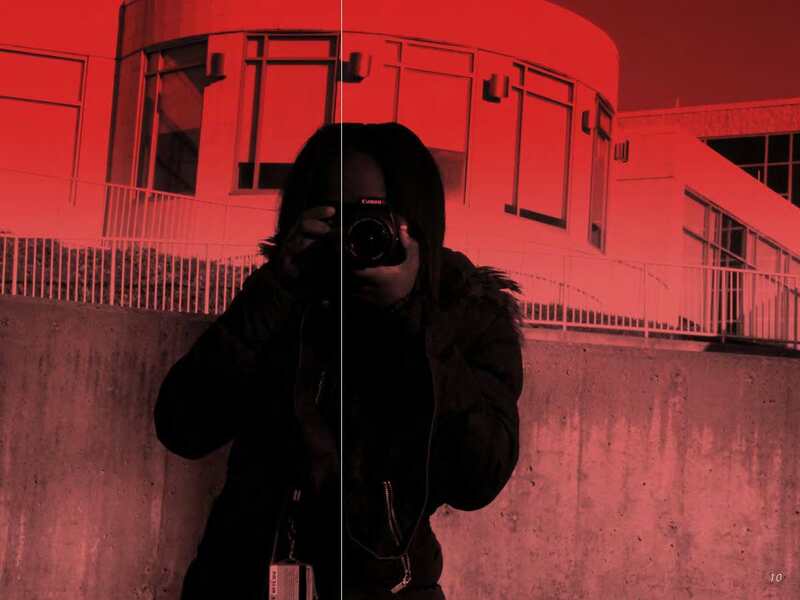 Students from Benjamin Franklin High School collaborated to create a photo book on the theme juxtaposition, comparing and contrasting different images to generate new meaning. 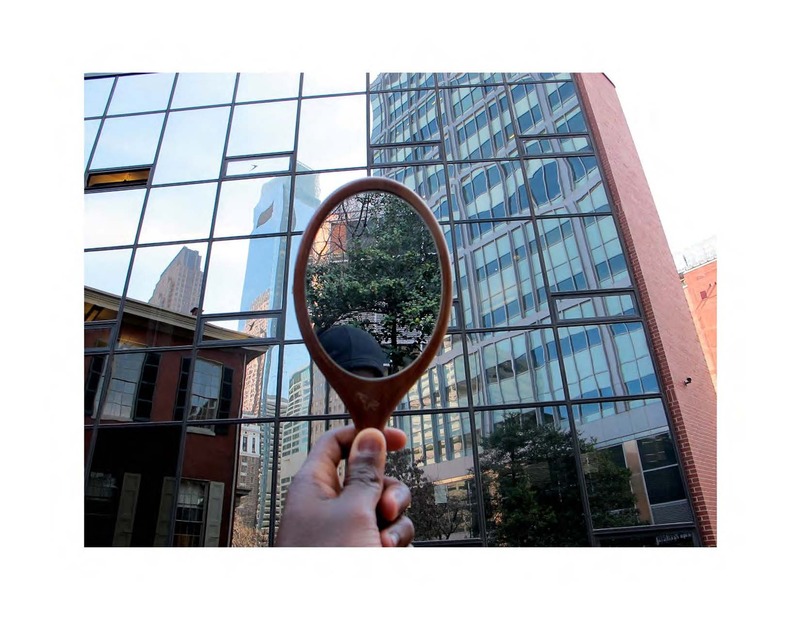 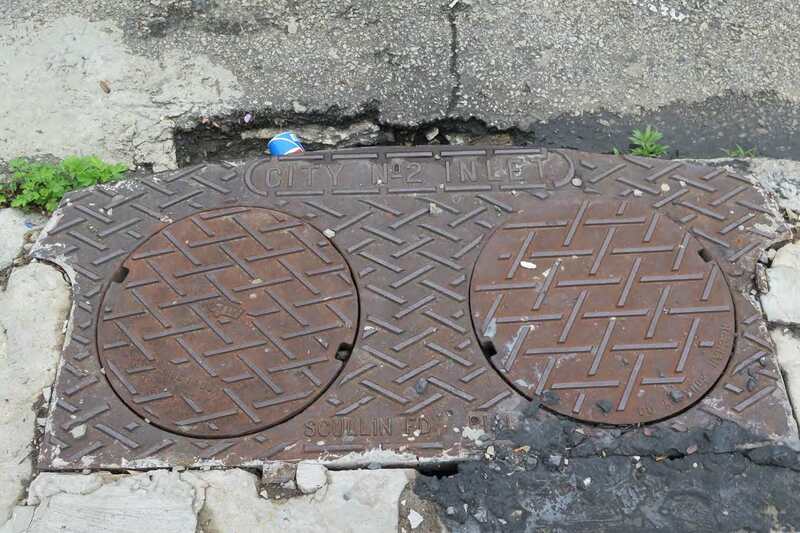 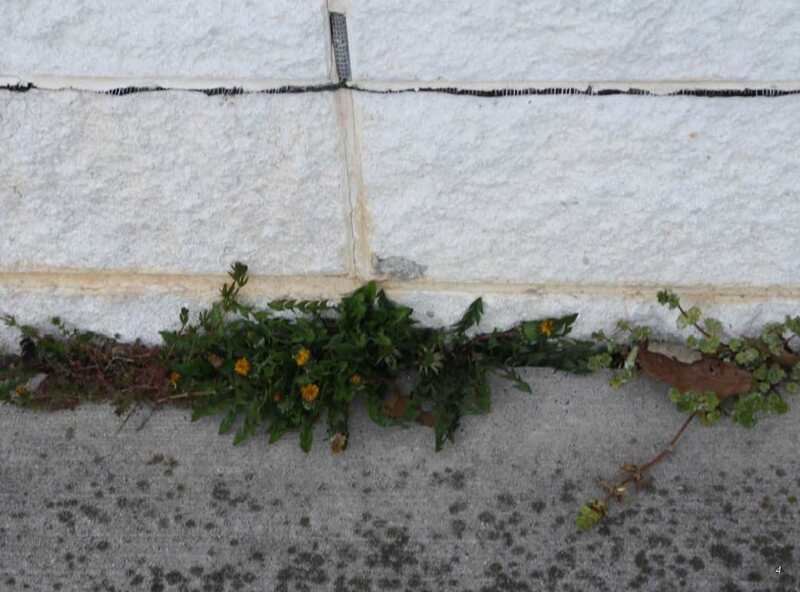 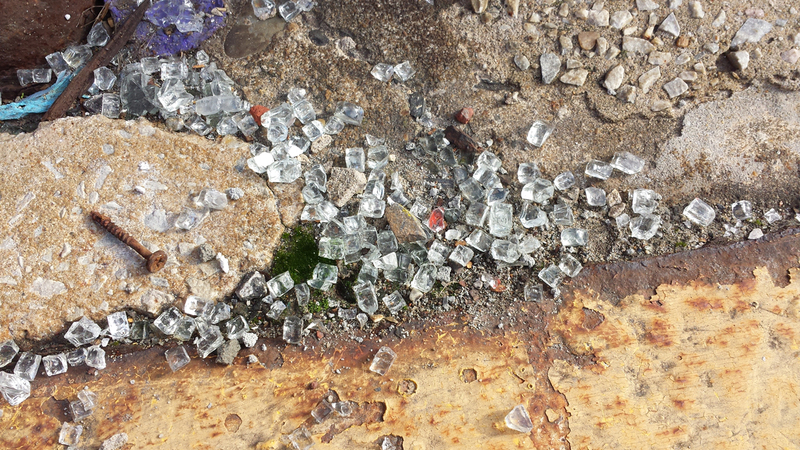 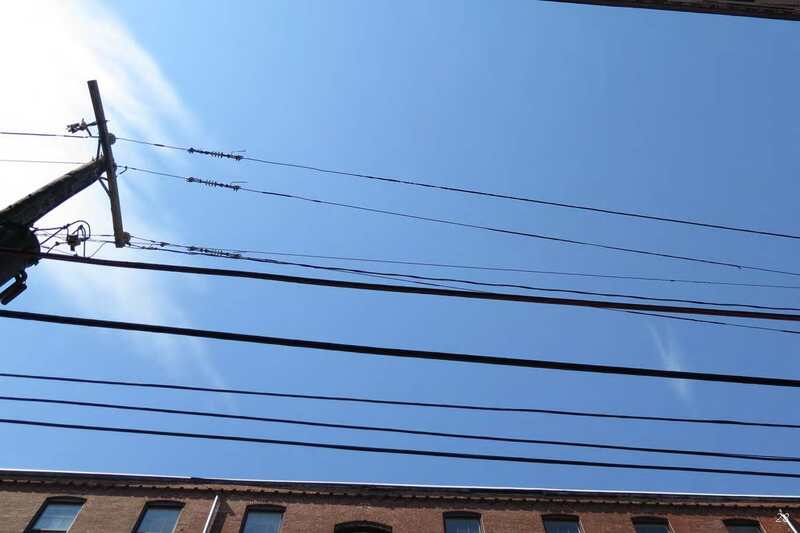 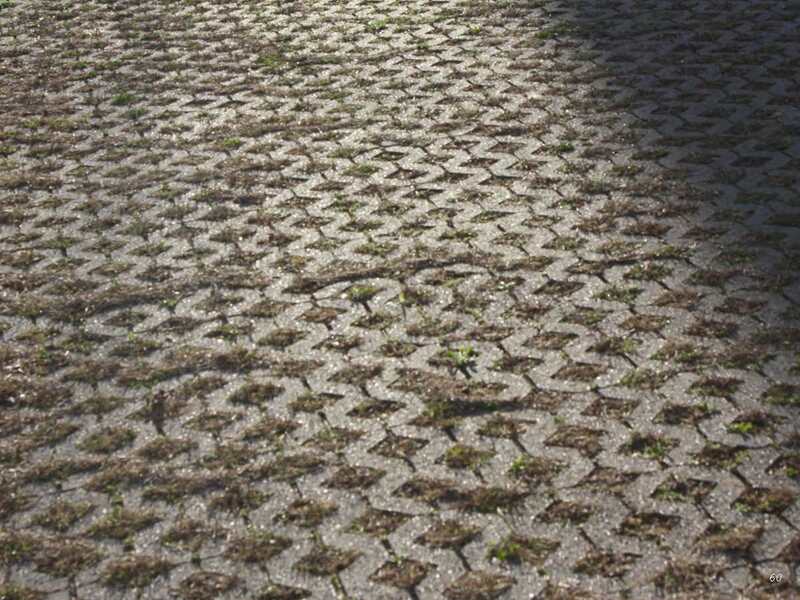 Through creating juxtapositions, they hope to emphasize aspects of our world which usually go unnoticed. 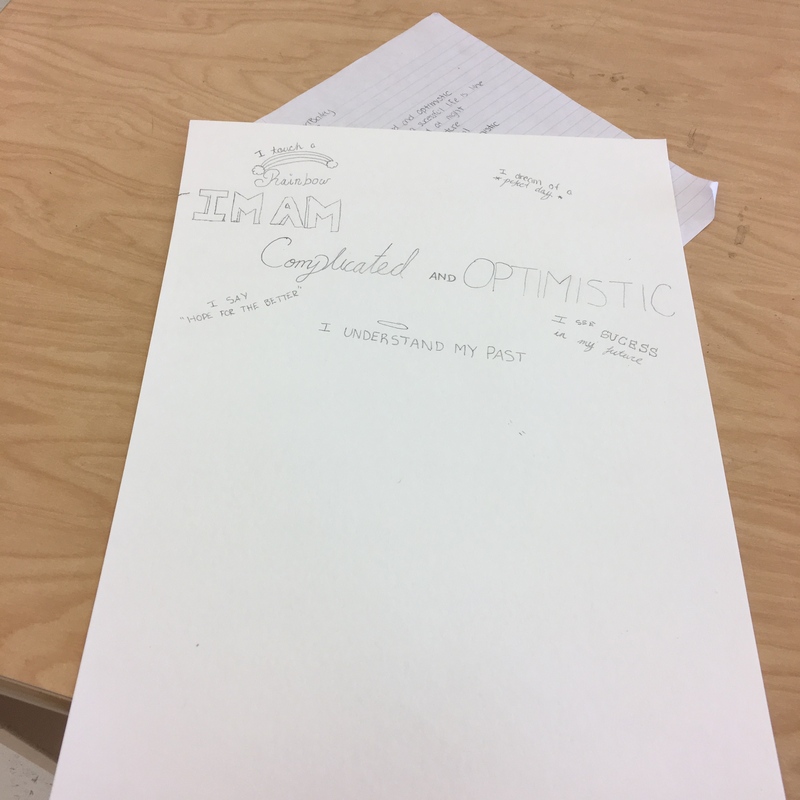 Some students created juxtaposition on a single page, others on opposing pages. 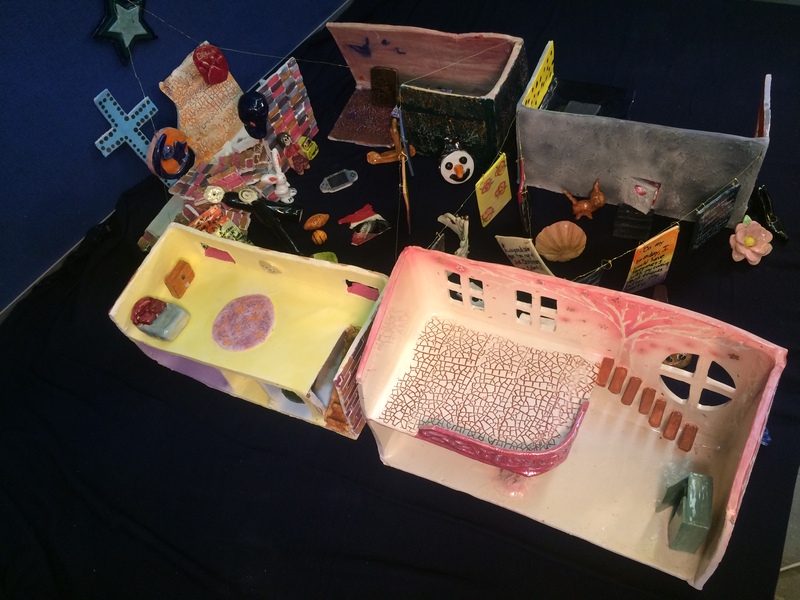 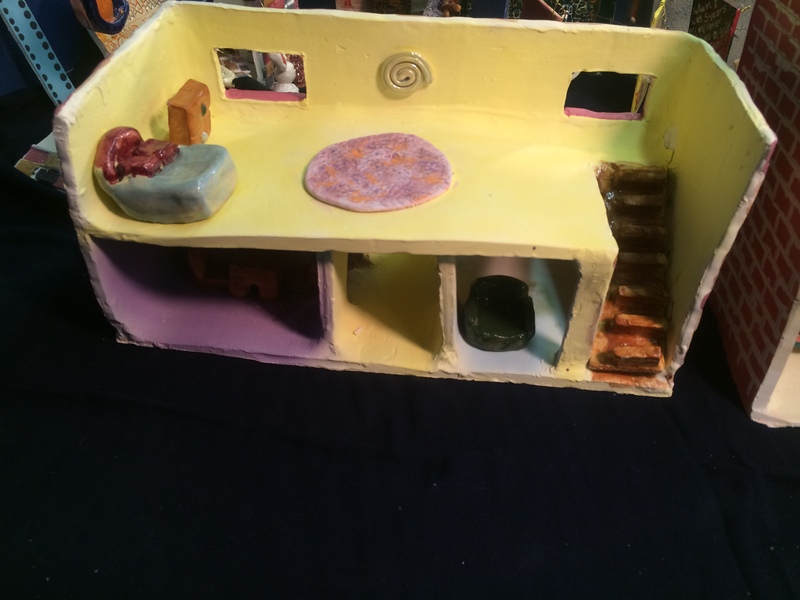 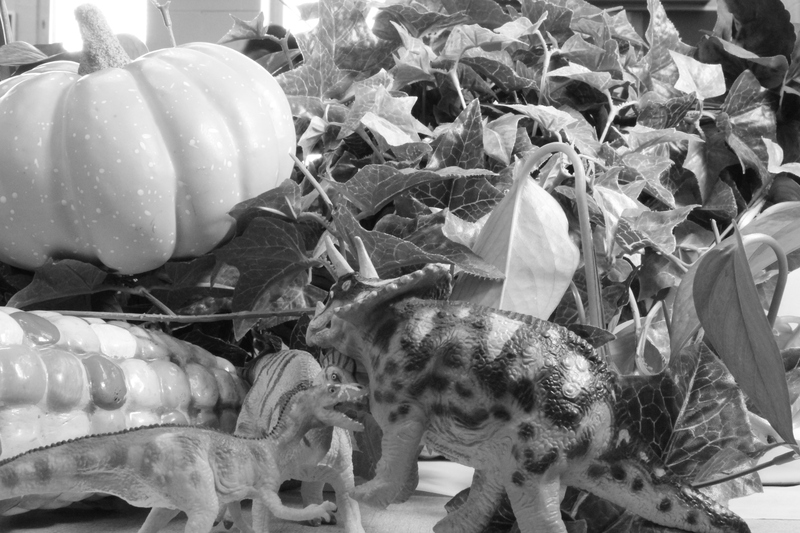 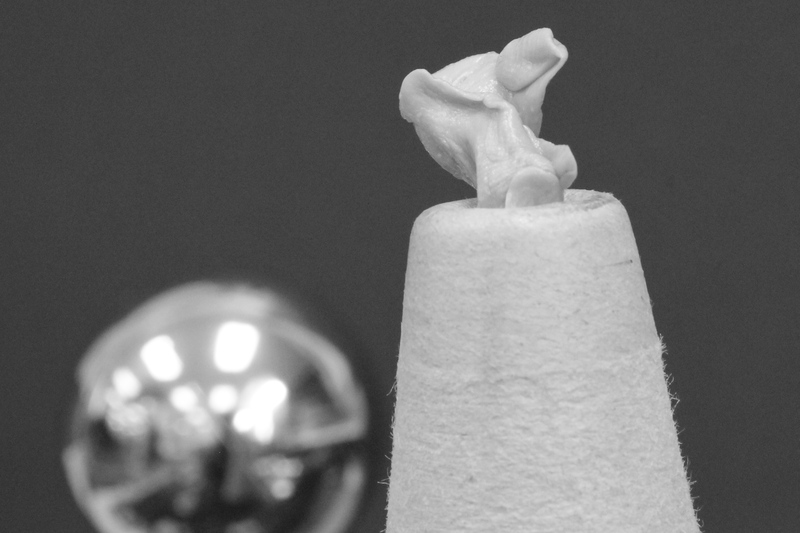 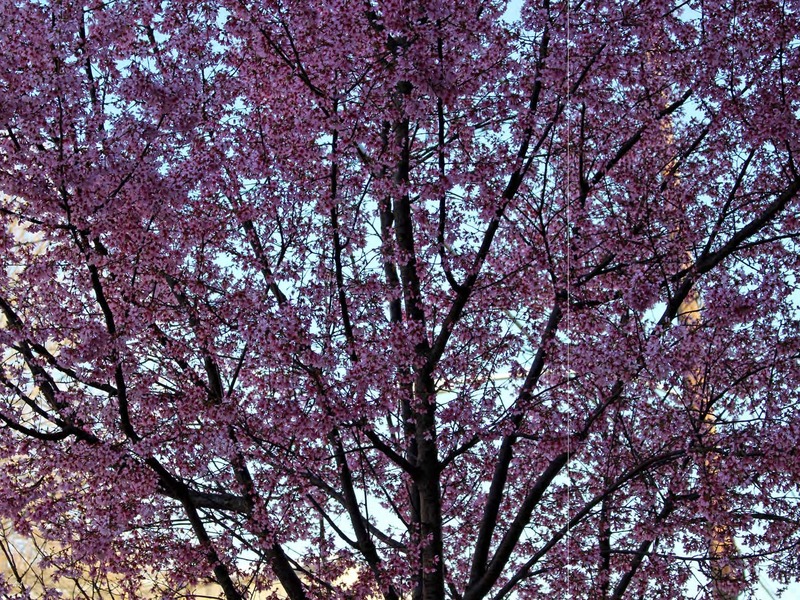 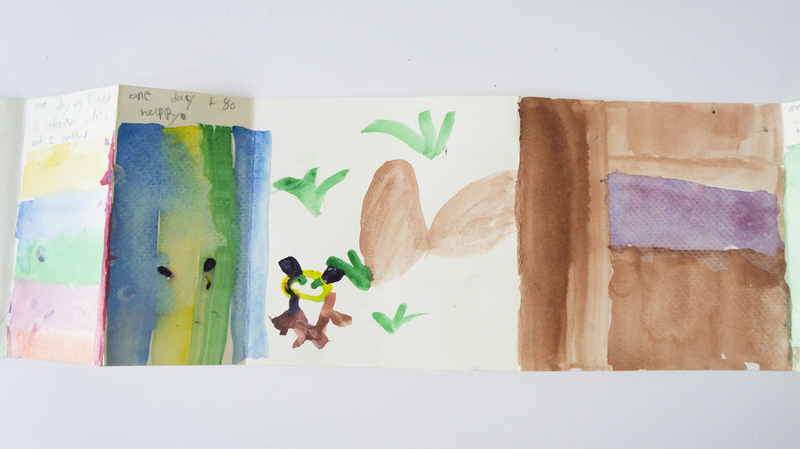 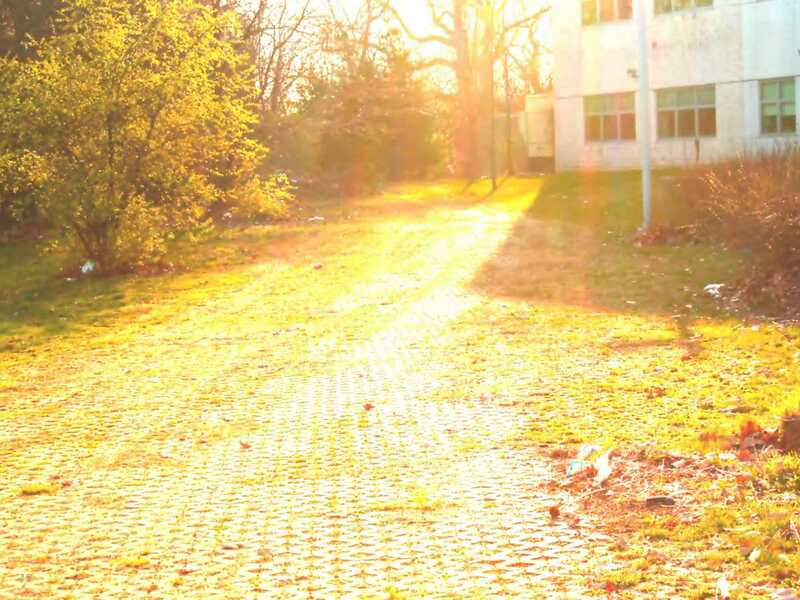 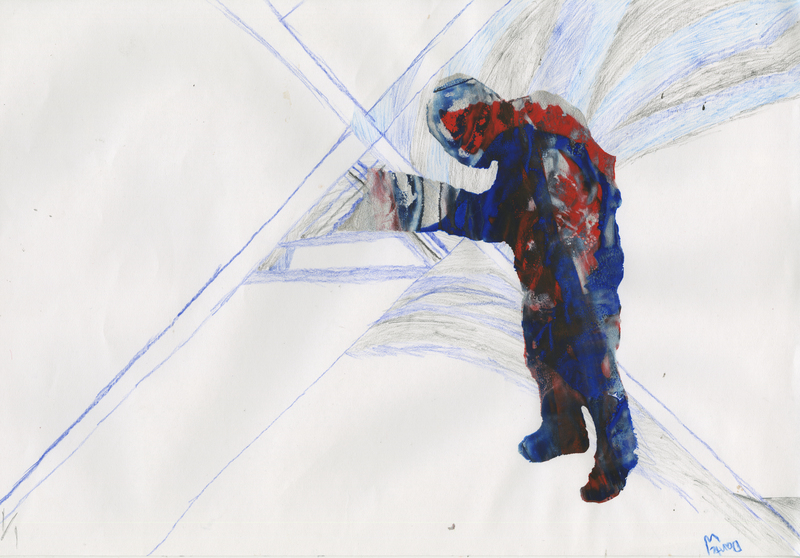 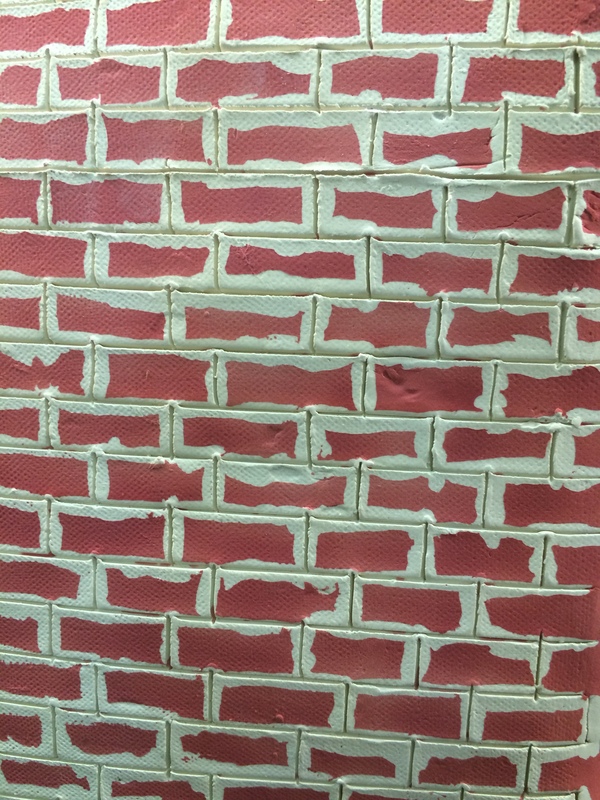 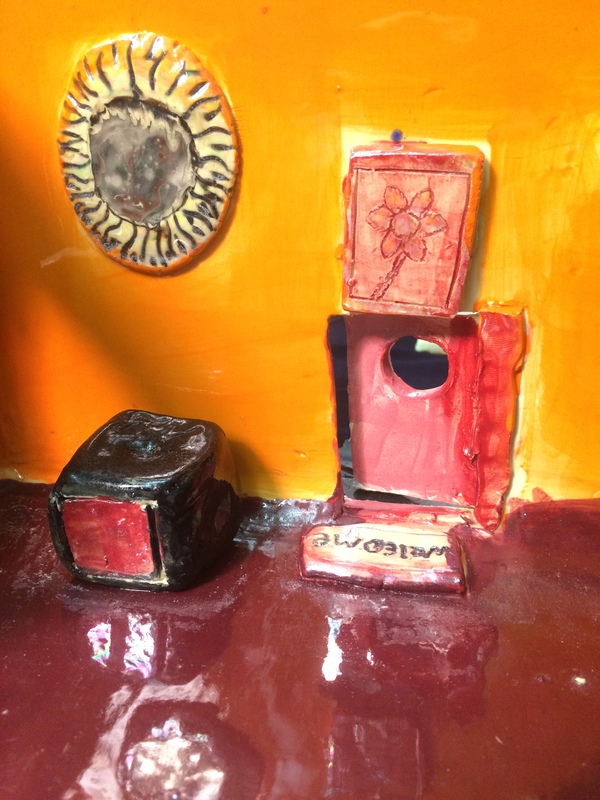 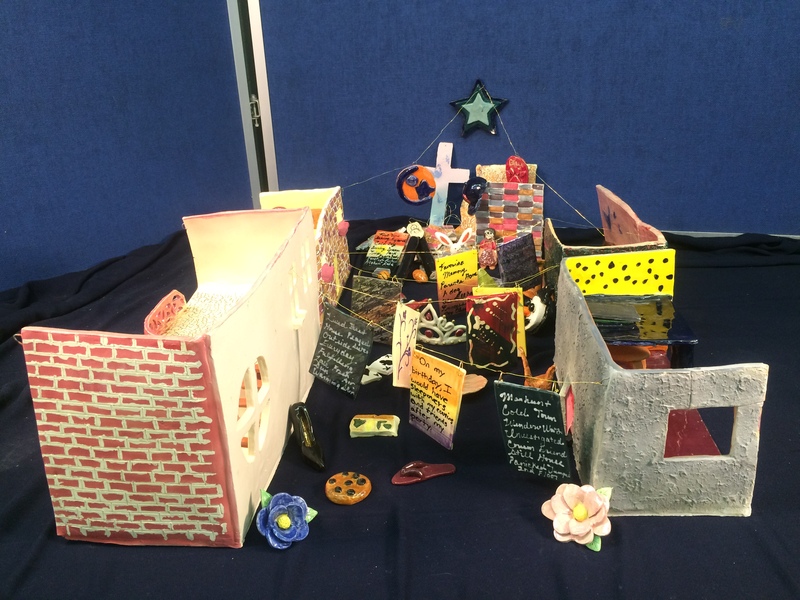 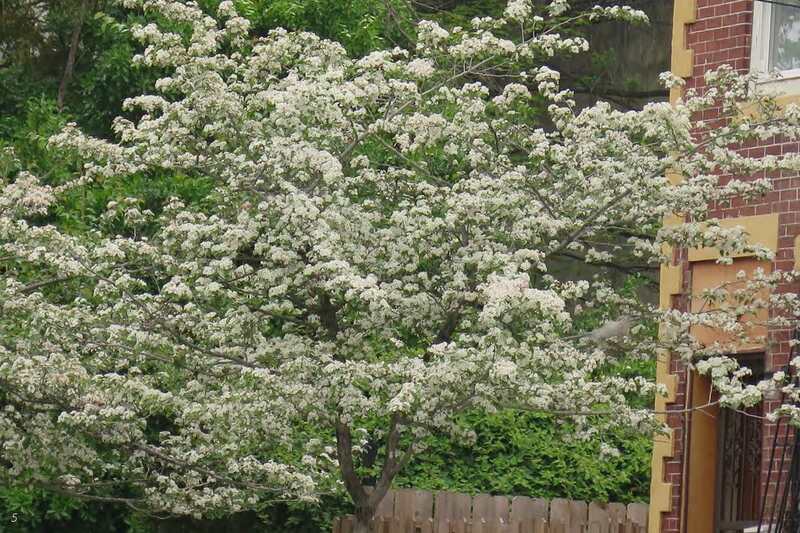 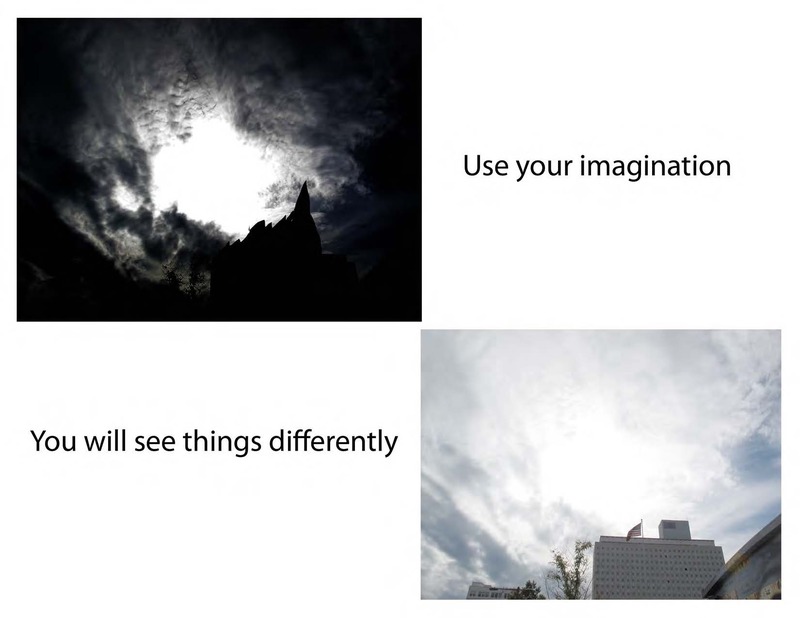 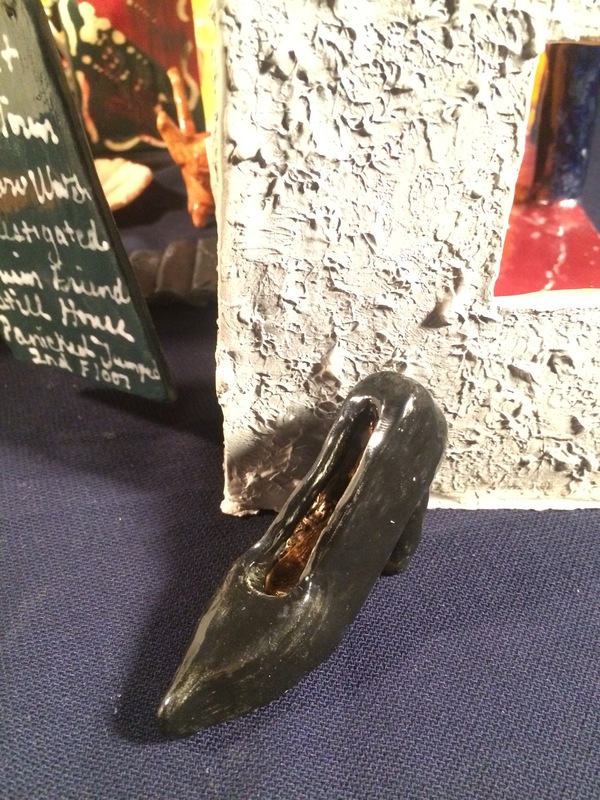 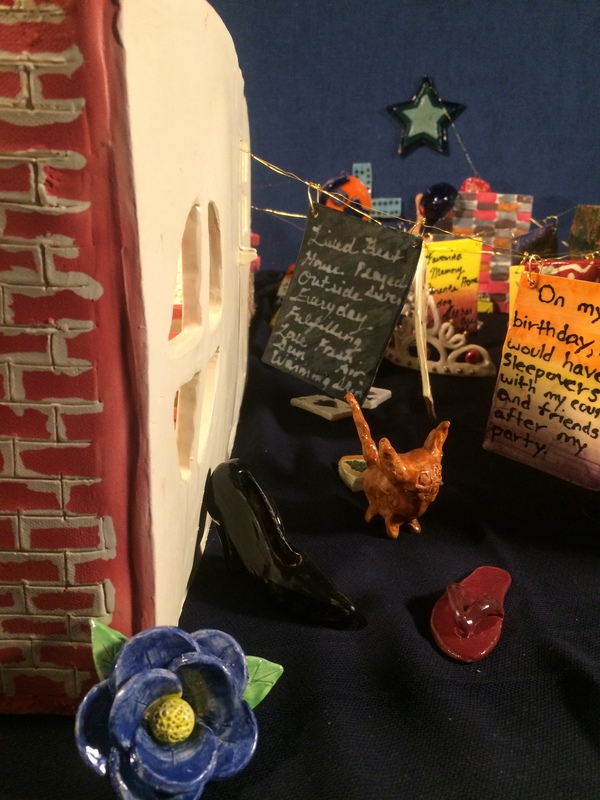 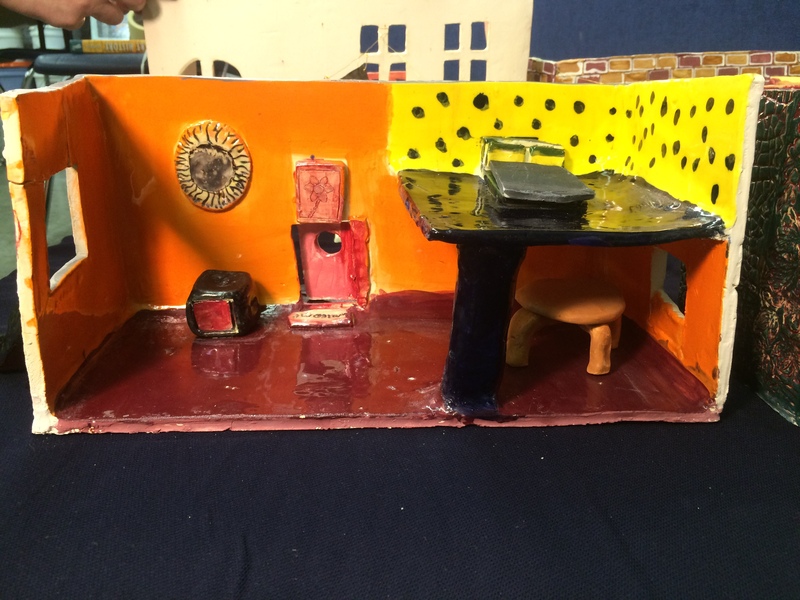 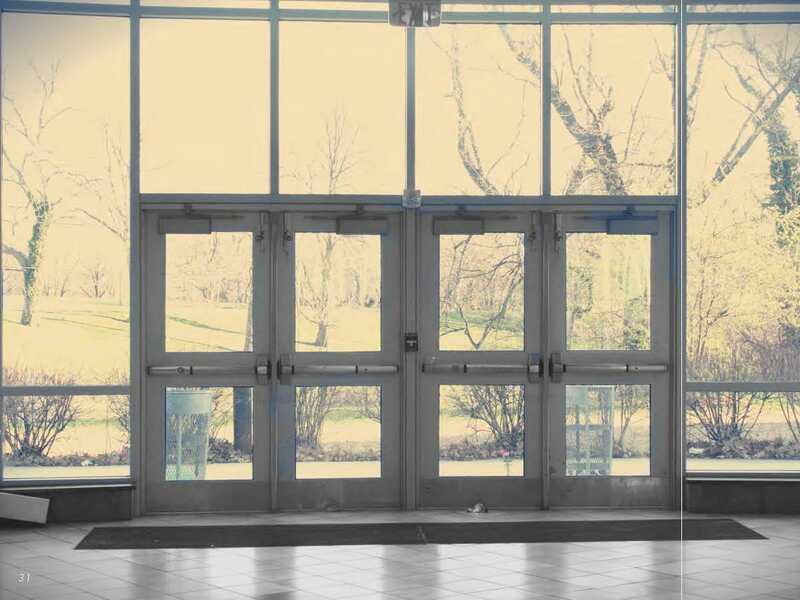 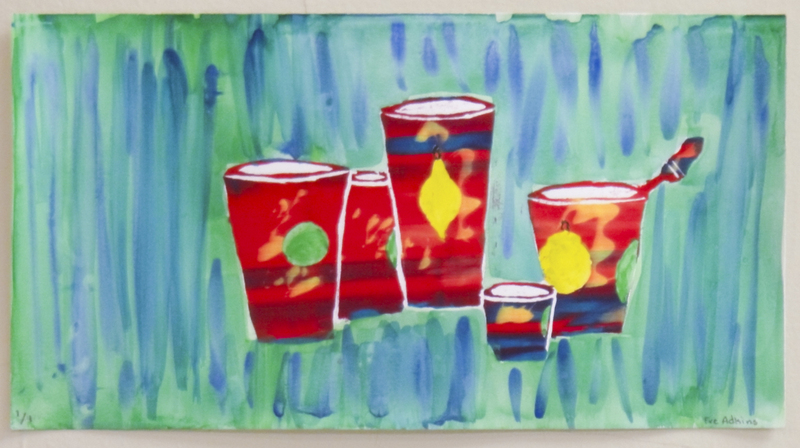 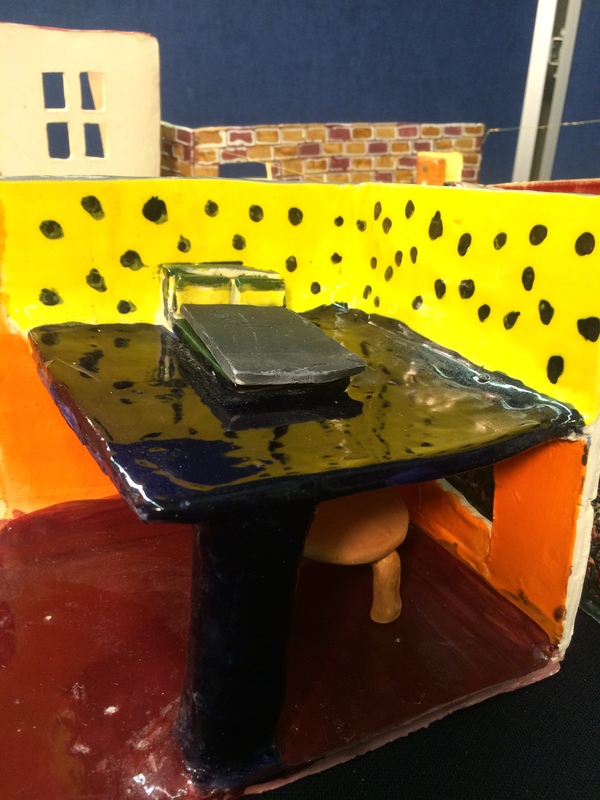 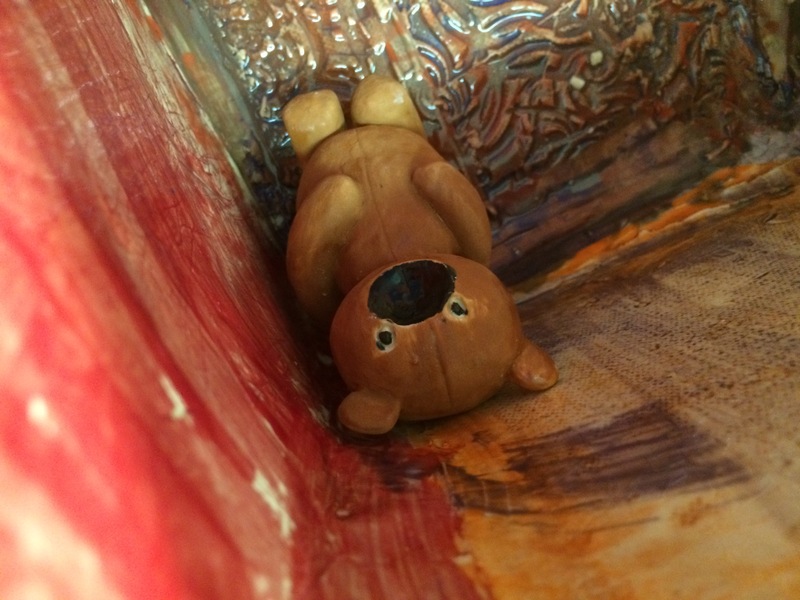 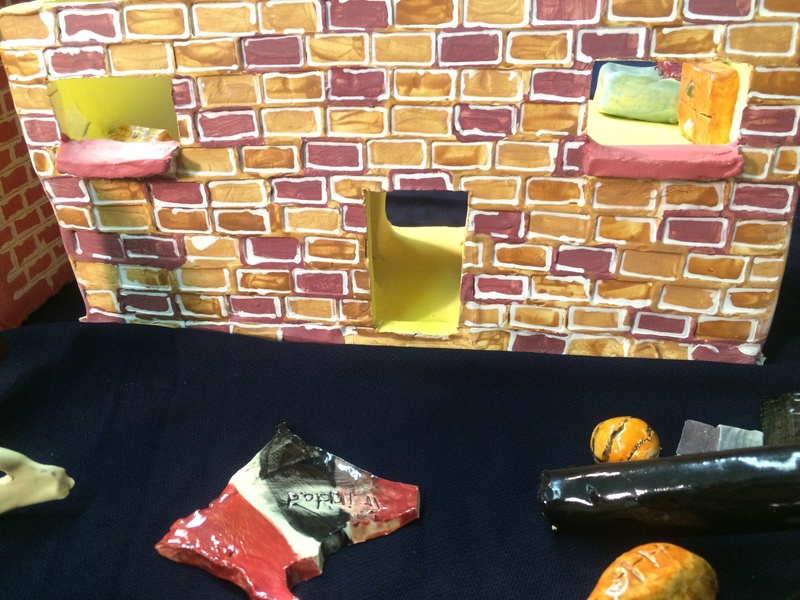 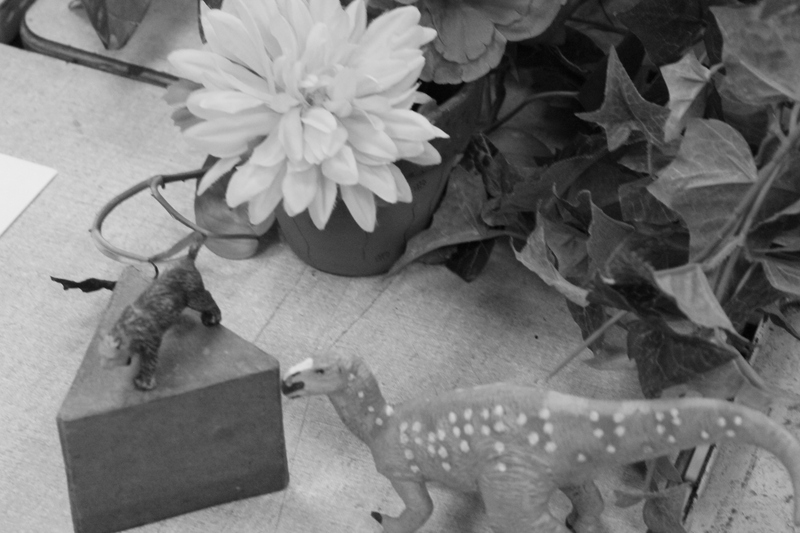 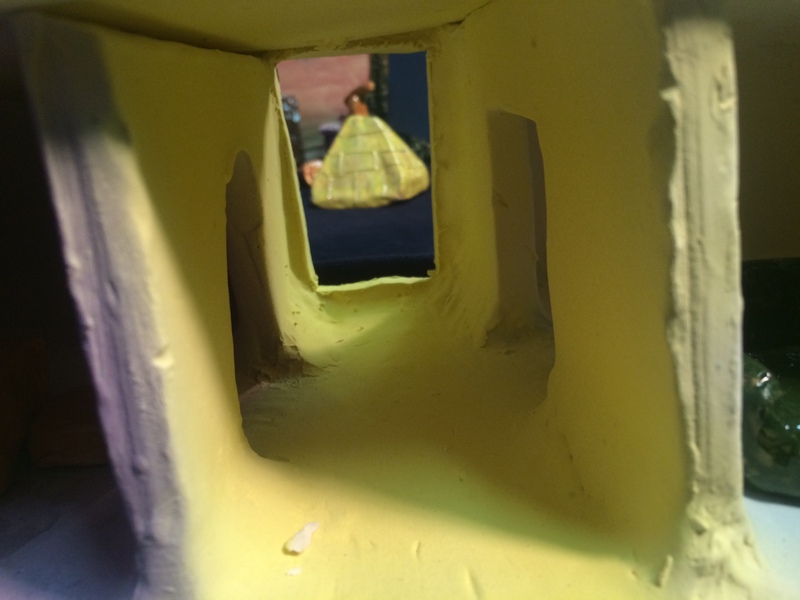 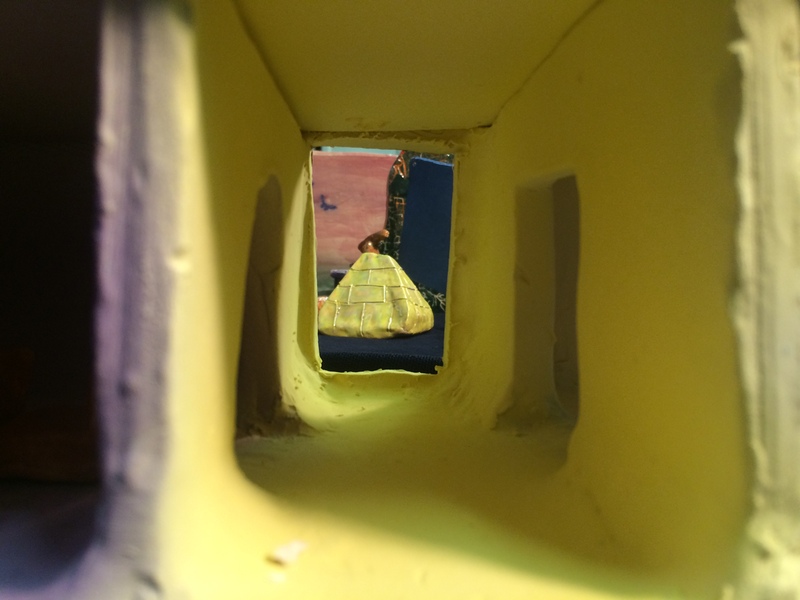 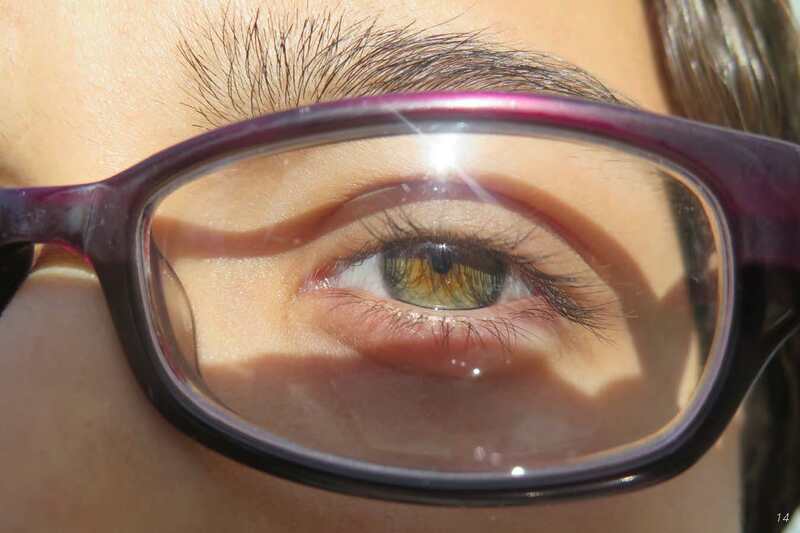 We invite you to view a familiar world through the students’ imaginative perspective. 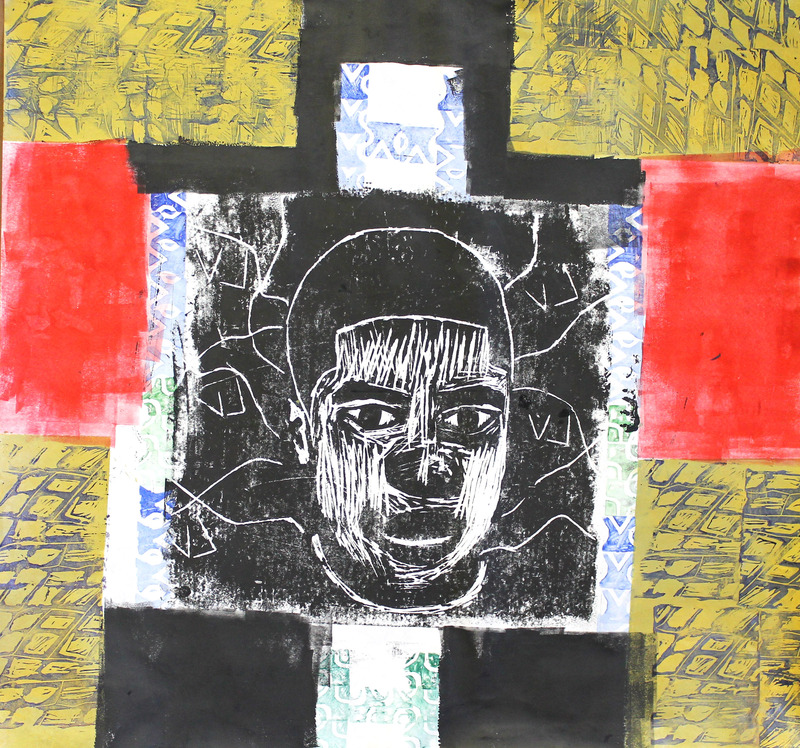 Student-artists in this gallery of work include Nisa Capehart, La’Seana Cathey, Shnaidine Cothier, Oswaldo Dalmeida, Oliverson David, Kande Doucoure, Nyfece Ewell, Jaqueea Freeman-Crippen, Basheer James-Gaines, Deon Hudson, Najae Humphrey, Allen Lark, Jose Luna-Gomez and Tyeariah Sample. 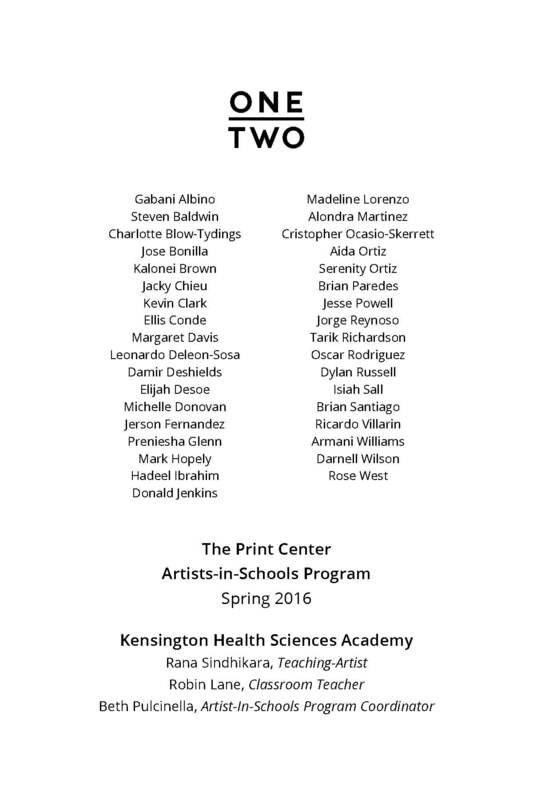 Student-artists in this gallery of work include Gabani Albino, Steven Baldwin, Charlotte Blow-Tydings, Jose Bonilla, Kalonei Brown, Jacky Chieu, Kevin Clark, Ellis Conde, Margaret Davis, Leonardo Deleon-Sosa, Damir Deshields, Elijah Desoe, Michelle Donovan, Jerson Fernandez, Preniesha Glenn, Mark Hopely, Hadeel Ibrahim, Donald Jenkins, Madeline Lorenzo, Alondra Martinez, Cristopher Ocasio-Skerrett, Aida Ortiz, Serenity Ortiz, Brian Paredes, Jesse Powell, Jorge Reynoso, Tarik Richardson, Oscar Rodriguez, Dylan Russell, Isiah Sall, Brian Santiago, Ricardo Villarin, Armani Williams, Darnell Wilson and Rose West. 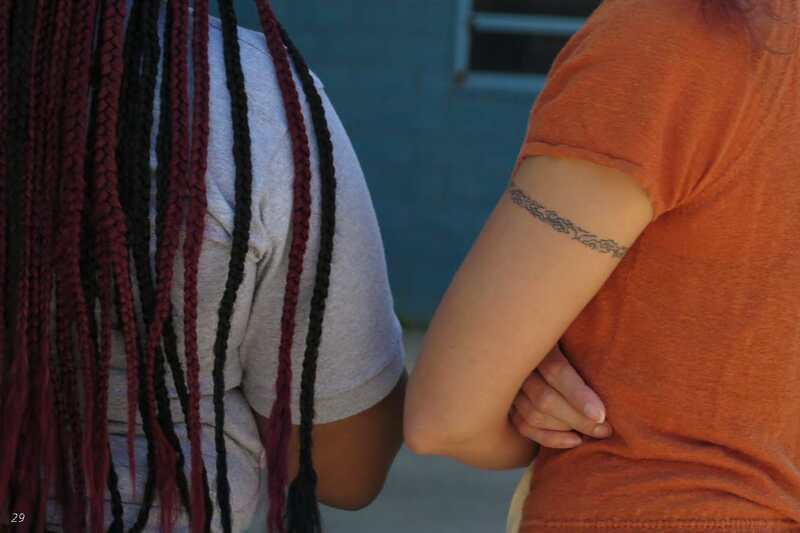 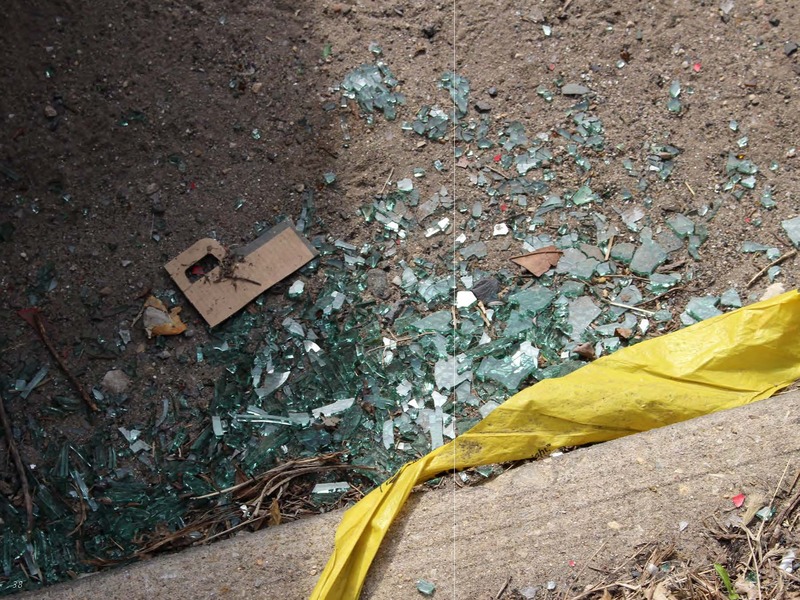 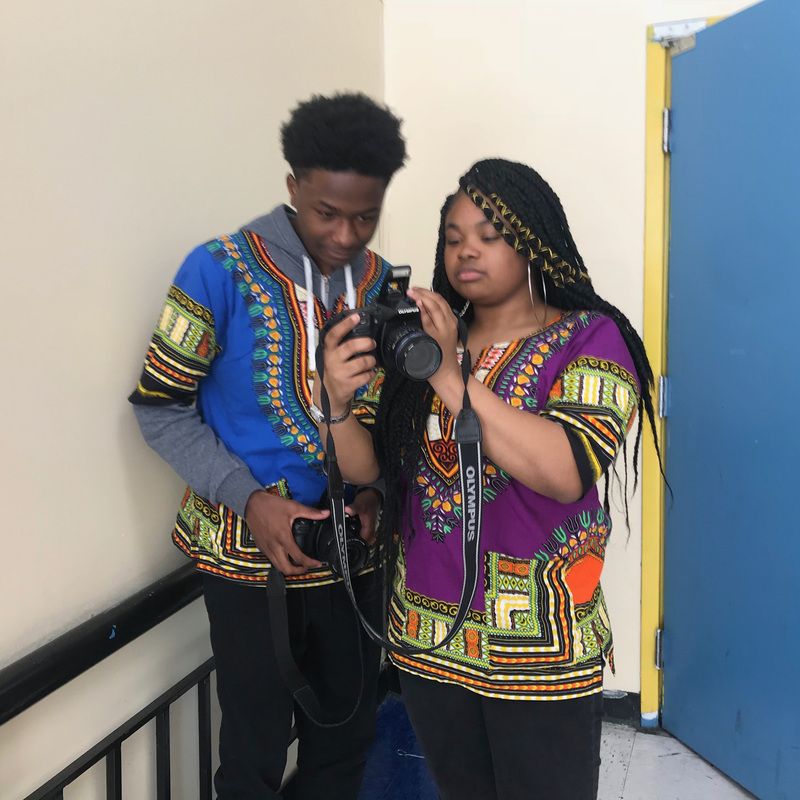 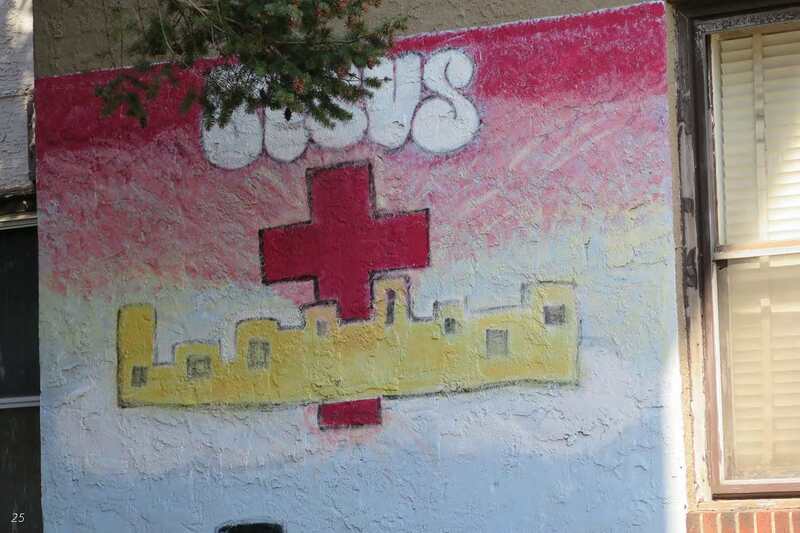 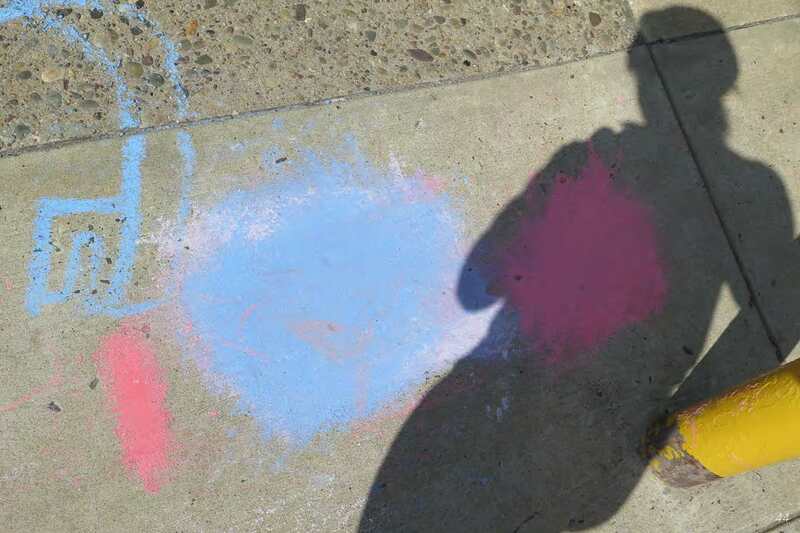 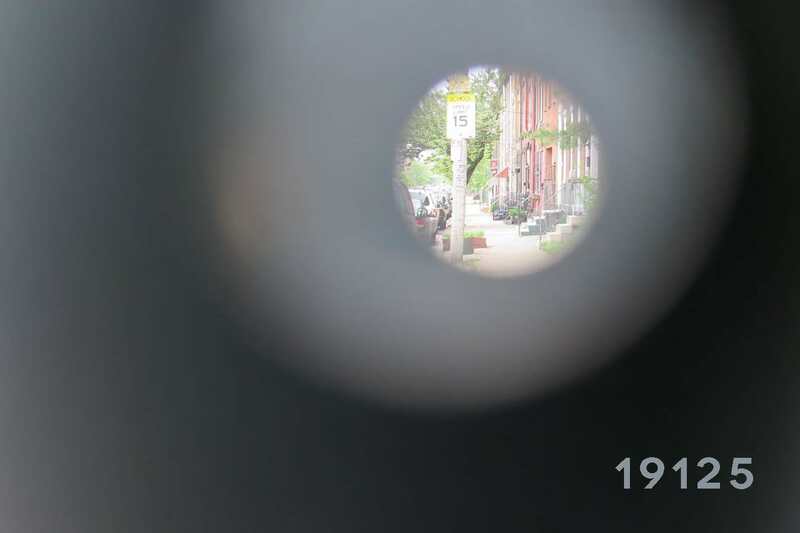 Students from a high school art class (grades 9 – 12) at Kensington Health Sciences Academy took to the streets around their school, located in zip code 19125, with cameras in hand. 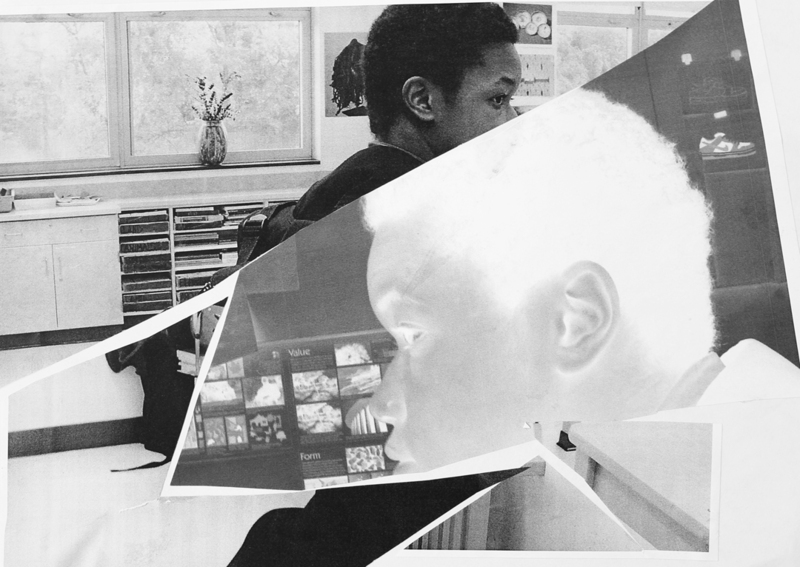 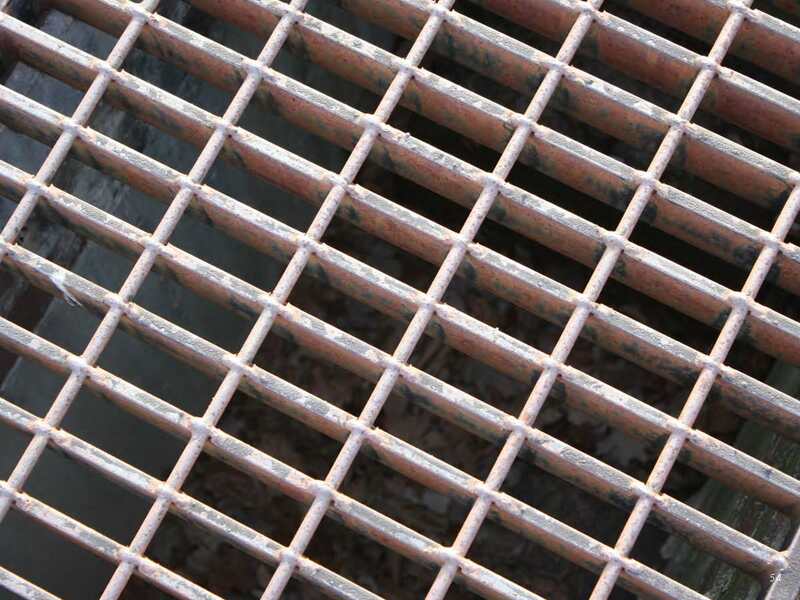 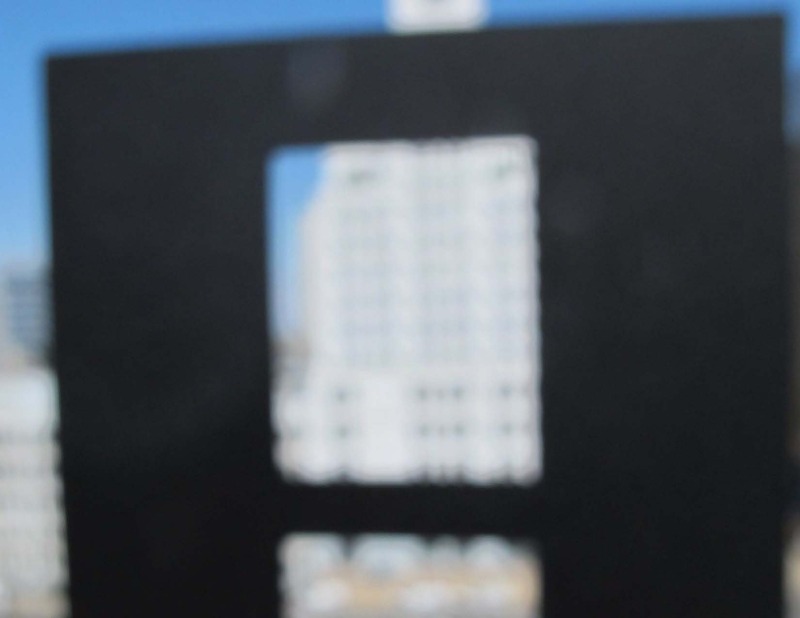 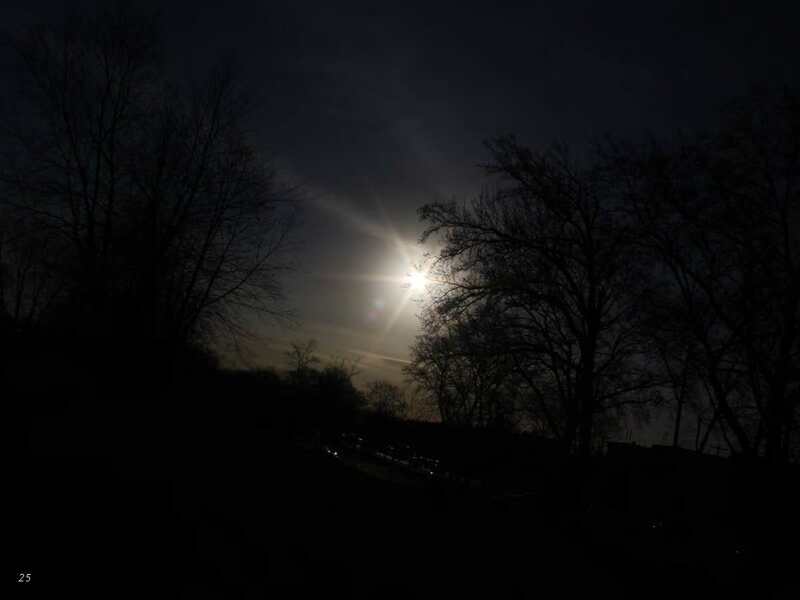 They uncovered alternative perspectives and new narratives in the familiar landscape. 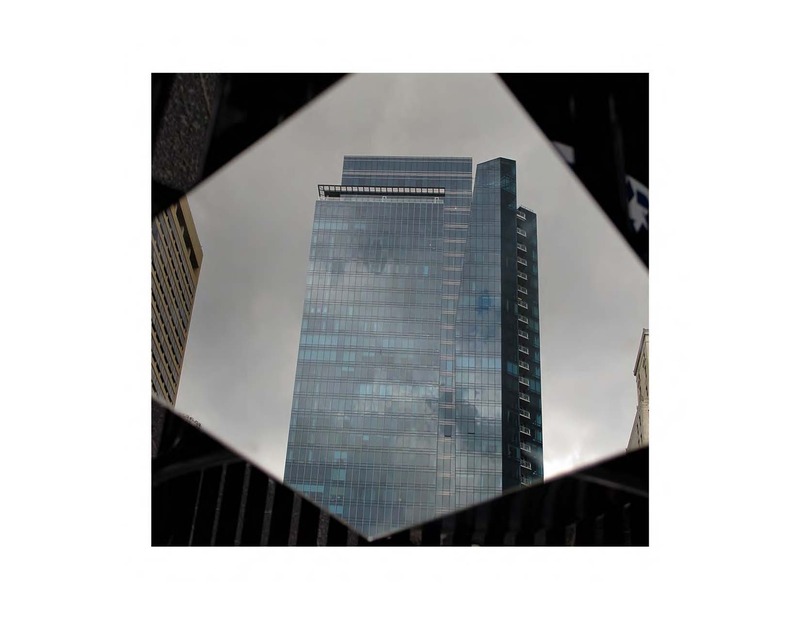 Working in small groups, they explored how framing, pattern, leading lines and symmetry can be used to make photographs that reveal worlds that usually go unnoticed. 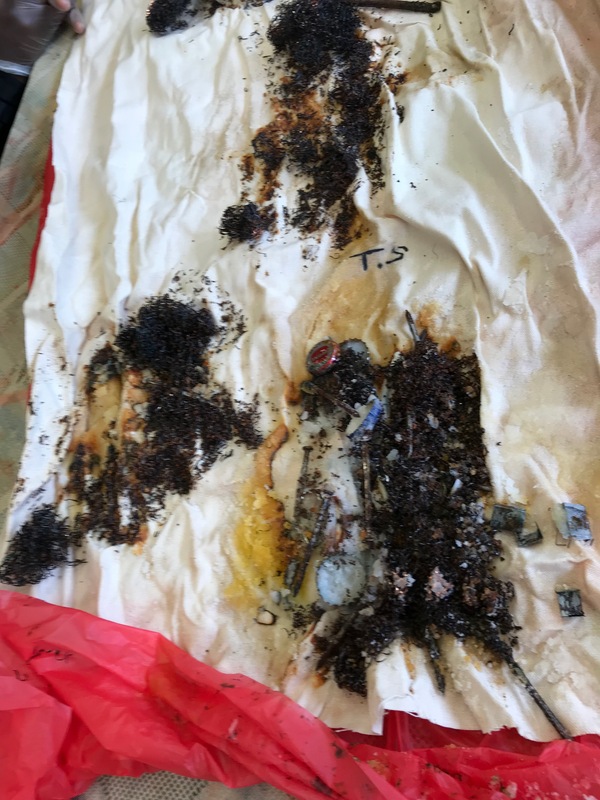 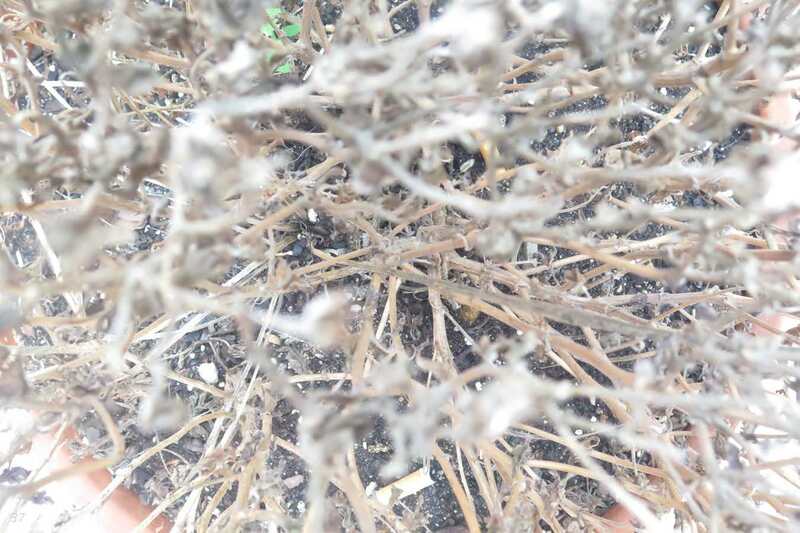 This is what they found. 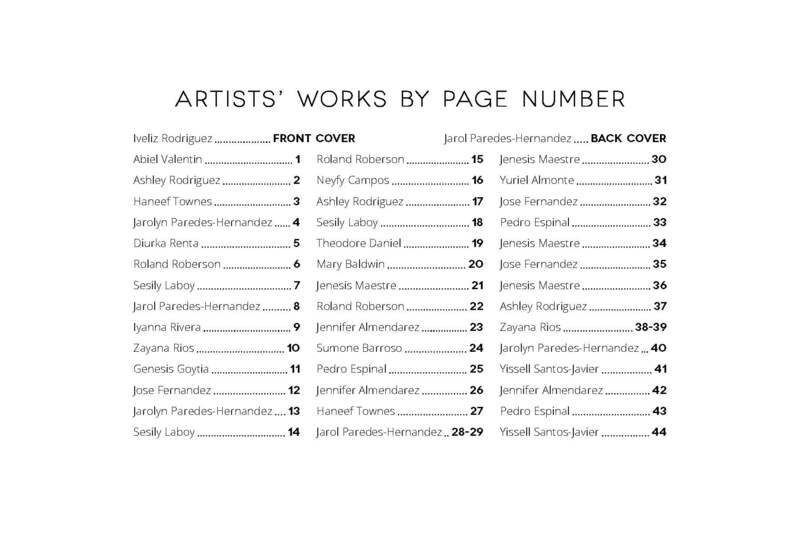 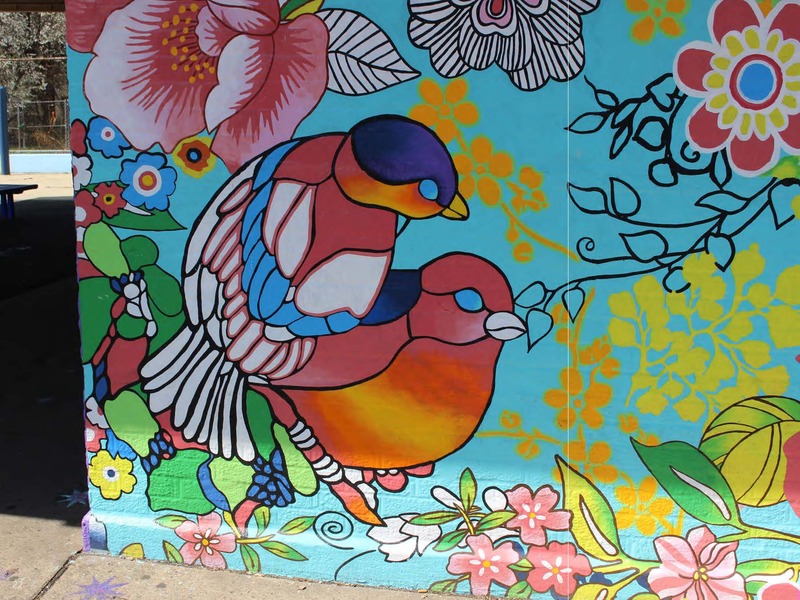 Student-artists in this gallery of work include Jennifer Almendarez, Yuriel Almonte, Mary Baldwin, Sumone Barroso, Neyfy Campos, Theodore Daniel, Pedro Espinal, Jose Fernandez, Genesis Goytia, Sesily Laboy, Jenesis Maestre, Jarol Paredes-Hernandez, Jarolyn Paredes-Hernandez, Diurka Renta, Zayana Rios, Iyanna Rivera, Roland Roberson, Ashley Rodriguez, Iveliz Rodriguez, Yissell Santos-Javier, Haneef Townes and Abiel Valentin. 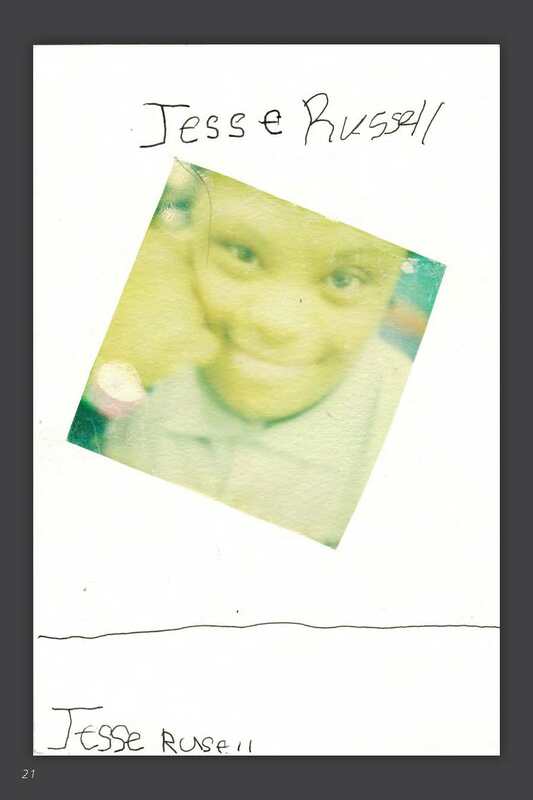 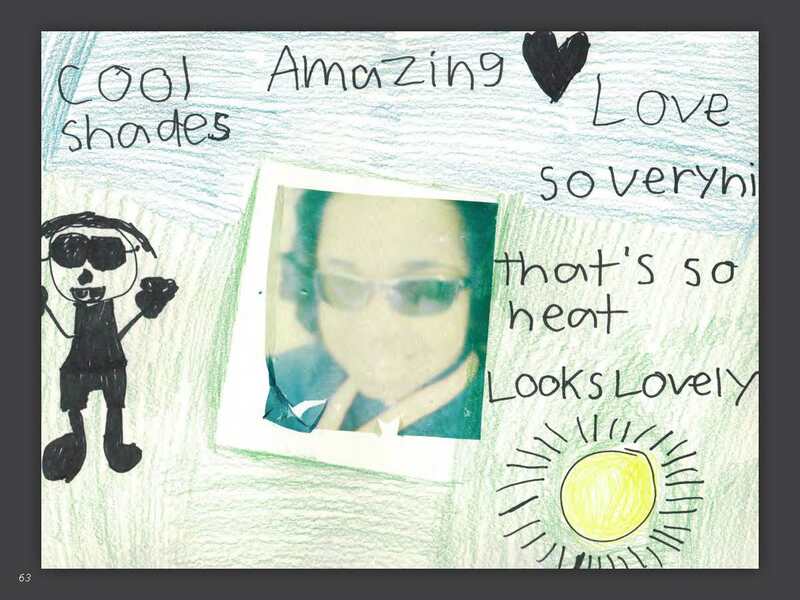 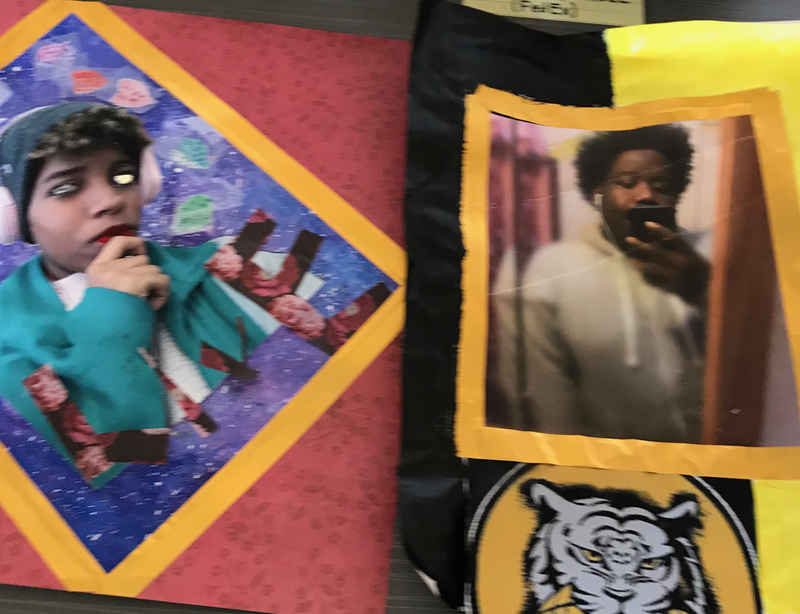 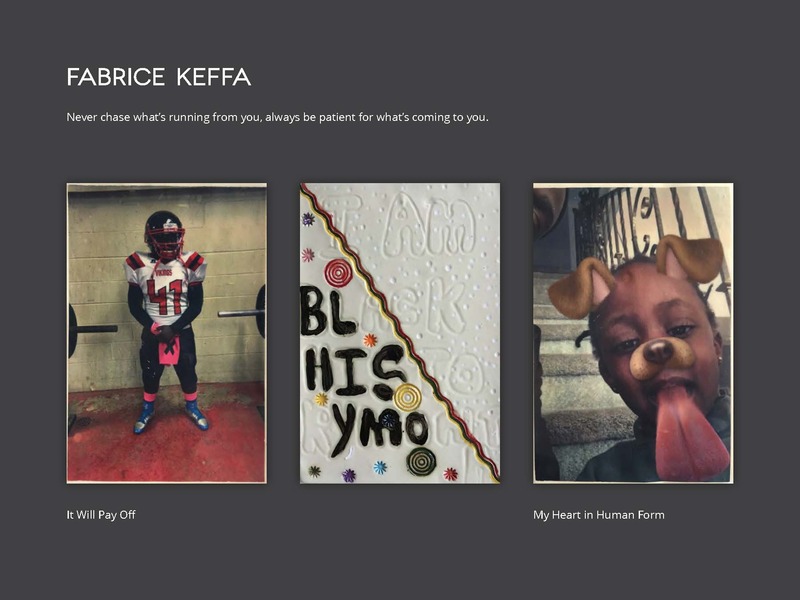 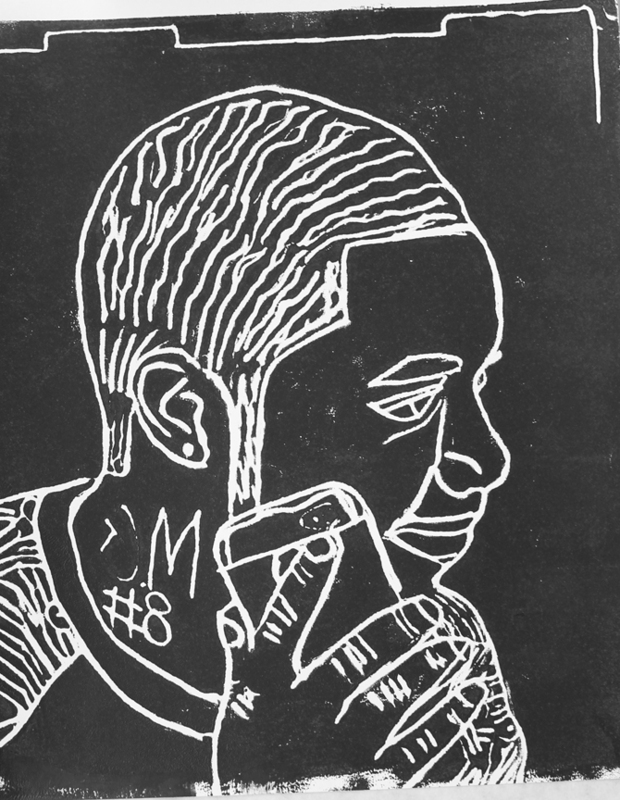 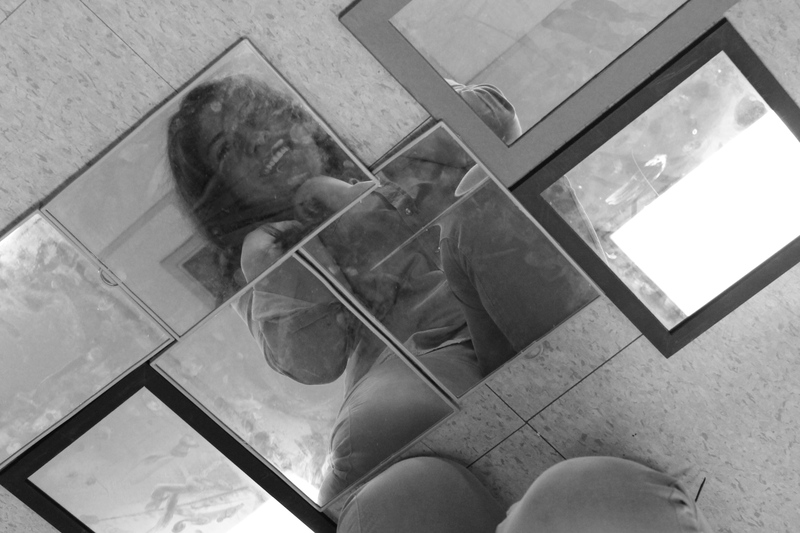 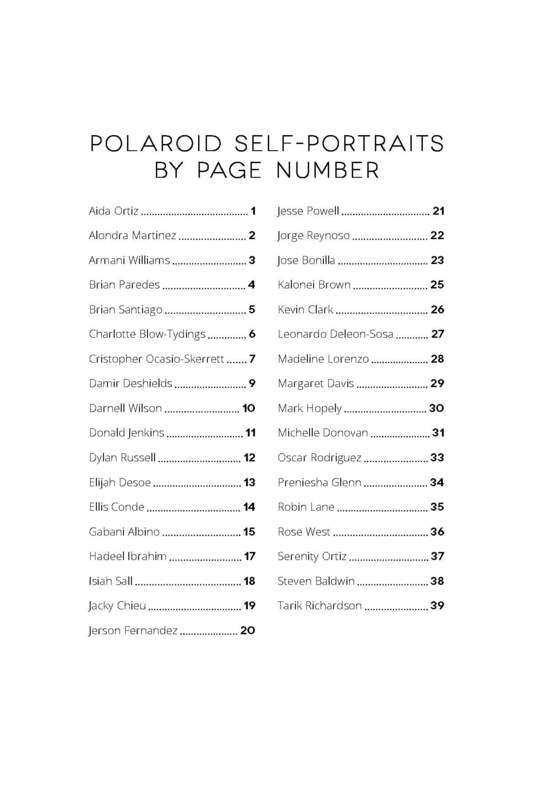 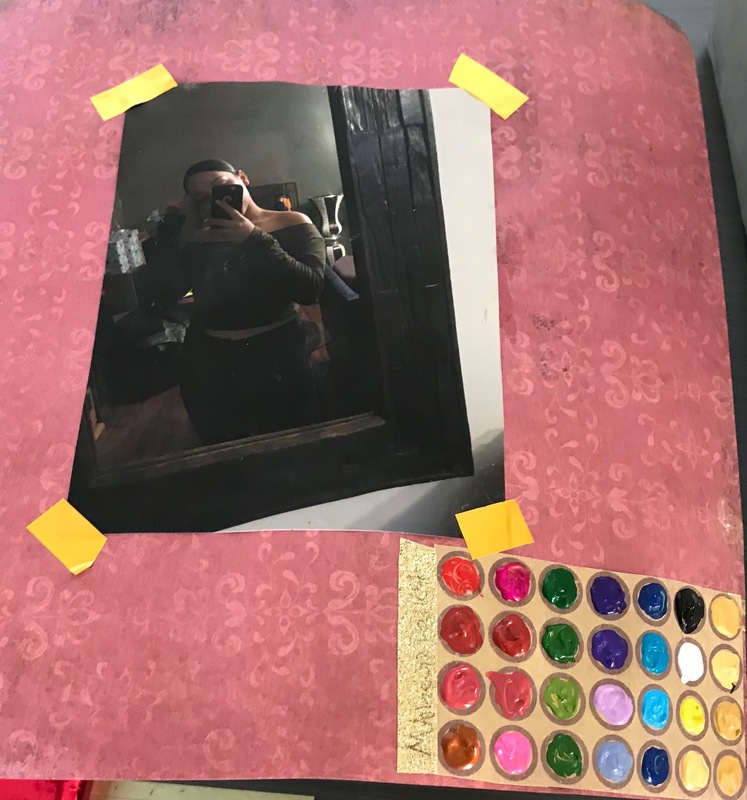 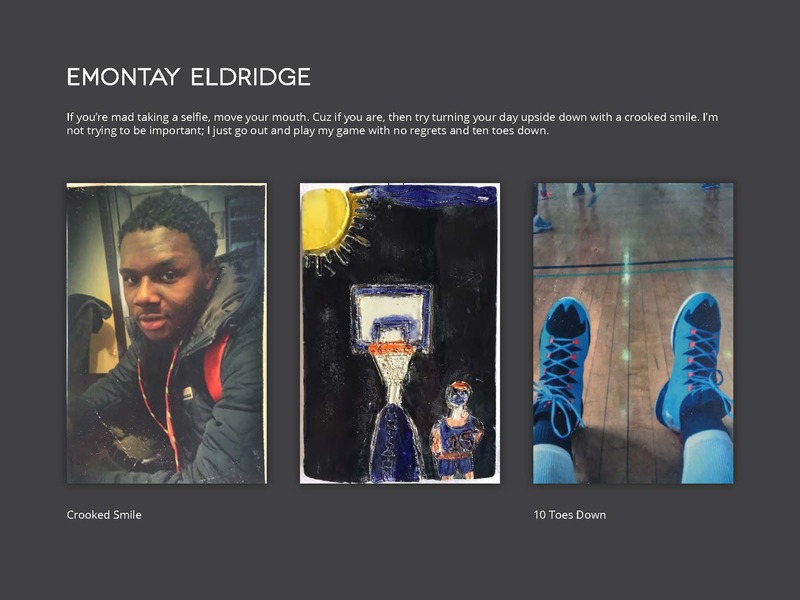 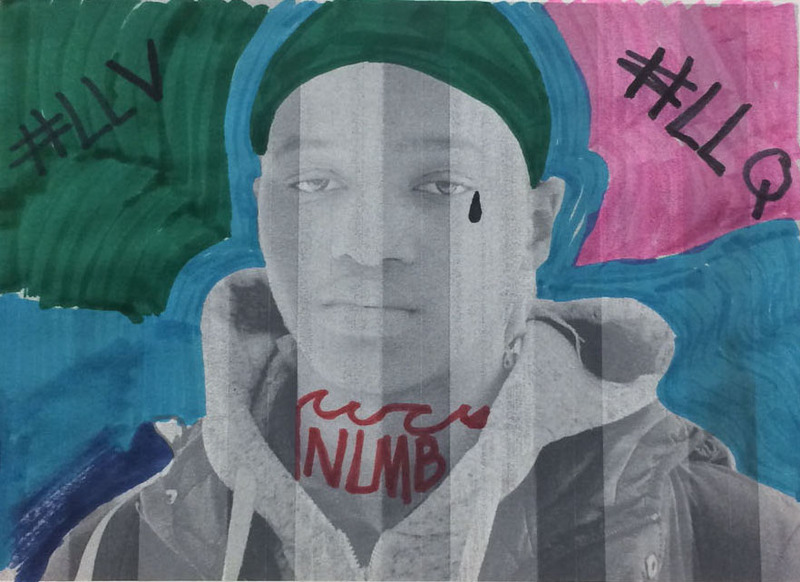 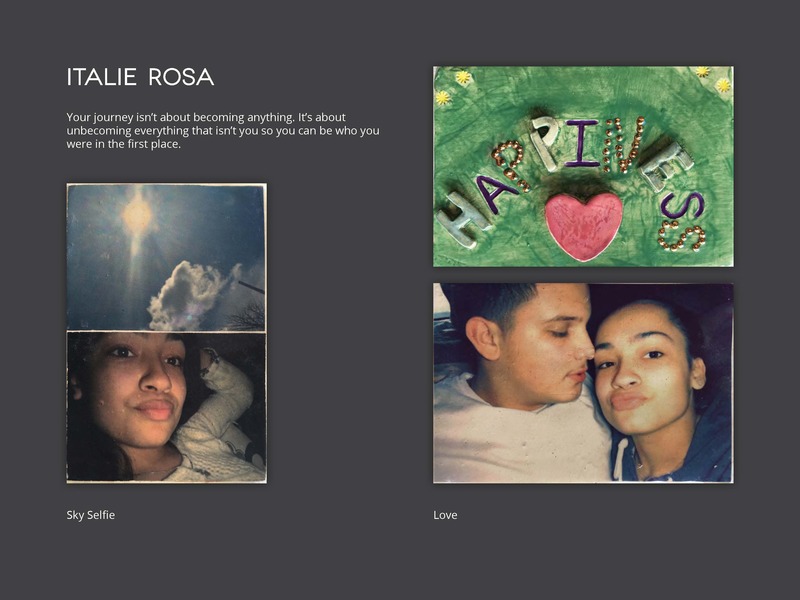 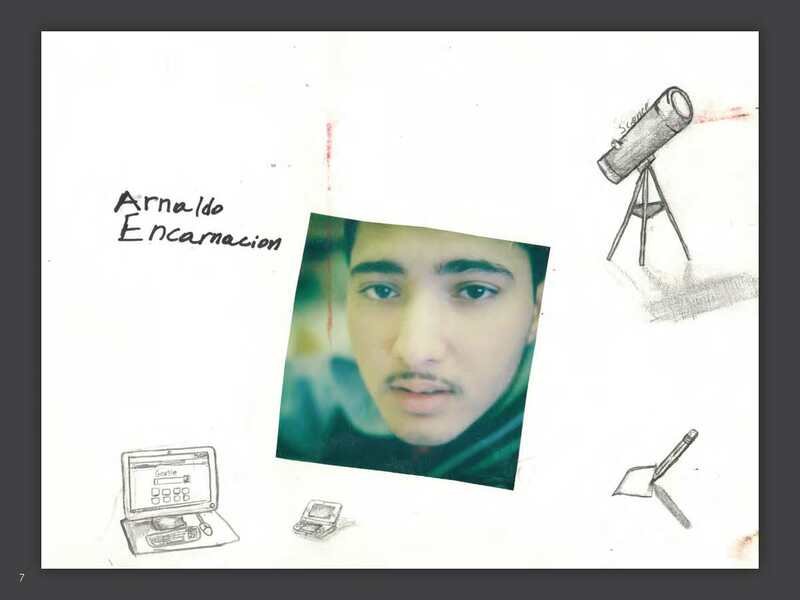 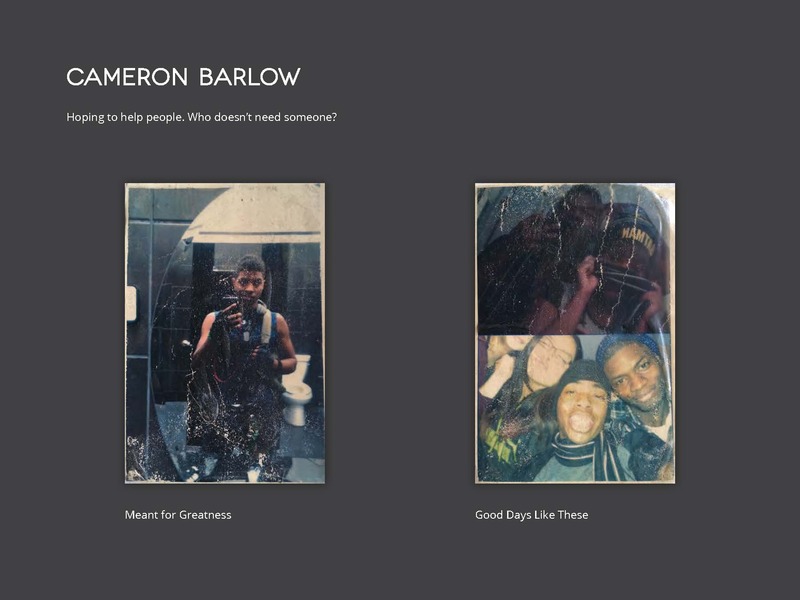 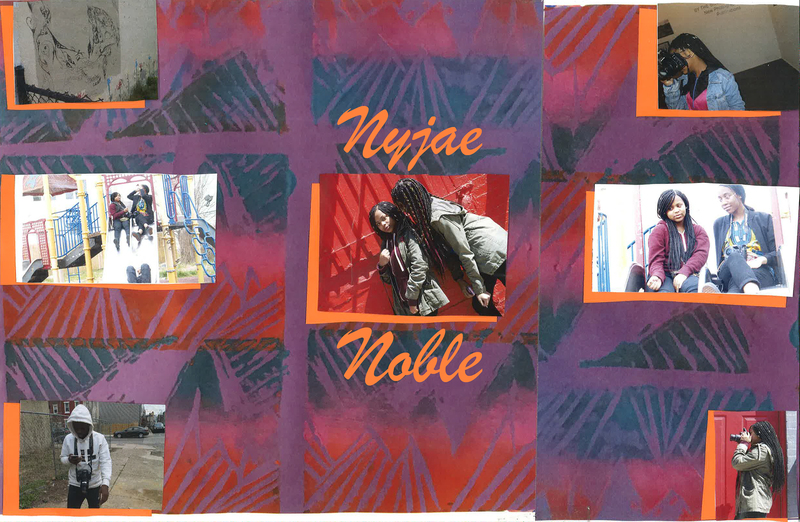 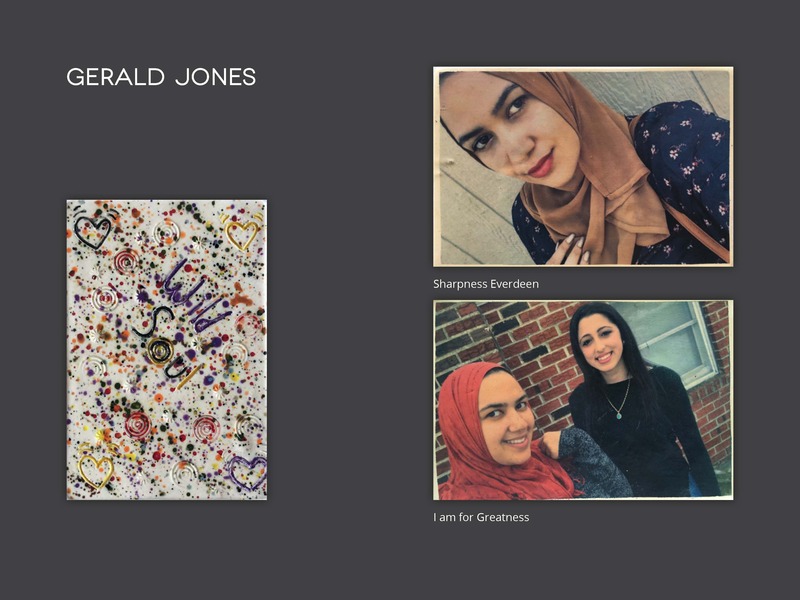 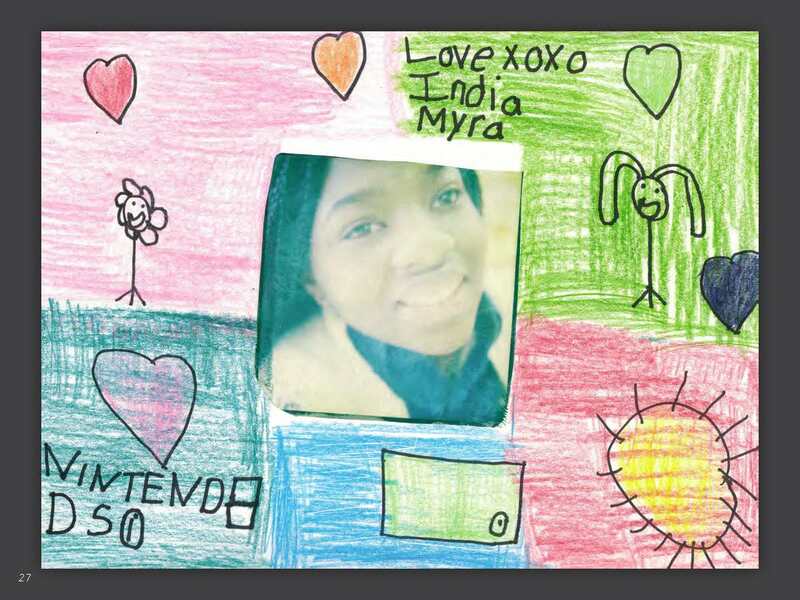 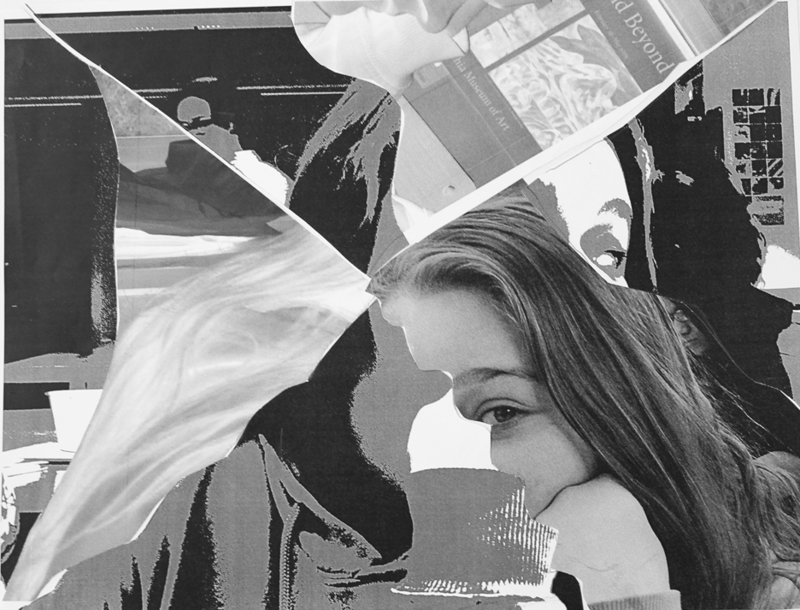 Students from two classes at Northeast High School collaborated to create a book that explores the historic genre of self-portraiture in relation to the contemporary phenomenon of the cell phone selfie. 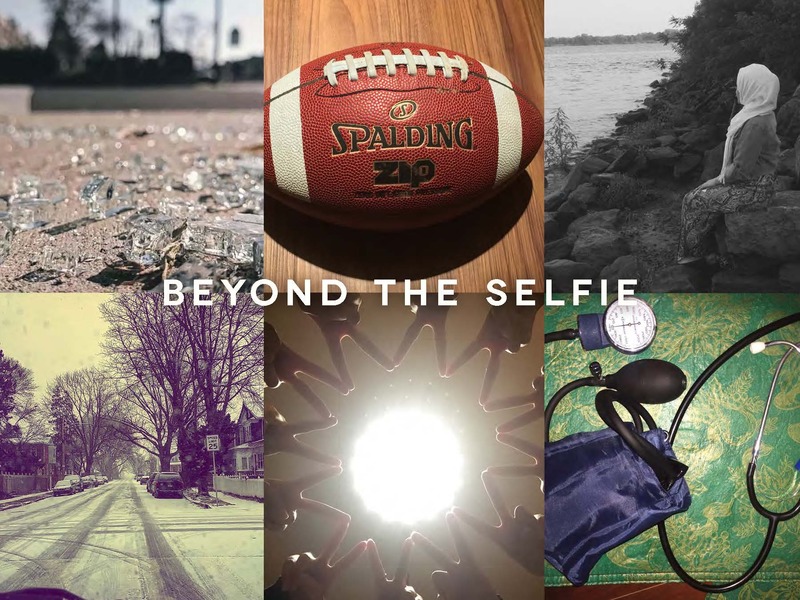 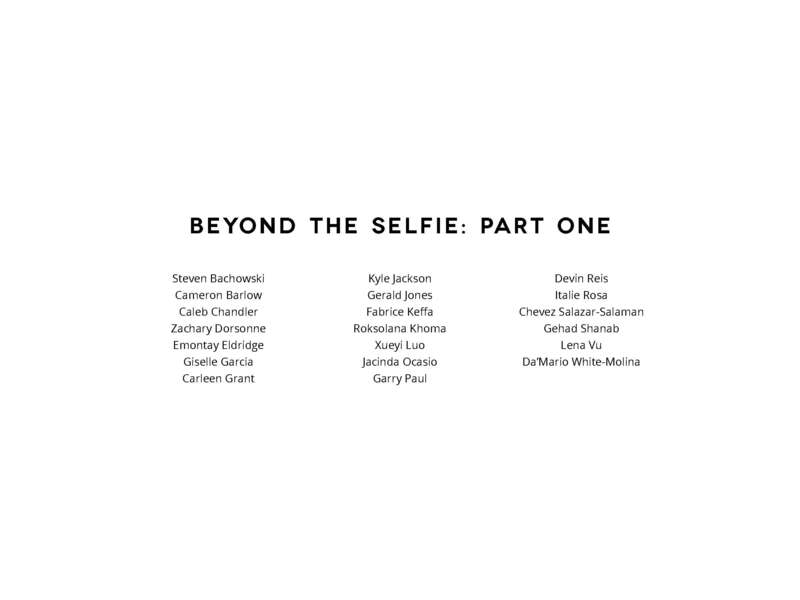 Beyond the Selfie is an intimate sharing of this personal exploration of self for which students pushed beyond the typical margins and habits of cell phone culture. 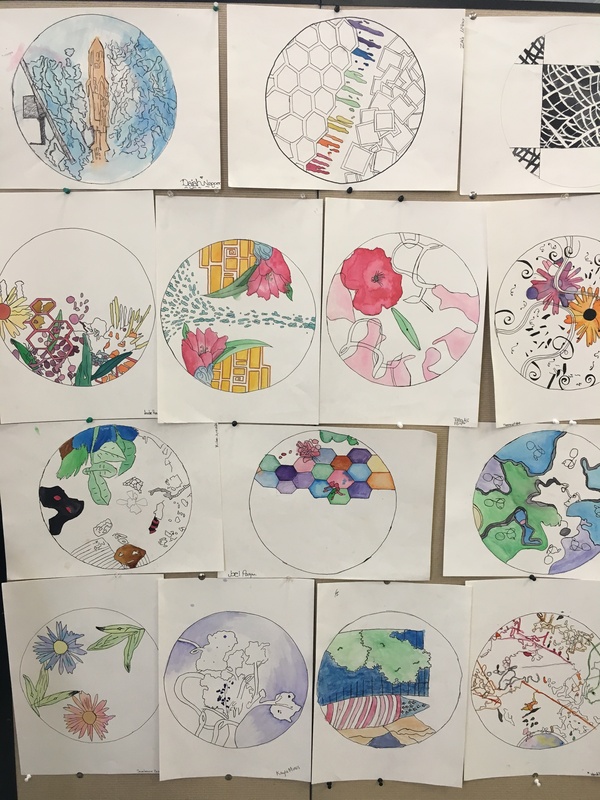 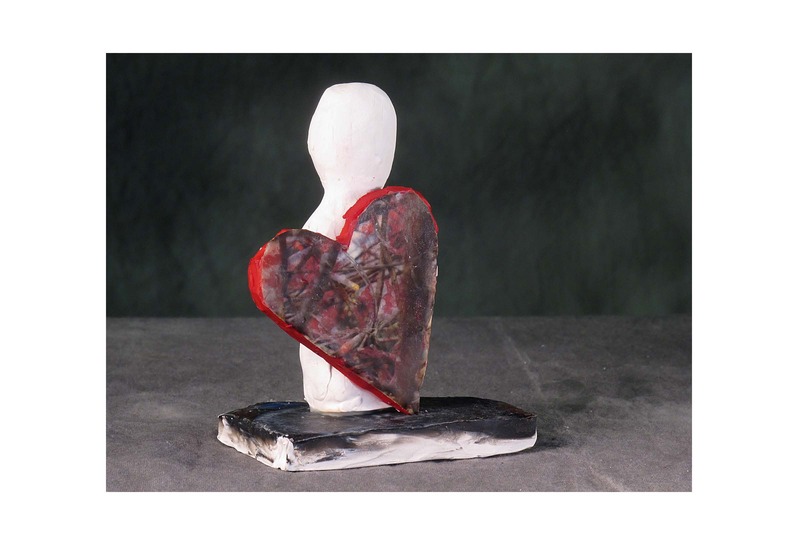 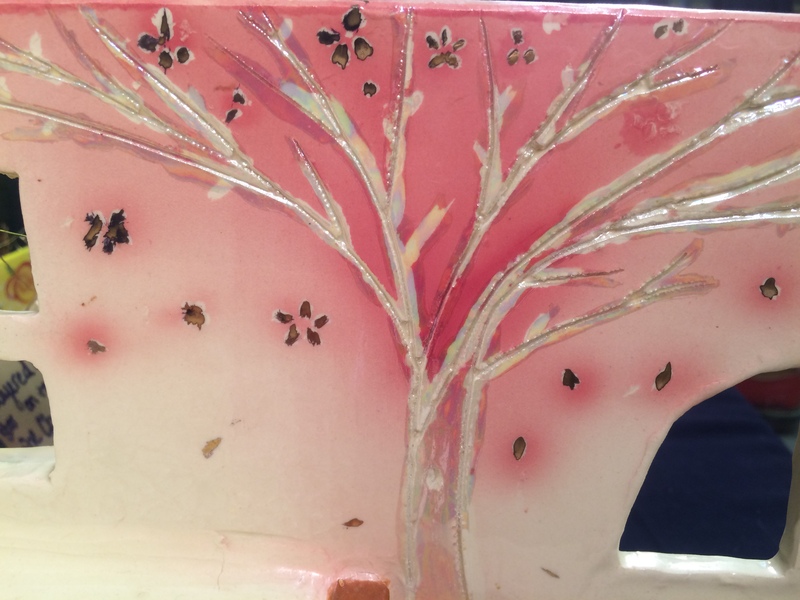 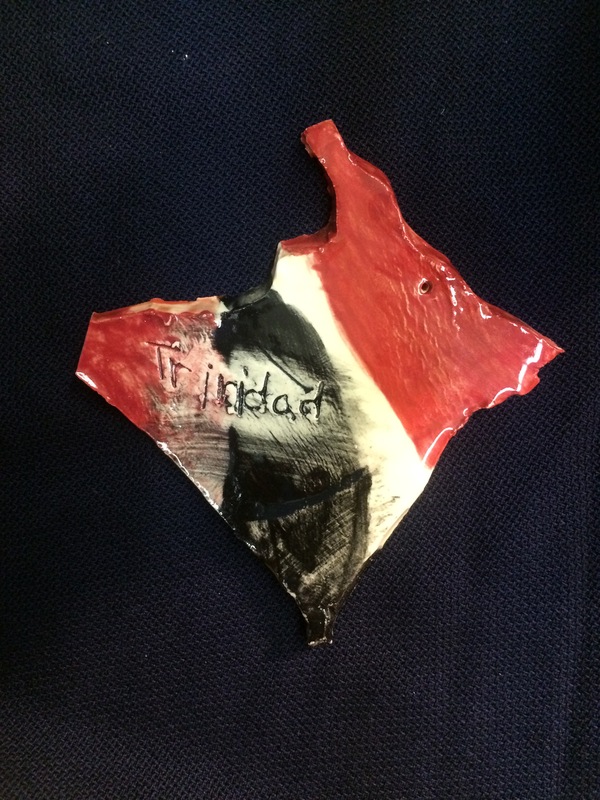 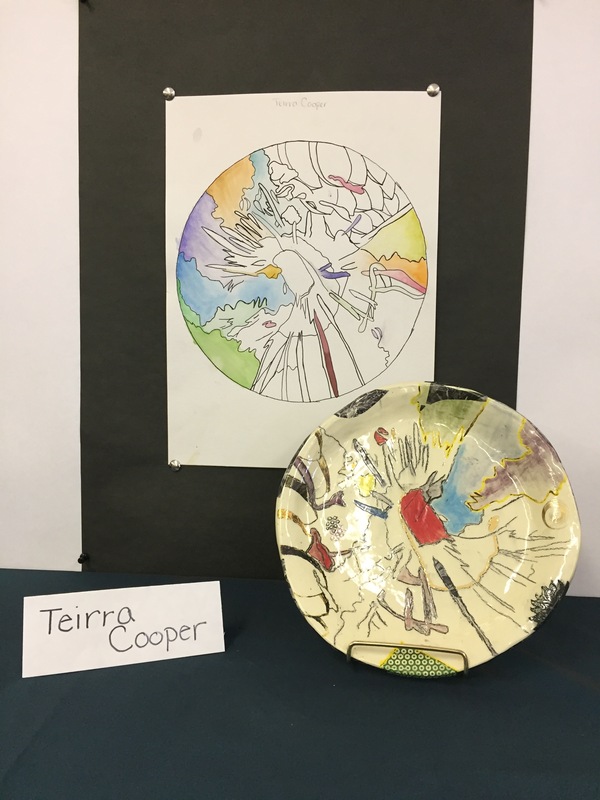 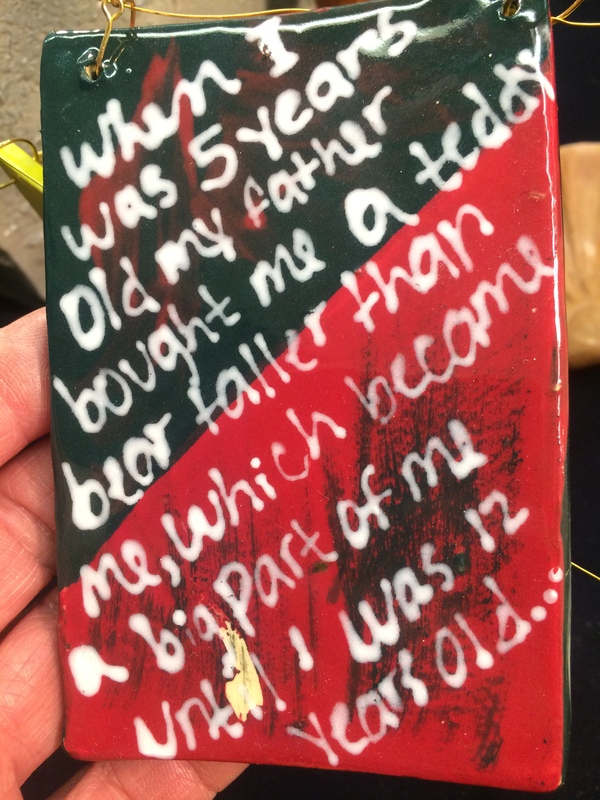 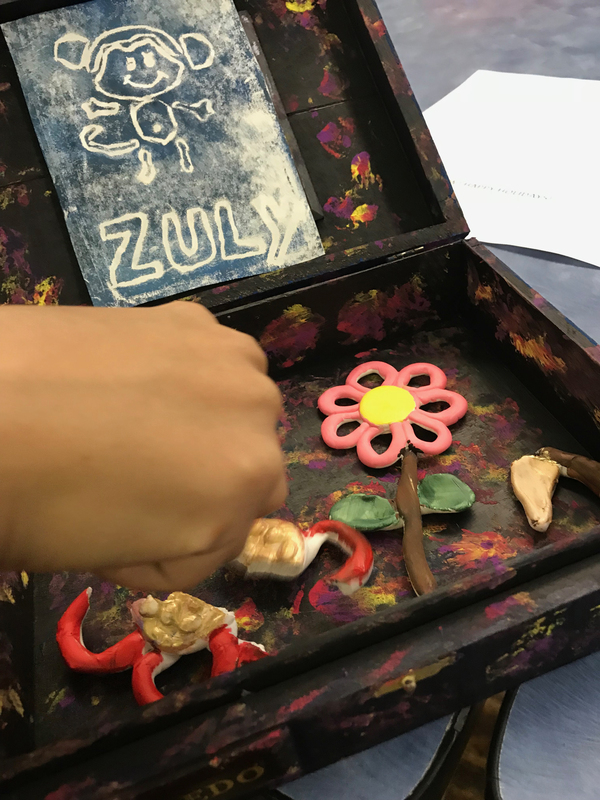 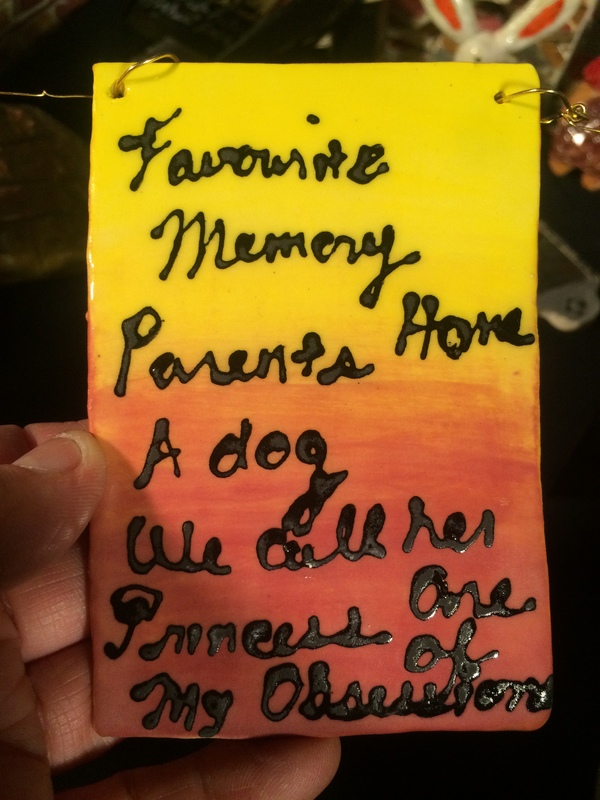 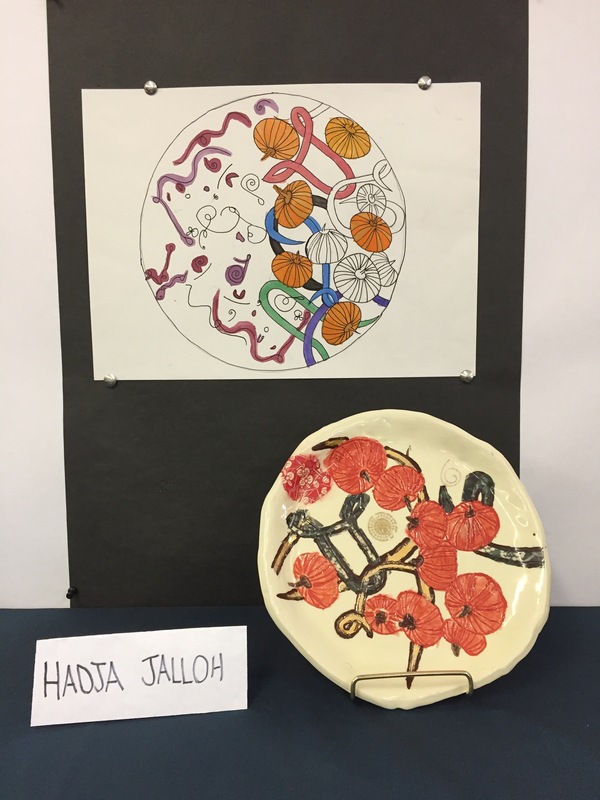 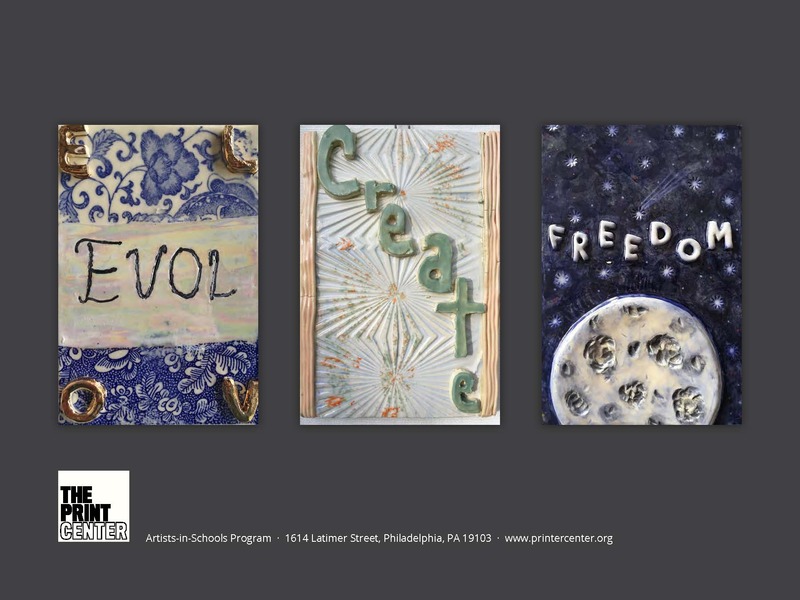 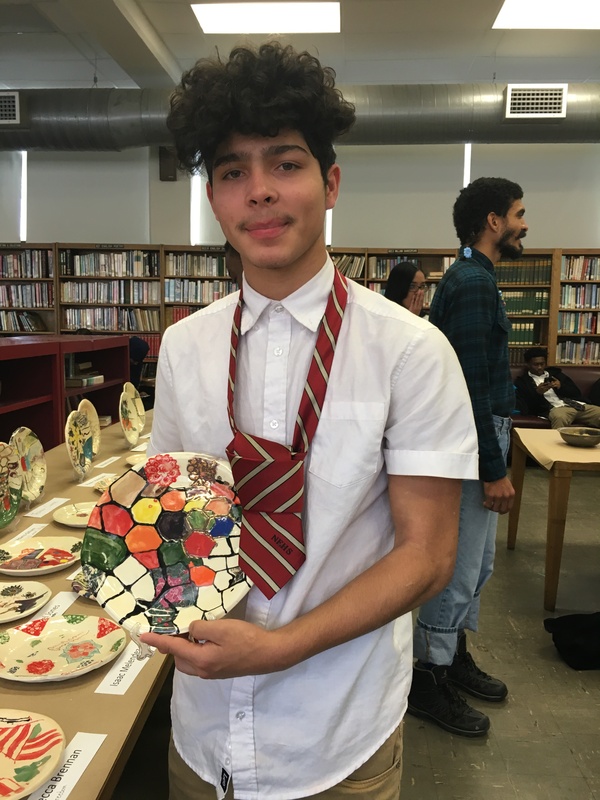 With this project, students transferred their photographs to ceramic tiles and also created low-relief tiles inspired by the thoughts and feelings that emerged from the process of self-discovery. 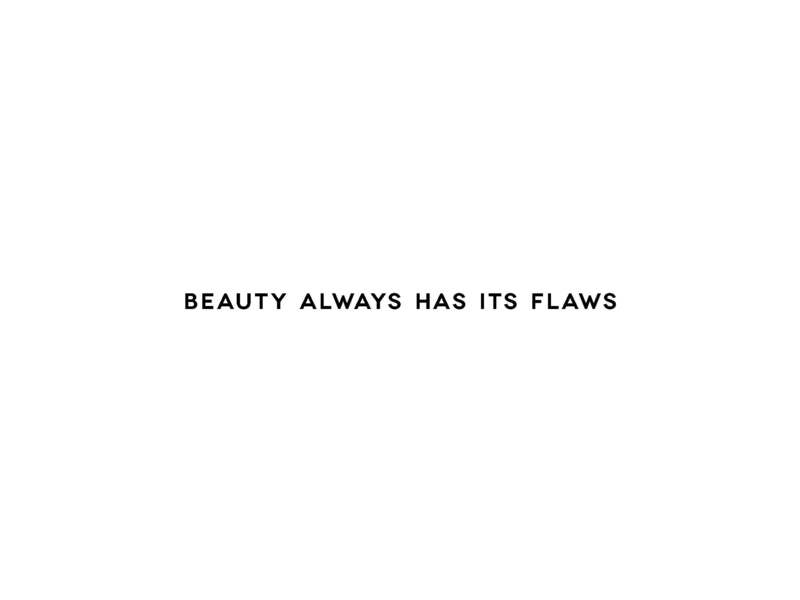 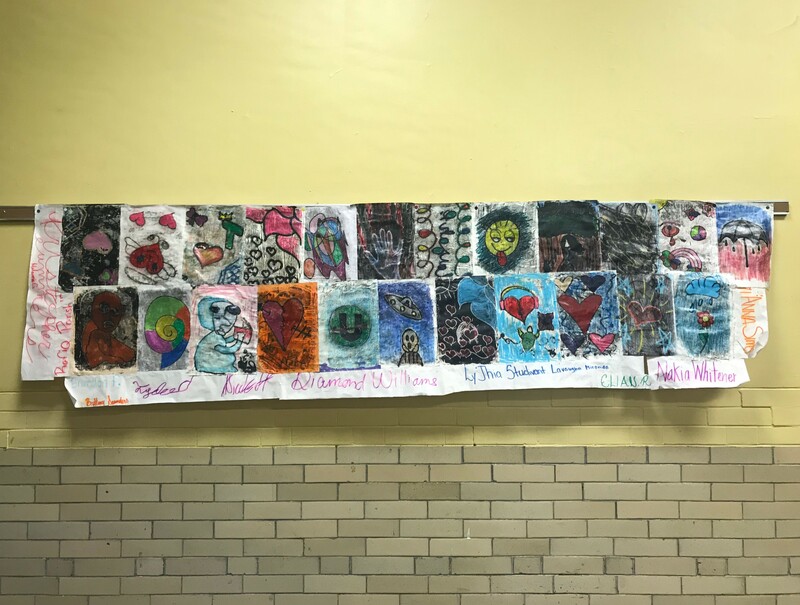 The students invite you to see them in all their complexity and learn with them about who they are, who they love, what they dream and what they see when they look in the mirror and listen to their hearts. 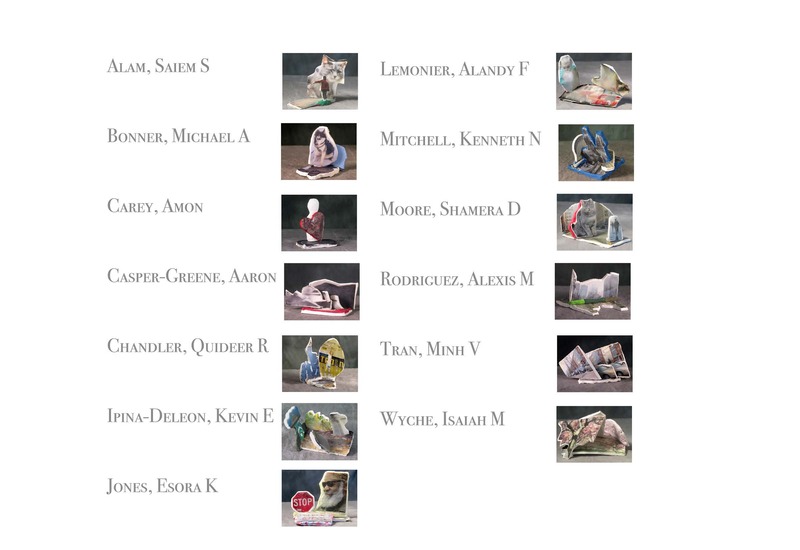 Student-artists in this gallery of work (Class 1) include Steven Bachowski, Cameron Barlow, Caleb Chandler, Zachary Dorsonne, Emontay Eldridge, Giselle Garcia, Carleen Grant, Kyle Jackson, Gerald Jones, Fabrice Keff, Roksolana Khoma, Xueyi Luo, Jacinda Ocasio, Garry Paul, Devin Reis, Italie Rosa, Chevez Salazar-Salaman, Gehad Shanab, Lena Vu and Da’Mario White-Molina. 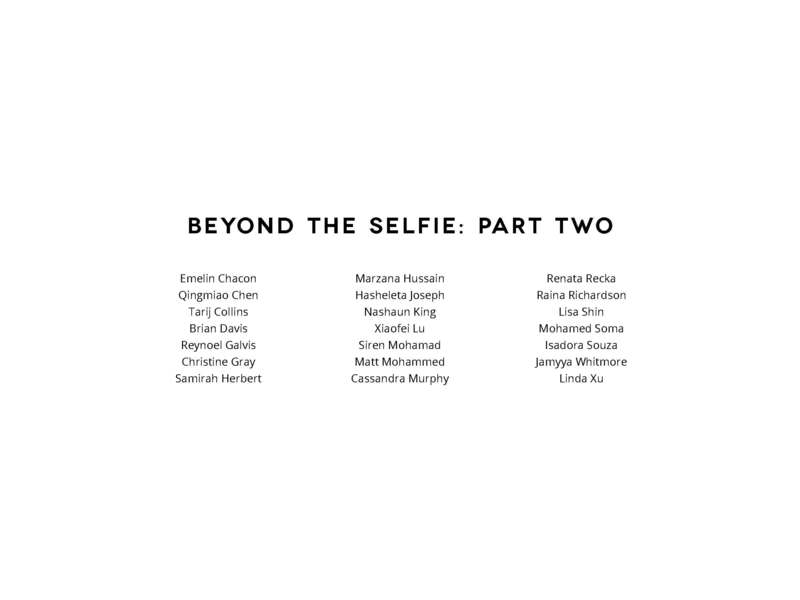 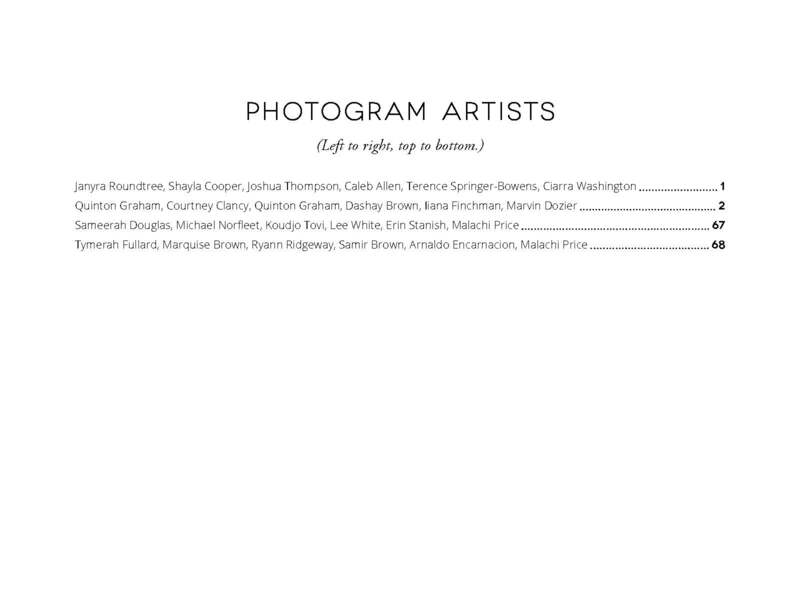 Student-artists in this gallery of work (Class 2) include Emelin Chacon, Qingmiao Chen, Tarij Collins, Brian Davis, Reynoel Galvis, Christine Gray, Samirah Herbert, Marzana Hussain, Hasheleta Joseph, Nashaun King, Xiaofei Lu, Siren Mohamad, Matt Mohammed, Cassandra Murphy, Renata Recka, Raina Richardson, Lisa Shin, Mohamed Soma, Isadora Souza, Jamyya Whitmore and Linda Xu. 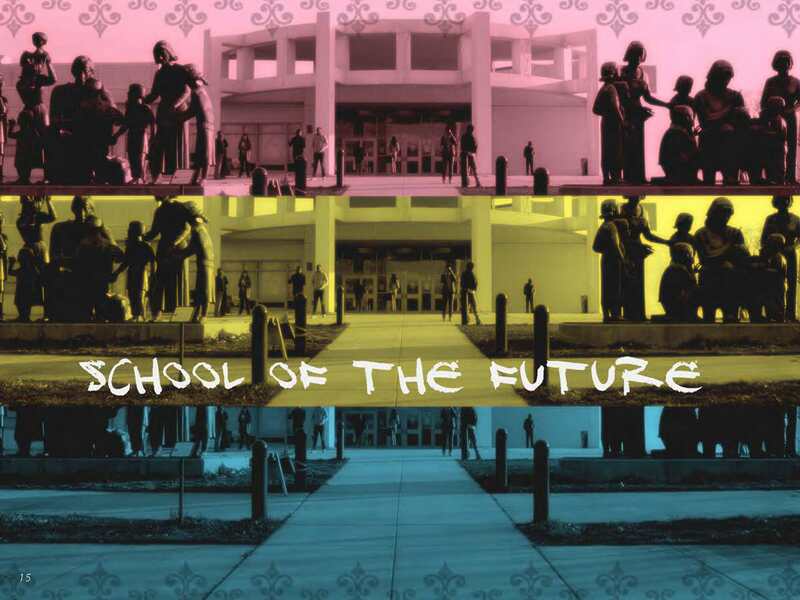 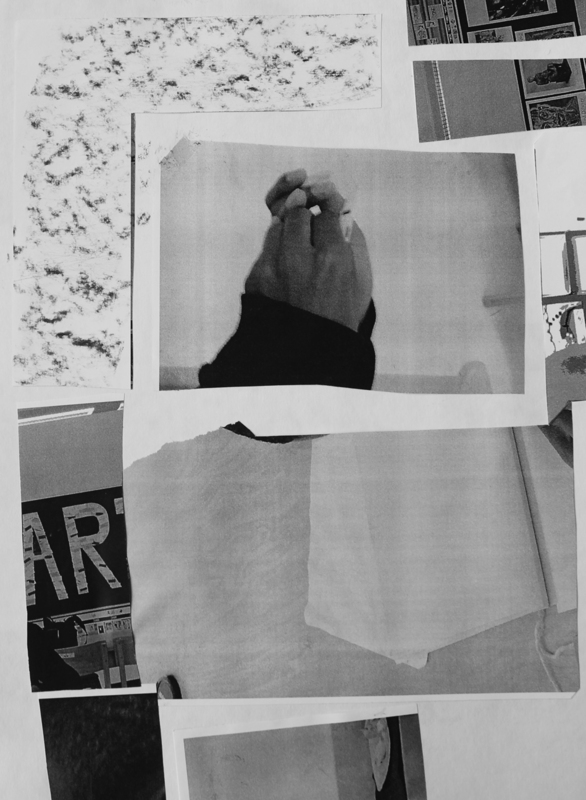 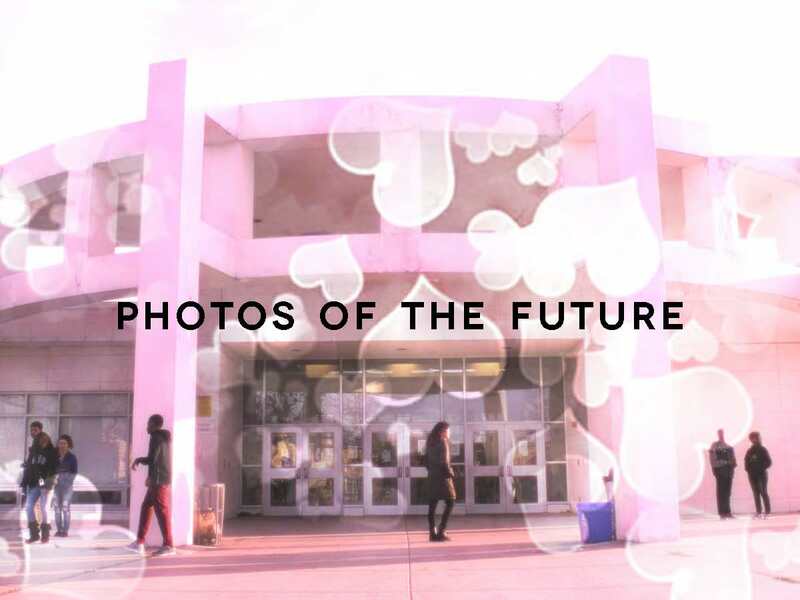 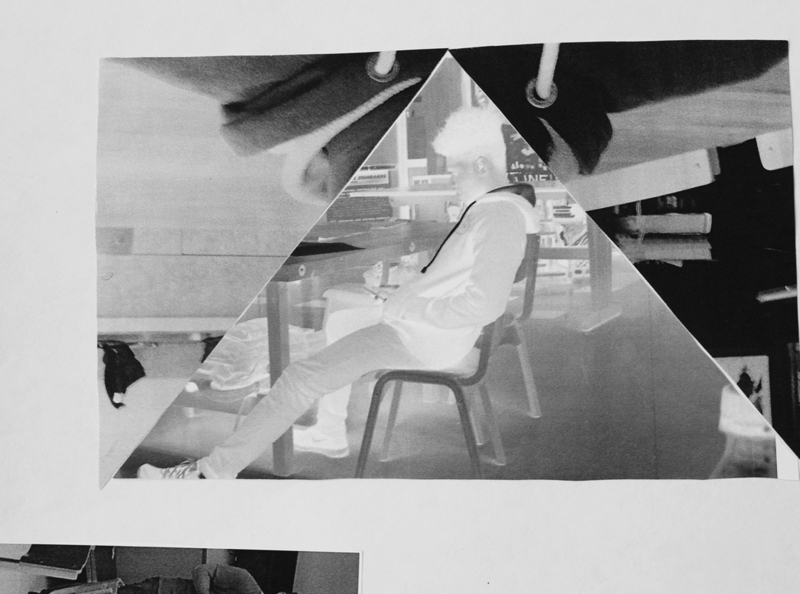 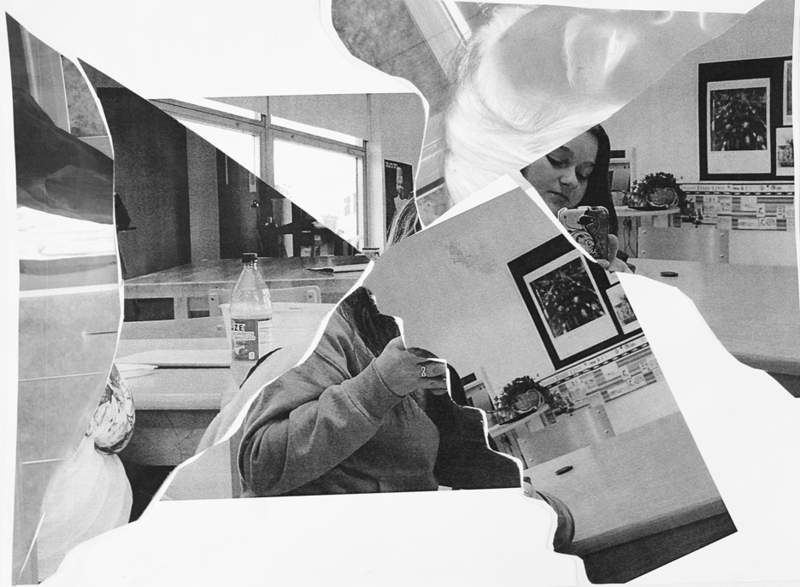 Two art classes at the School of the Future experimented with several forms of photography. 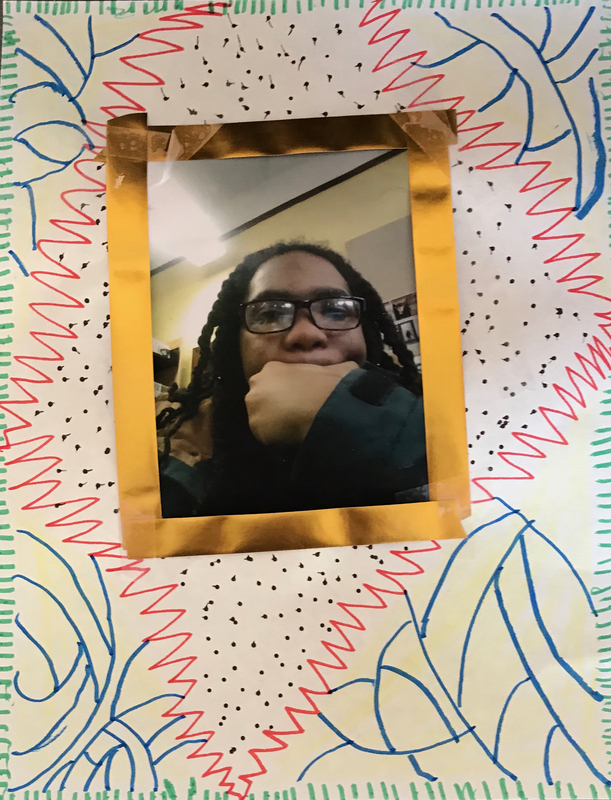 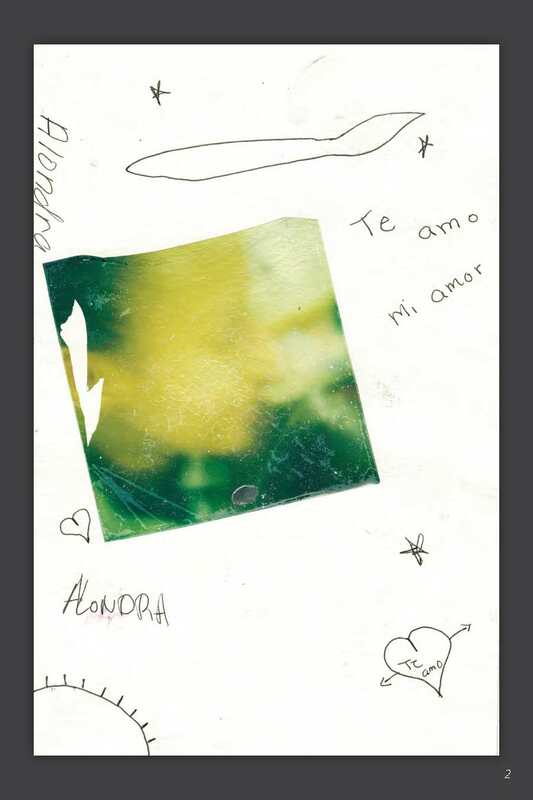 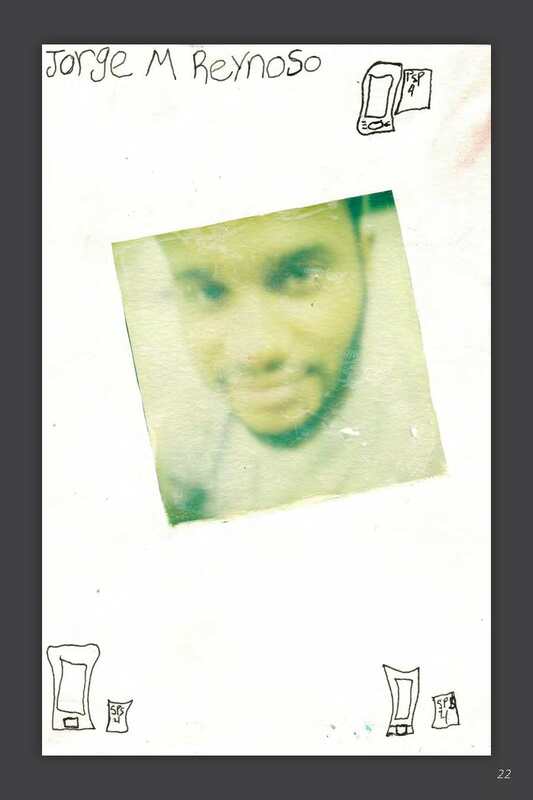 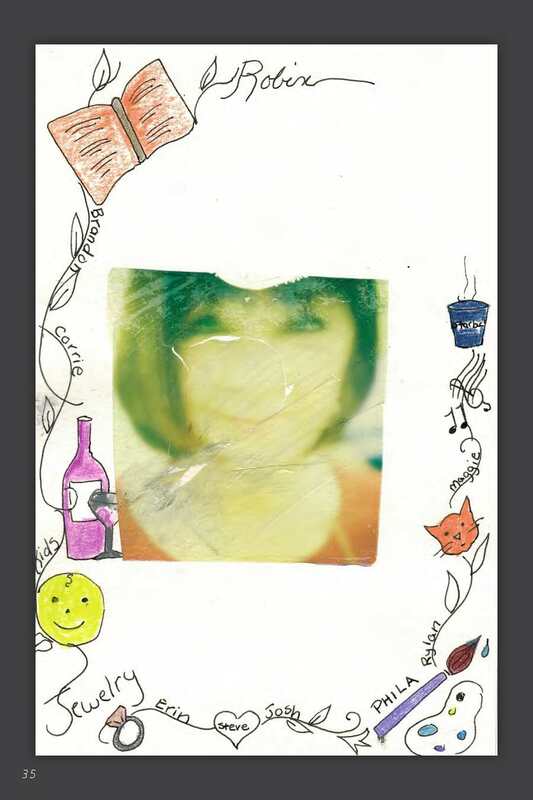 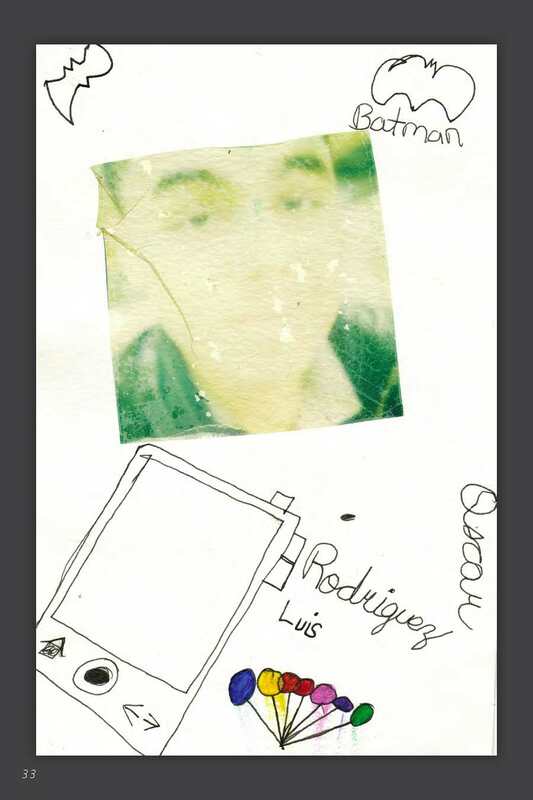 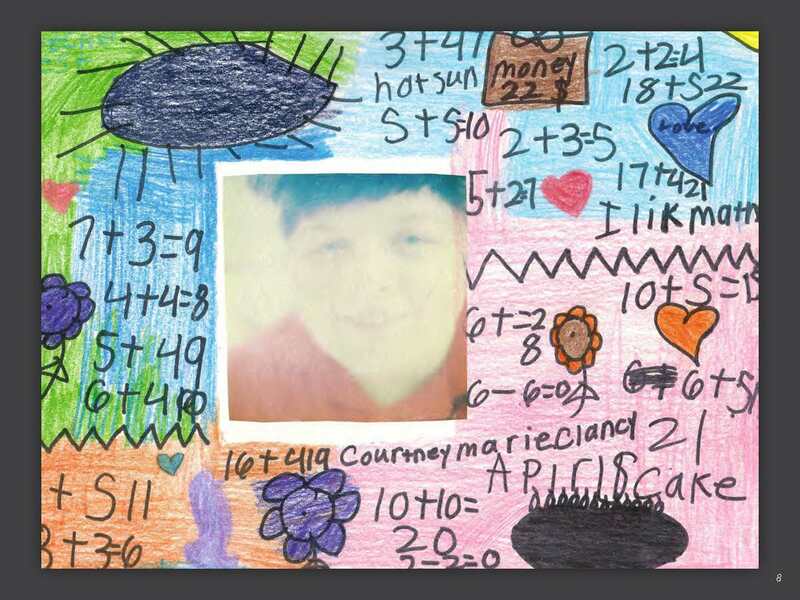 Students made self-portrait Polaroid transfers, to which they added hand drawn images of and texts about objects and hobbies important to them. 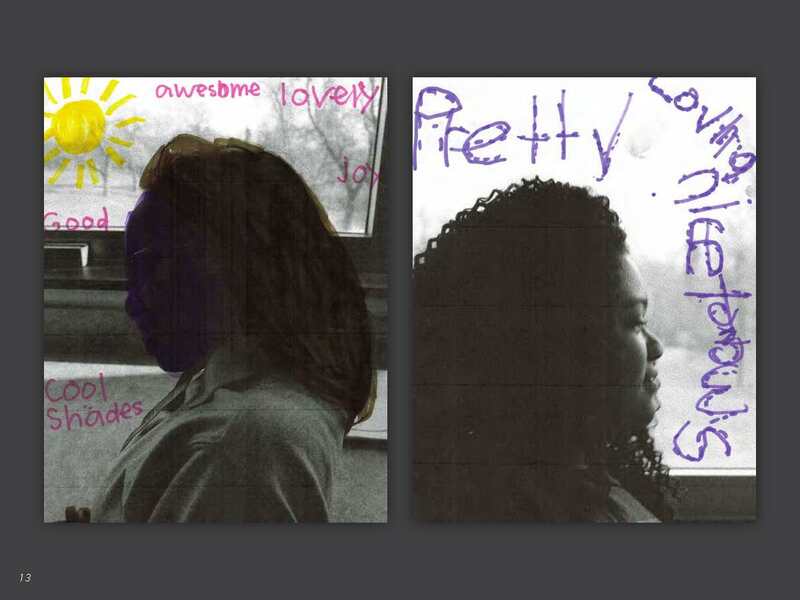 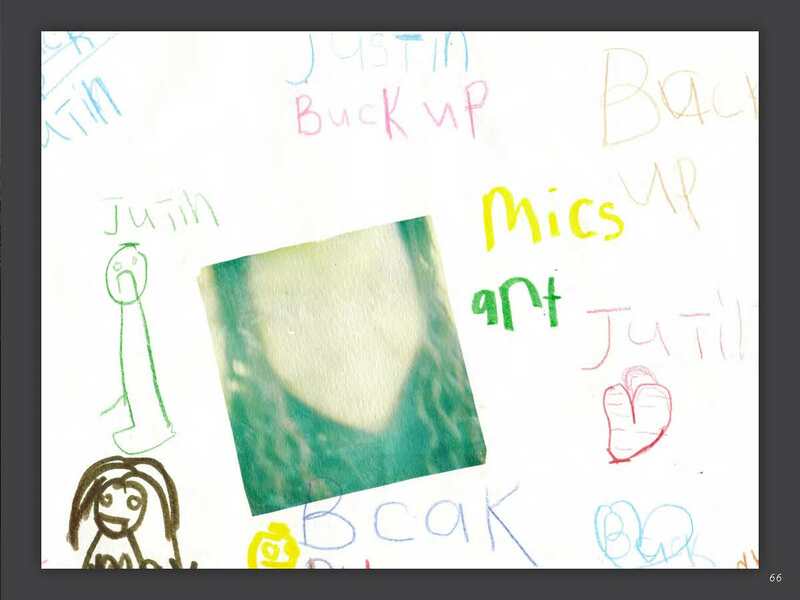 Additionally, they took silhouetted portraits of their classmates and wrote descriptive texts around them. 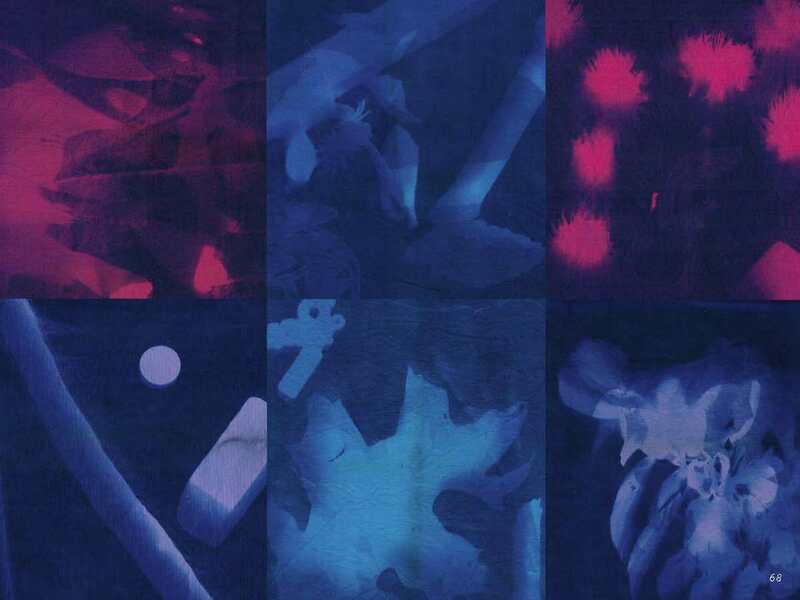 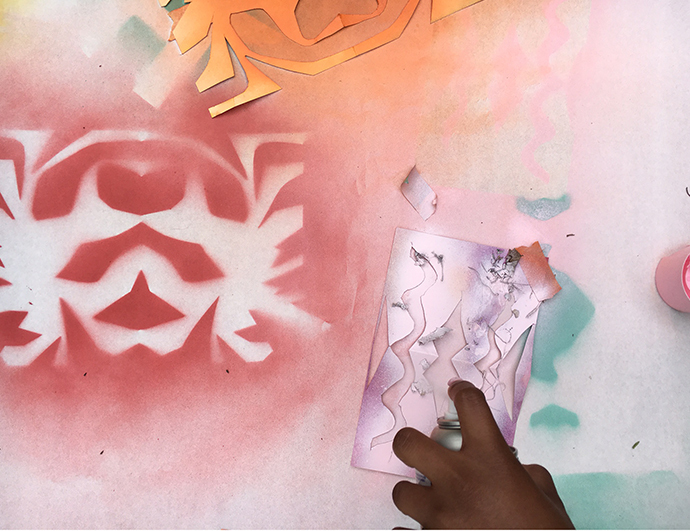 The artists also created photograms using found objects and natural materials that they collected on trips outside of the school. 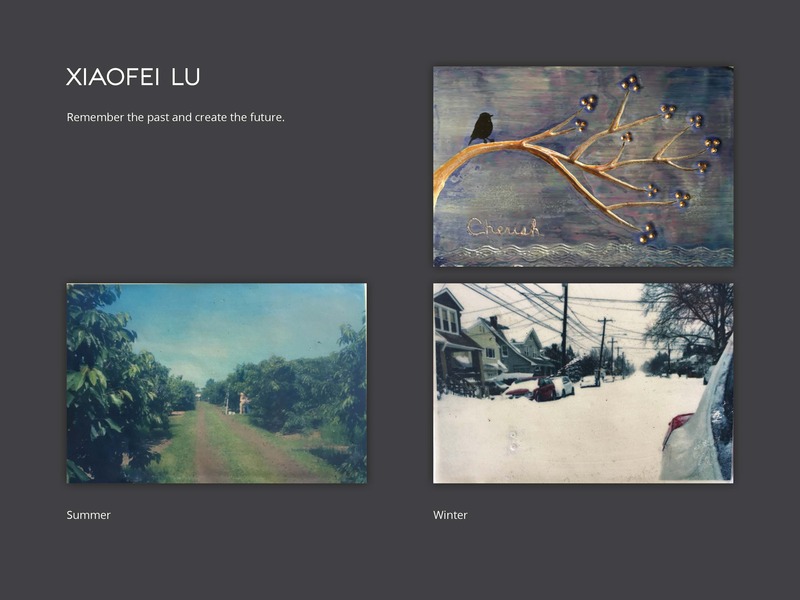 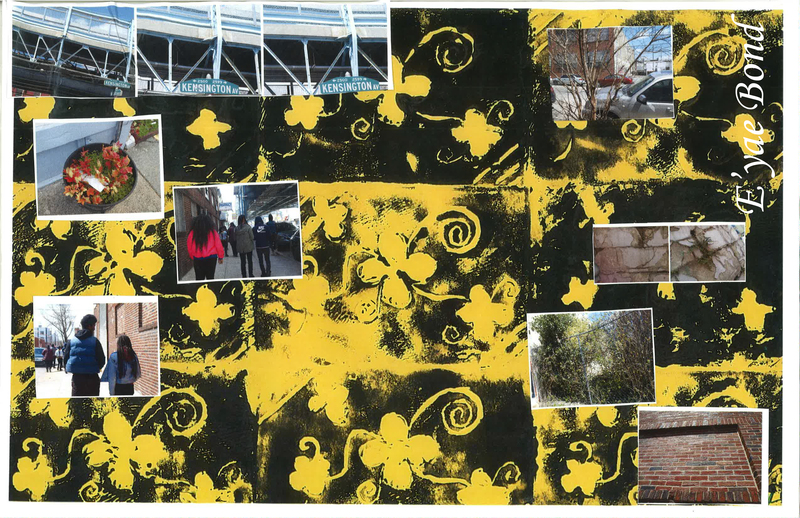 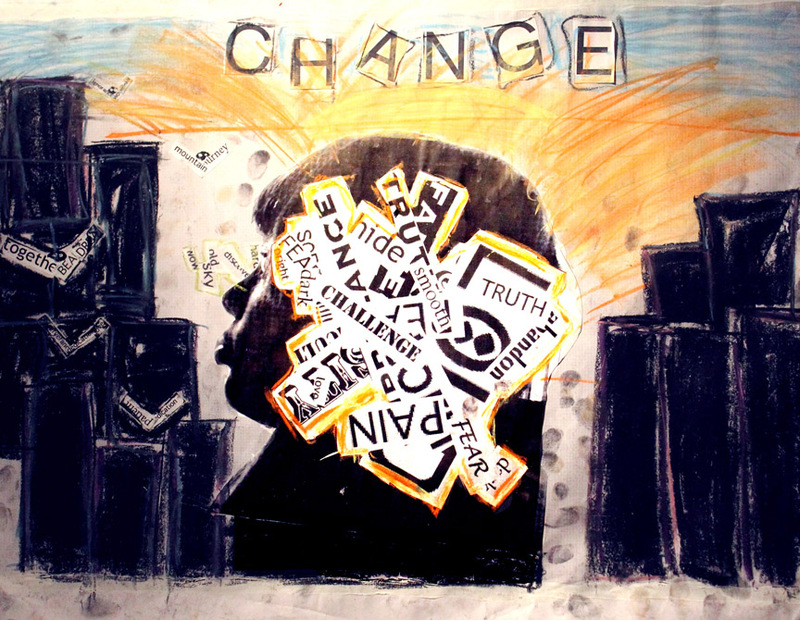 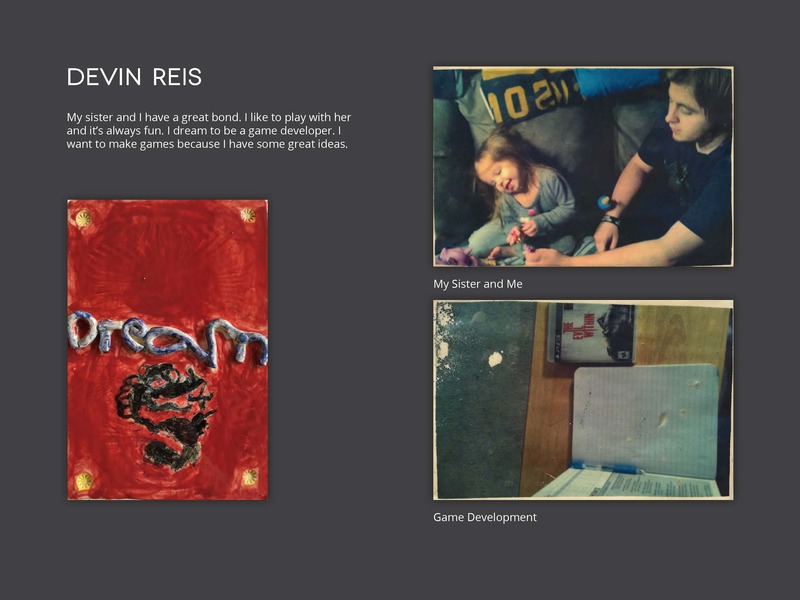 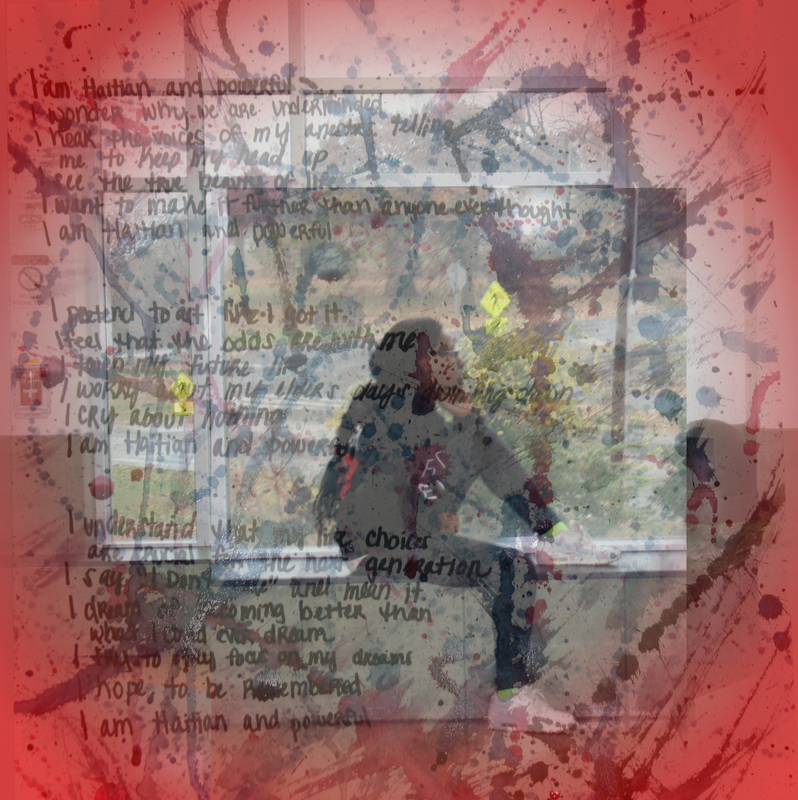 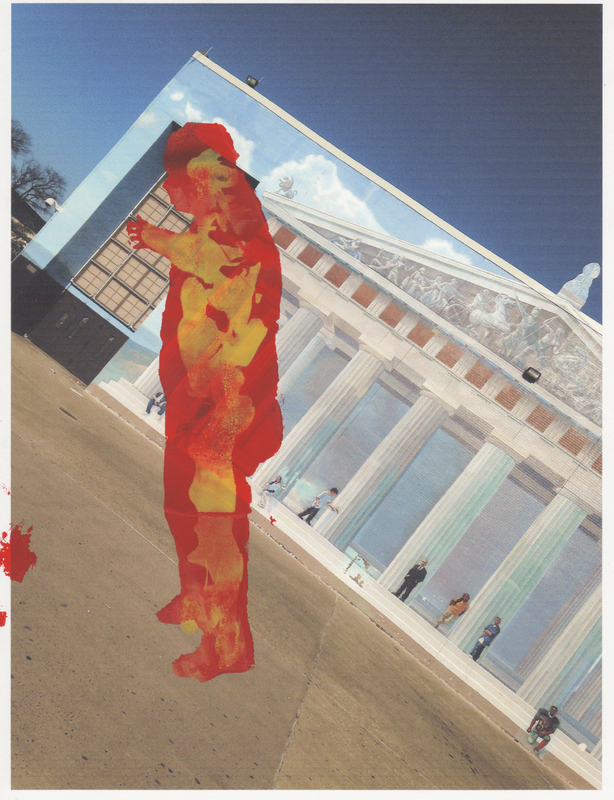 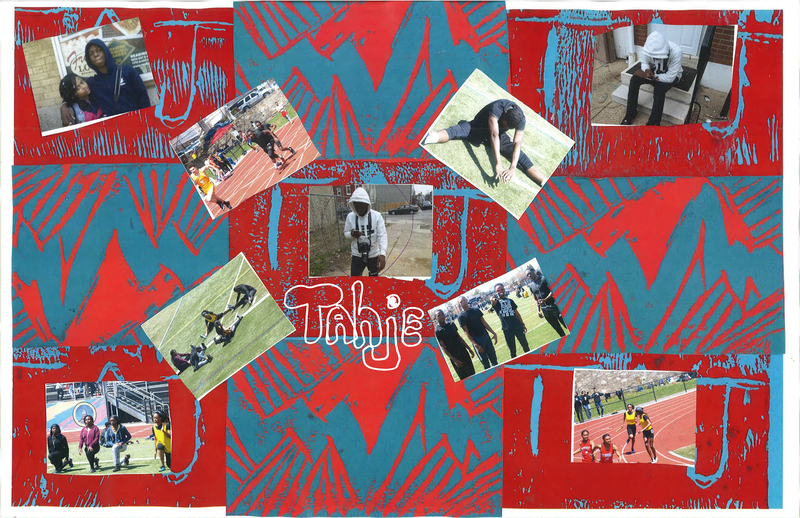 Finally, each student took digital photographs, which were then manipulated using computer software, and then combined and printed on canvas for a school mural, as well as for inclusion in this collaborative book. 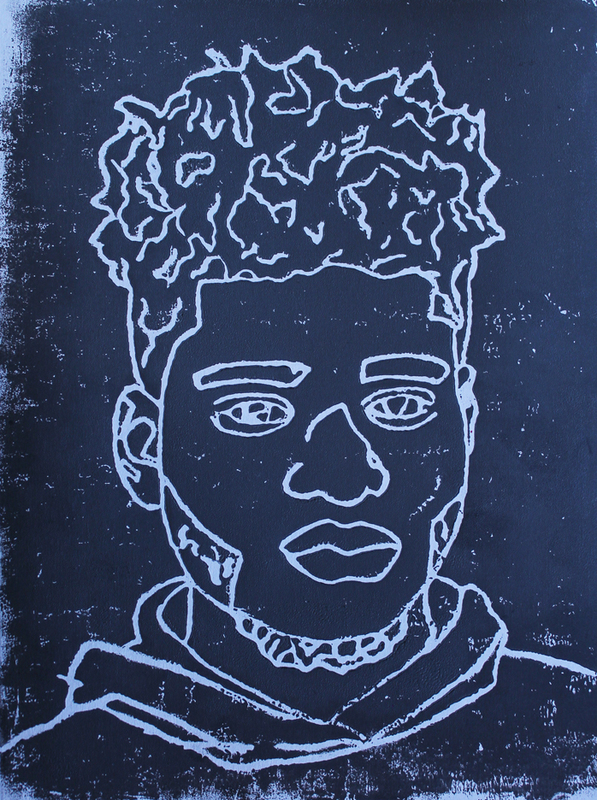 Student-artists in this gallery of work include Caleb Allen, Naci Ames, Dashay Brown, Marquise Brown, Samir Brown, Courtney Clancy, Shayla Cooper, Sameerah Douglas, Marvin Dozier, Arnaldo Encarnacion, Iiana Finchman, India Floyd, Tymerah Fullard, India George, Quinton Graham, Jamal Hayward, Shonye Johnson, Sabrina Mandly, Michael Norflee, Tre’ Patillo, Malachi Price, Ryann Ridgeway, Janyra Roundtree, Terence Springer-Bowens, Erin Stanish, Ketiwe Teixeira, Joshua Thompson, Koudjo Tovi, Ciarra Washington, Lee White, Elijah Williams and Fatima Williams. 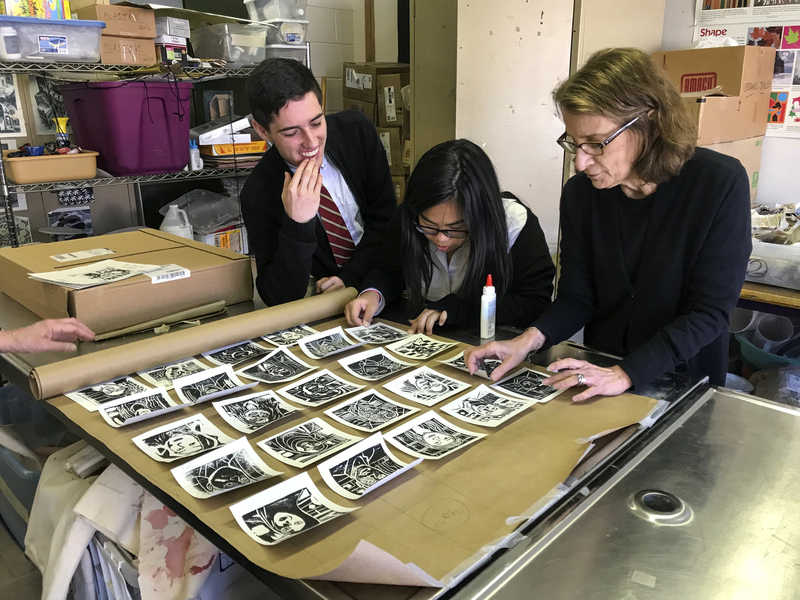 Two classes of ninth and tenth grade students at The U School explored the ways artists create conceptual projects that utilize photography. 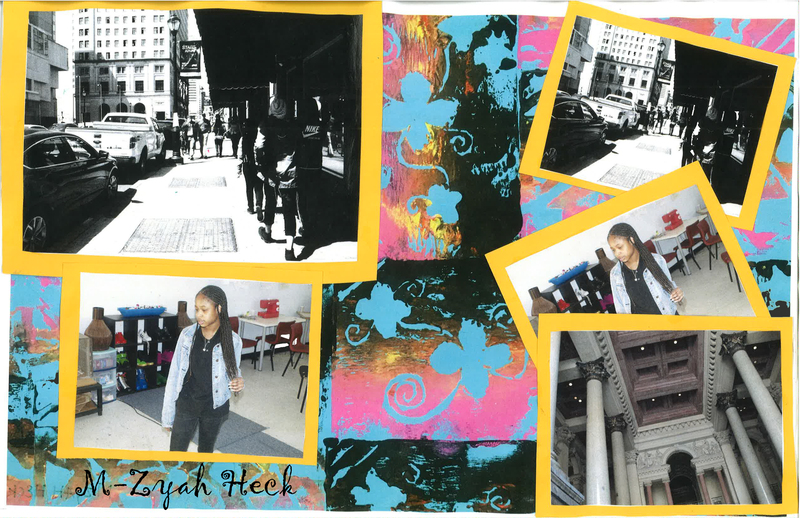 Using the neighborhood around their school as the subject, they took pictures of places and people they found intriguing. 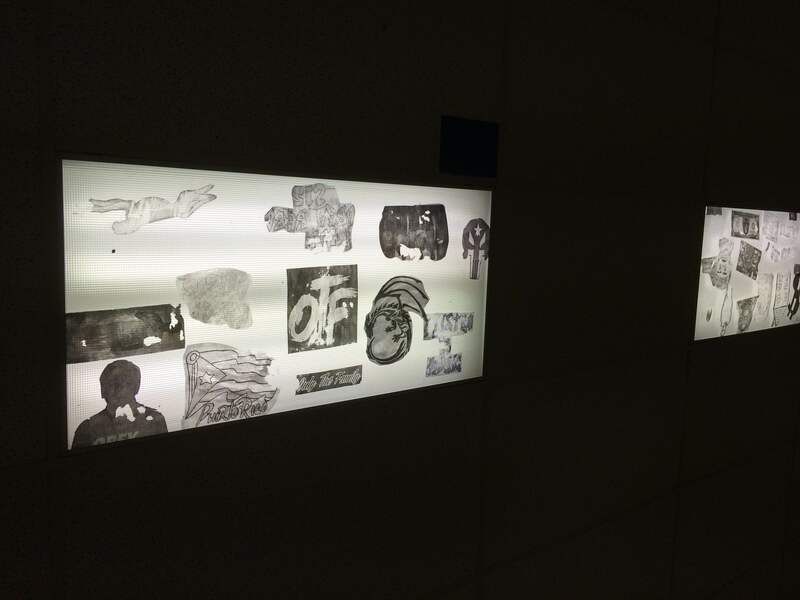 Students examined these images to find direction for their projects as well as particular subjects for further investigation. 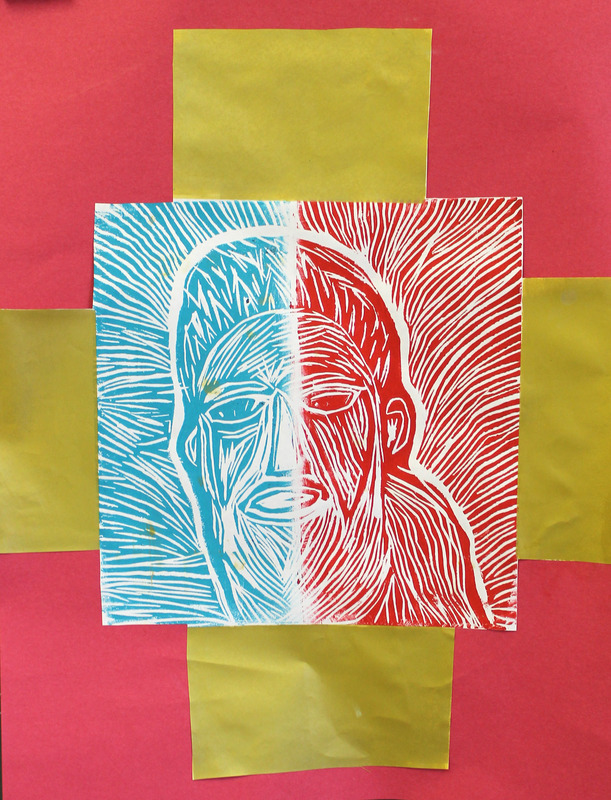 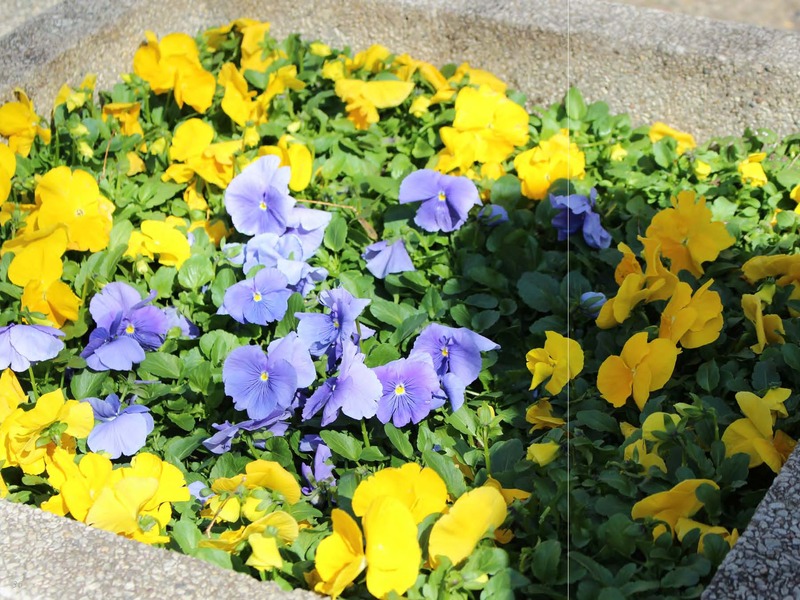 Two themes emerged: “Colors of Our Community” and “Beauty Always Has Its Flaws.” Students made additional photographs exploring those themes; one was selected as the basis for a three-color reduction block print and the other to remain a photograph, both presented here. 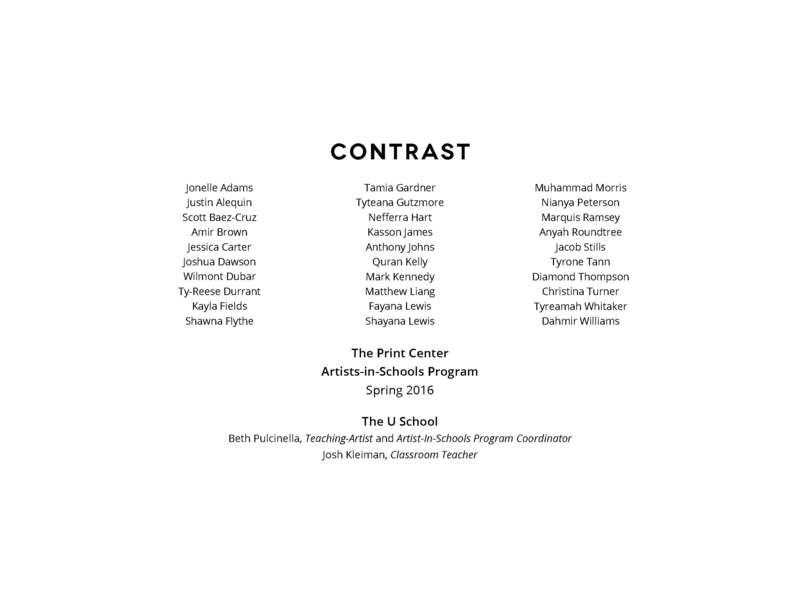 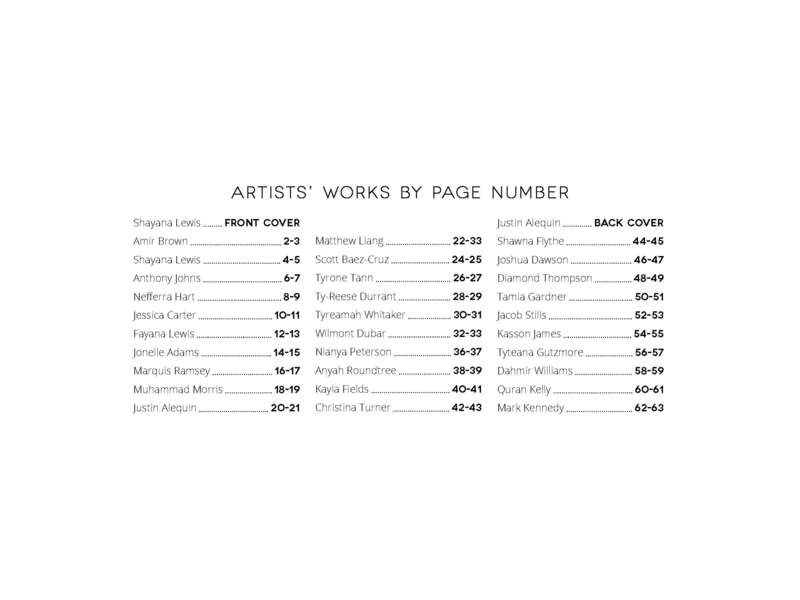 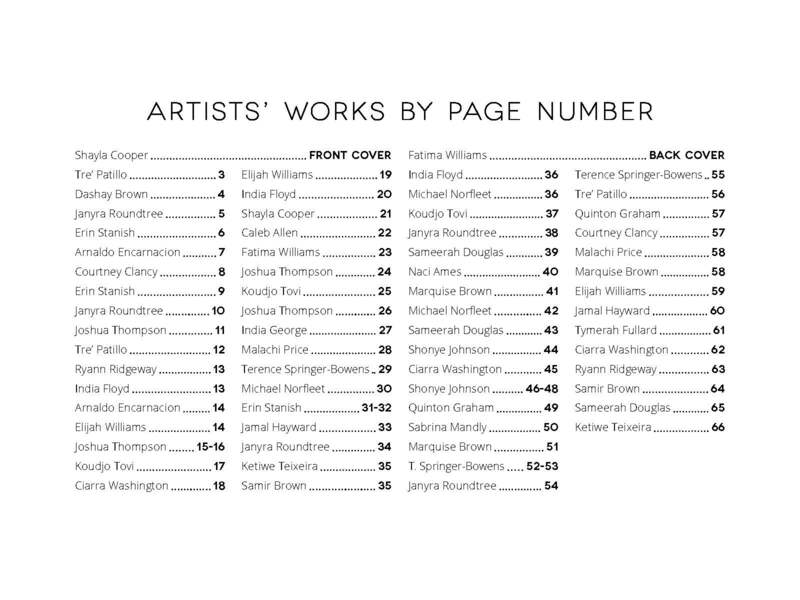 Student-artists in this gallery of work include Jonelle Adams, Justin Alequin, Scott Baez-Cruz, Amir Brown, Jessica Carter, Joshua Dawson, Wilmont Dubar, Ty-Reese Durrant, Kayla Fields, Shawna Flythe, Tamia Gardner, Tyteana Gutzmore, Nefferra Har, Kasson James, Anthony Johns, Quran Kelly, Mark Kennedy, Matthew Liang, Fayana Lewis, Shayana Lewis, Muhammad Morris, Nianya Peterson, Marquis Ramsey, Anyah Roundtree, Jacob Stills, Tyrone Tann, Diamond Thompson, Christina Turner, Tyreamah Whitaker and Dahmir Williams. 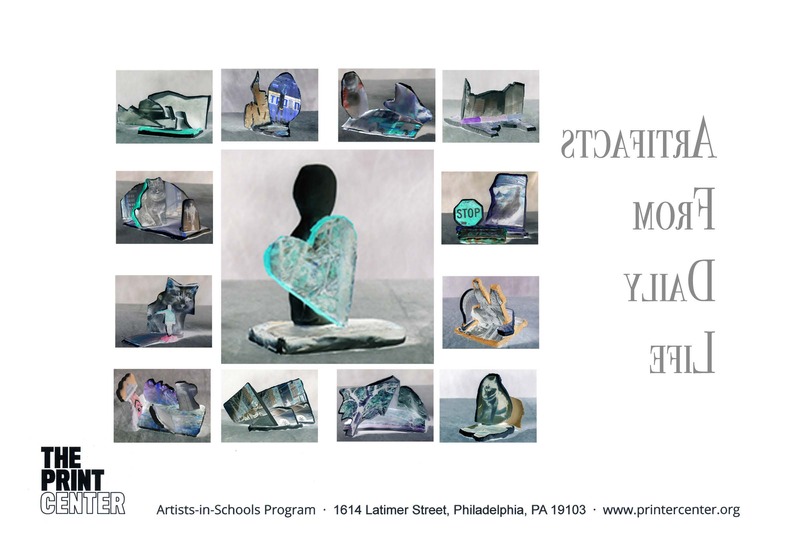 Recollection: Troubling These Waters responded to Recollection at The Print Center and Push/Pull: Wounds of History by Philadelphia art collective Amber Art & Design at Art Sanctuary, both mounted as part of The Print Center’s Centennial celebration: The Print Center 100. 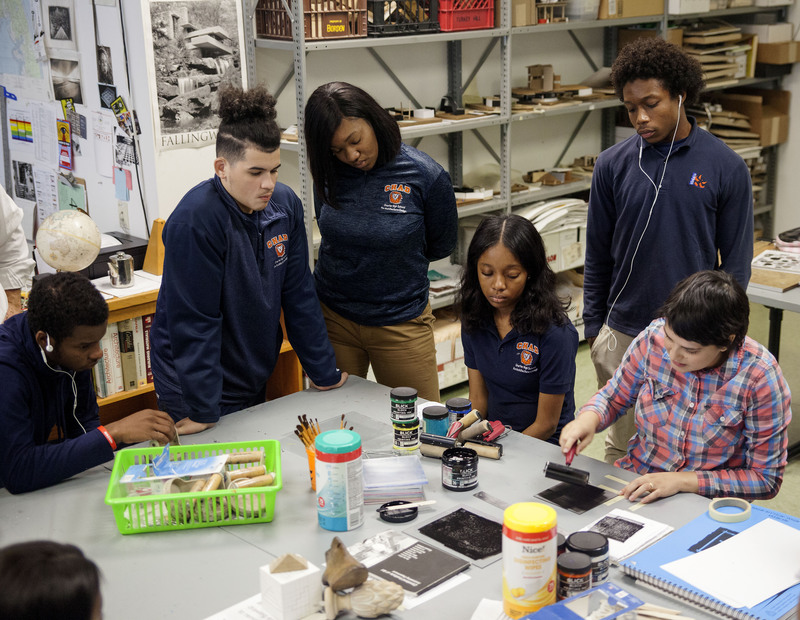 The curriculum was anchored in contemporary art that responds, interrogates, listens to, commemorates, challenges, collaborates with and embraces that which is historical. 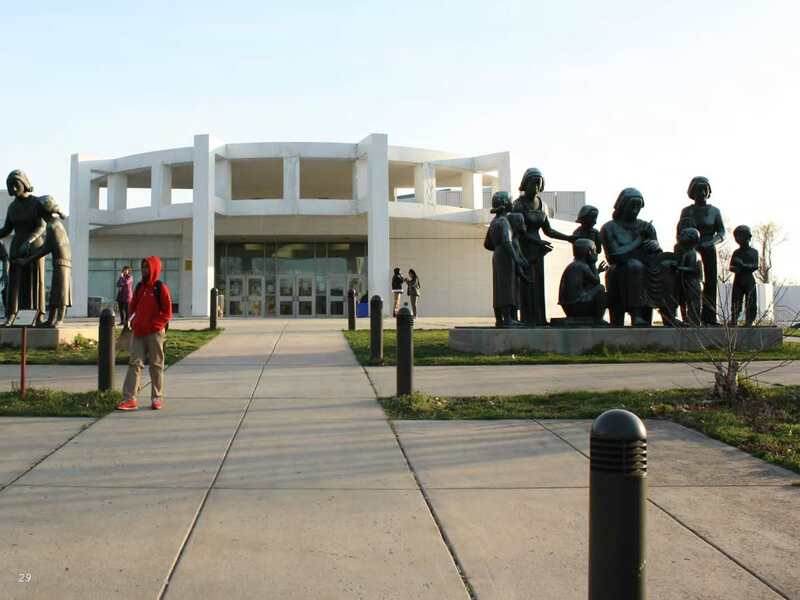 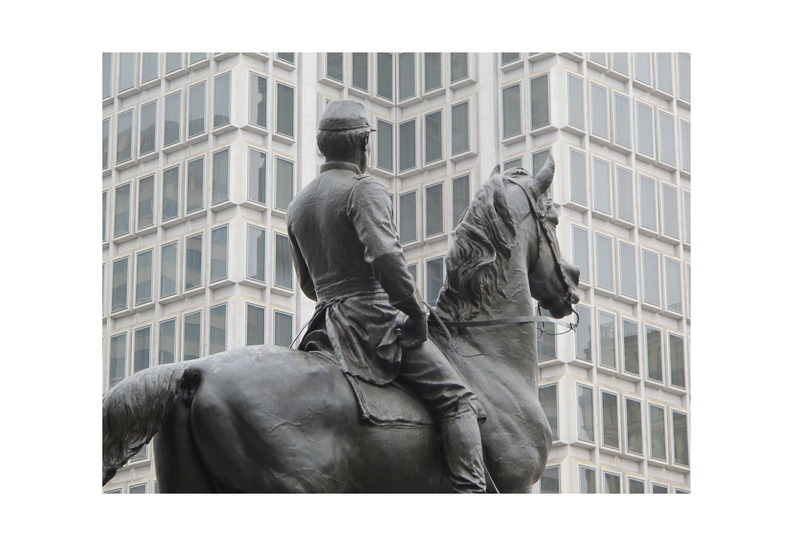 The historical here could be personal, place-based, political, social, cultural, irreverent, introspective or imaginary. 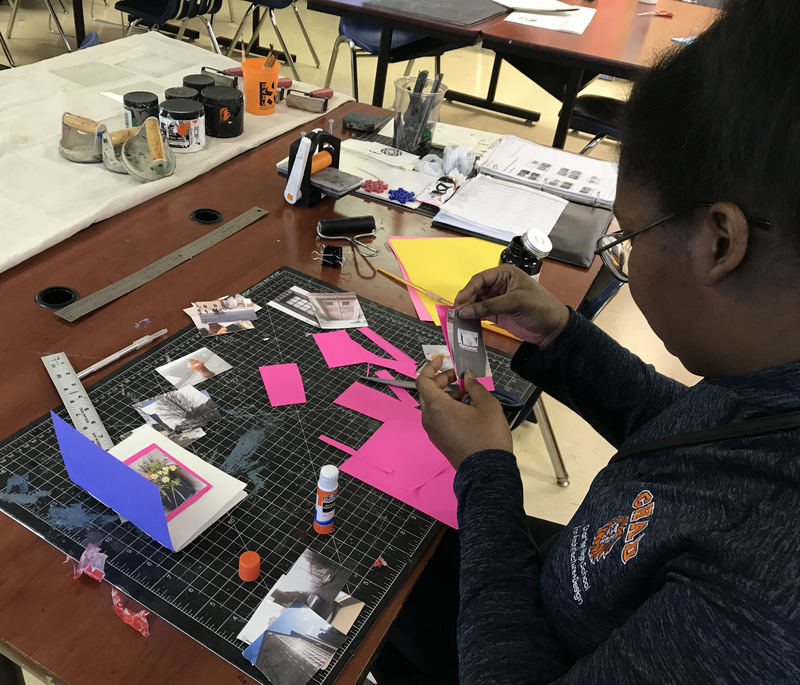 Classes were asked to create projects that explored, honored, troubled and/or documented that which is historical in deeply personal ways through the investigation of print and photographic mediums and multimedia installations. 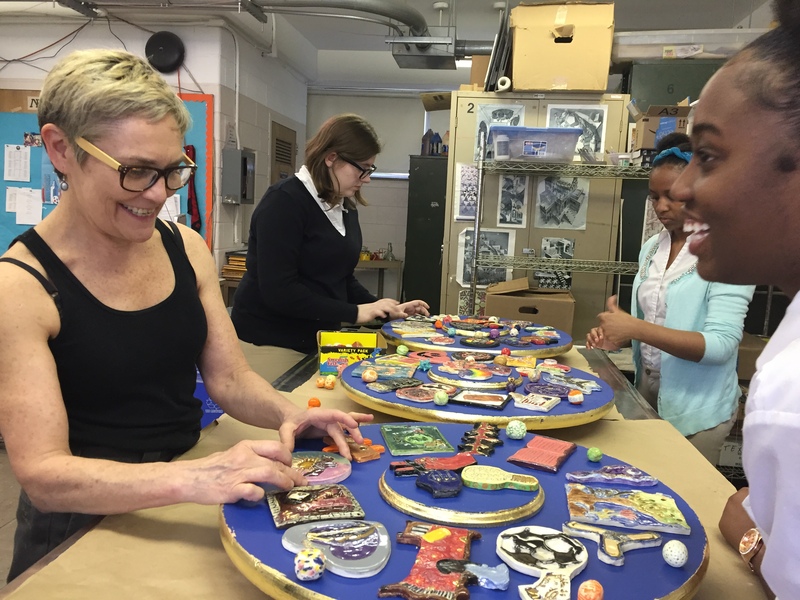 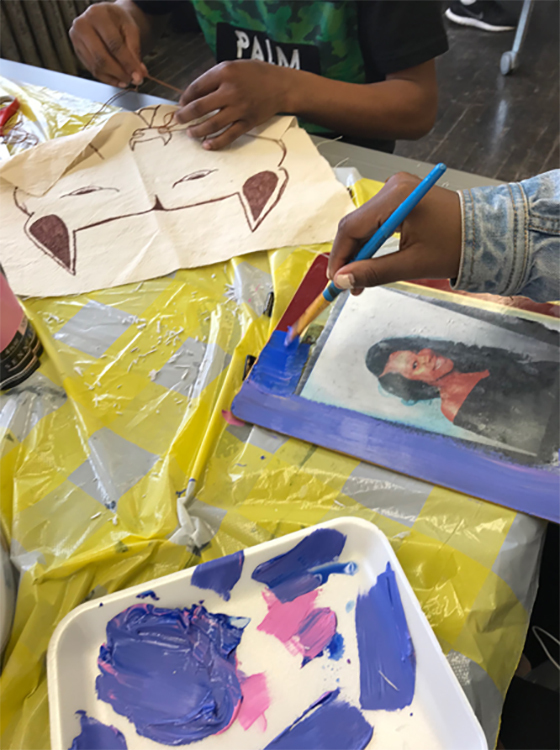 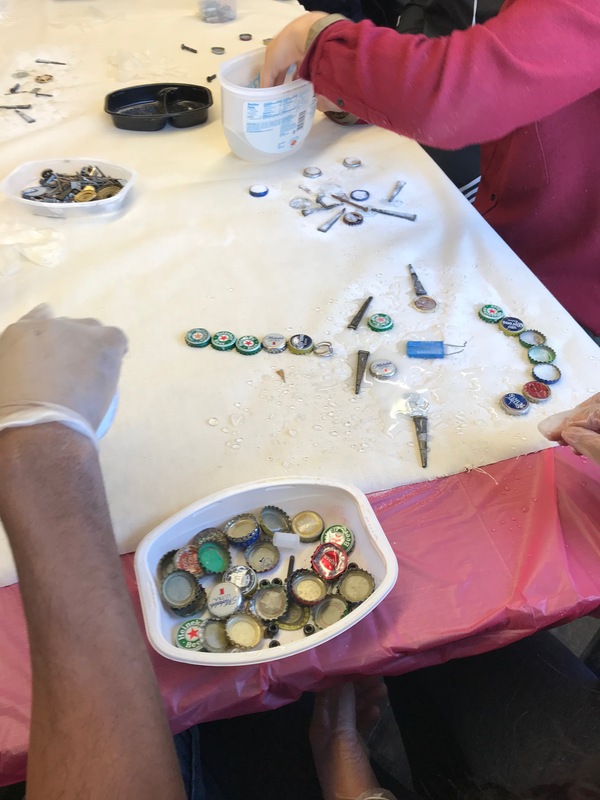 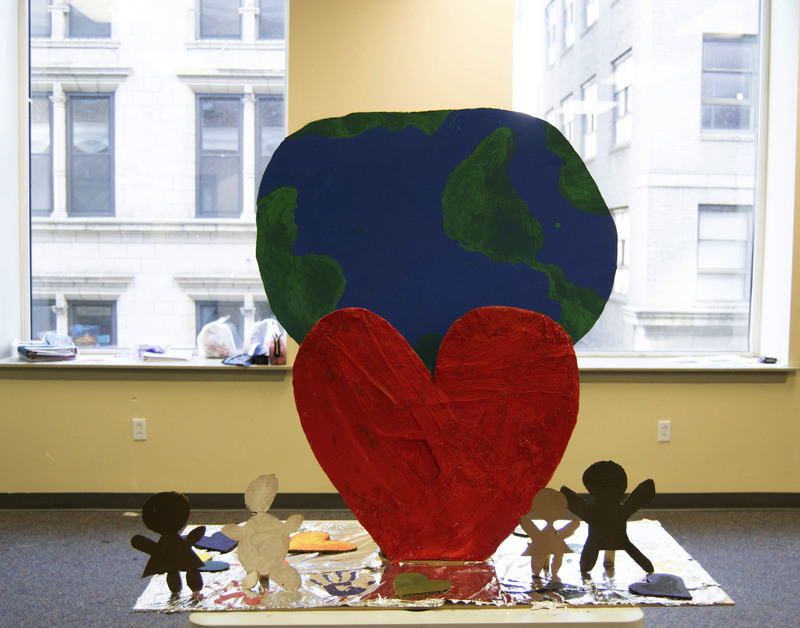 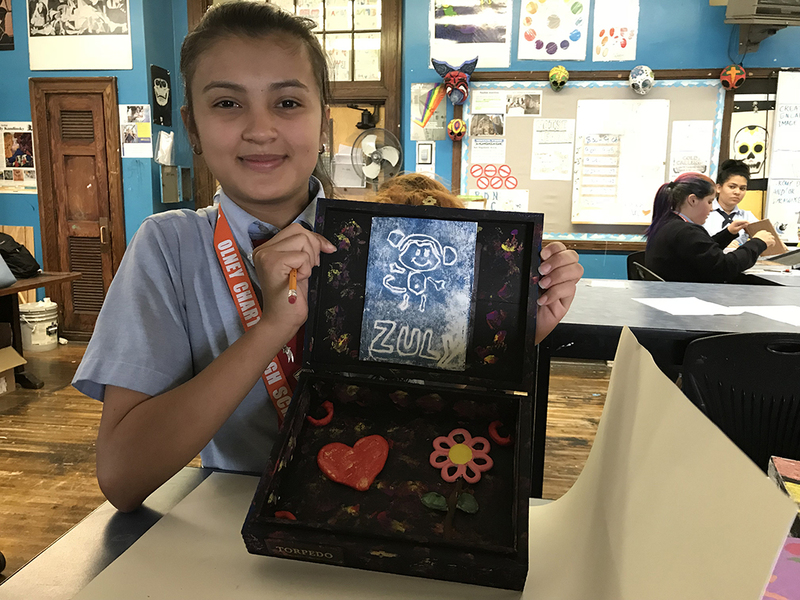 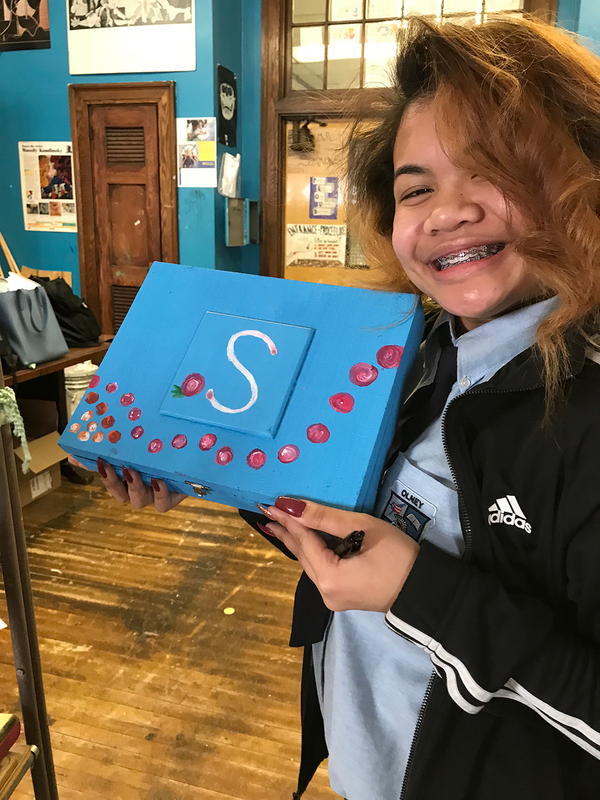 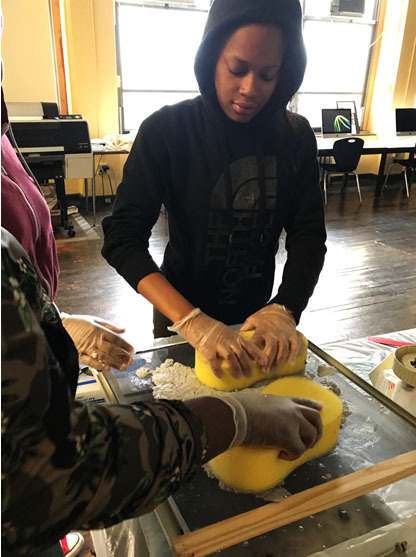 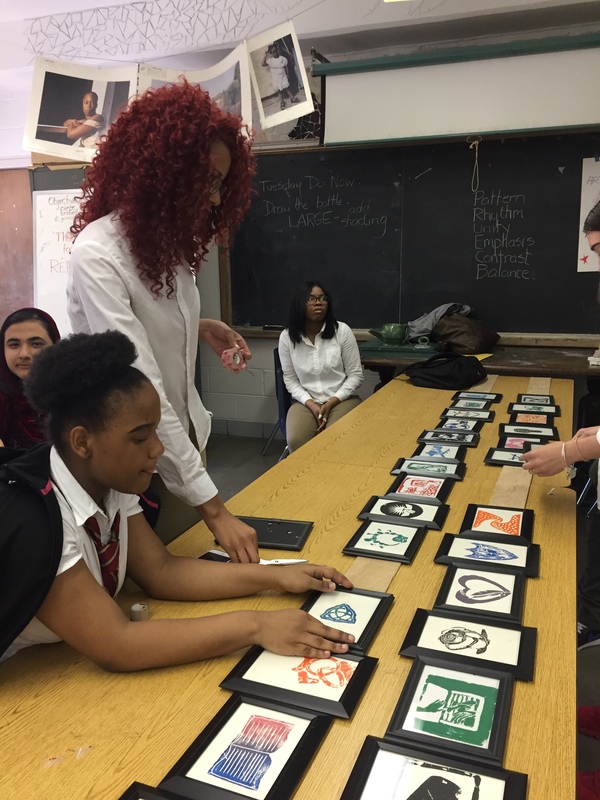 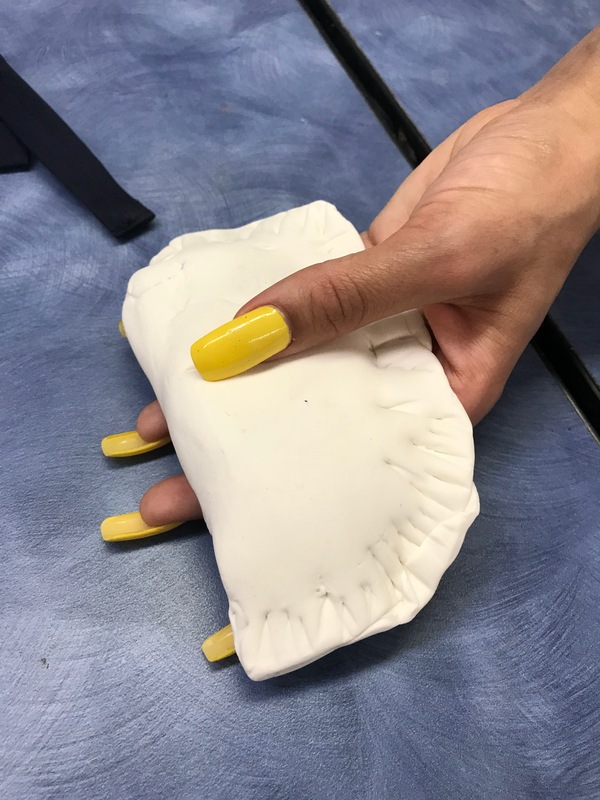 The 9th and 10th grade students in Robin Lane’s art classroom at Kensington Health Sciences Academy (KHSA) were led through a special project by Teaching Artist Rana Sindhikara. 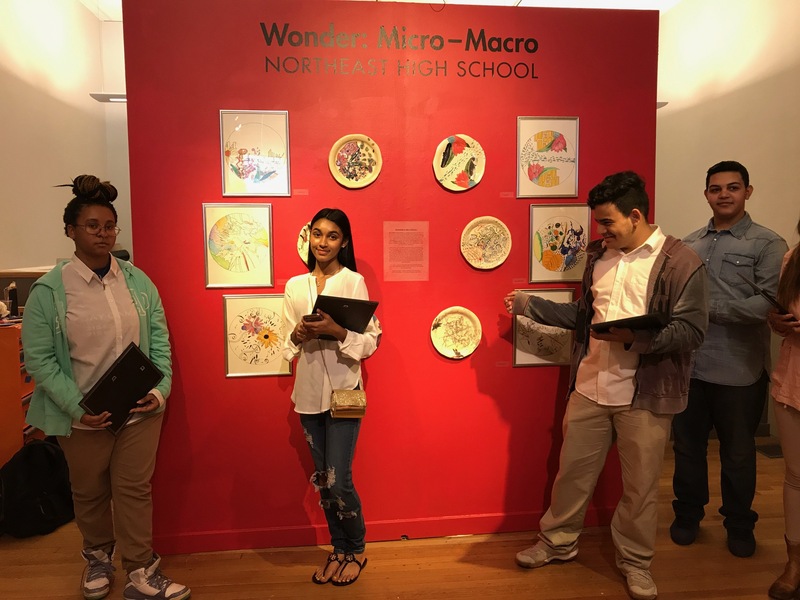 The students were introduced to the work of a multitude of artists in a wide variety of media and were given the historic background to their work. 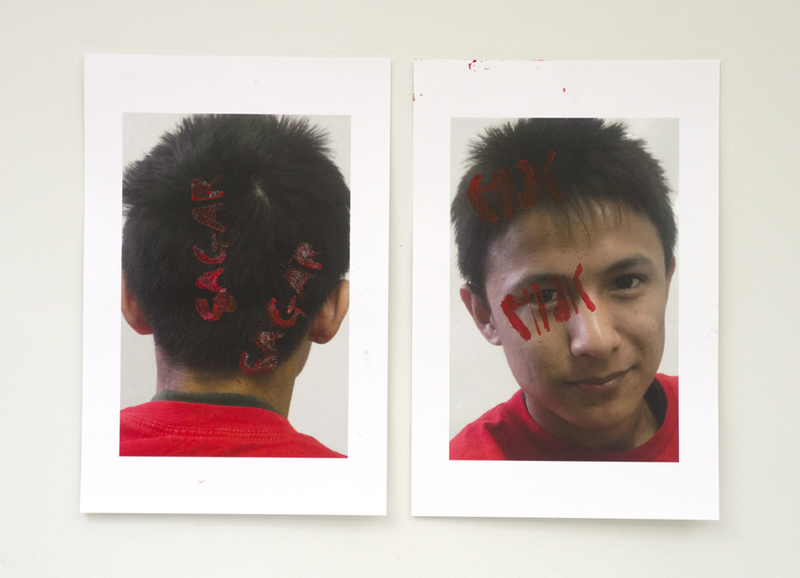 From these examples, students (almost) unanimously chose a work by artist Oscar Muñoz’s work, Ambulatorio, as their favorite. 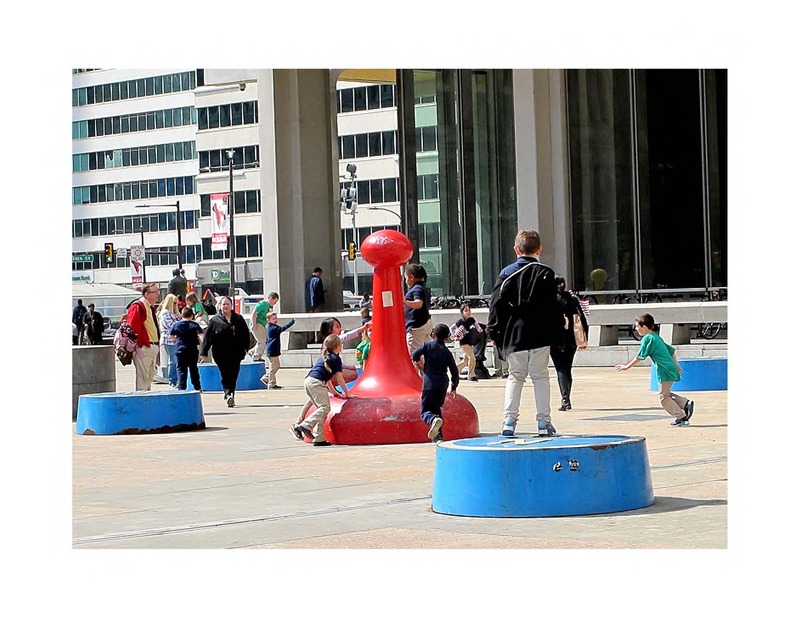 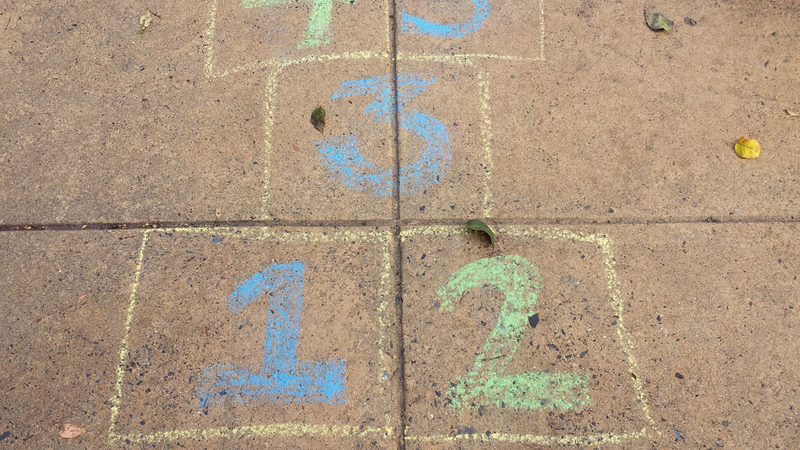 They were struck by how different this interactive floor piece was. 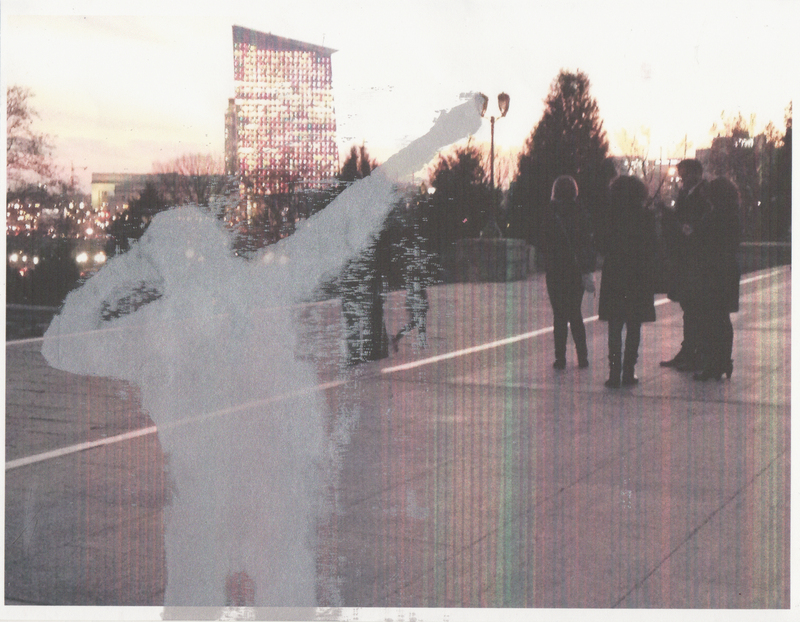 The concept of an artwork as an installation was a new one to them. 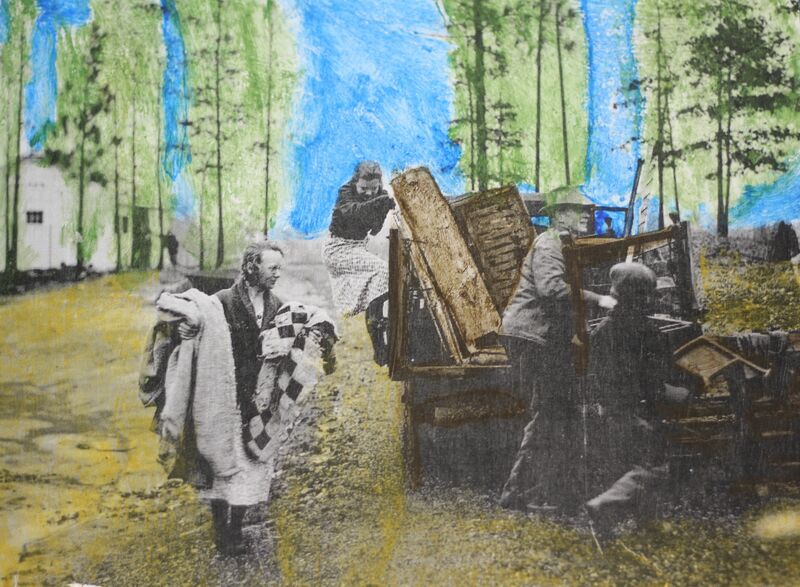 They decided to make a work that did not follow the tradition of being hung in frames on the walls. 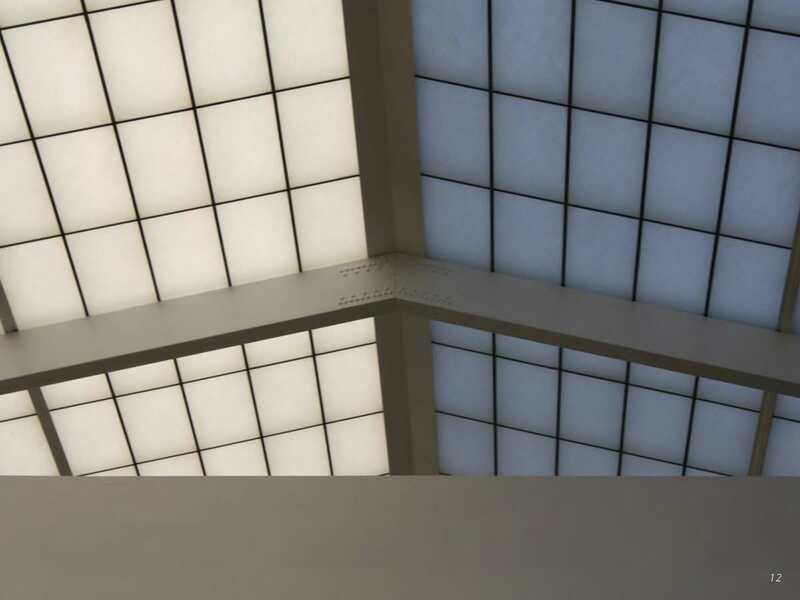 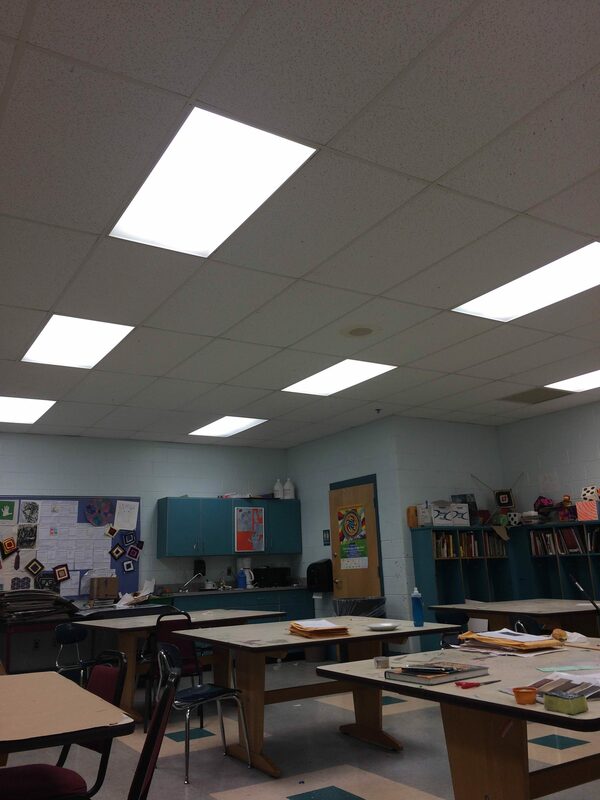 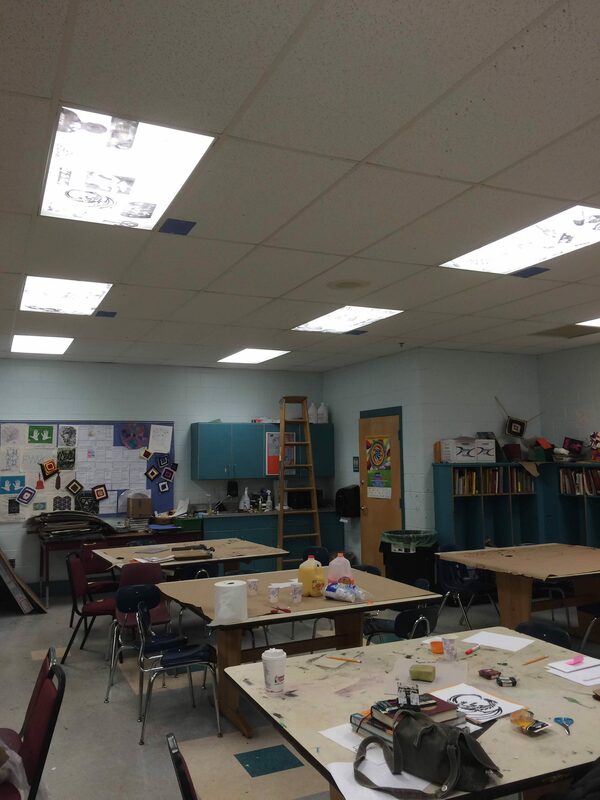 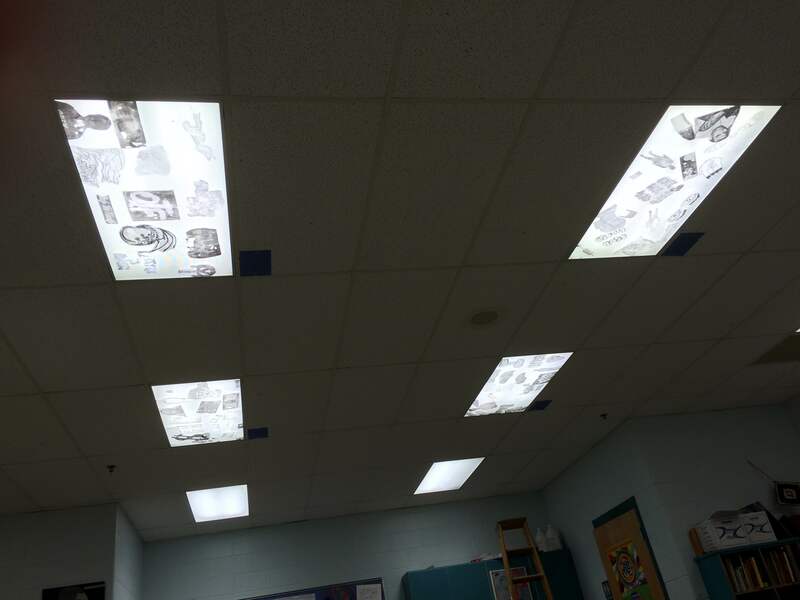 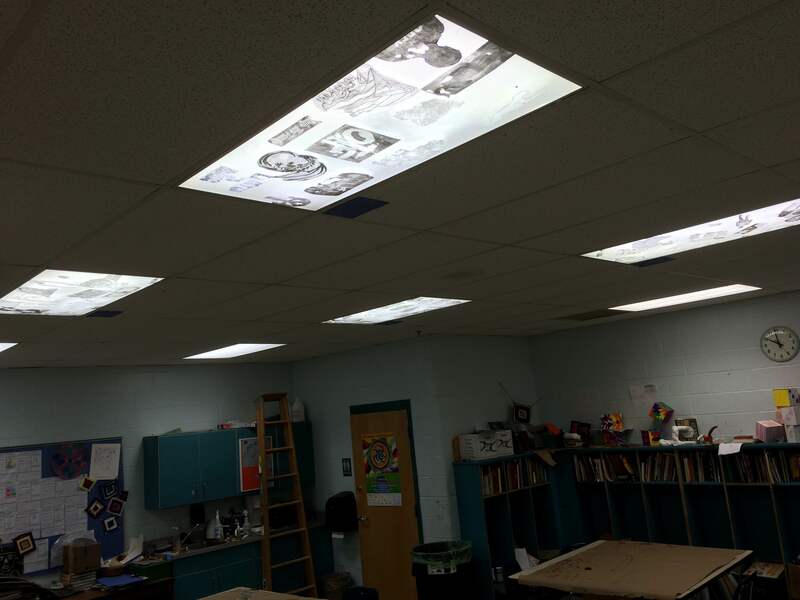 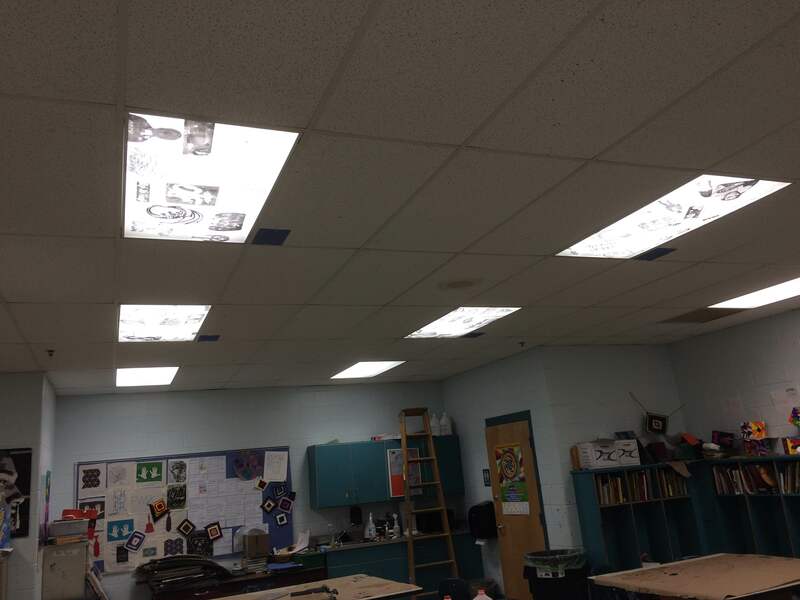 From their enthusiasm for this installation, Lane and Sindhikara developed the idea of creating an installation that would cover the light fixtures in the classroom. 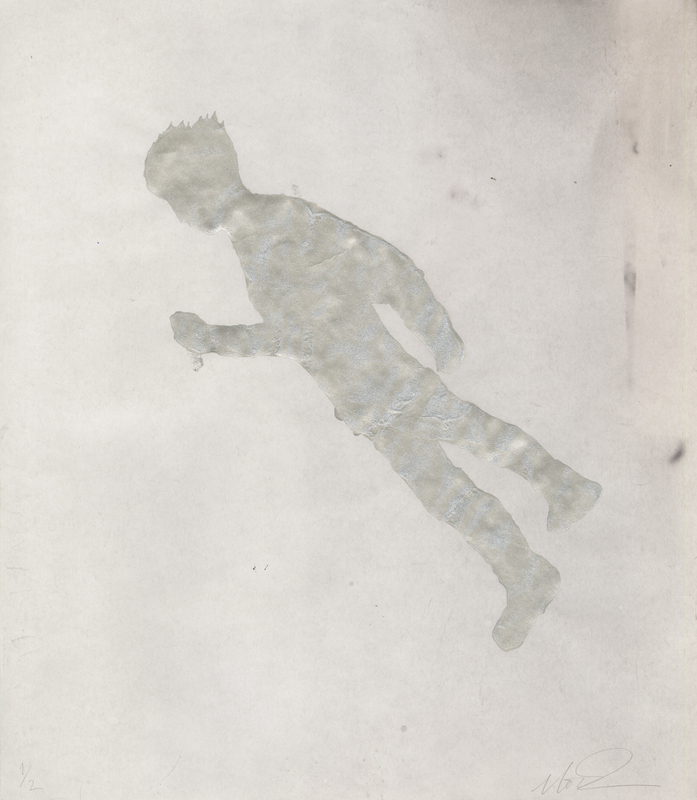 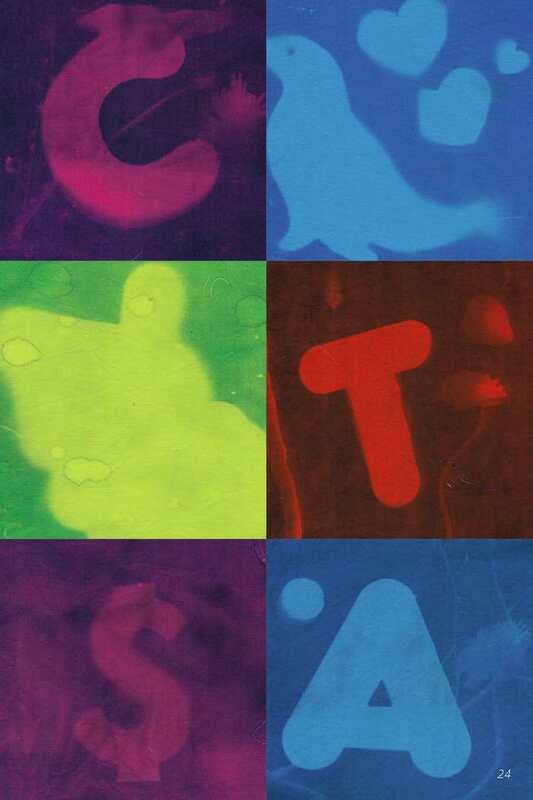 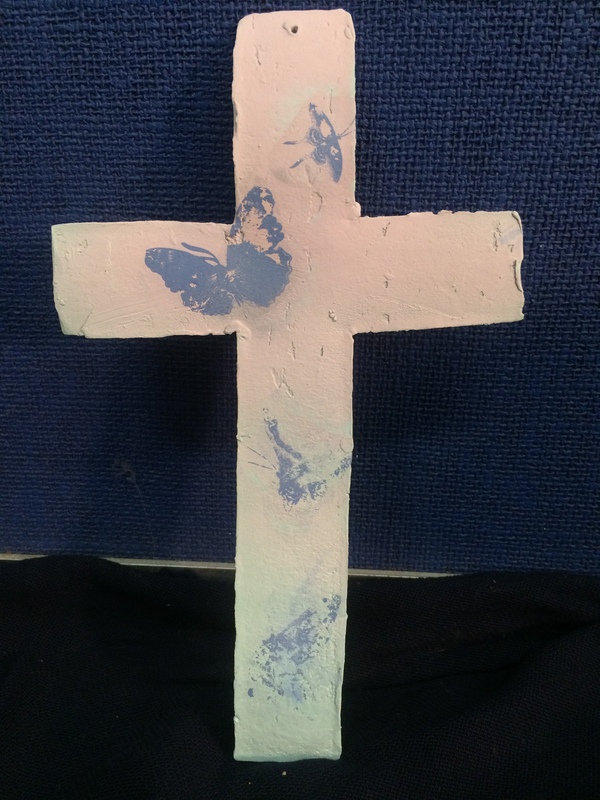 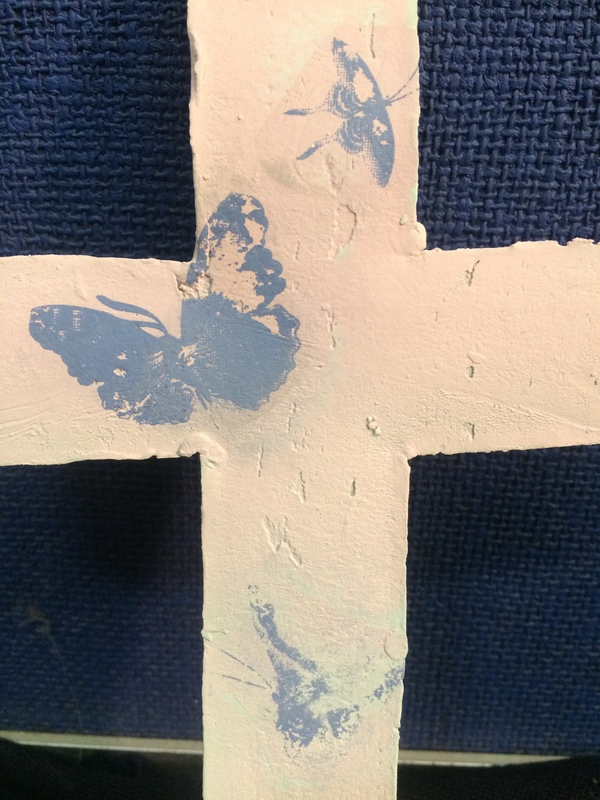 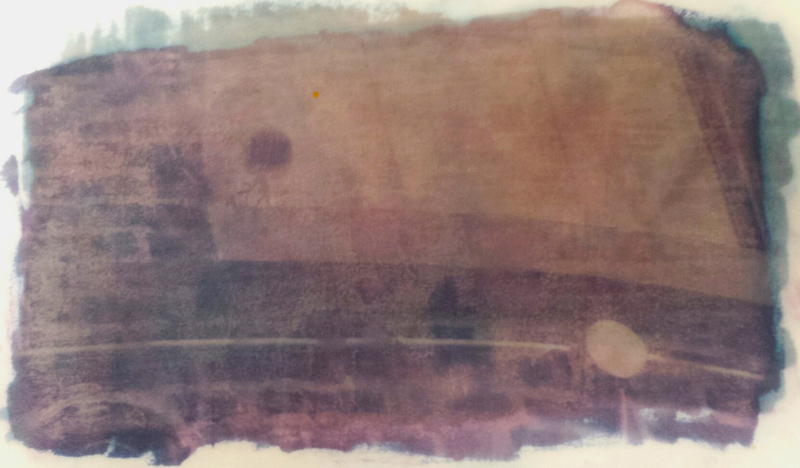 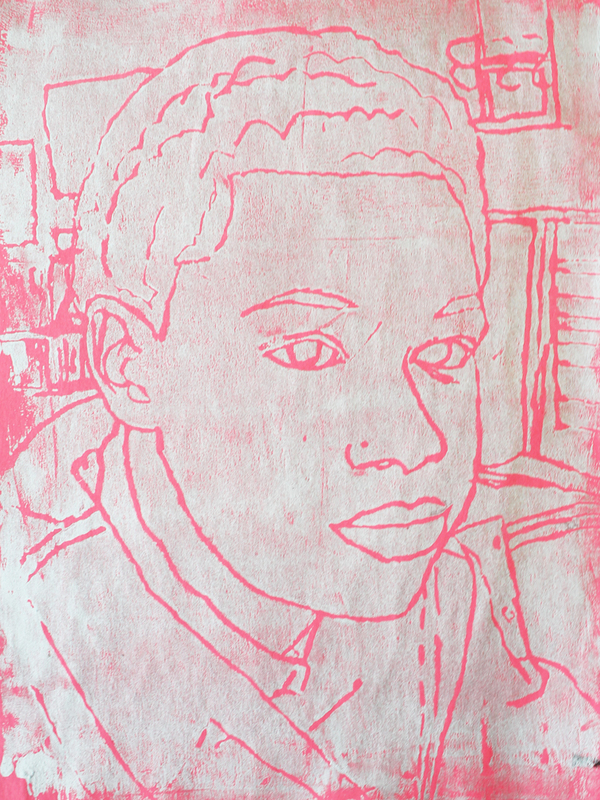 The imagery was made by creating photo transfers using acrylic gel medium. 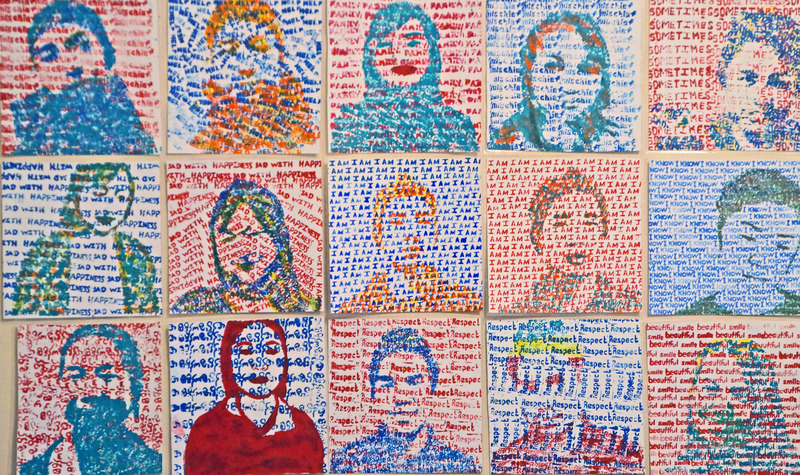 The theme of the work was based on personal recollections, histories and characteristics of the individual students. 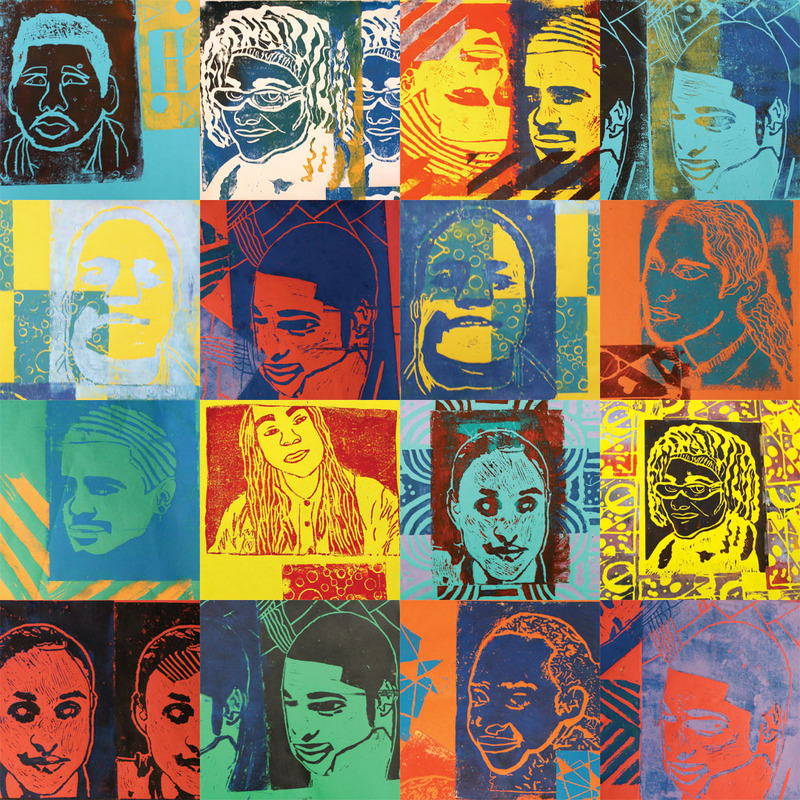 Student-artists in this gallery of work include Shareek Acosta, Miguelangel Ascencio-Santos, Kwazeem Bazemore, Jocelyn Calo, Natasha Canty-Goode, Iven Castro, Jaisera Daniels, Anthony Davalos, Miguel Dejesus, Leon Foote, Keeshine Foy, Nathan Garcia, Shaniya Hill, Kimberly Hudicek, Donald Jenkins, Antonio Lanzo, Eryk Leach-Gilliam, Eddie Malak, Kyle Mallon, Sandro Otero, Tianna Robinson, Gabriel Serrano, Niyaira Smith, Tyrone Thomas, Angel Torres, Rosalinda Torres, Axel Vazquez and Jhamir Winans. 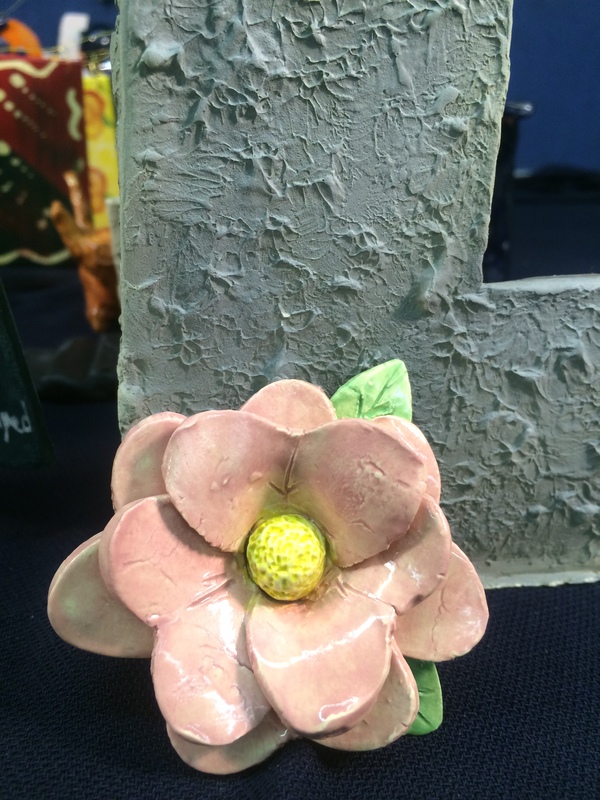 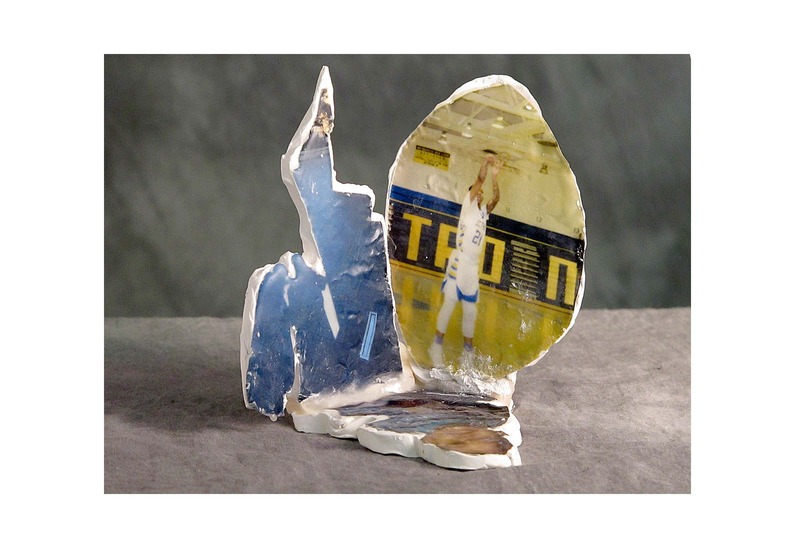 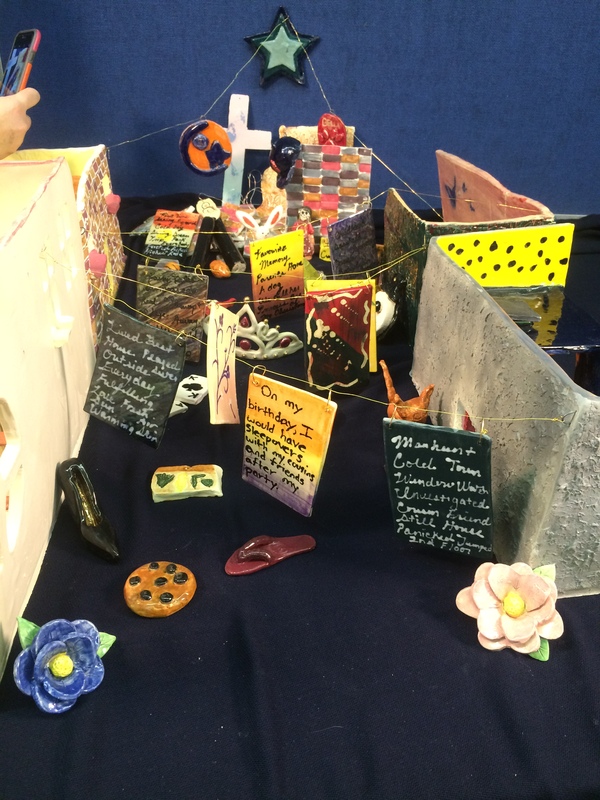 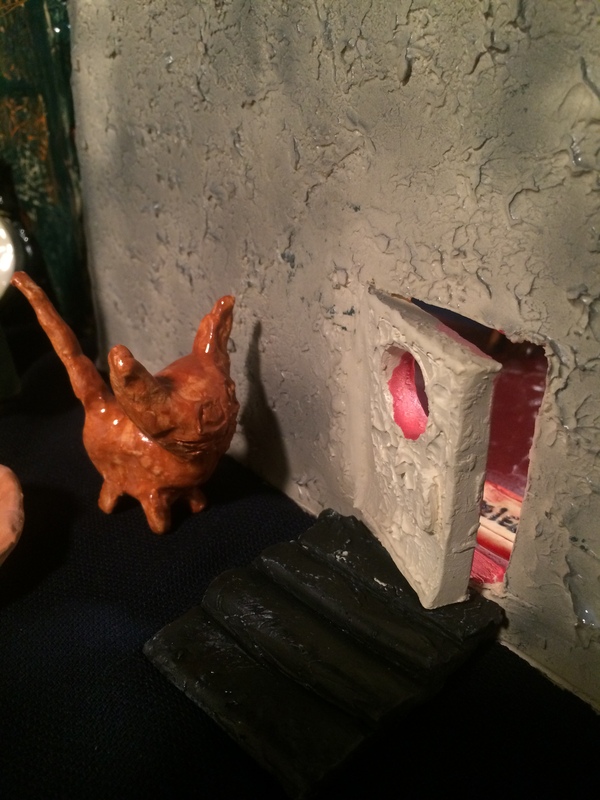 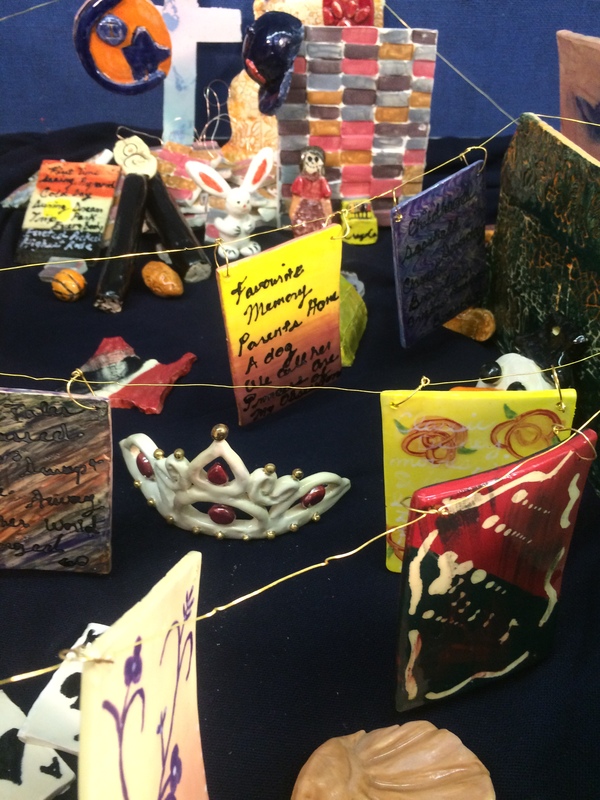 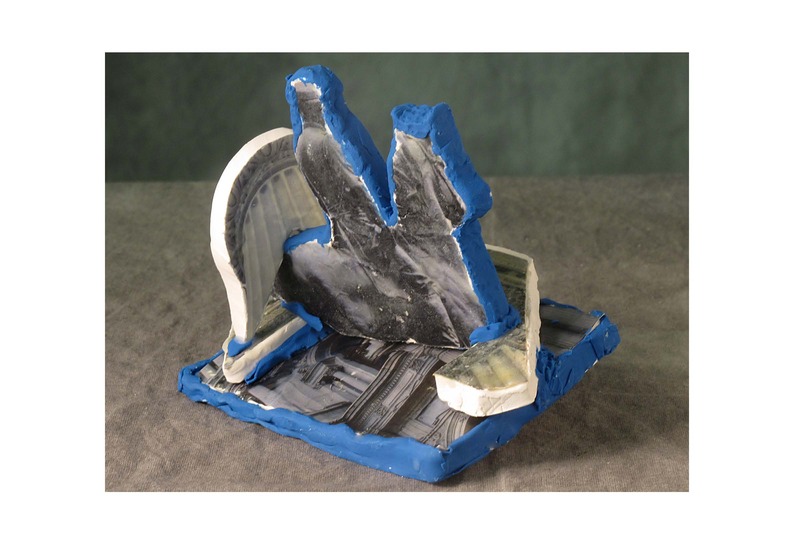 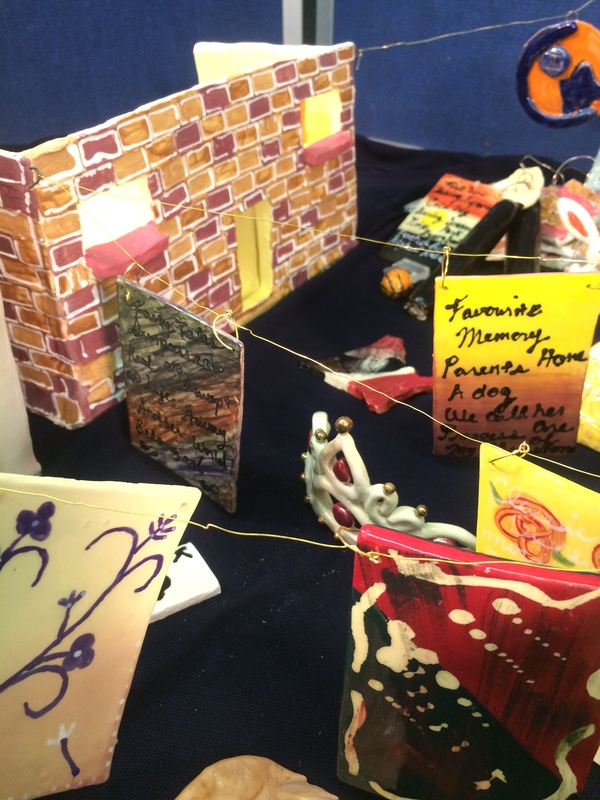 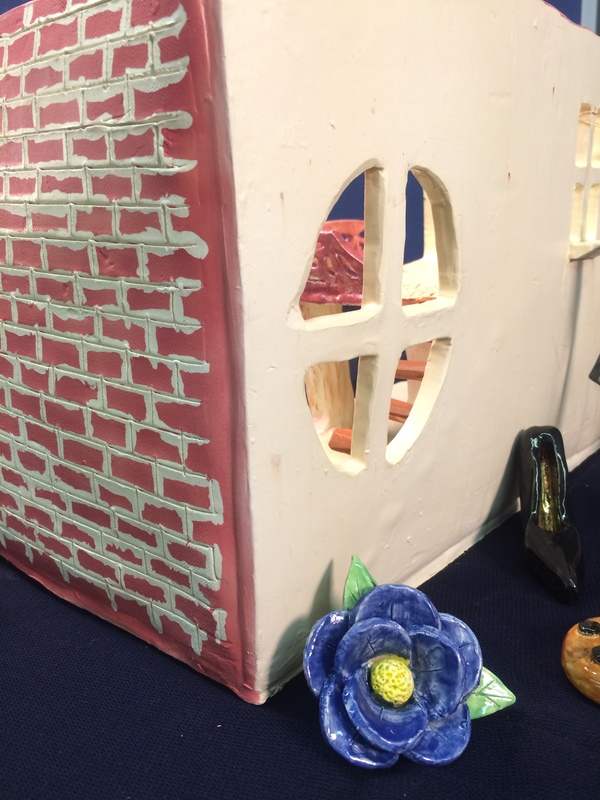 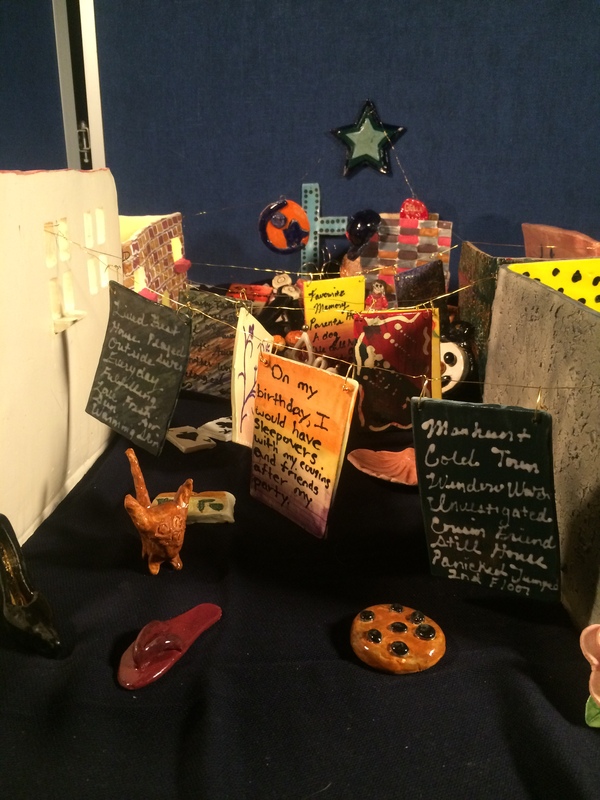 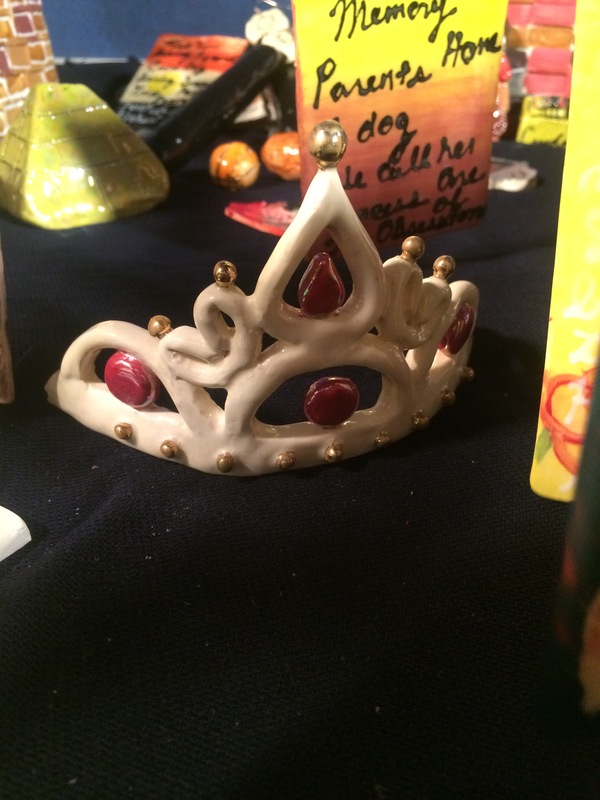 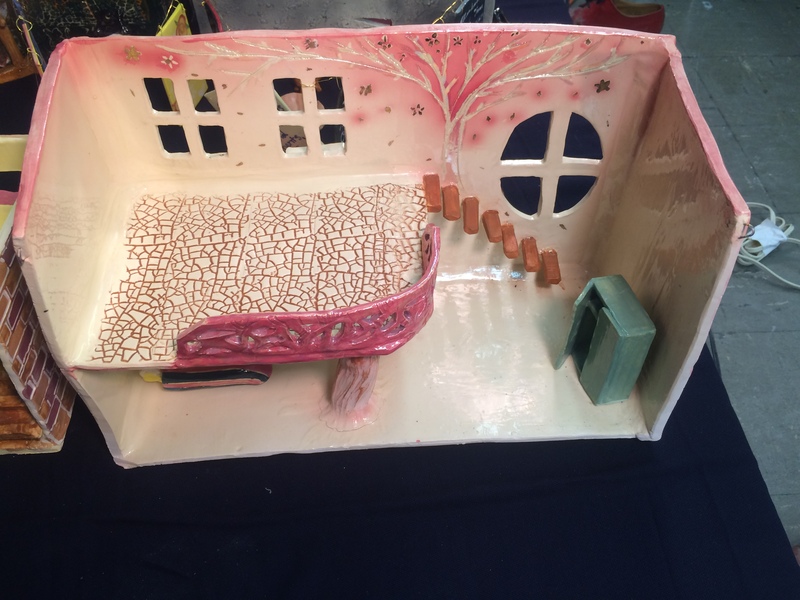 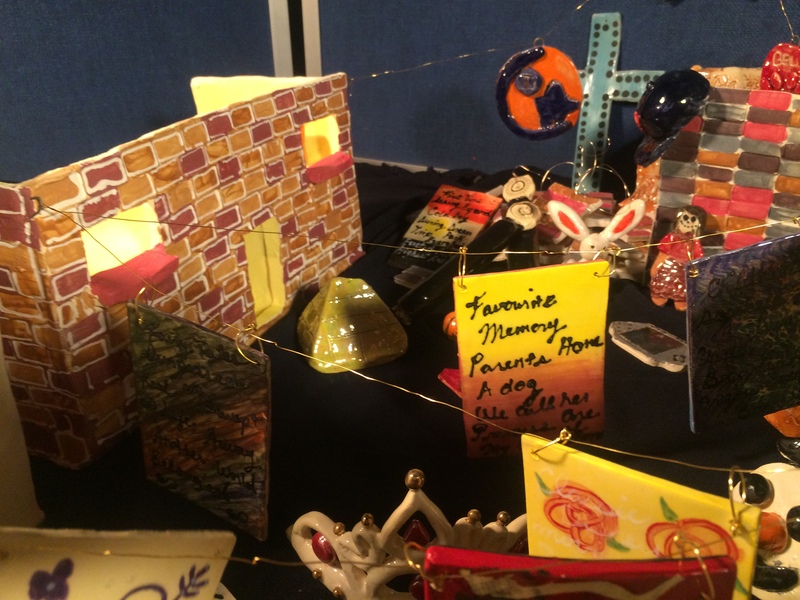 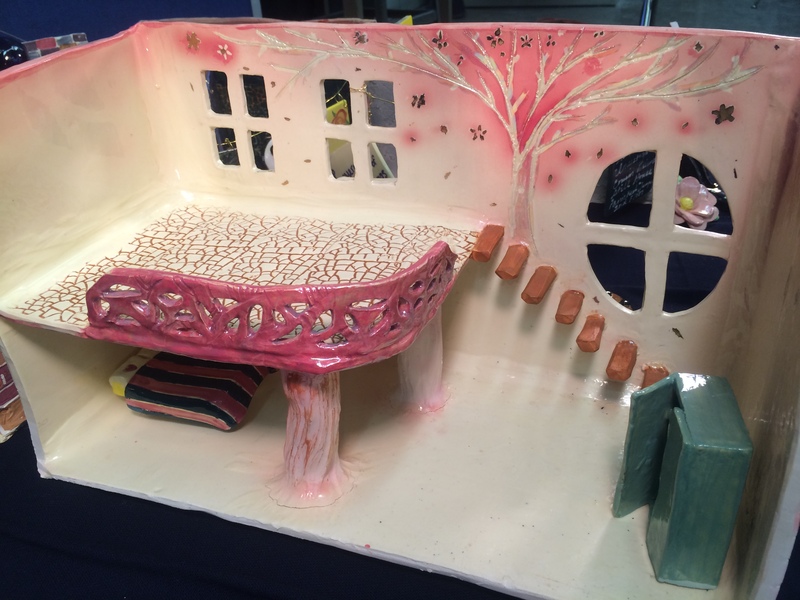 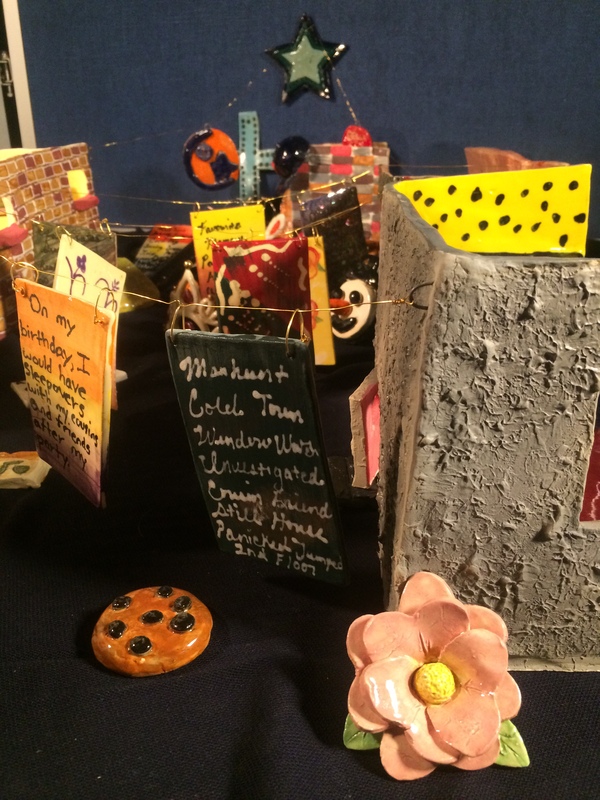 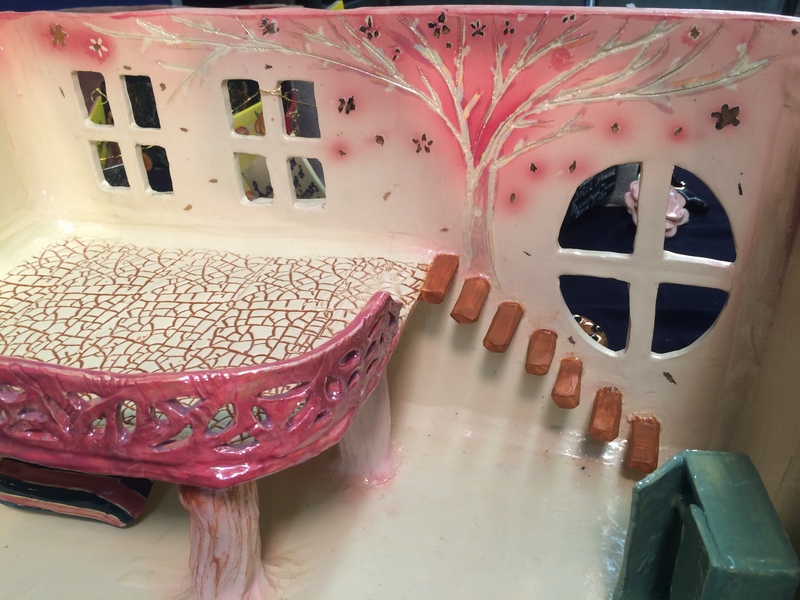 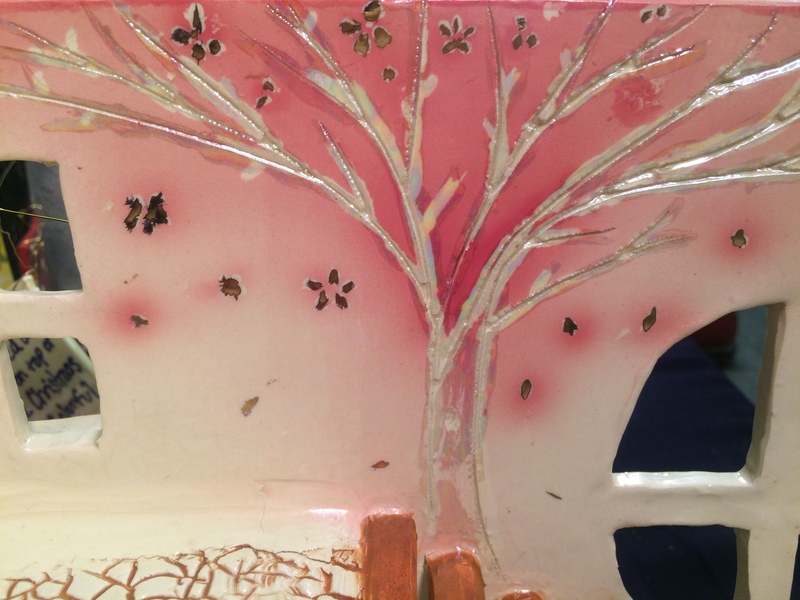 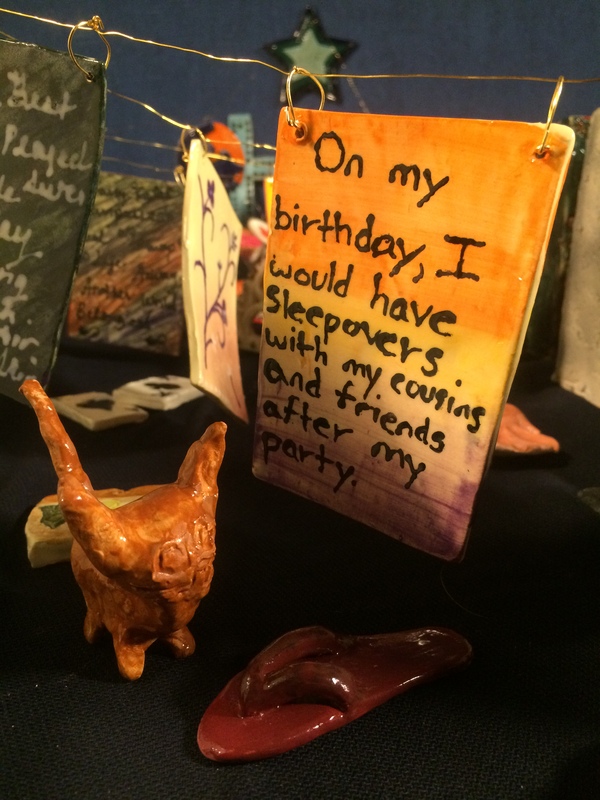 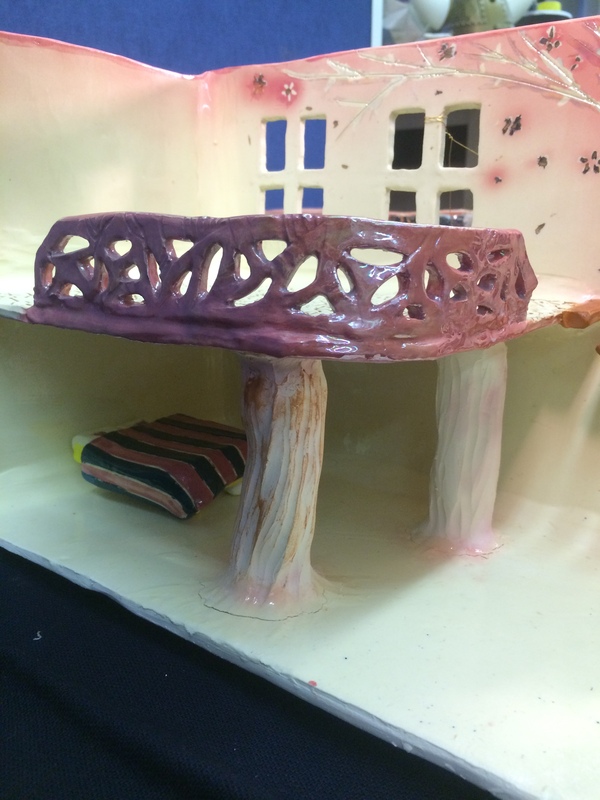 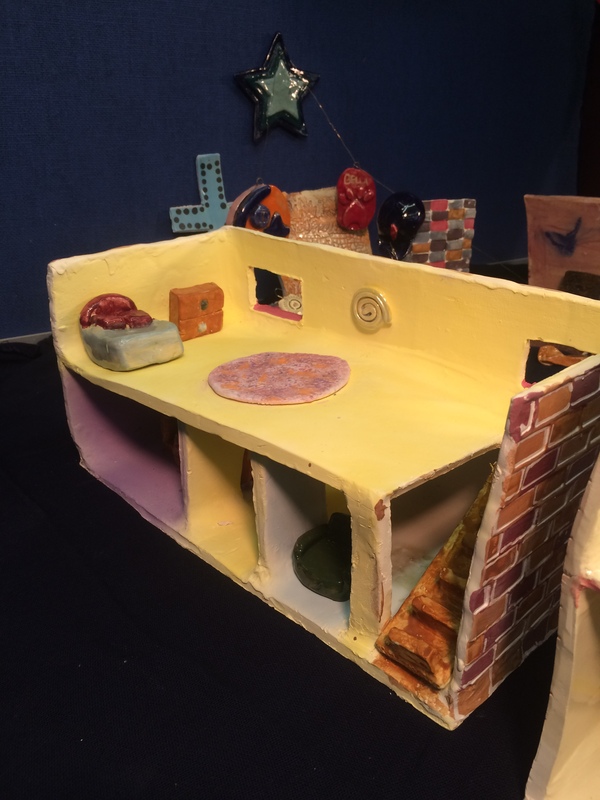 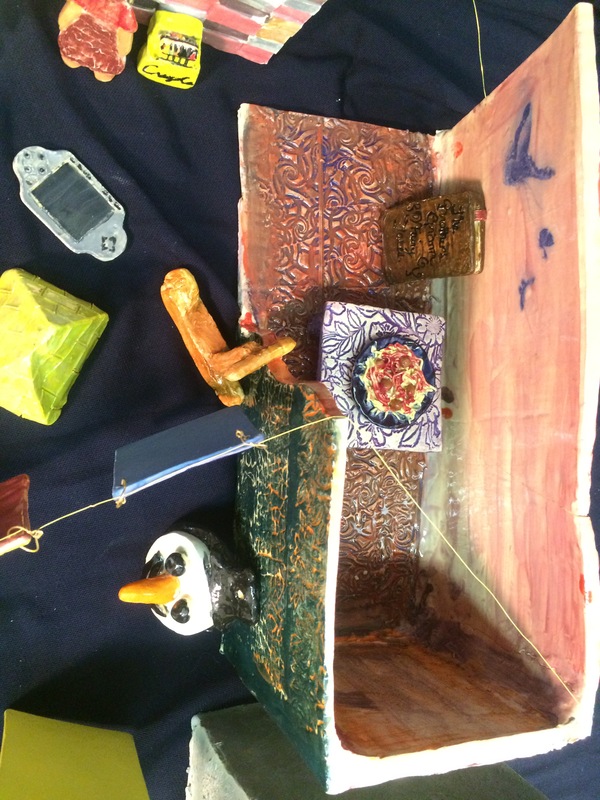 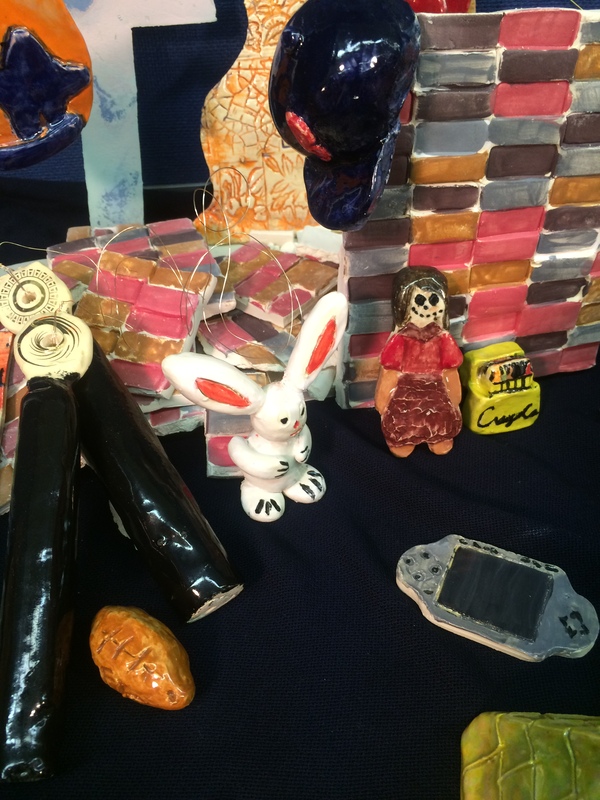 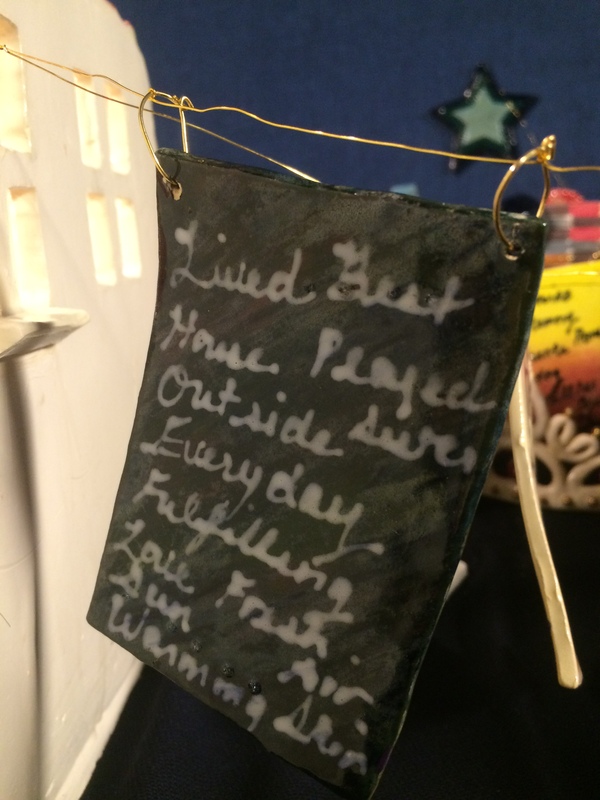 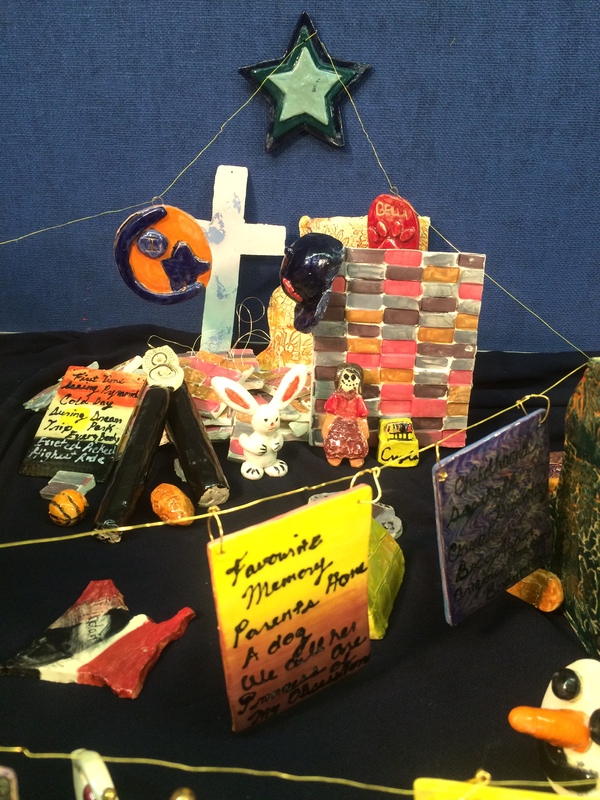 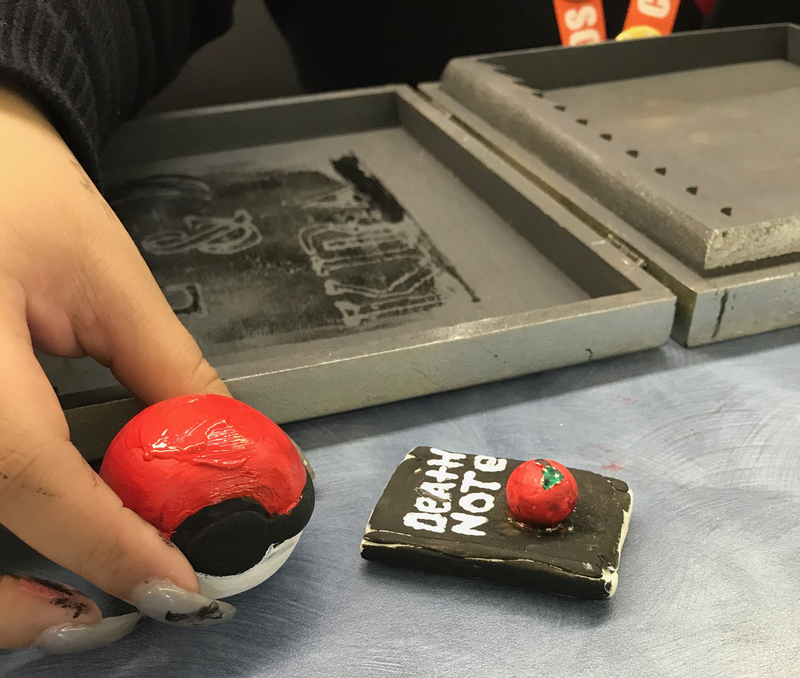 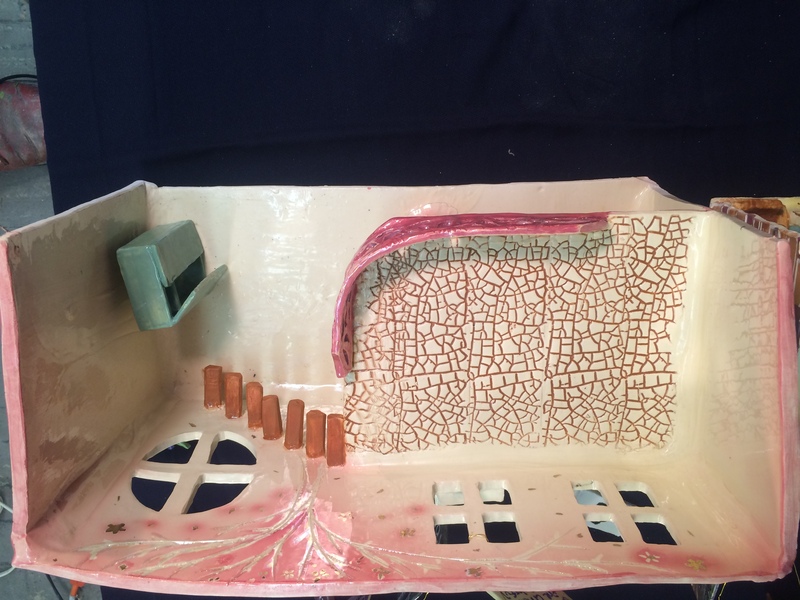 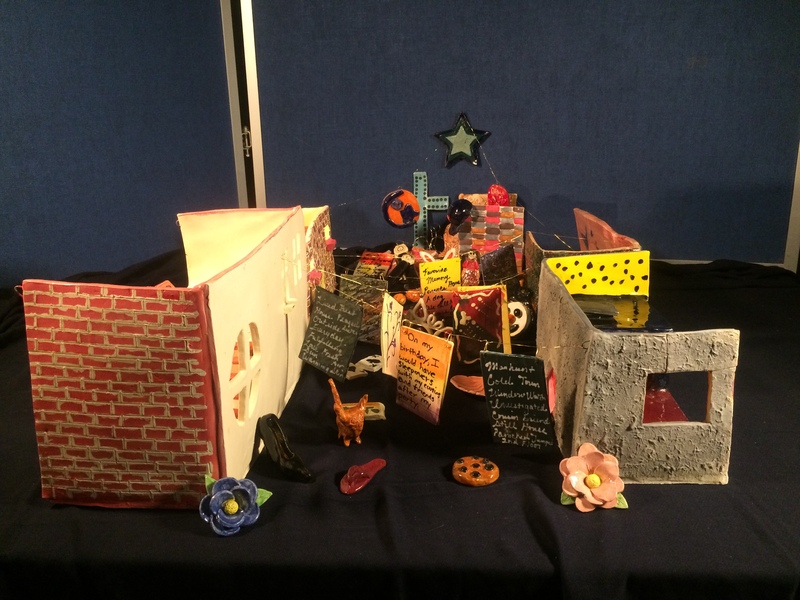 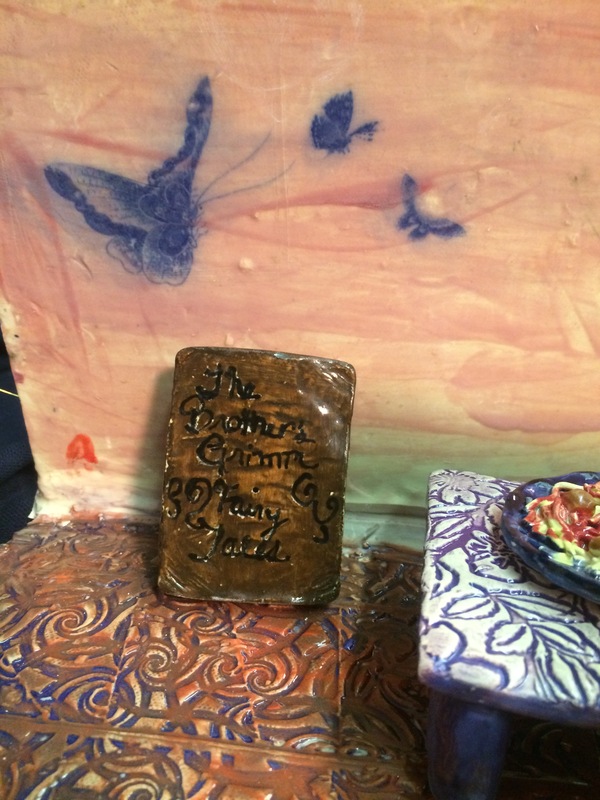 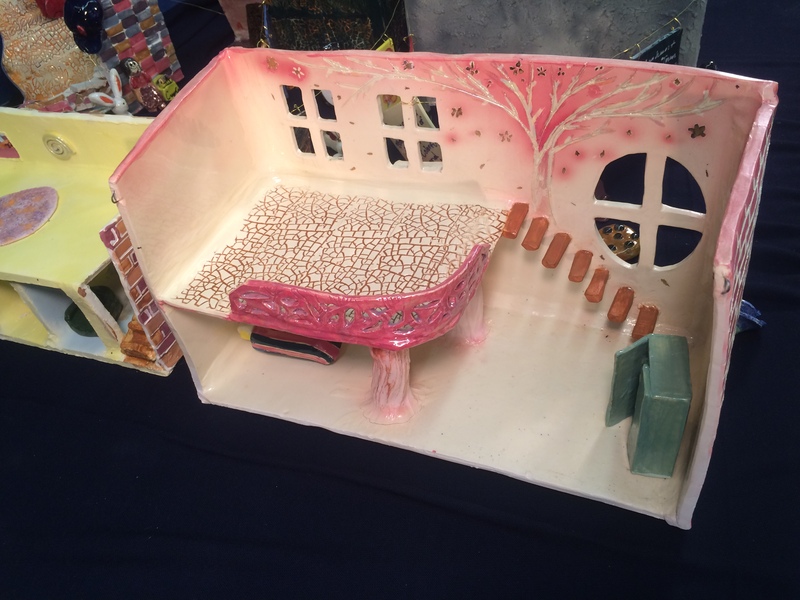 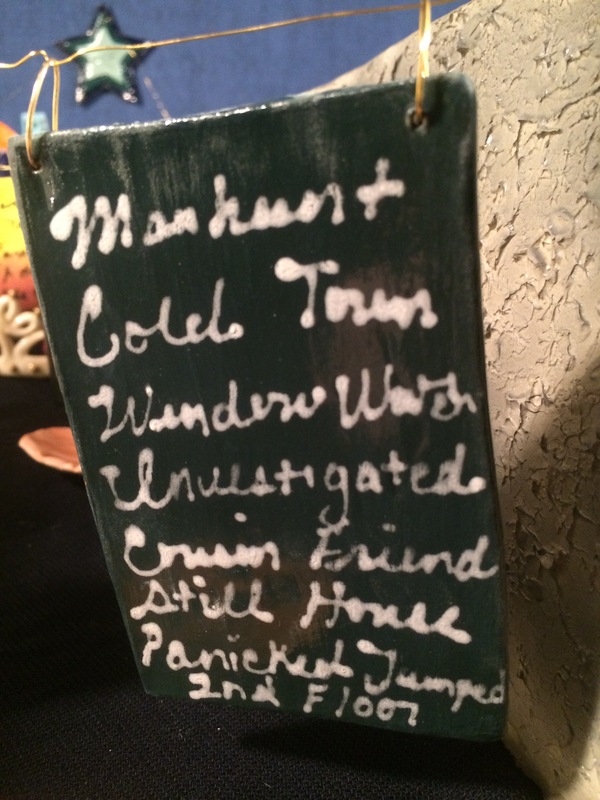 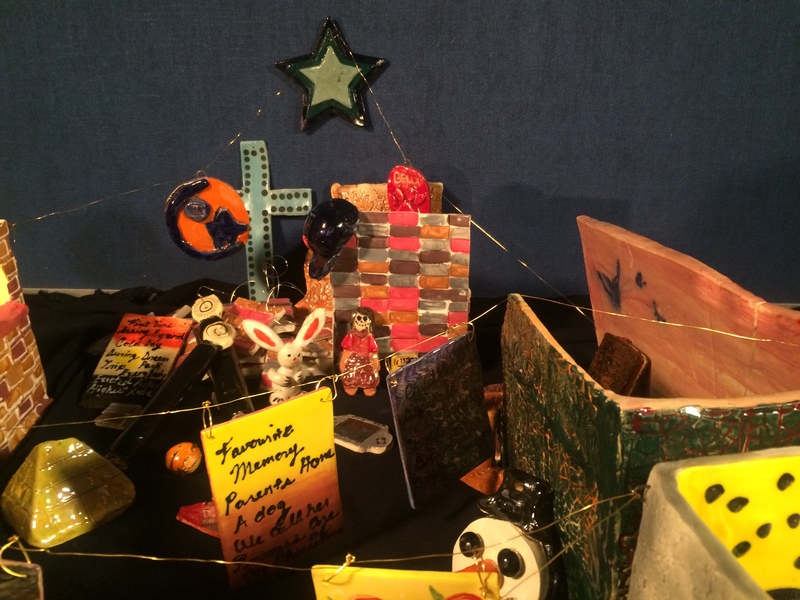 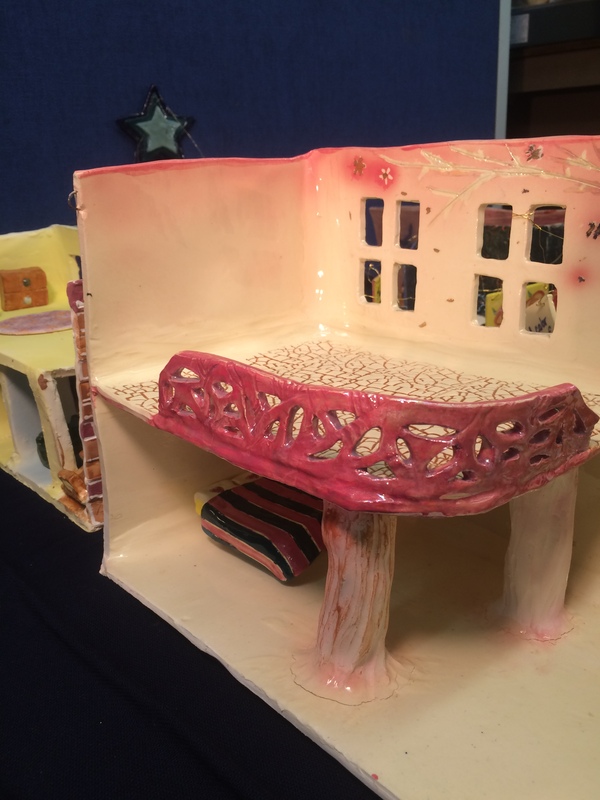 Students from two of Harmony Thompson’s ceramic classes at Northeast High School collaborated with Teaching Artist Marguerita Hagen to create a sculptural and printed narrative installation called Still Memory- A Moment in Our History. 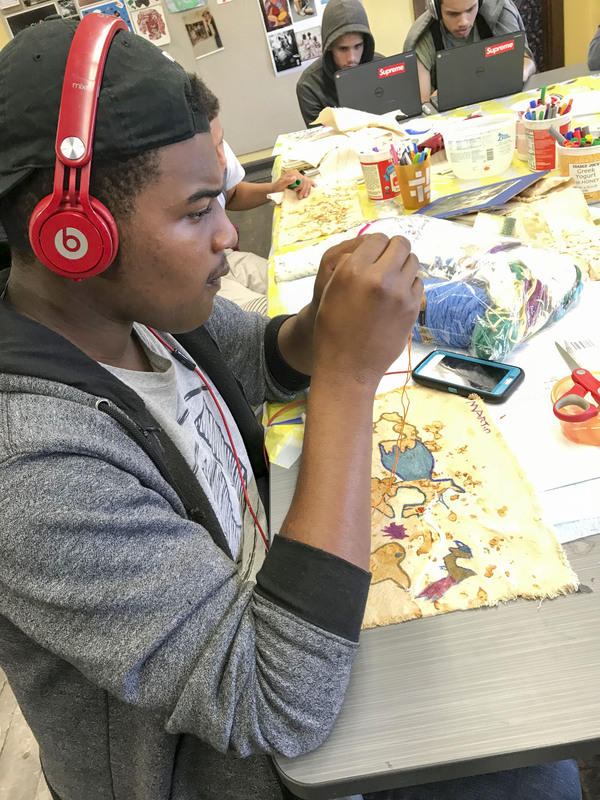 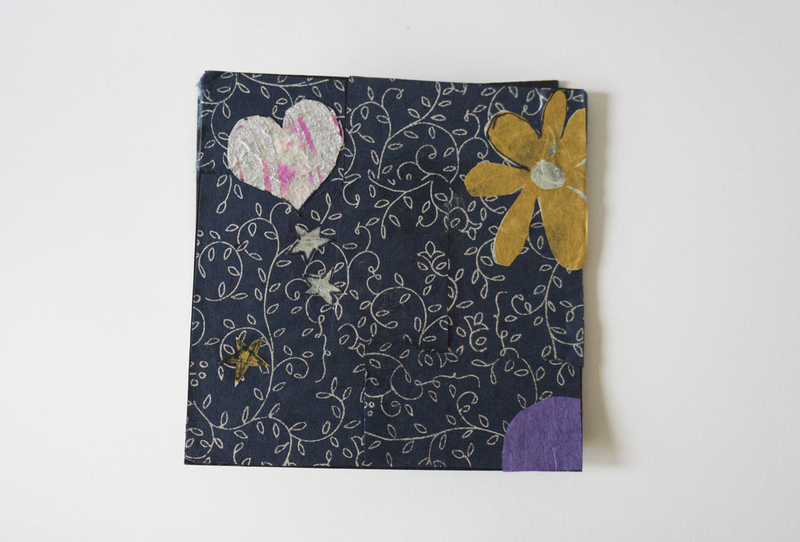 On their field trip, students were inspired by the work of two artists at the Fabric Workshop & Museum. 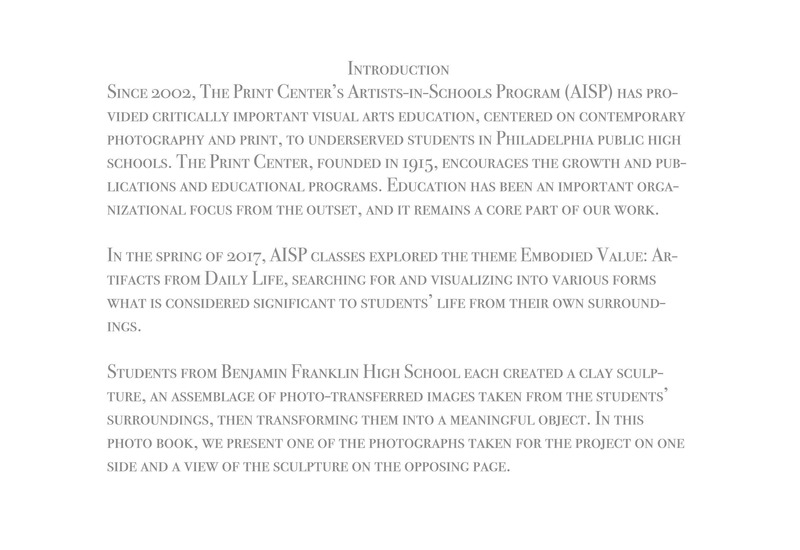 Cynthia Hopkins and Nate Young’s intimate sharing of history and engagement with storytelling became the model for this project. 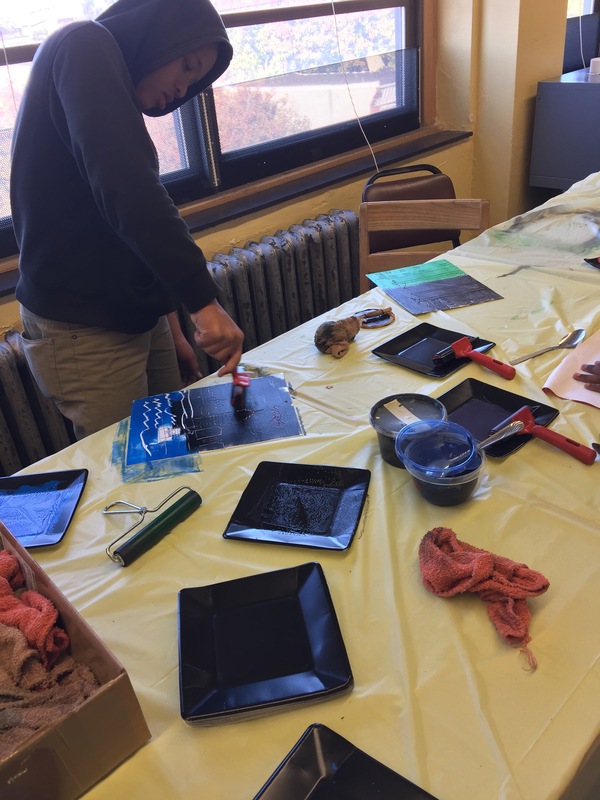 Hagan pushed the students to experiment with the variety of ways that image and texture could be printed and transferred onto clay during the greenware, bisque and final glazing stages. 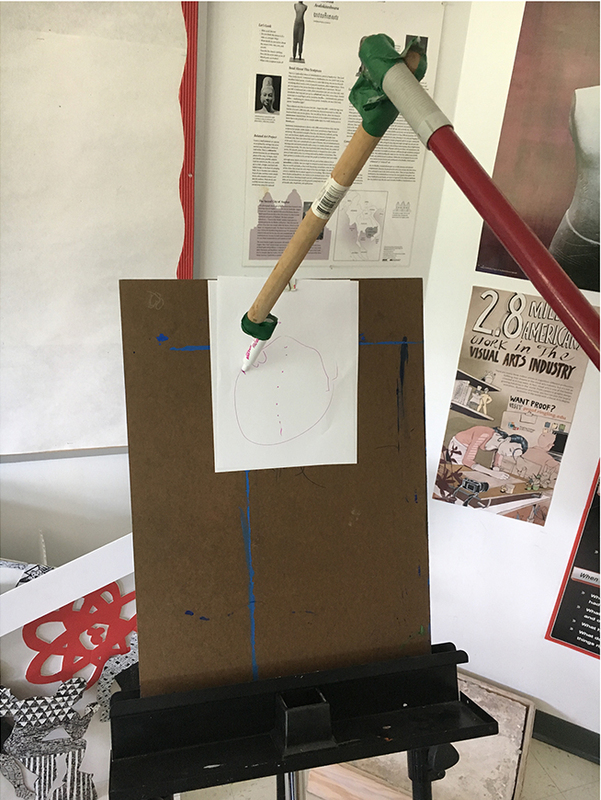 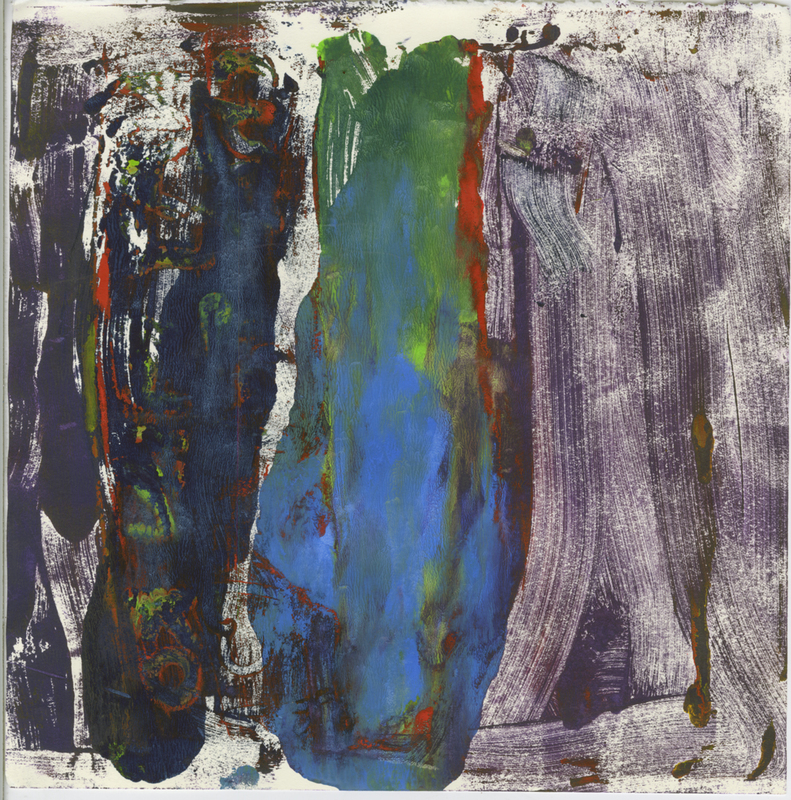 These methods helped students add both visual layering and complex meaning to their art, mirroring some of the visual tools that Hopkins and Young used in their exhibitions. 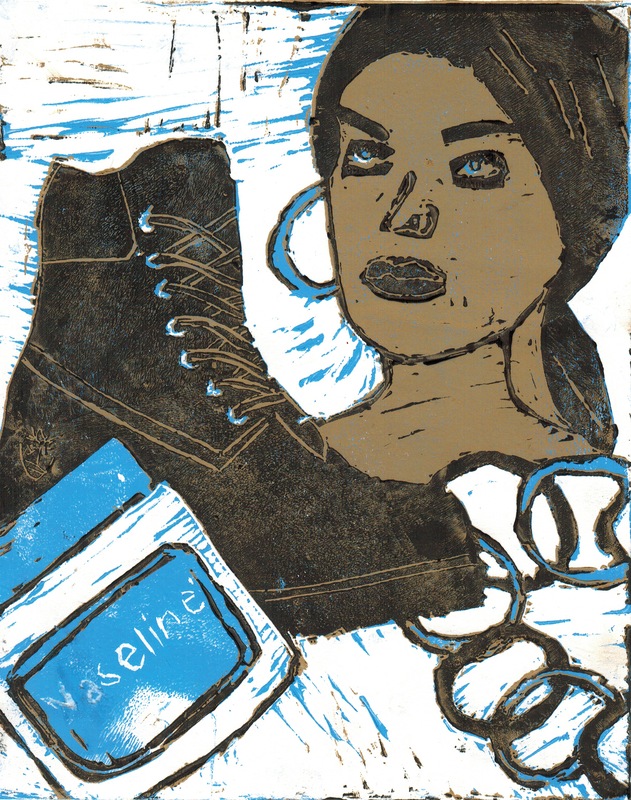 Student-artists in this gallery of work include Rogelio Bencito, Emelin Chacon, Tarij Collins, Brian Davis, Reynoel Galvis, Christine Gray, Casshia Cooks, Shalyn Foster, Marzana Hussain, Hasheleta Joseph, Samirah Herbert, Nashaun King, Xiaofei Lu, Siren Mohamad, Matt Mohammed, Cassandra Murphy, Renata Recka, Raina Richardson, Lisa Shin, Mohamed Soma, Isadora Souza, Jamyya Whitmore and Linda Xu. 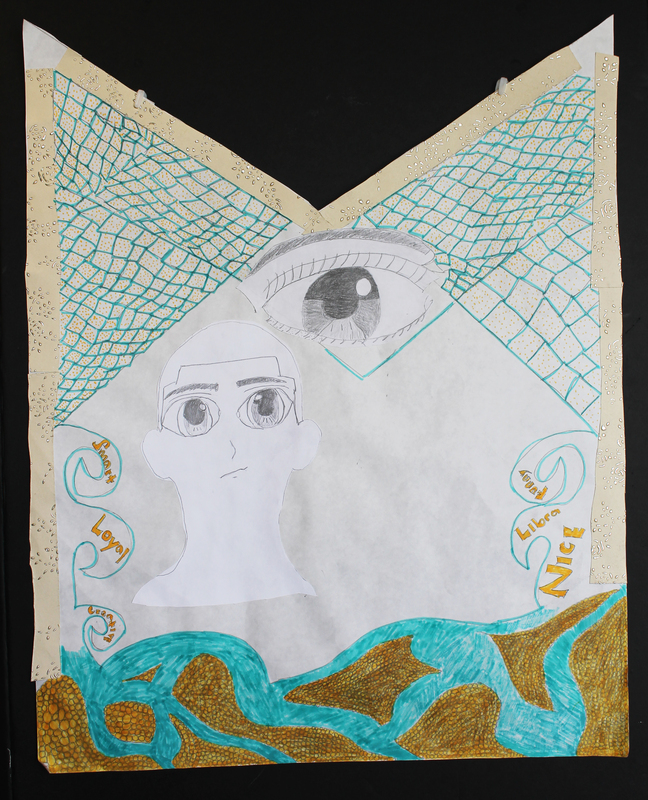 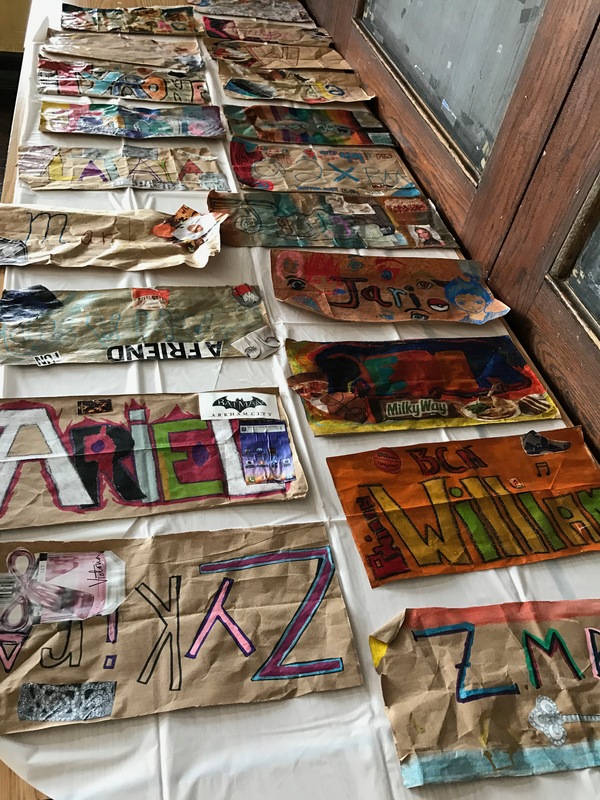 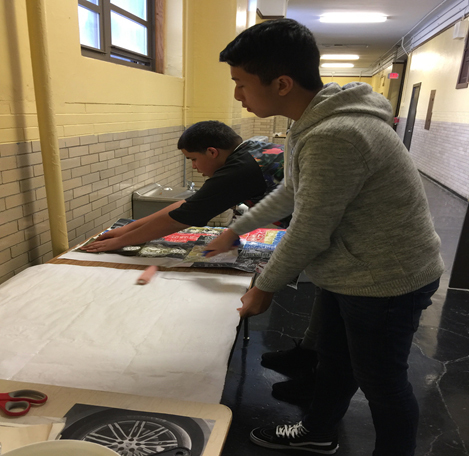 Students from Linda Heeg’s School of the Future art class created banners with artist teacher Christopher Hartshorne using large sheets of rice paper that showcased elements of their identities. 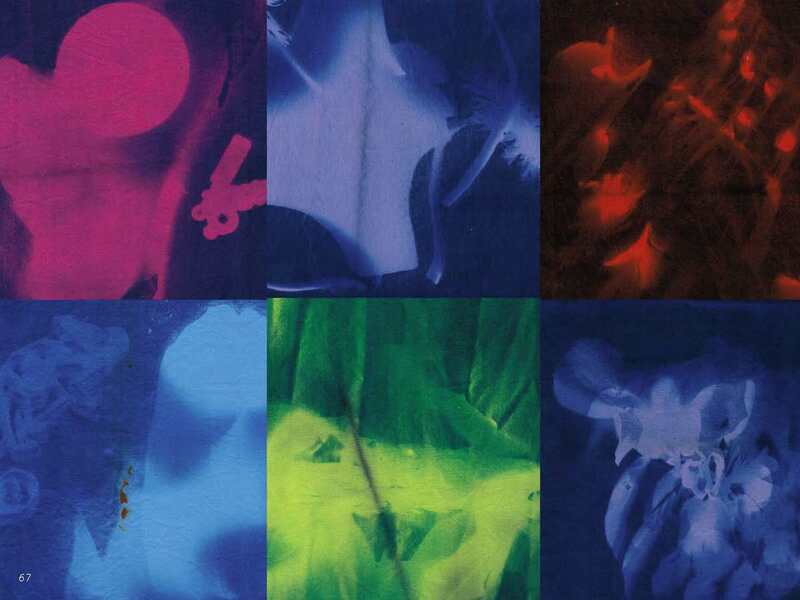 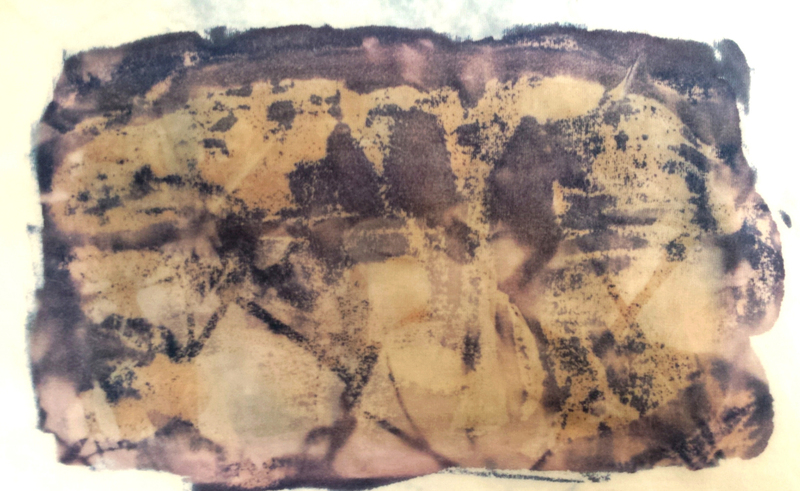 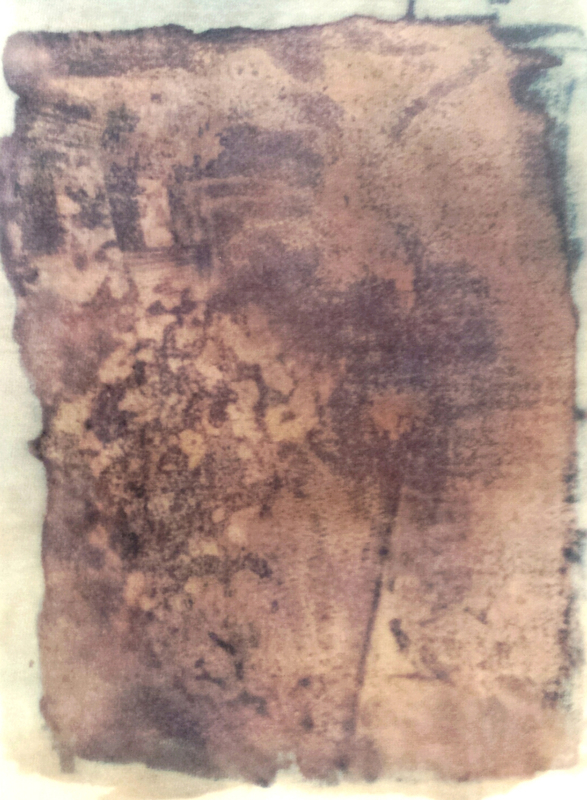 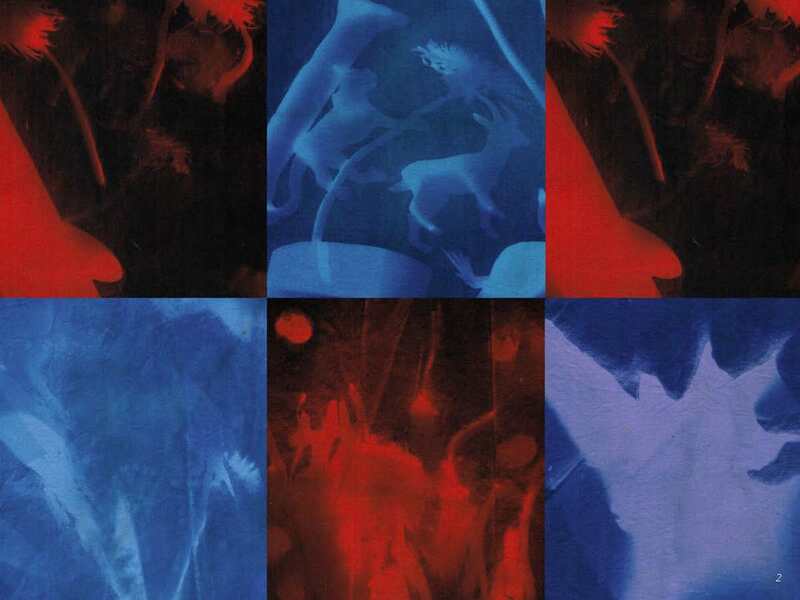 Students collaged photographs onto the rice paper using various techniques, including transferring them using gel medium. 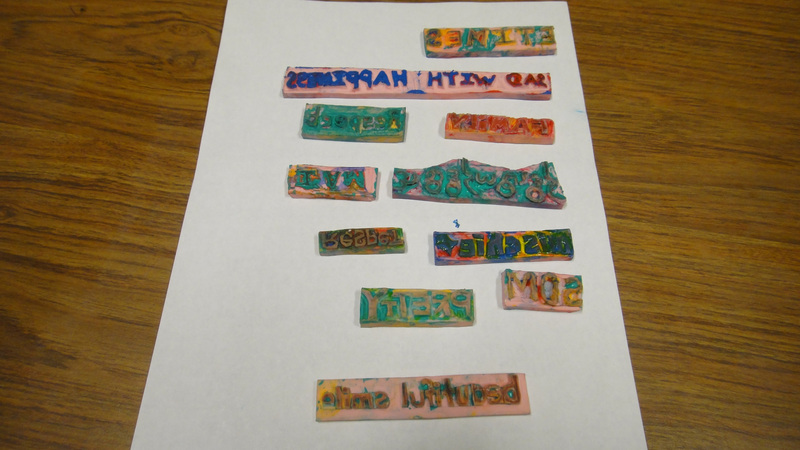 They also used relief stamping to design their identity banners. 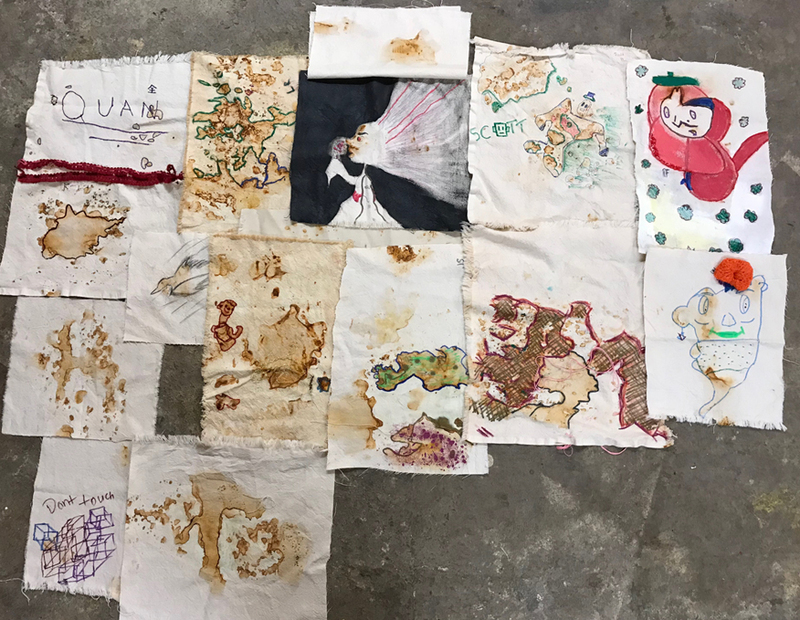 Students explored the work of Cynthia Hopkins, specifically her banner-like installation at the Fabric Workshop & Museum. 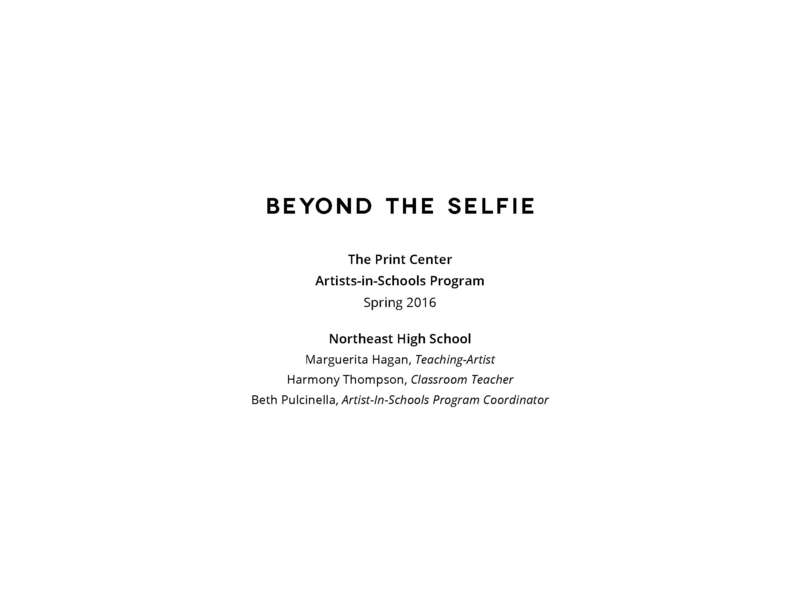 Students related to the self-portraiture in Hopkins’ work, specifically the candid and explicit details of her life story. 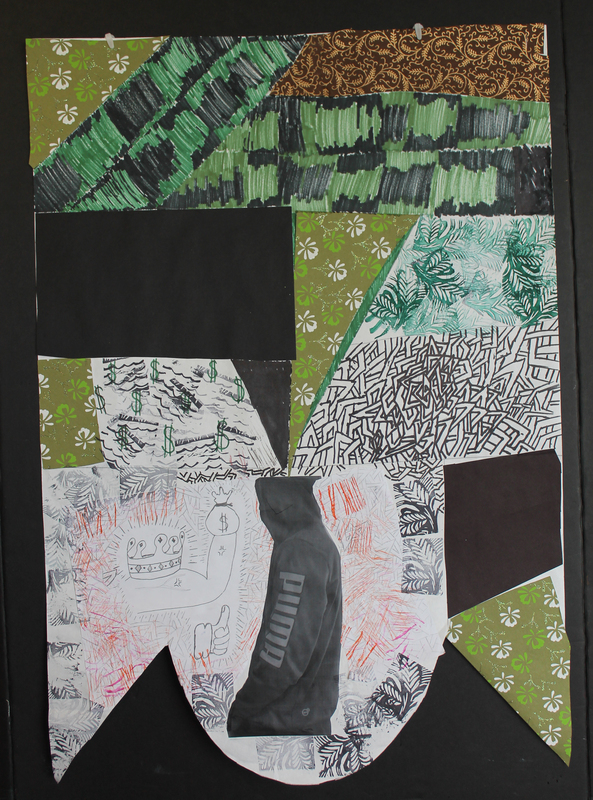 Students also studied the work of Mark Bradford, in particular the way Bradford uses multiple layers to create a composition. 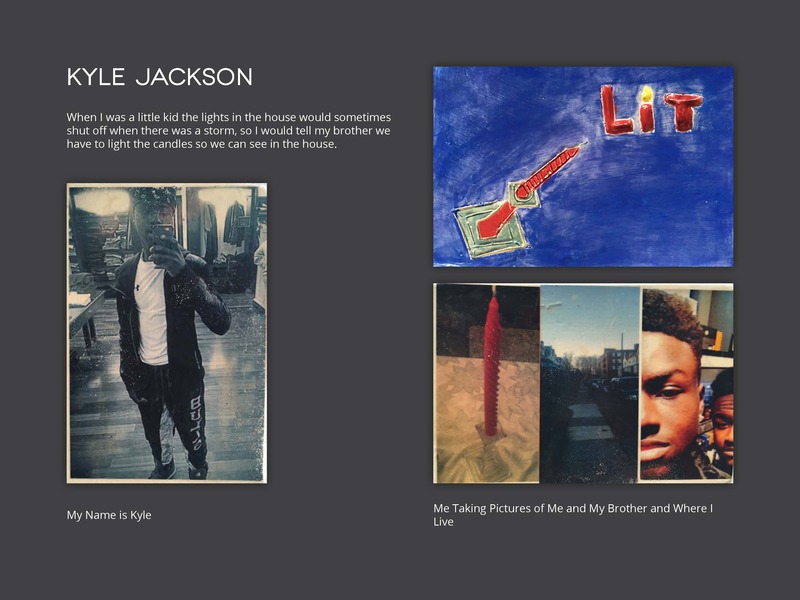 Student-artists in this gallery of work include Quamir Anderson, Tysheem Anderson, Nyree Austin, Zahir Biungs, Kareem Boswell, Kaylah Botts, De’zha Carr, Shanell Gordon, Kya Green, Suhayb Ibn-Sadiq, Steven James, Michael Jordan, Tymier Lowman, Amina Massaquoi, Ashley Monroe, Kaylah Morse, Tyreek Odom, Shameed Owens, Imir Pope, Raheem Saleem, Tymier Stafford and Norman Walker. 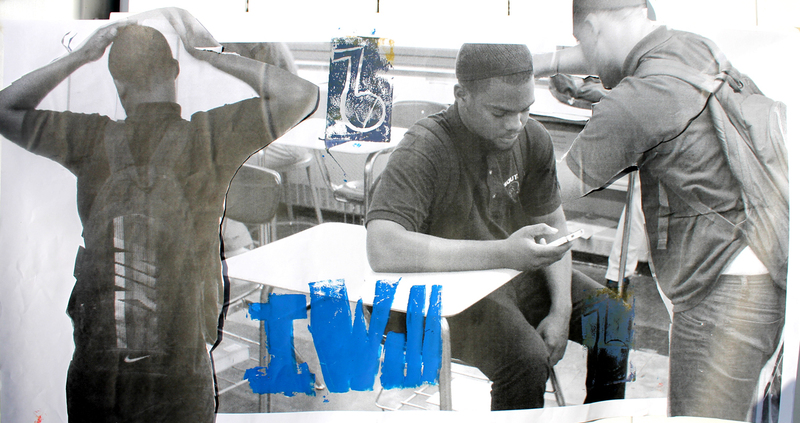 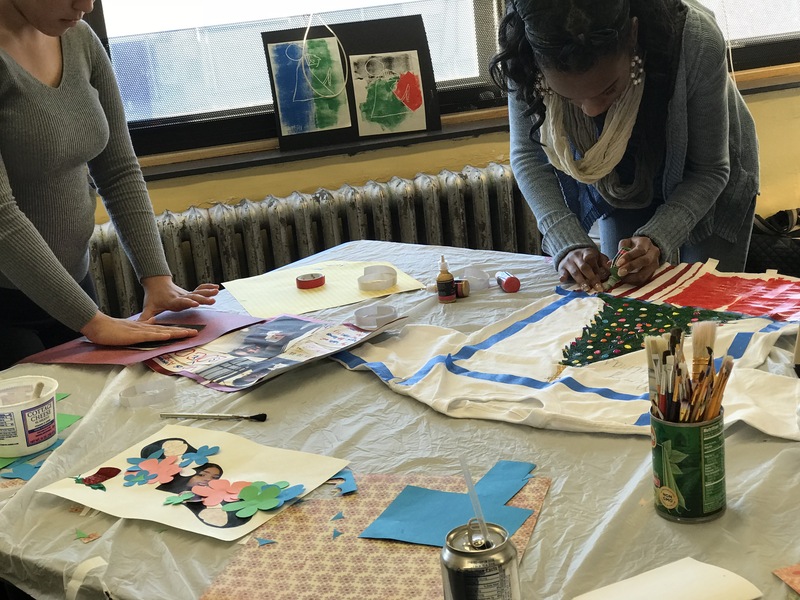 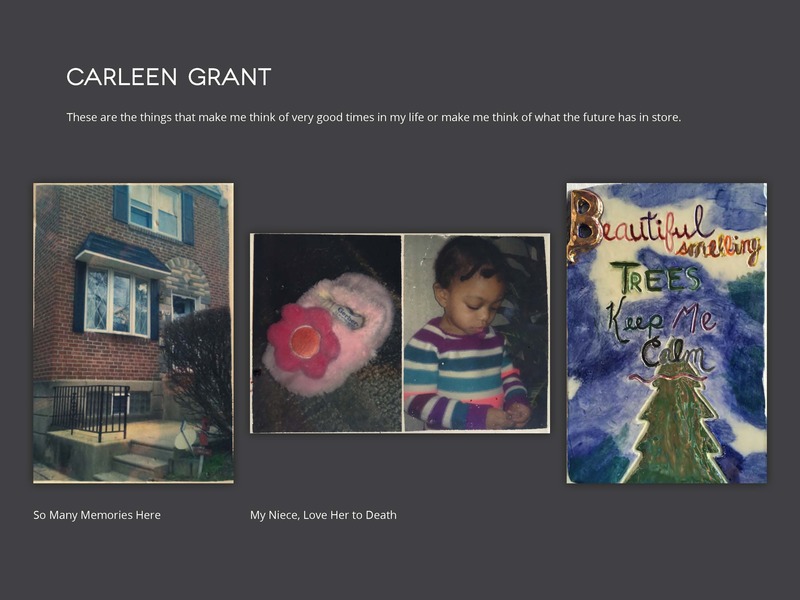 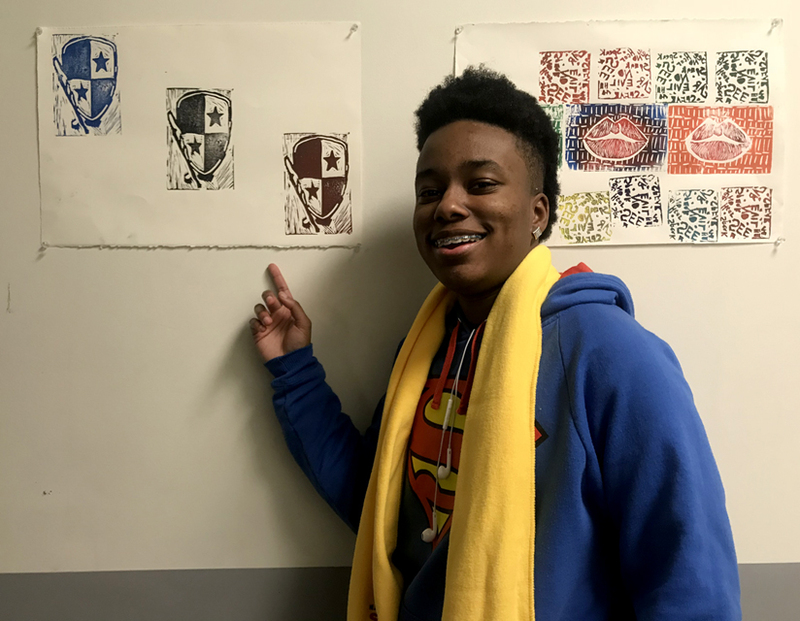 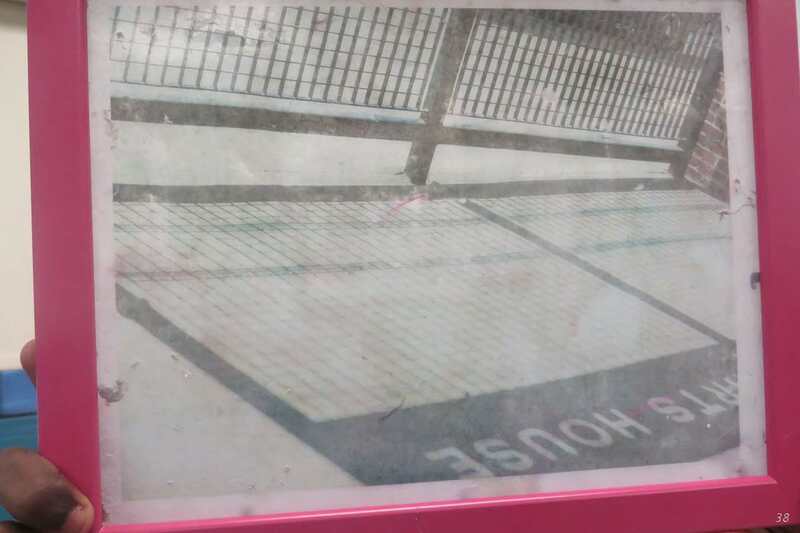 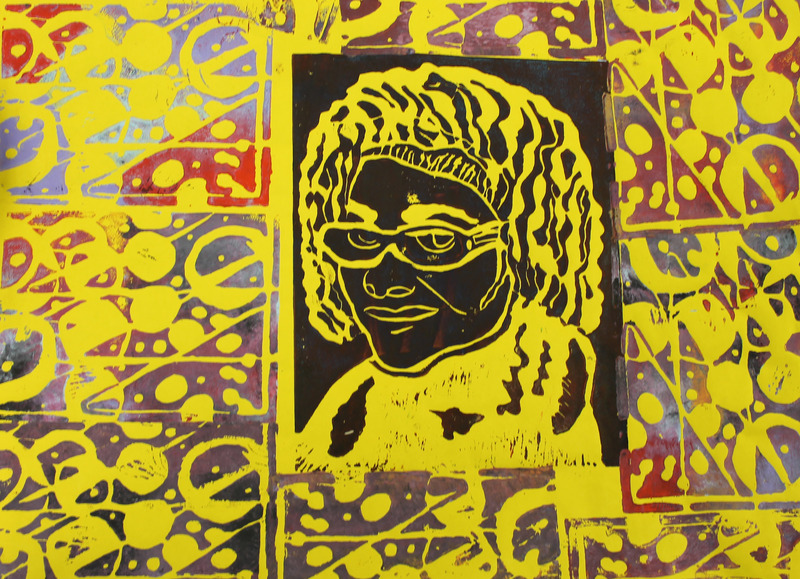 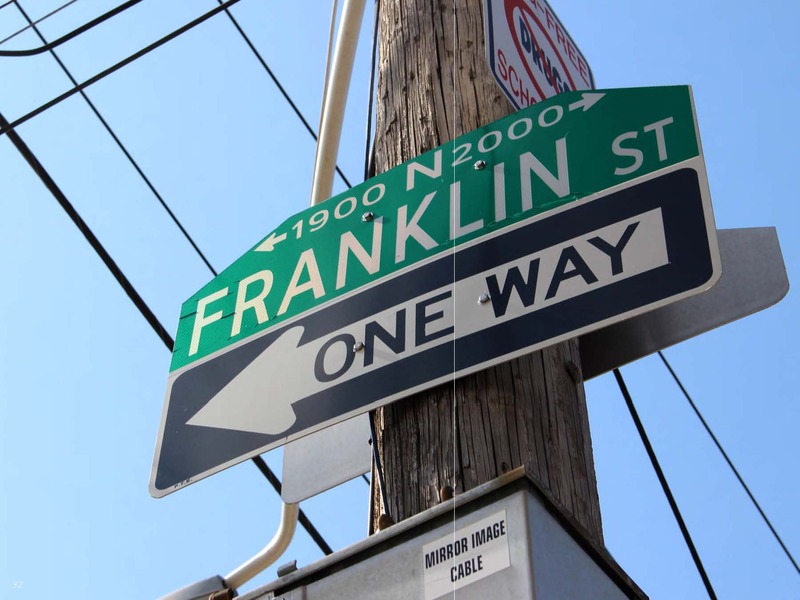 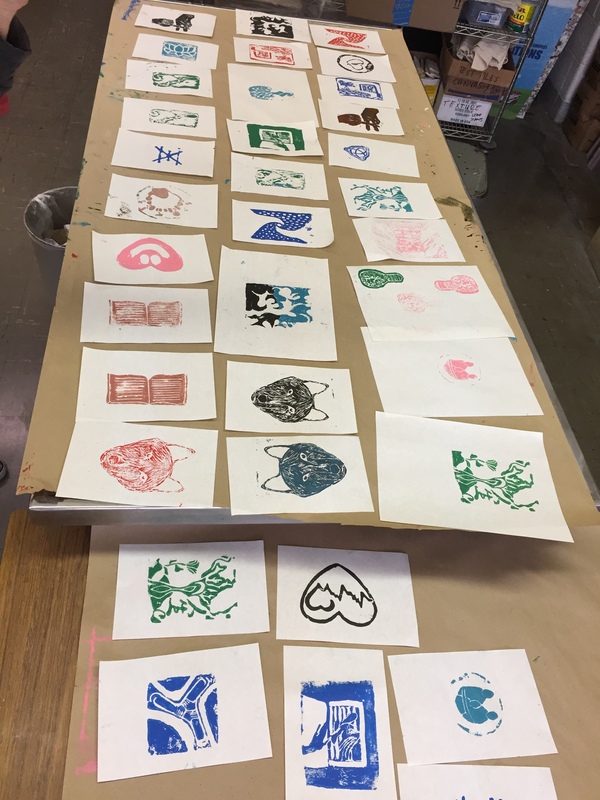 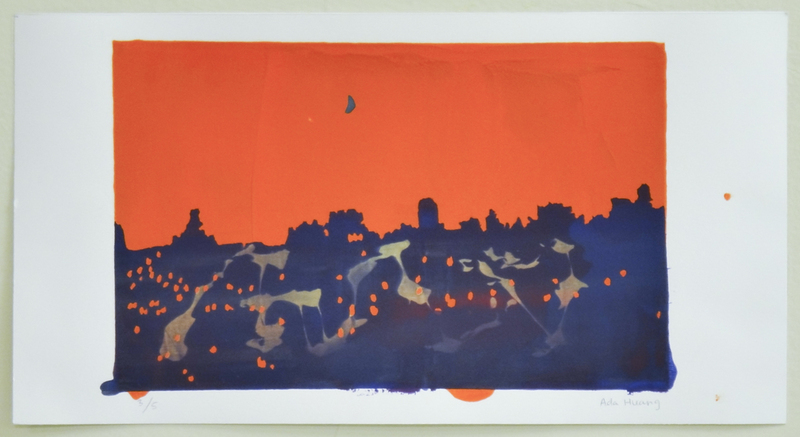 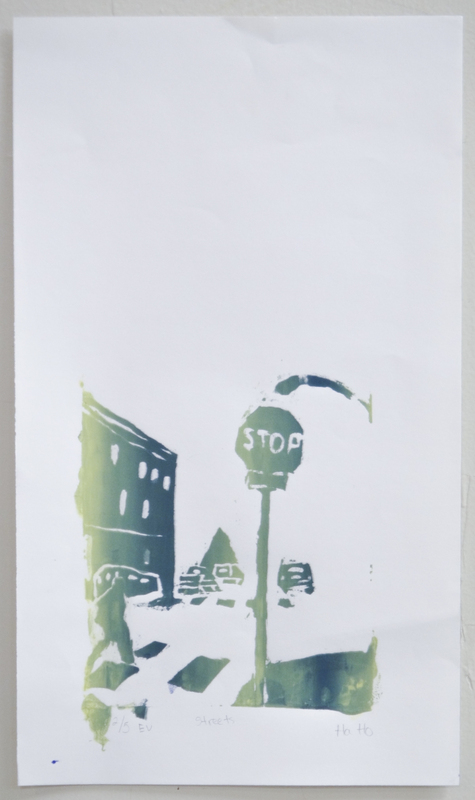 Students in Barbara Keating’s South Philadelphia High School worked with Artist Teacher Aki Torii on a screenprinting project, which documented a piece of each student’s current history. 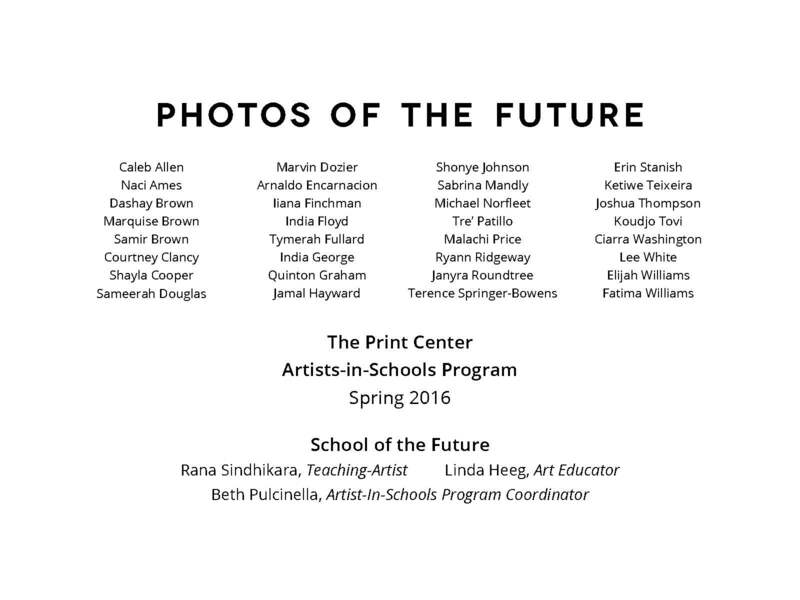 The project created a historical record of the entire class for fall 2015. 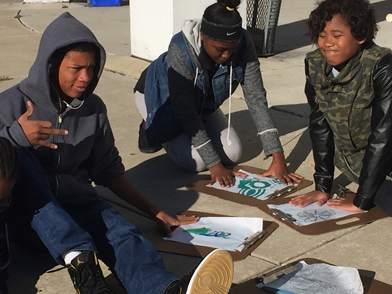 Students took inspiration from the ways that Amber Arts & Design utilized powerful visual technique to remind/retell the local history. 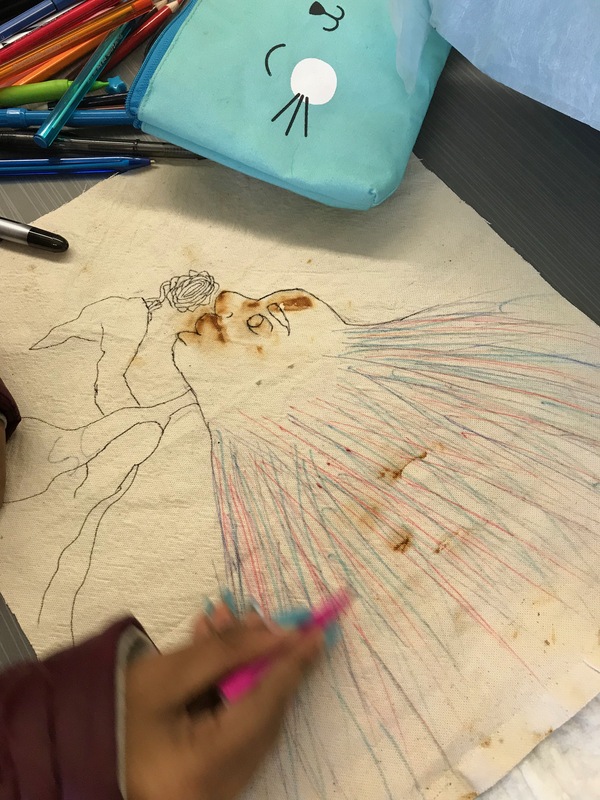 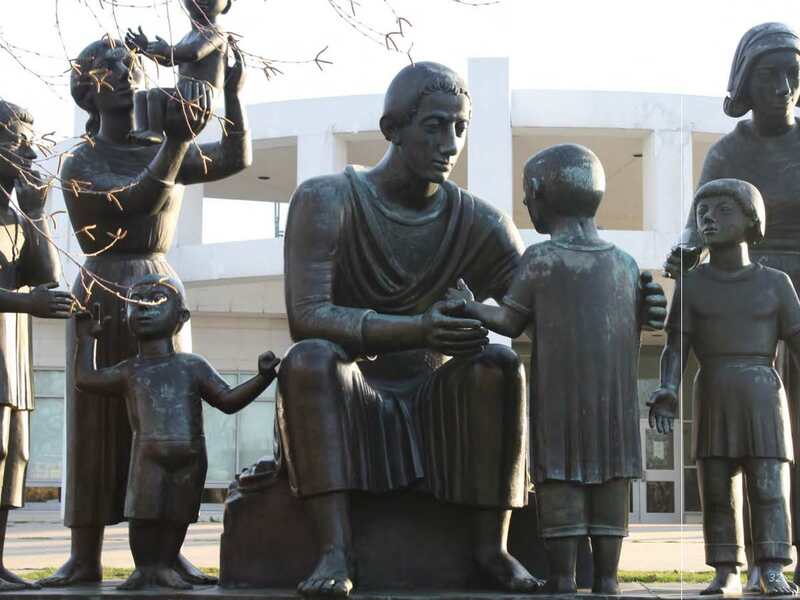 Students connected with the work and felt it reflected issues that they were currently facing. 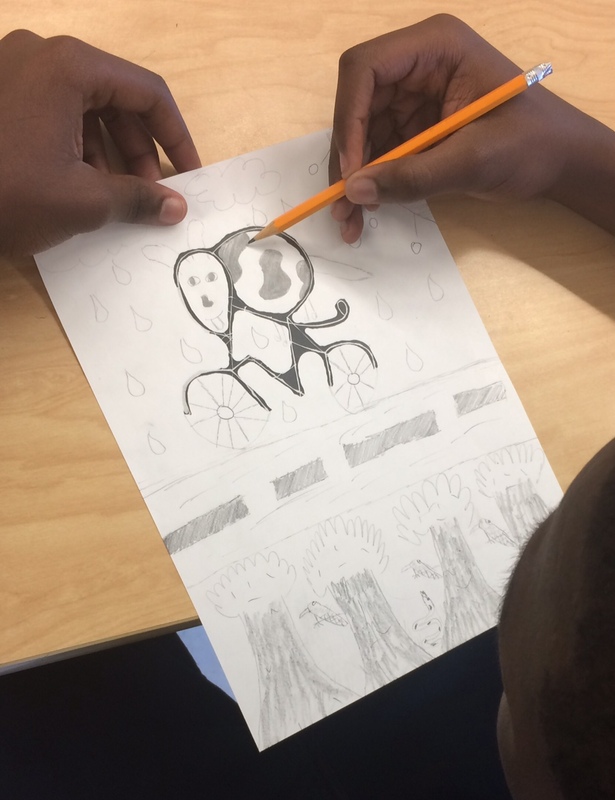 Students also spent time studying the work of Kara Walker, especially the ways she retells history to create an alternative narrative. 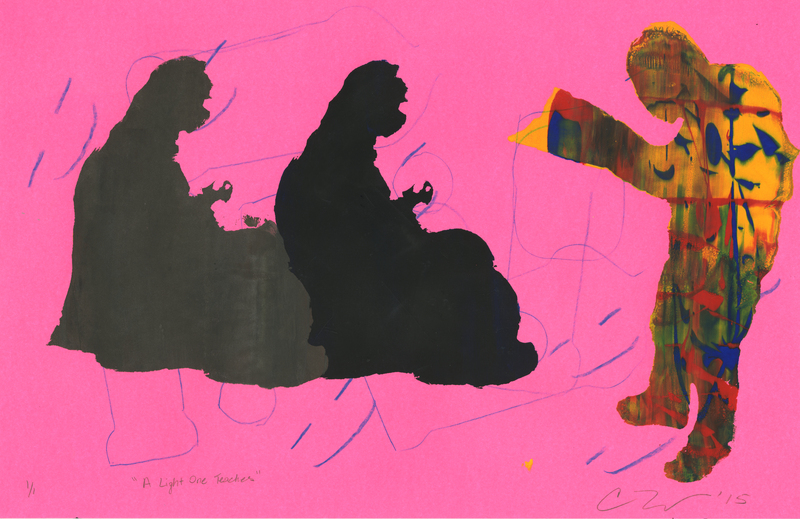 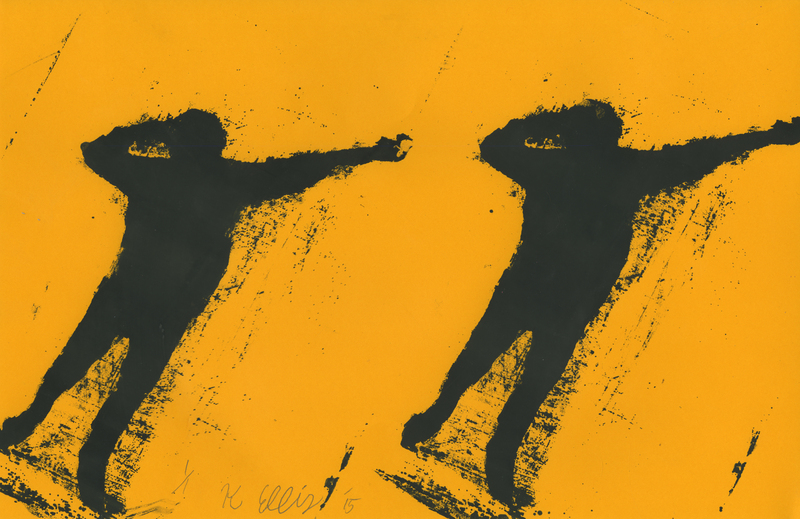 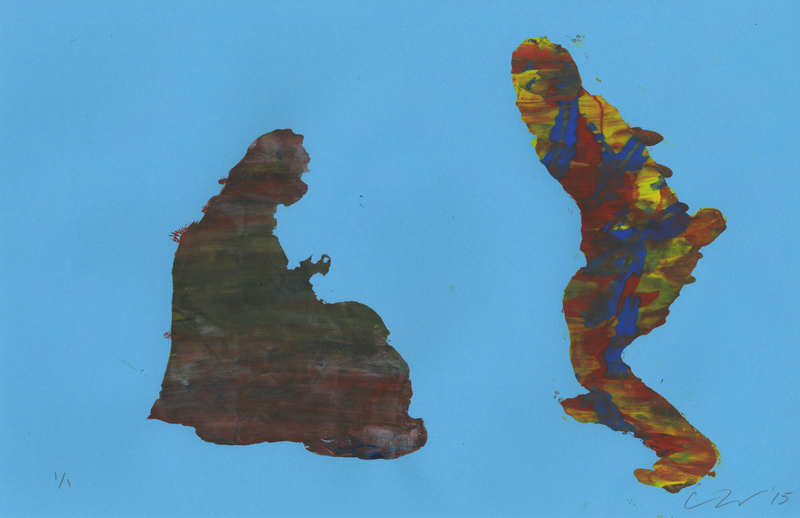 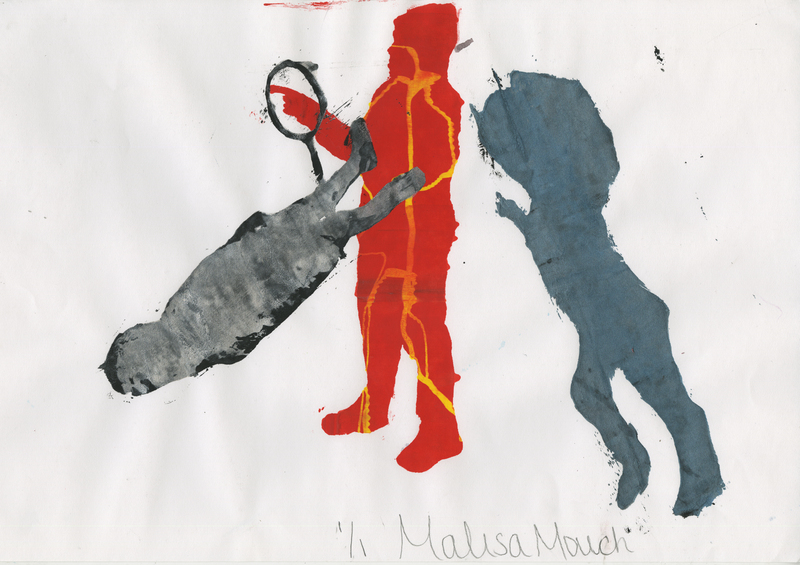 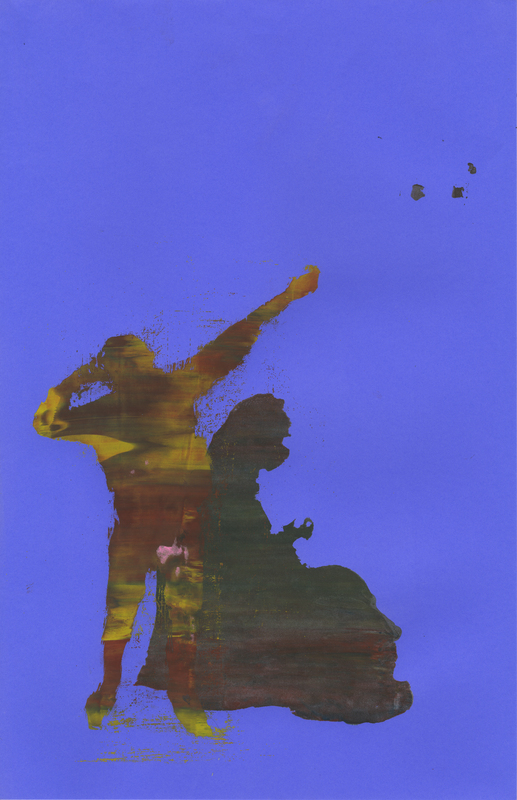 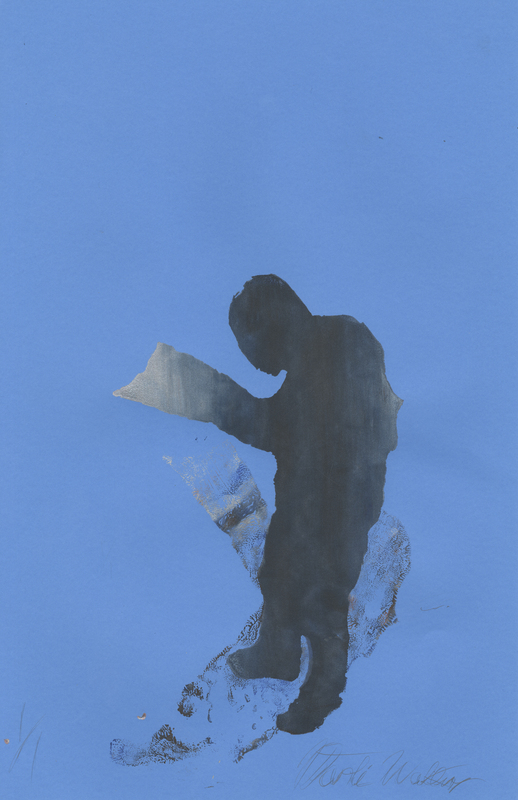 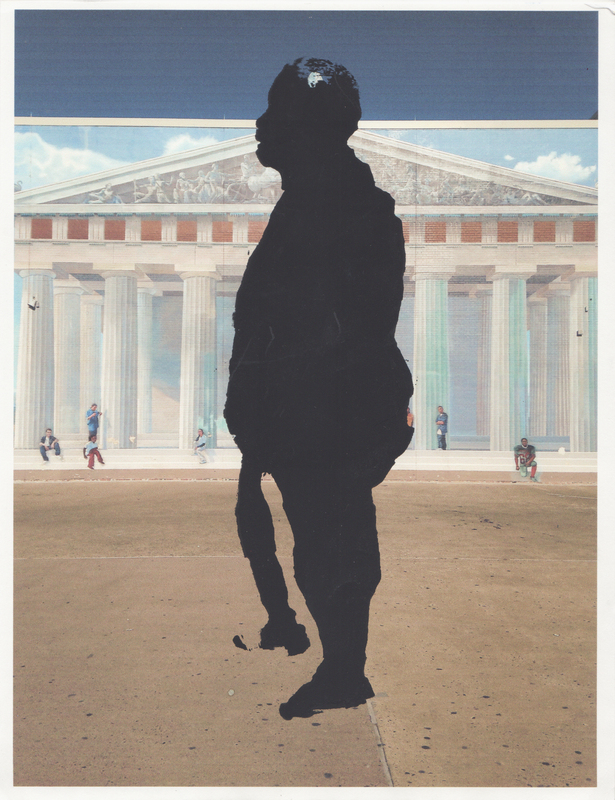 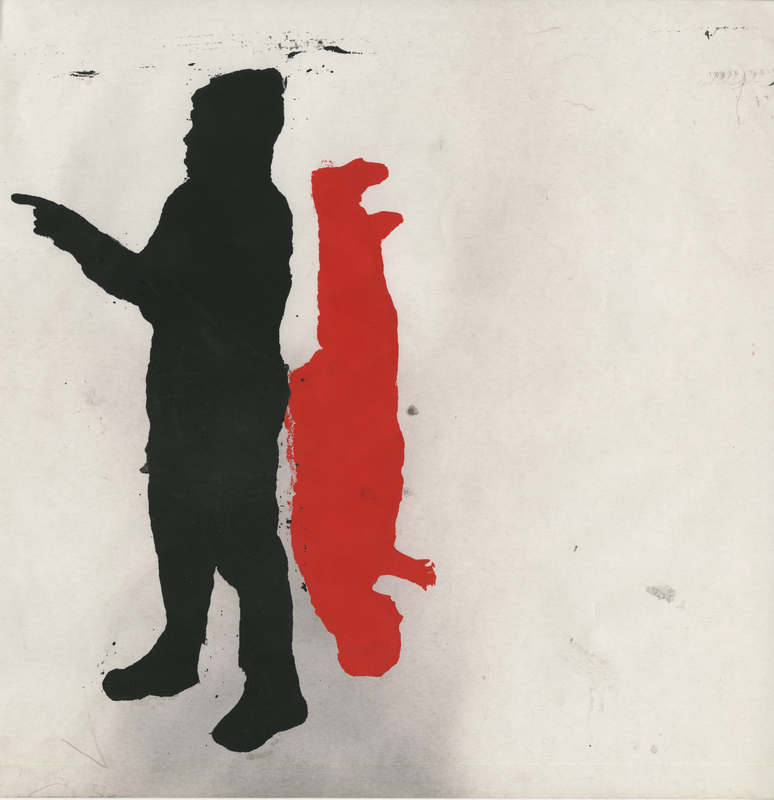 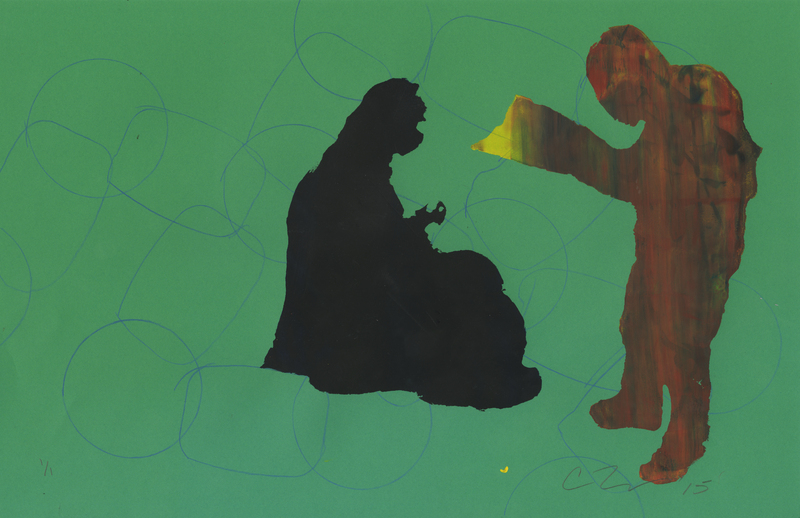 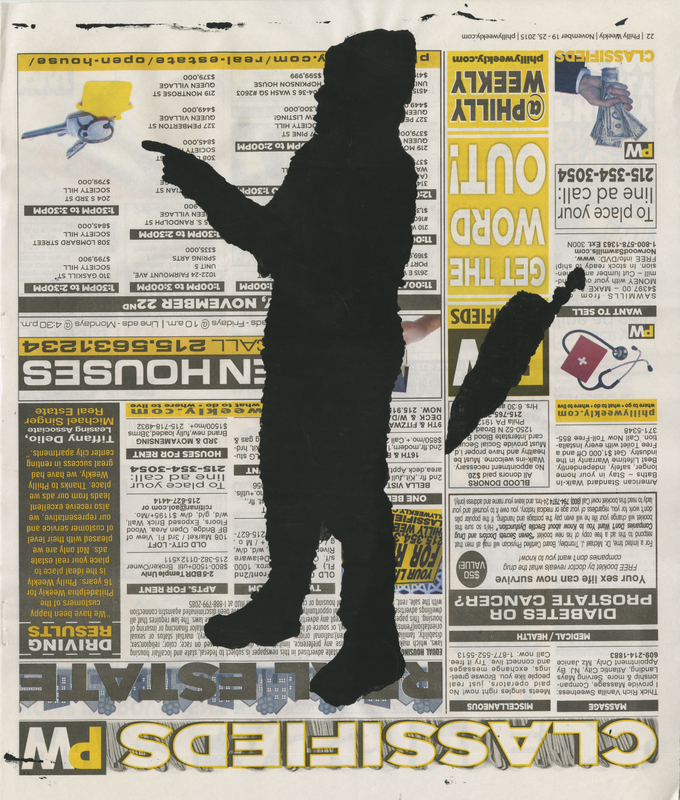 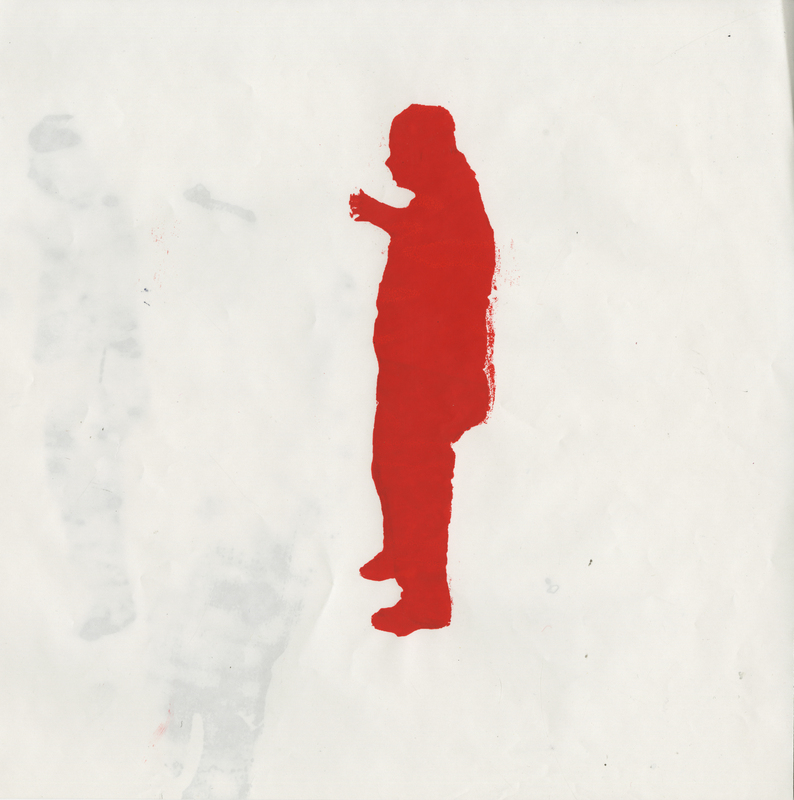 Students felt the freedom to interpret personal narrative in their own way in part because of the visual simplicity and playfulness of Walker’s silhouetted figures. 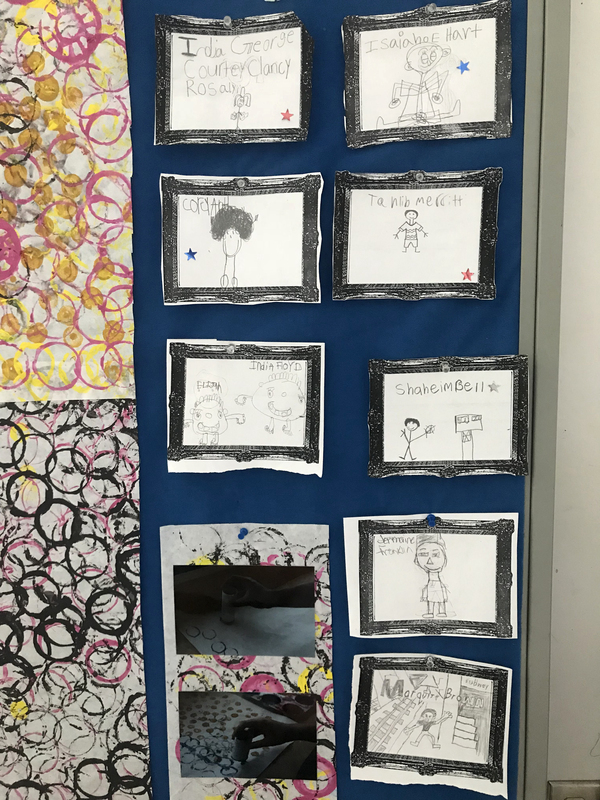 Students brainstormed ideas to choose a pose that represented each student, such as a daily activity or personality trait. 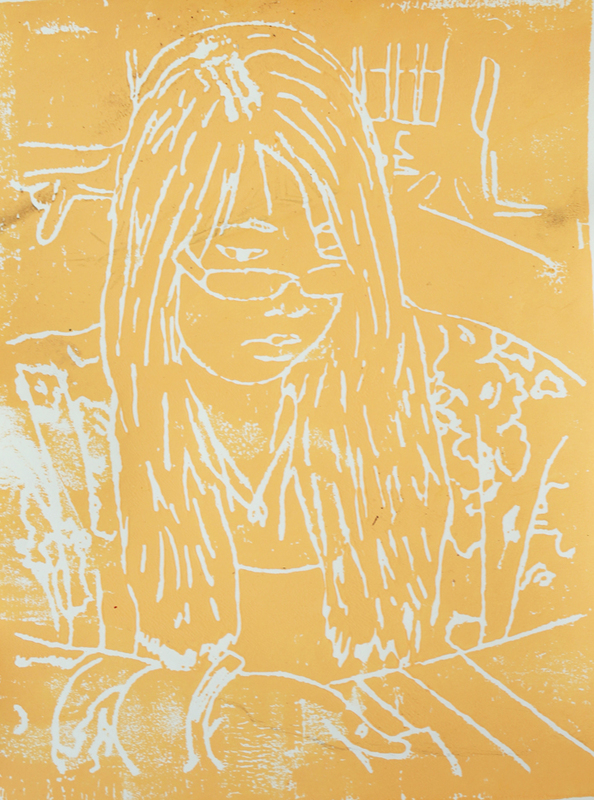 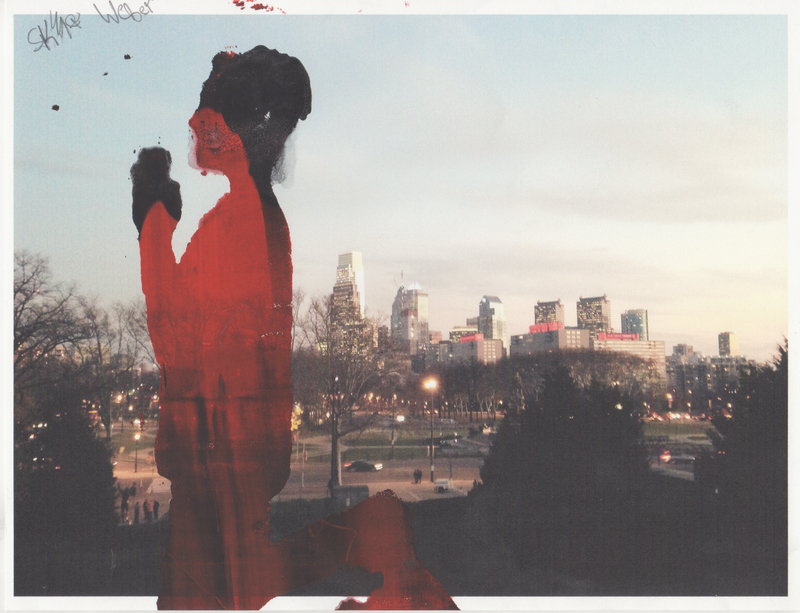 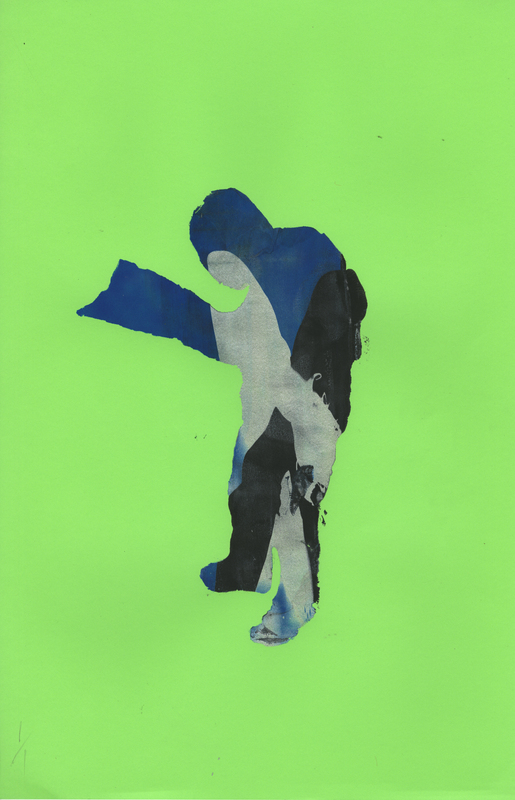 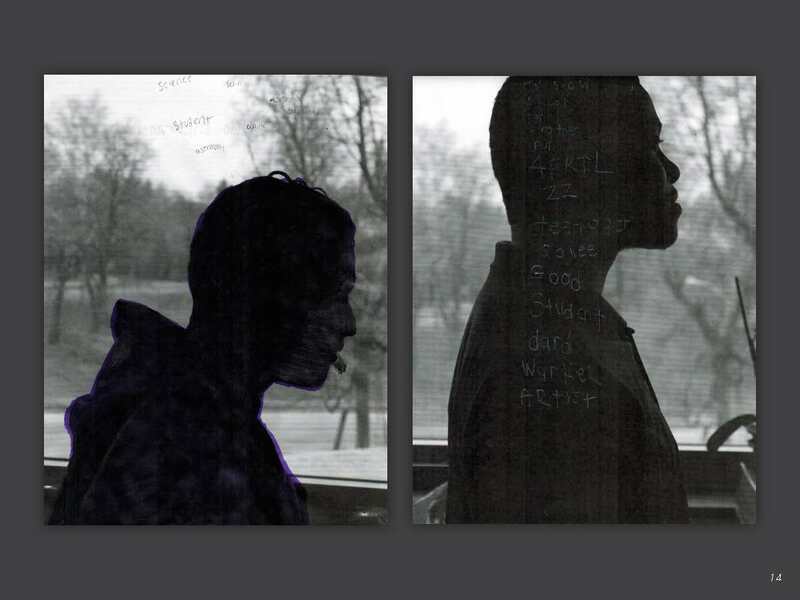 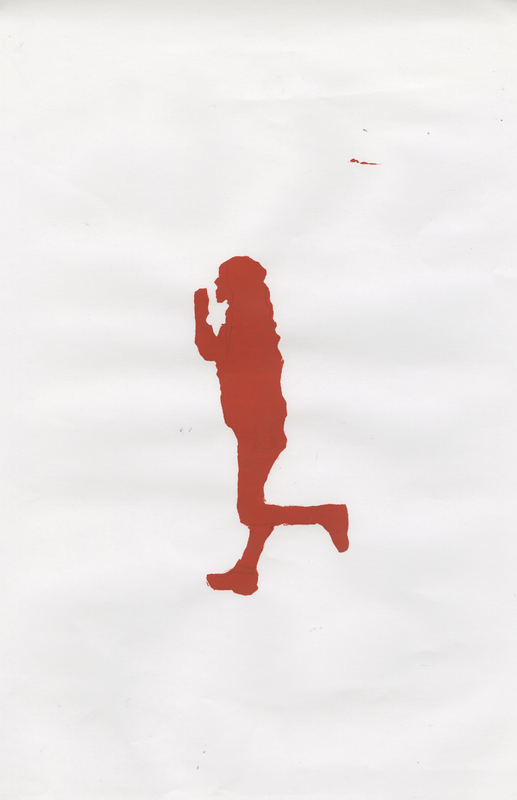 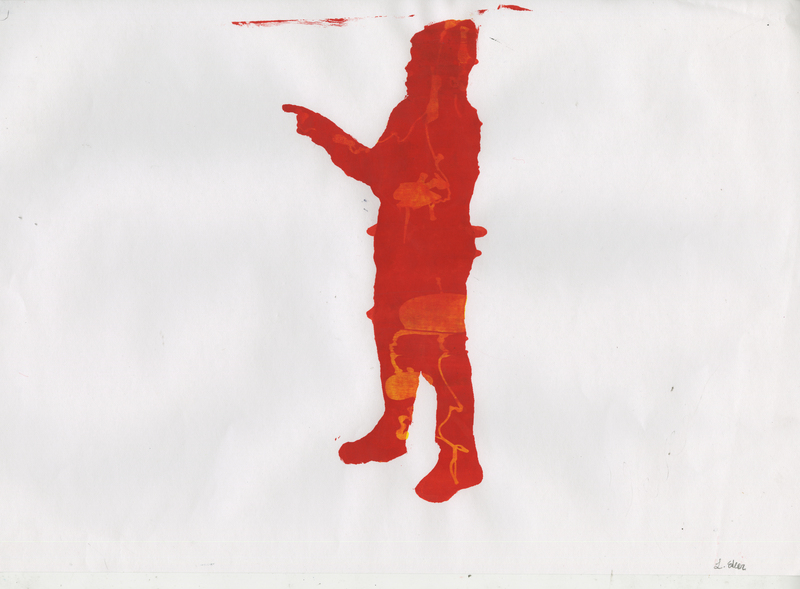 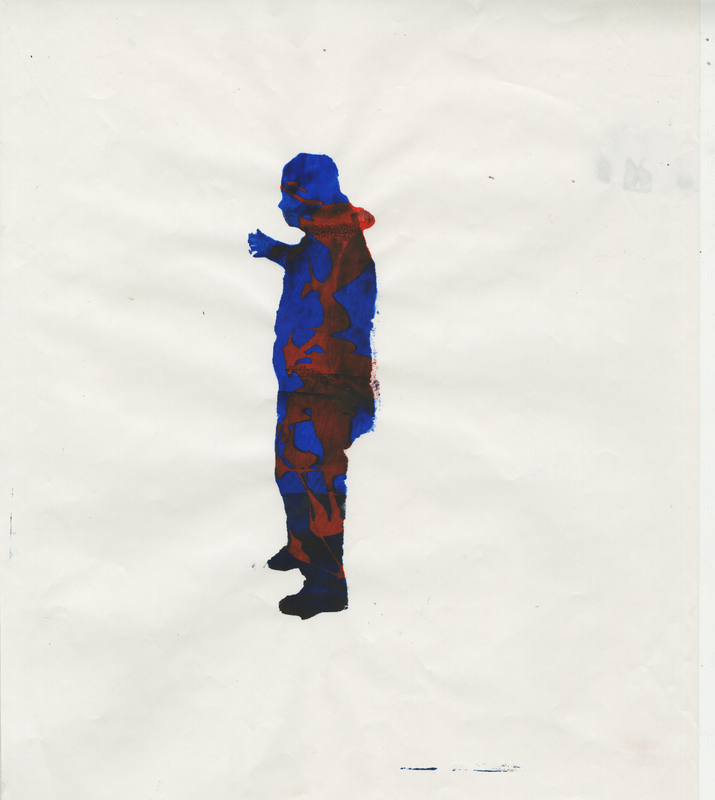 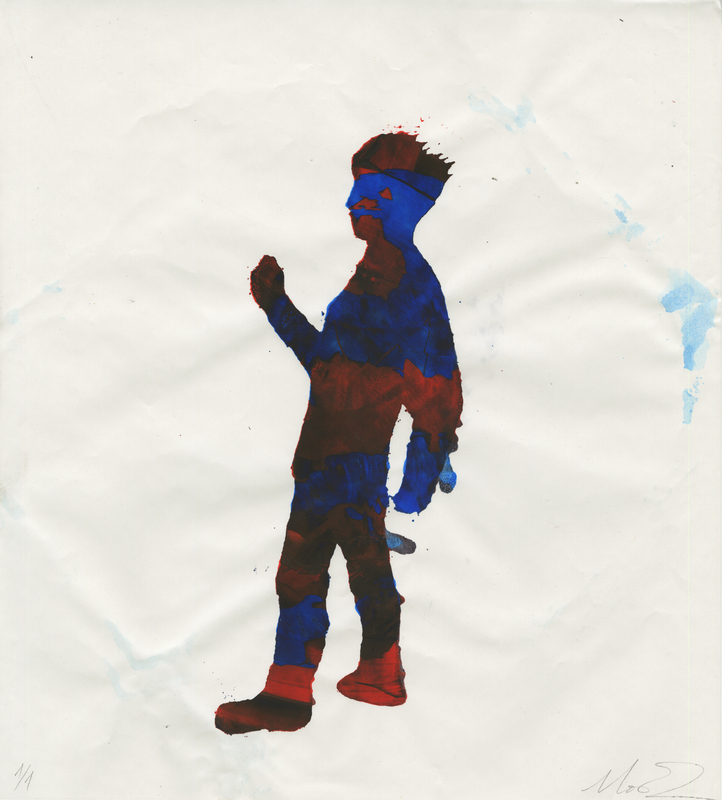 From there, students created their own printing screens utilizing their silhouetted pose. 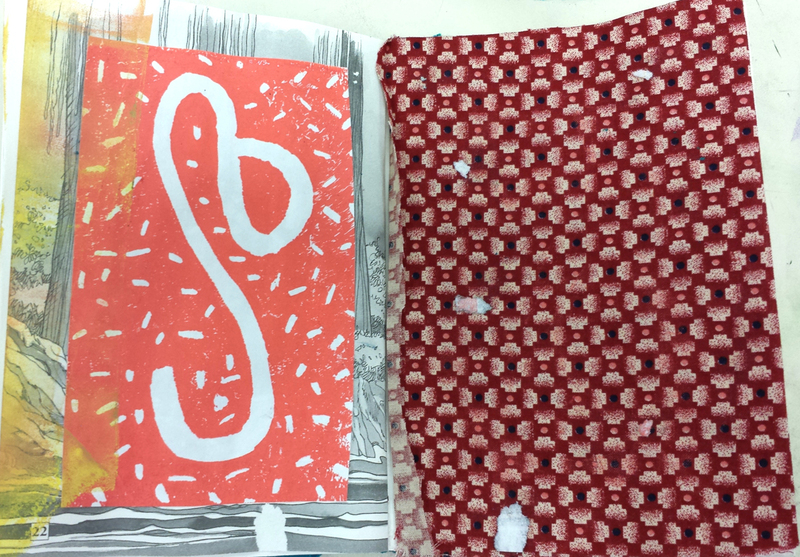 The project provided an opportunity for students to develop print skills, experiment, collaborate and explore by making their own work. 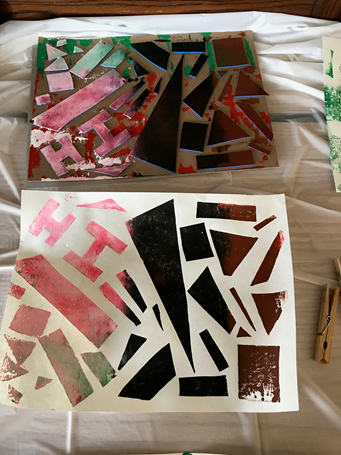 The group played with the flexibility of screenprinting to create multiples, to print in different colors, try different surfaces and to make work that combined images from each other’s screens. 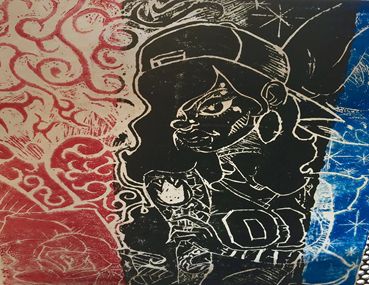 Student-artists in this gallery of work include Jamikee Allen, Hoang Dam, Levar Edler, Kevin Ellis, Dominique Gray, Malisa Mouch, Brianna Virgilio, Dante Walters, Skyler Weber and Camille White. 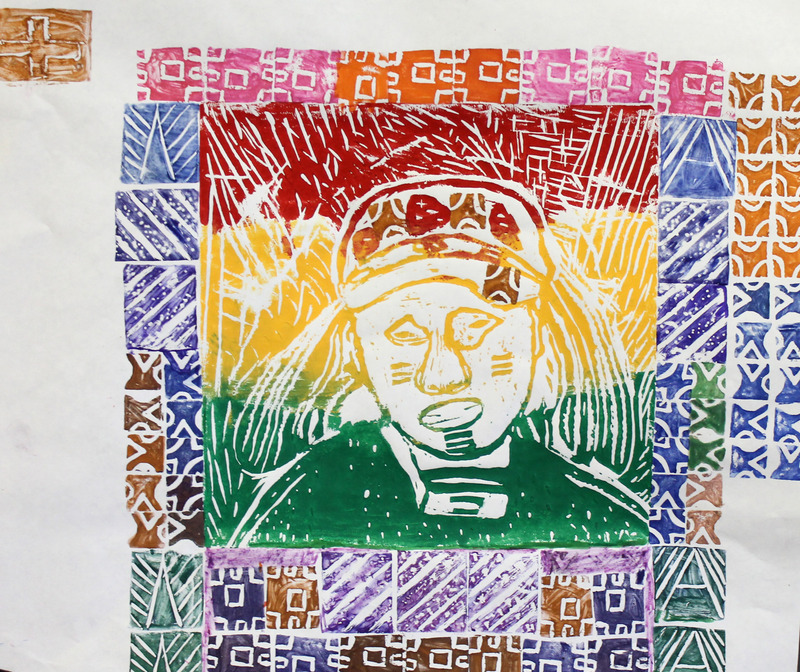 Josh Kleiman’s class of 9th grade students at The U School in North Philadelphia worked with Artist Teacher Beth Pulcinella to create three-color reductive block prints based on the theme “art inspired by history.” After looking at work by artists who explored this theme from various perspectives, each student was asked to decide how they wanted to respond to the theme. 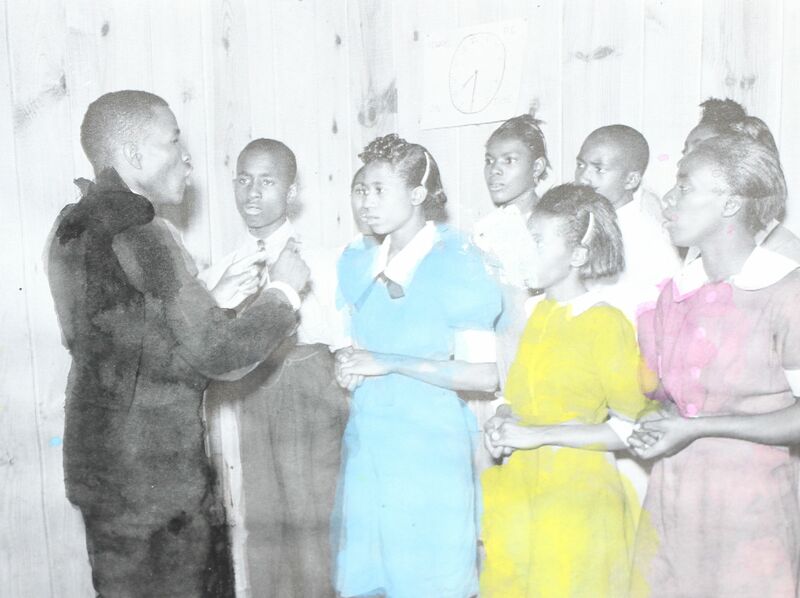 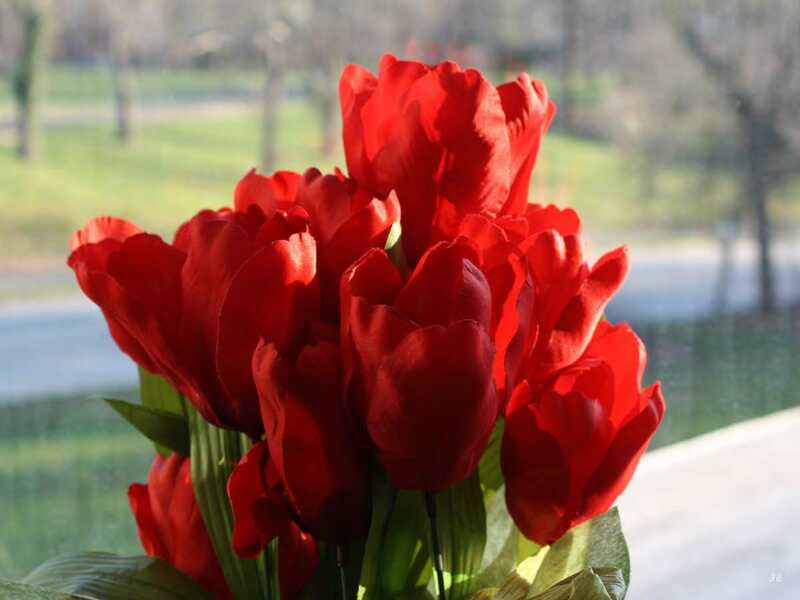 The various approaches reflected the diverse relationships individuals have to history. 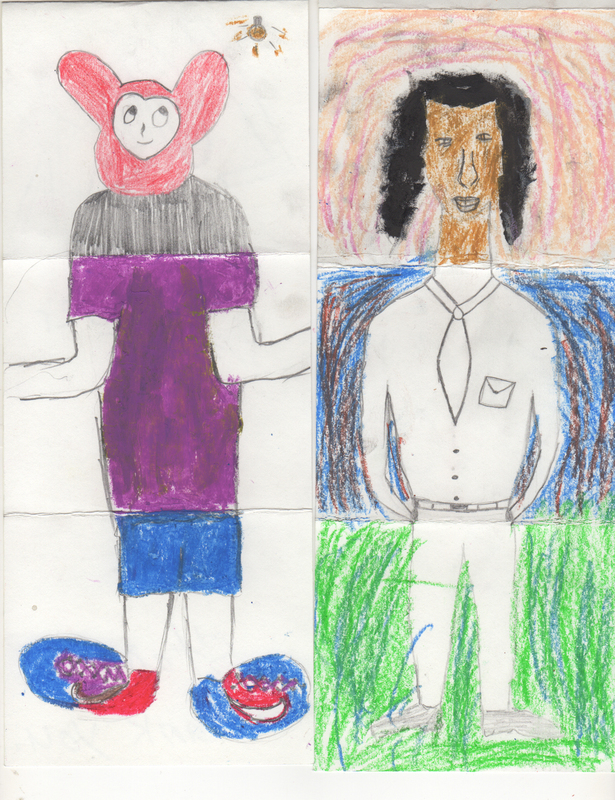 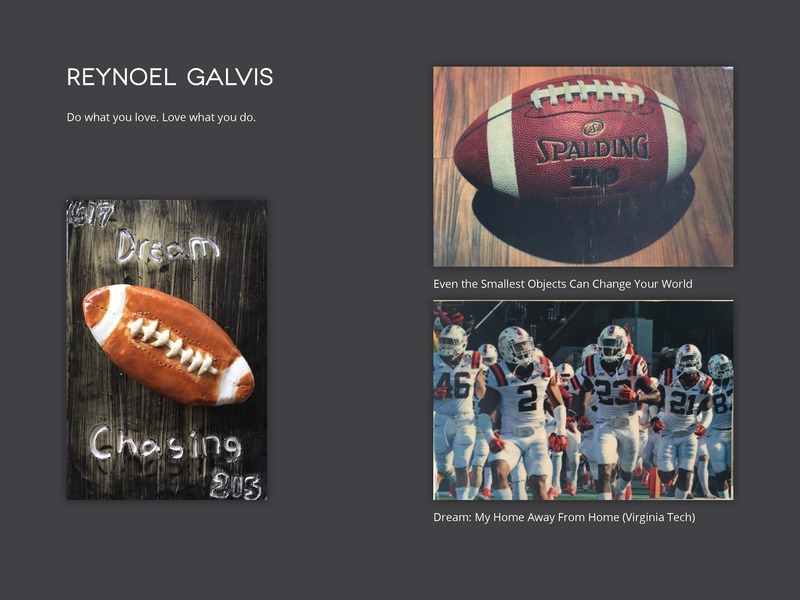 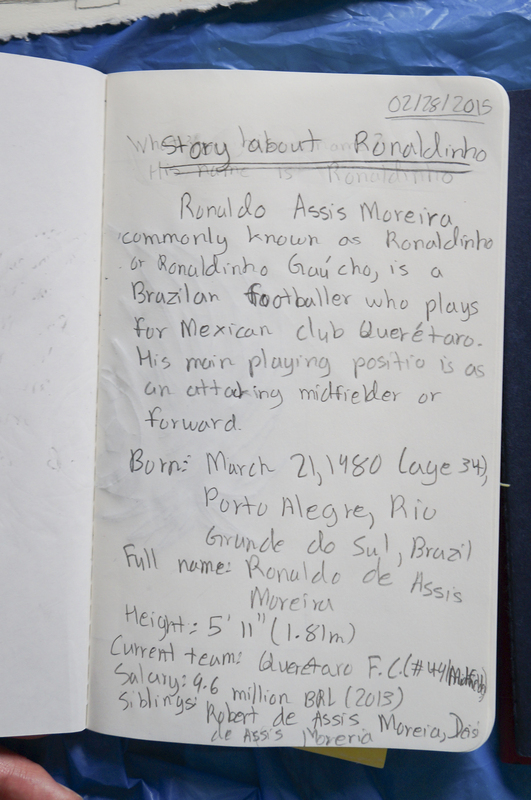 One student chose the history of an online avatar, another the history of a sport they felt passionate about, while others chose the history of a personal dream, a significant moment, or a memory from childhood. 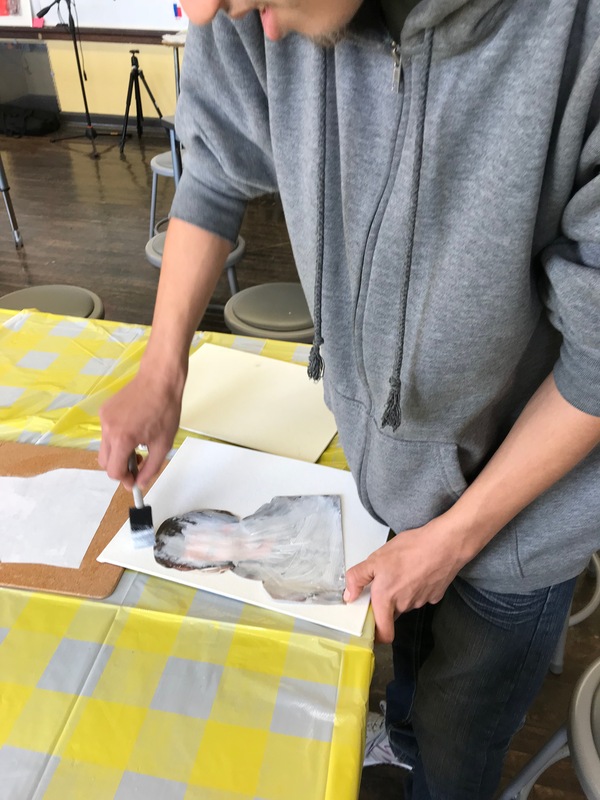 The group decided to make a class print portfolio and explored the ways a collection of images from multiple artists can come together to tell a specific story. 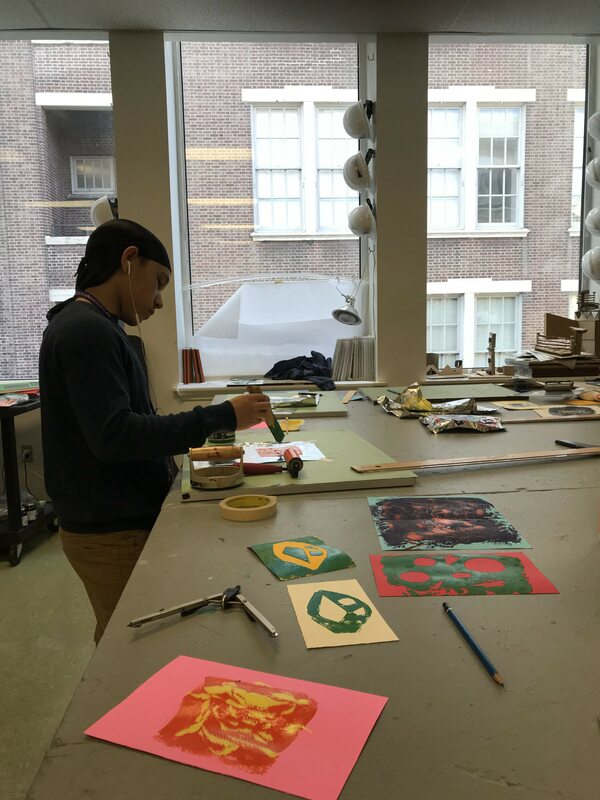 Students developed original compositions, enlarged their images, conducted color studies and color separating, transferred images to 8” x 10” blocks and then tackled the complex process of planning and printing a reduction print. 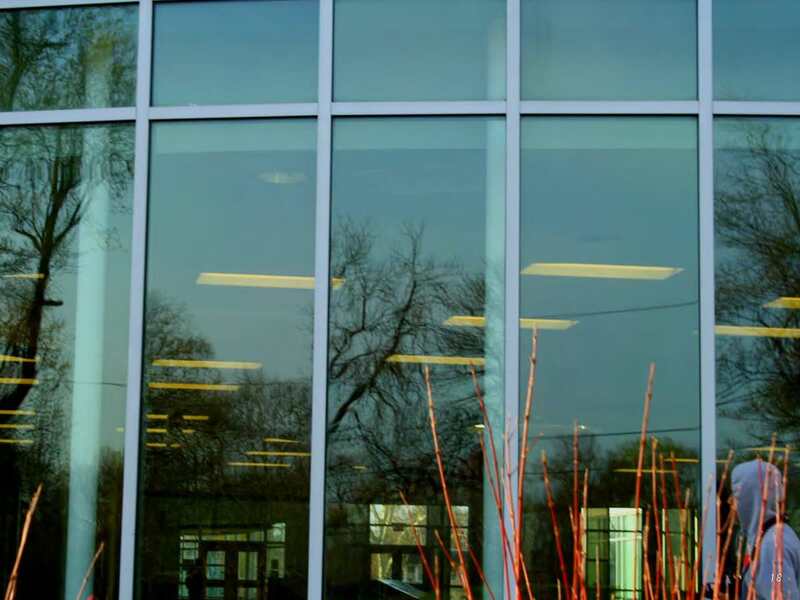 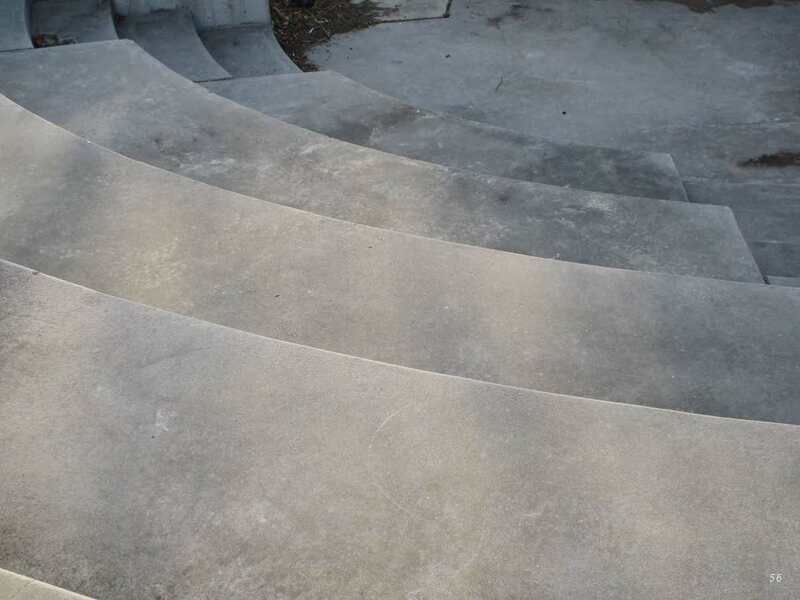 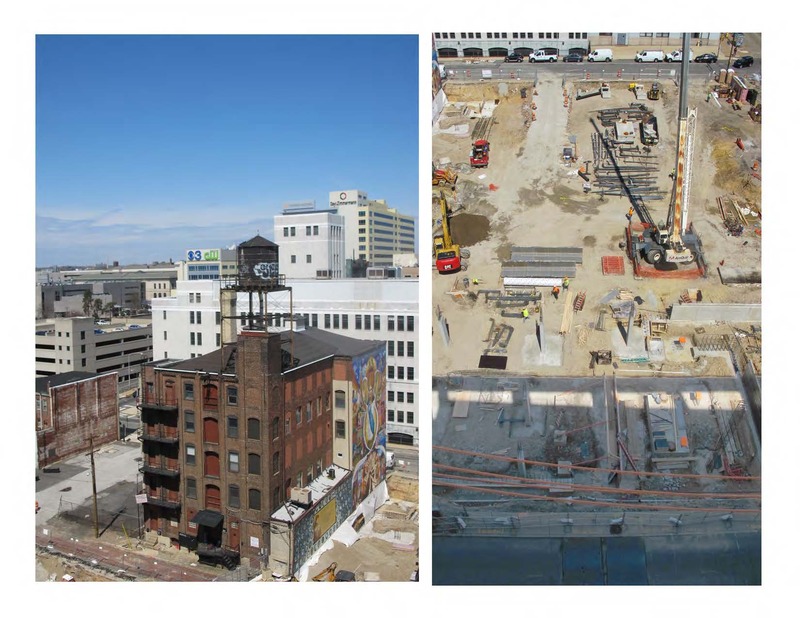 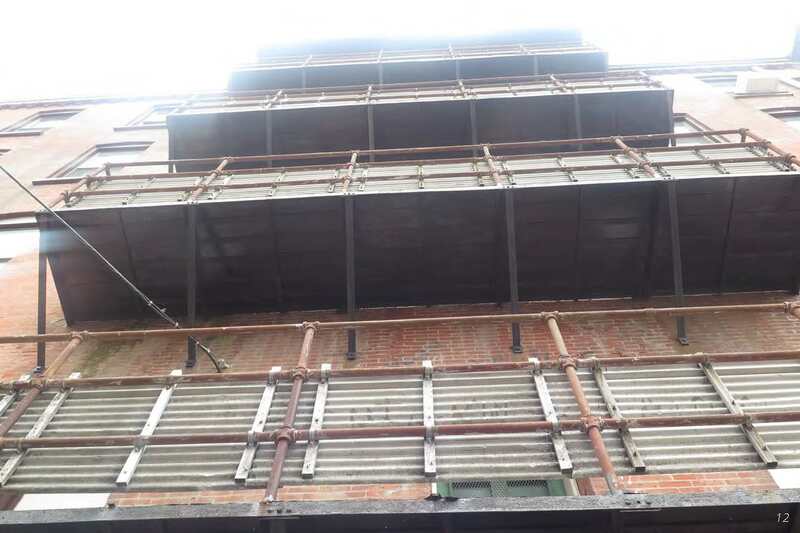 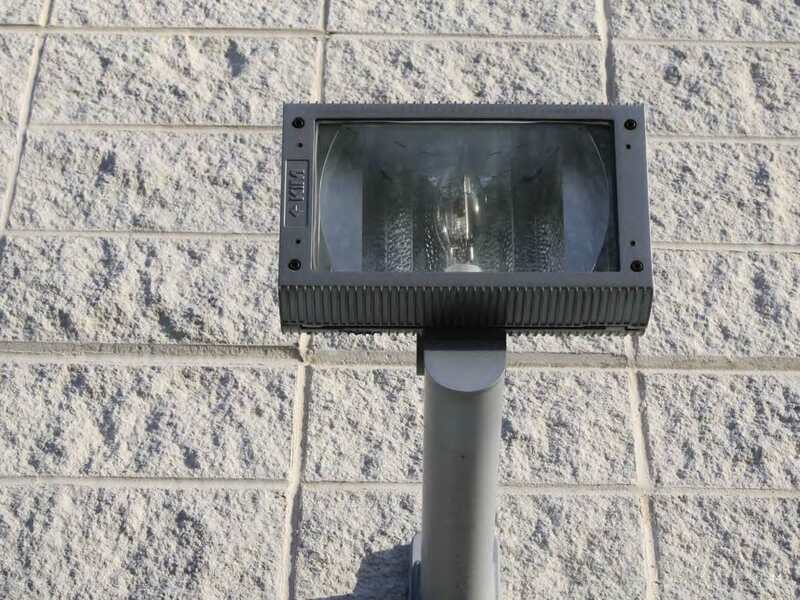 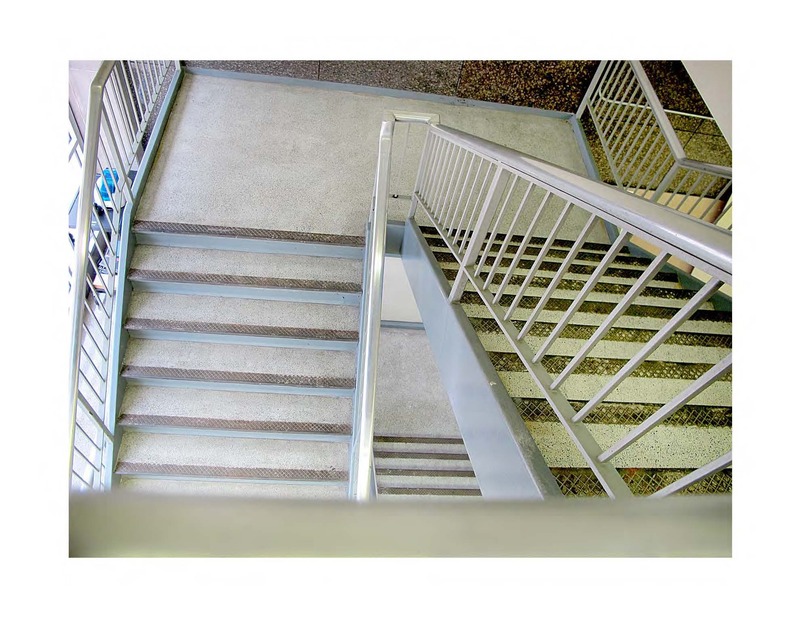 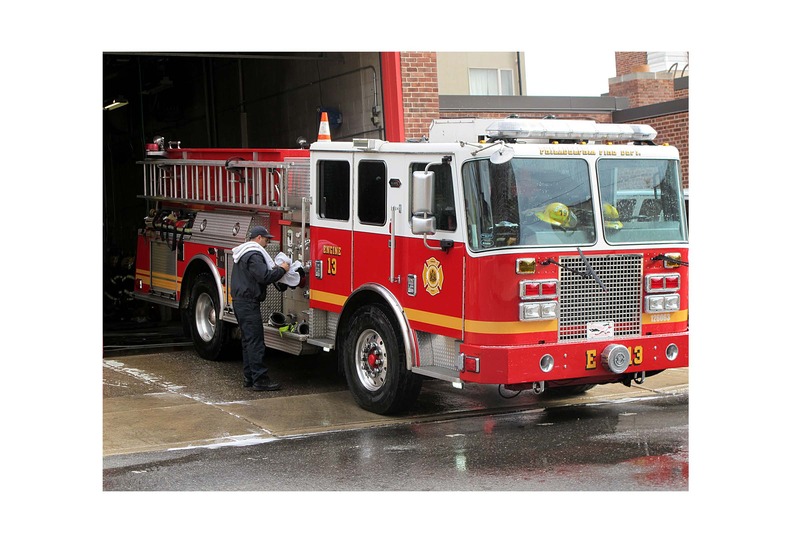 The project provided both conceptual and technical challenges. 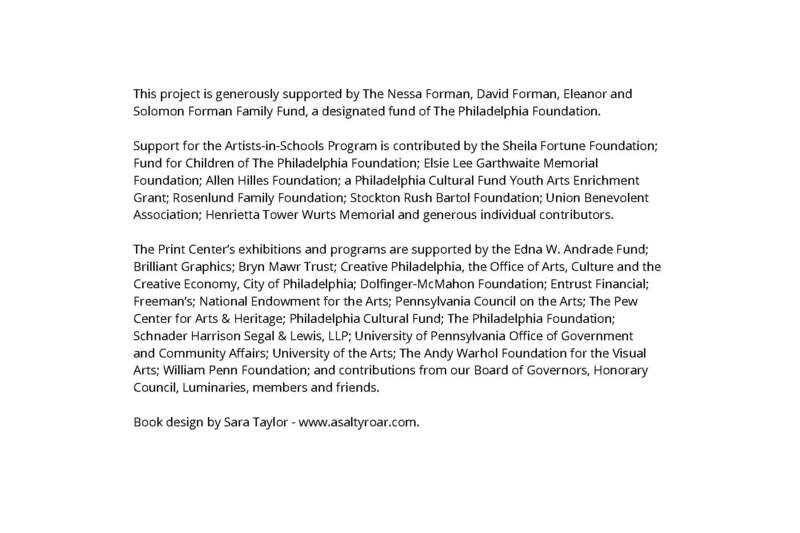 Together the final portfolio is a revealing portrait of the group and becomes its own historical document. 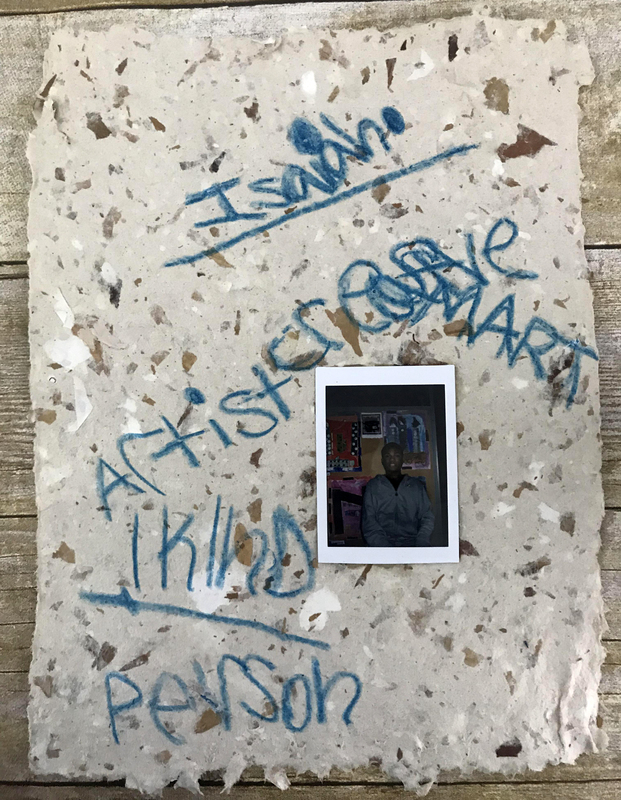 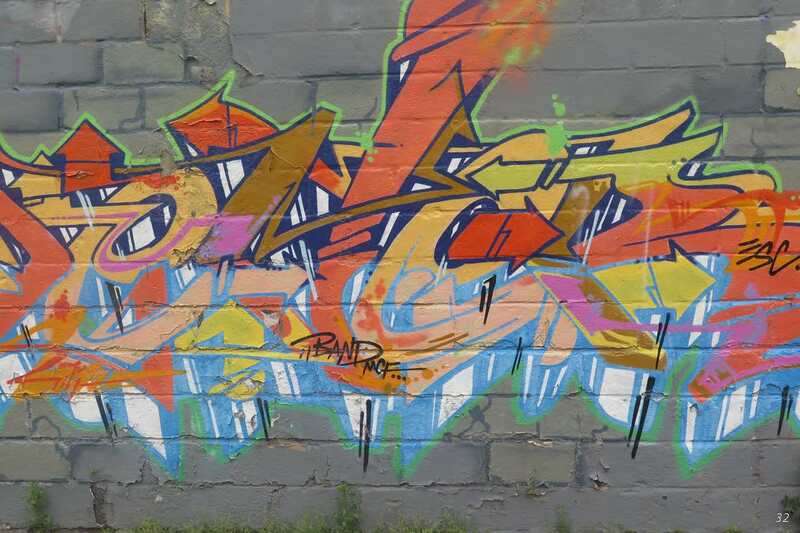 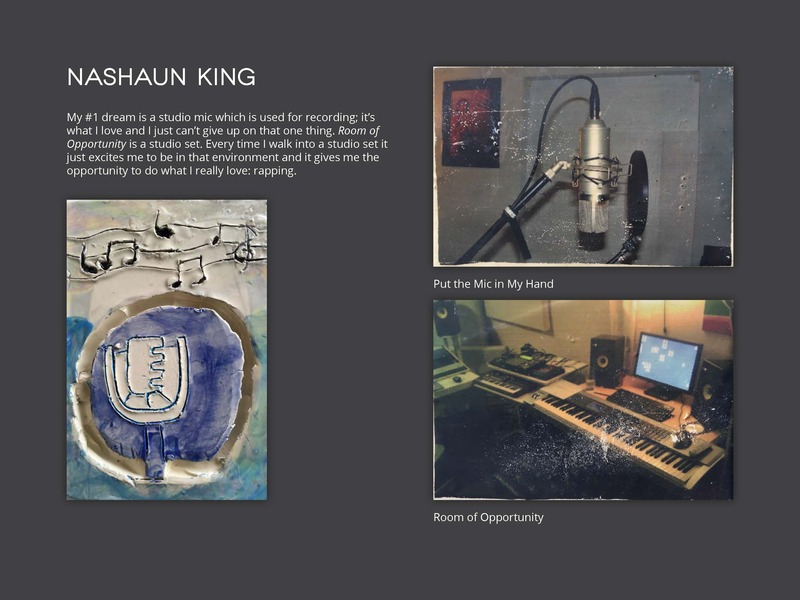 Student-artists in this gallery of work include David Acevedo, Willie Edwards, Soloman Gay, Jahyir Green, Samira Guzman, Quenshawn Jones, Laya Purnell, Kristopher Summers, Nakia Whitener, Omar Williams and Jahmir Wylie. 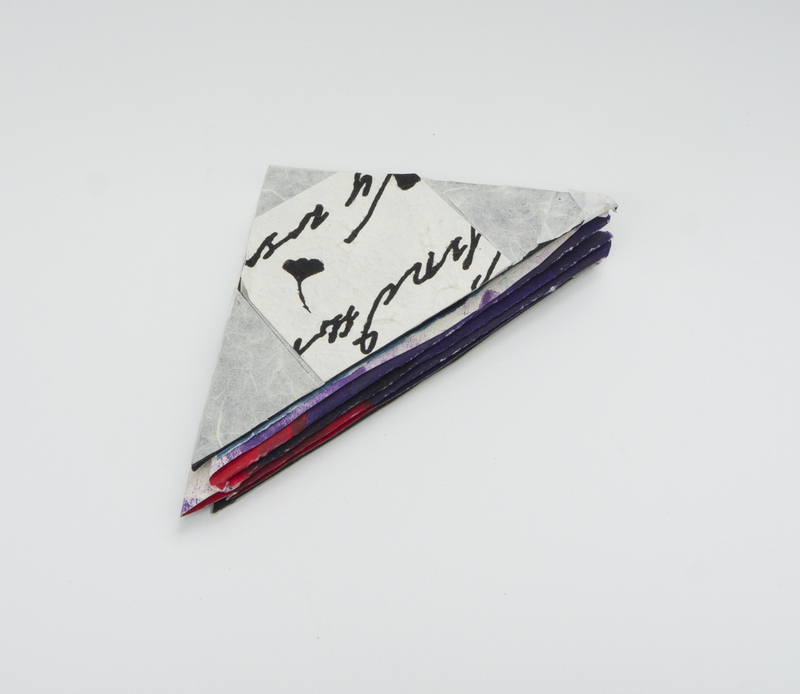 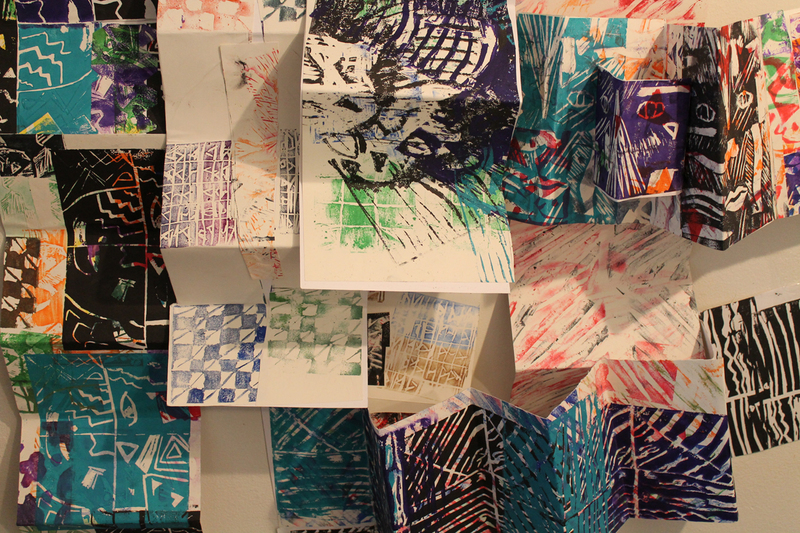 The spring 2015 Activation: Research, Information and Play curriculum responded to The Print Center’s spring 2015 exhibition, Denise Bookwalter: The Knitter’s Hand and the Telegrapher’s Fist and addressed forms and concepts of research such as art making, book arts, 2D to 3D, collaboration and exploration in contemporary art through the use of printmaking, photography, archive, observation and sculpture. 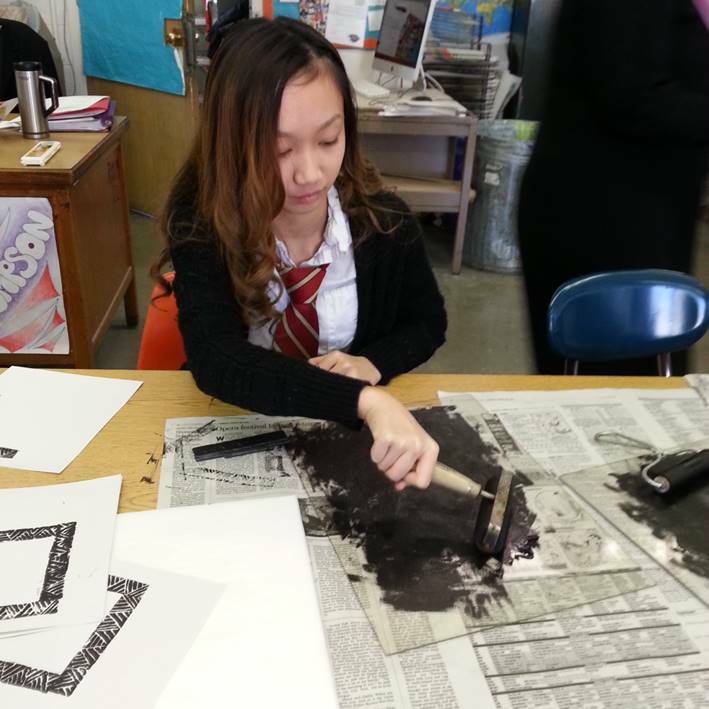 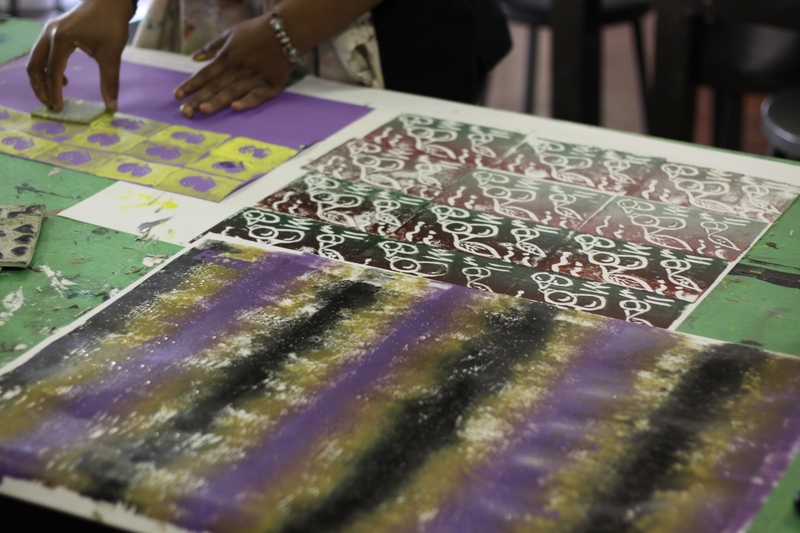 Daydream Books was the curriculum title for students at Kensington Health Sciences Academy, who made block prints utilizing found books. 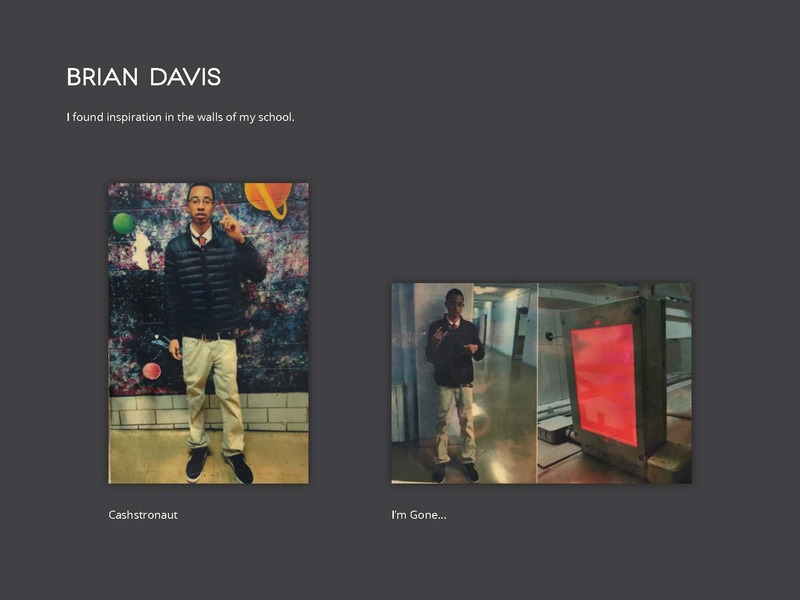 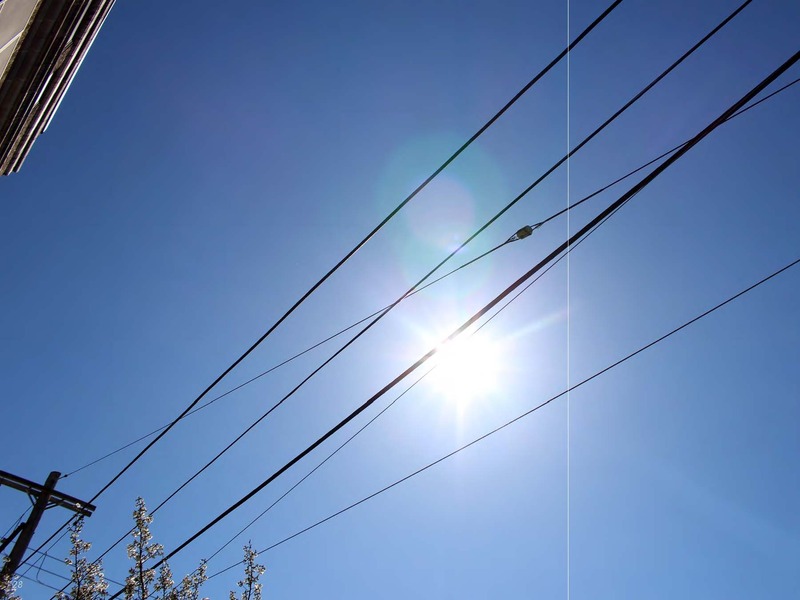 Using the Google “Image Search” function, students explored the randomness of imagery connected to their interests. 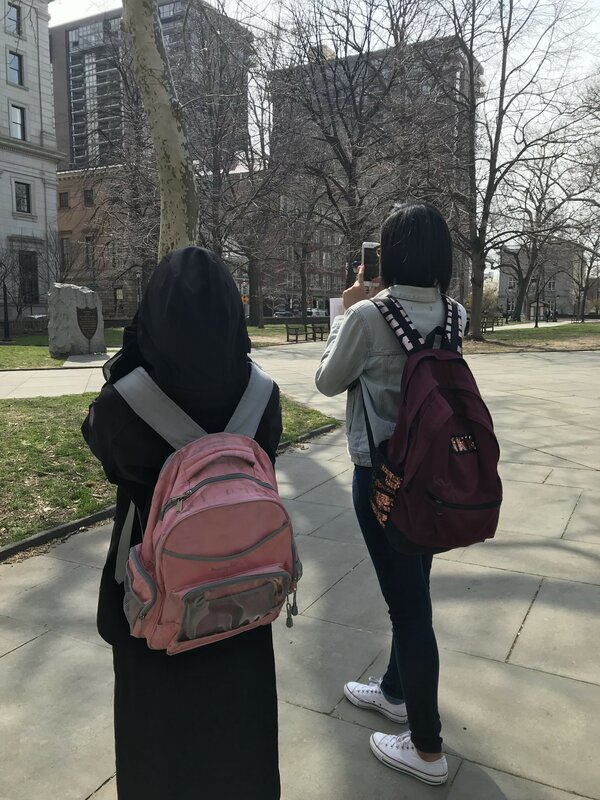 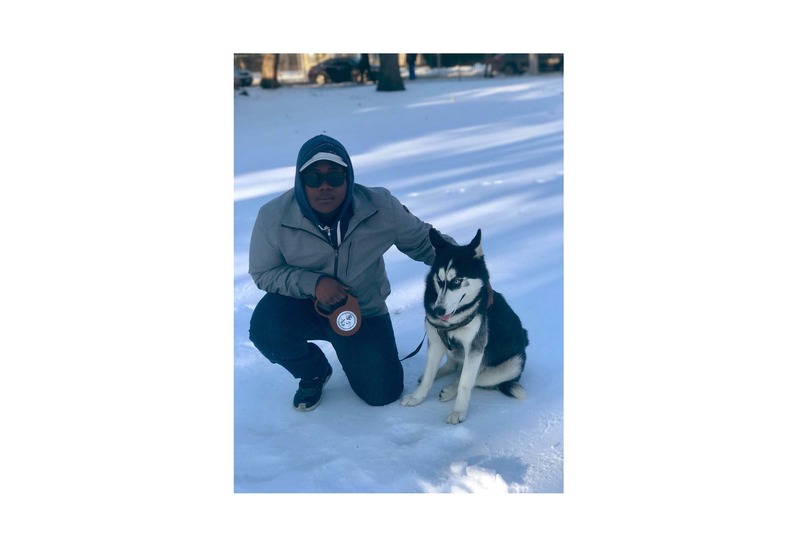 At the beginning stages of the semester, students both conducted research and allowed themselves to “get sidetracked” by the inundation of information they experience with the internet in their everyday lives. 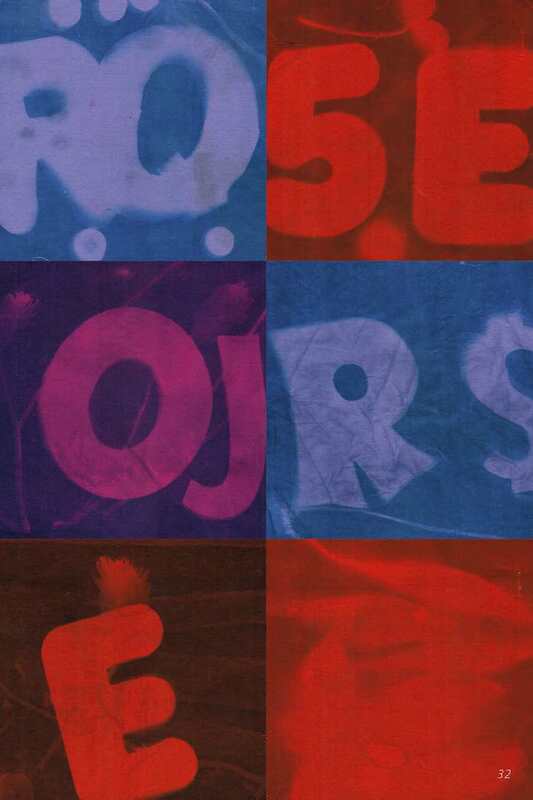 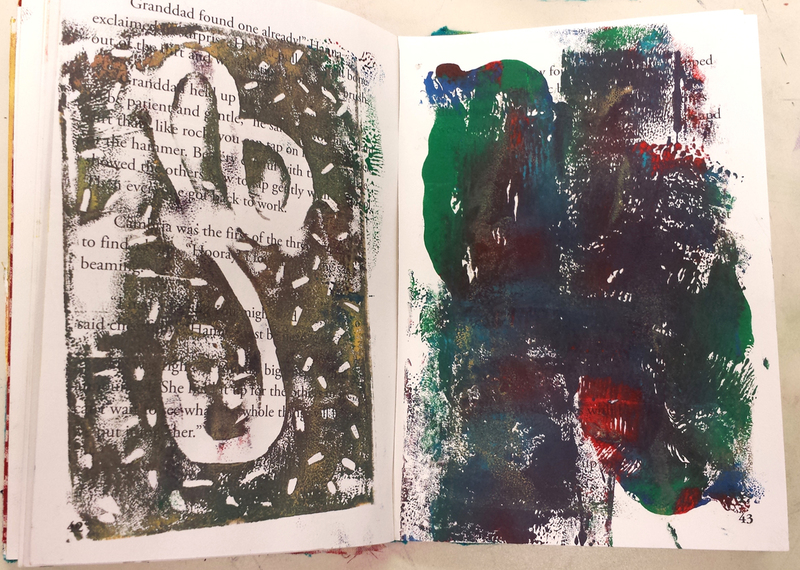 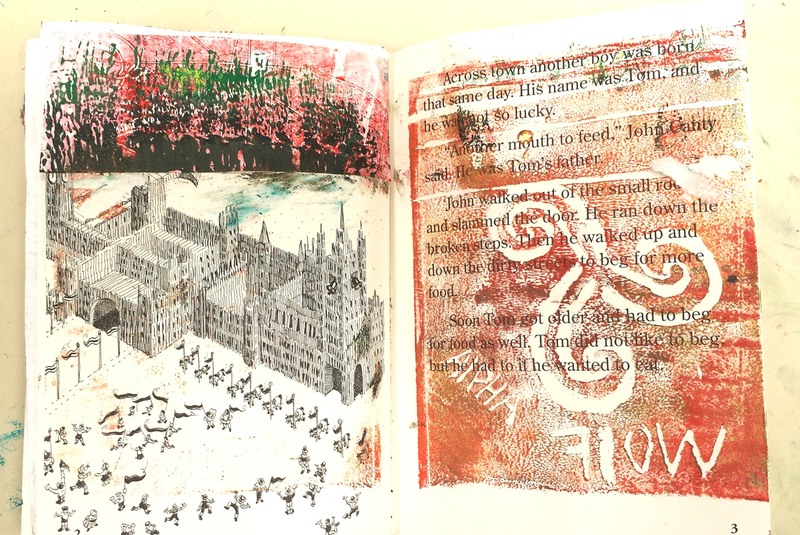 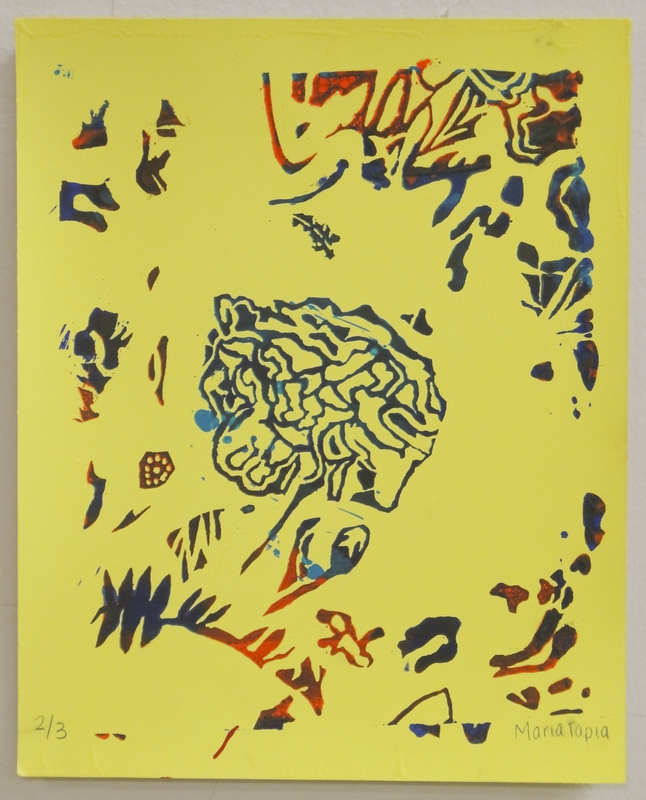 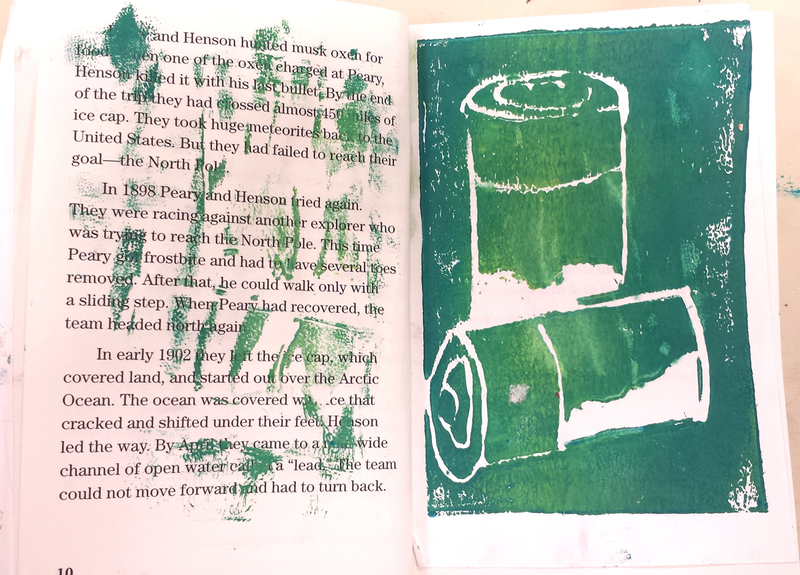 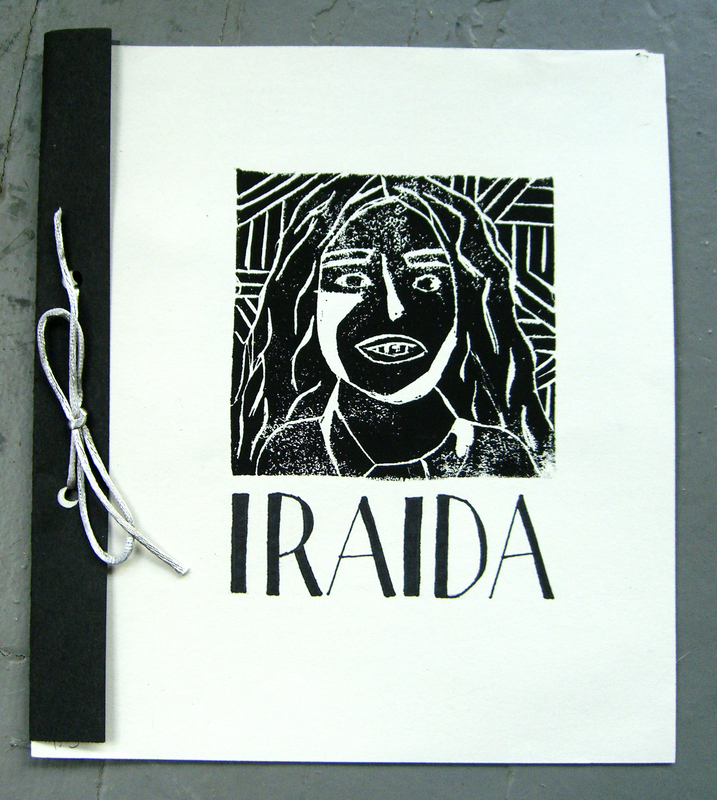 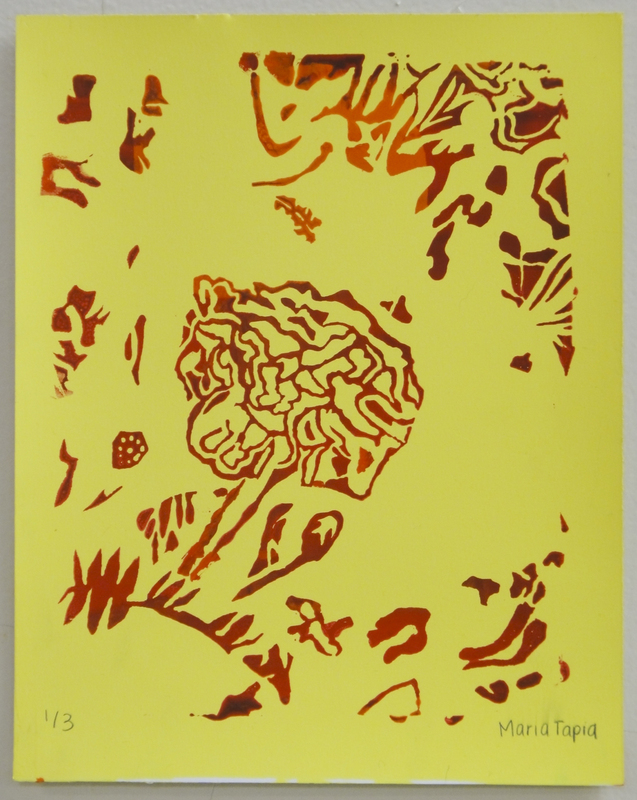 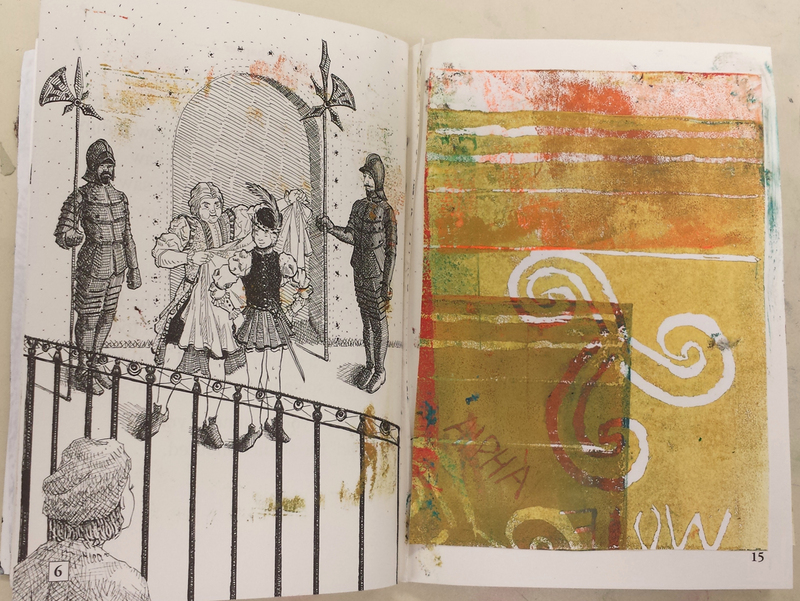 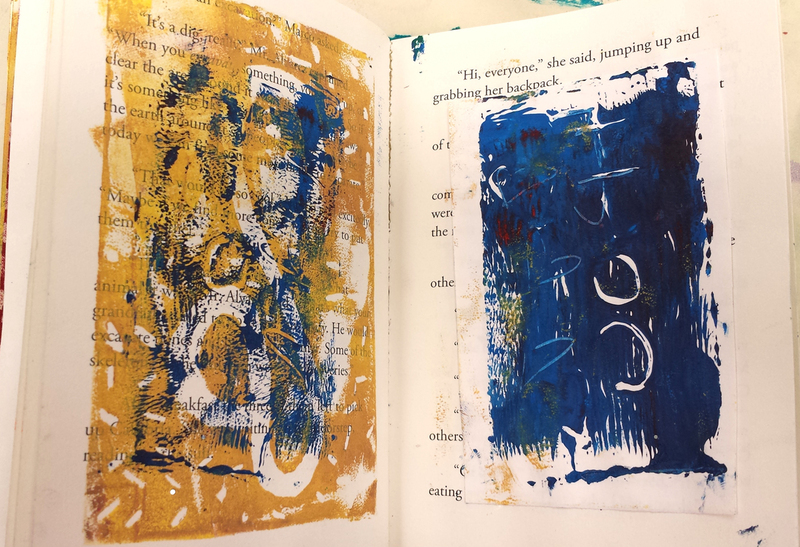 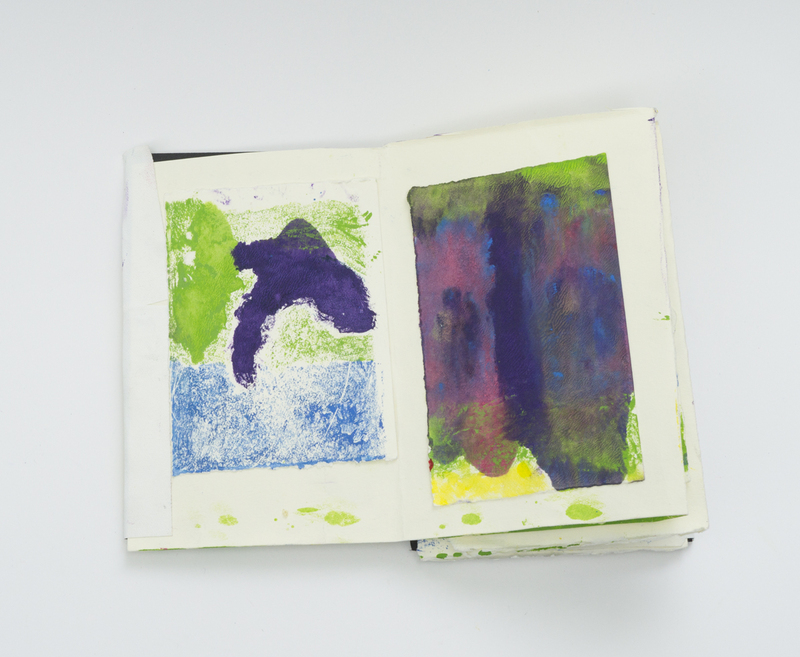 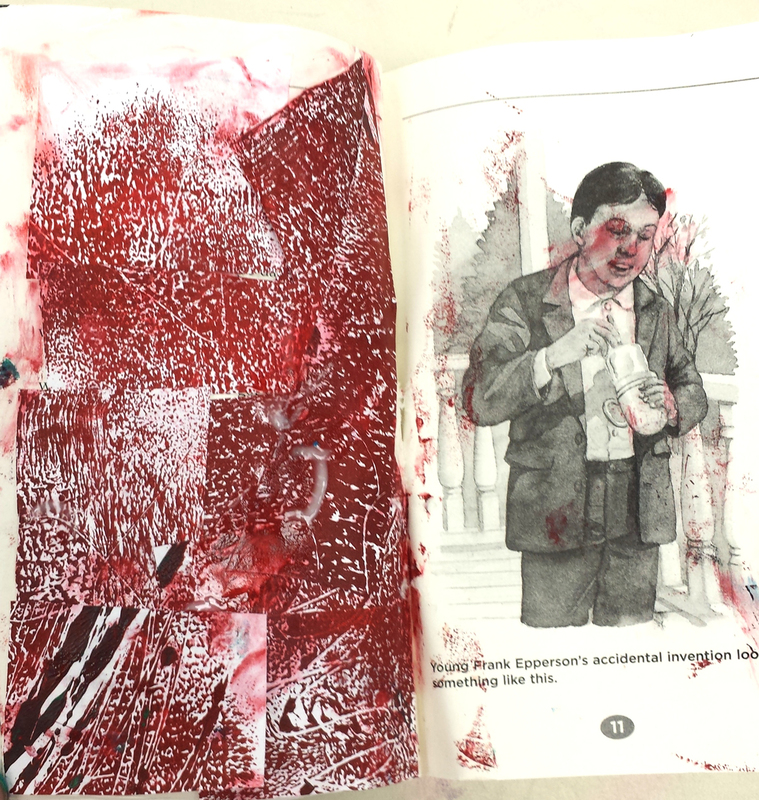 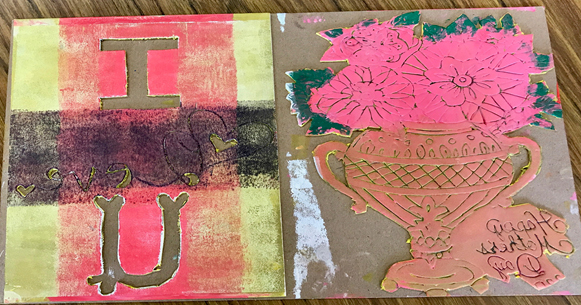 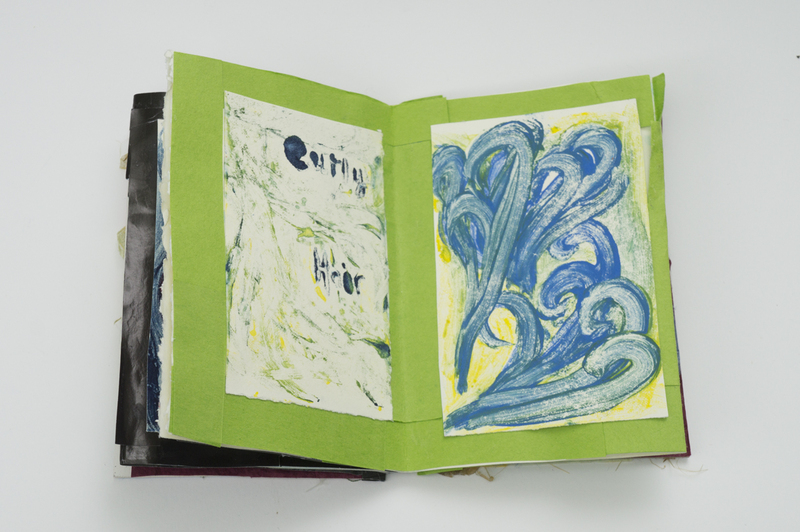 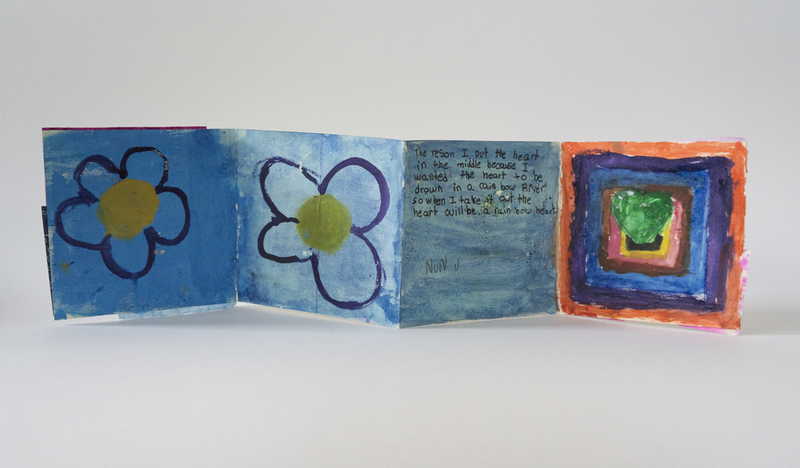 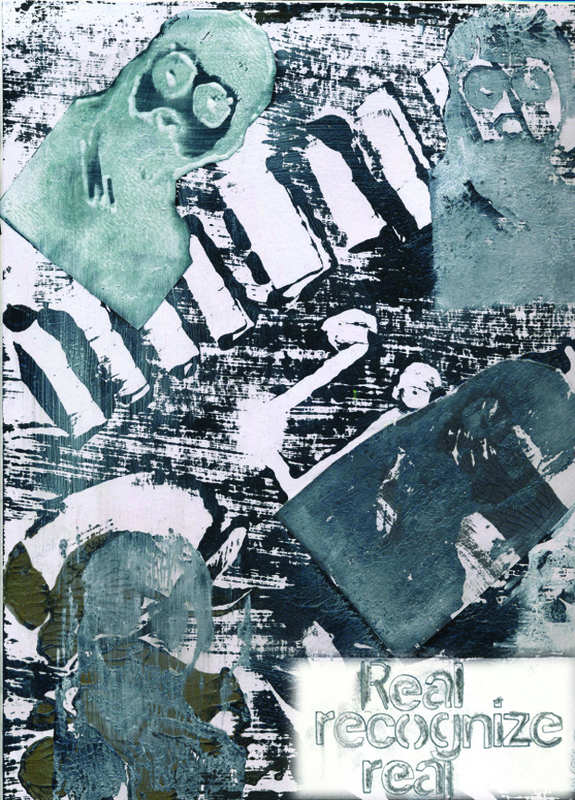 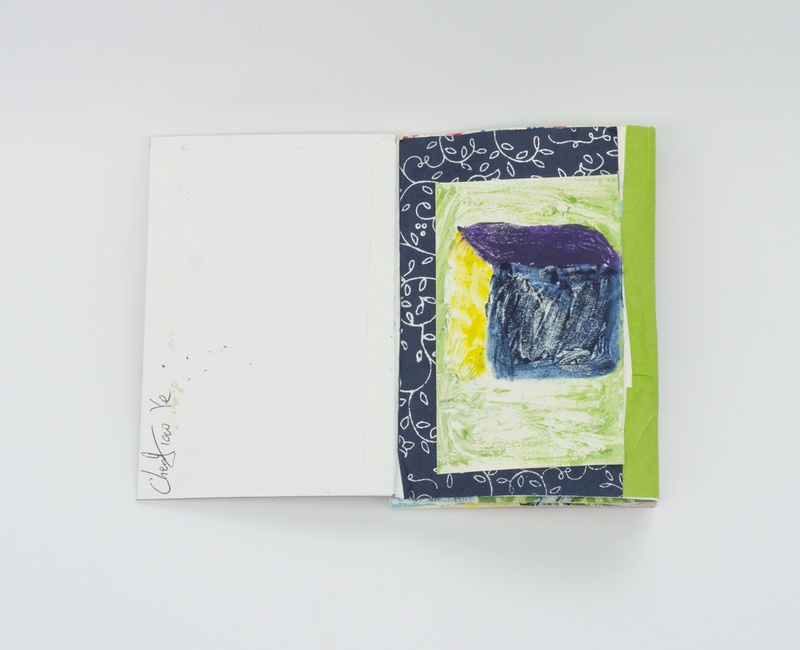 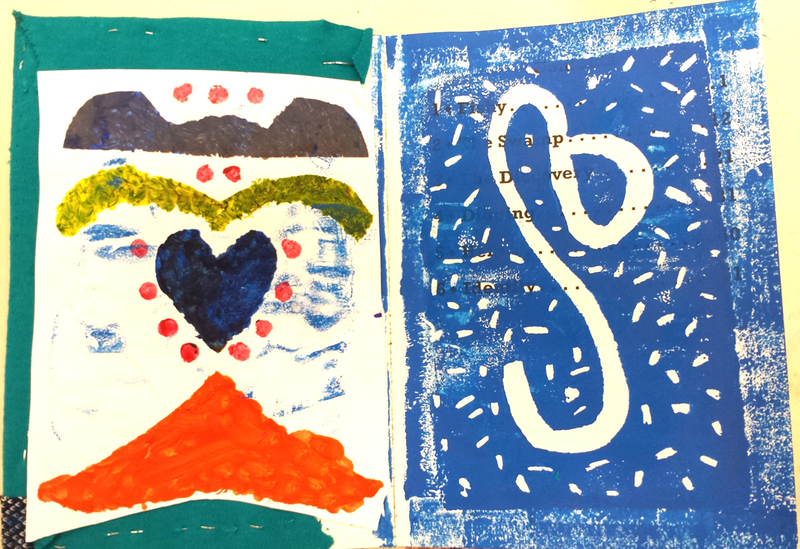 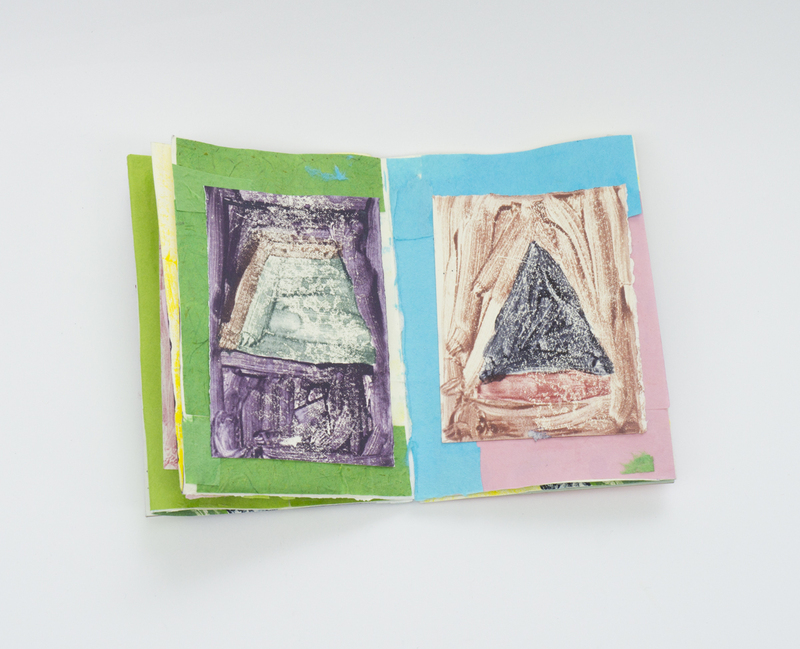 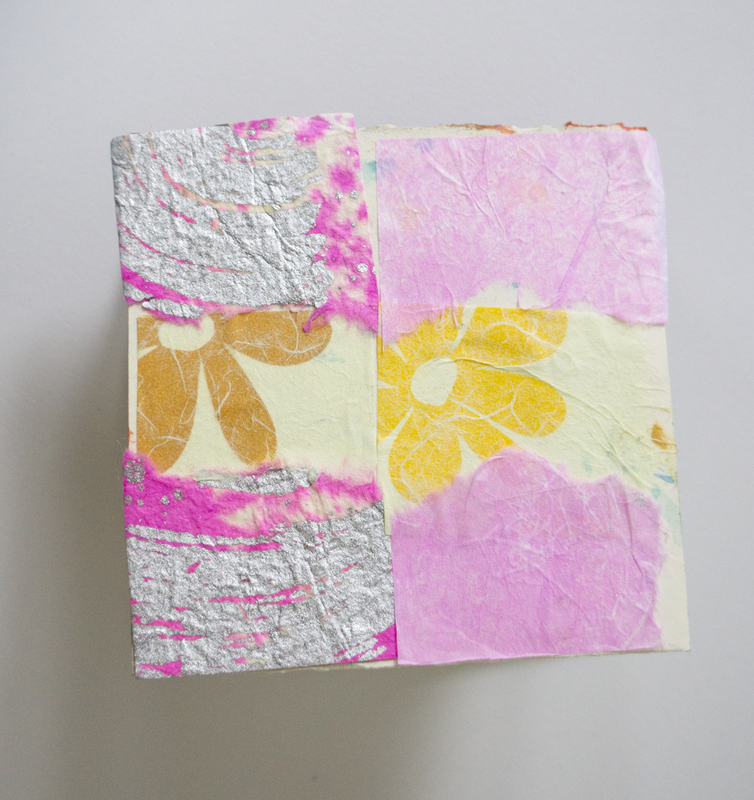 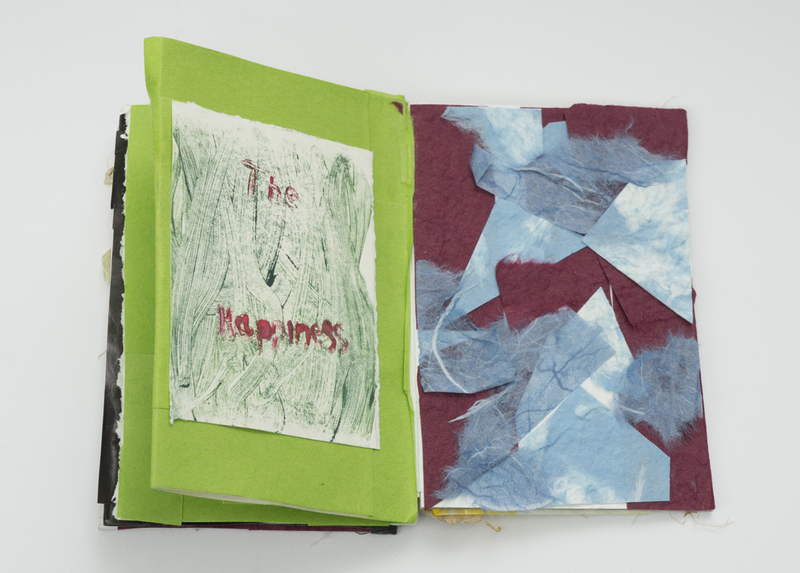 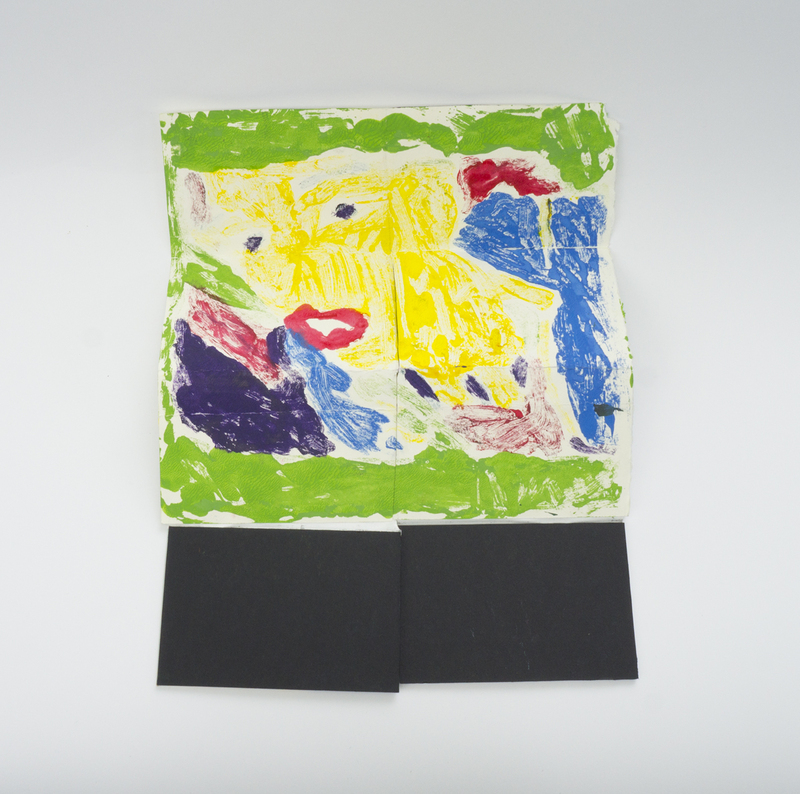 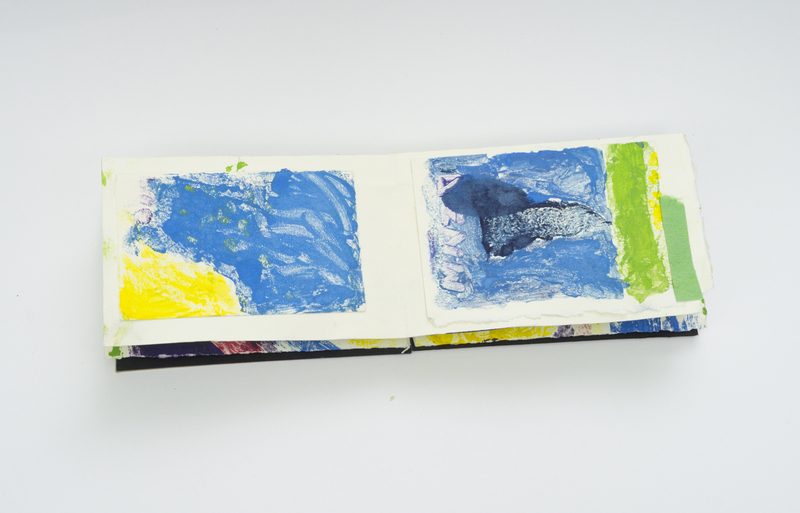 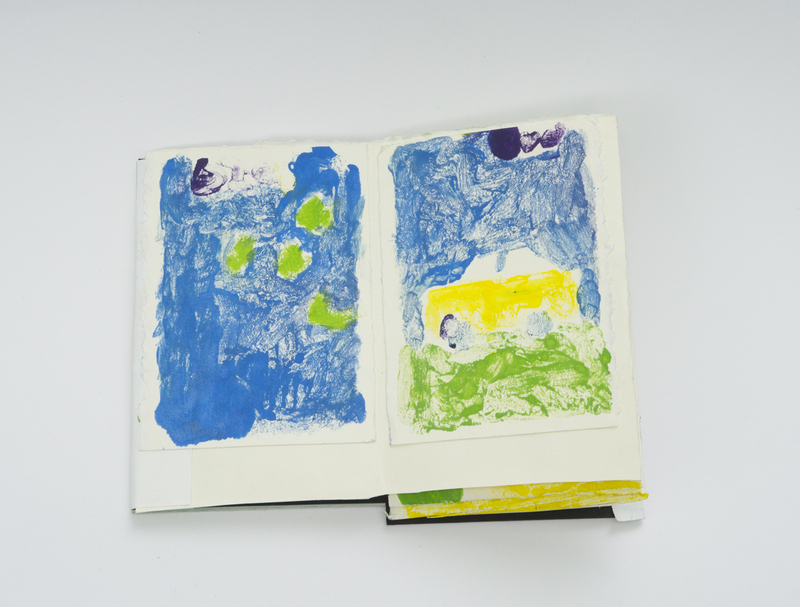 Using relief printing and monoprinting with everyday art materials found in the classroom, students made printed and collaged books that combined their research findings with imagery associated with their daydreams and personal interests. 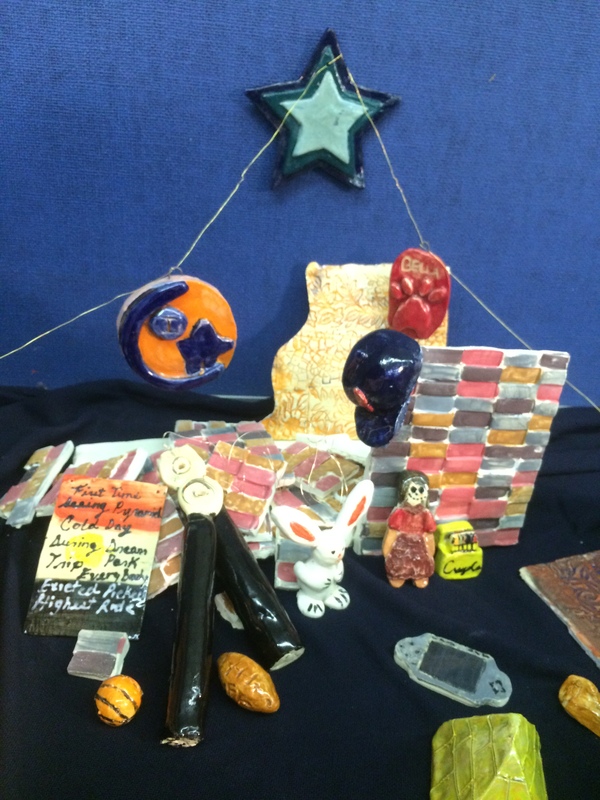 Student-artists in this gallery of work include Aisha, Britney, Edgar, Joyce, Miguel, Molly, Vicky and Vincent. 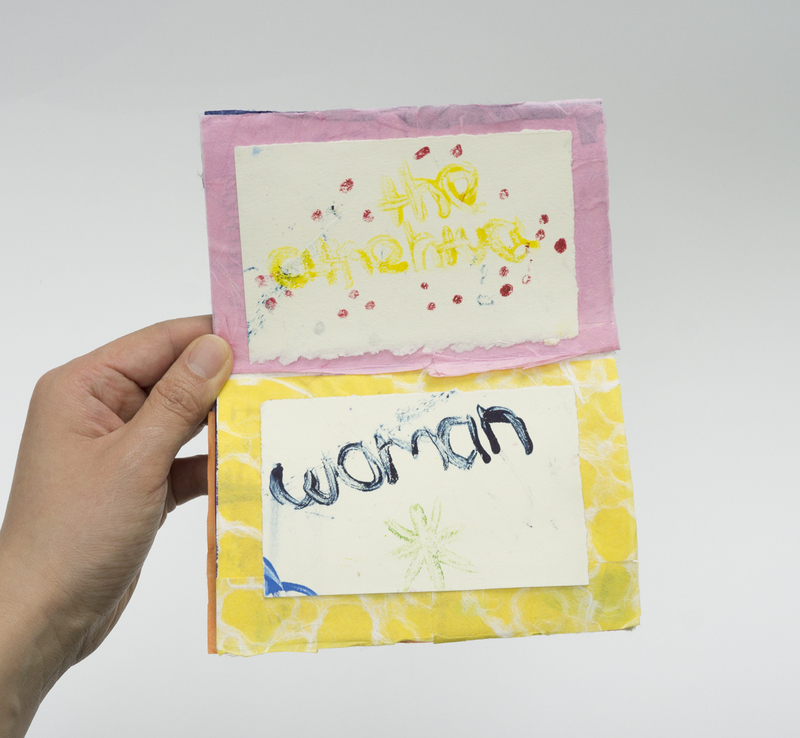 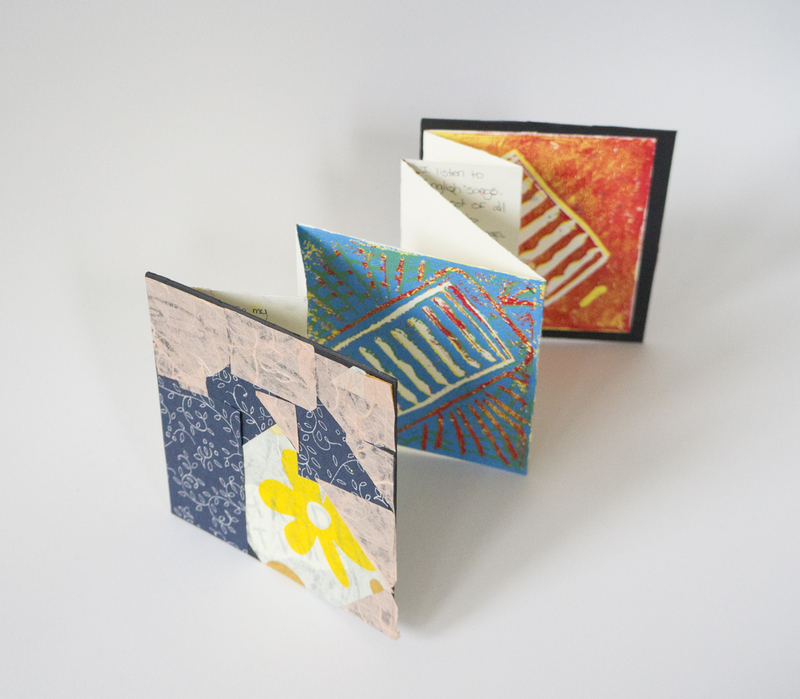 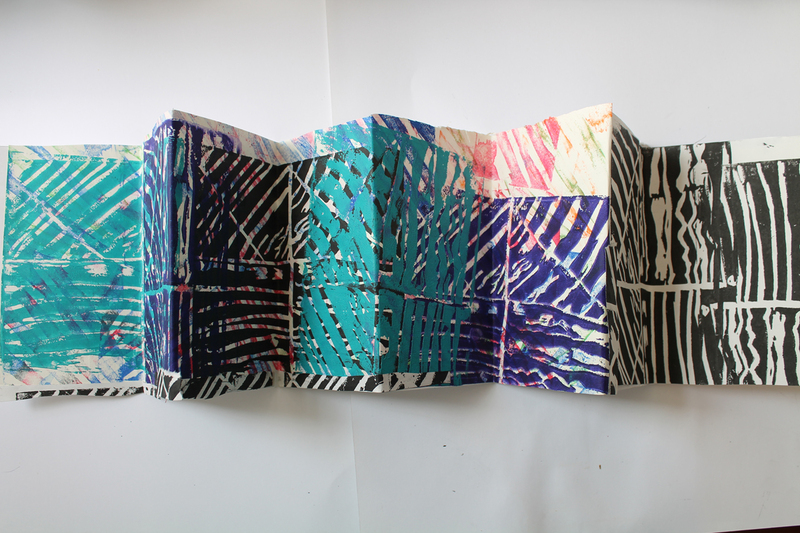 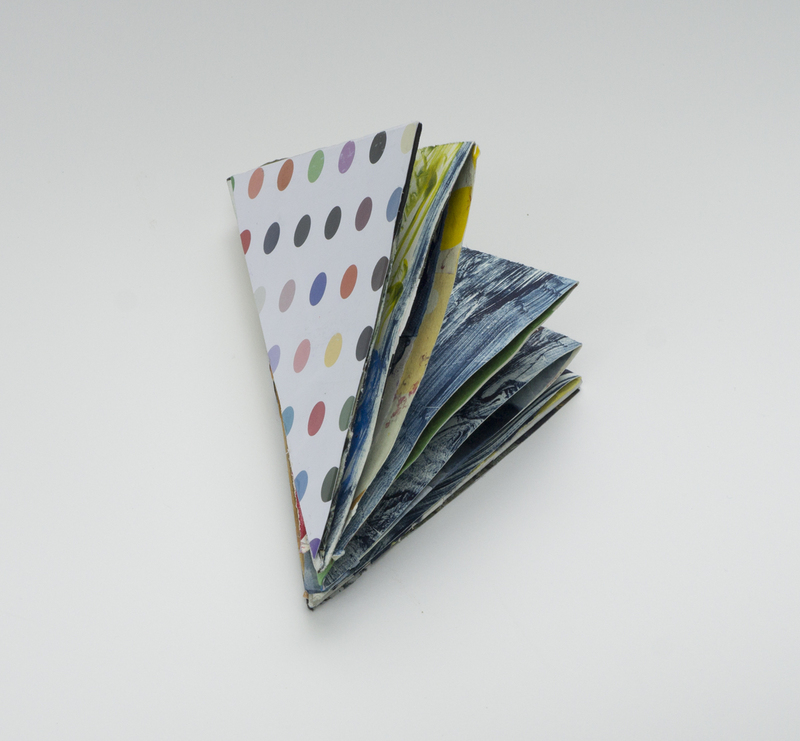 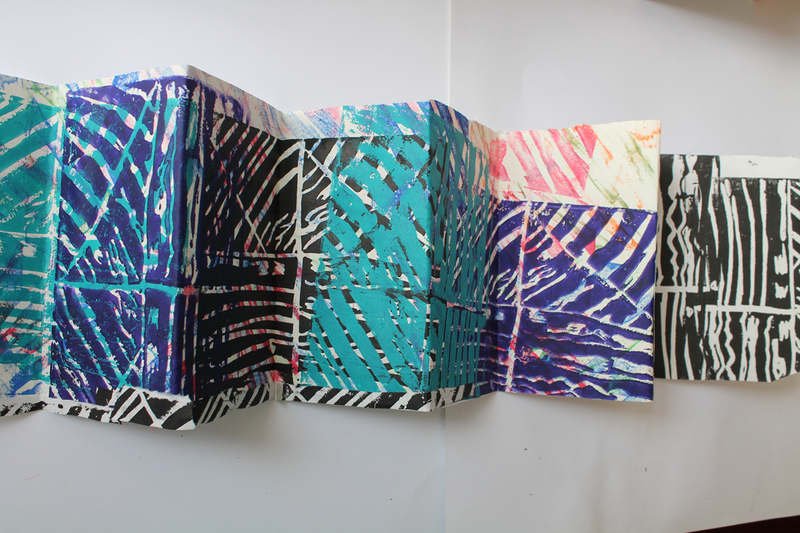 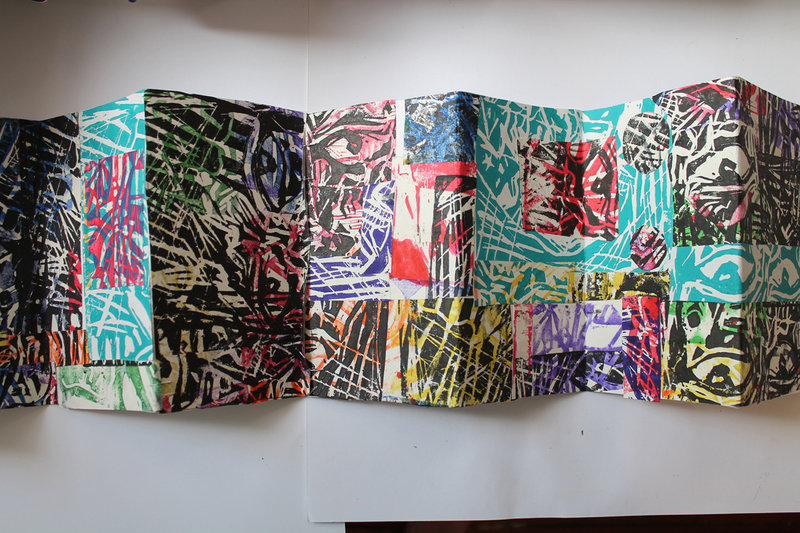 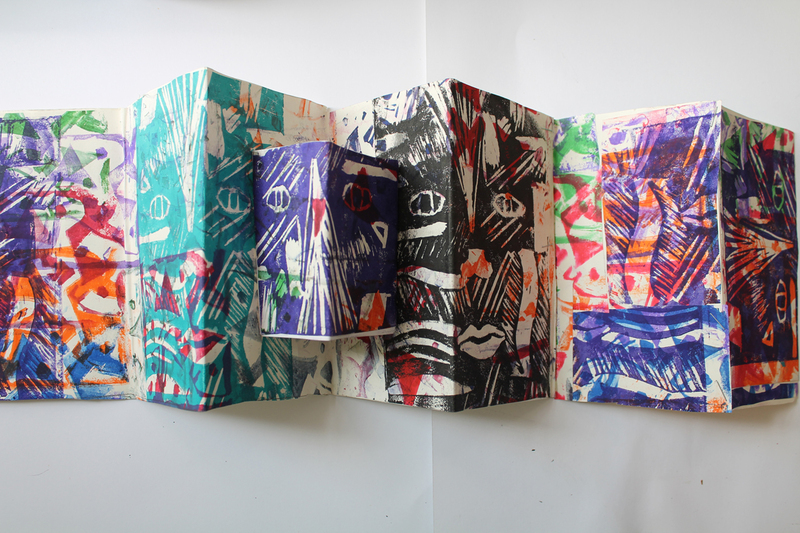 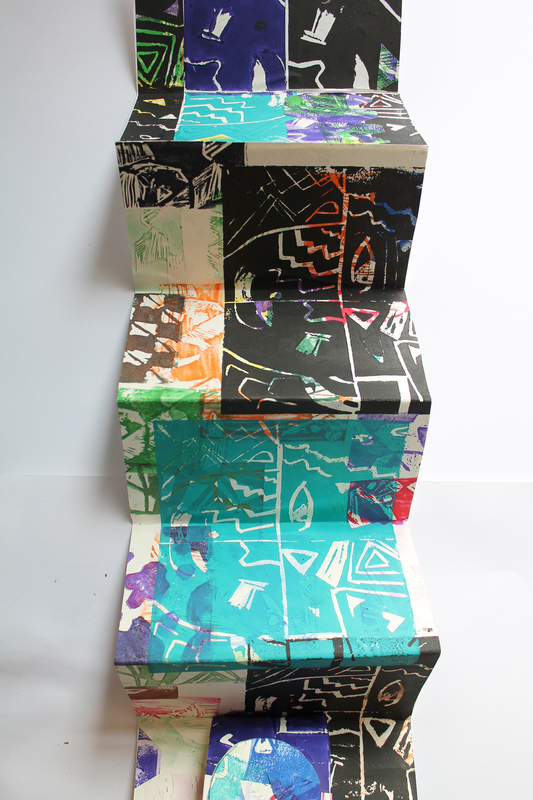 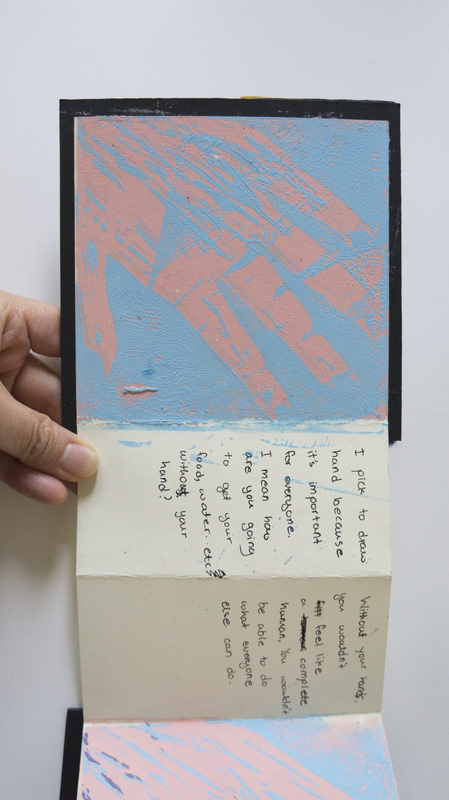 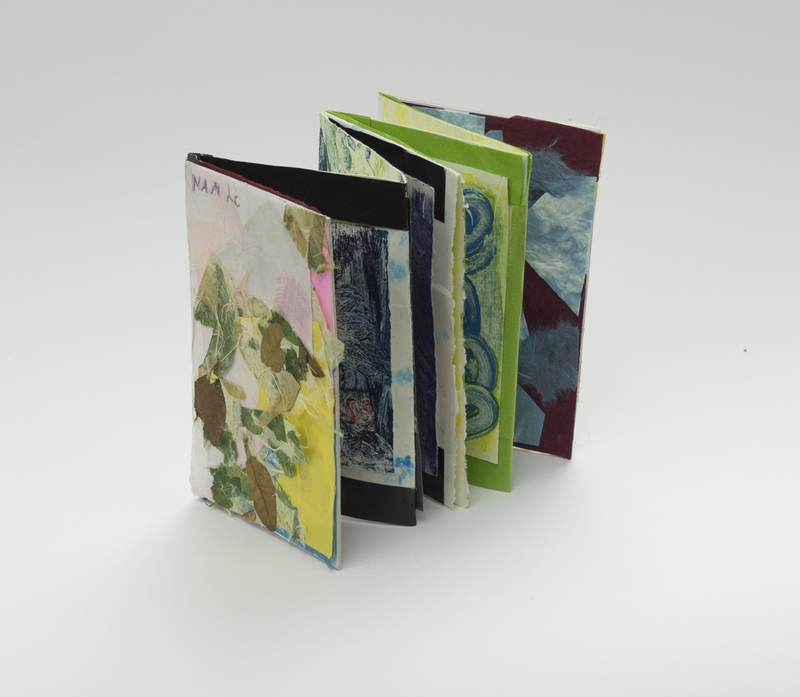 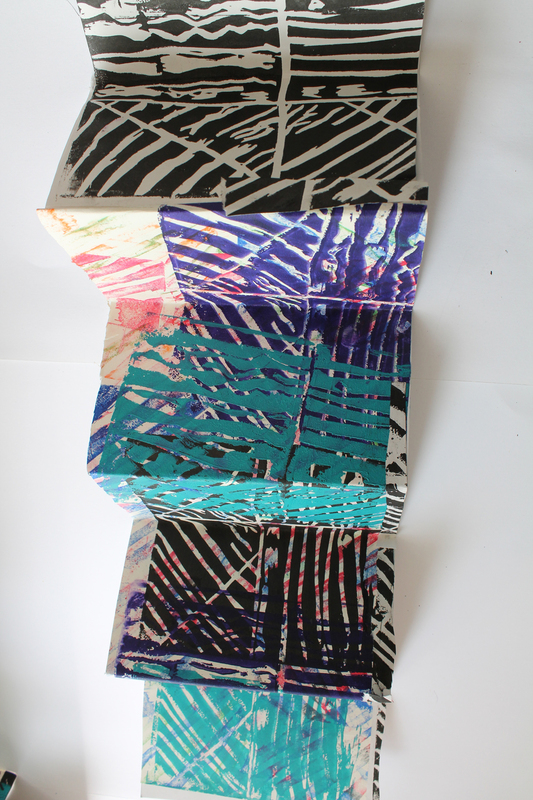 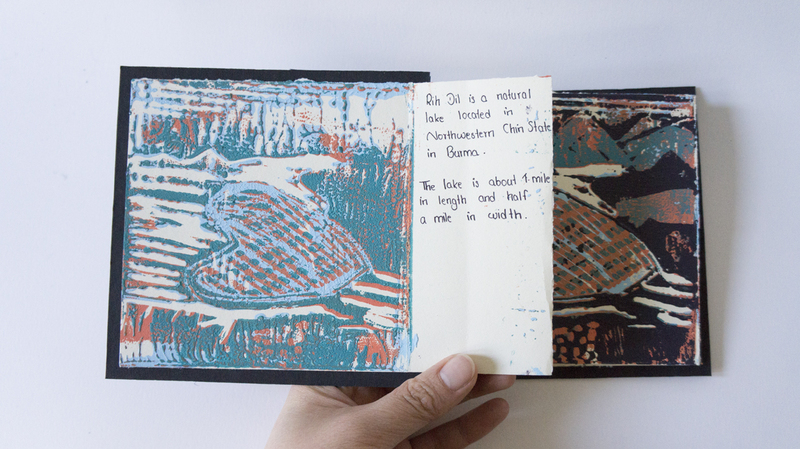 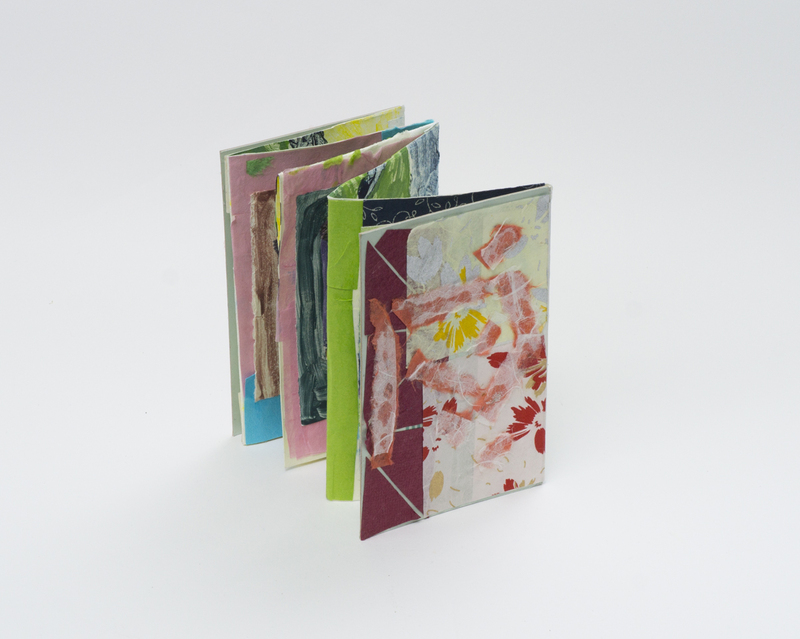 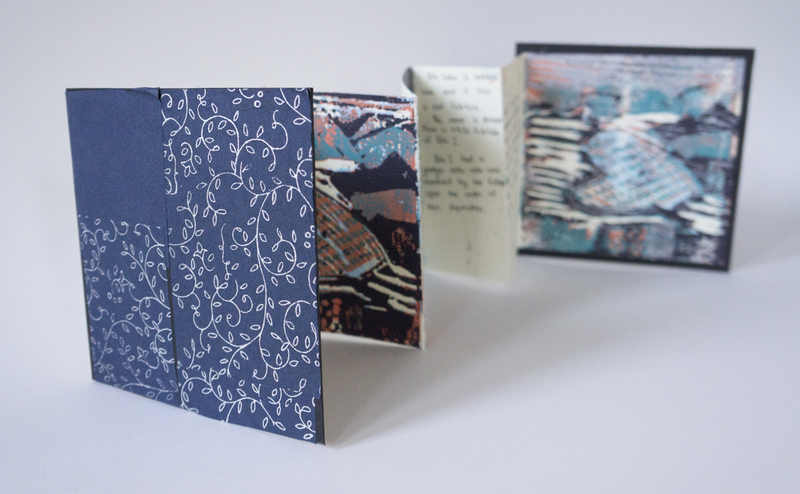 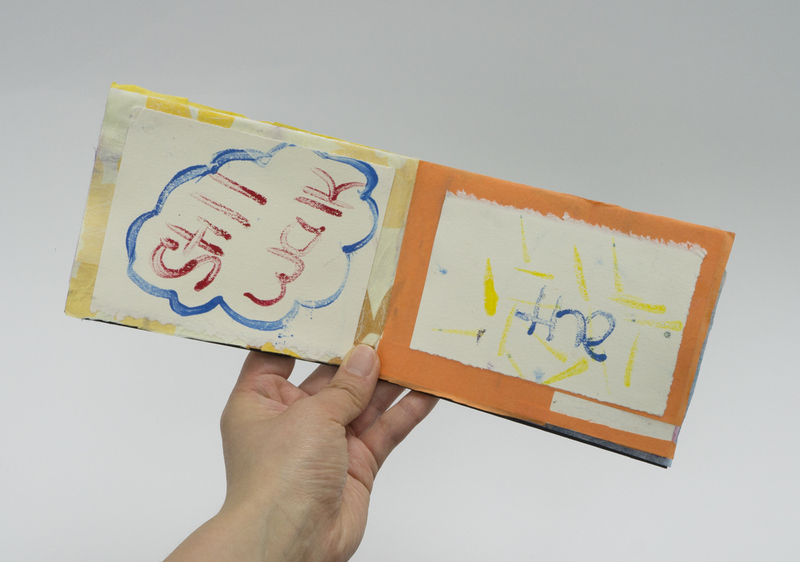 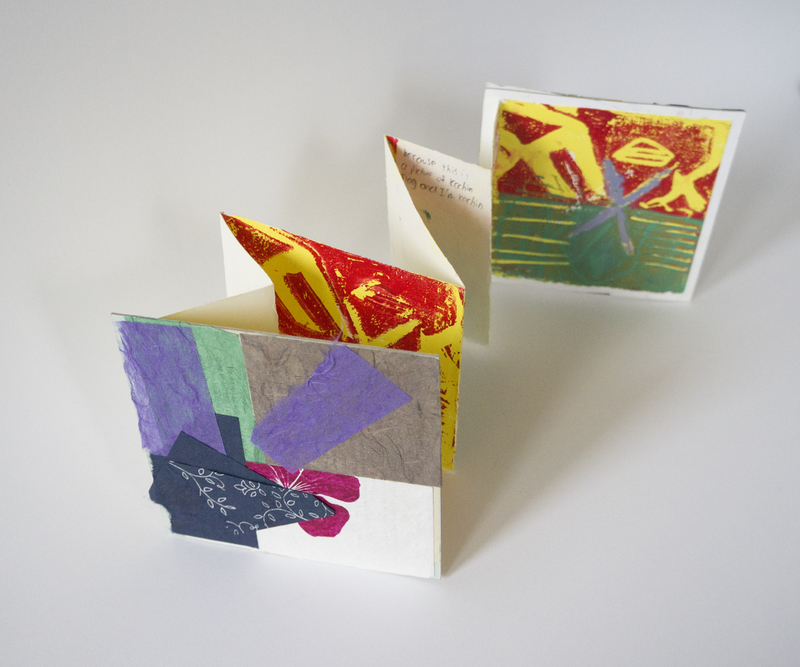 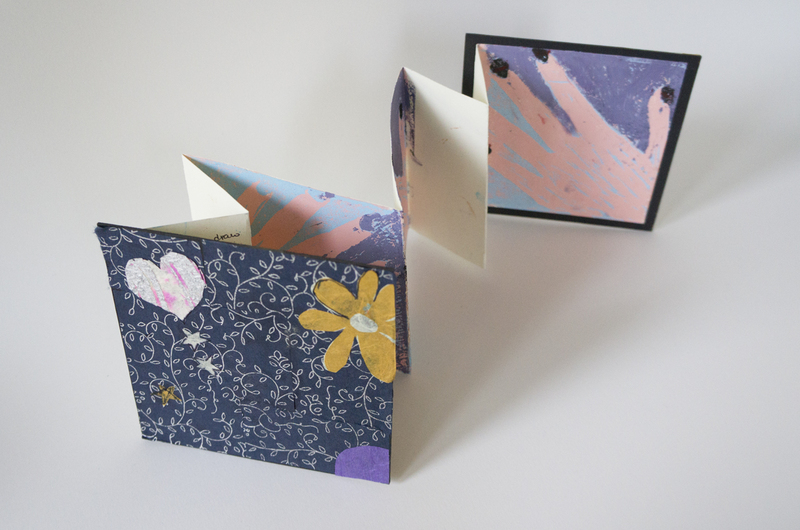 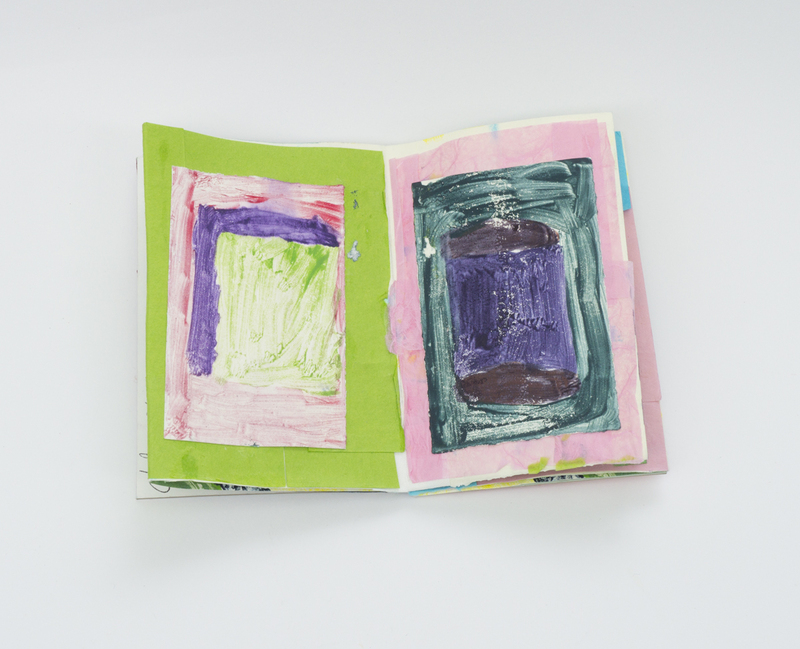 Inspired by Denise Bookwalter’s exhibition, The Knitter’s Hand and the Telegrapher’s Fist, students created individual accordion-style artist books using a multi-color reduction block printing technique. 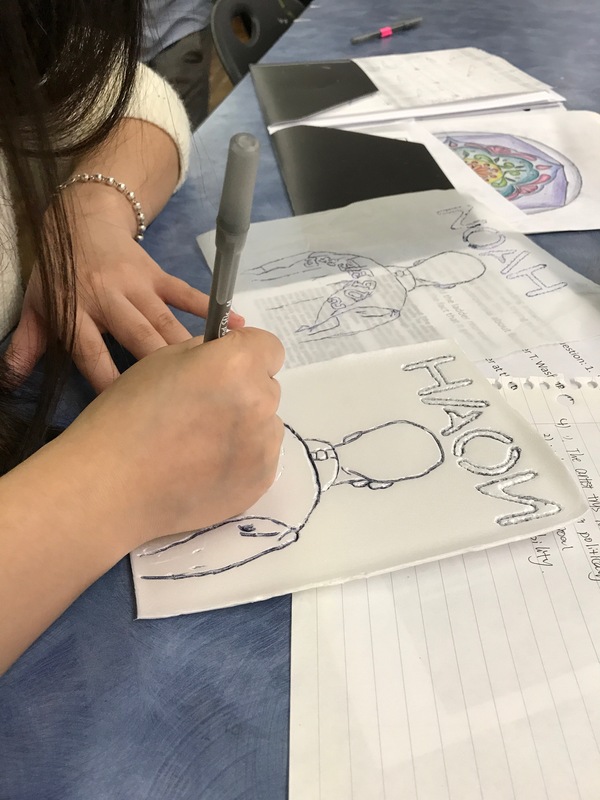 Subject matter for the books was pulled directly from each student’s culture and everyday life, which they further investigated and explored using various research processes. 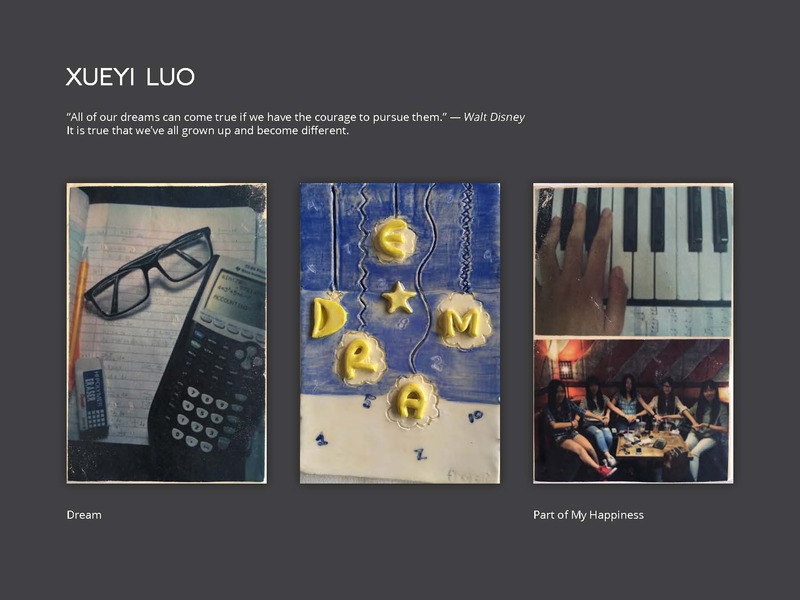 Student-artists in this gallery of work include Birendra Lal Danal, Khin Thy Dar, Ndizihiwe Gentil, Naing Hleih, Khawm Sian Kop, Nula, Nunu, Song Thang Sian and Glory Zi. 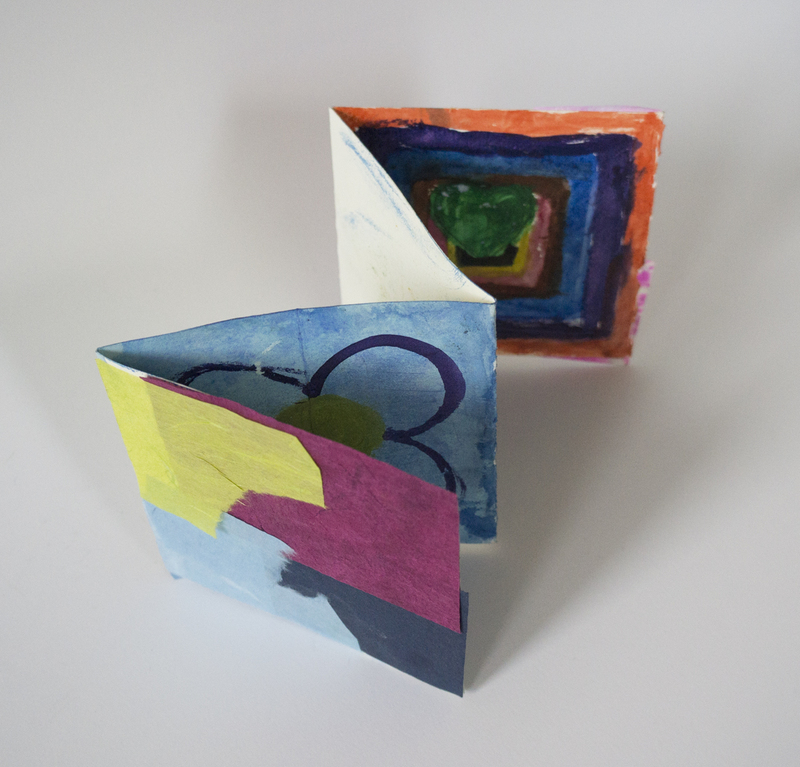 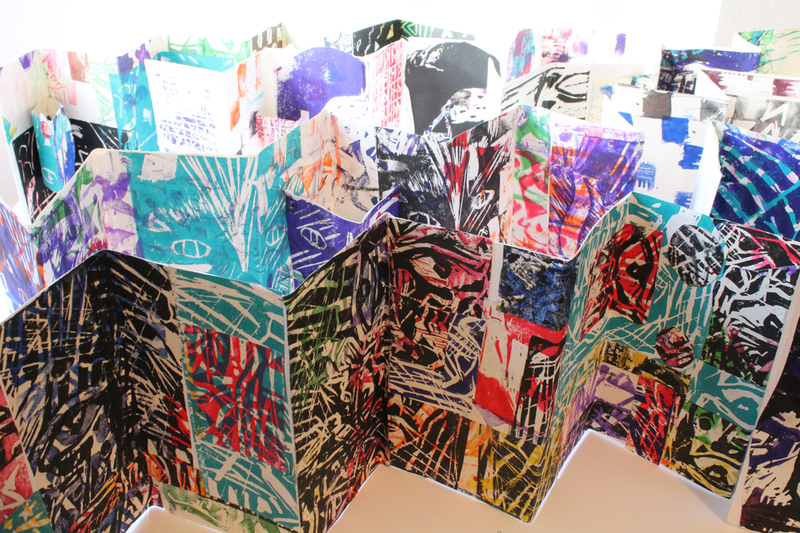 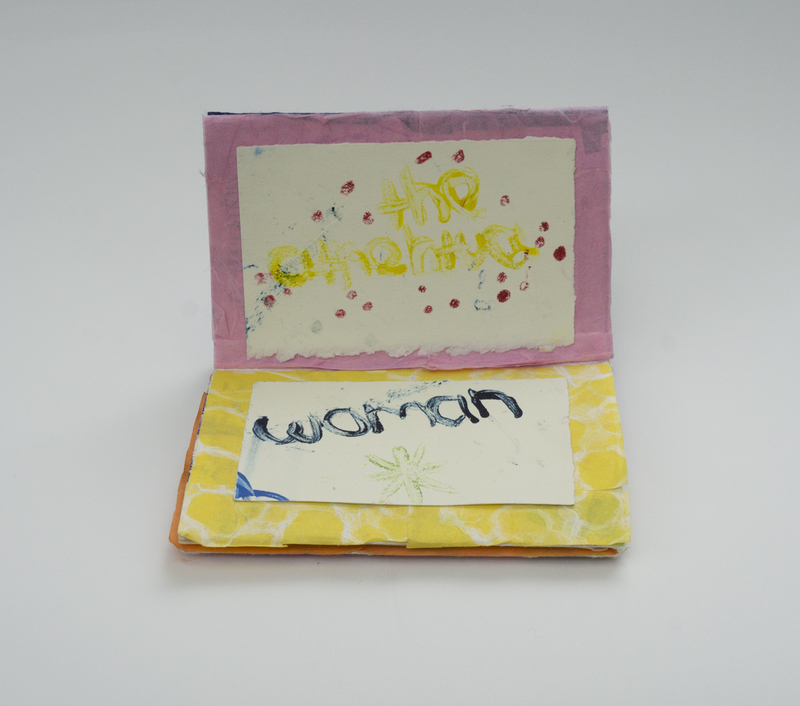 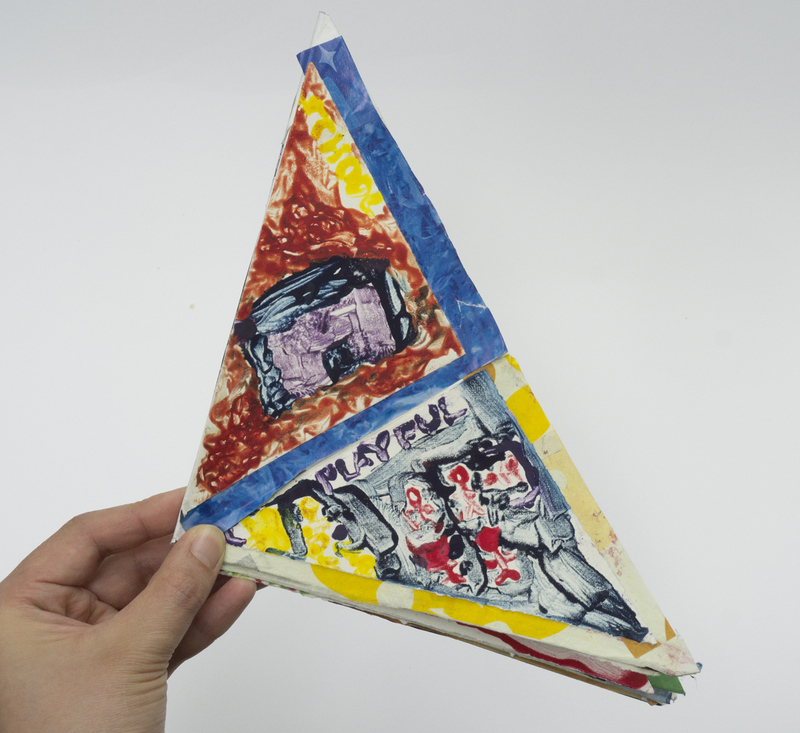 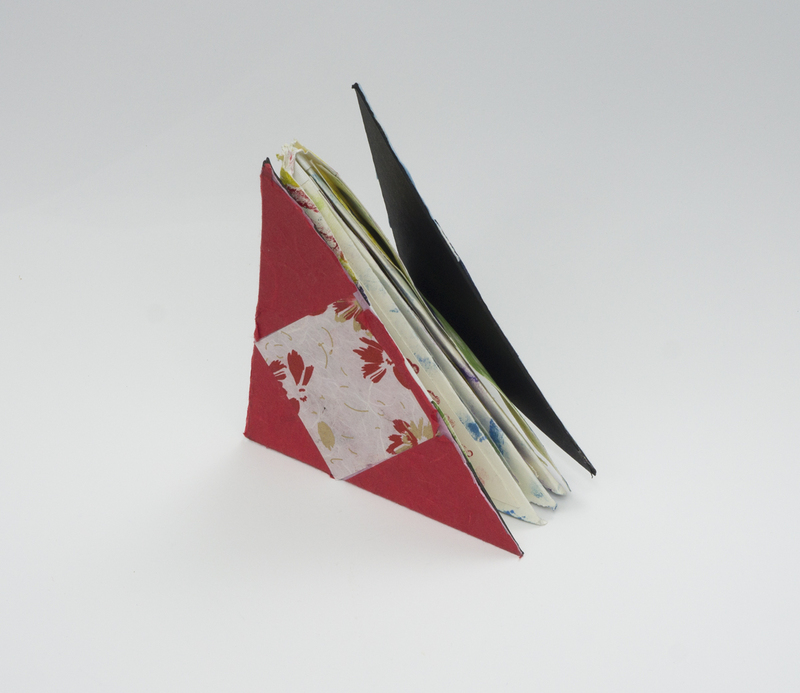 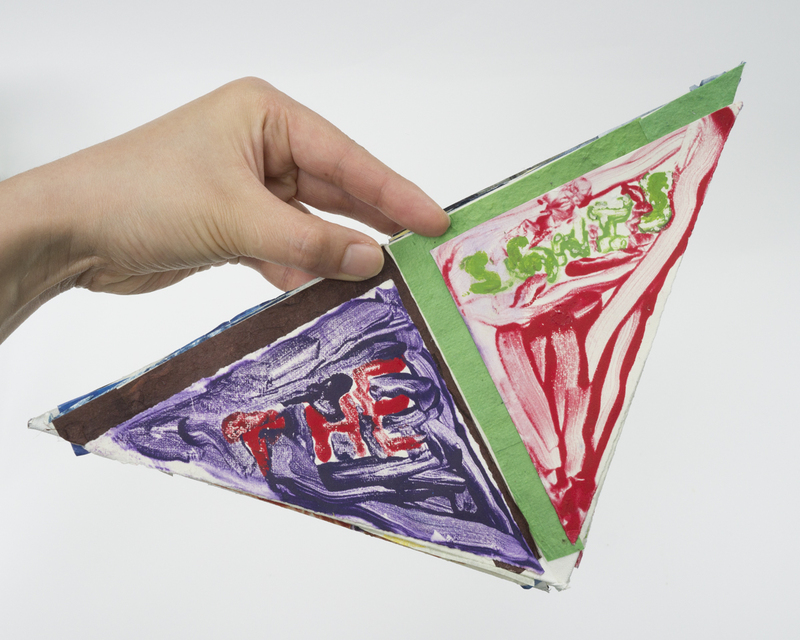 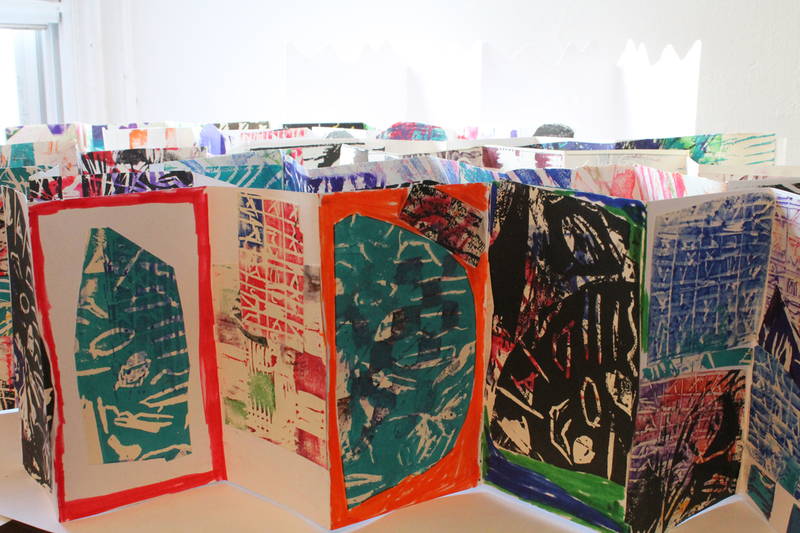 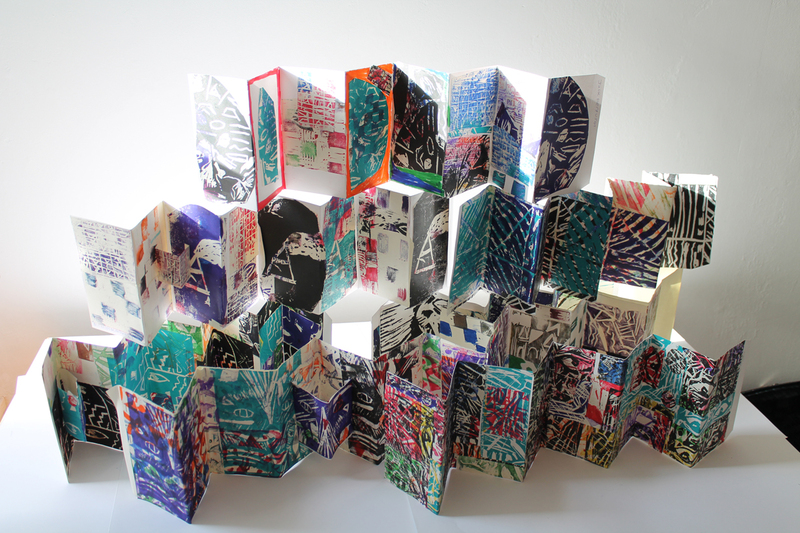 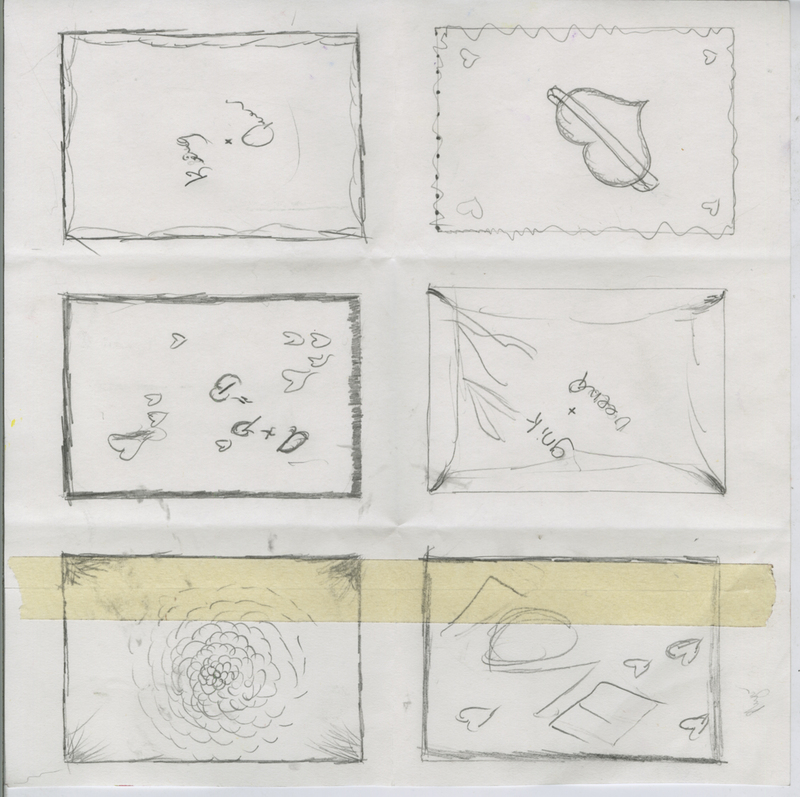 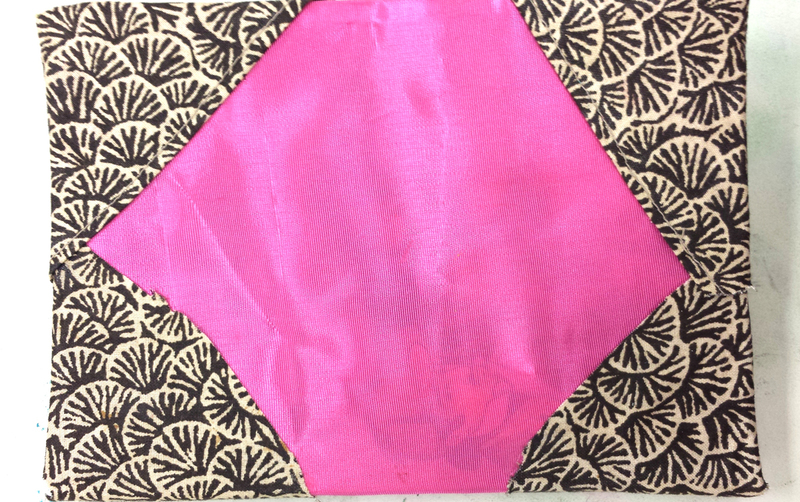 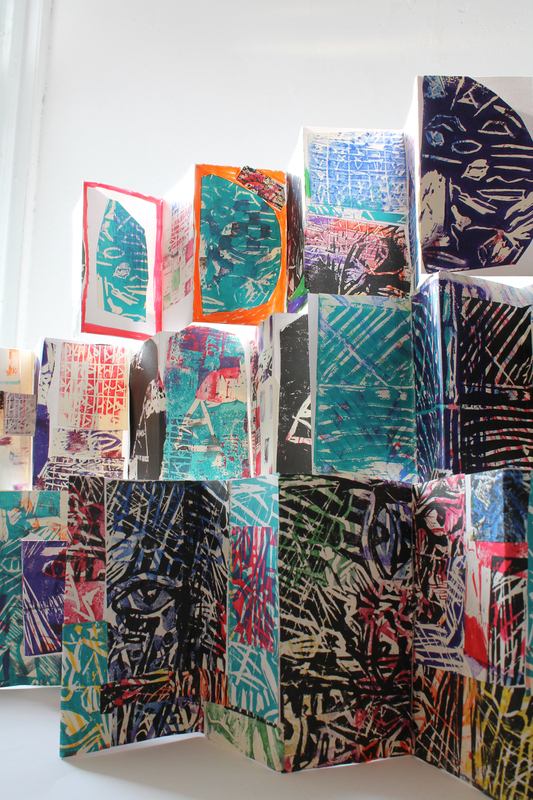 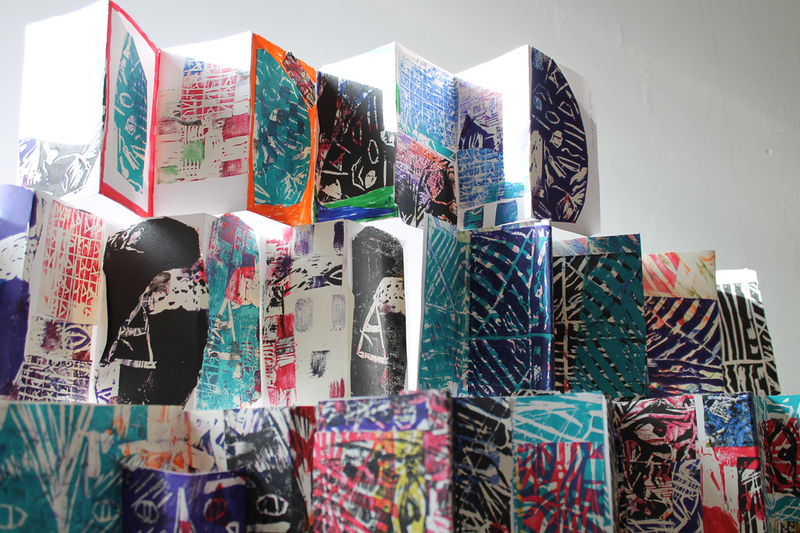 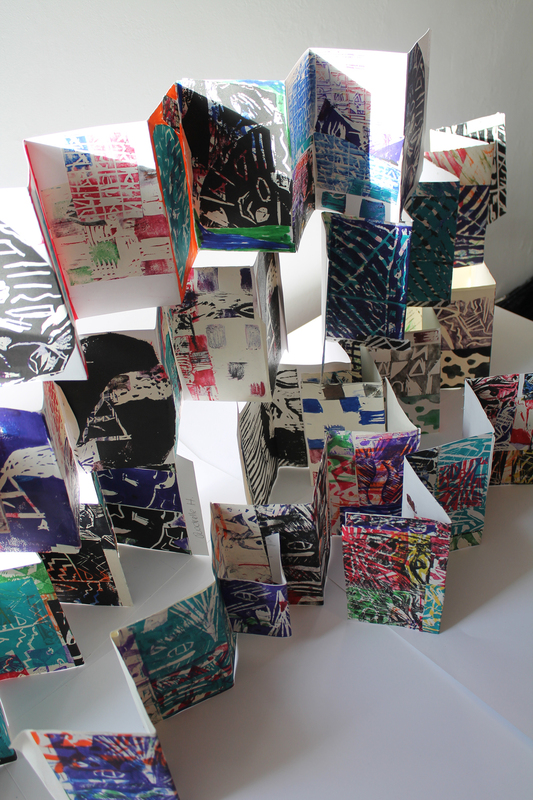 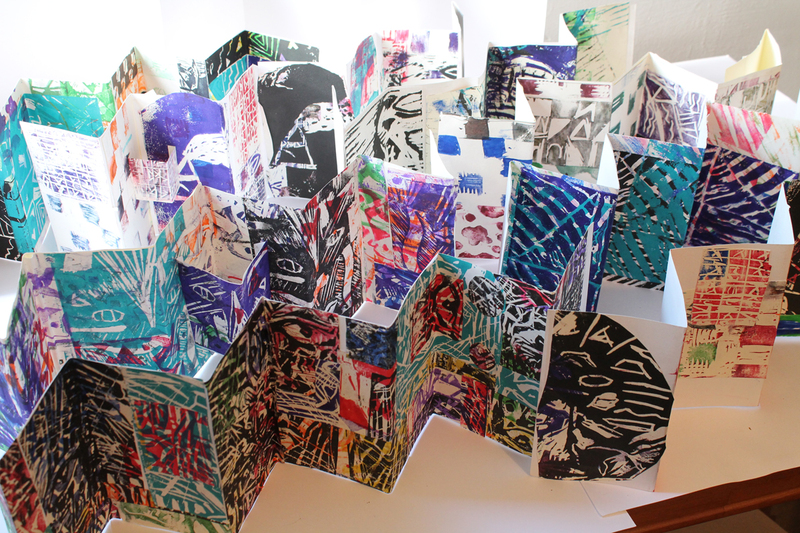 Students at School of The Future created accordion books that included relief printed elements and pop ups. 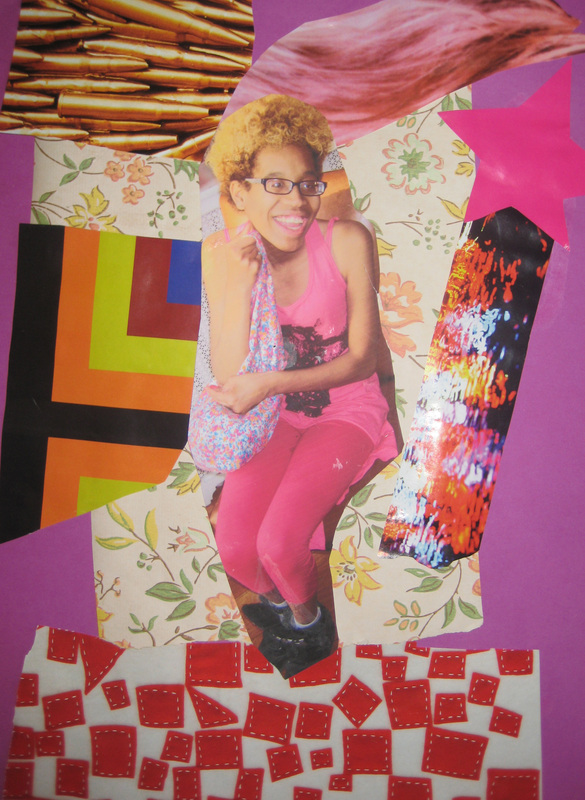 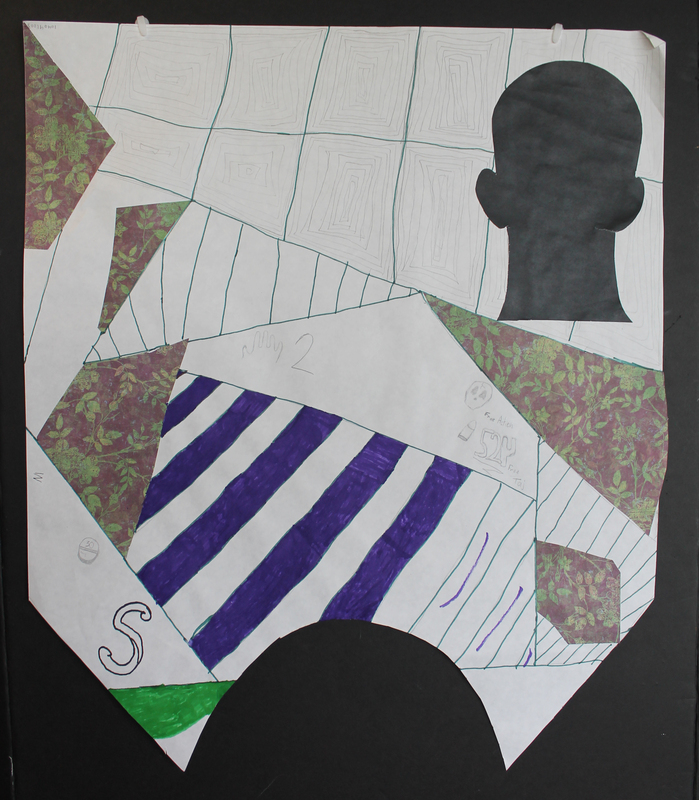 Students created printed self portraits which they used as a motif in their constructed books by collaging them in various ways. 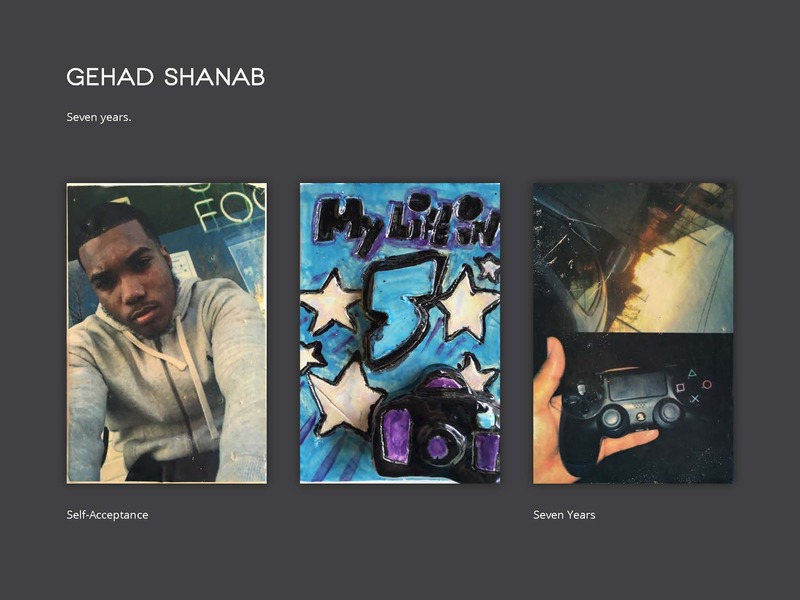 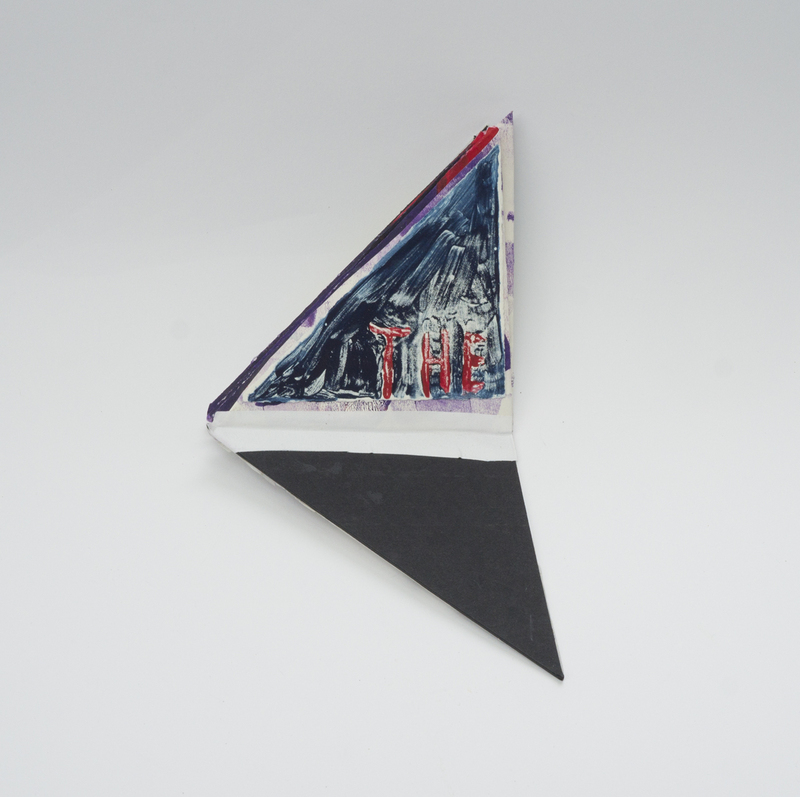 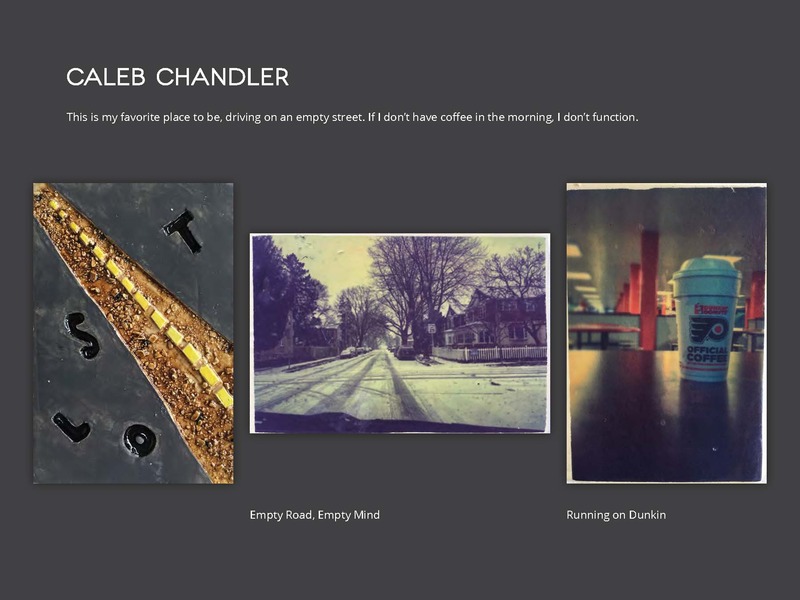 Student-artists in this gallery of work include Mike, Nazish, Nicholas and Quadrelle. 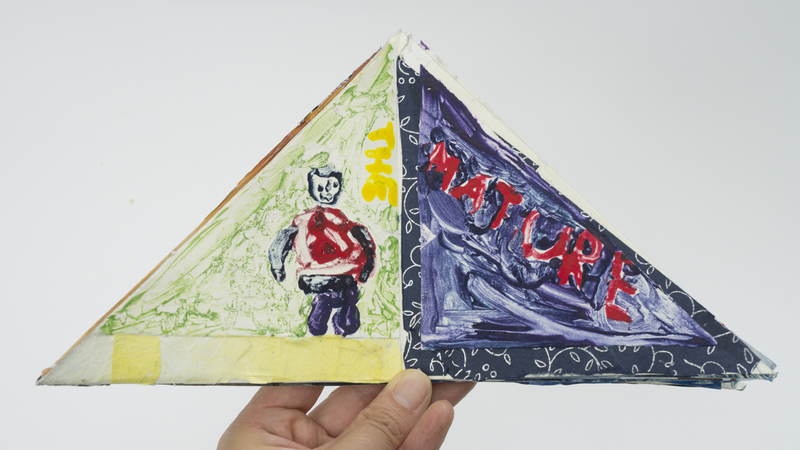 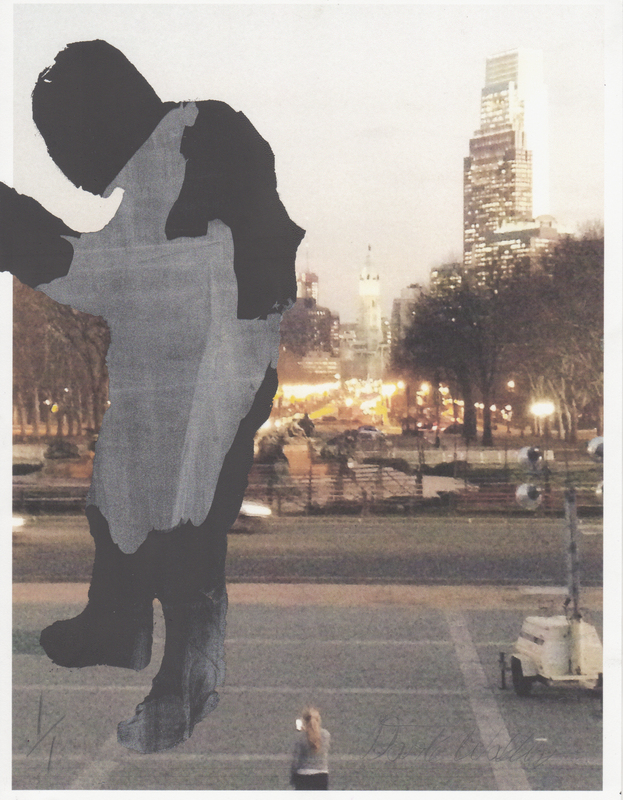 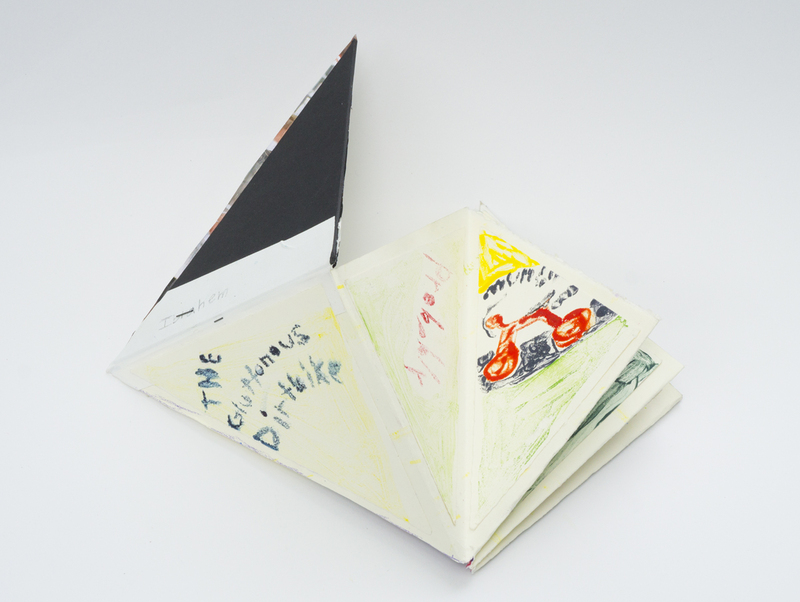 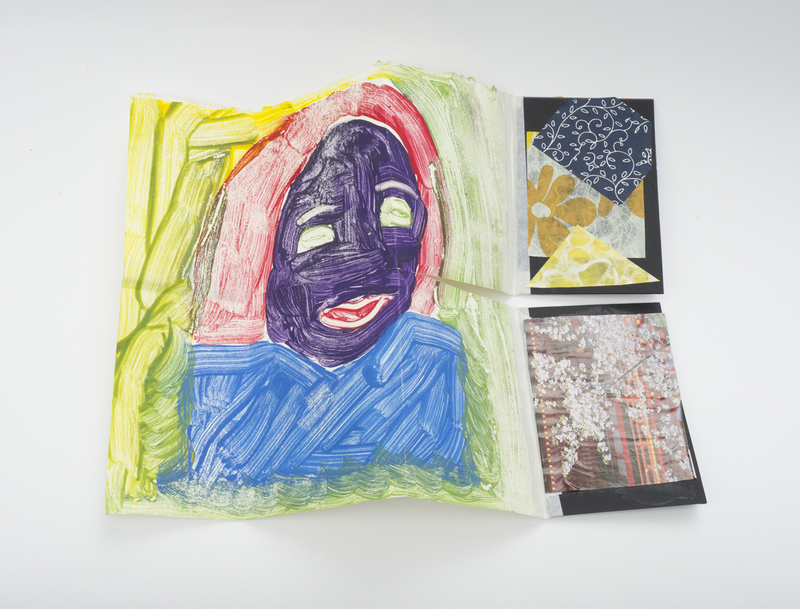 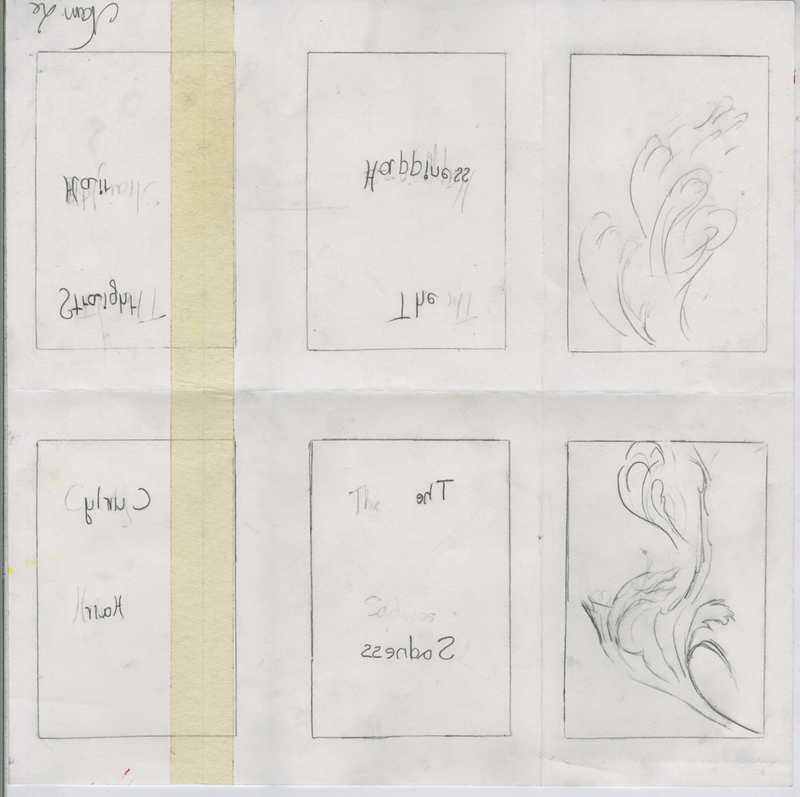 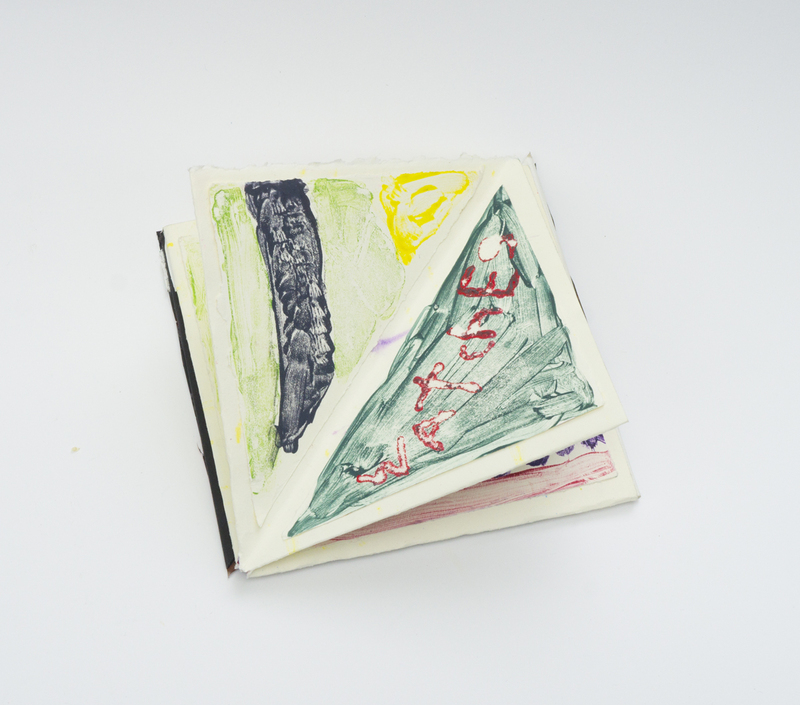 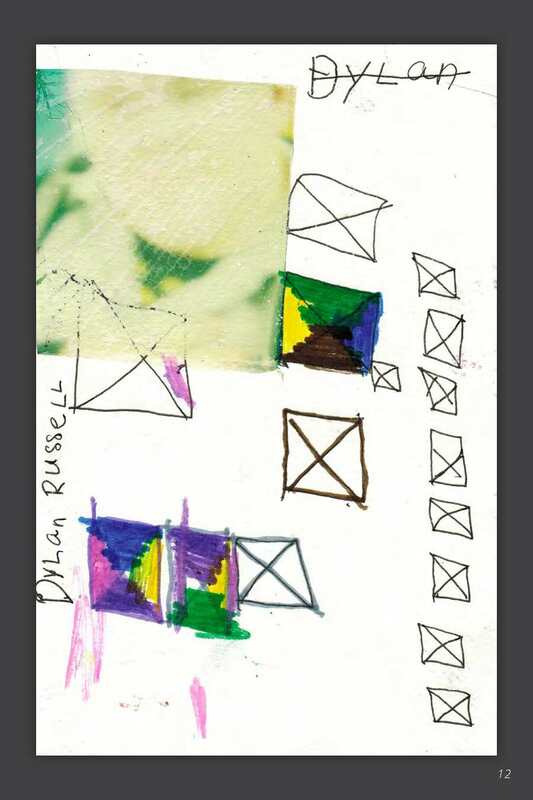 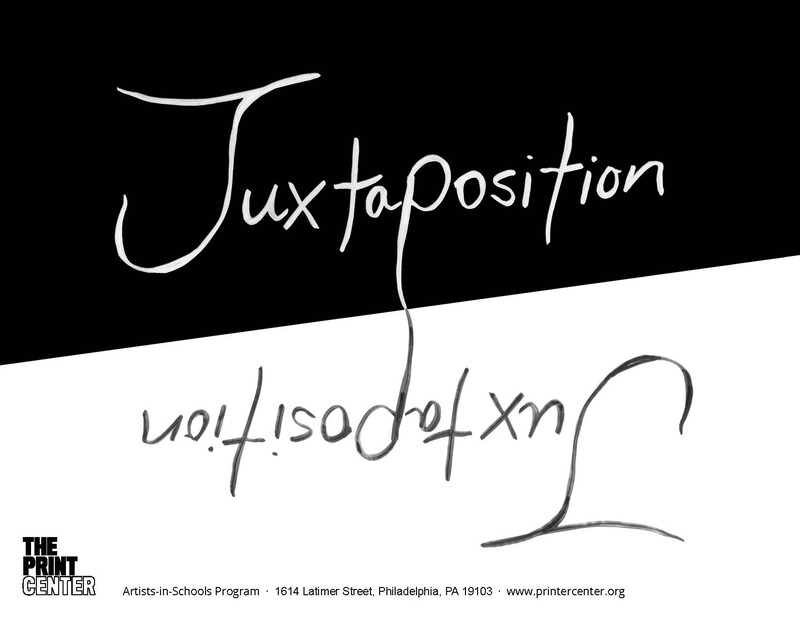 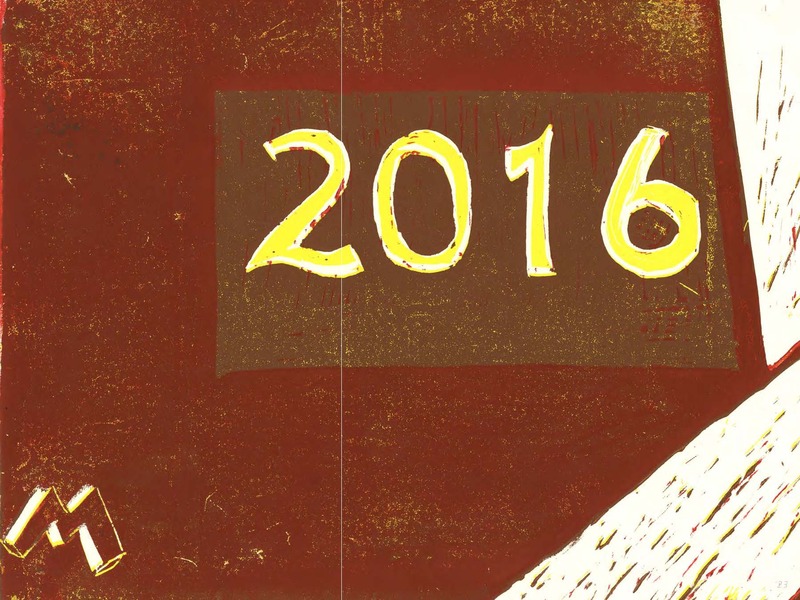 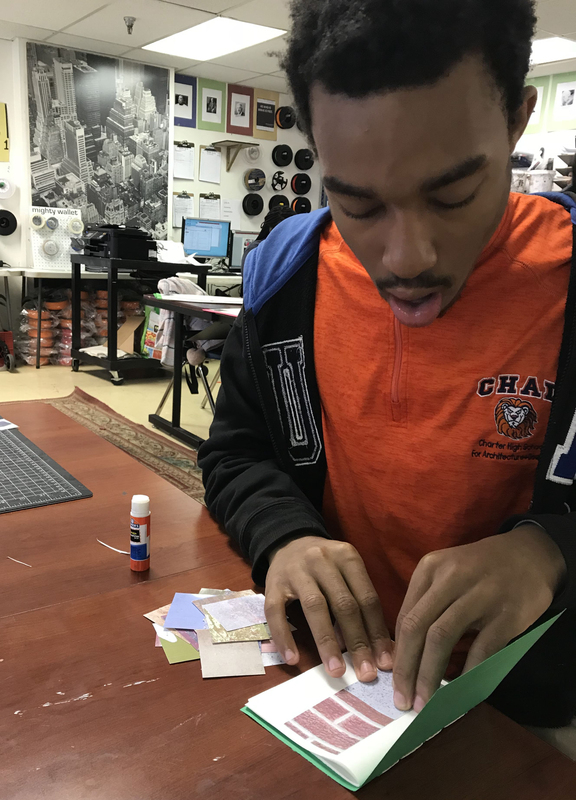 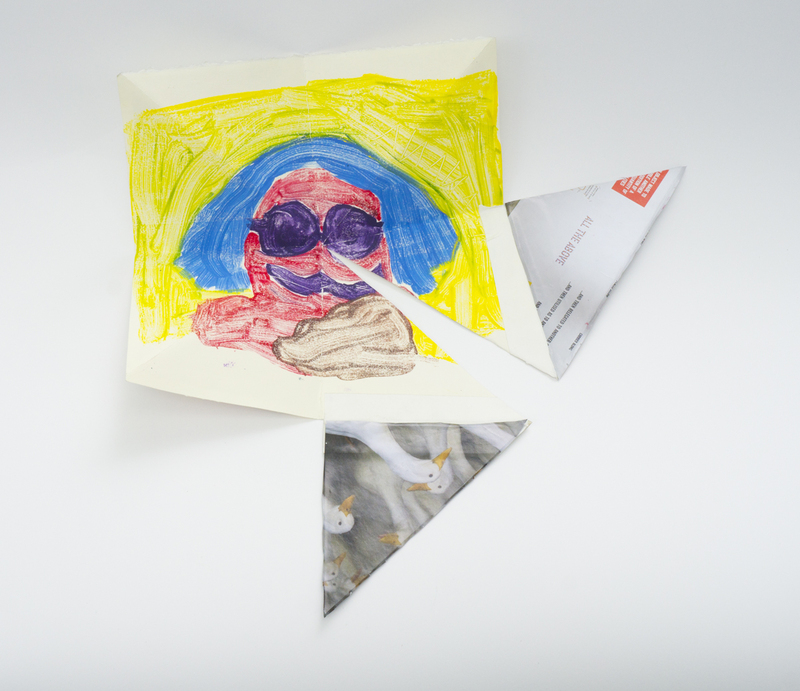 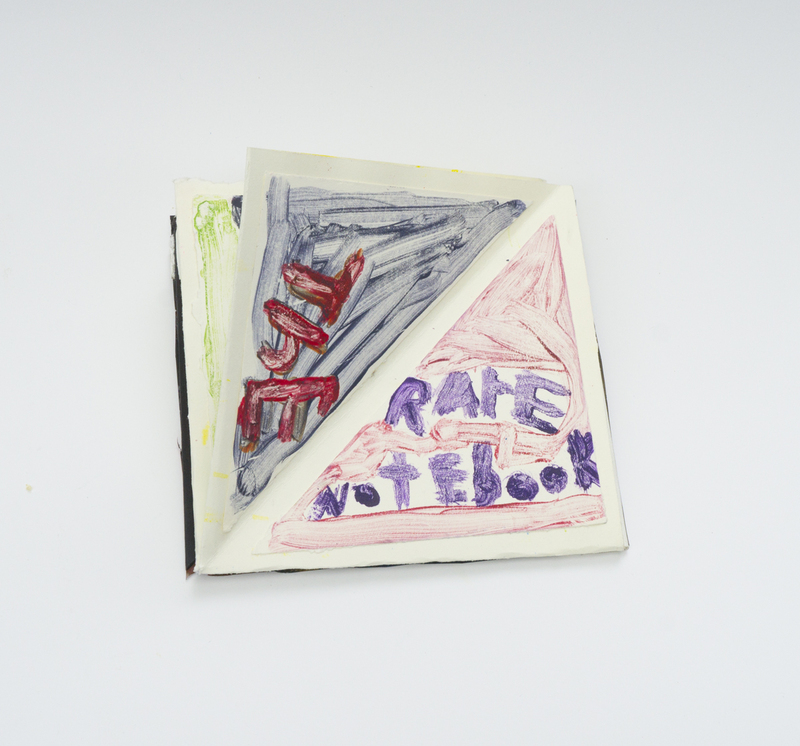 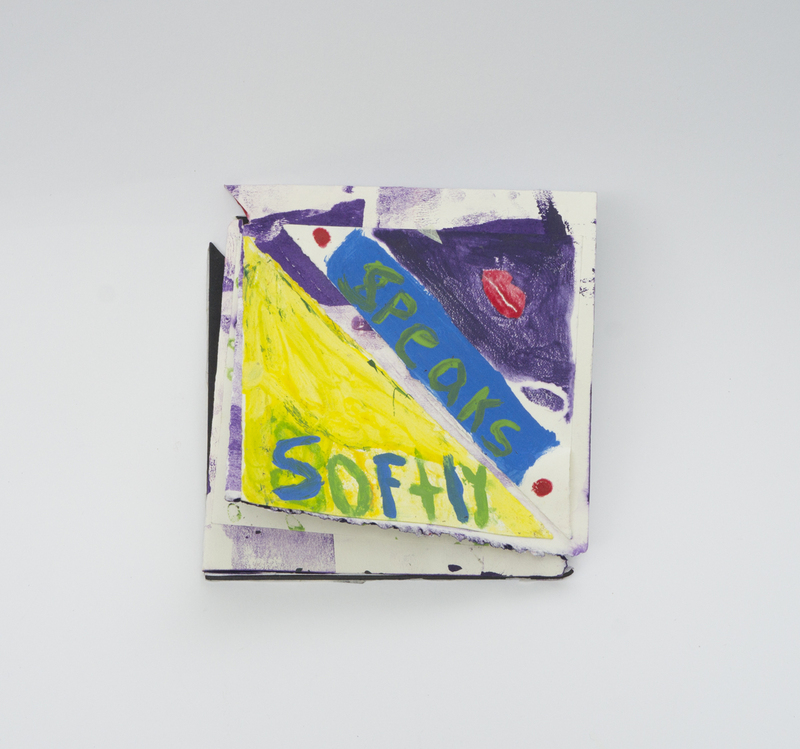 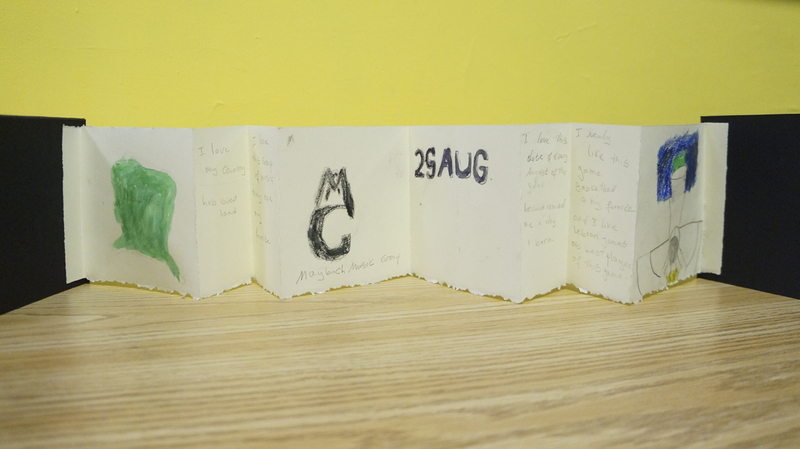 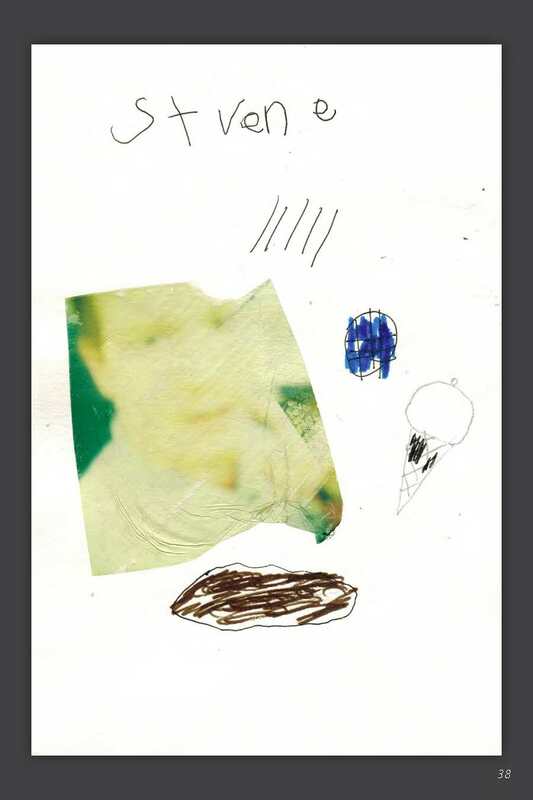 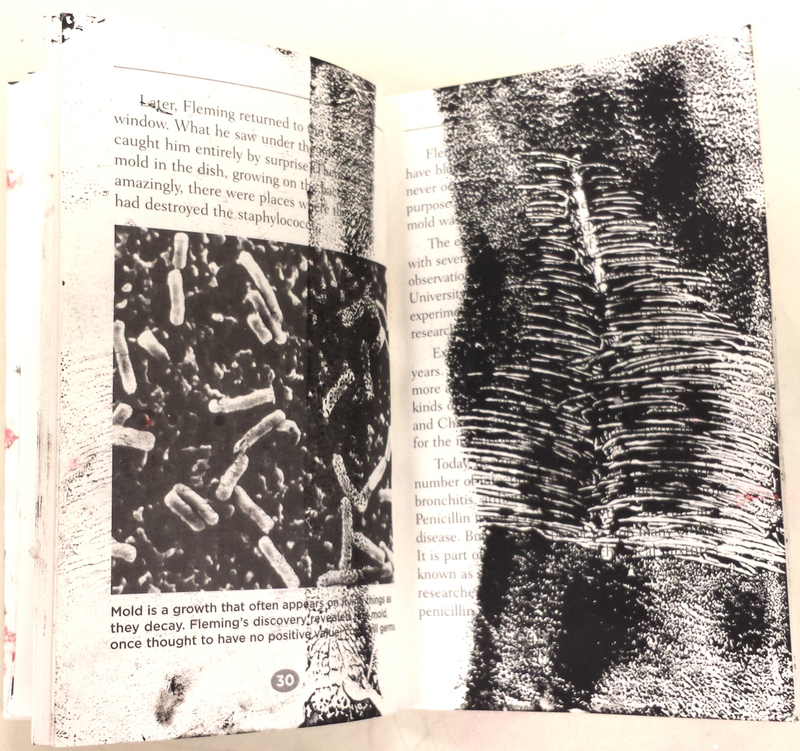 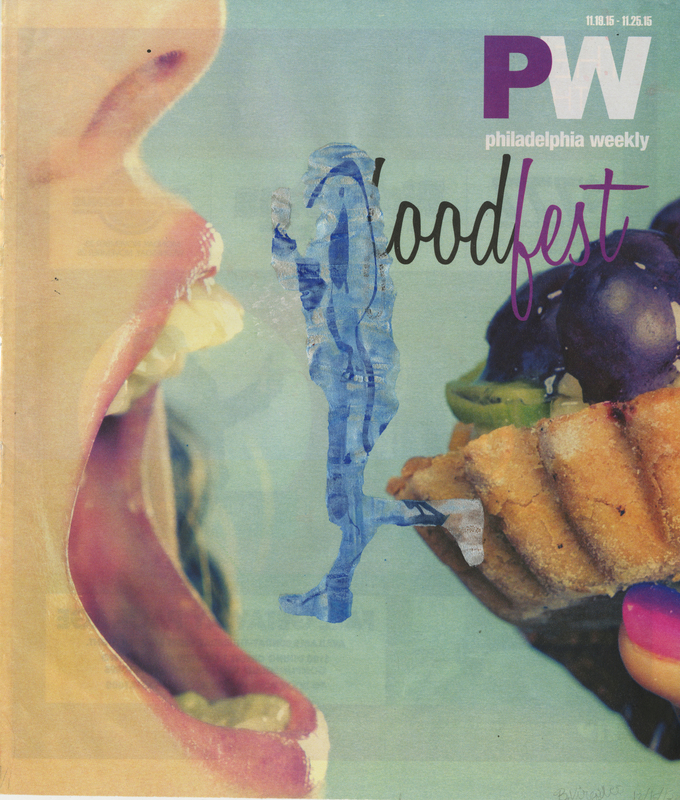 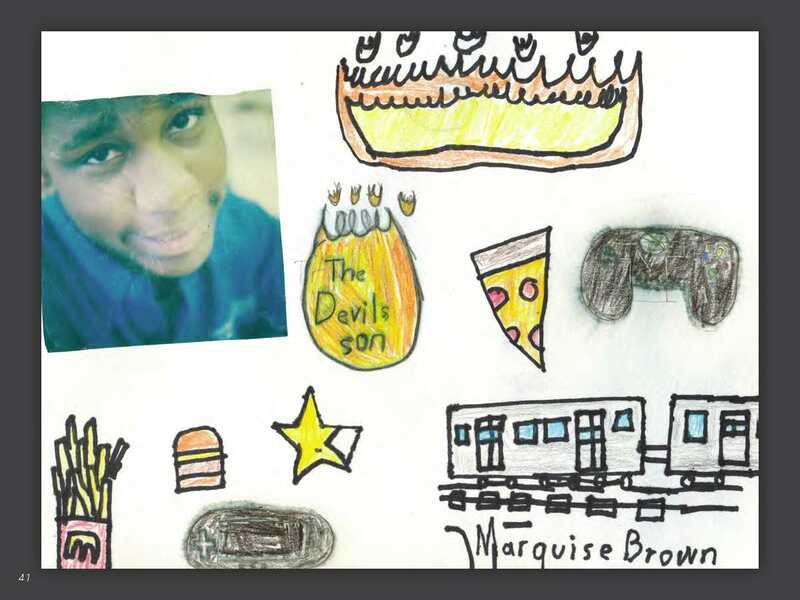 Using the playful method of exquisite corpse poetry and drawing, a group of students from South Philadelphia High School made artist books. 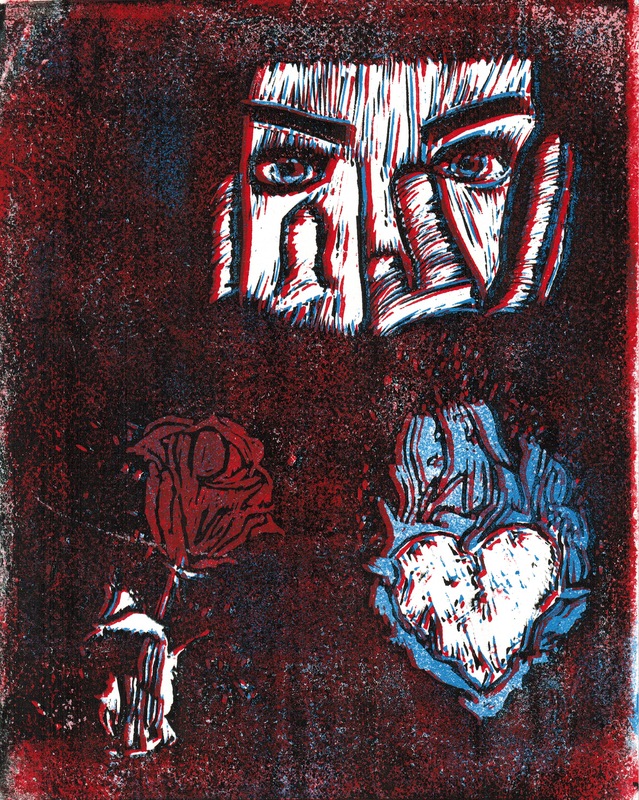 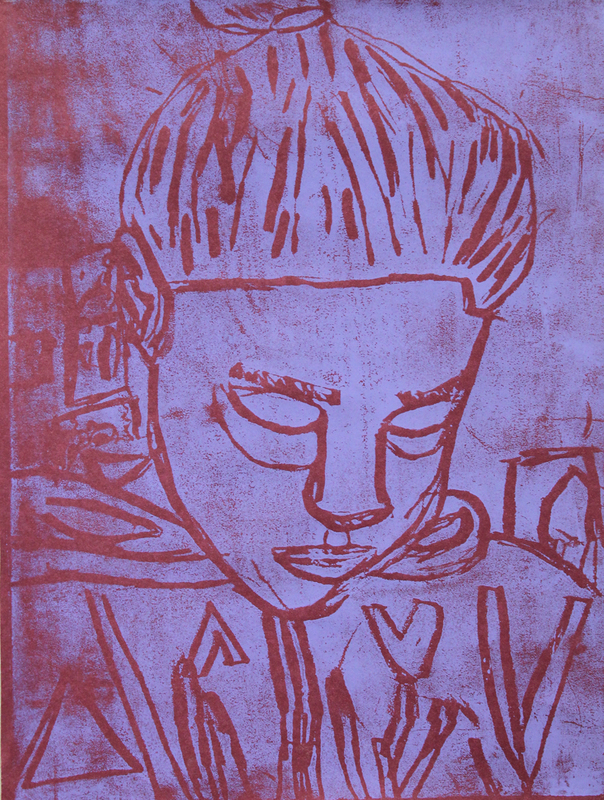 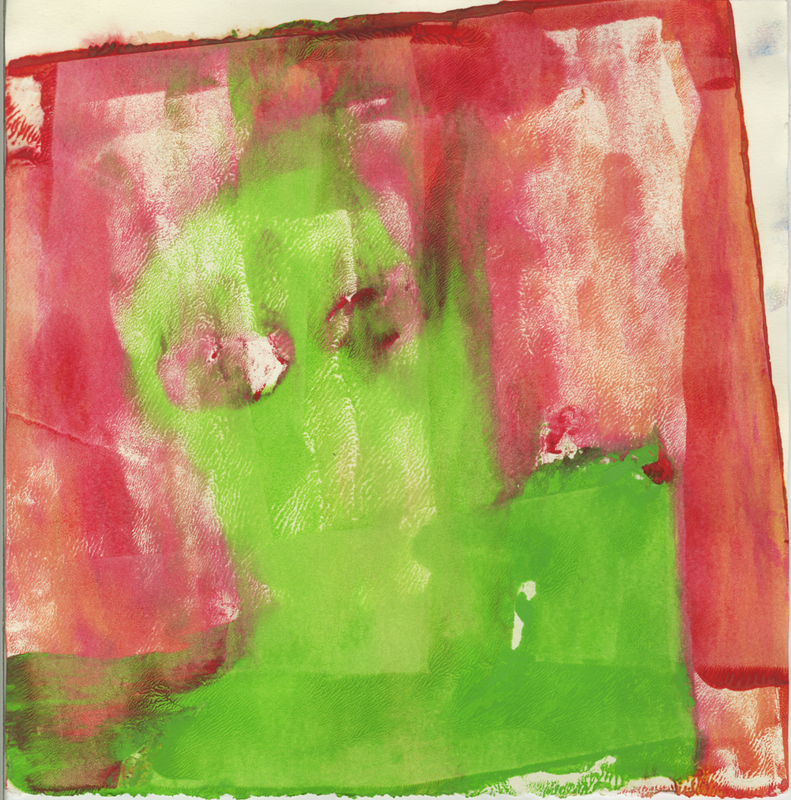 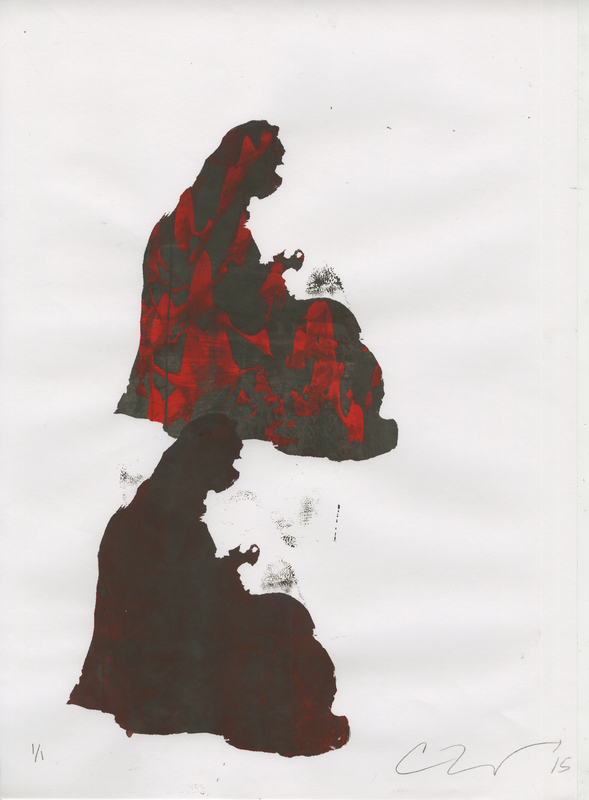 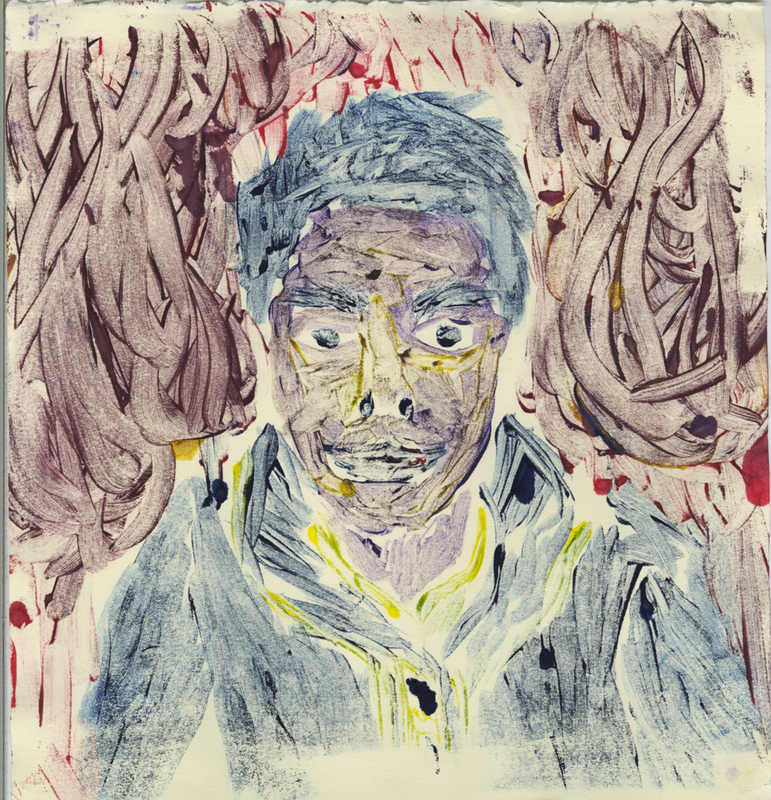 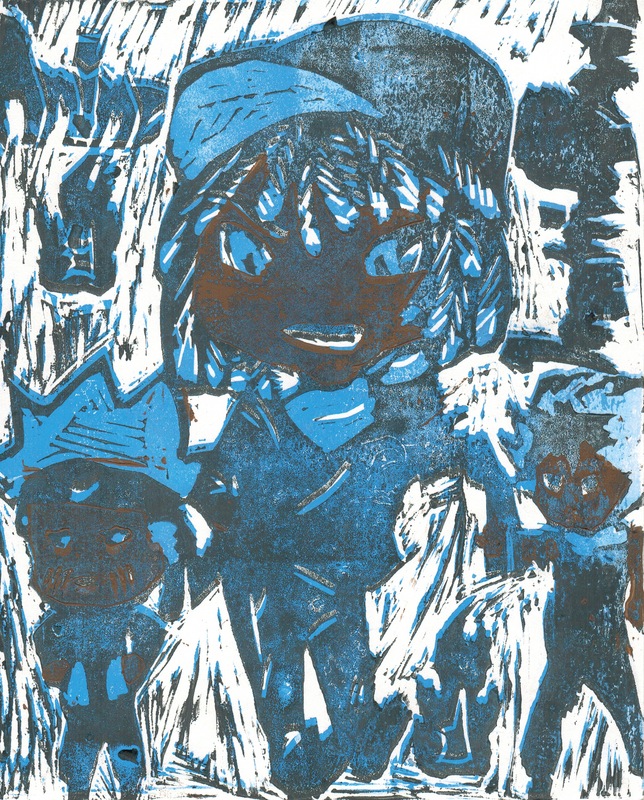 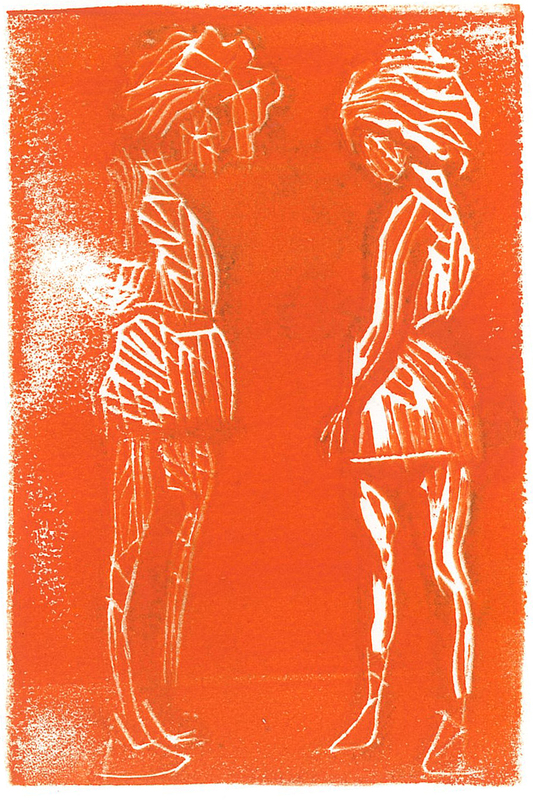 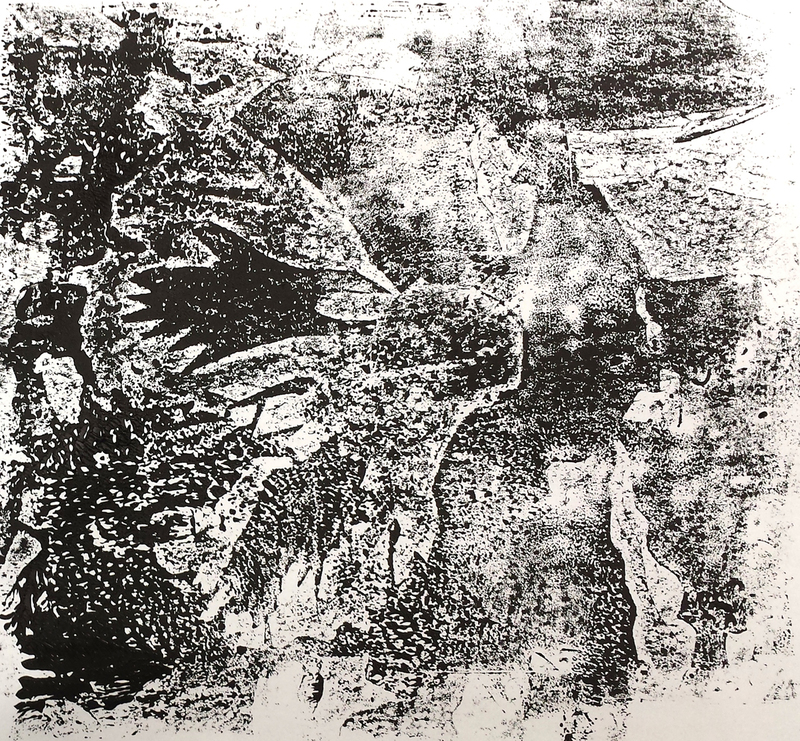 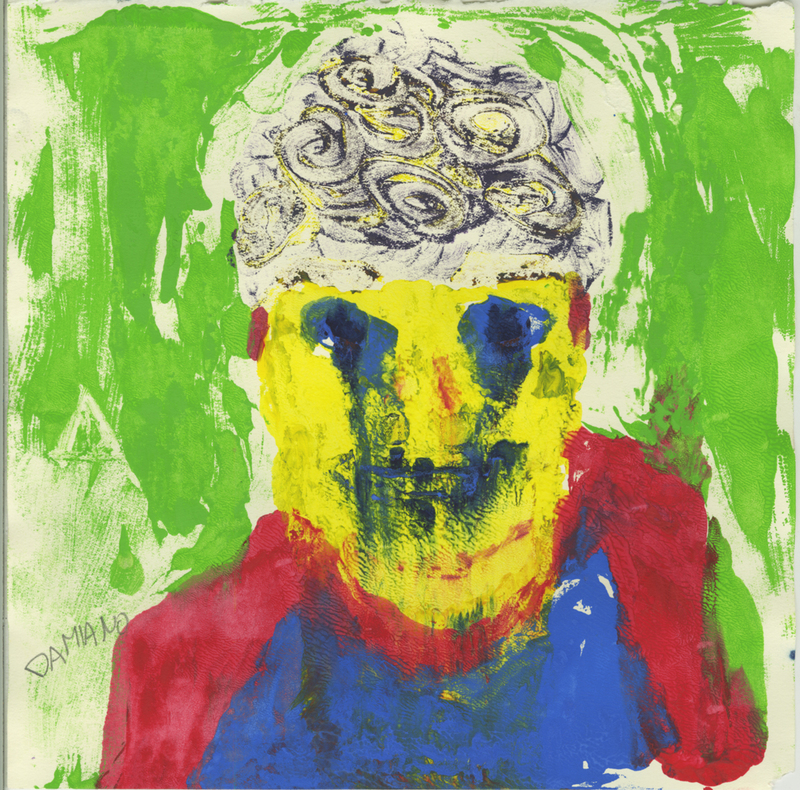 Students created self-portraits using a monotype technique, which were inspired by Michael Mazur's exhibition The Inferno of Dante. 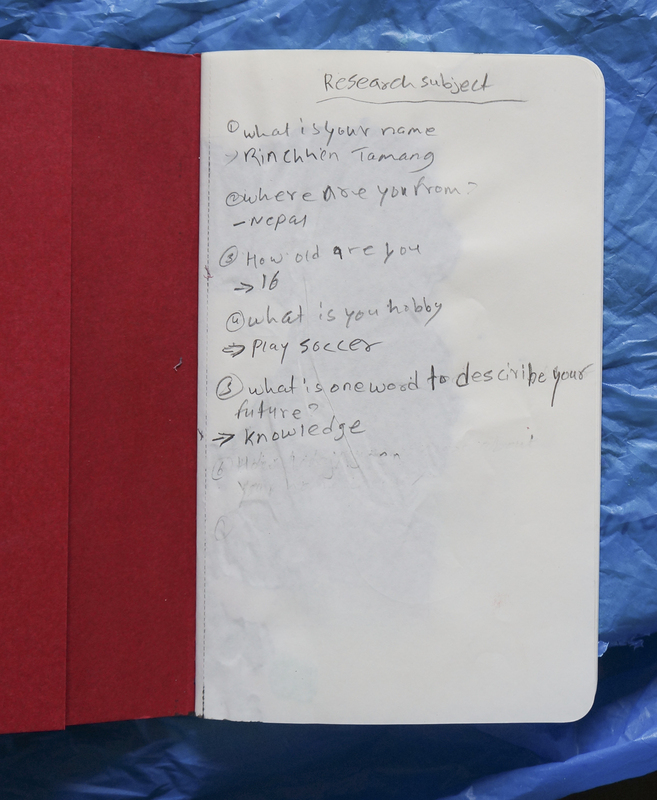 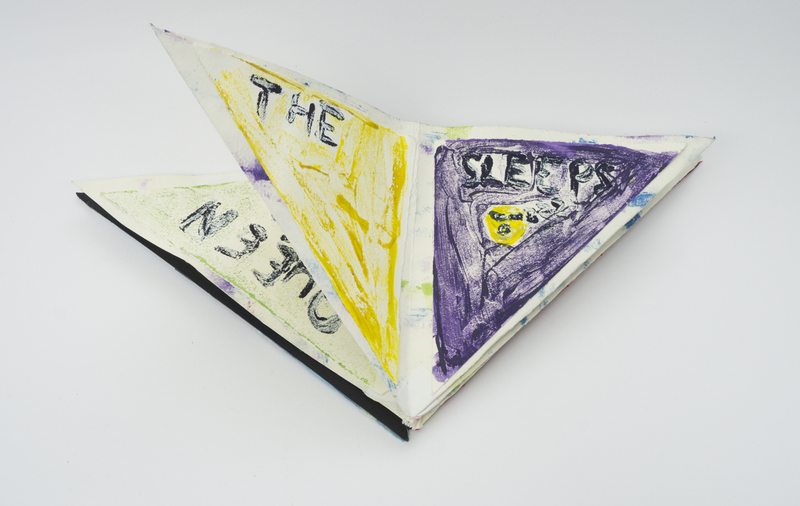 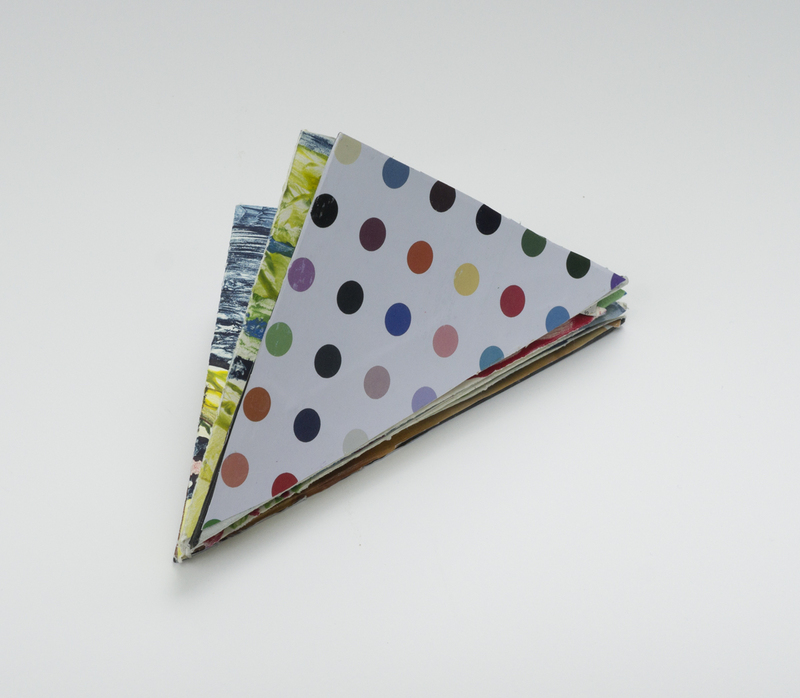 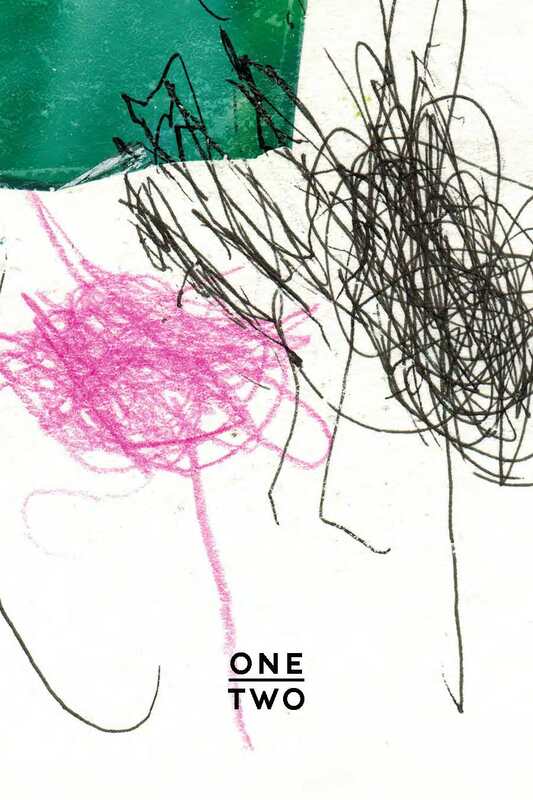 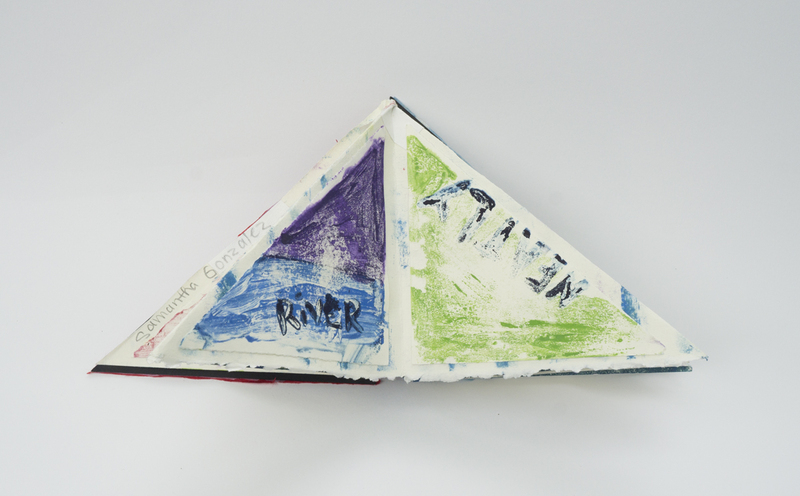 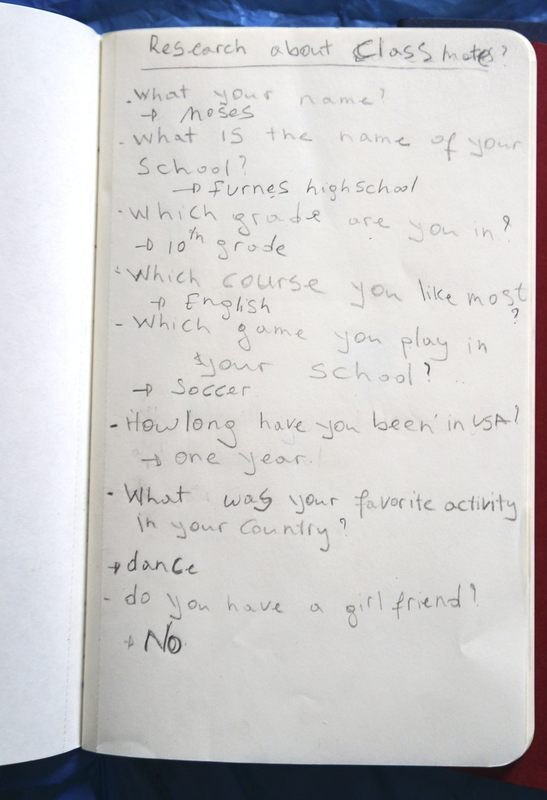 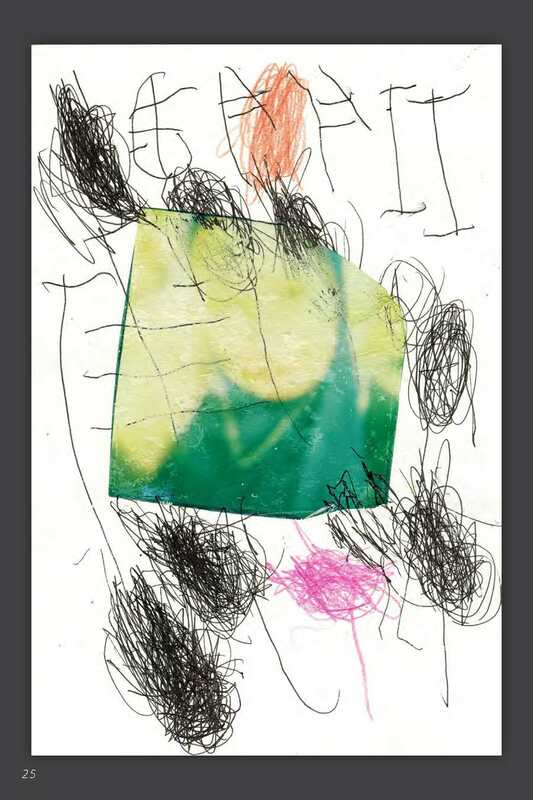 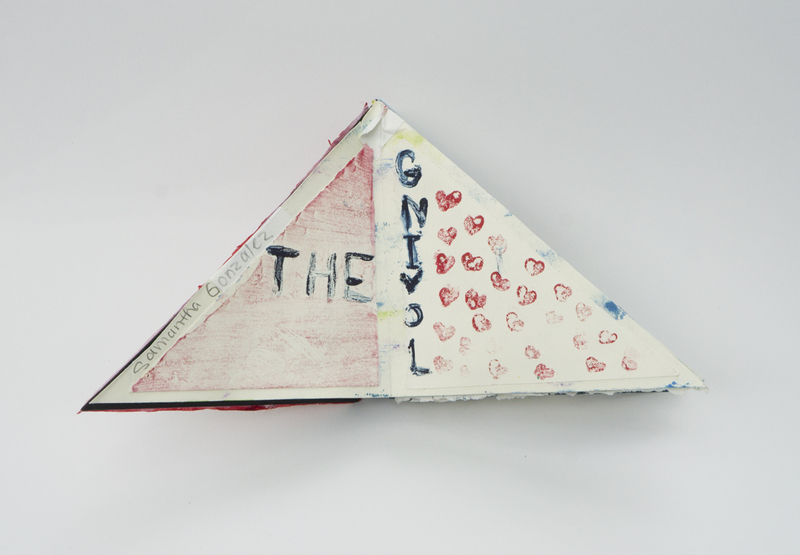 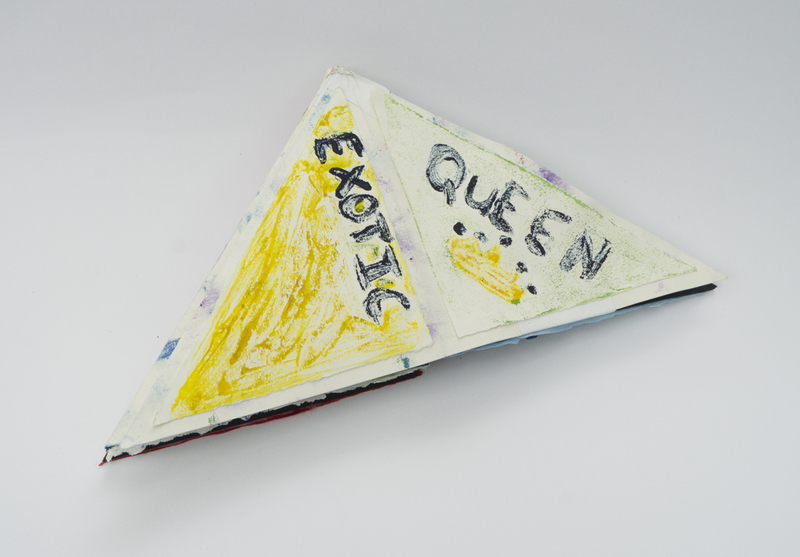 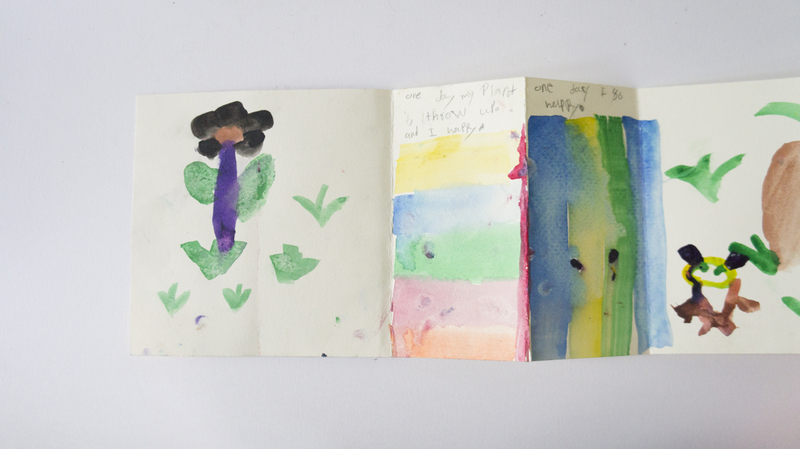 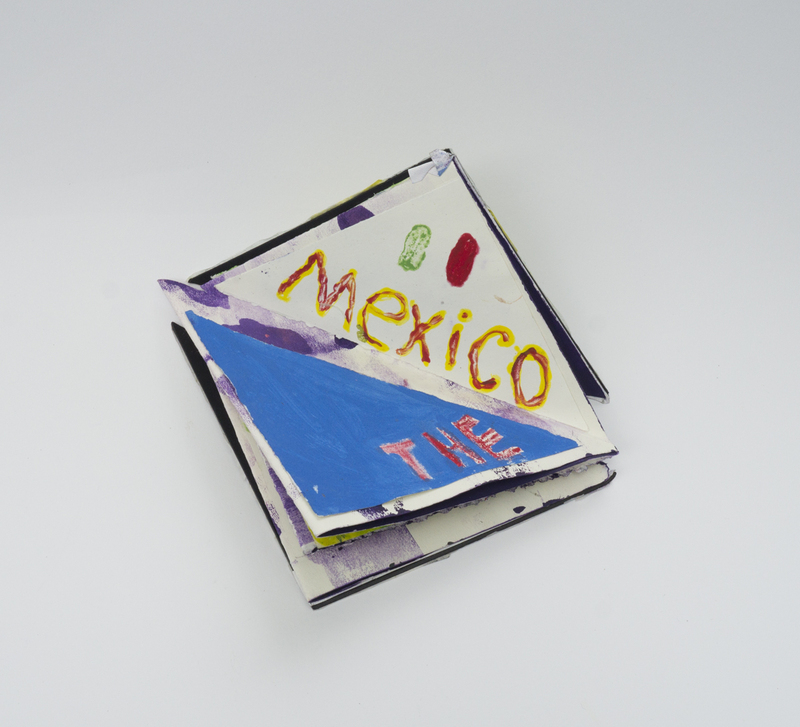 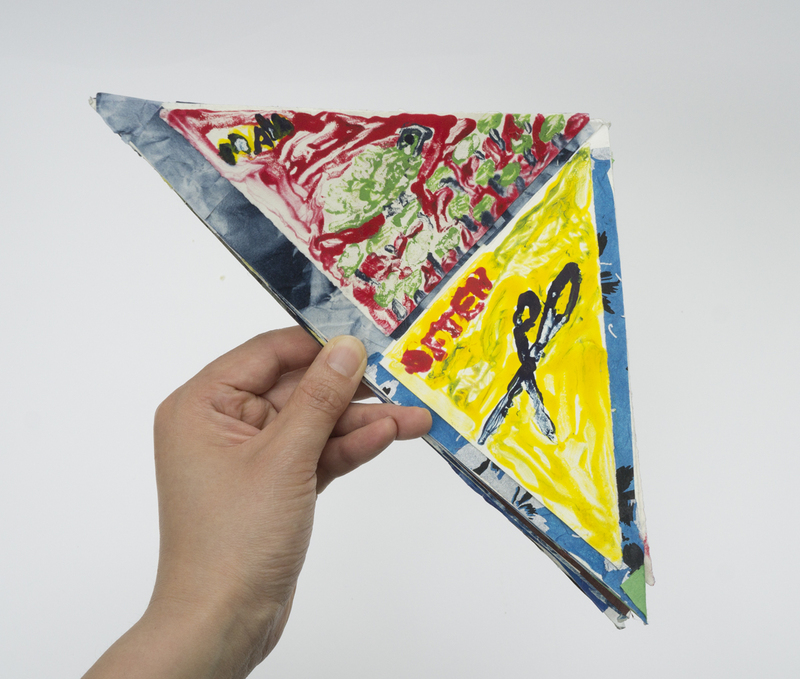 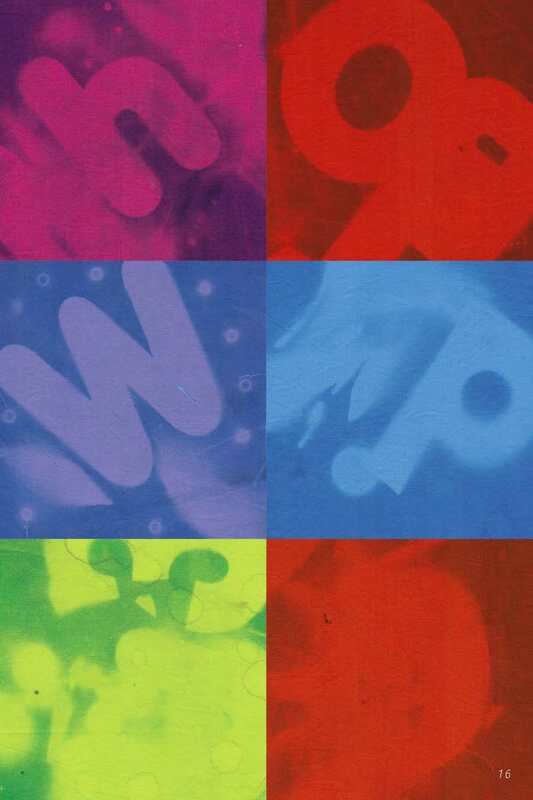 Having both qualities of collaboration and independence in the making of a book gave the students a unique opportunity to experience various contemporary art practices. 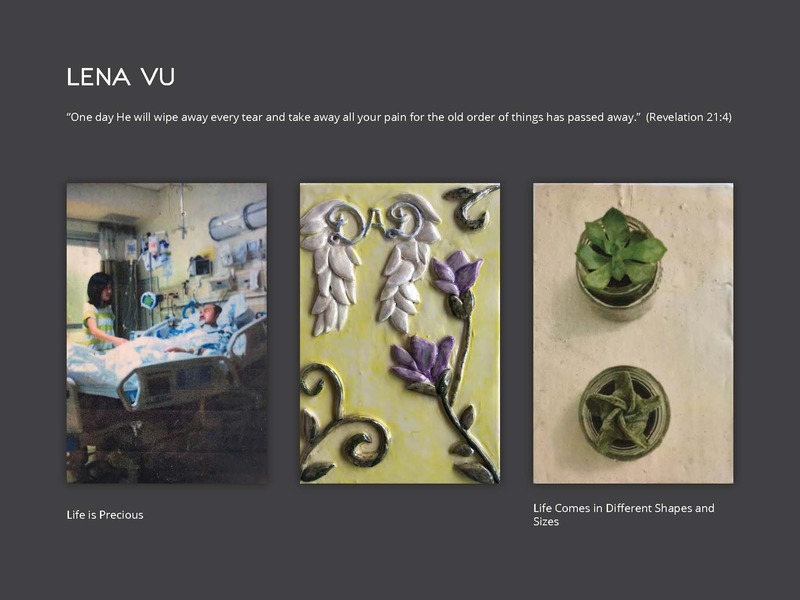 Student-artists in this gallery of work include Chandra Bista, Jayson Johnson, Nam Le, Erika Martines, Damiano Mavilla, Phyau Phyau, Ryan Po, Aliyah Satchell, Dinh Vong and ChenTao Ye. 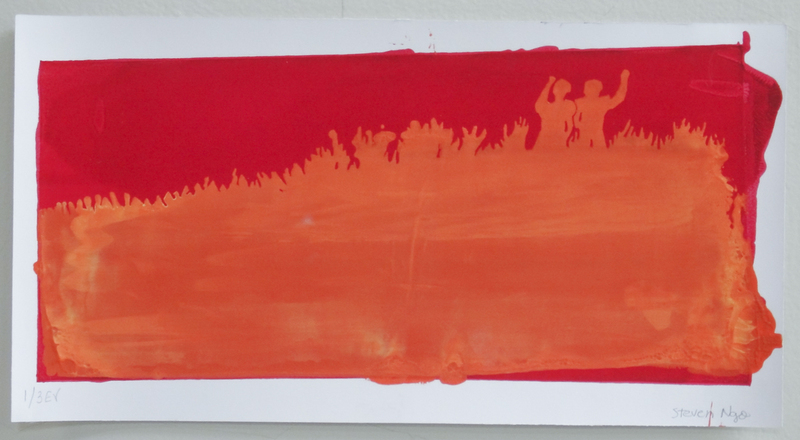 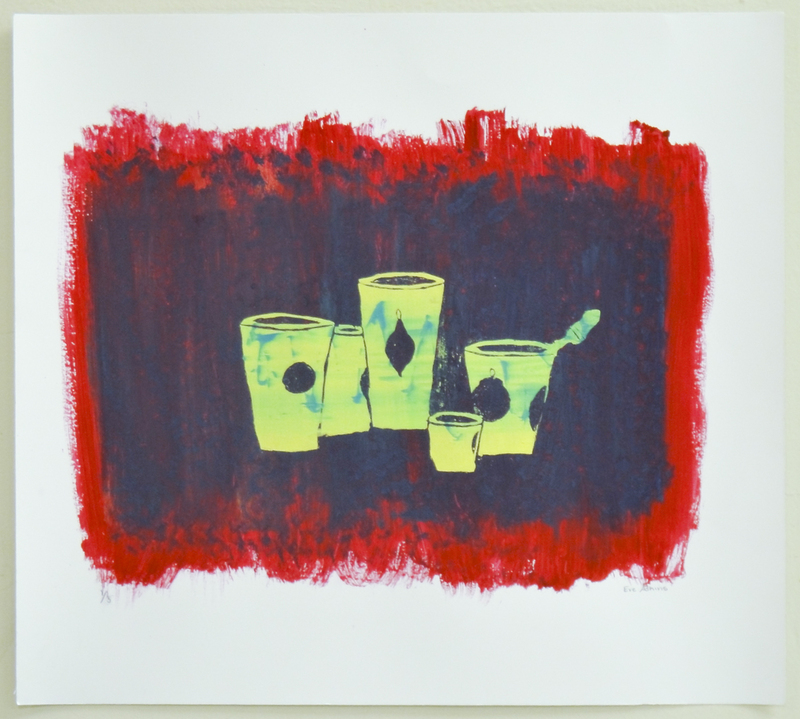 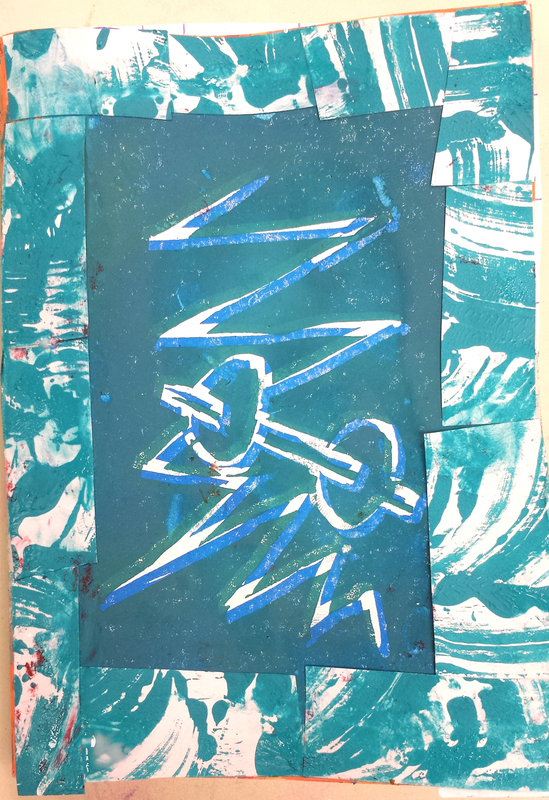 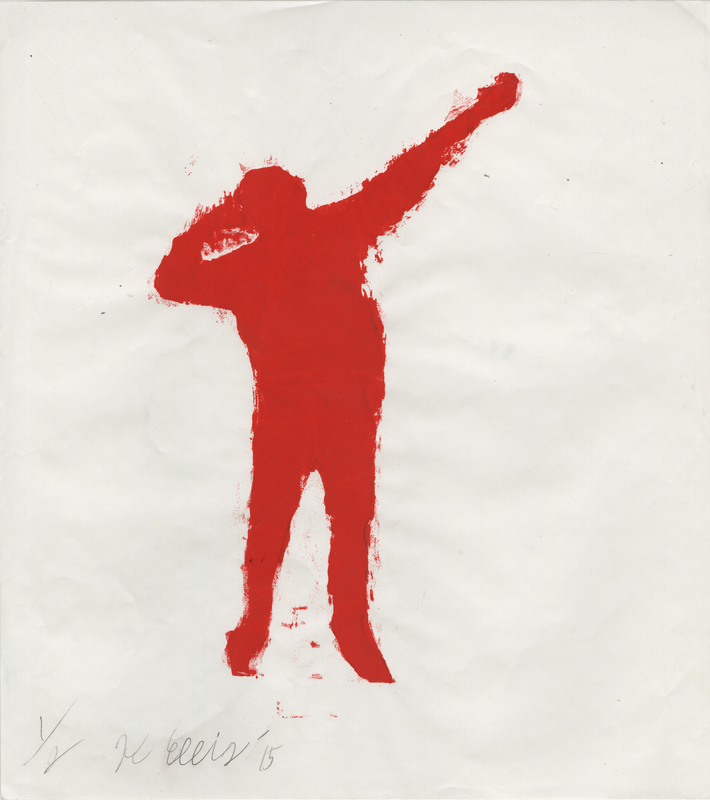 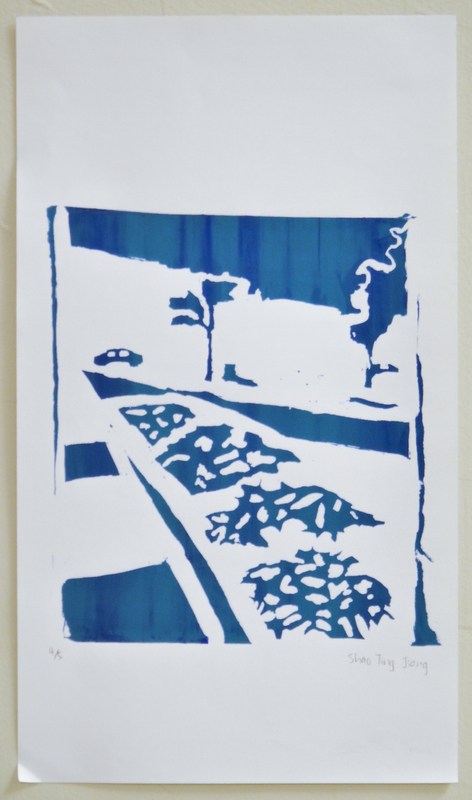 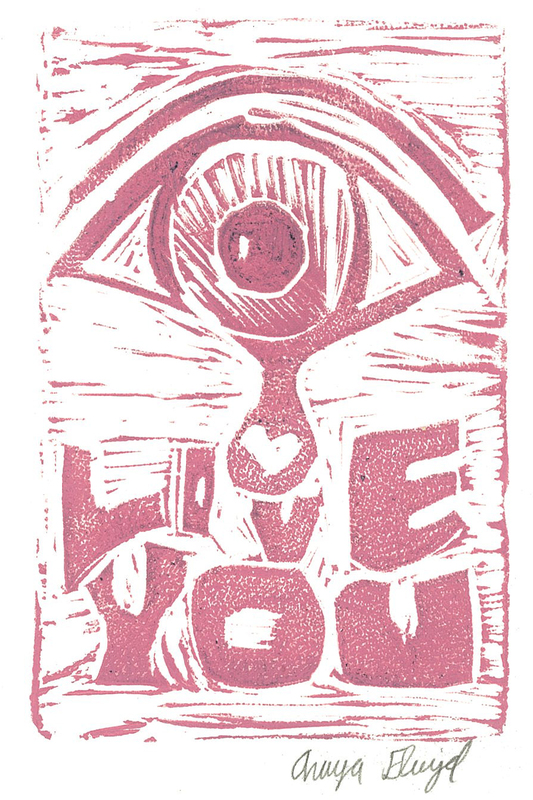 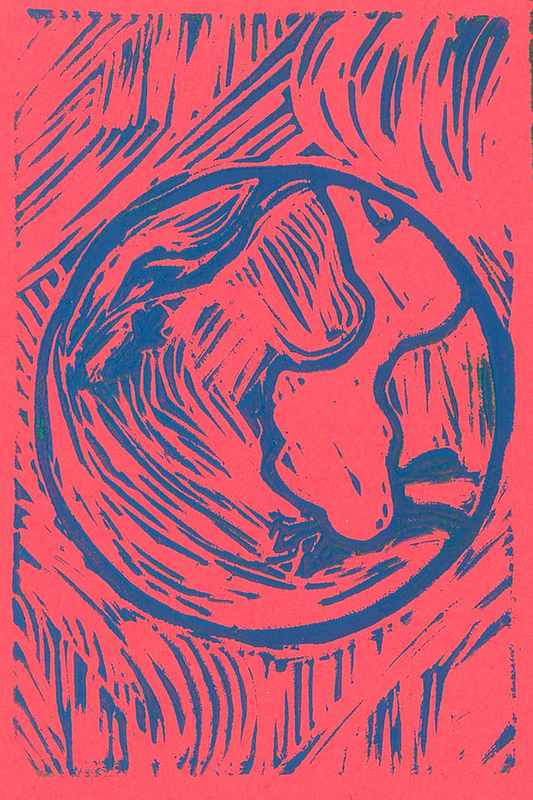 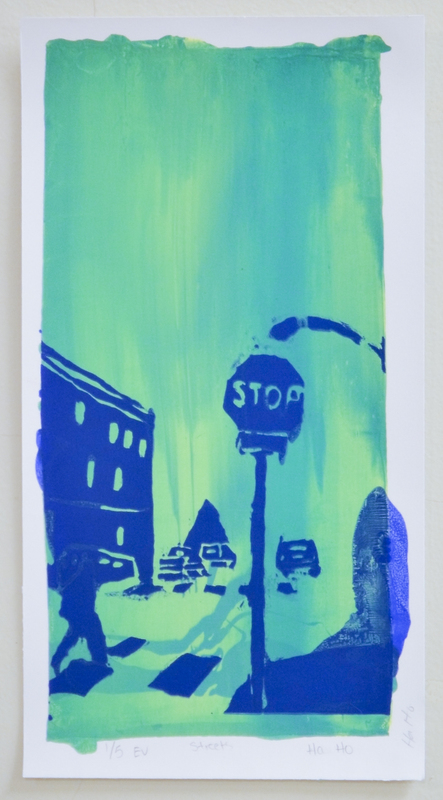 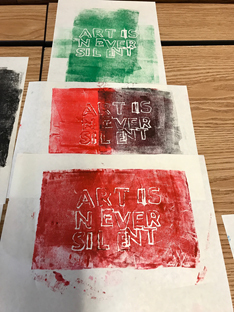 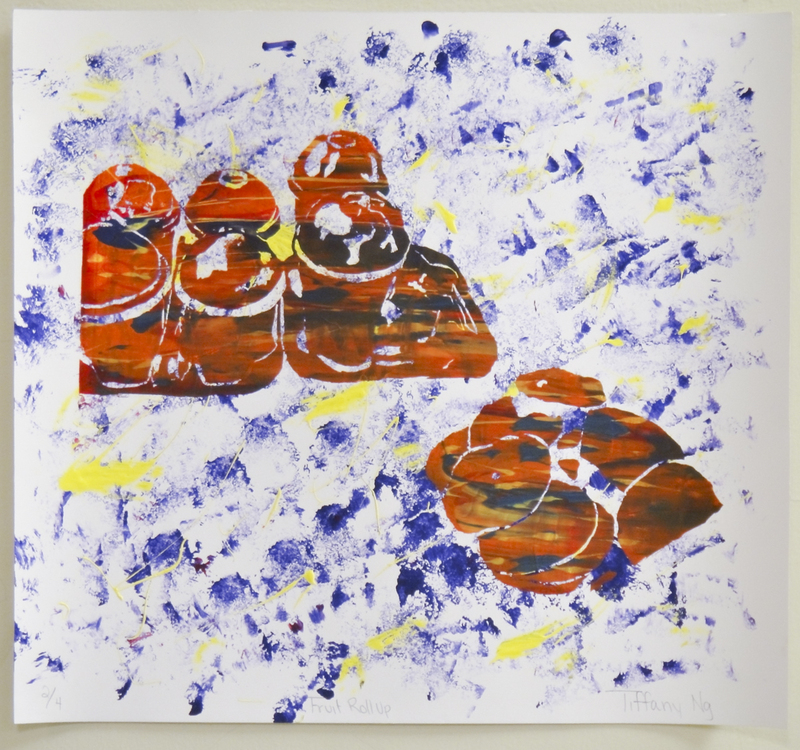 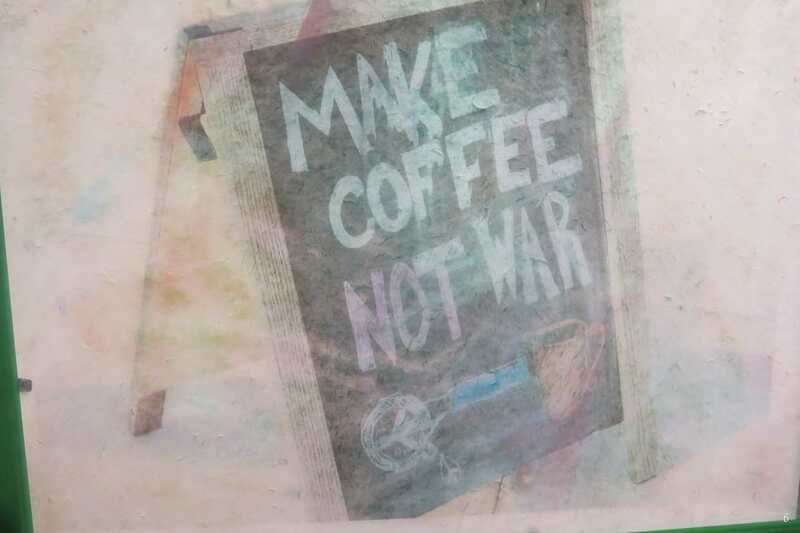 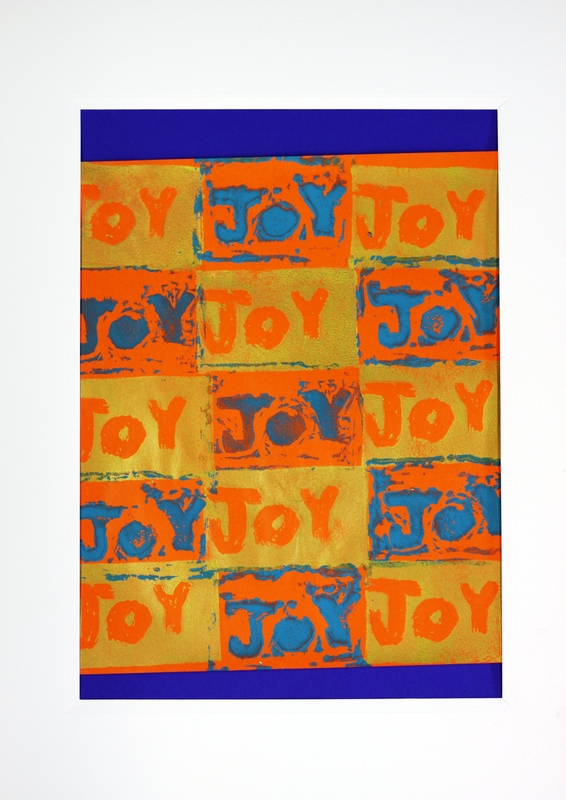 Based on the idea of the “Celebrating the Everyday,” students created monoprints using screenprinting techniques. 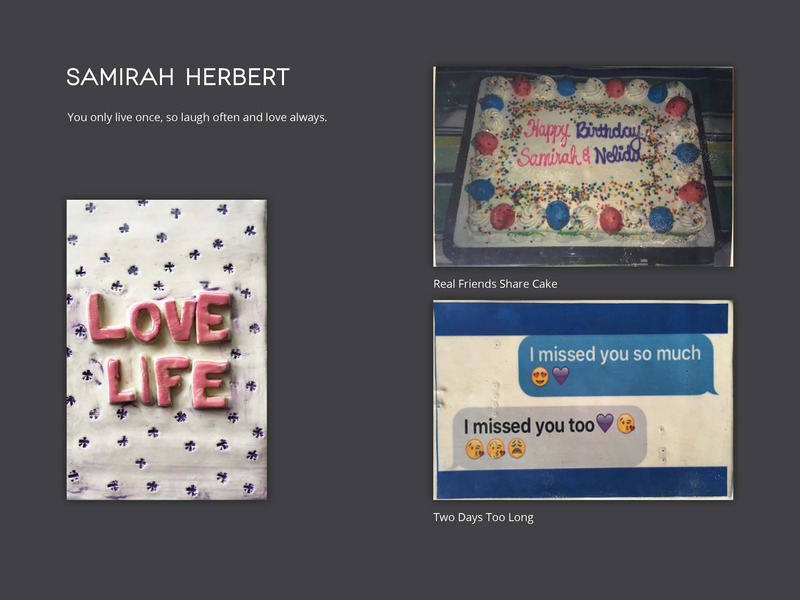 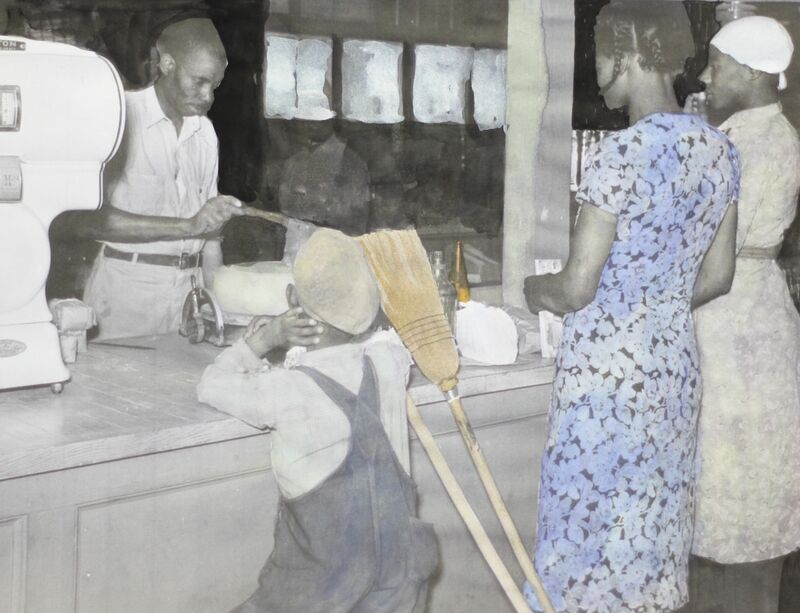 Each week, they collected images or objects that were a familiar part of their everyday lives. 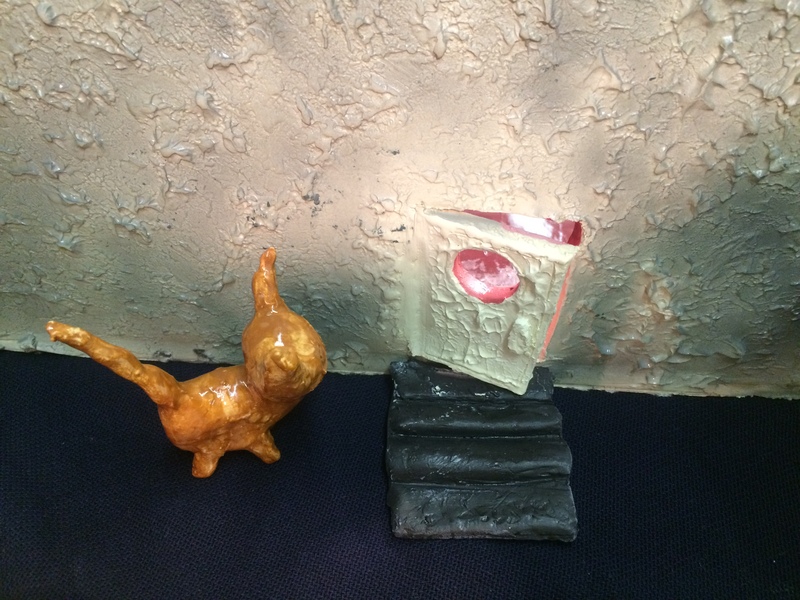 These objects were rendered on silkscreens using Speedball Screen Filler. 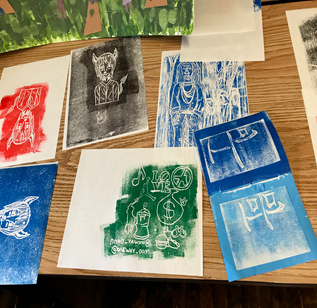 During the printing process, students manipulated their prints by repeating and layering images and/or changing ink color. 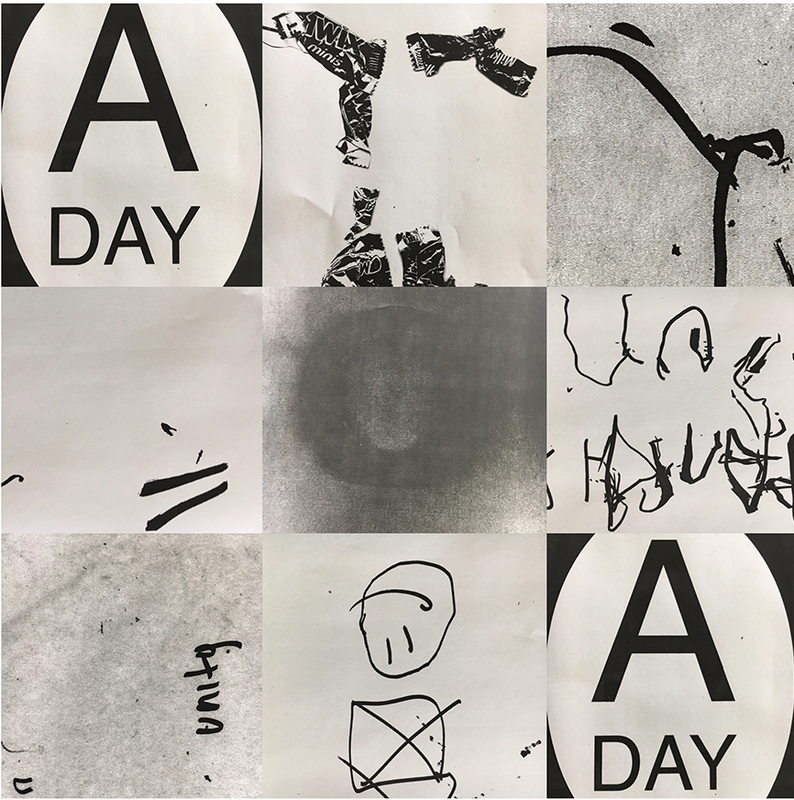 In this way, students created various versions of their everyday object print while producing a rich investigation of the extraordinariness of mundane moments. 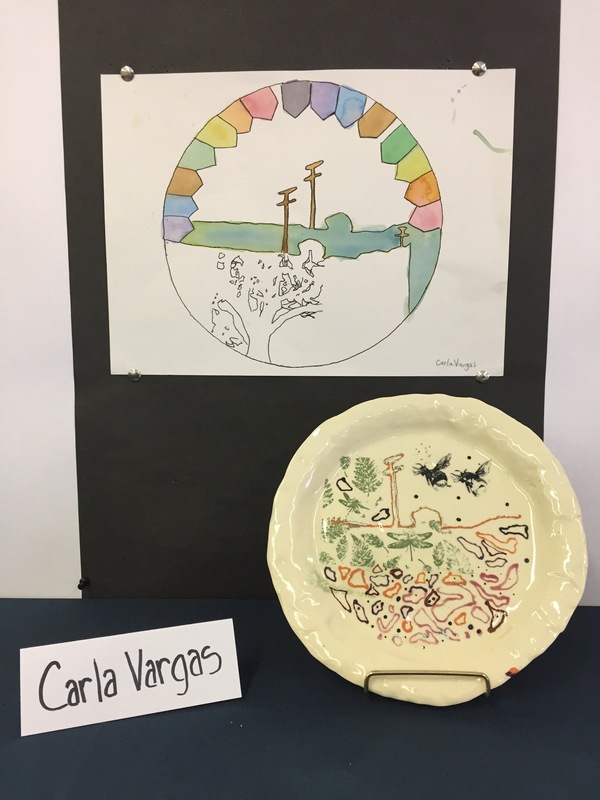 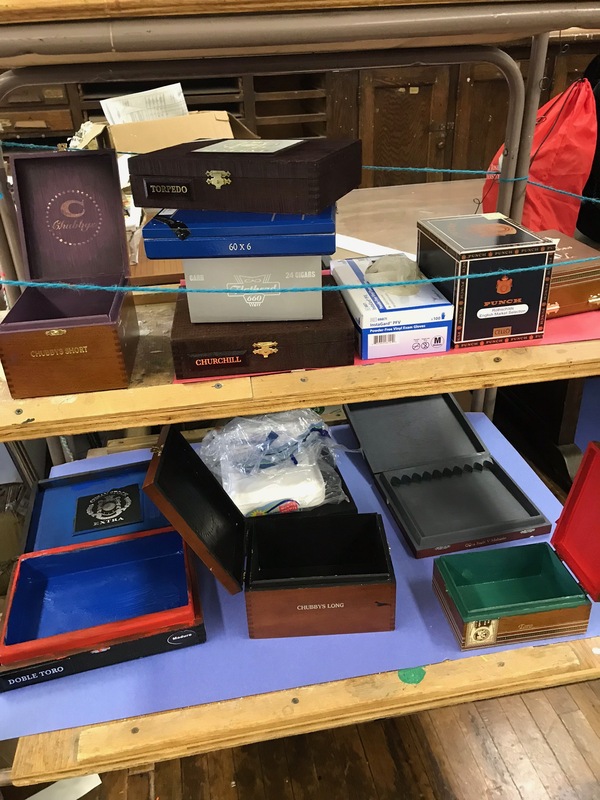 Student-artists in this gallery of work include Eve Adkins, Kimberly Alfaro, José L. Bchista, Tatiana Garrison, Ha Ho, Ada Huang, Giovanni Negron, Tiffany Ng, Steven Ngo, Kelly Son, Maria Tapia and Shao Ting. 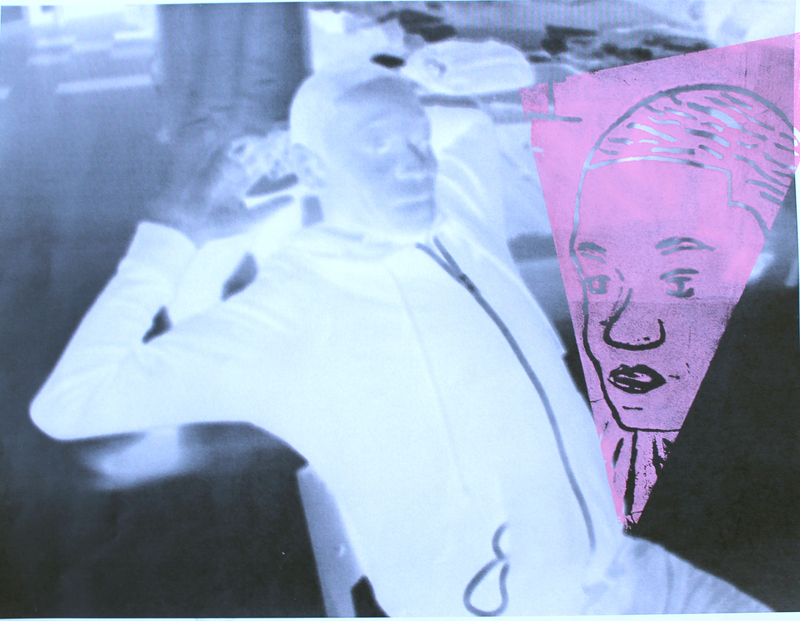 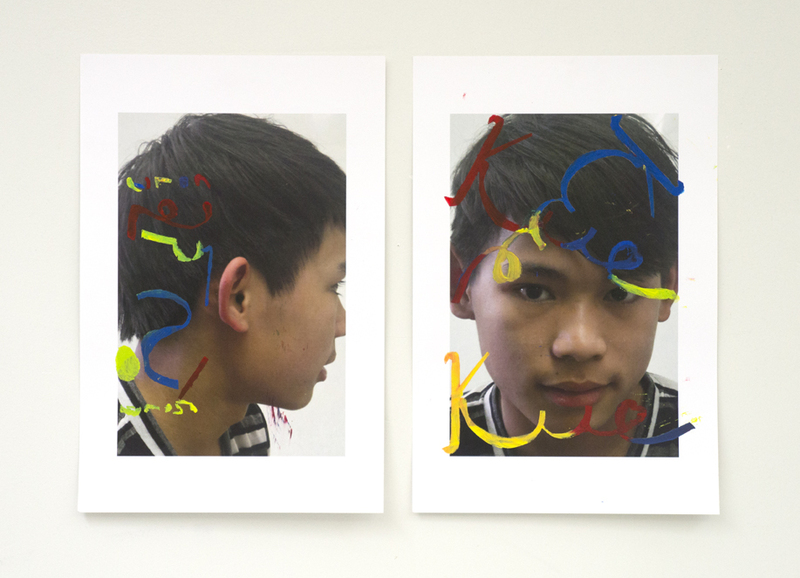 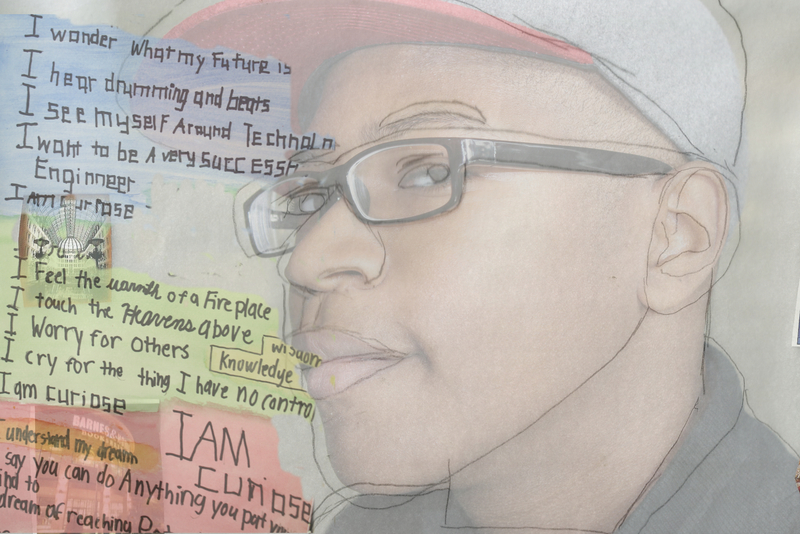 Students at the School of The Future examined self-portraiture. 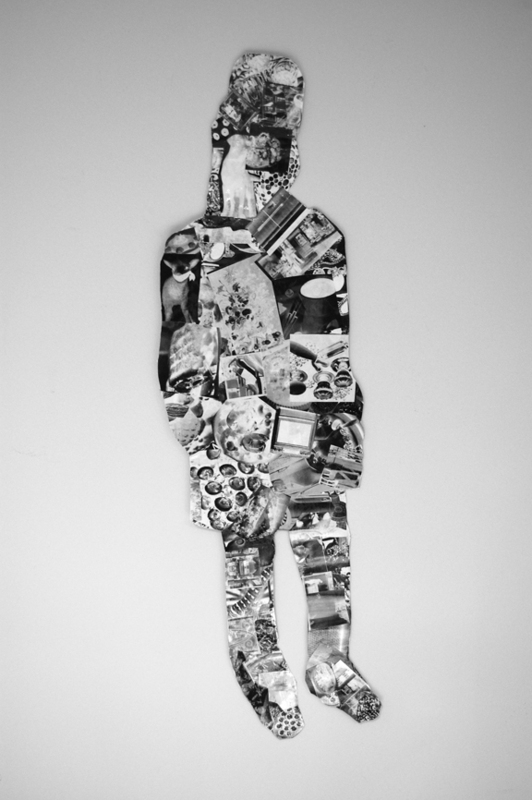 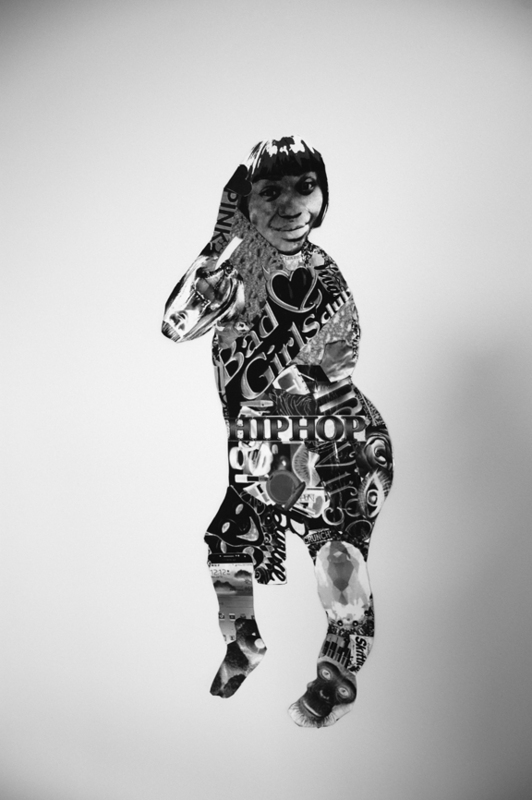 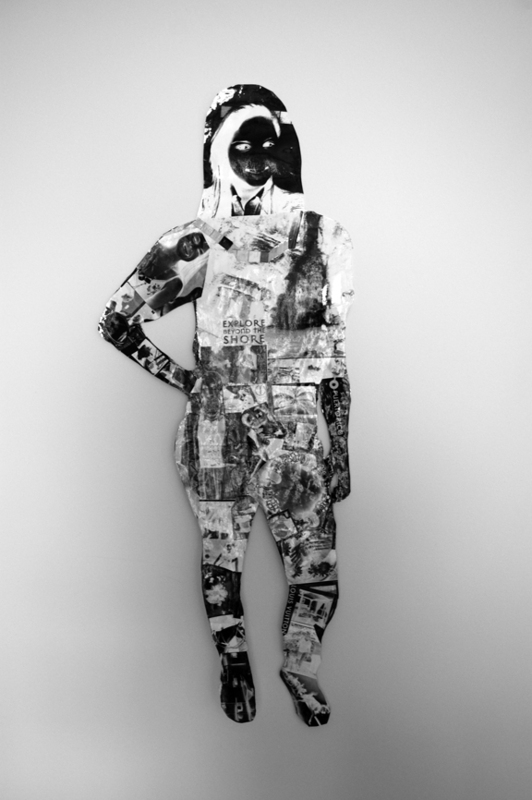 They photographed themselves while conducting everyday activities and used those images to create self-portraits that explored the various iterations of self through the use of fragmented photographs, relief printing and collage. 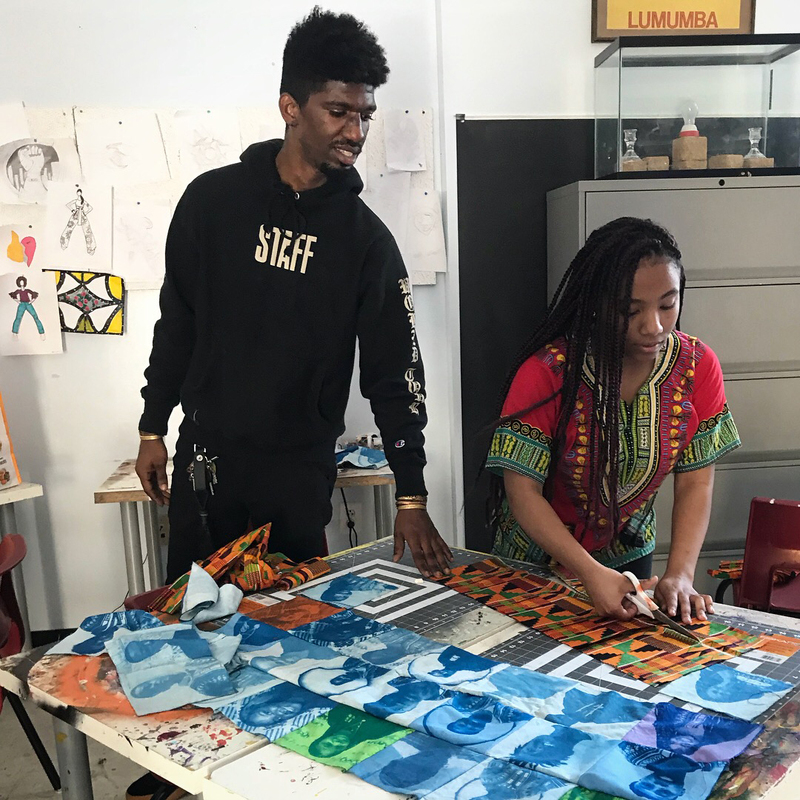 Student-artists in this gallery of work include Shareef Bolger, Faith Chappel, Walter Cooper, Mosky Georges, Shawna Harris, Diane Henderson, Dwayne Jackson, Zahfir Moore, Aliya Nokes, Elisa Riggs and Vivian Tran. 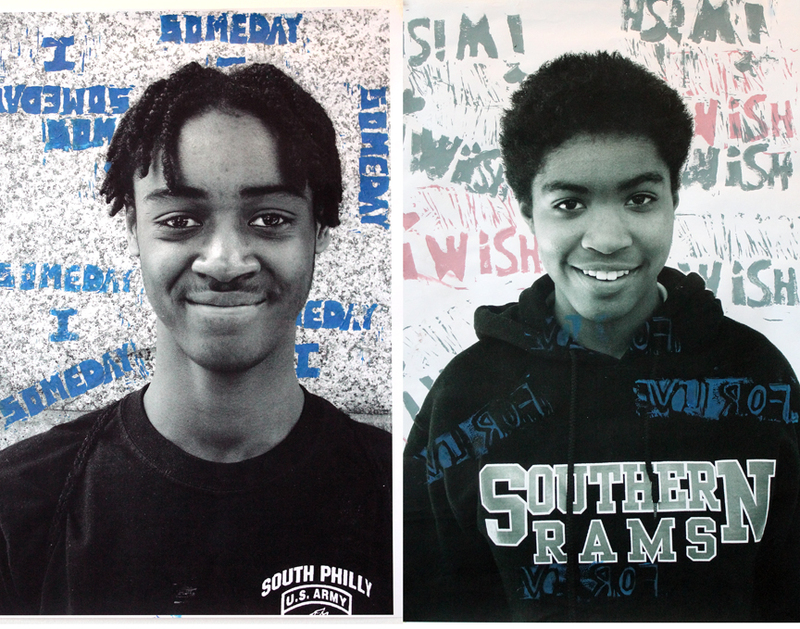 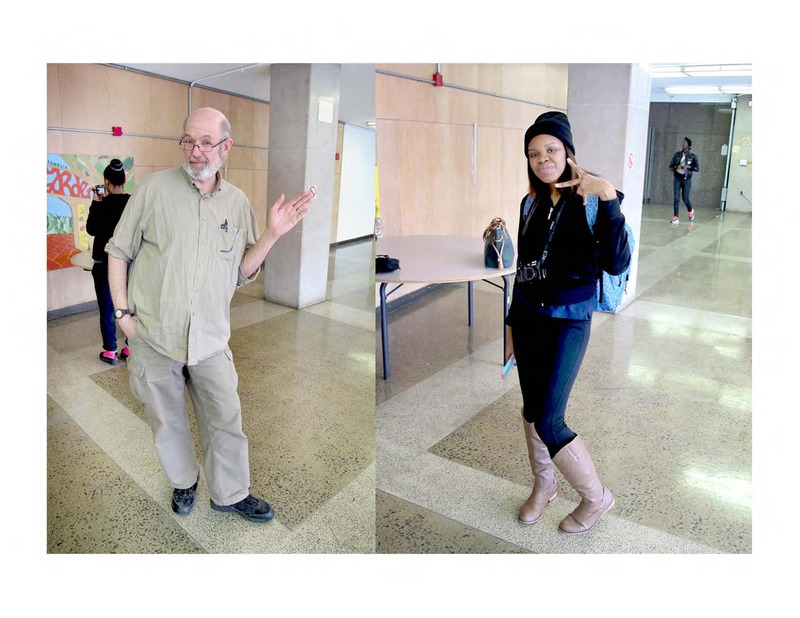 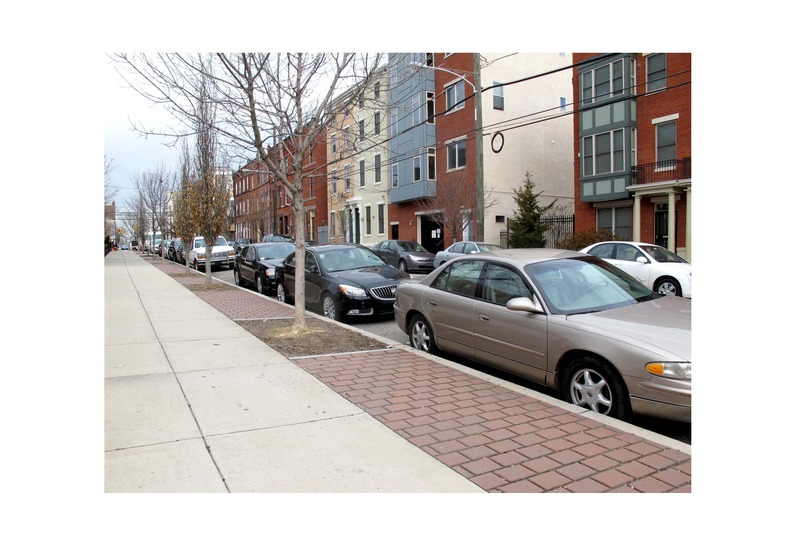 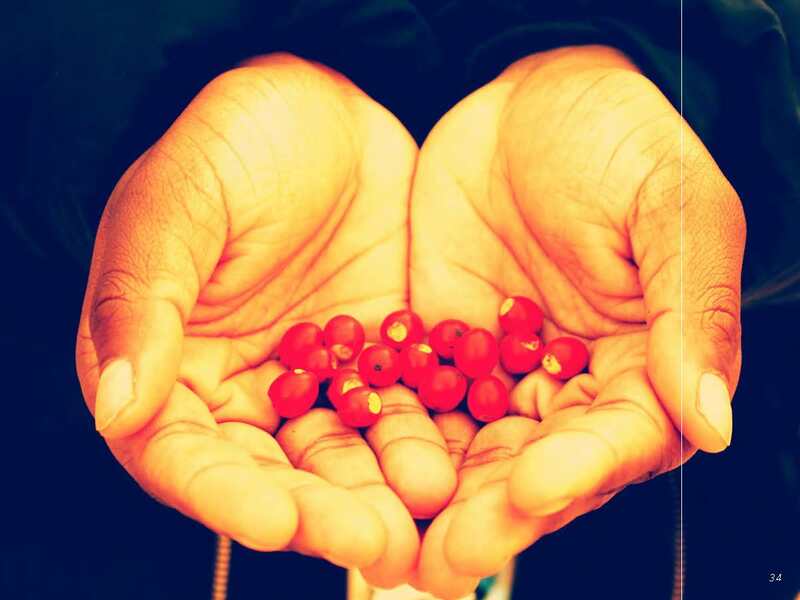 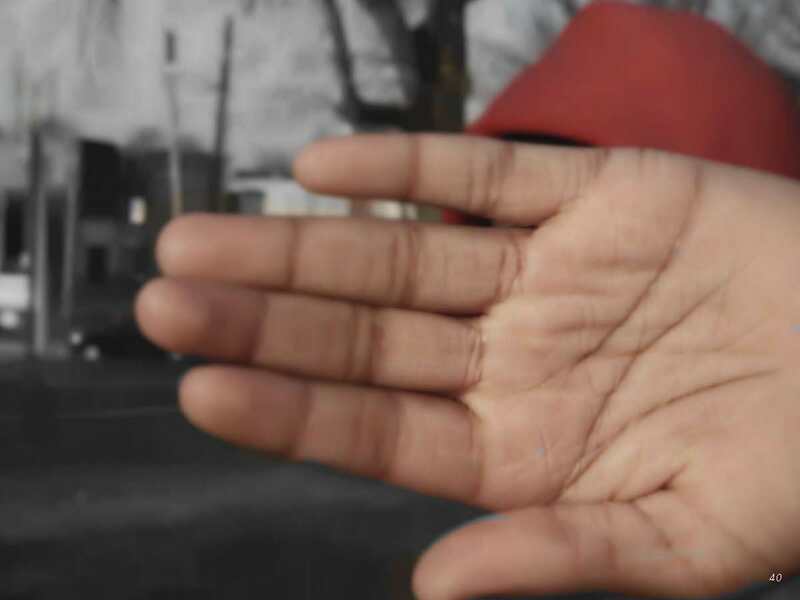 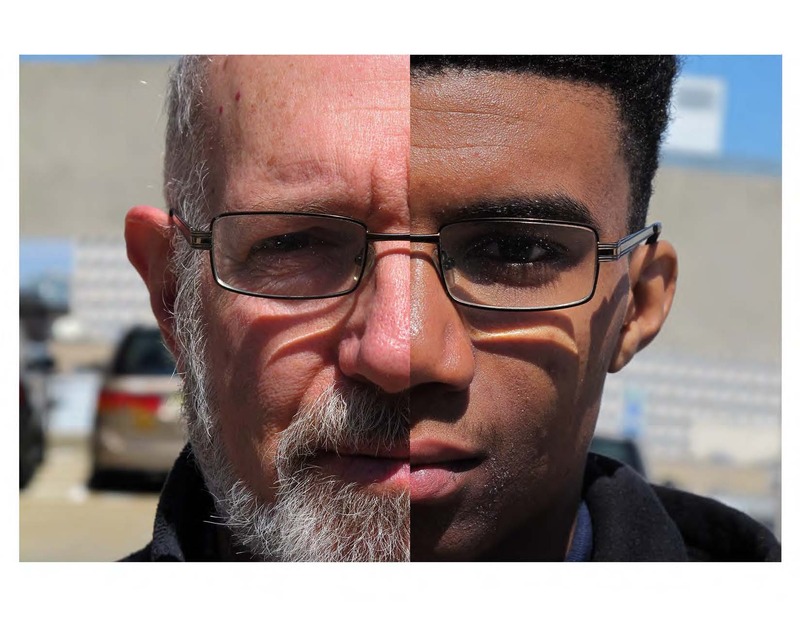 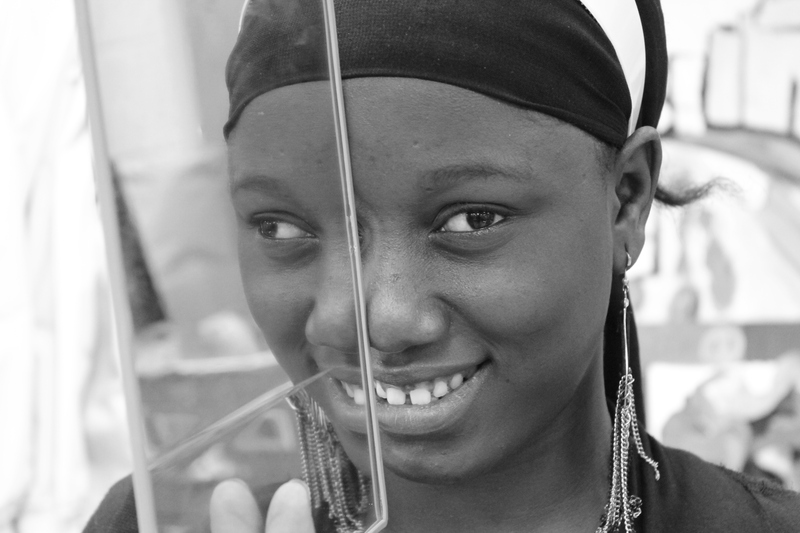 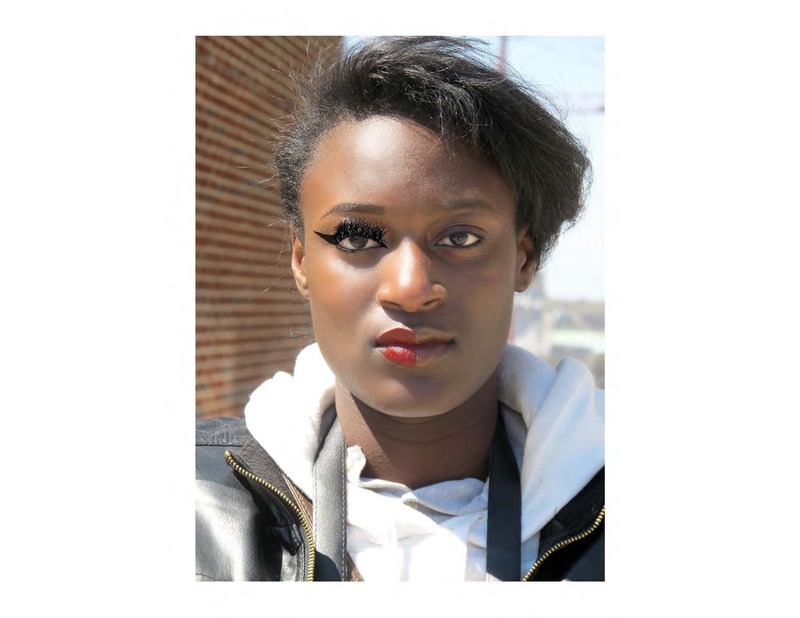 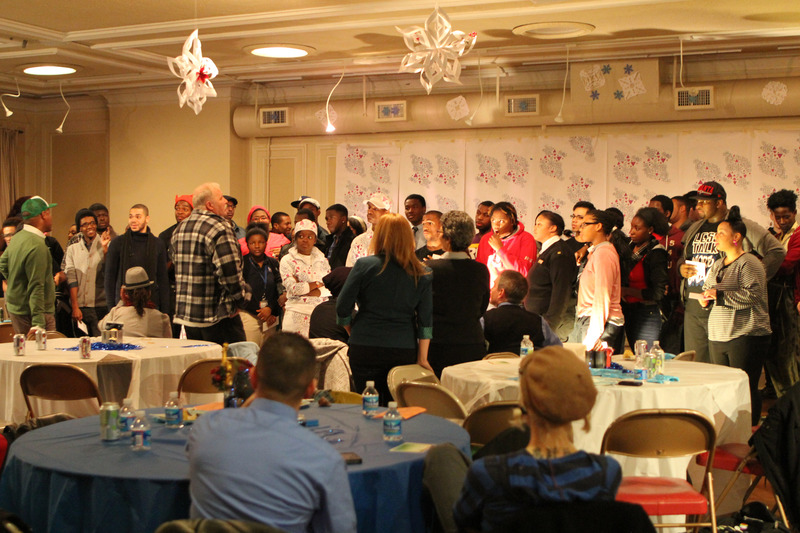 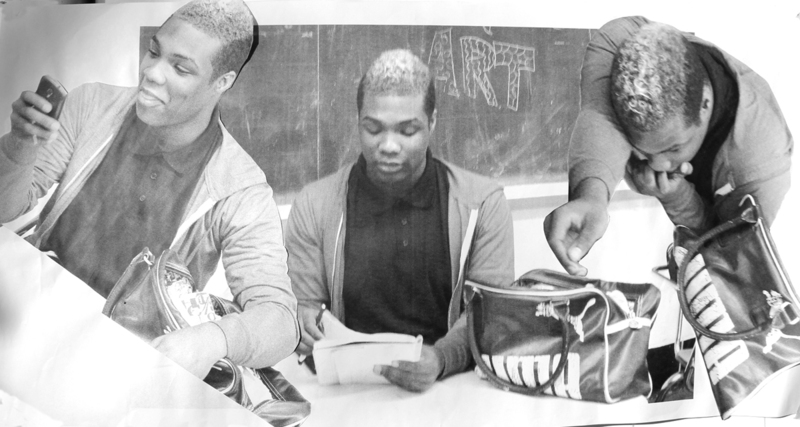 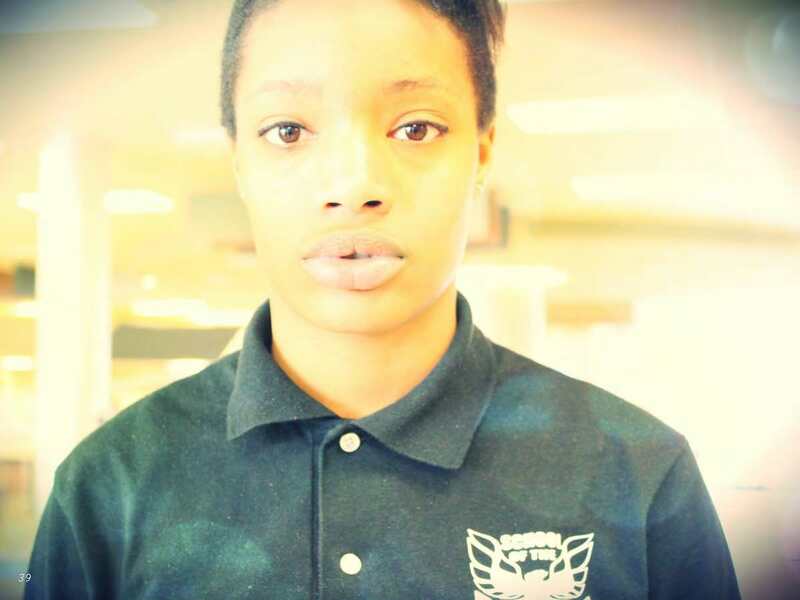 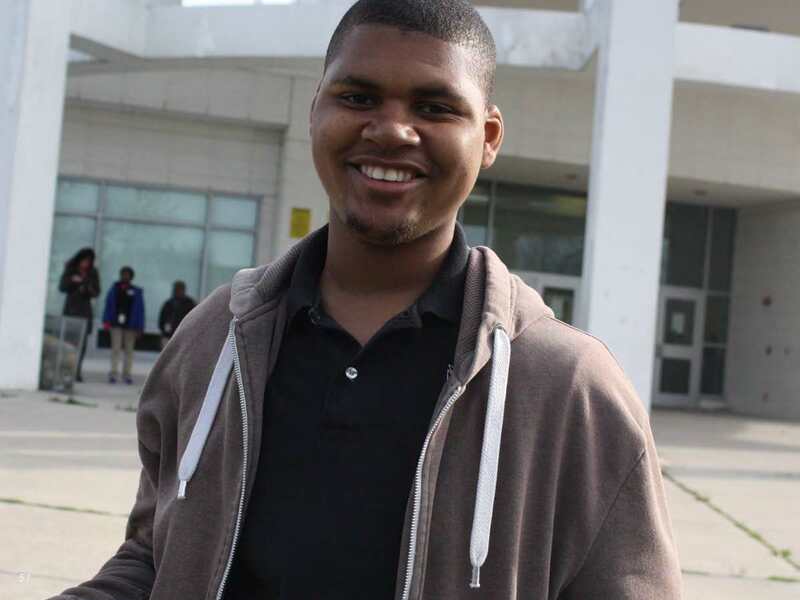 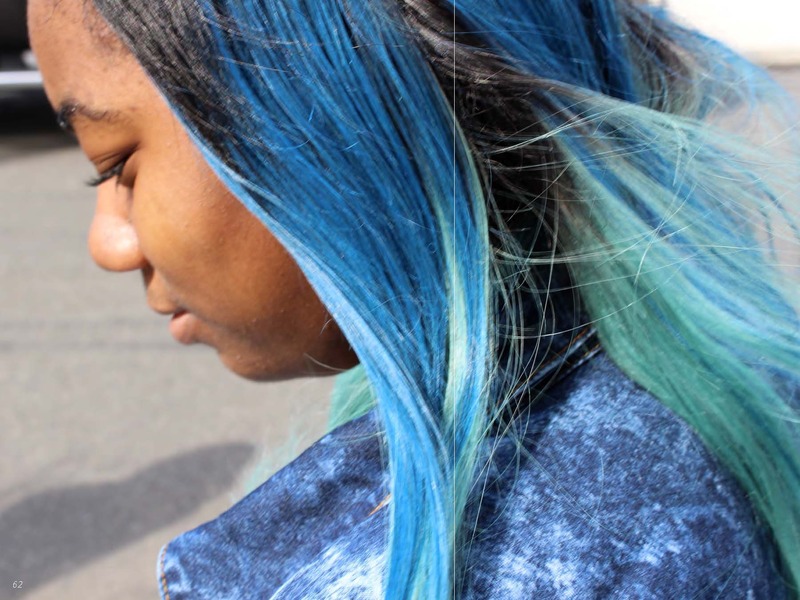 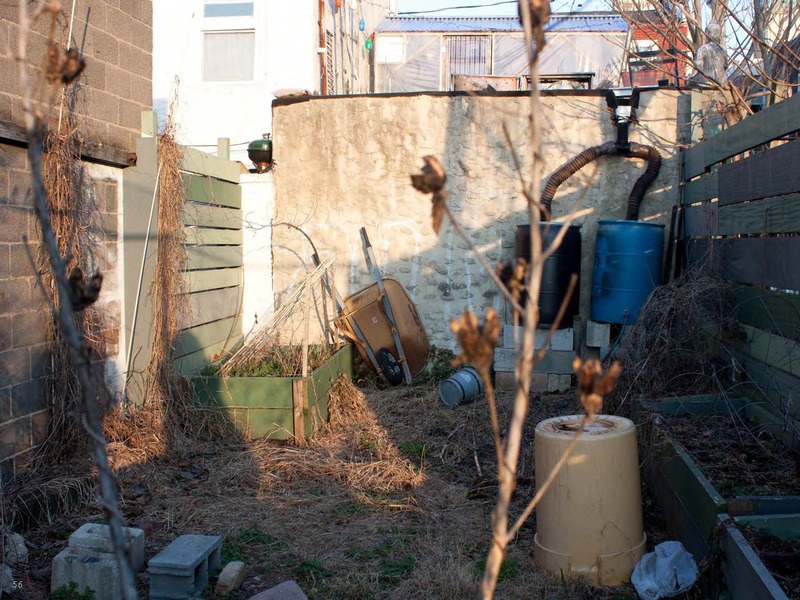 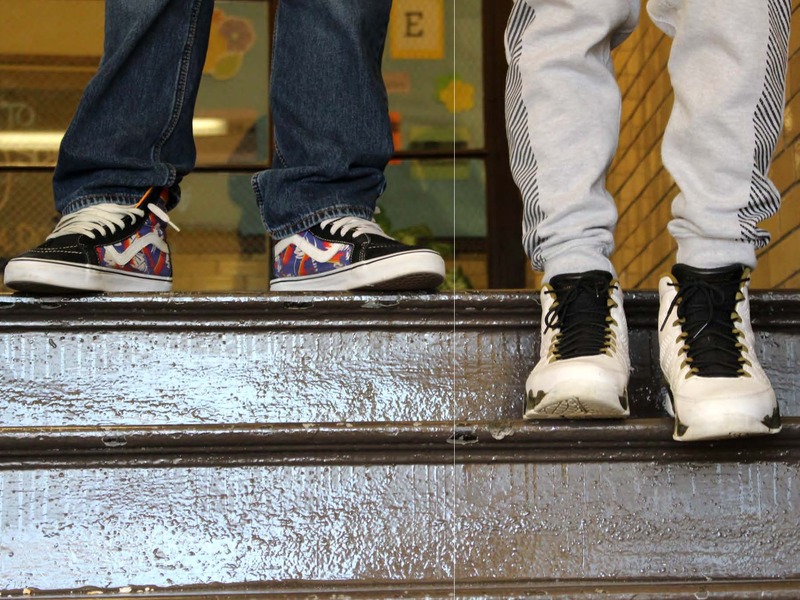 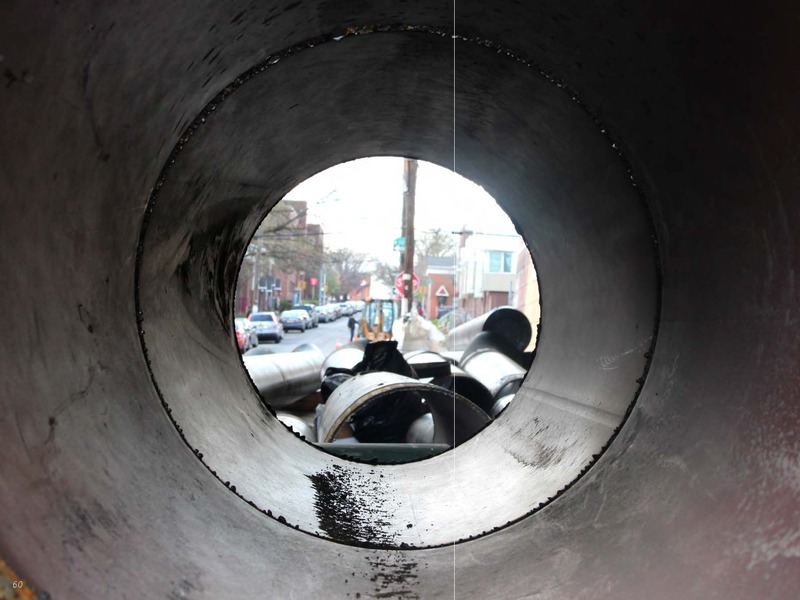 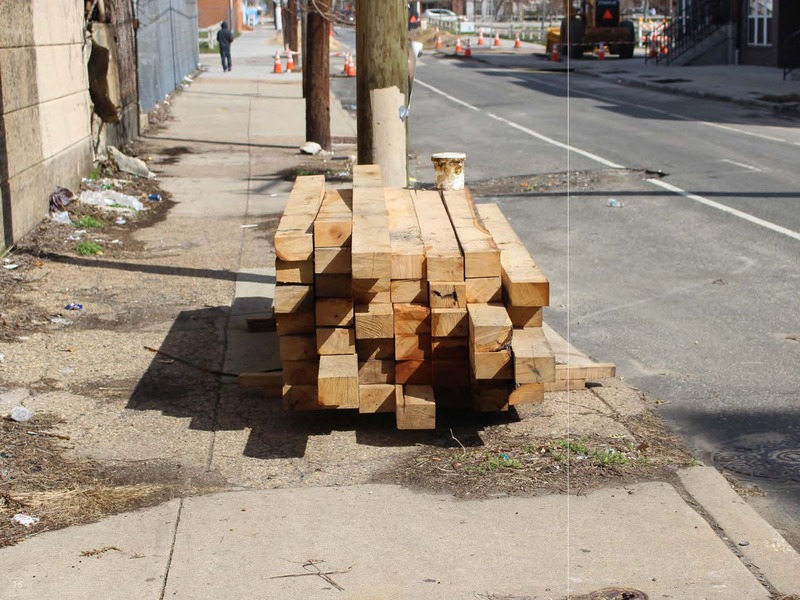 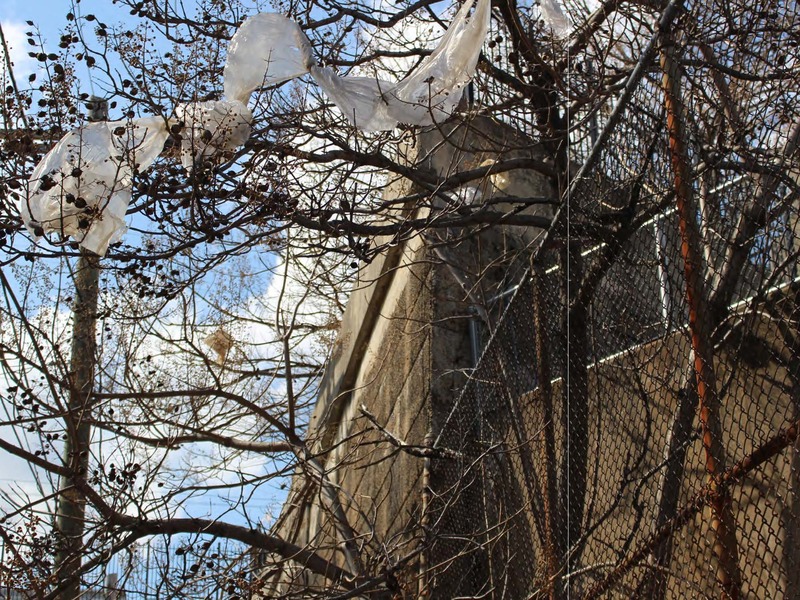 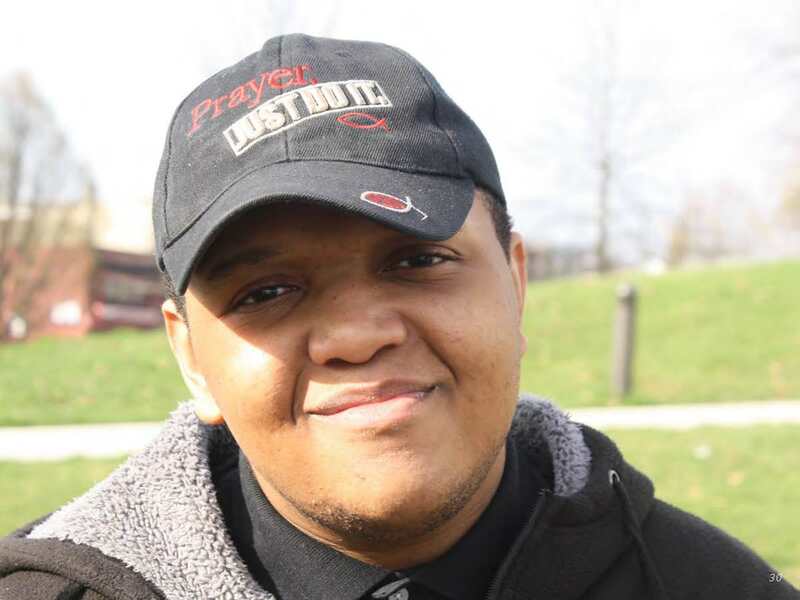 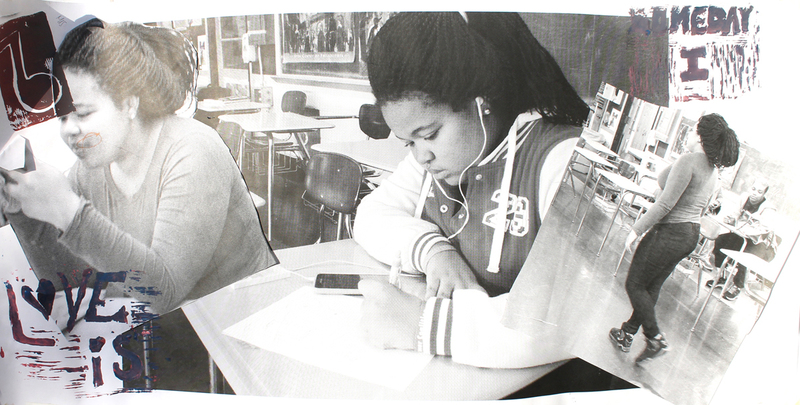 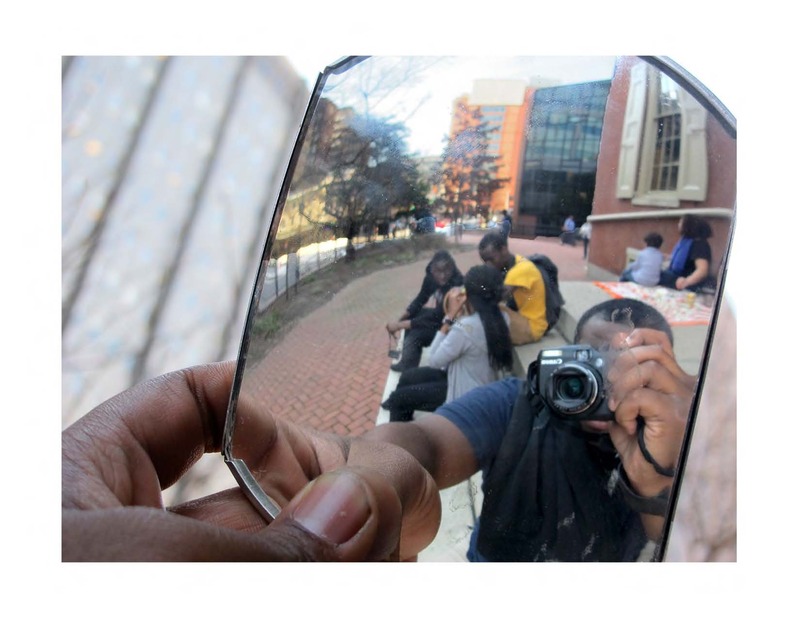 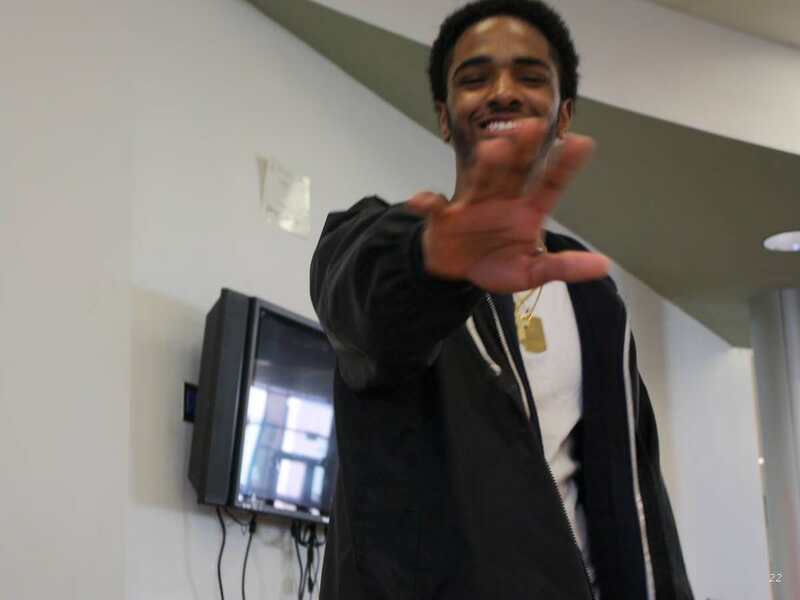 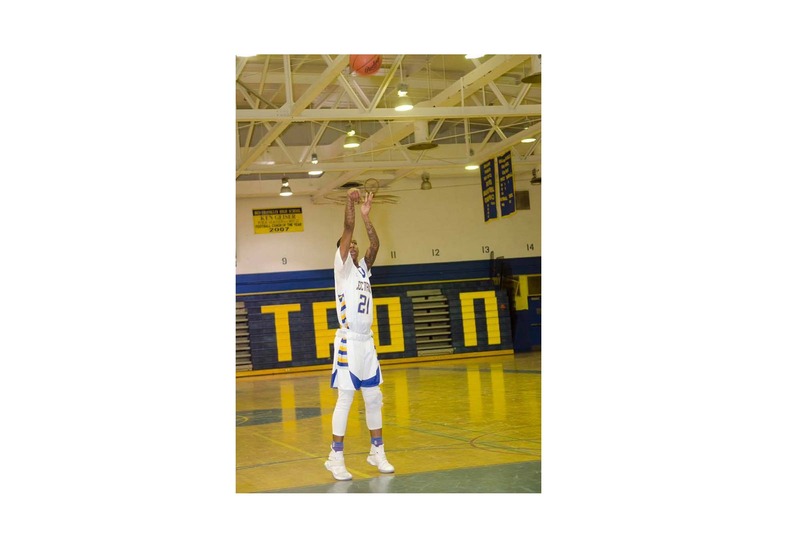 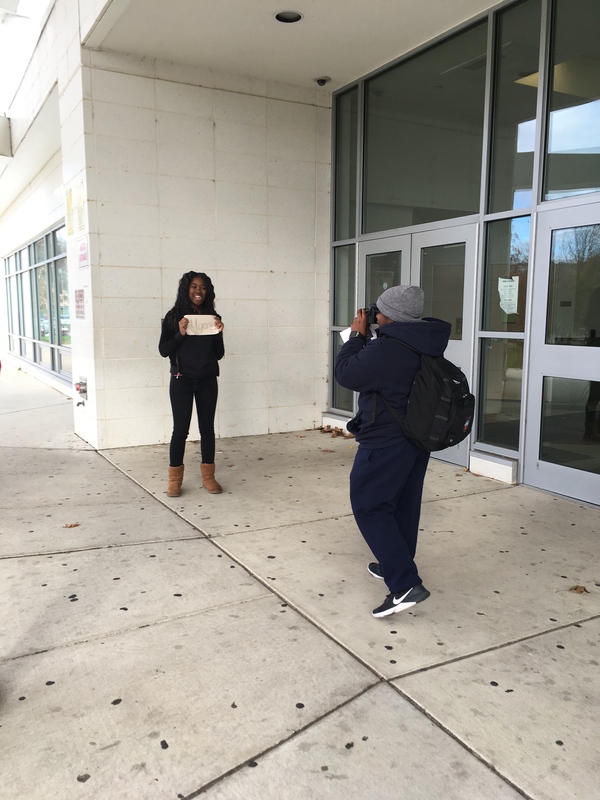 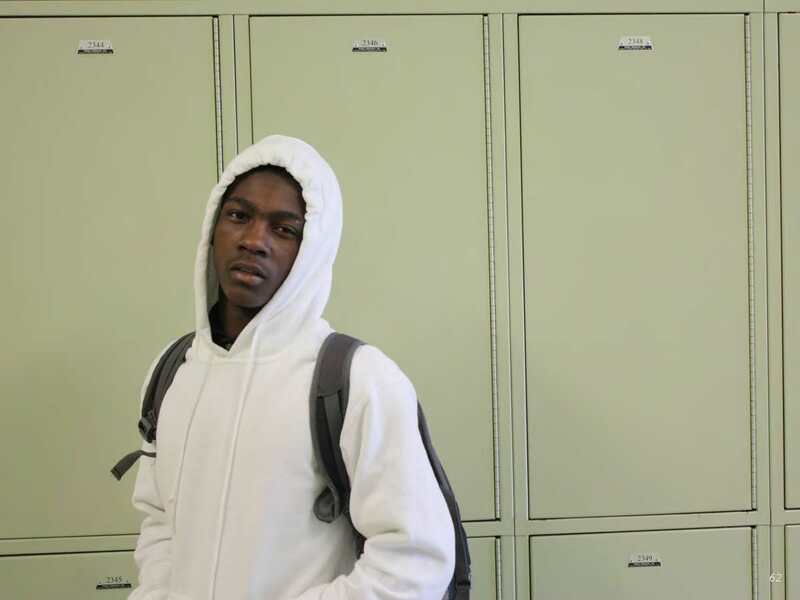 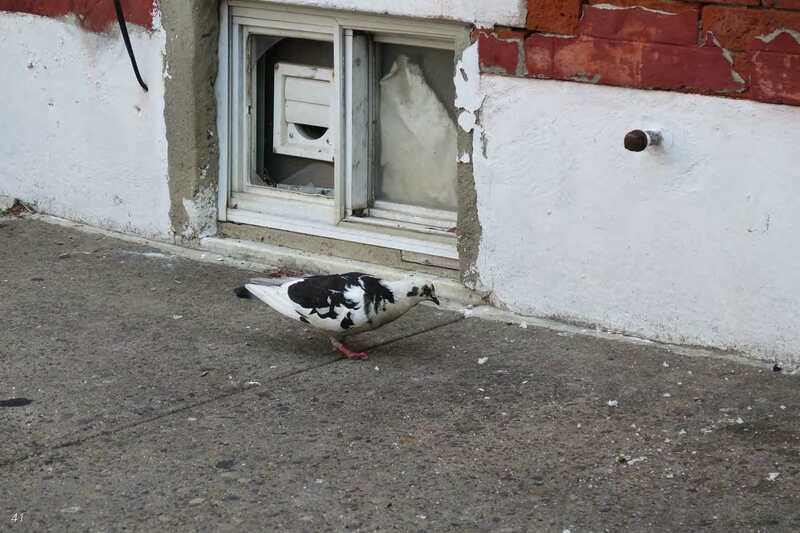 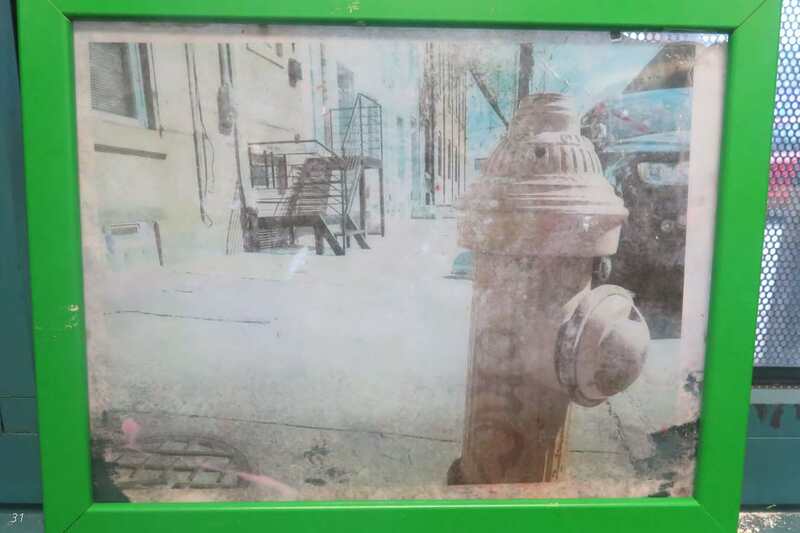 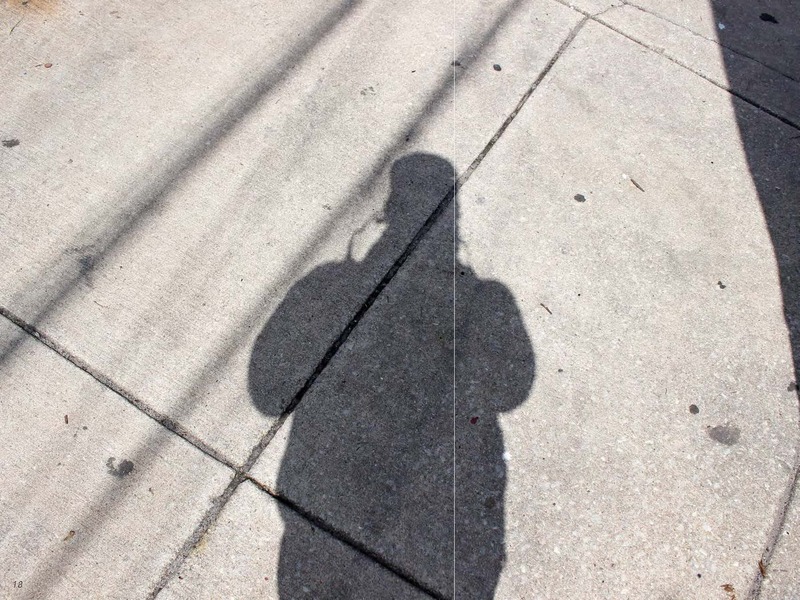 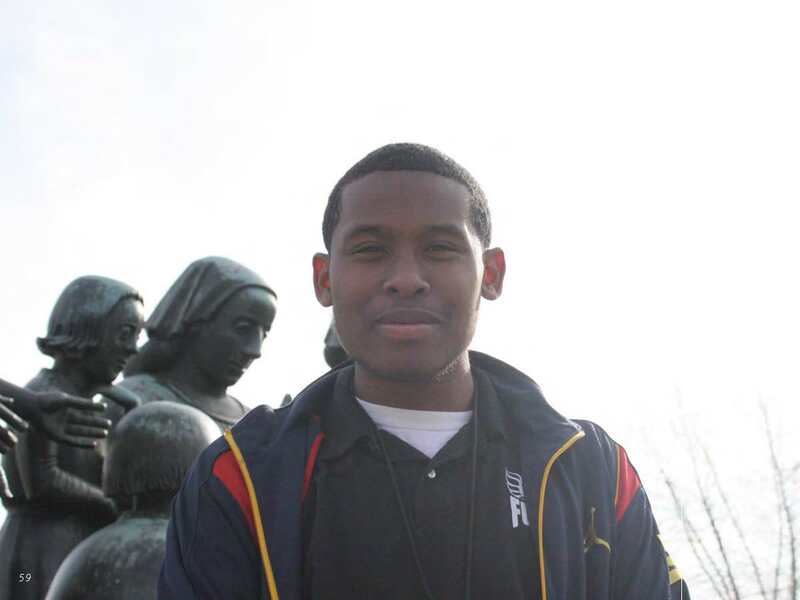 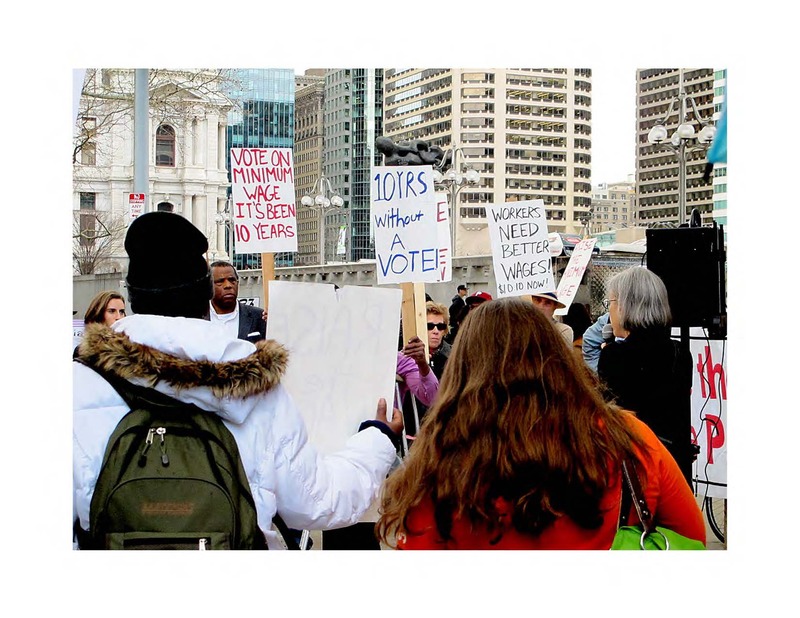 Students at South Philadelphia High School used photography to capture themselves in everyday actions. 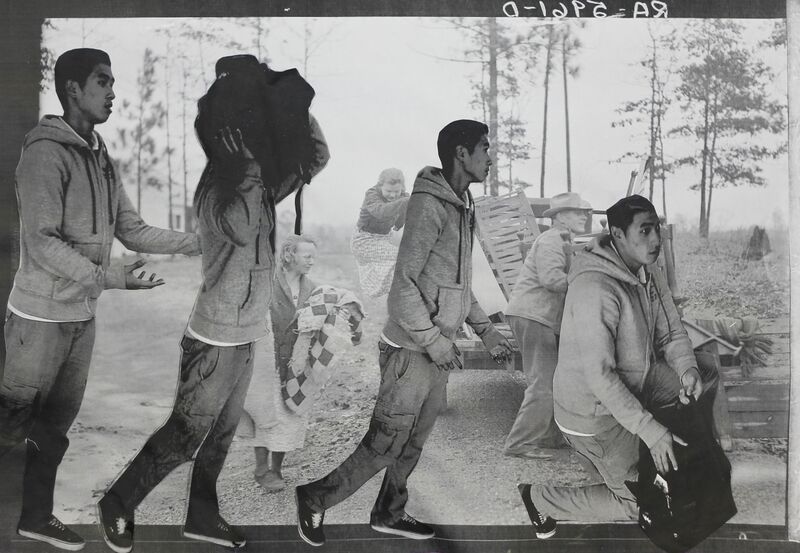 They collaged multiple images together to depict their actions through time. 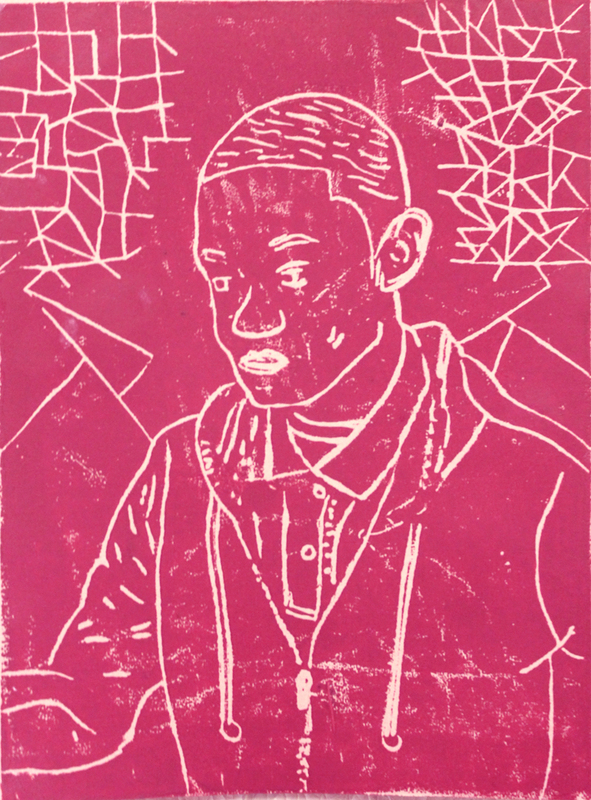 Student-artists in this gallery of work include Timmy Ath, Jose DeJesus, Sabash Gurung, Deyci Guzman, Selena McGriff, Veronica Newby, Asma Rex, Sekou Sissoko, Alex Stewart and Julius Stivender. 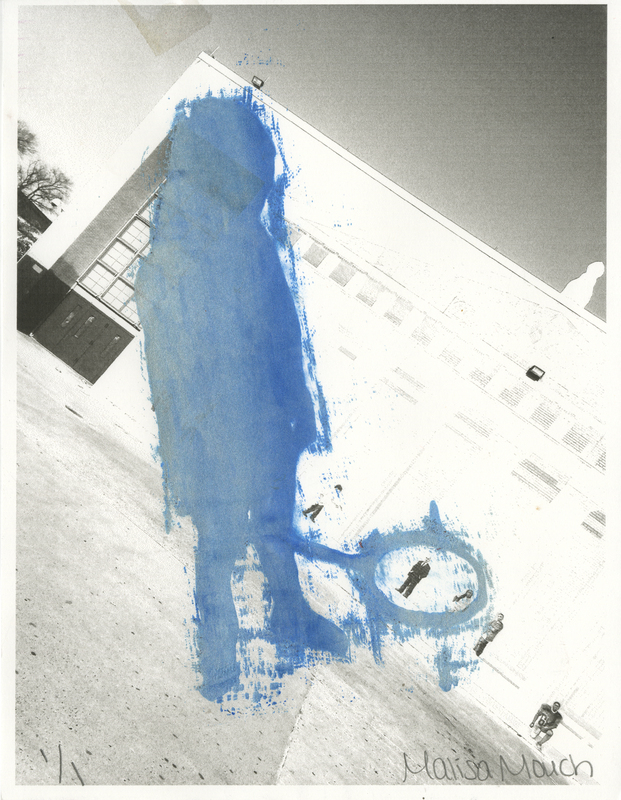 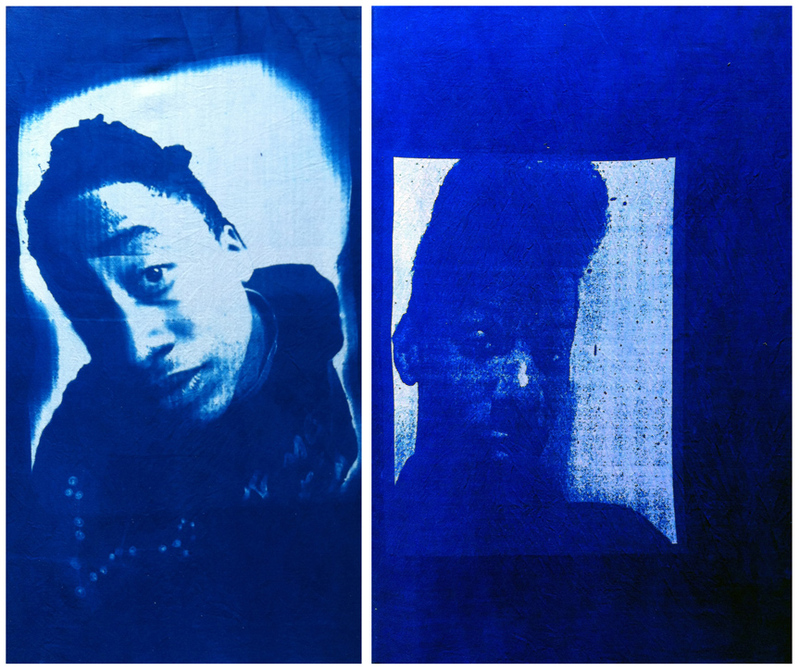 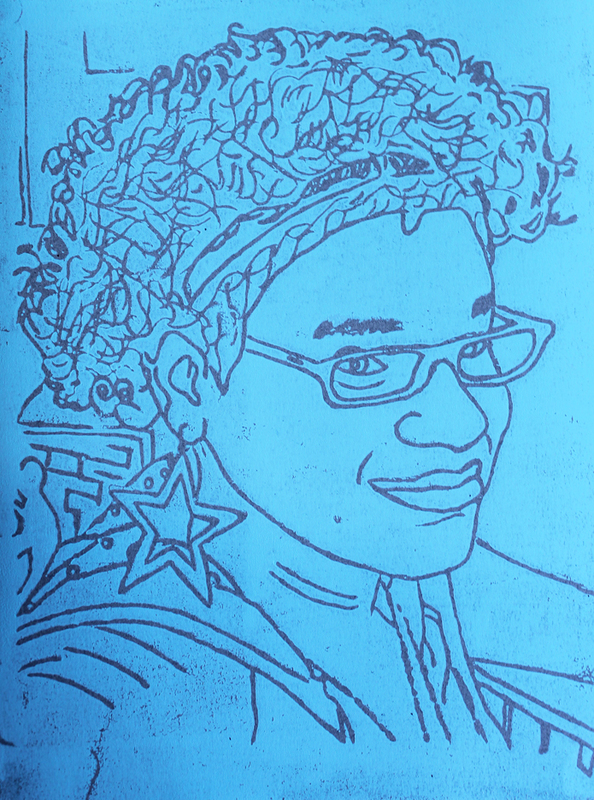 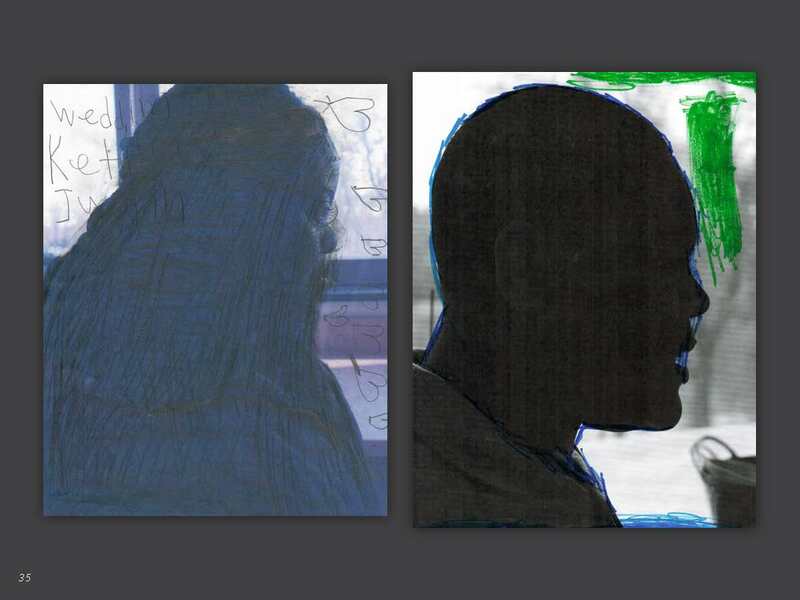 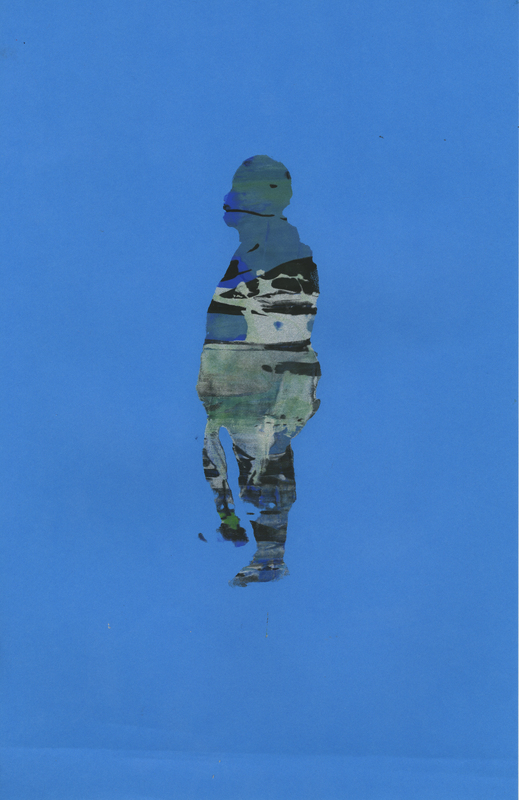 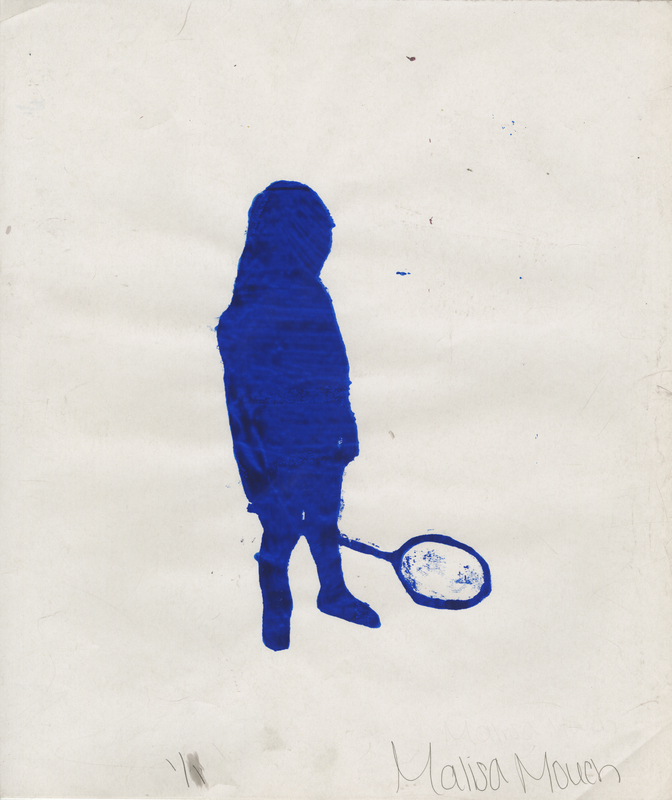 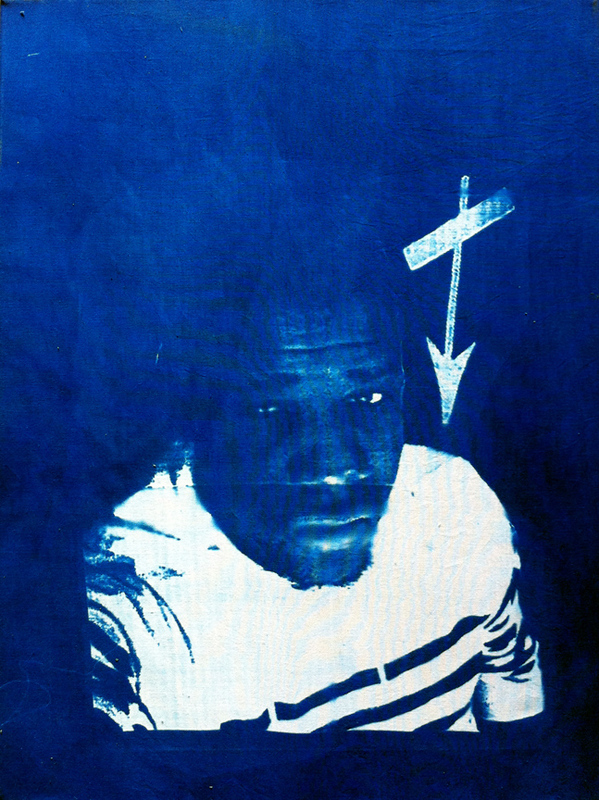 In this residency, students created cyanotype self-portraits inspired by The Print Center’s exhibition Demetrius Oliver: Canicular. 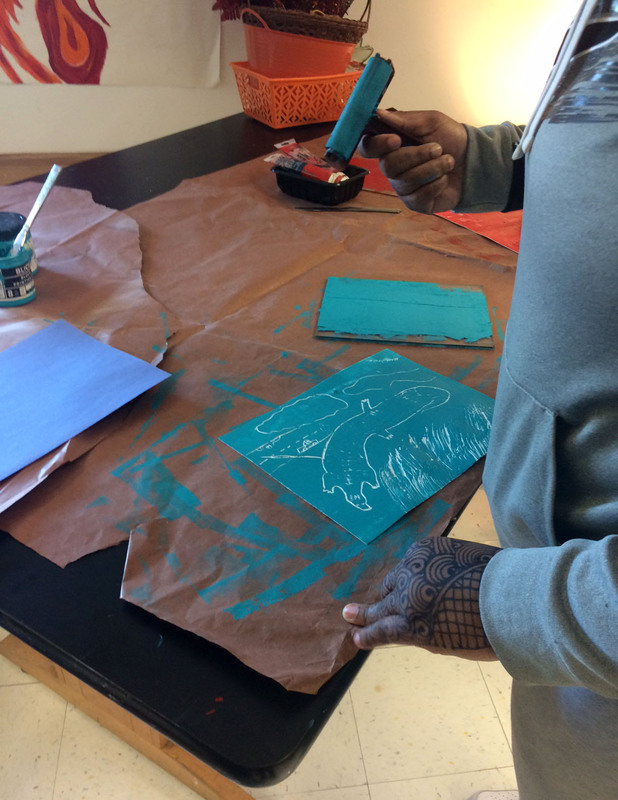 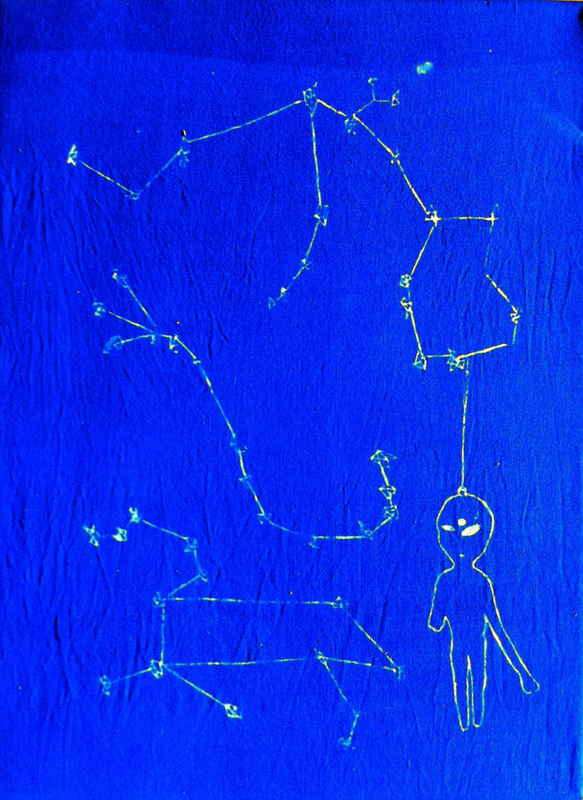 Students created cyanotypes into which they incorporated stellar imagery, resulting in the creation of their own personal constellations. 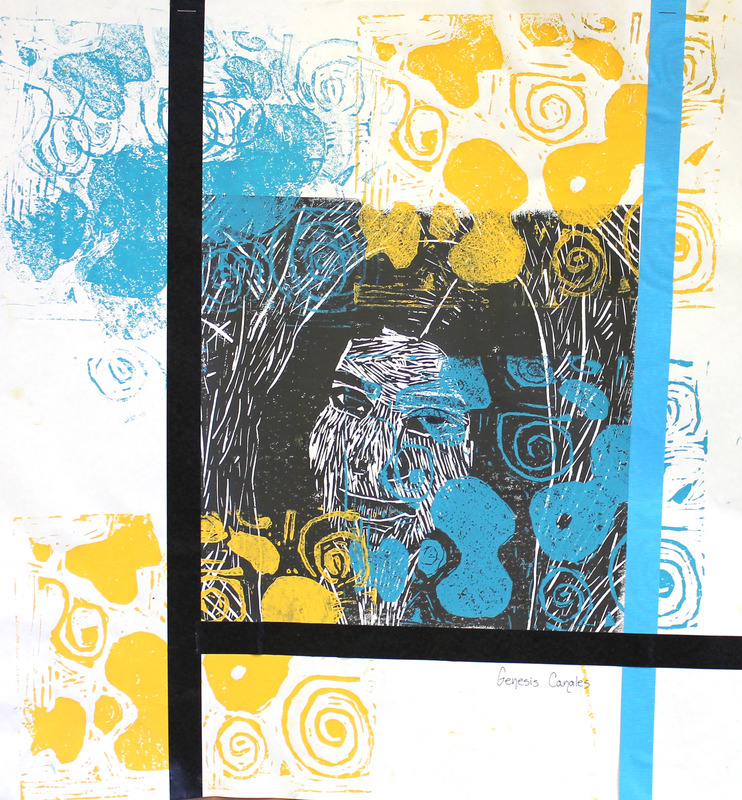 Inspired by the work of Matt Neff, students at Kensington Health and Sciences High School explored various printmaking and photography techniques to create original works of art that incorporated layers of various processes to address concepts of dimensionality, play, sensitivity to materials, self, environment, collage, messages of personal struggles and transformation. 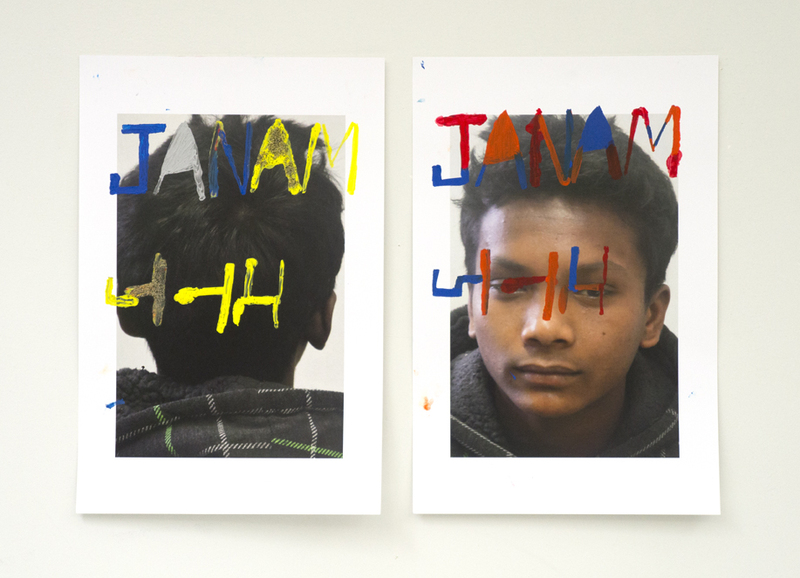 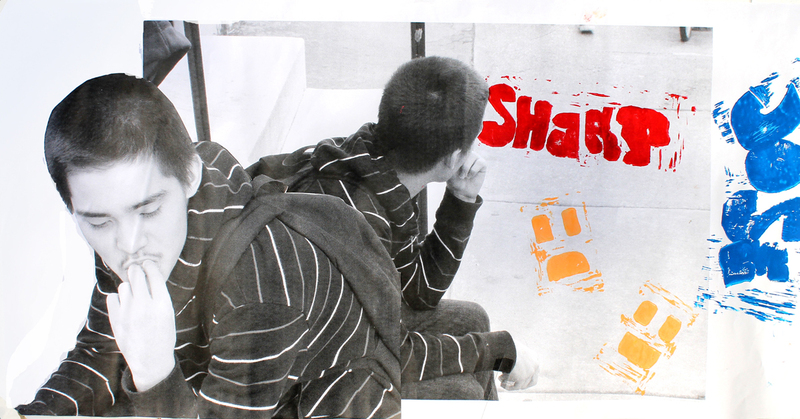 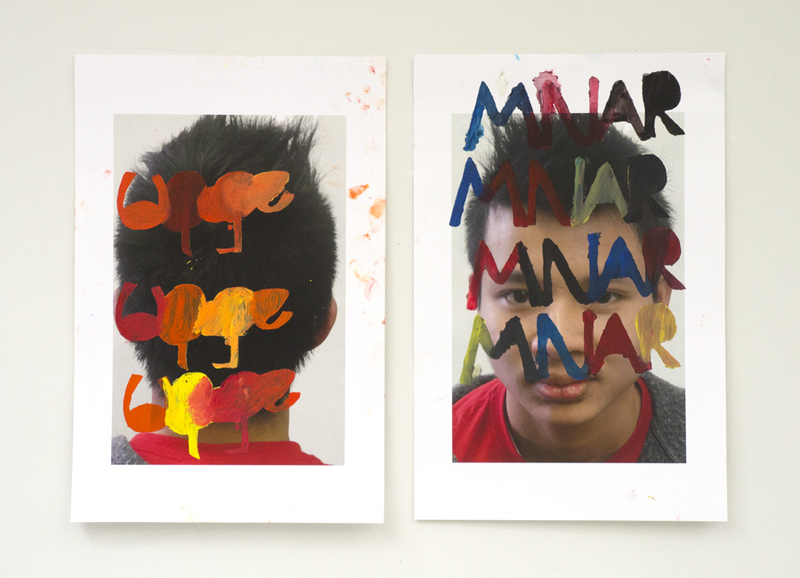 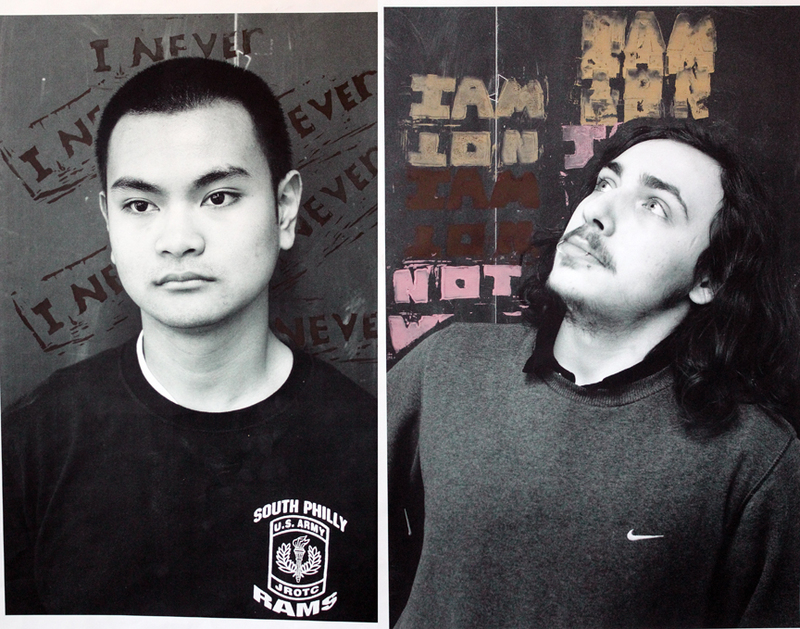 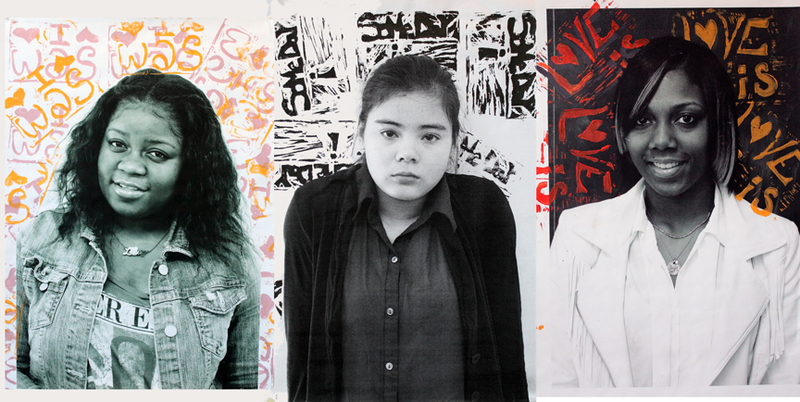 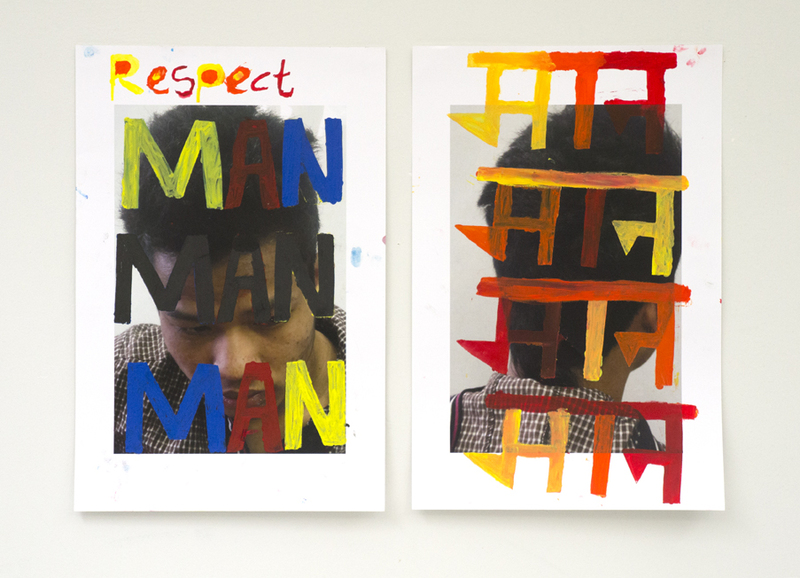 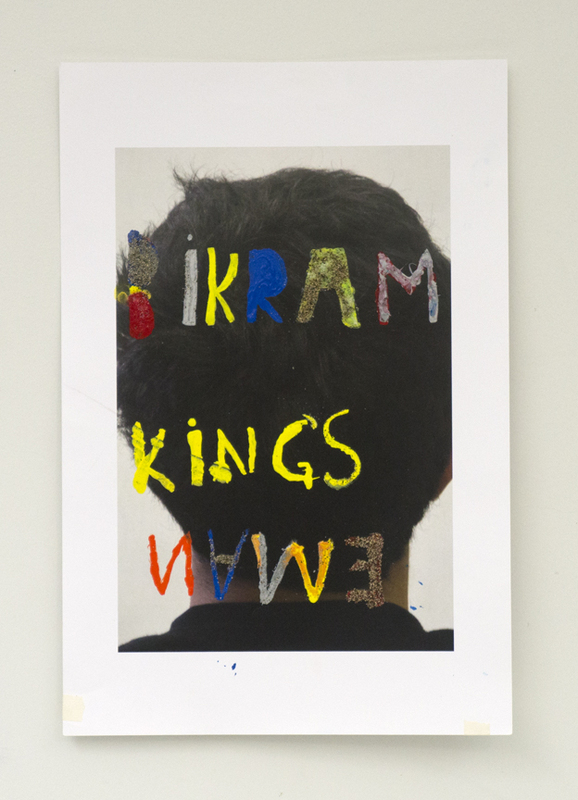 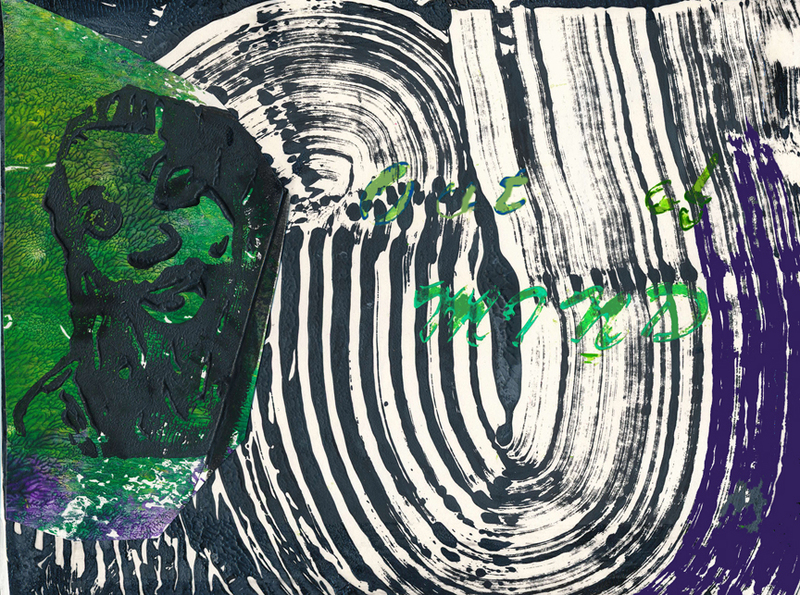 In this residency, students created self-portraits incorporating photography and hand-painted type. 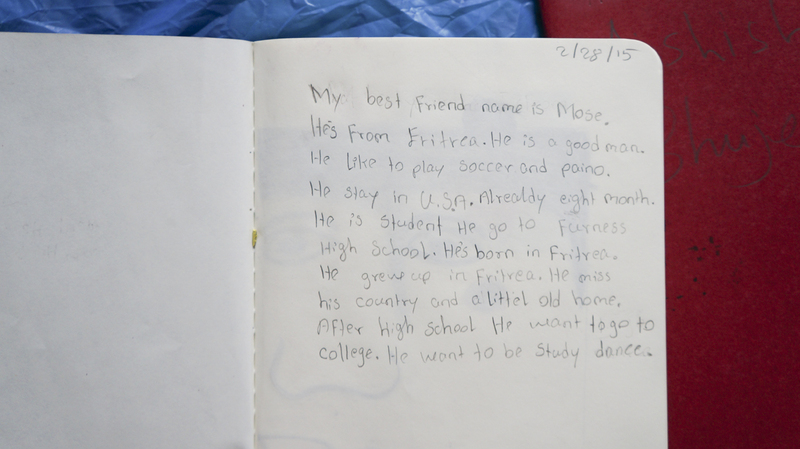 Writing in both English and their first languages, students used their names and words that held personal meaning. 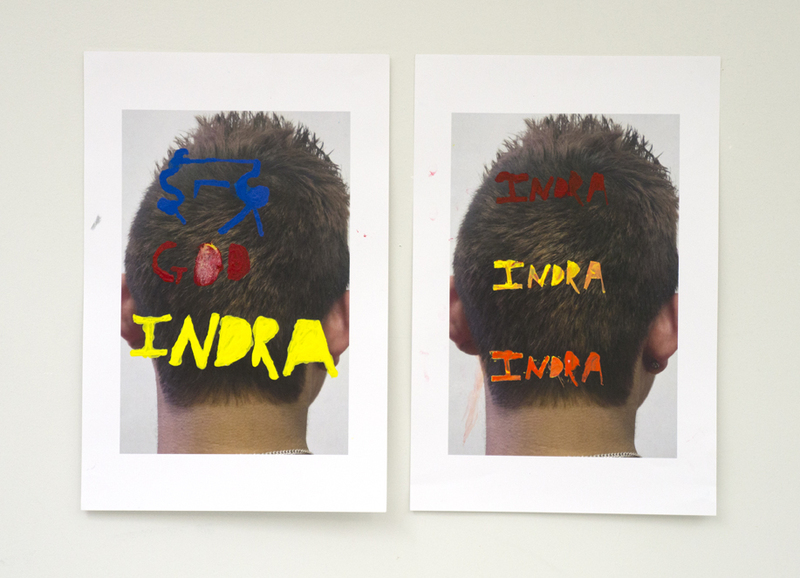 Students made decisions to reveal or conceal parts of their head with text, creating a dynamic tension between type and image. 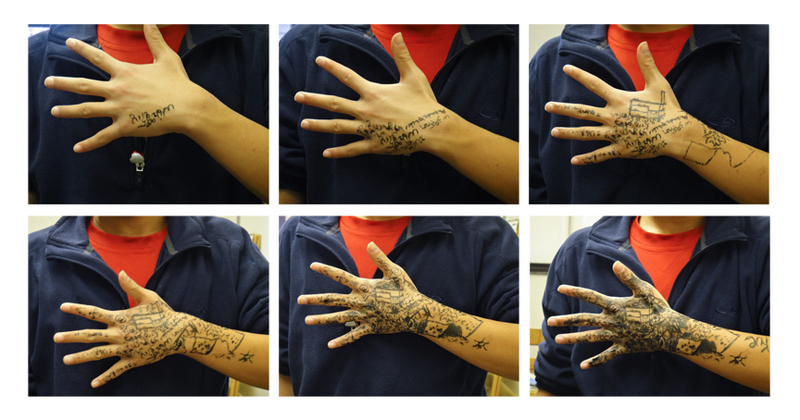 Students also hand-painted typography onto their own hands. 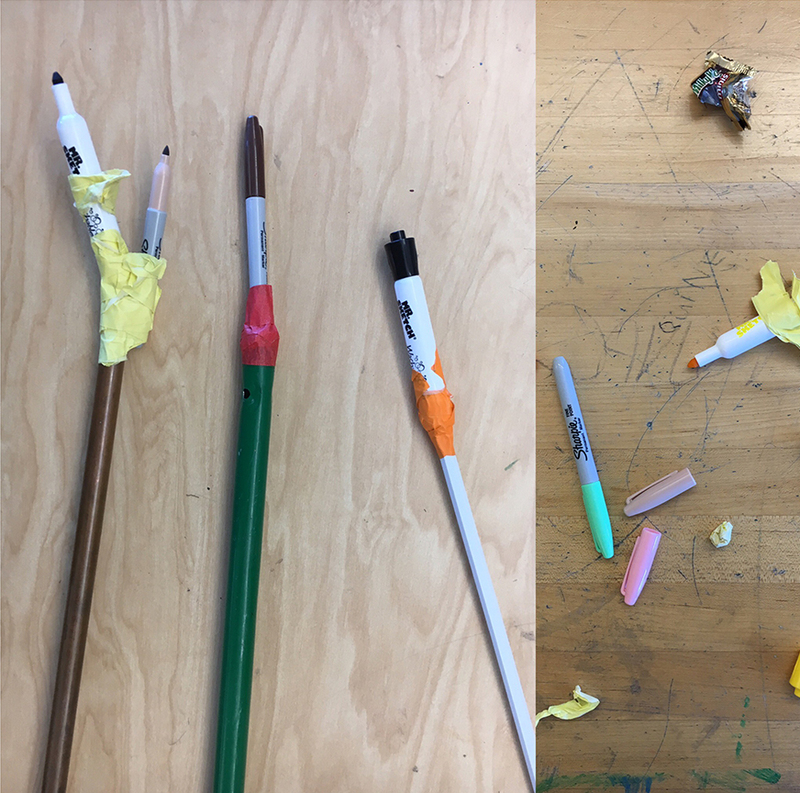 Students added more and more type until their hands became one solid color. 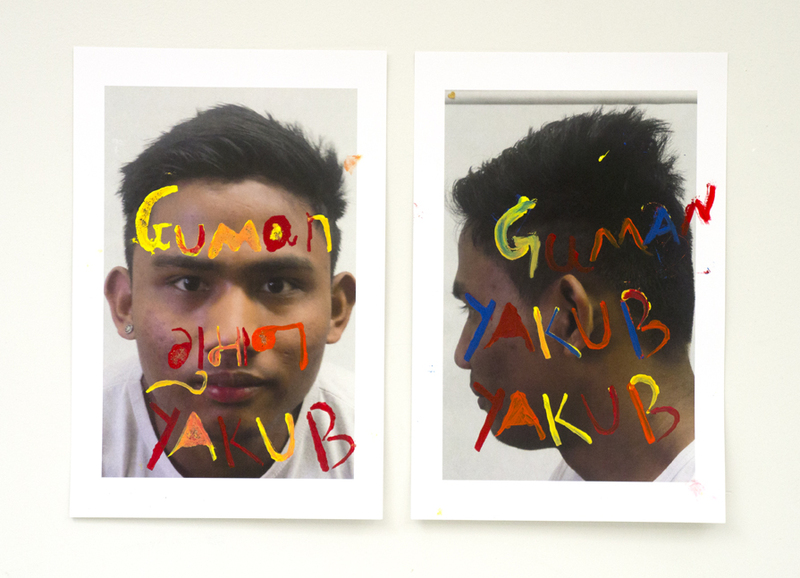 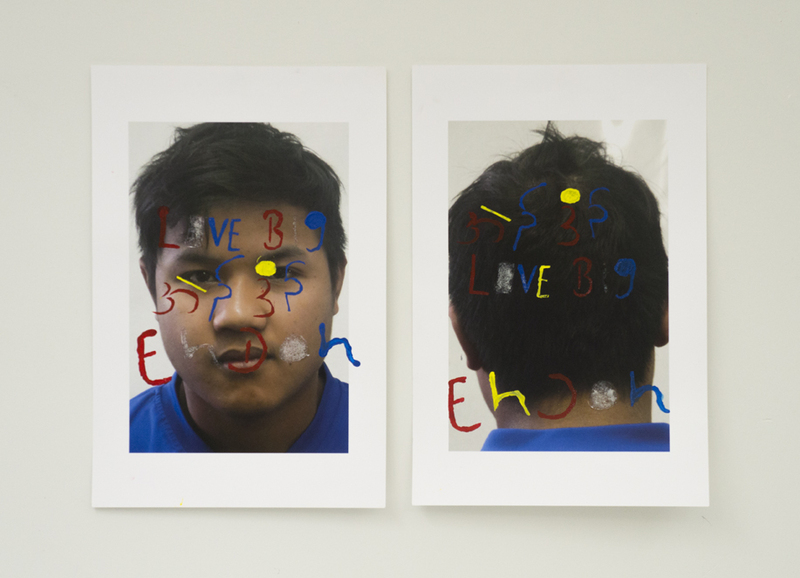 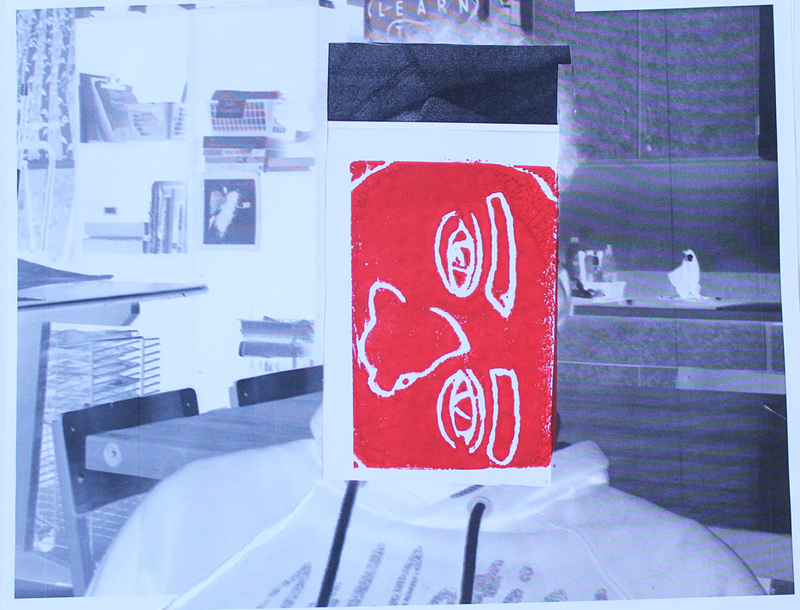 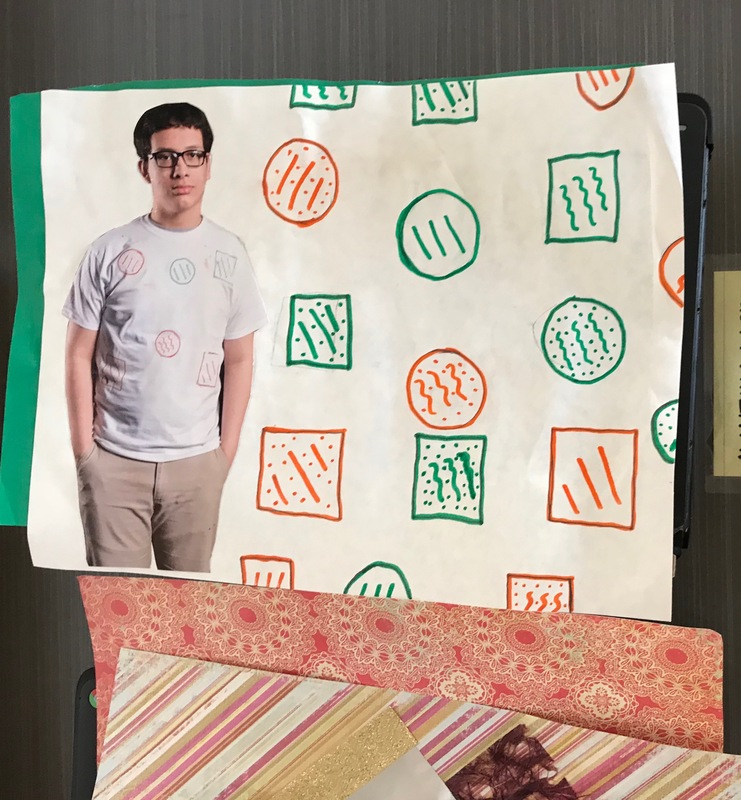 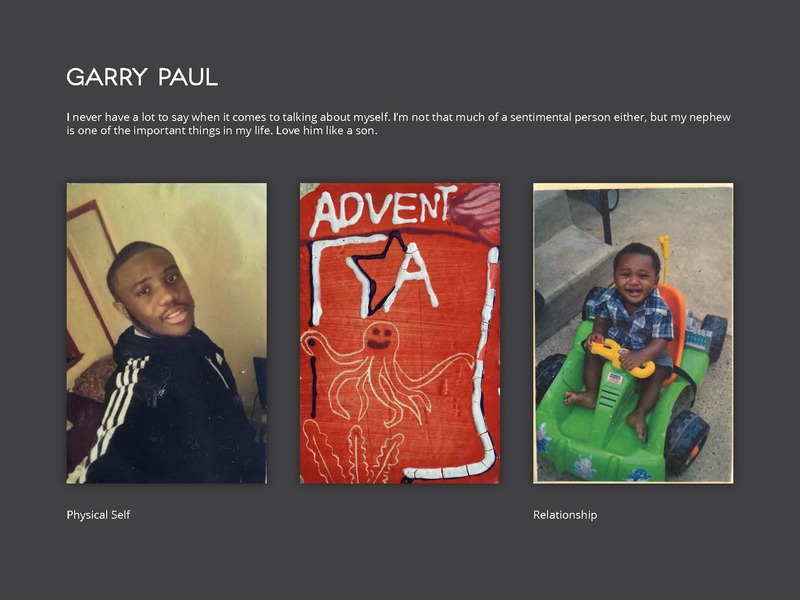 In this residency, students took self-portrait photos of themselves and incorporated relief printed typography to ask open ended questions about their personas and their potential. 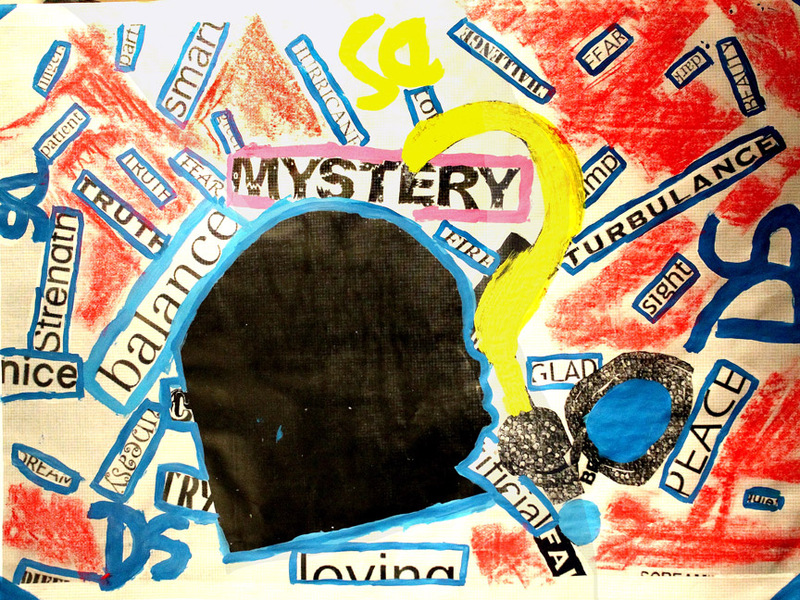 Rather than give one definitive answer, the open ended statements suggest many potential answers and hint at the layers of complexity an individual possesses. 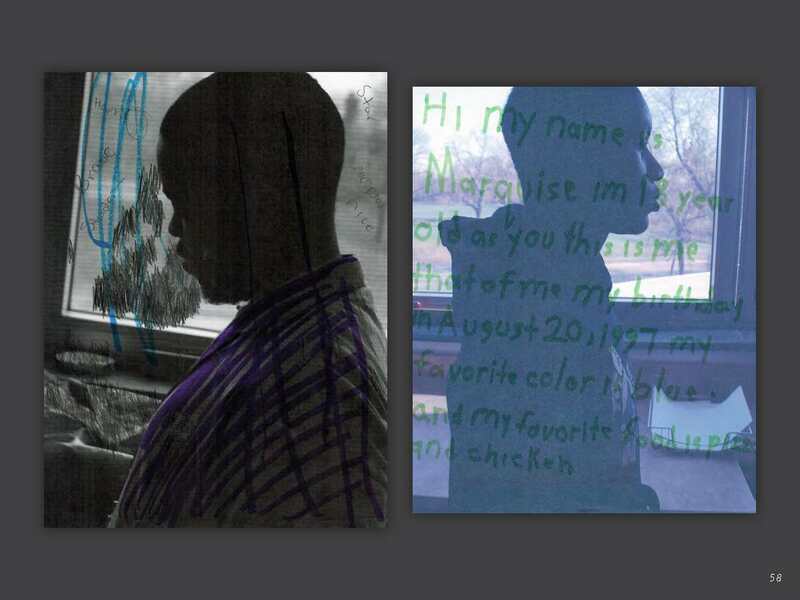 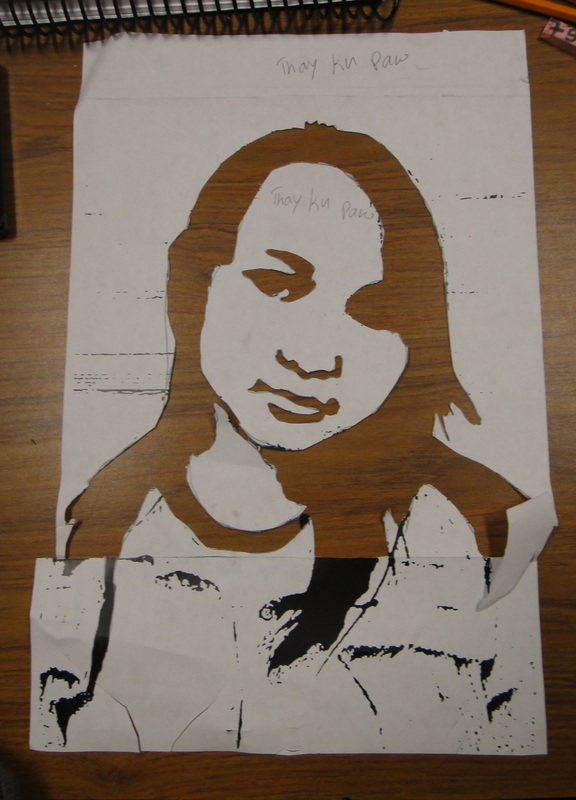 Students also used stencils to manipulate the text by hiding it behind their portrait. 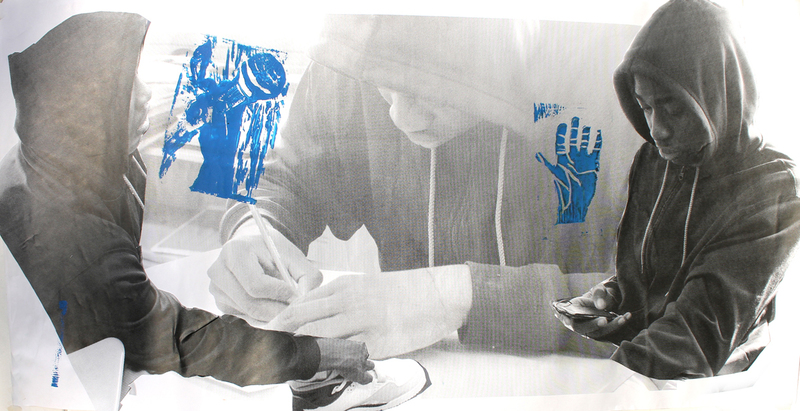 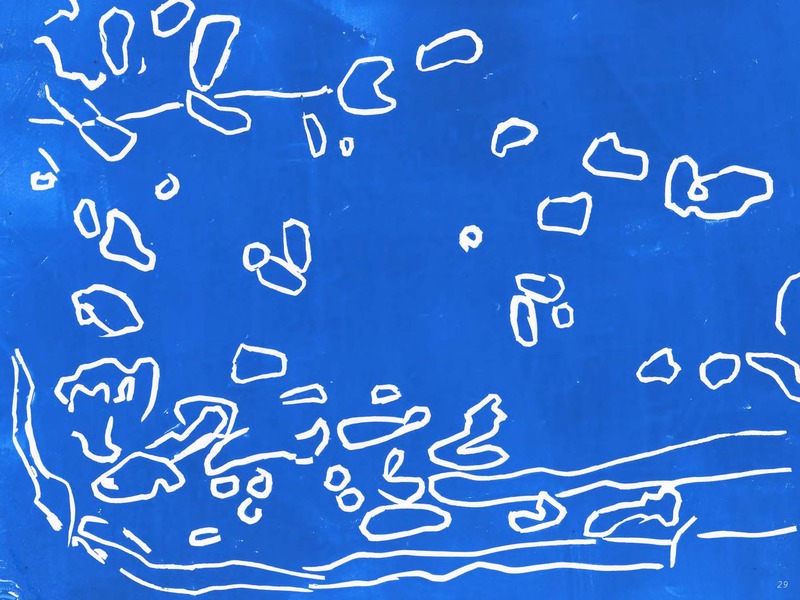 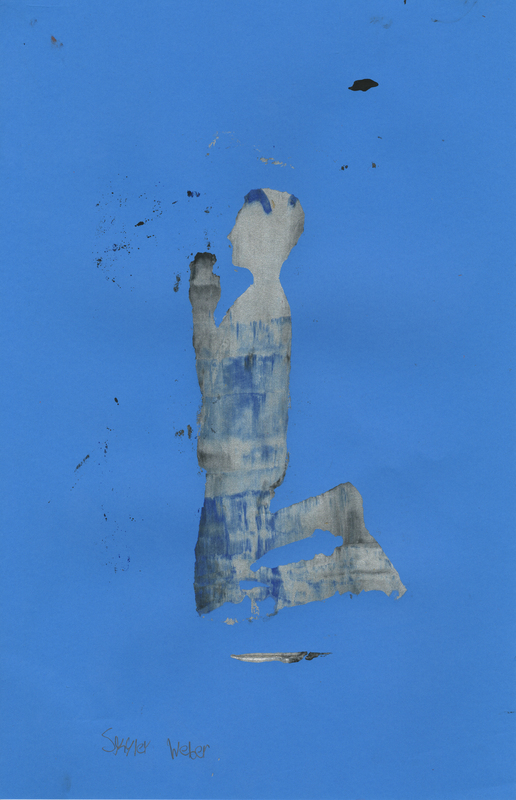 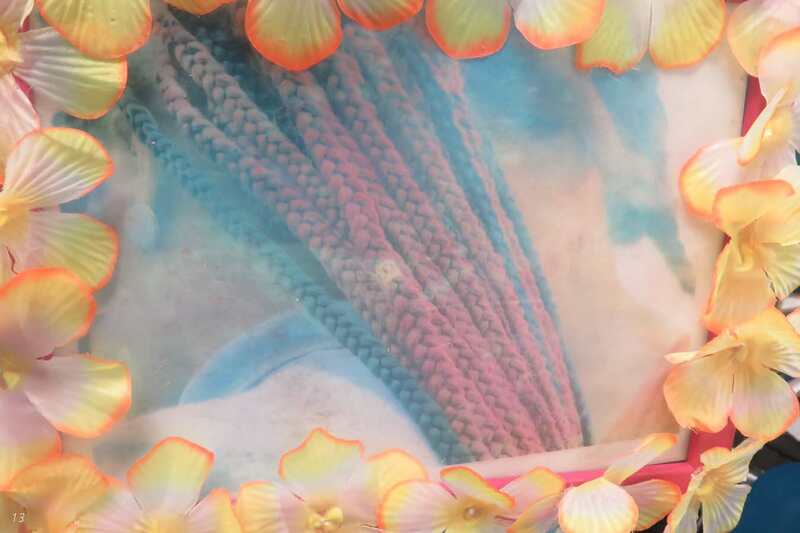 Through the use of cyanotypes and video, students in this residency explored identity through the lens of “Remixing.” To create their cyanotypes, students manipulated their bodies in four connecting parts. 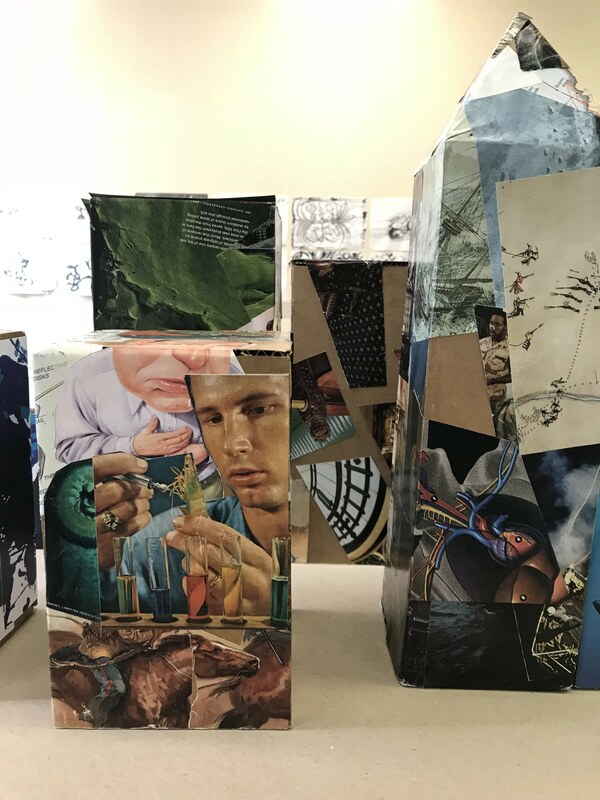 Altering scale, posture and position, students made unexpected connections that allowed ideas of identity and persona to emanate from their works. 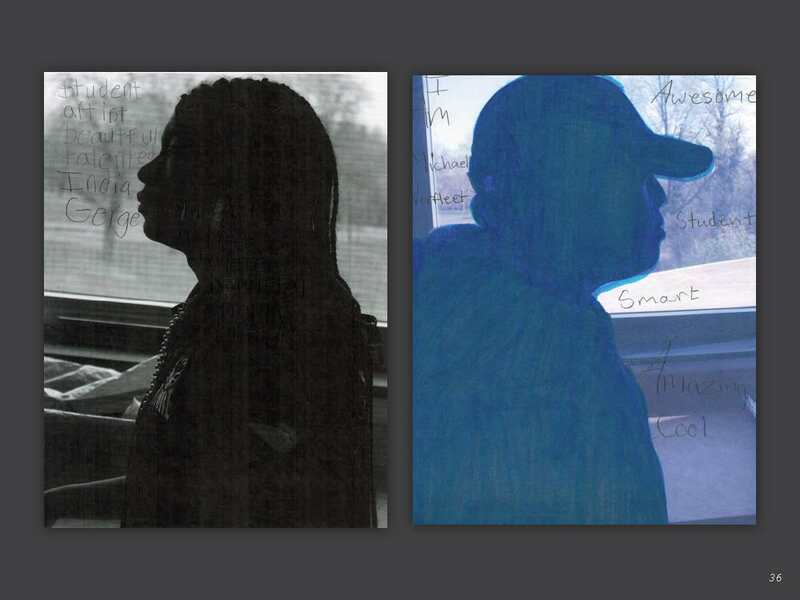 In this residency, students created self-portraits that portrayed their own personal environments contained within a silhouetted figure. 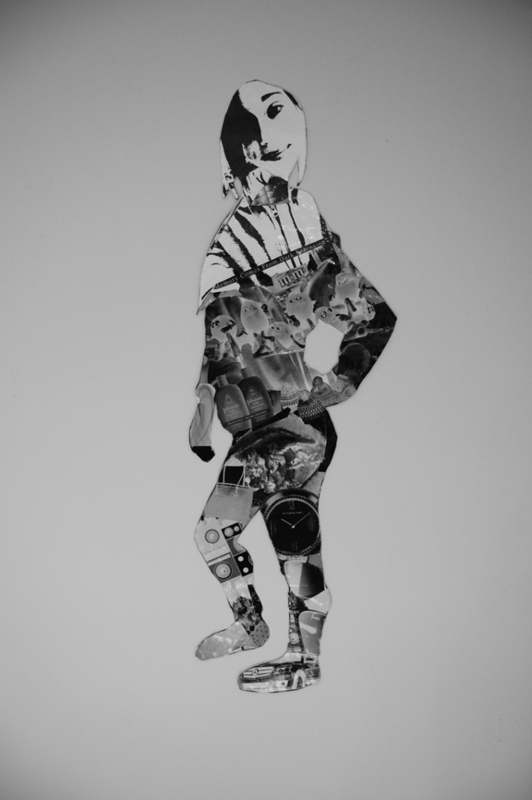 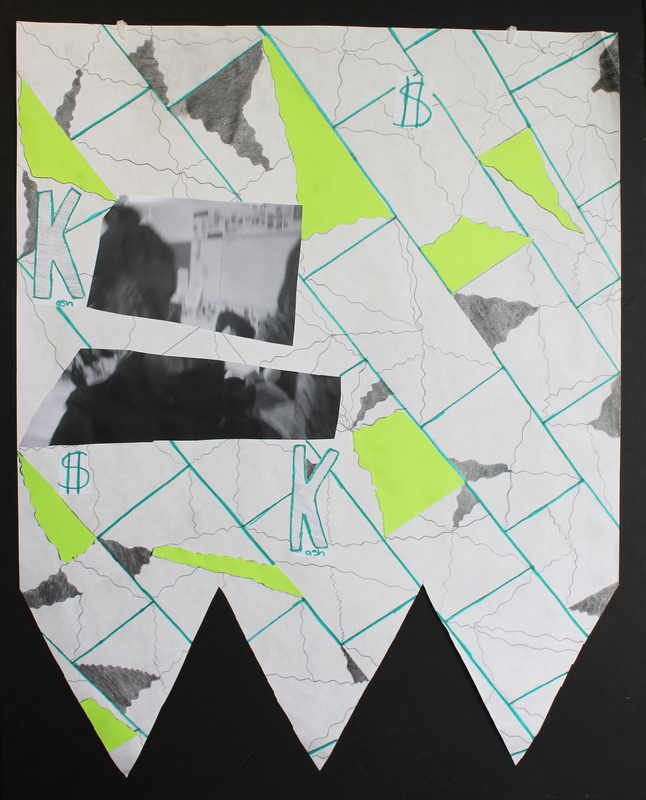 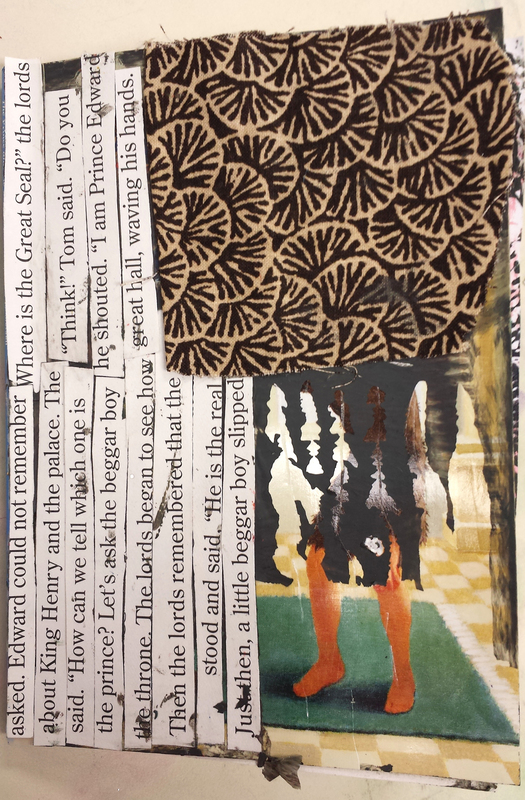 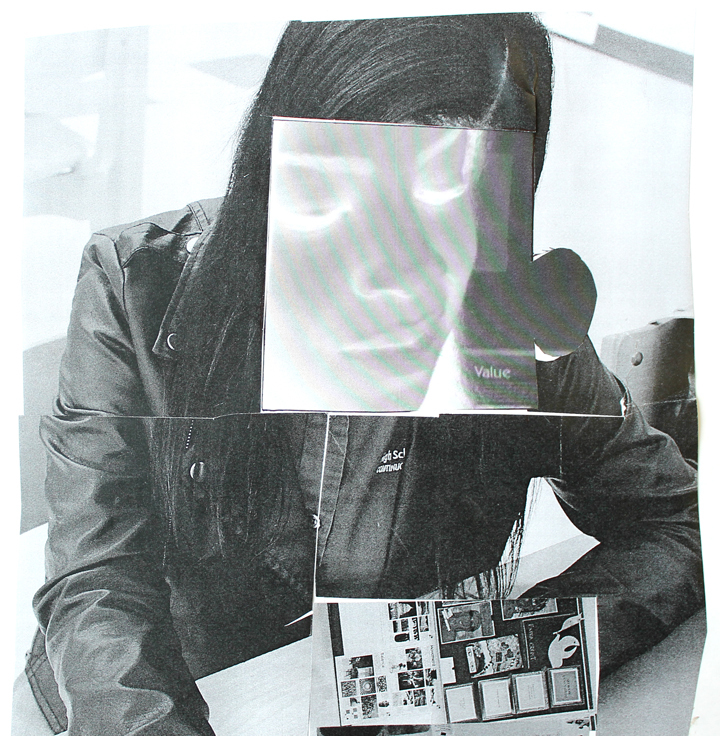 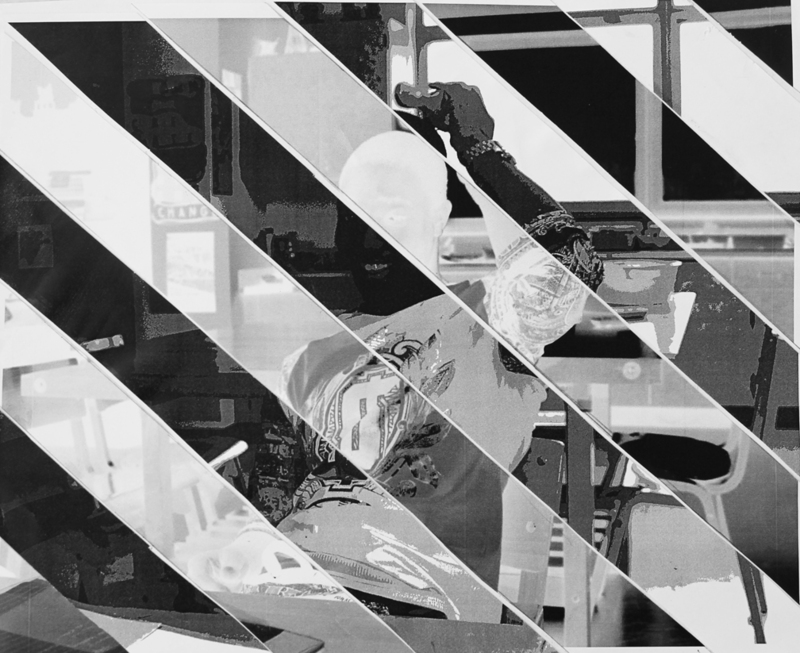 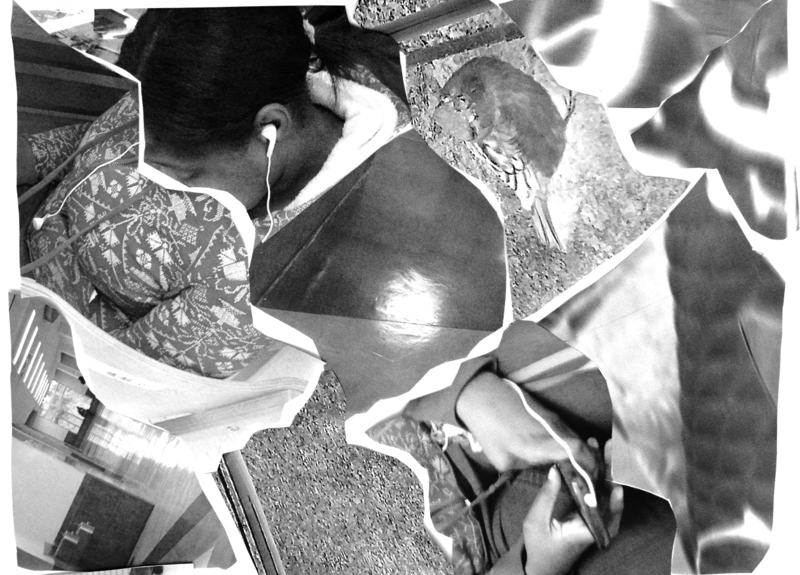 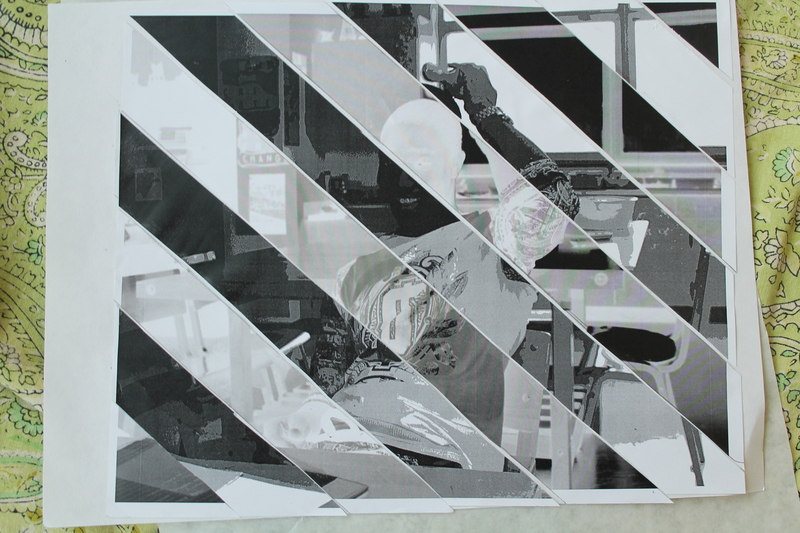 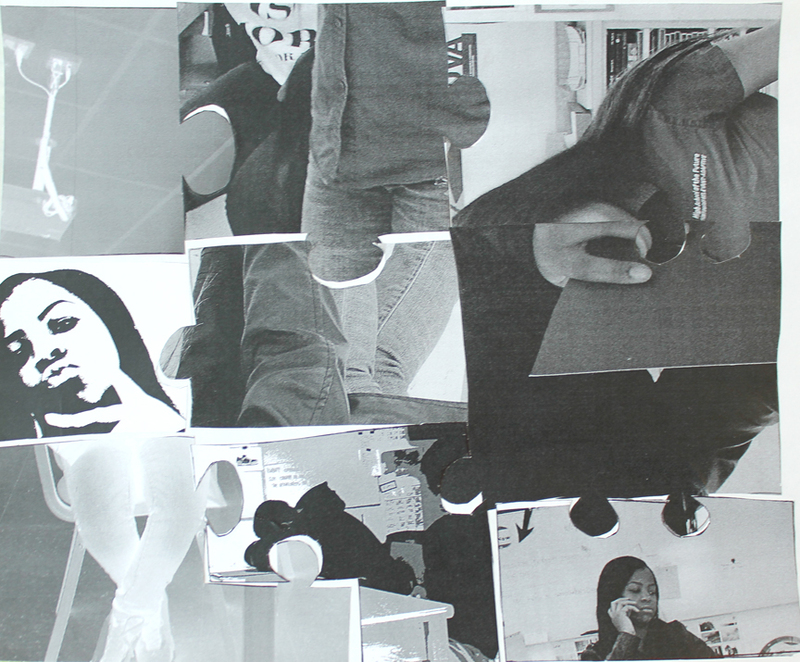 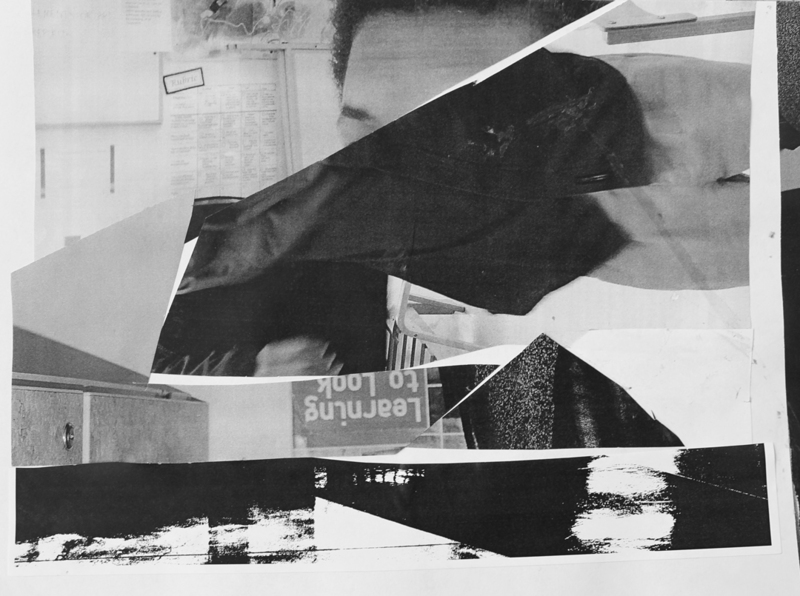 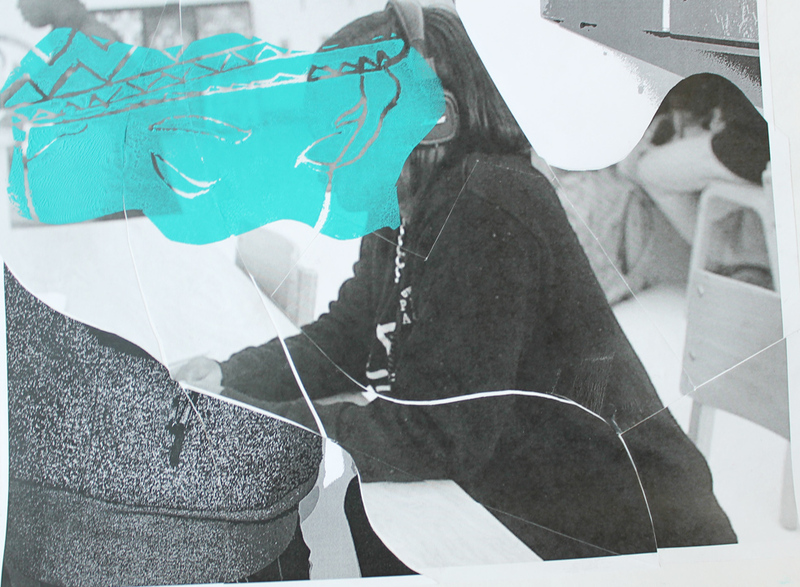 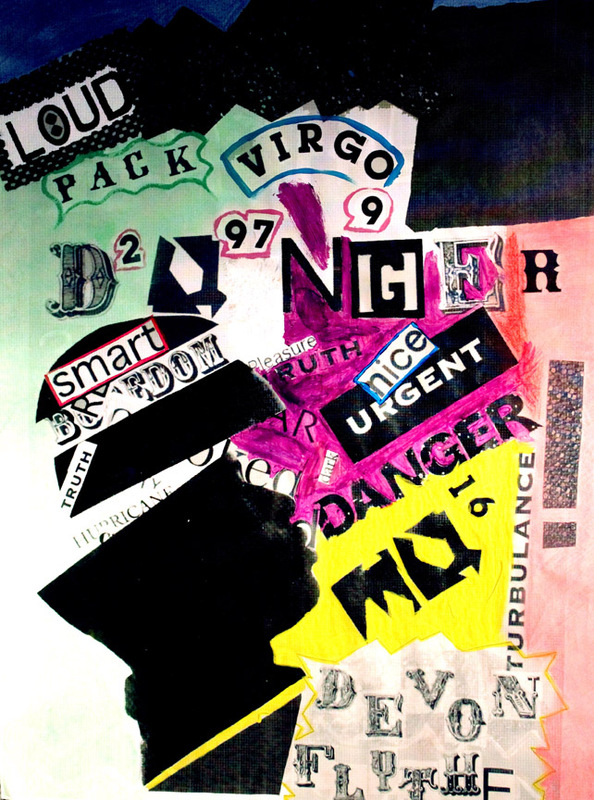 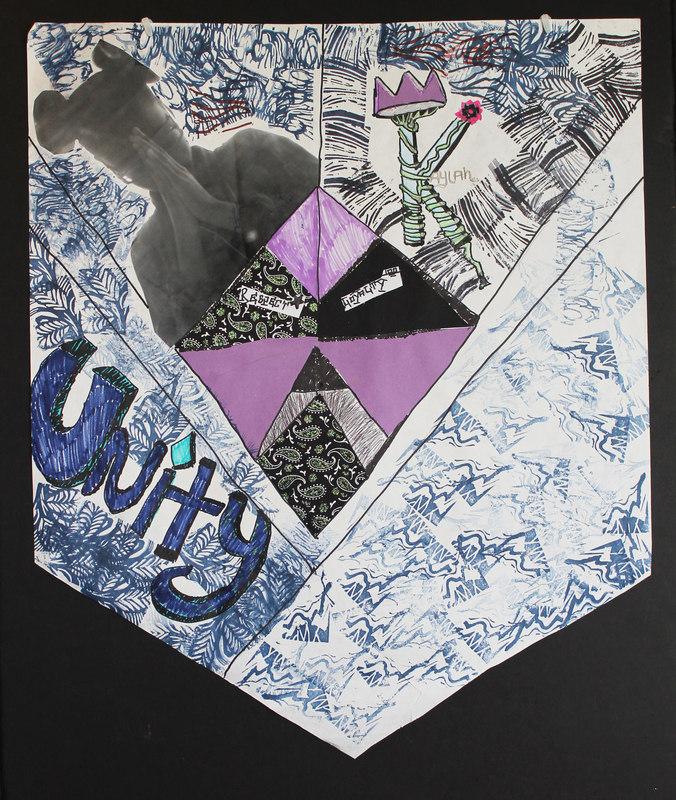 Students collaged imagery from the internet and magazines, and then created high contrast negatives of the collages. 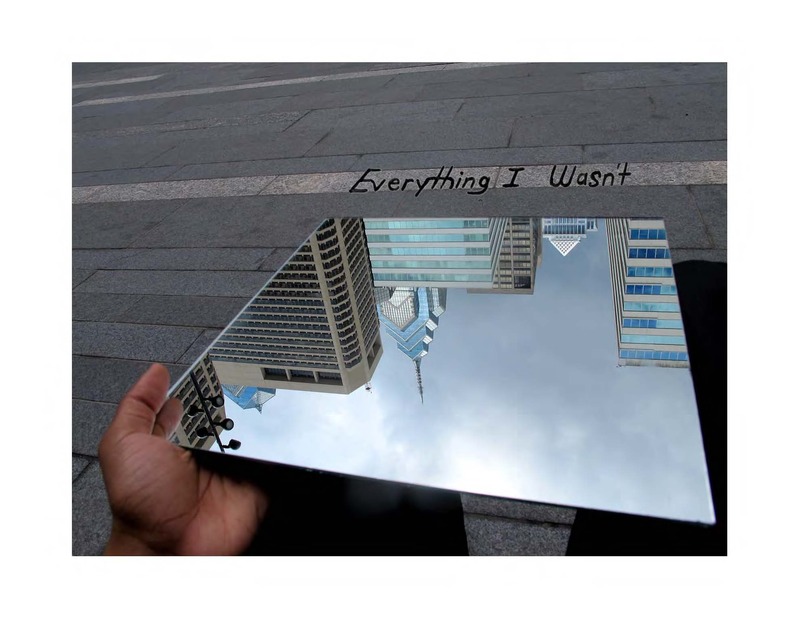 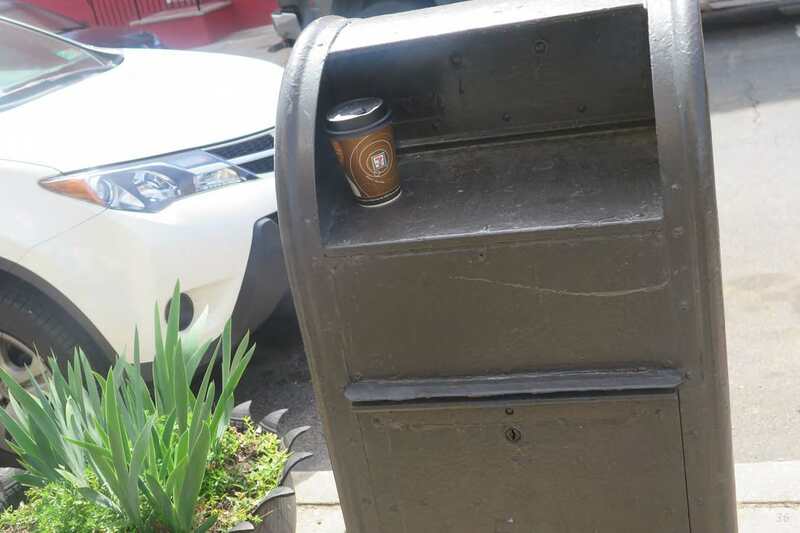 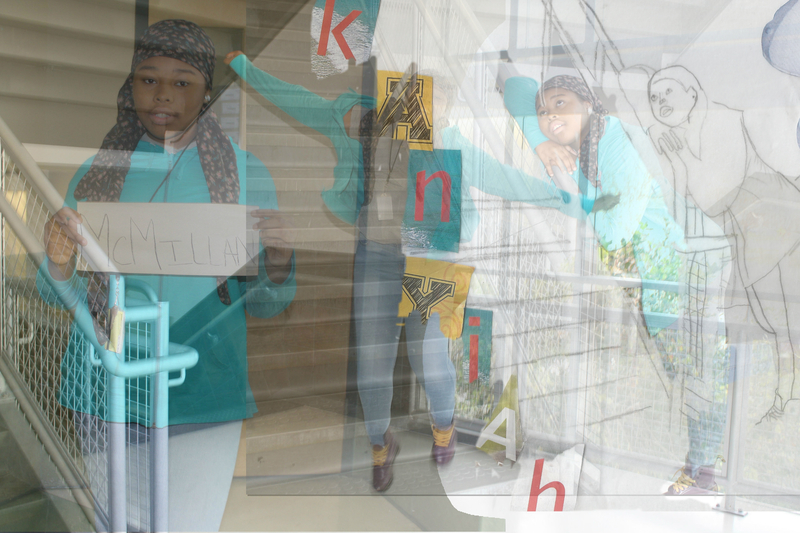 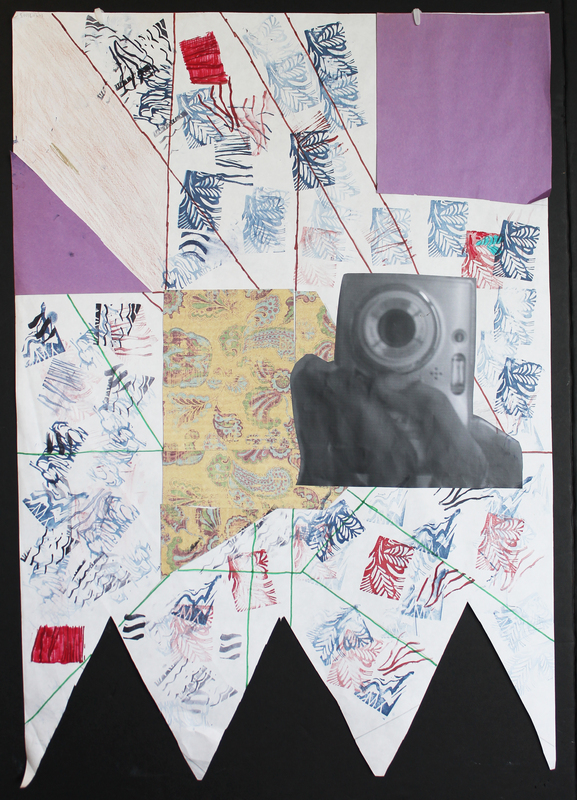 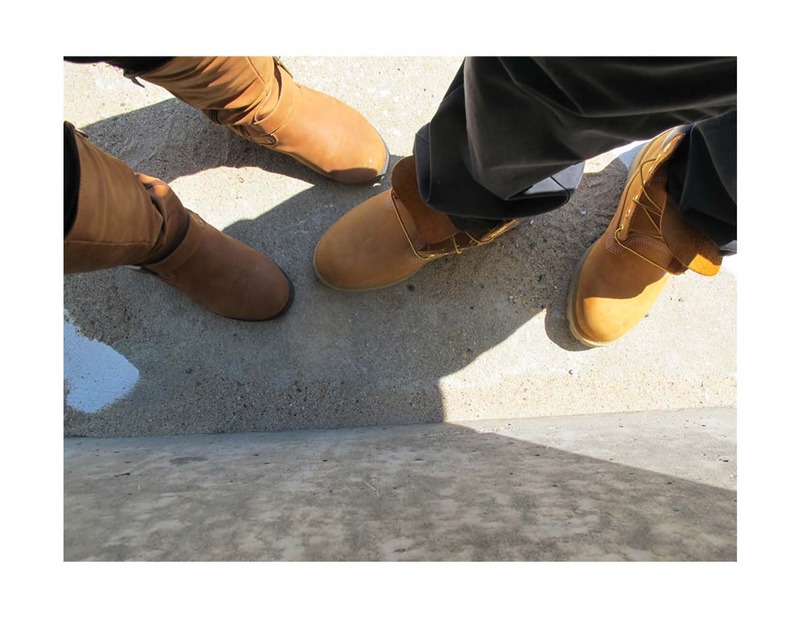 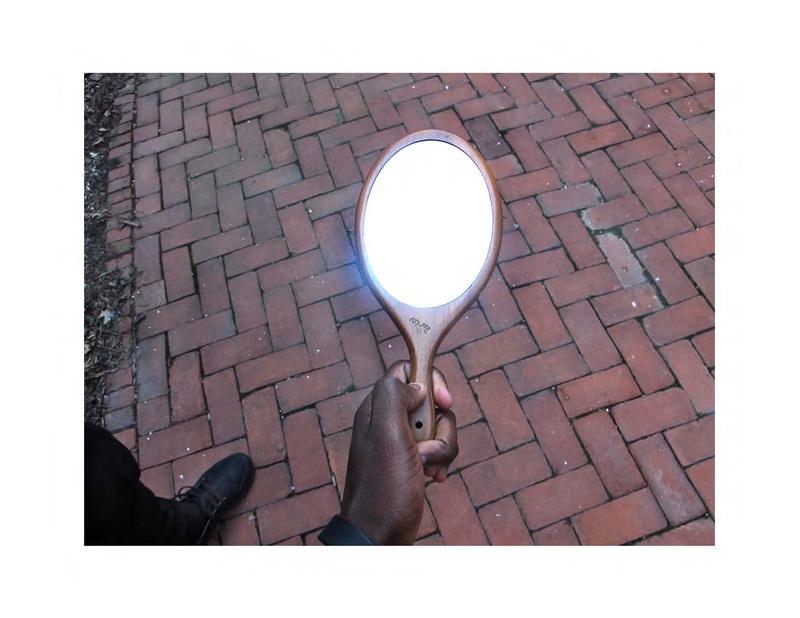 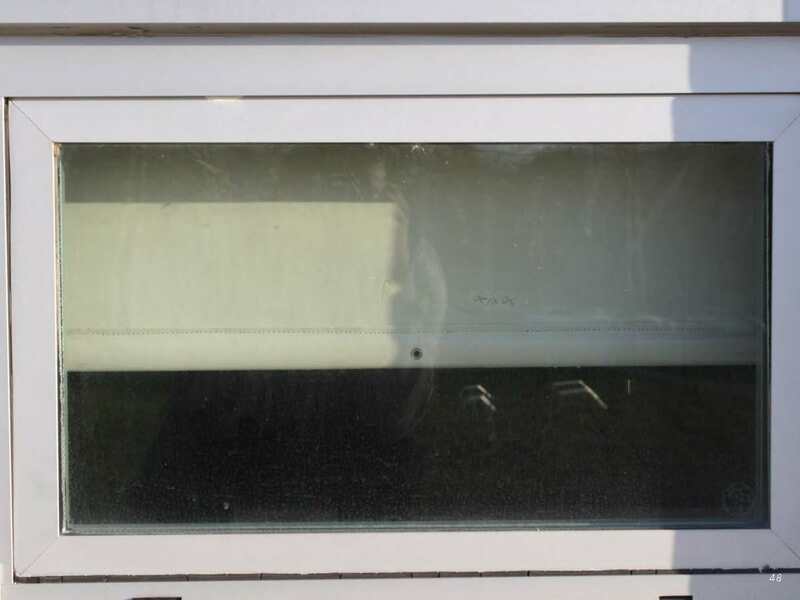 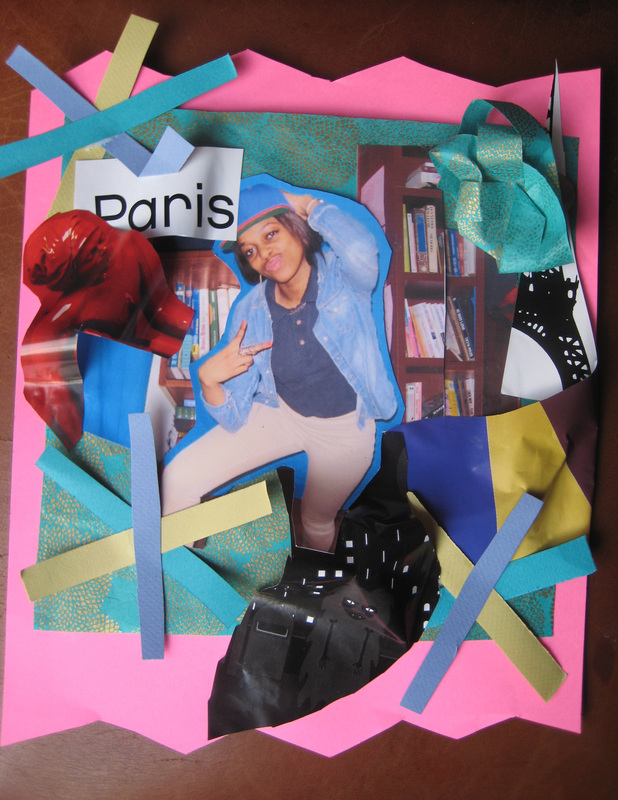 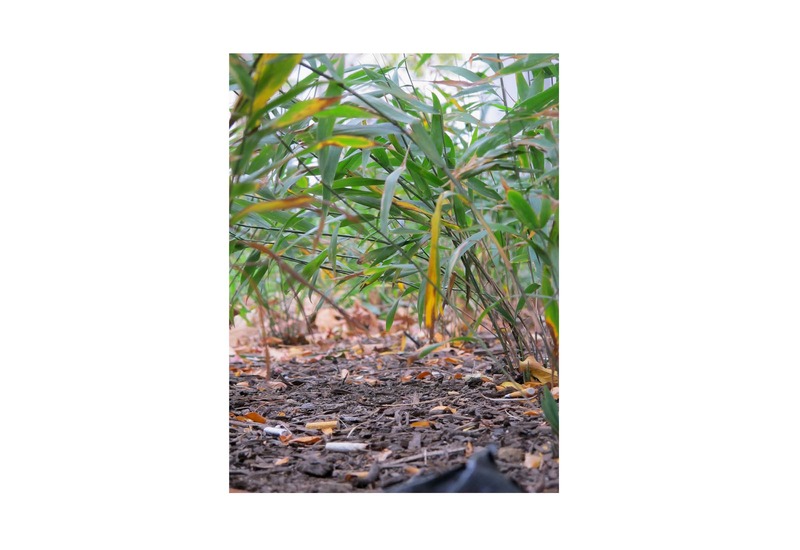 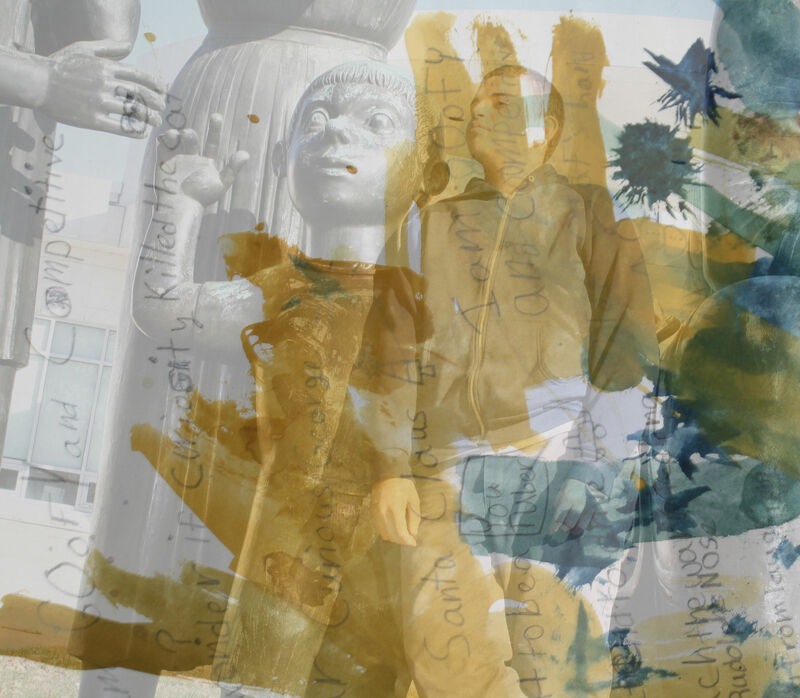 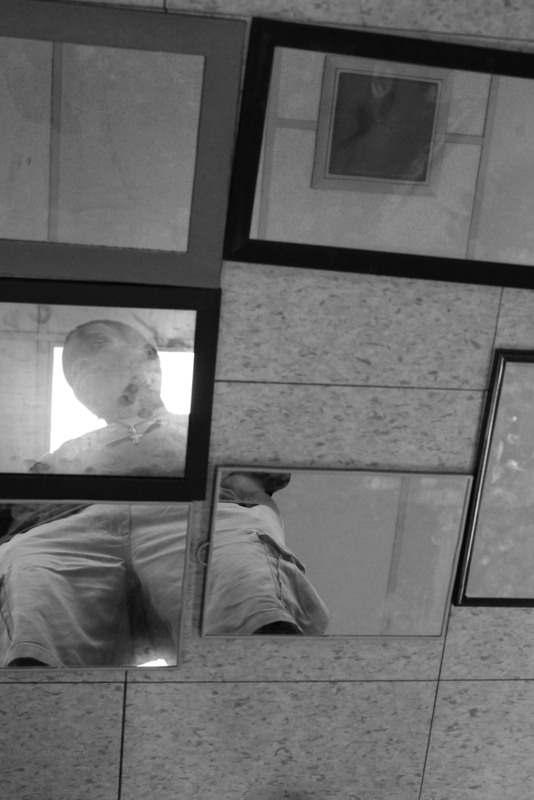 The resulting assembled imagery of objects and places are contemporary selfies which represent the students. 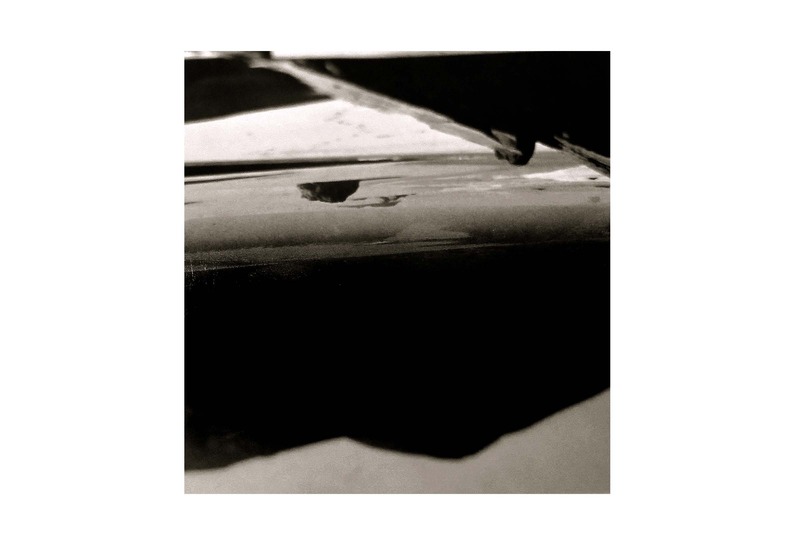 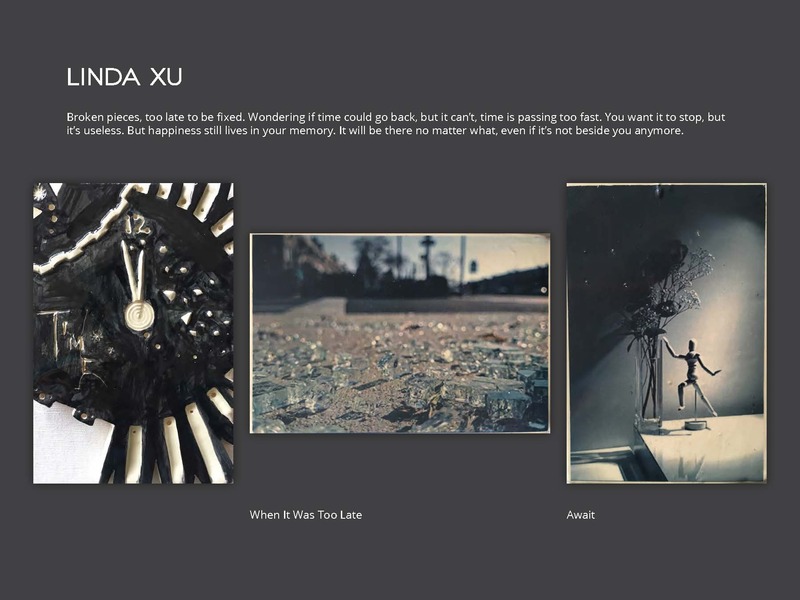 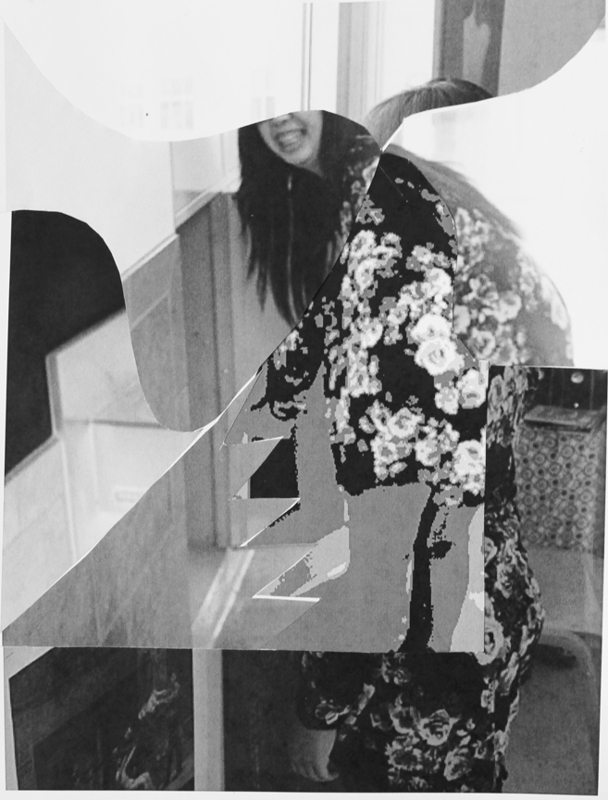 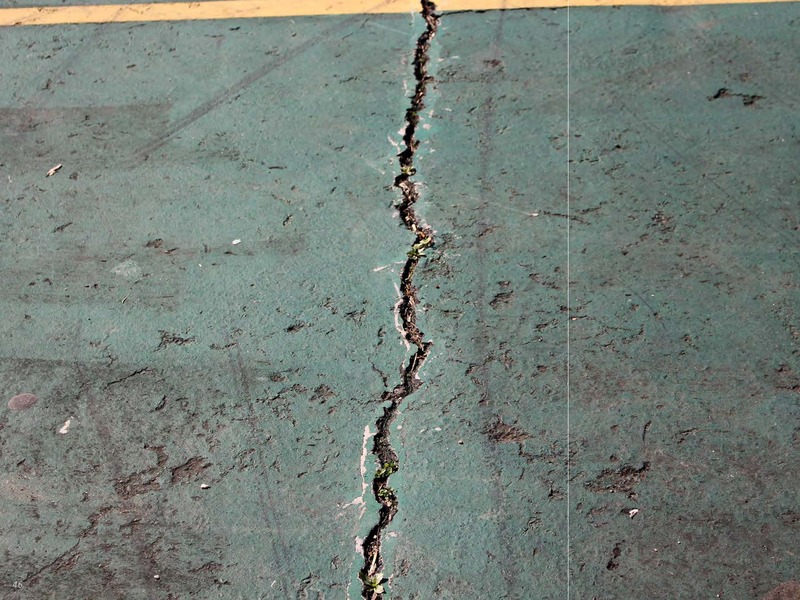 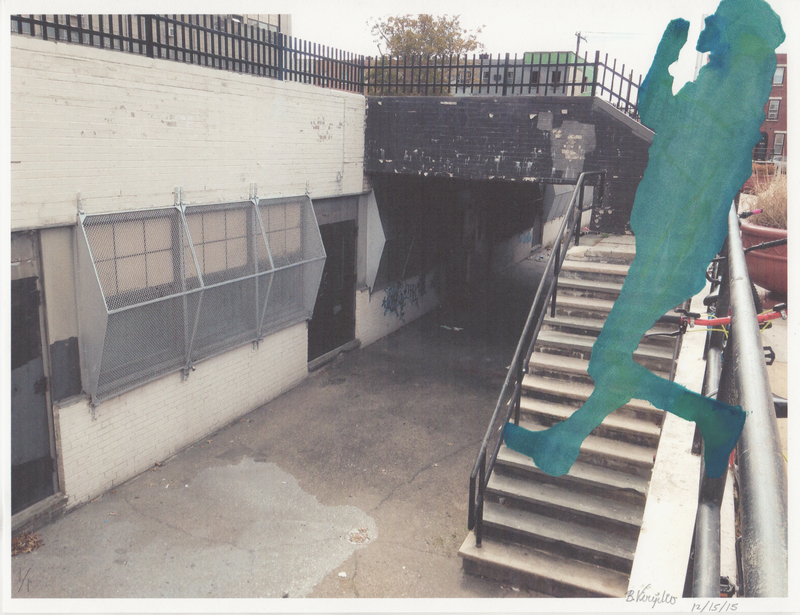 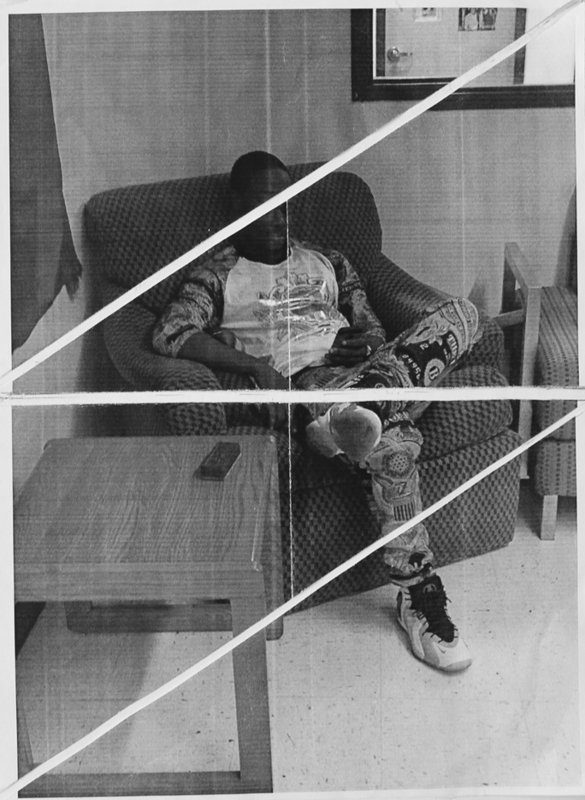 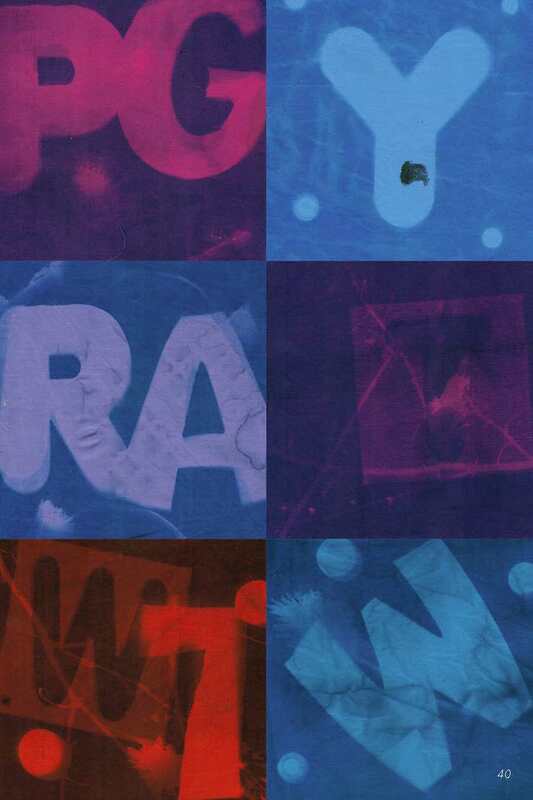 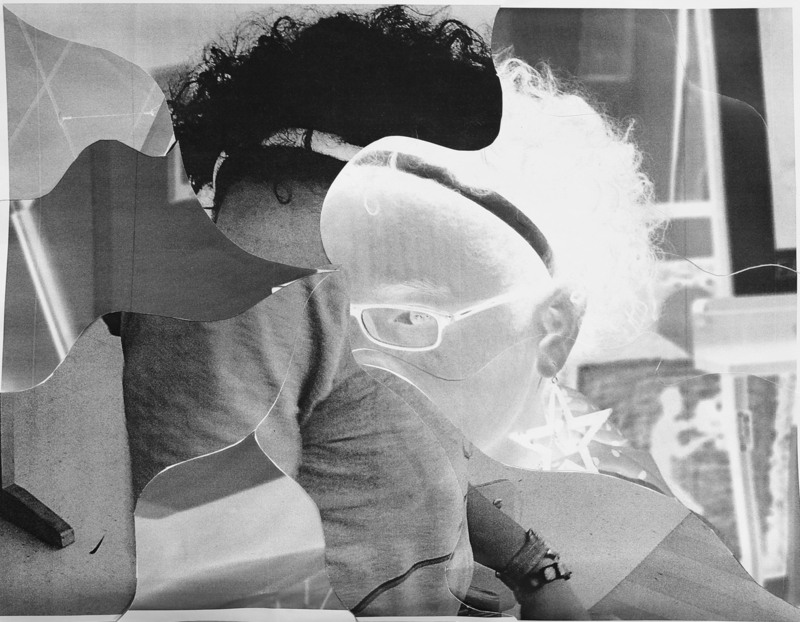 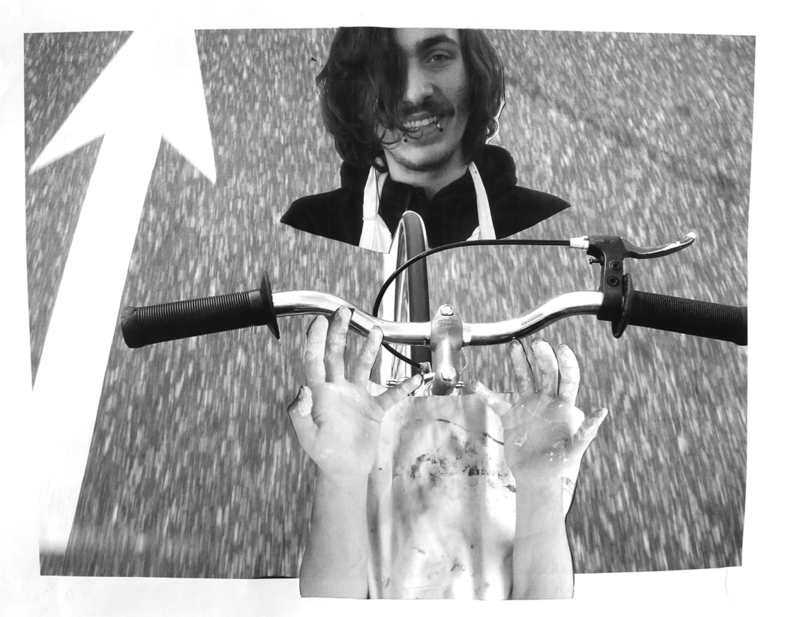 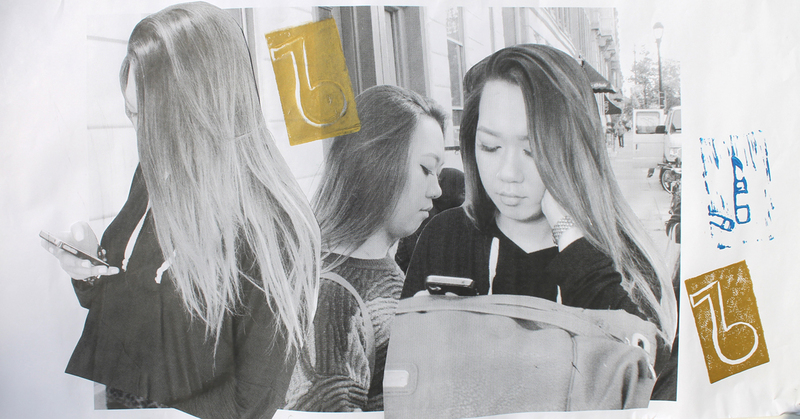 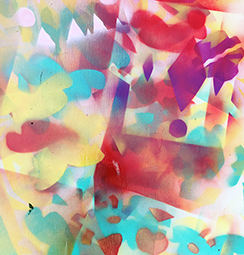 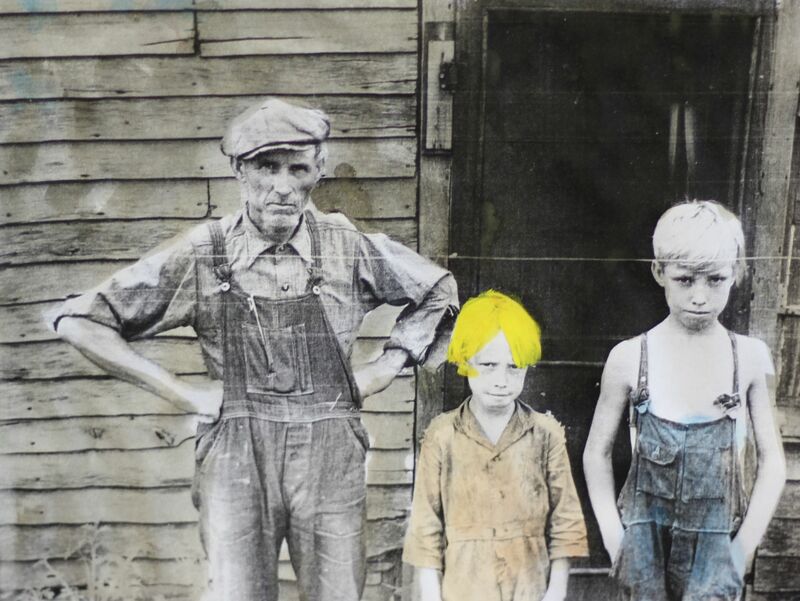 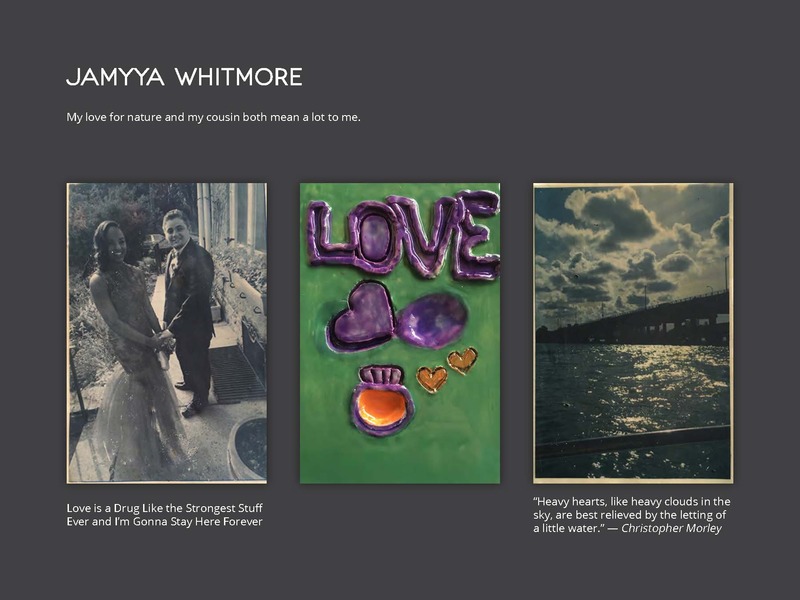 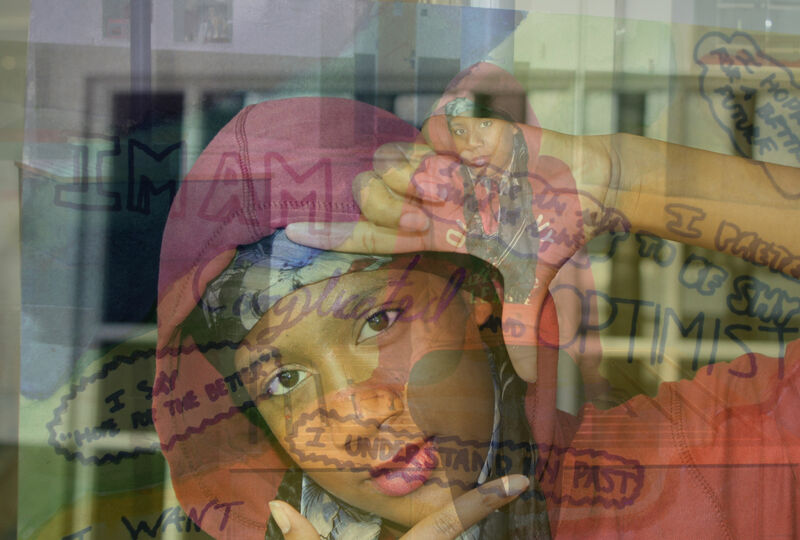 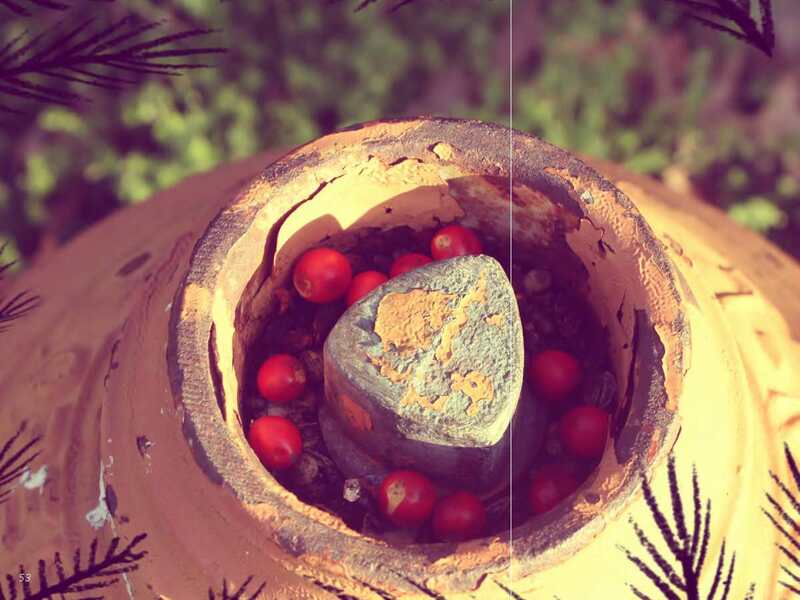 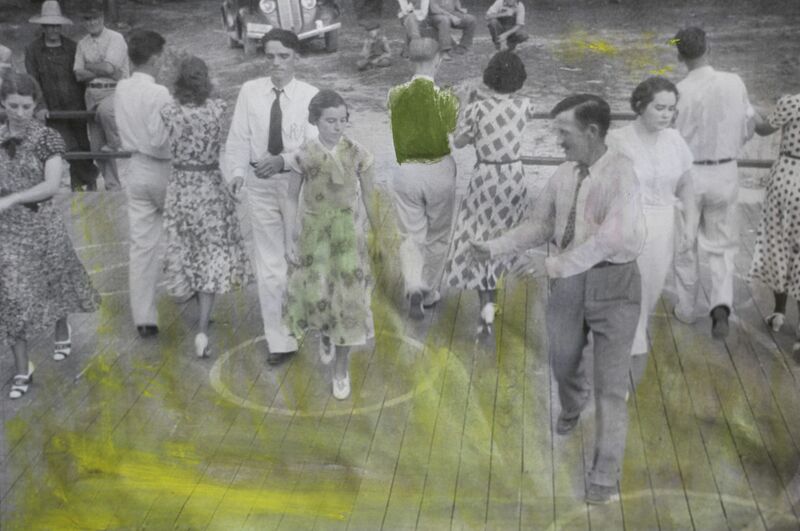 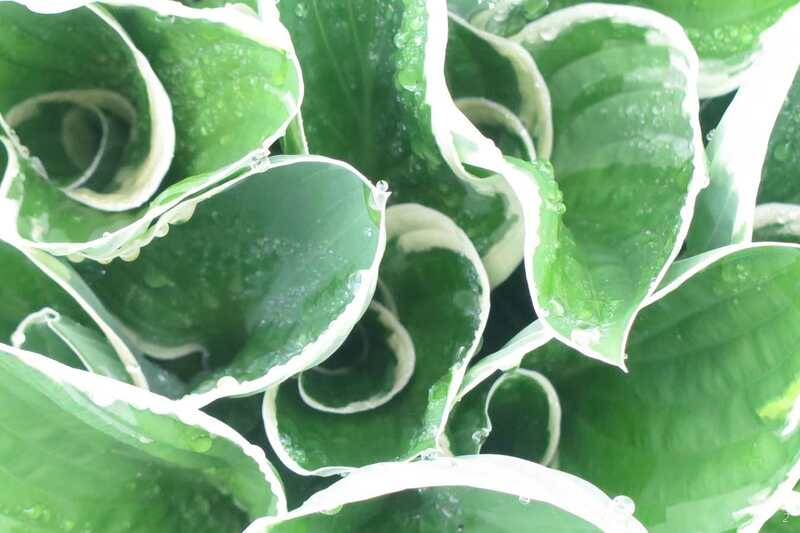 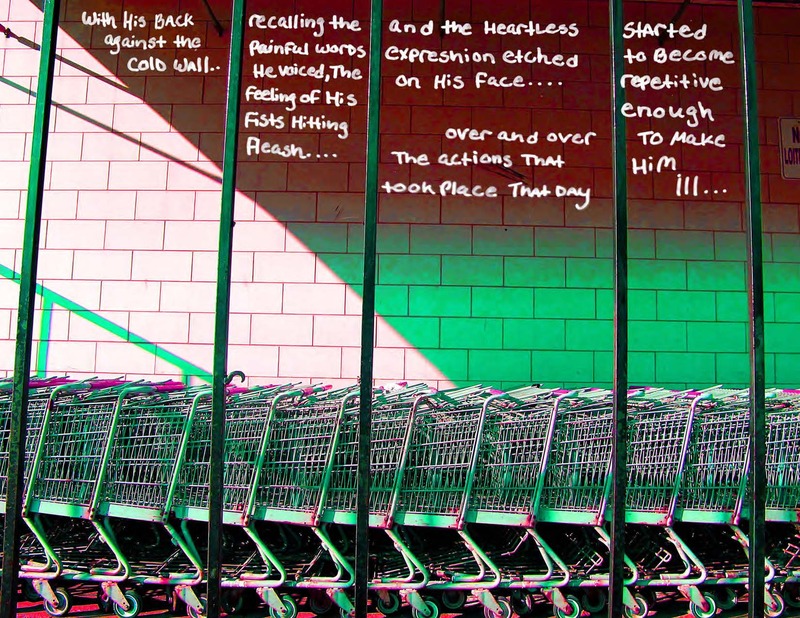 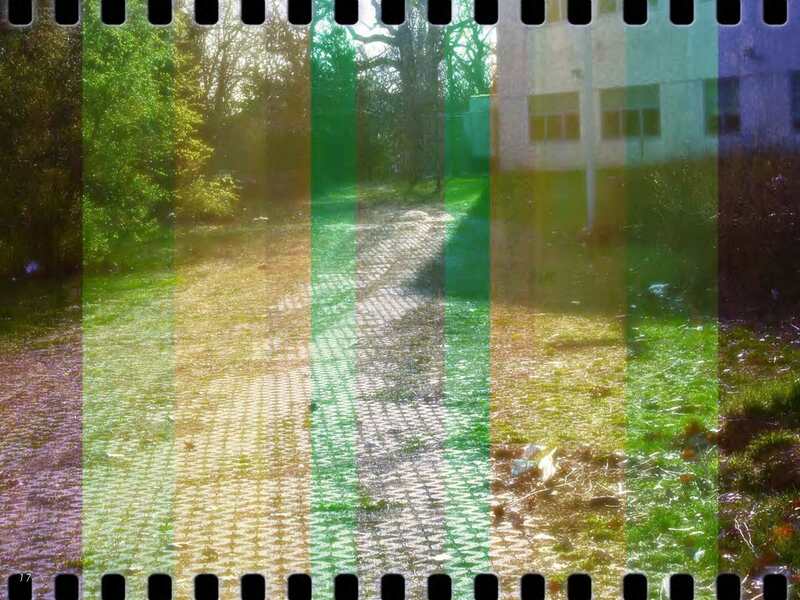 Students explored the idea of “Remix” through taking and altering a series of photographs. 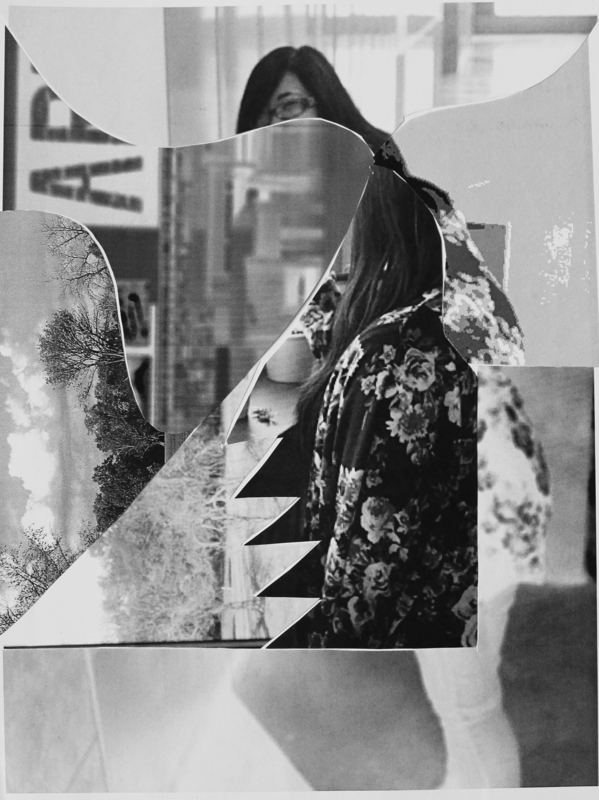 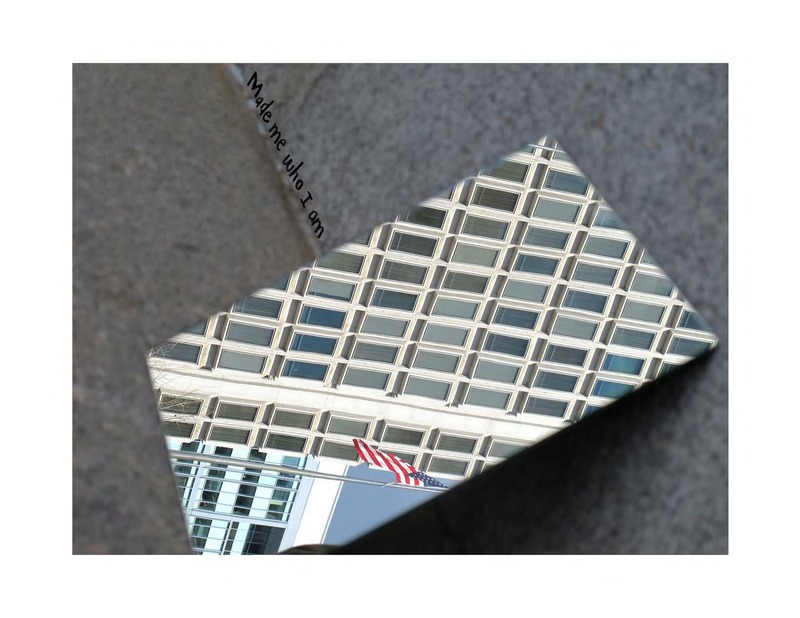 By re-photographing photographs of themselves - and then reworking them again - students developed photo-collages that explored typography and their own personal “systems of perspective”. 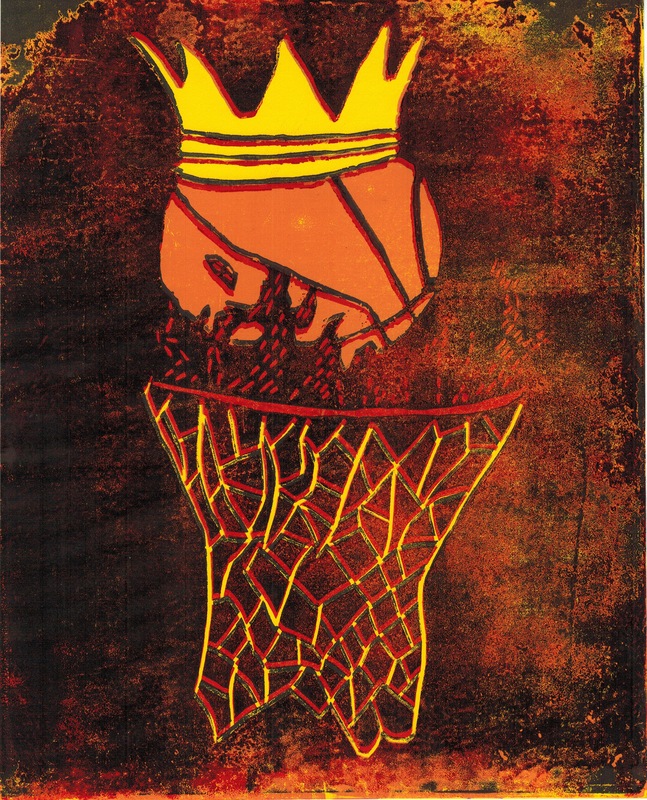 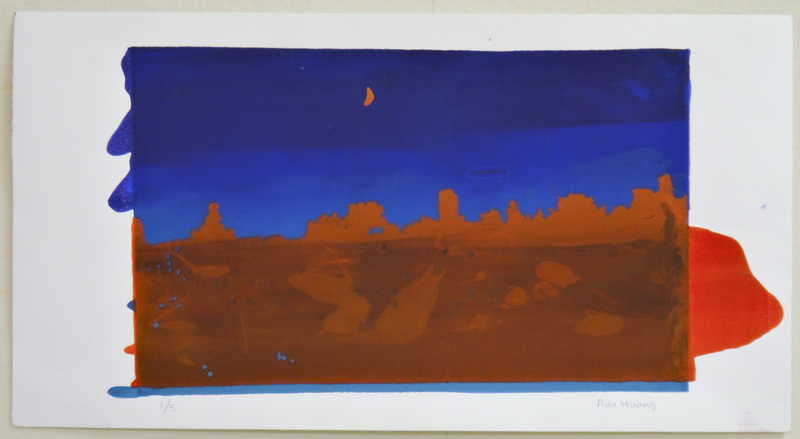 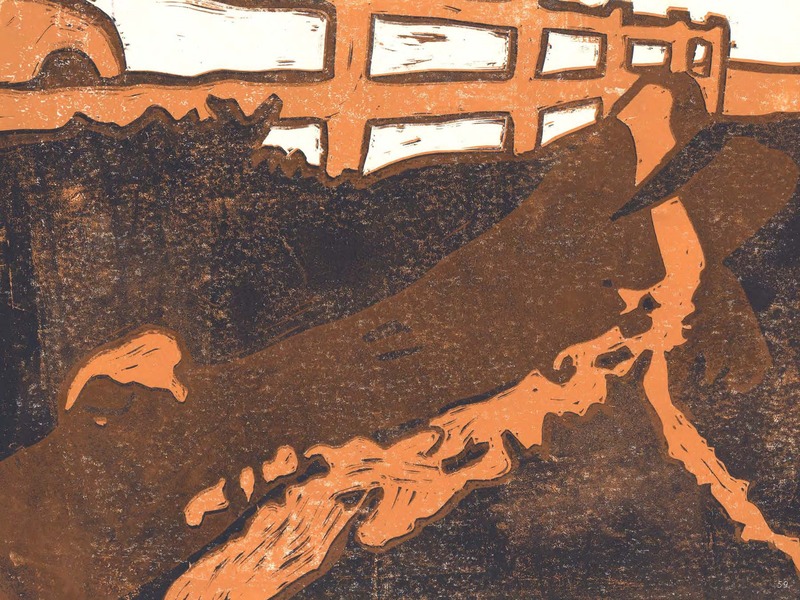 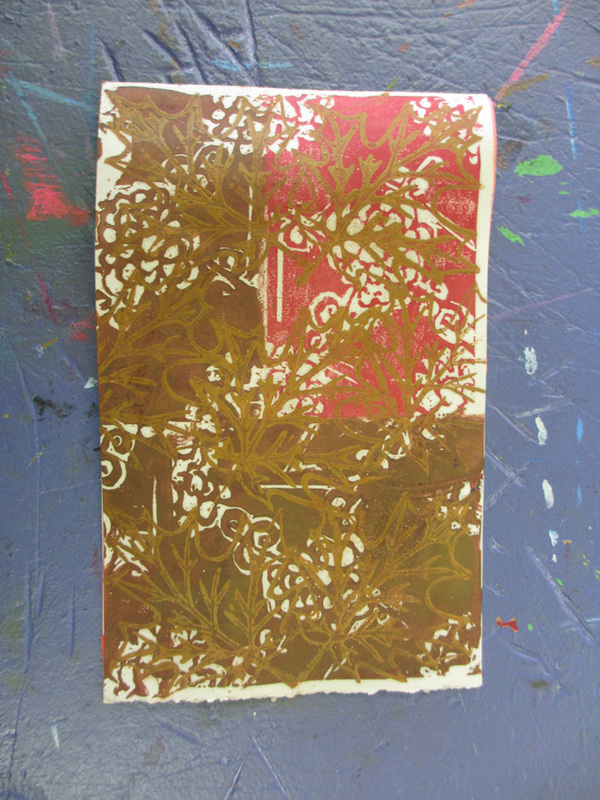 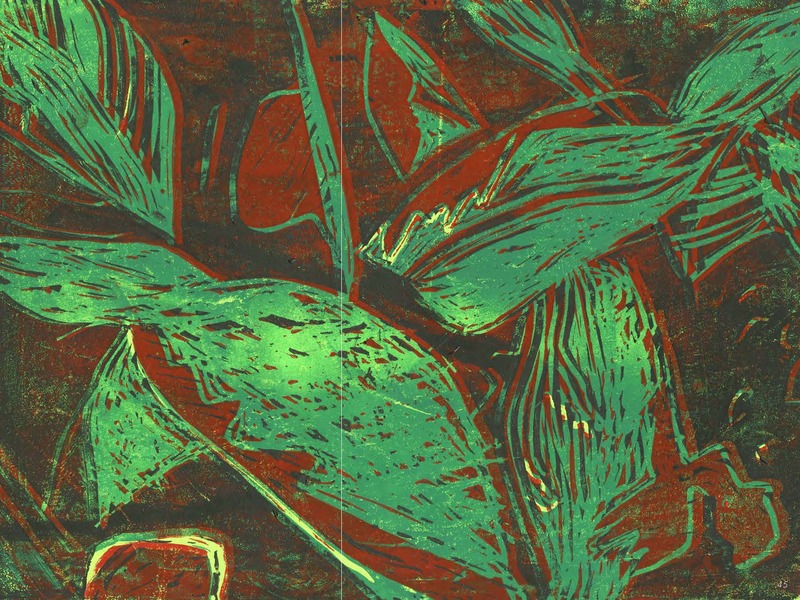 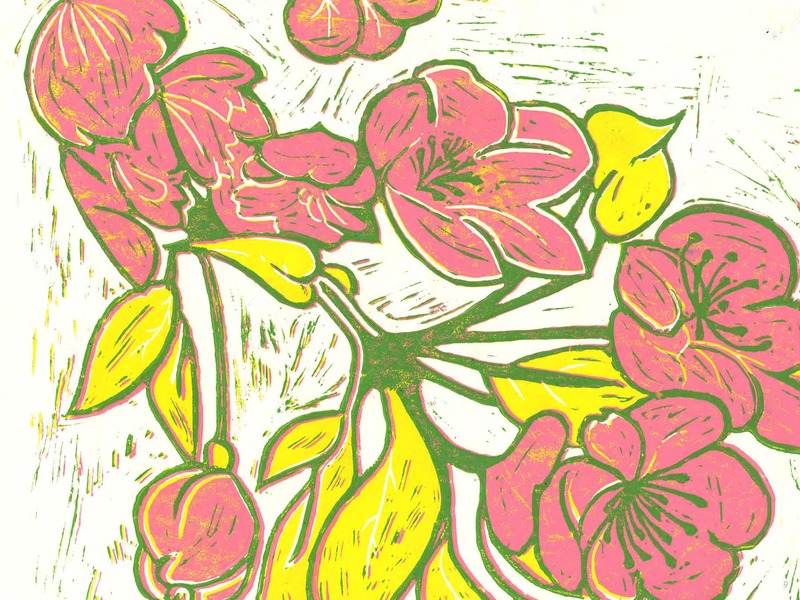 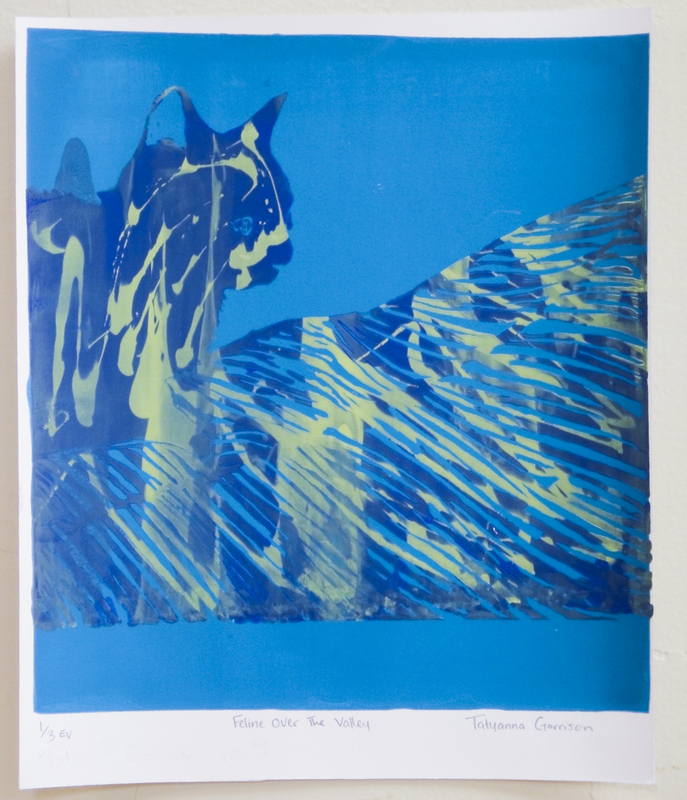 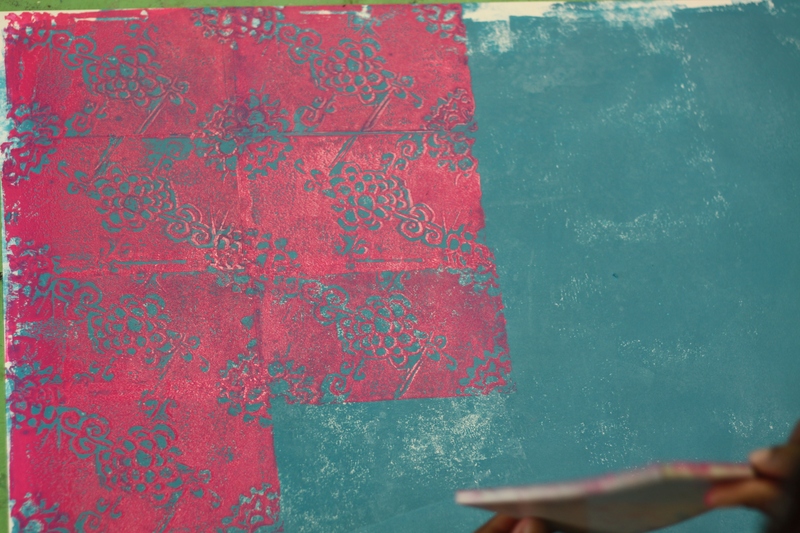 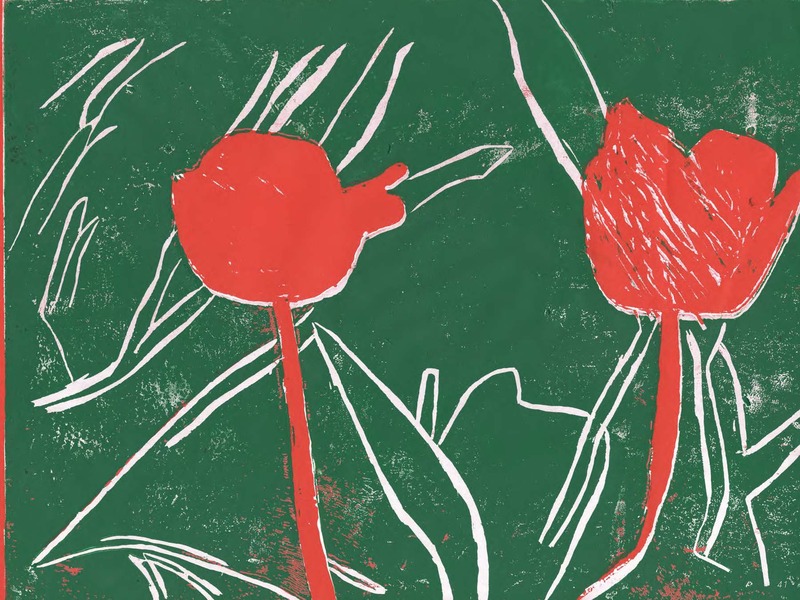 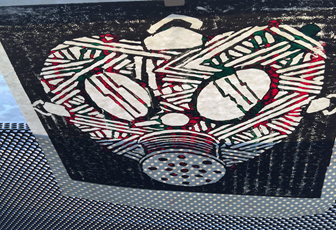 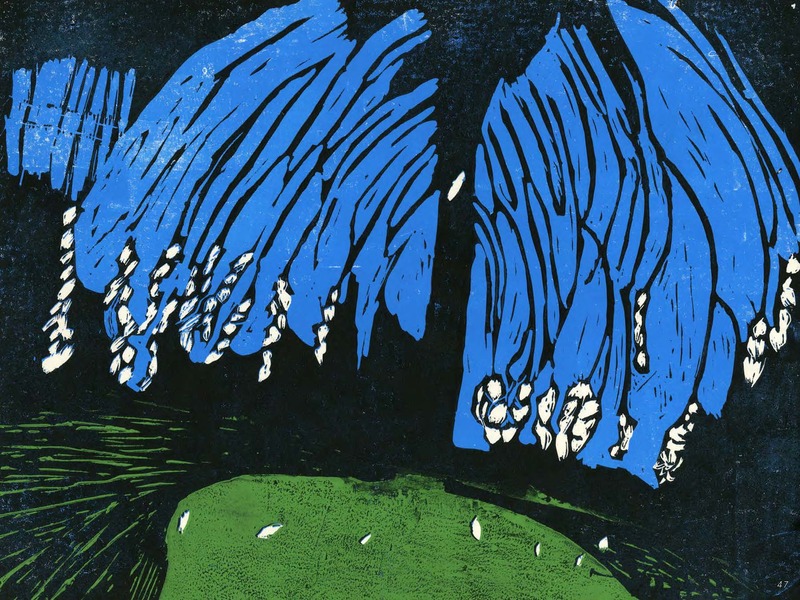 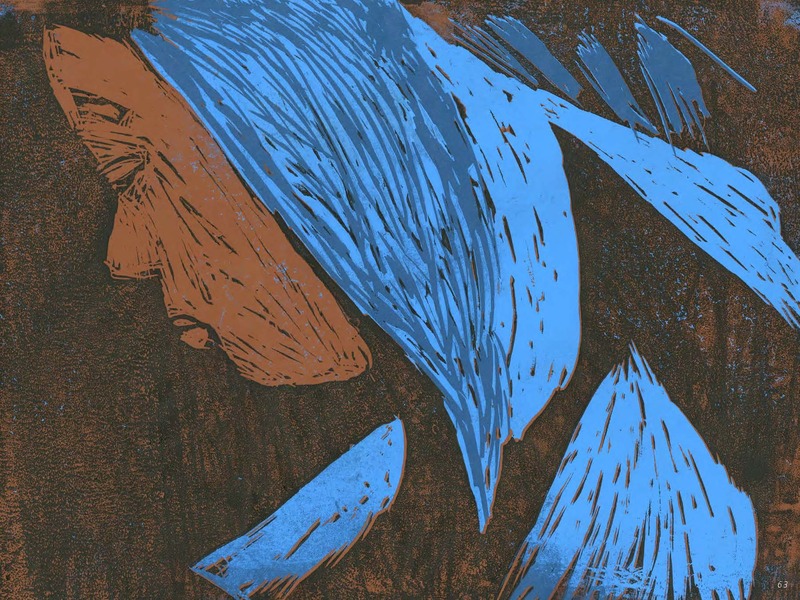 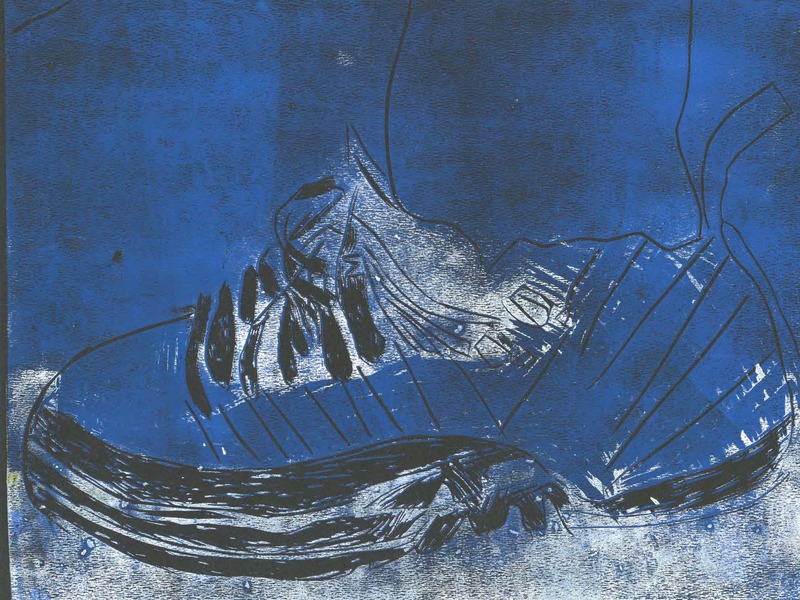 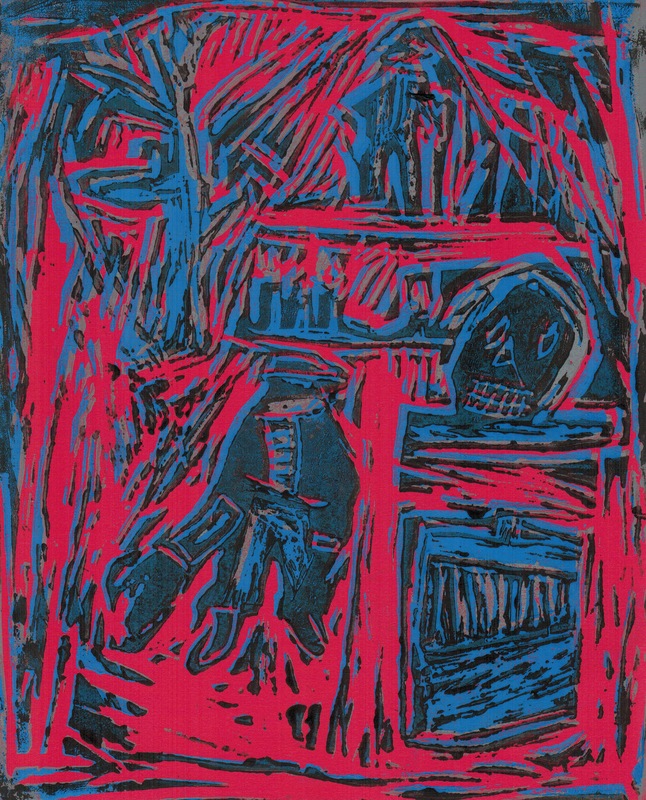 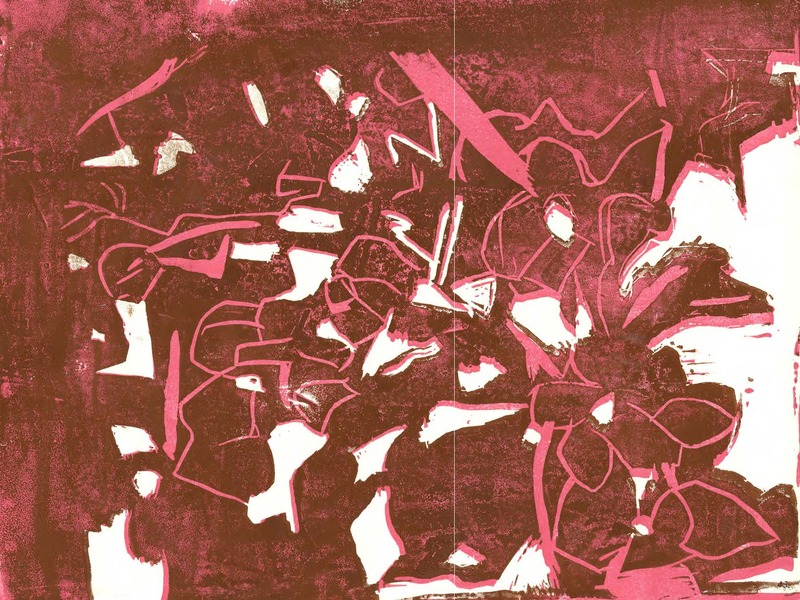 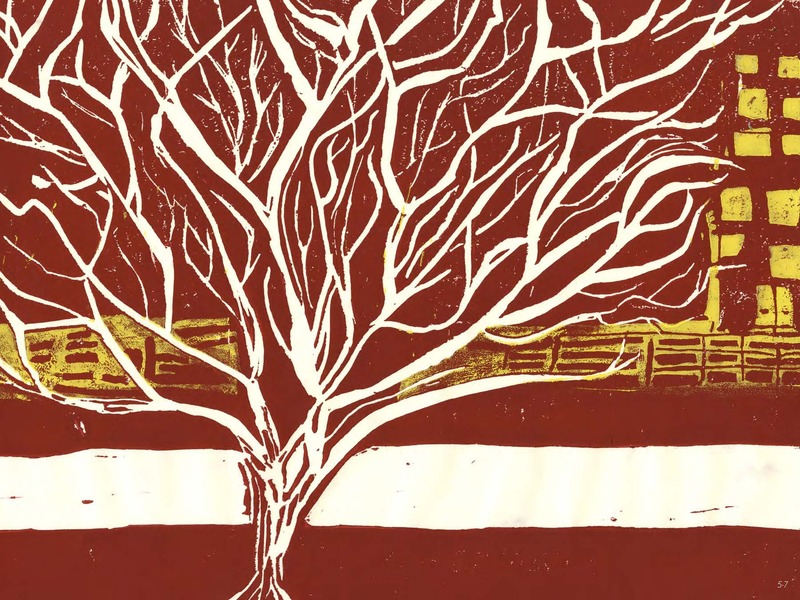 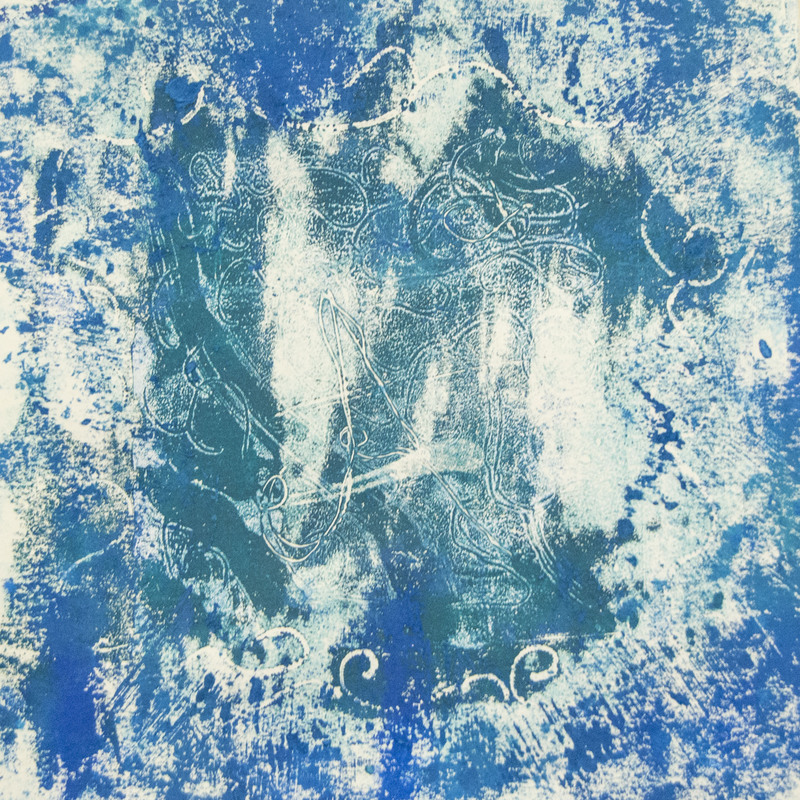 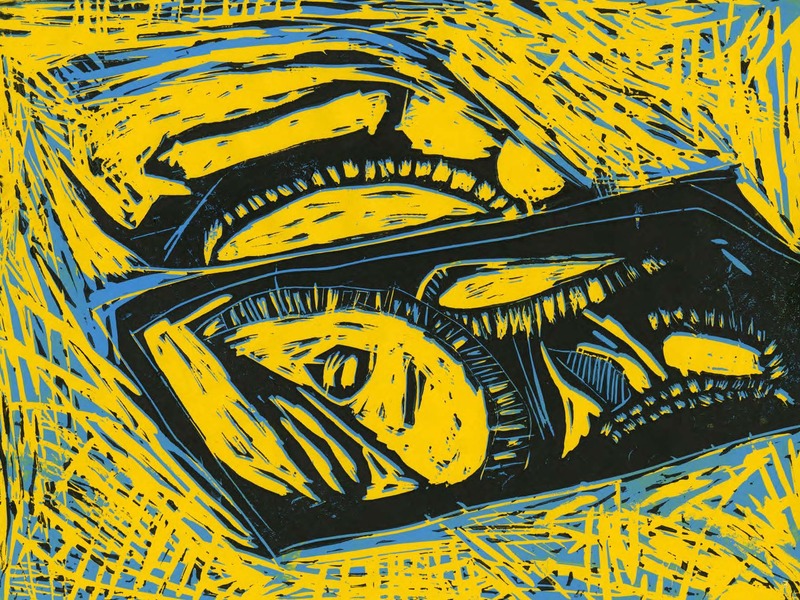 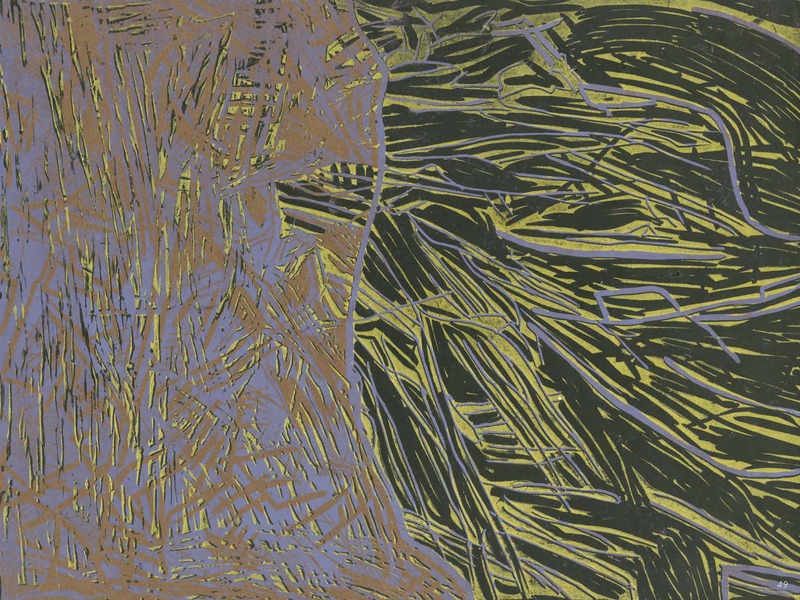 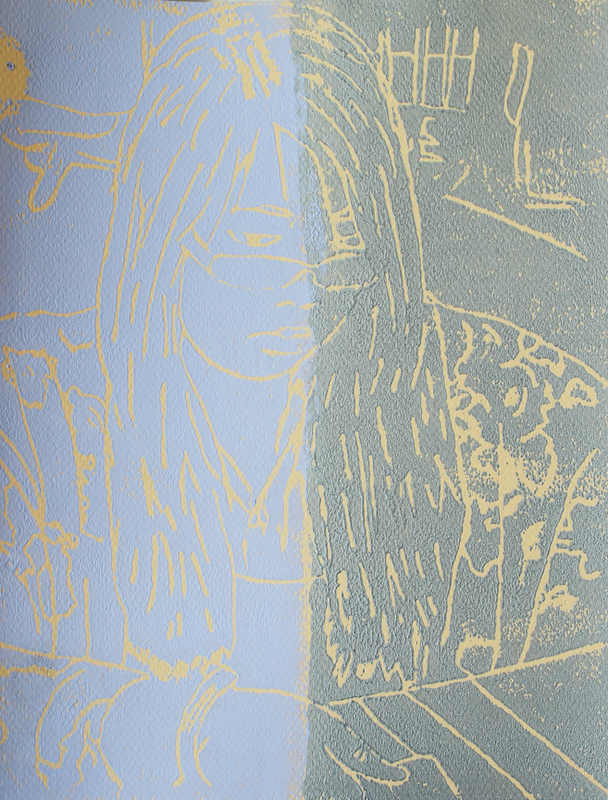 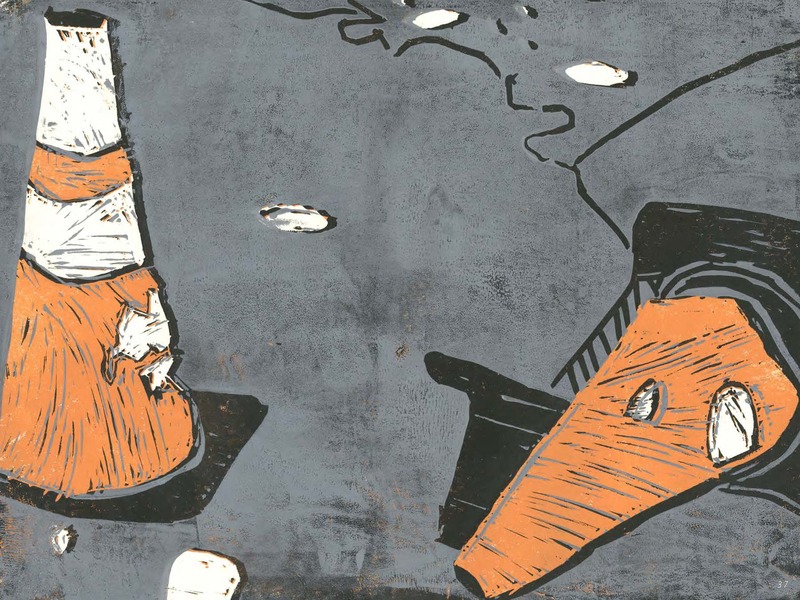 In this residency, students explored the process and technique of relief printmaking. 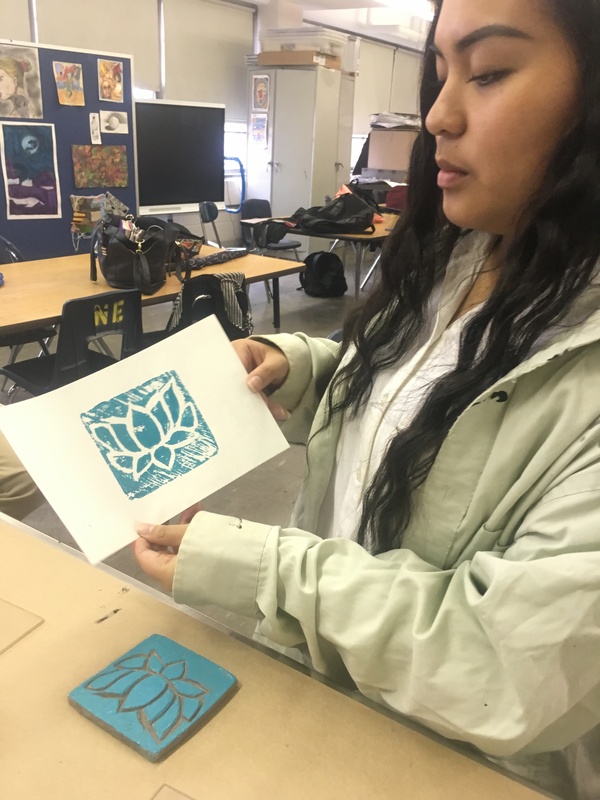 Students carved their images out of EZ cut blocks and discovered the possibilities in using the relief printing process. 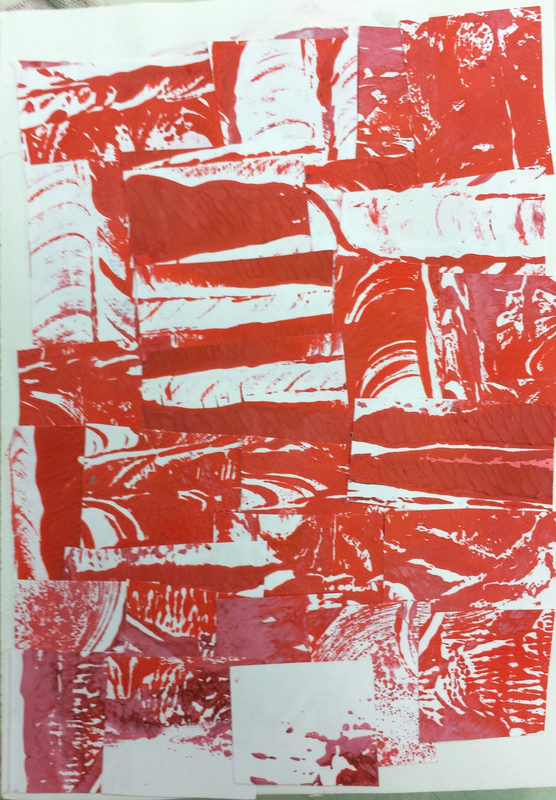 Formally they needed to consider pattern, color and repetition, as well as printing blocks in conjunction with other students’ images. 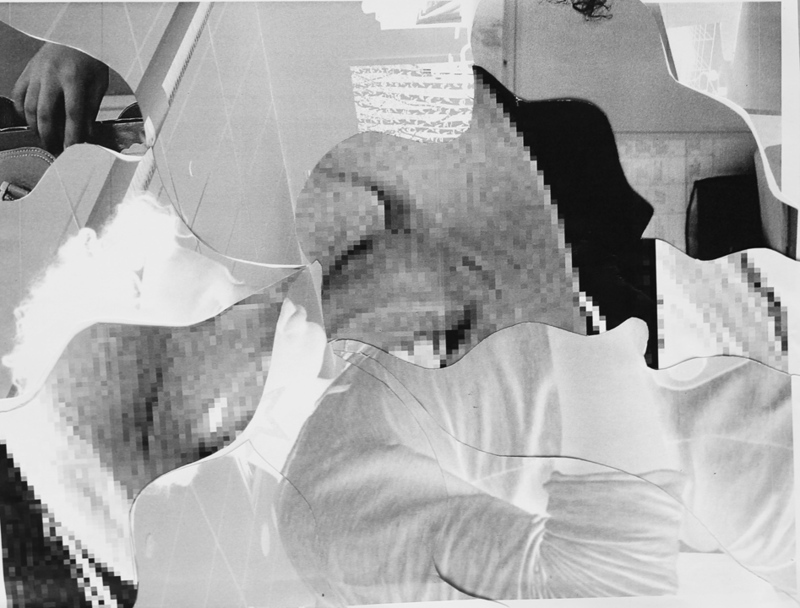 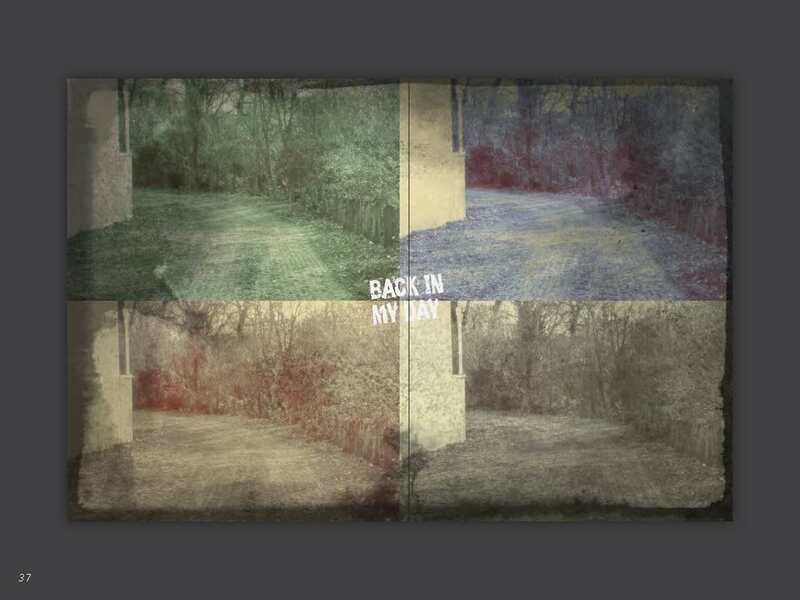 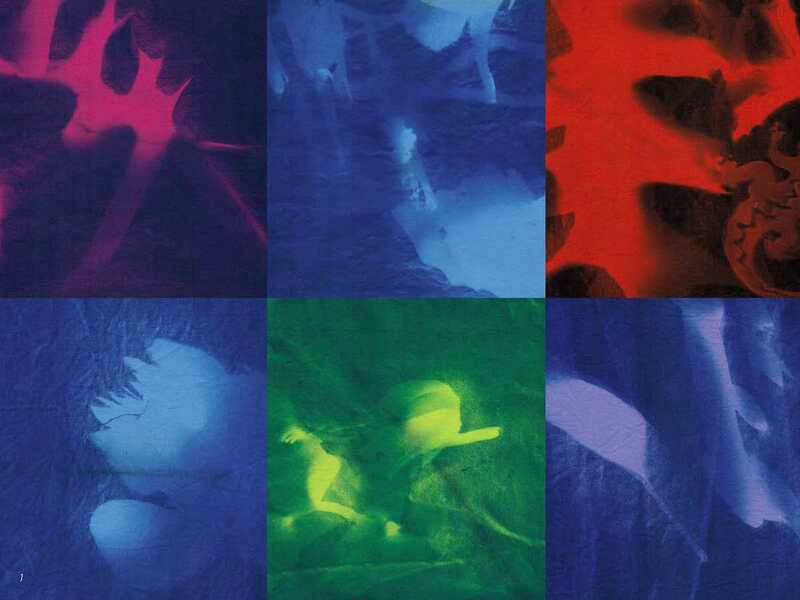 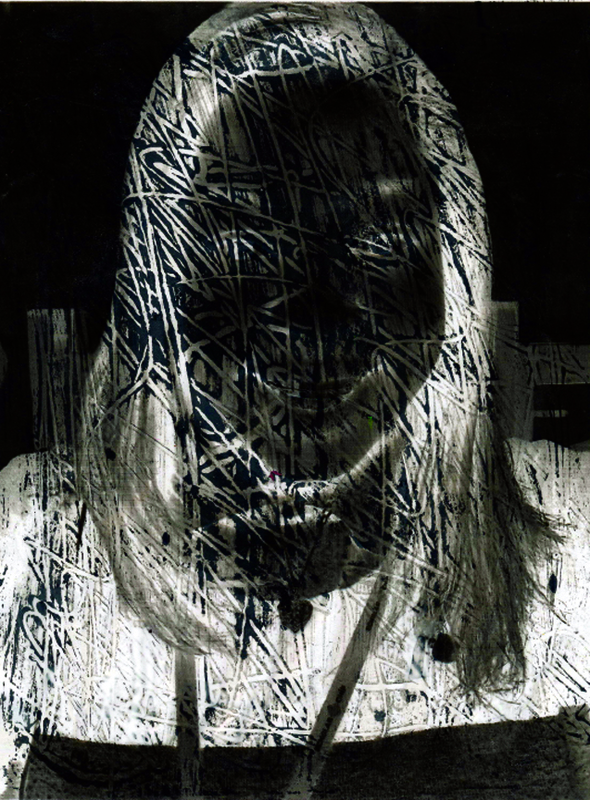 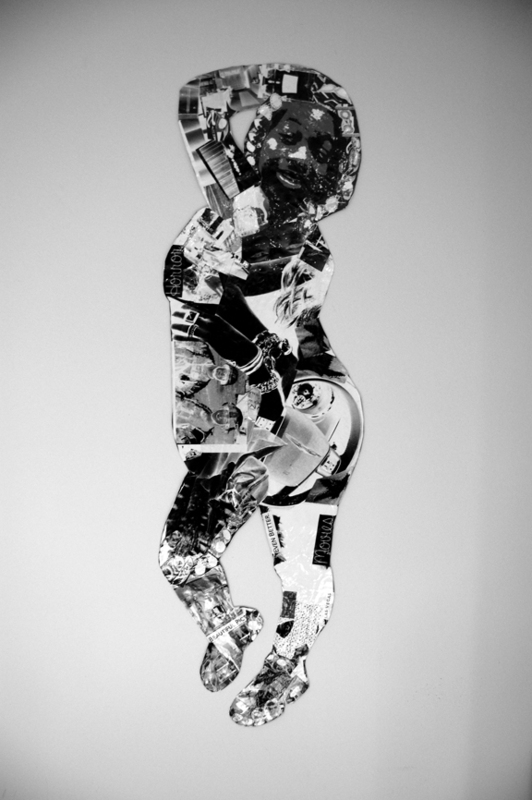 This residency explored a range of photographic techniques, including lighting and portraiture, as well as ways to incorporate photography into mixed-media artworks. 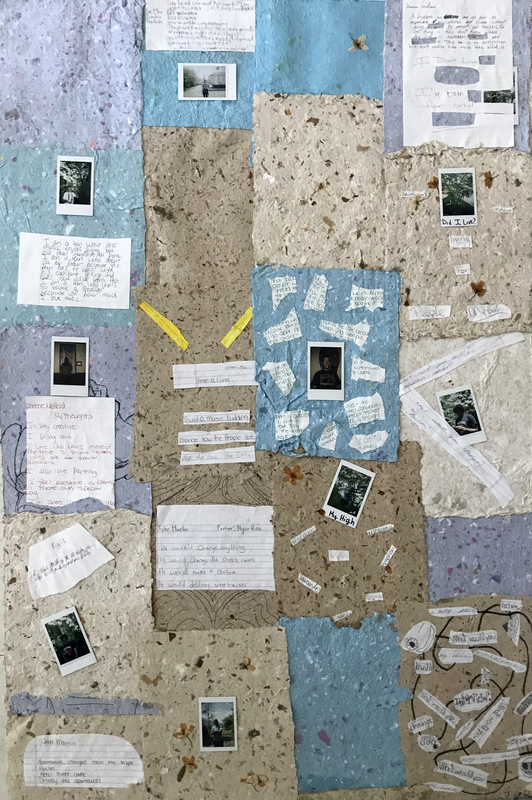 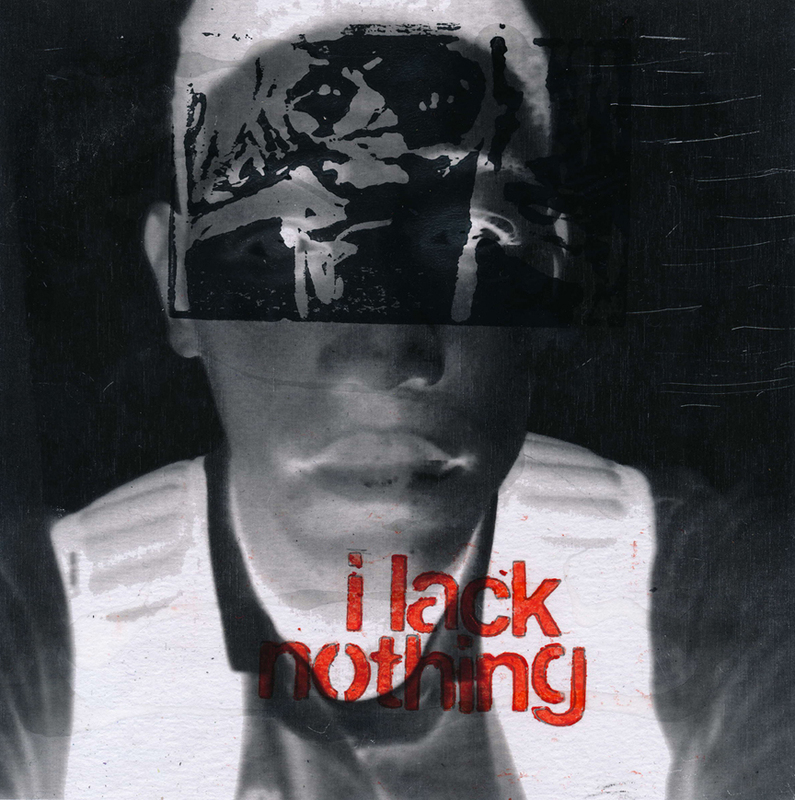 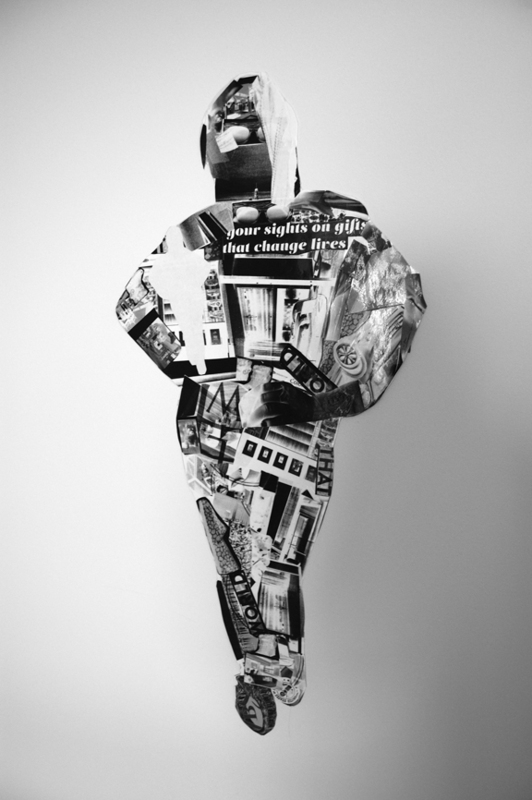 Using printed photographs to create collages, sculptural forms, portraits and stop-motion animations, students responded to the questions: Who am I? 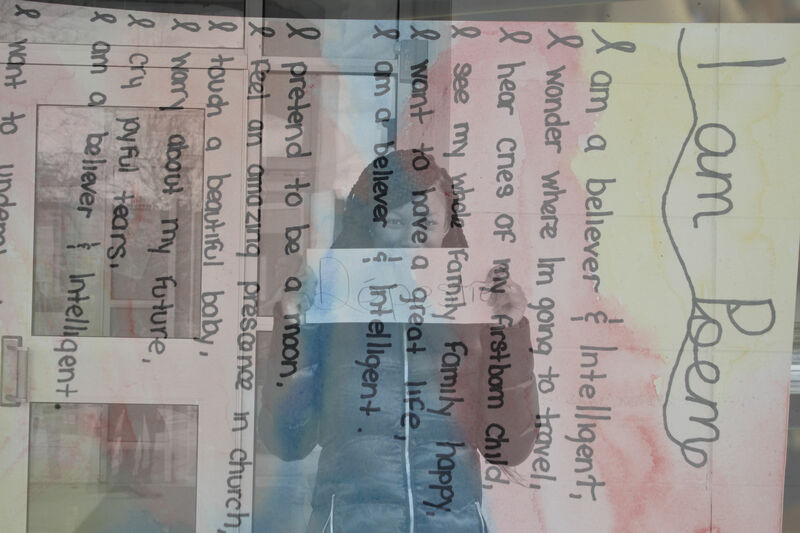 What is my world like? 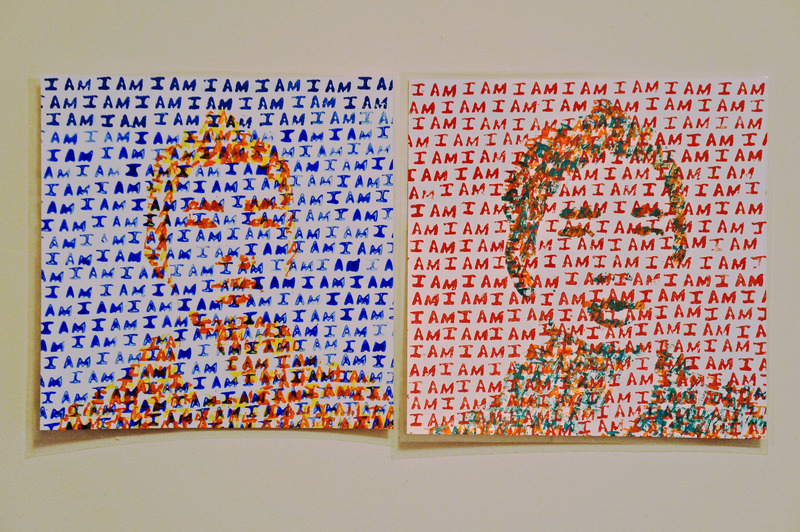 And, Who do I want to be? 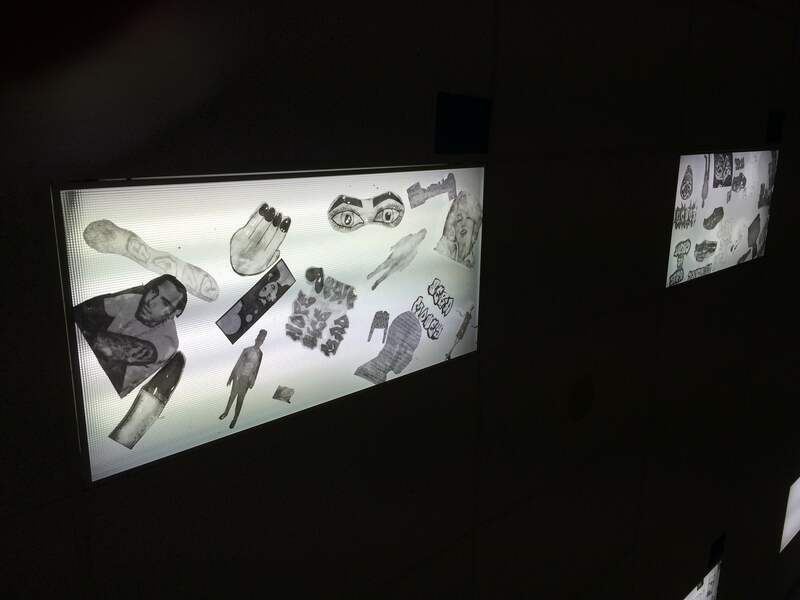 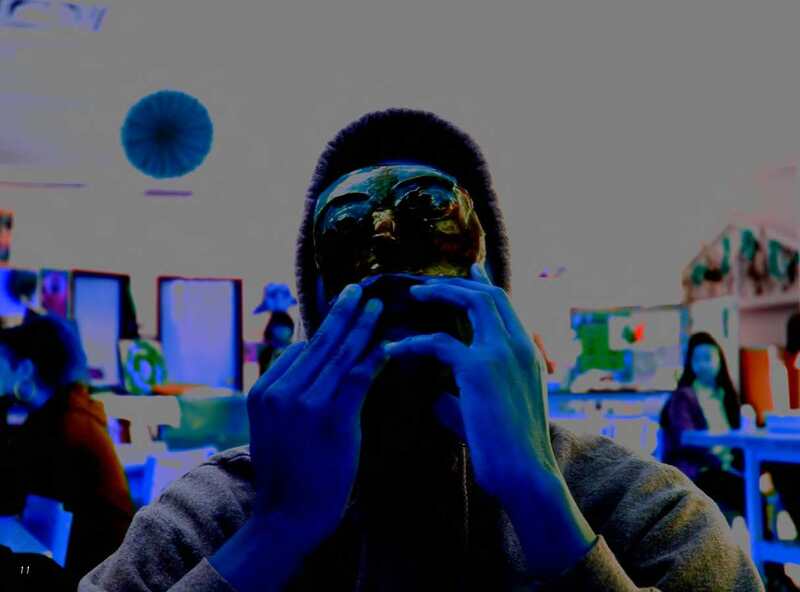 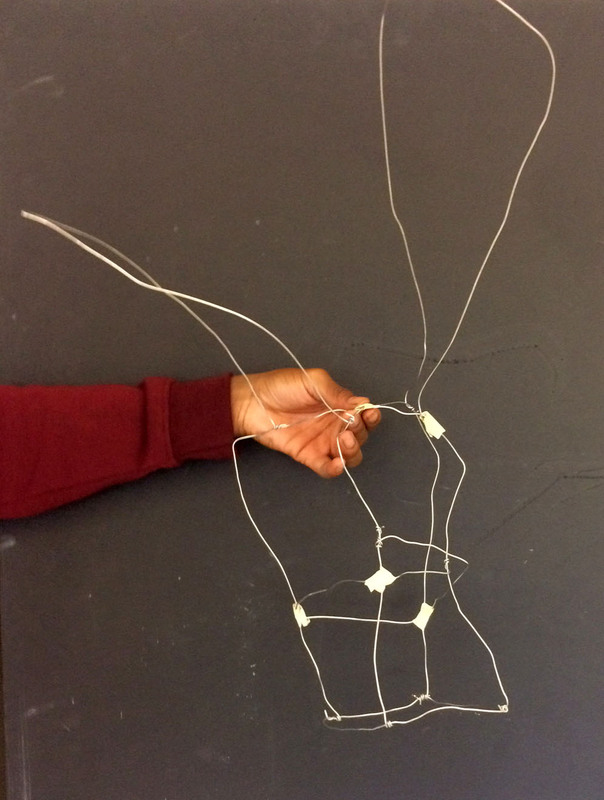 Students manipulated light, shadow, gesture and symbol to explore themes of power, communication and space. 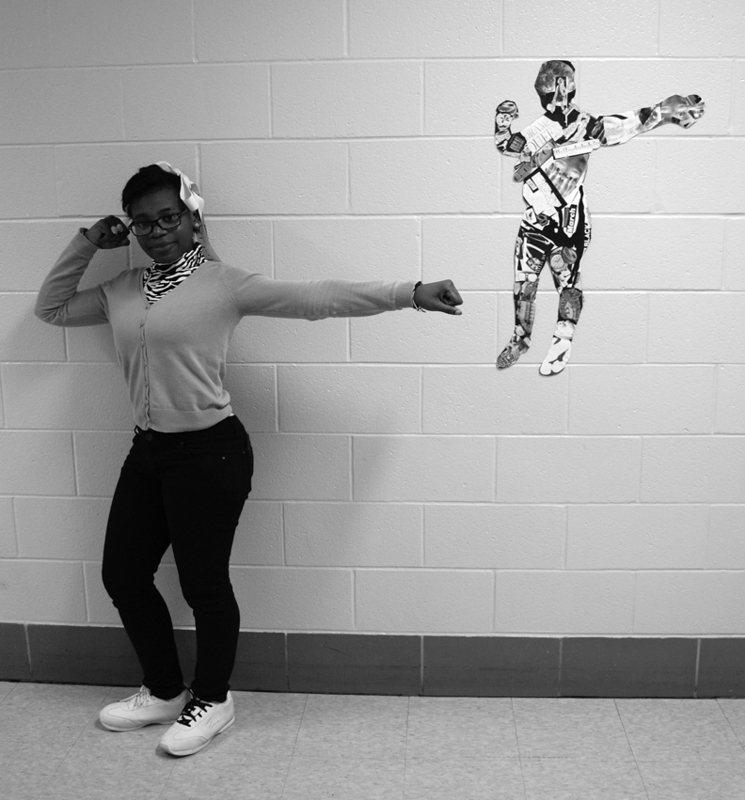 The project culminated in a series of student-produced stop-motion “Public Service Announcements” incorporating gesture, movement and text. 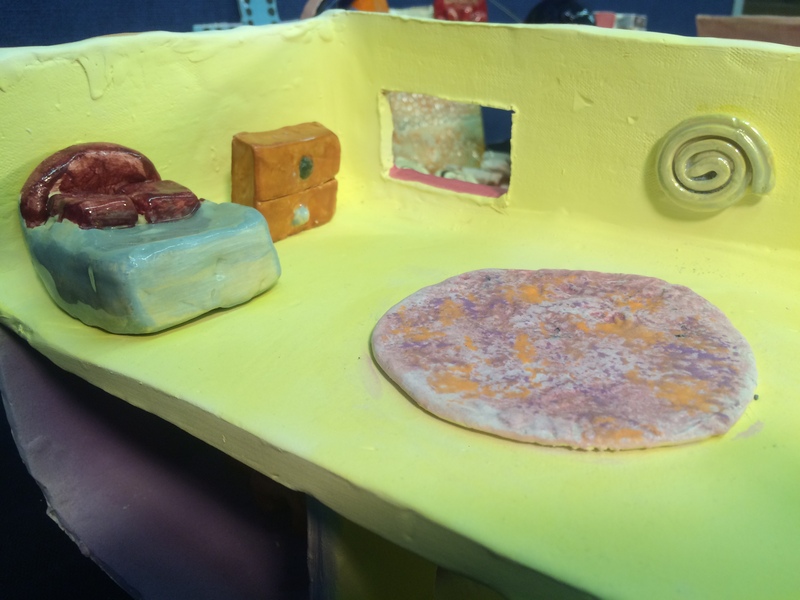 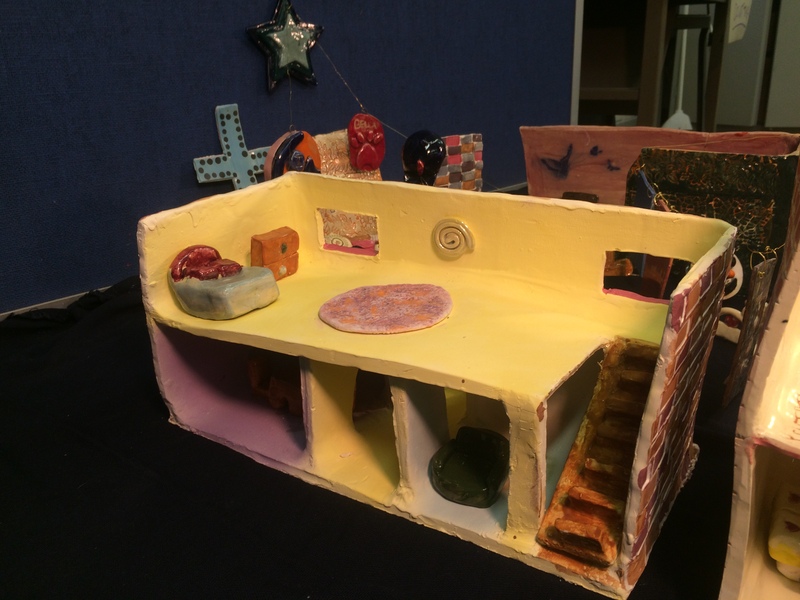 In this residency, students explored concepts of identity, narrative and shared cultural experience in order to create stop-motion animations. 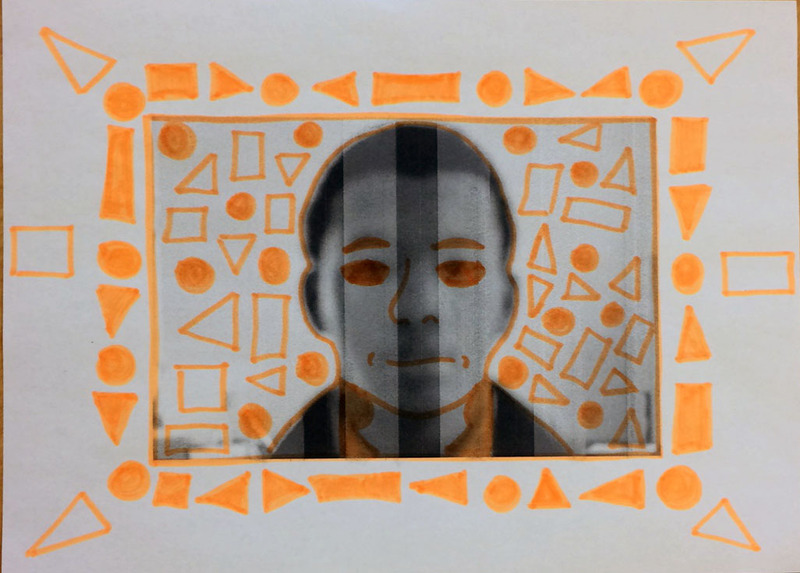 In constructing a plot for a short-form video, they played with the visual identities of easily recognizable figures from both American and Indian pop culture, blending and finding humor in the cultural legacies. 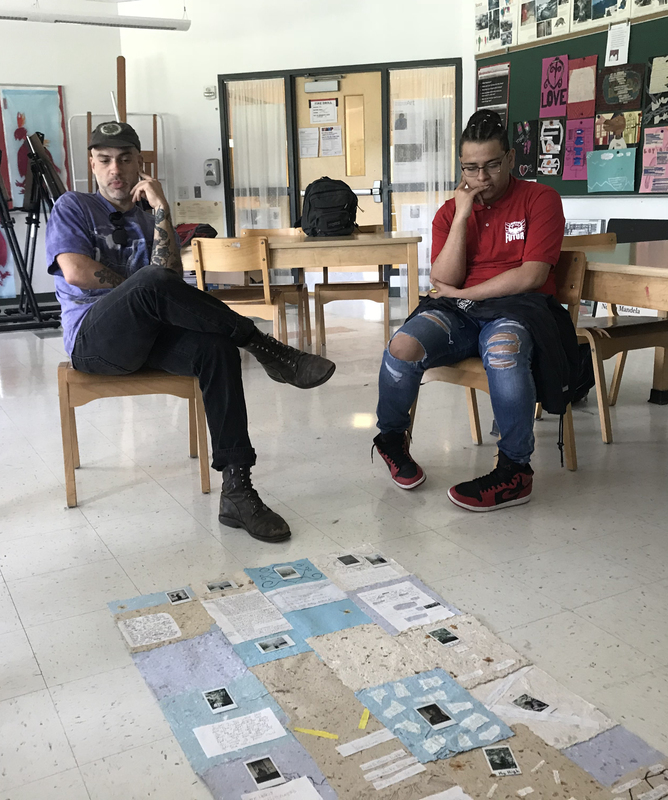 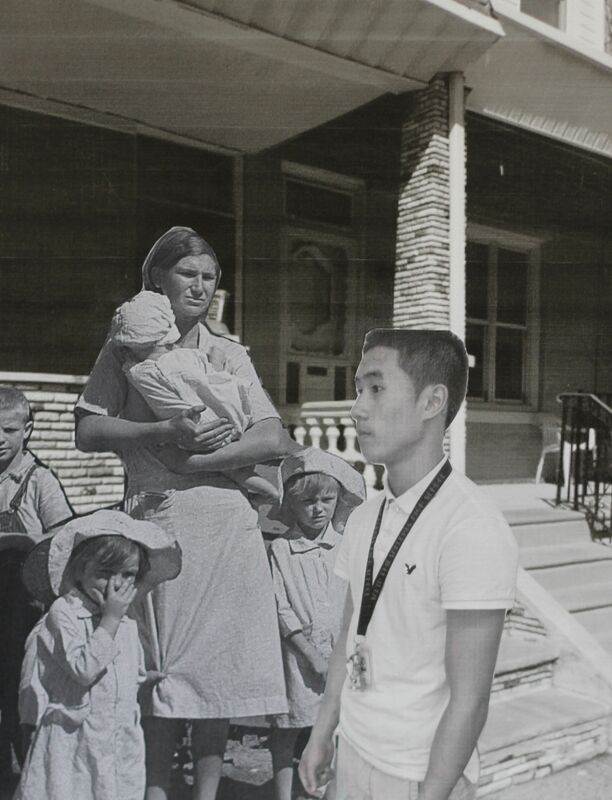 Students engaged in a visual dialogue with documentary photographs commissioned by the Farm Security Administration during the Great Depression, to explore concepts of history, narrative and self-portraiture. 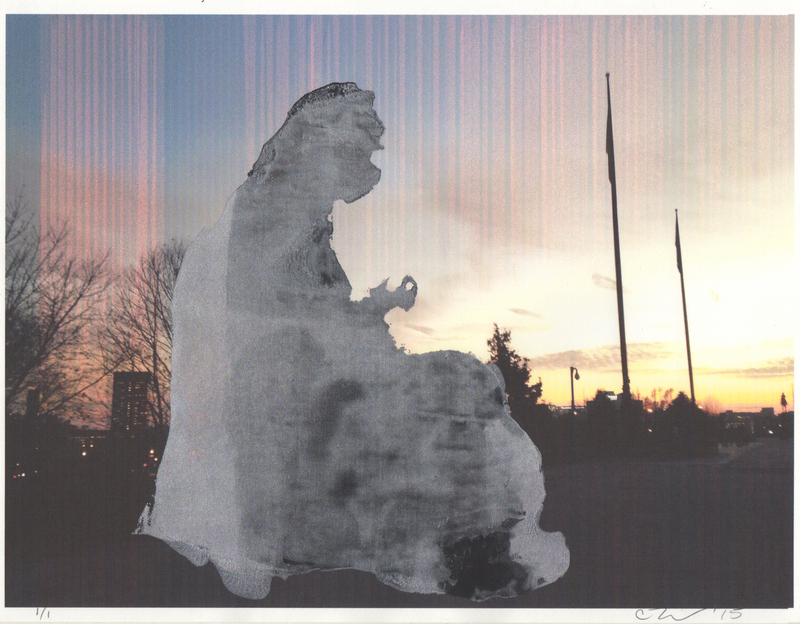 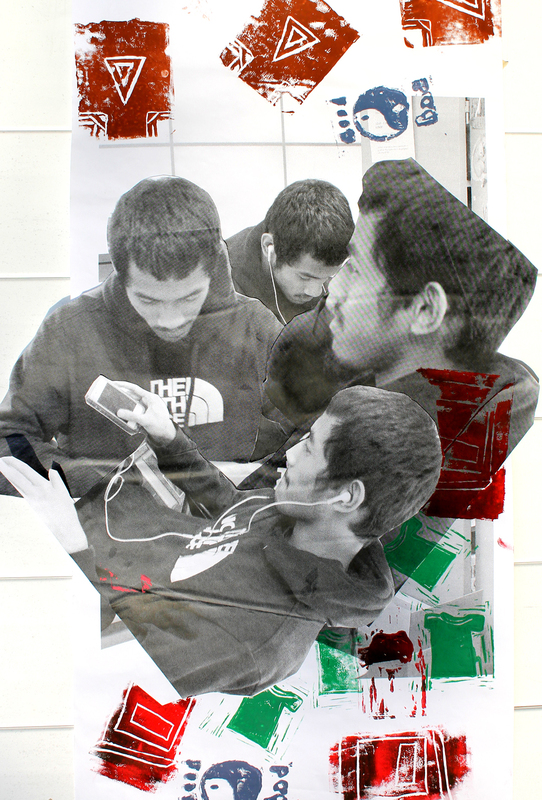 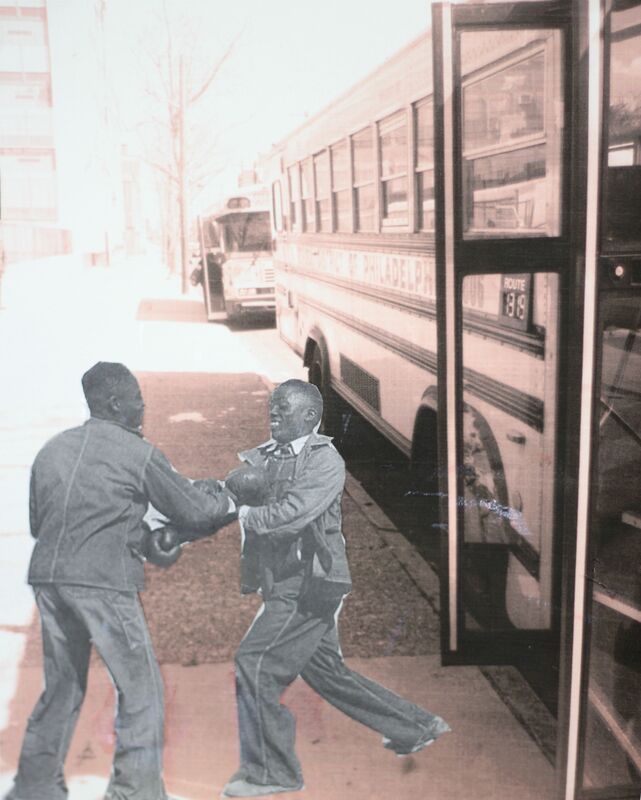 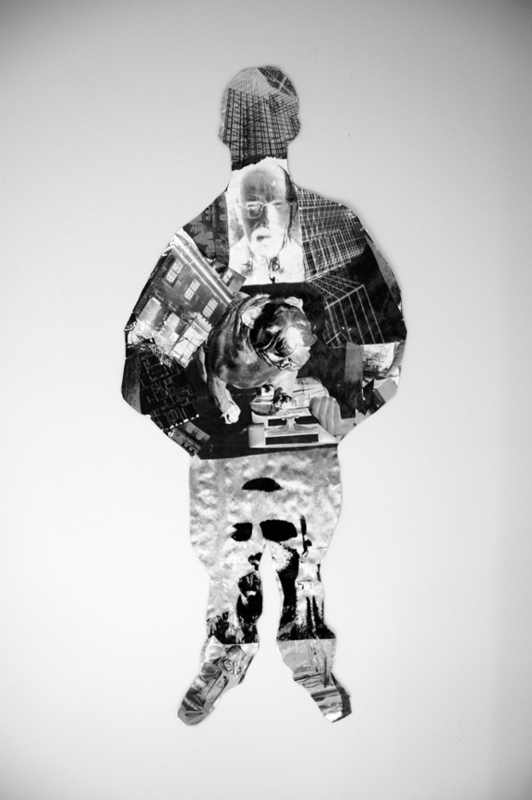 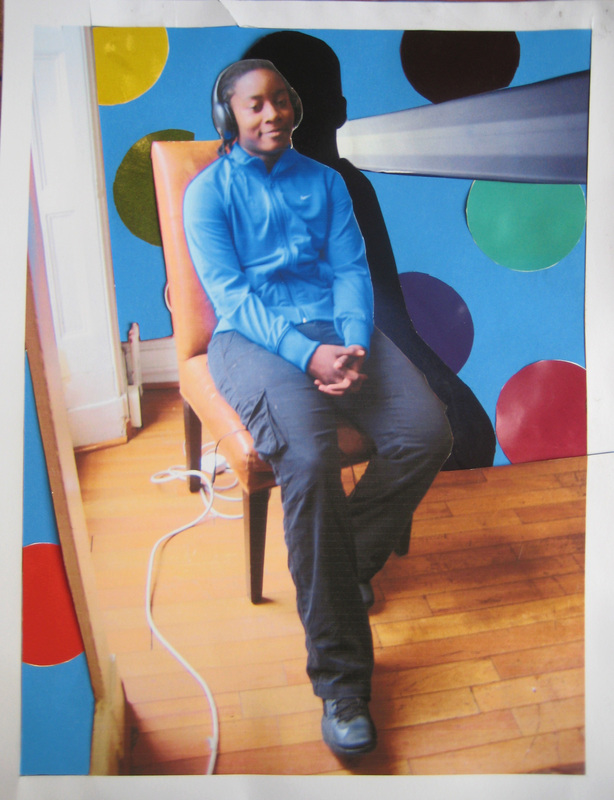 Students collaged and inserted images of themselves and their environment into the source photographs, using physical gesture, expression and other kinds of visual manipulation to change the meaning and mood of these photographs. 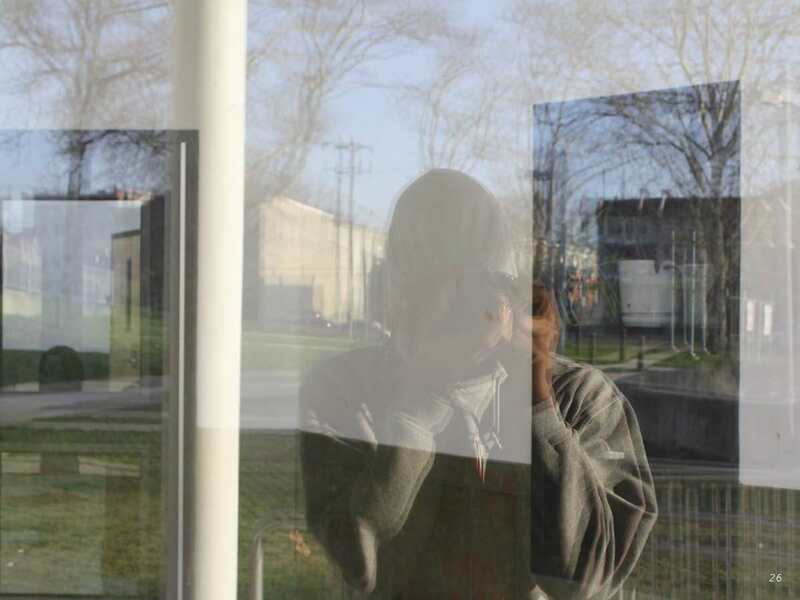 In this residency, students explored illusion and the limits of narrative within a two-dimensional image. 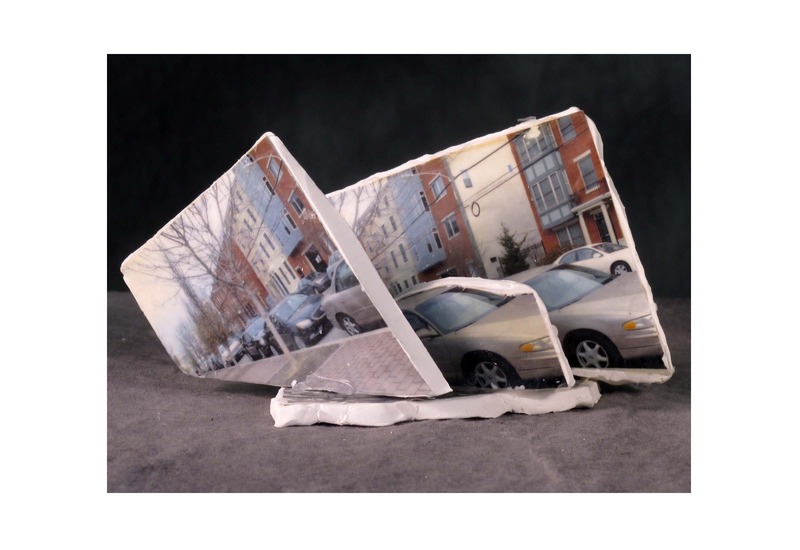 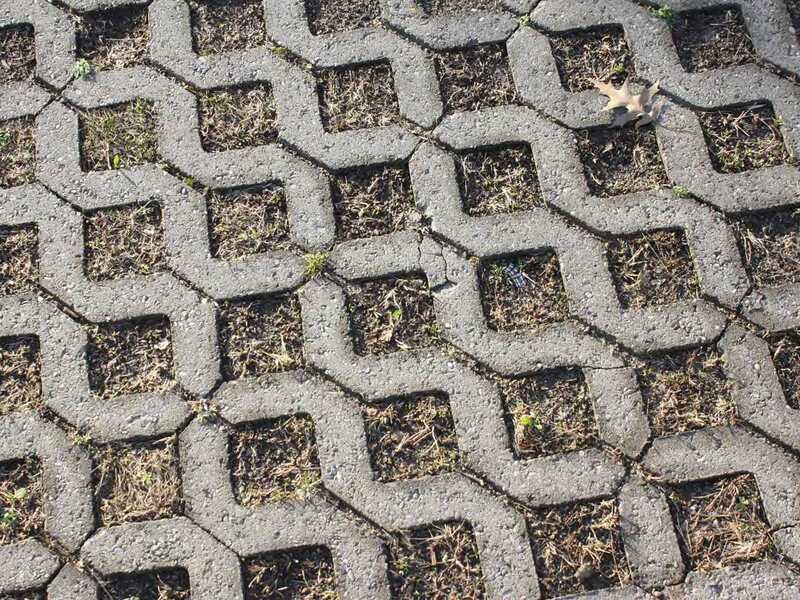 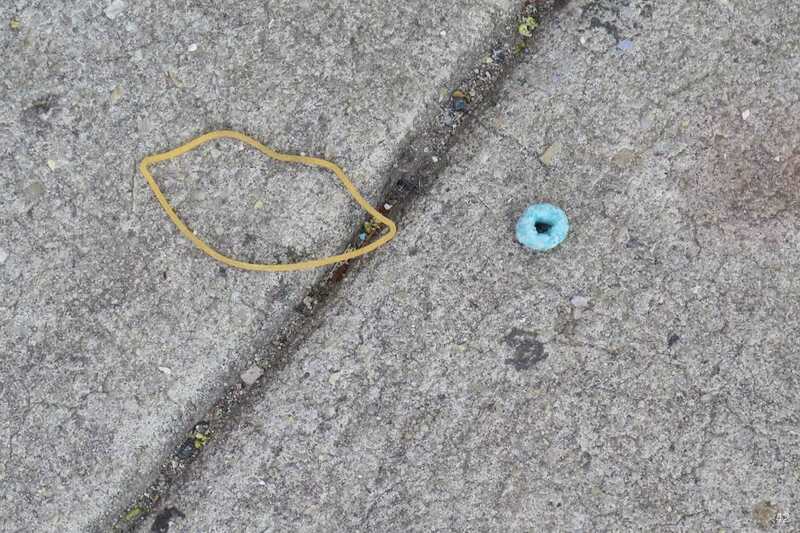 Playing with scale, placement and various kinds of visual trickery, they manipulated and brought puzzling new life to inanimate everyday objects. 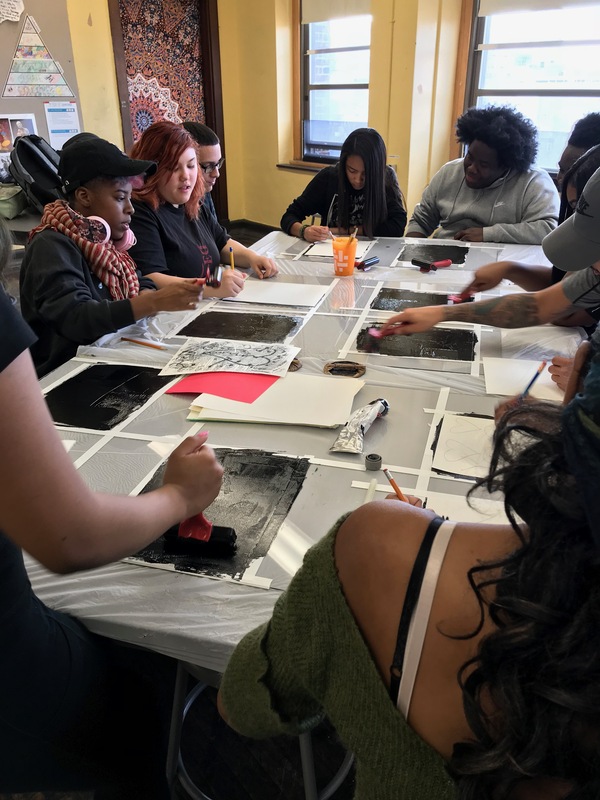 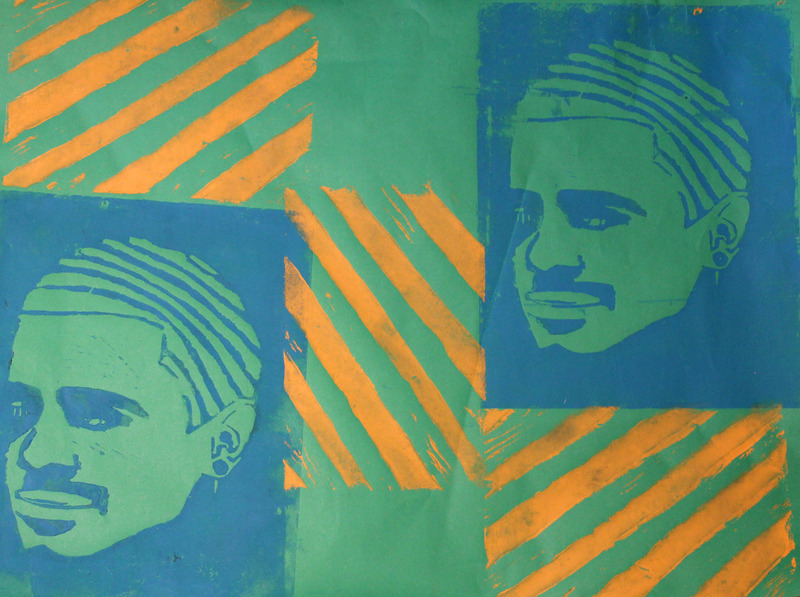 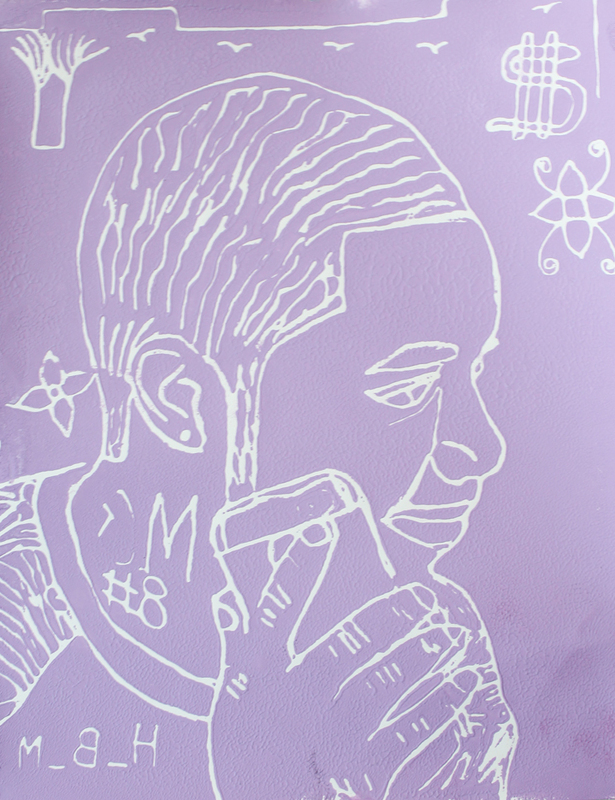 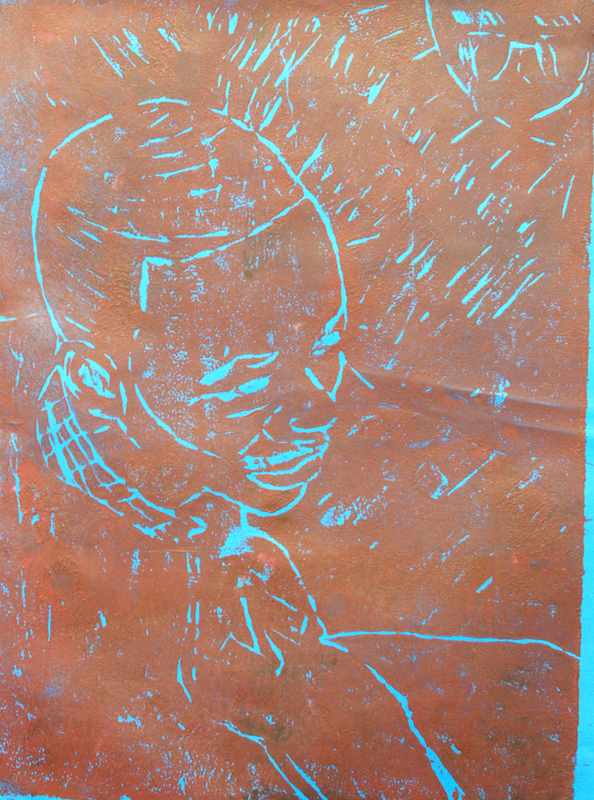 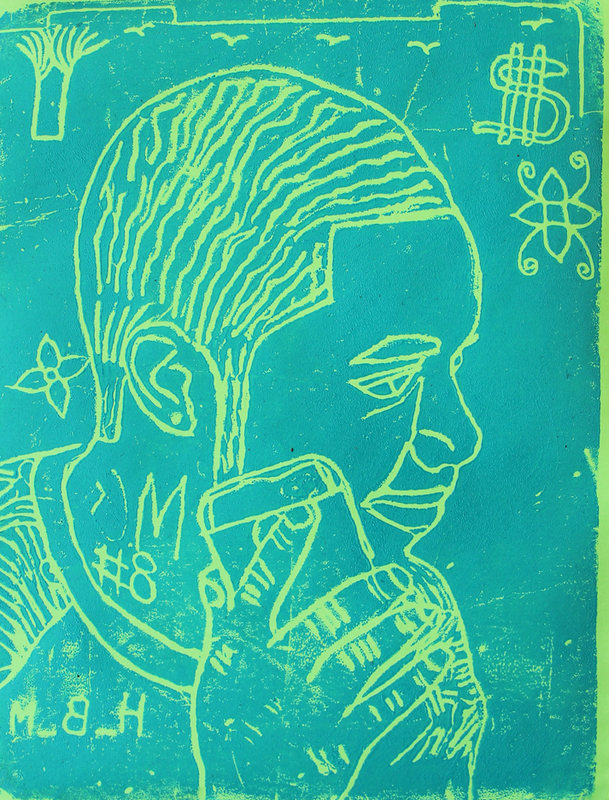 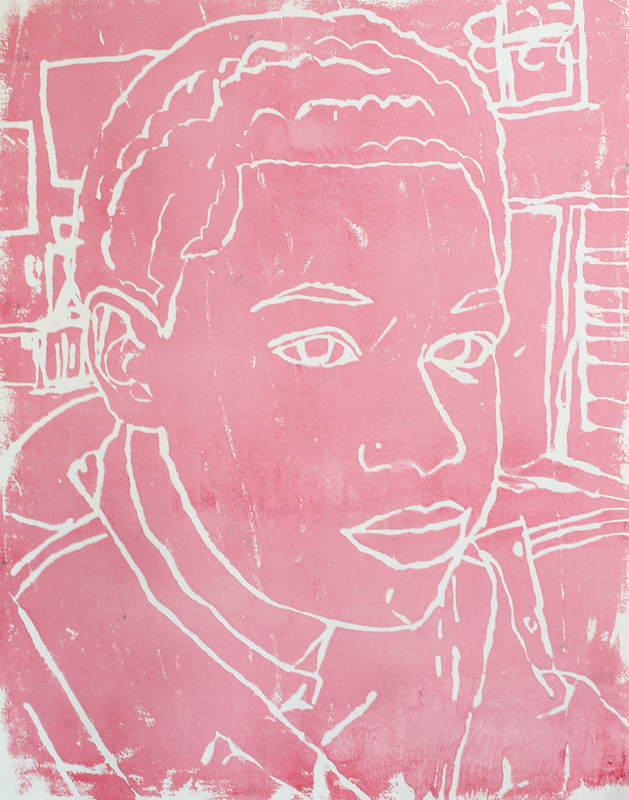 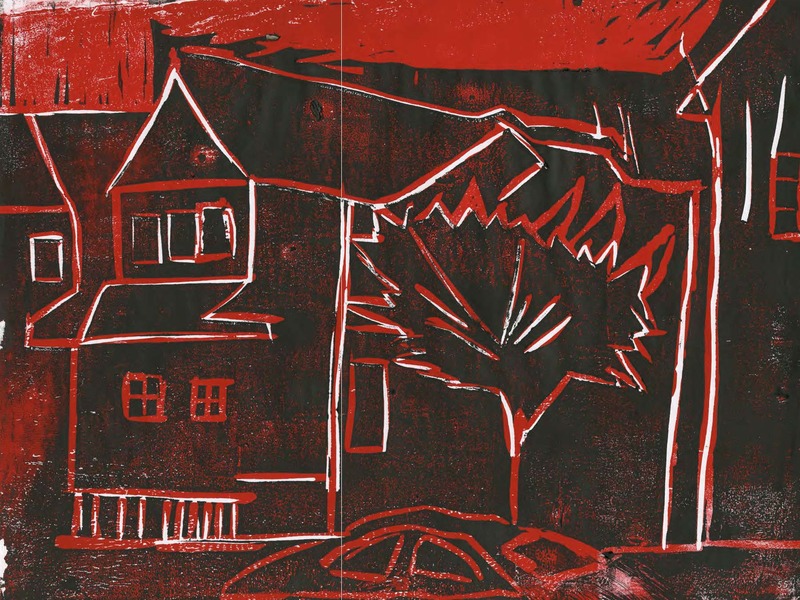 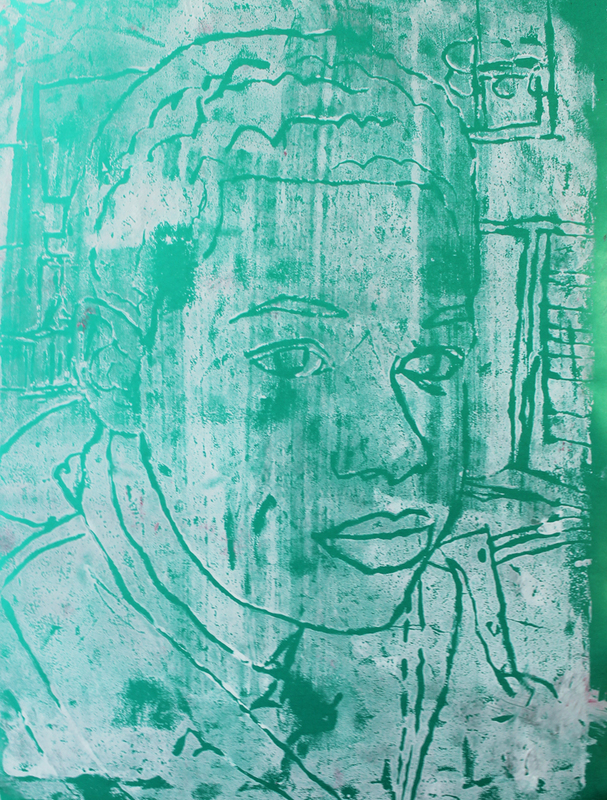 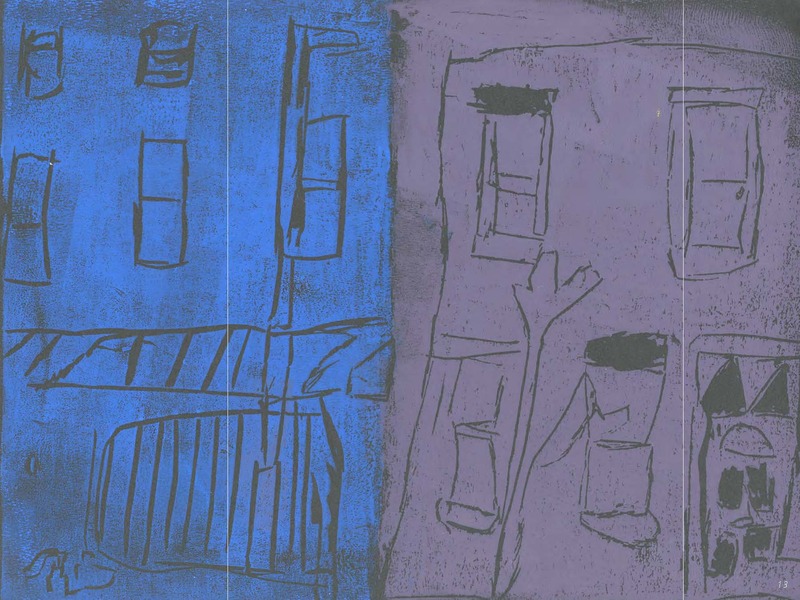 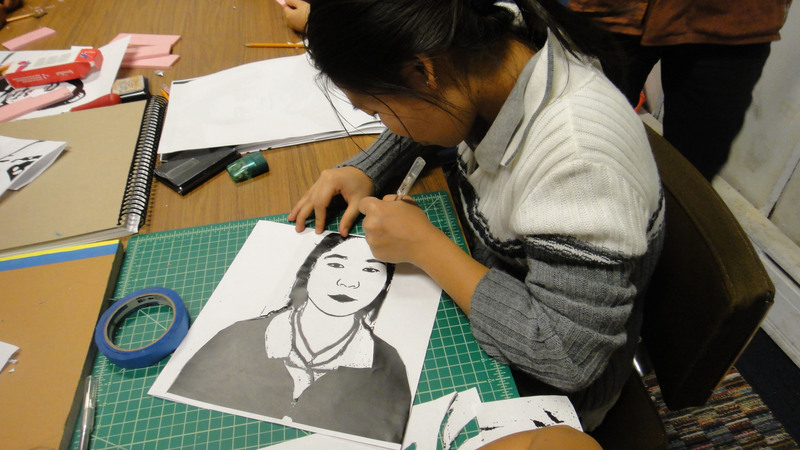 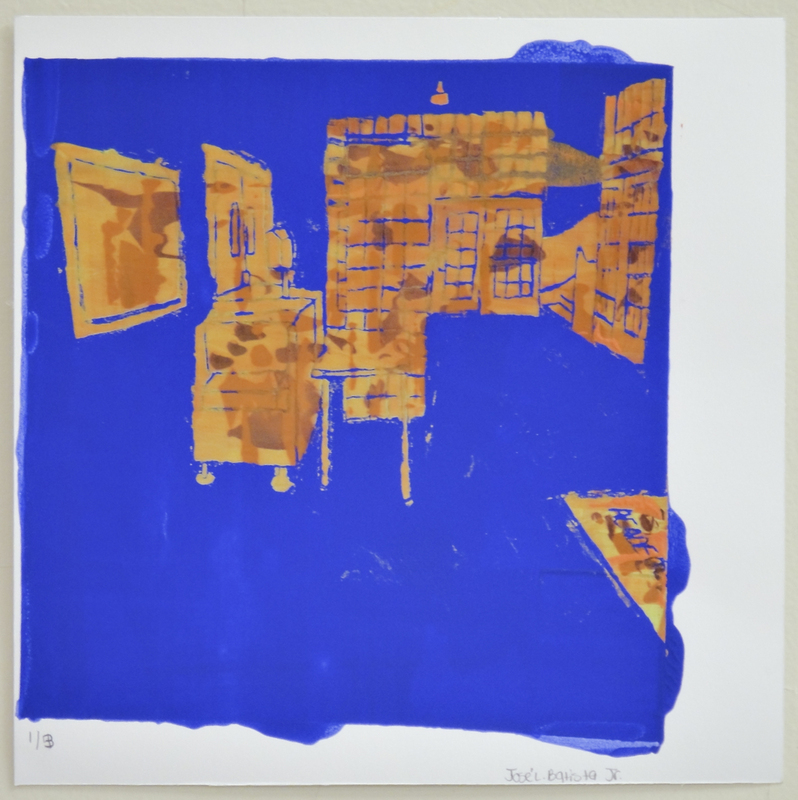 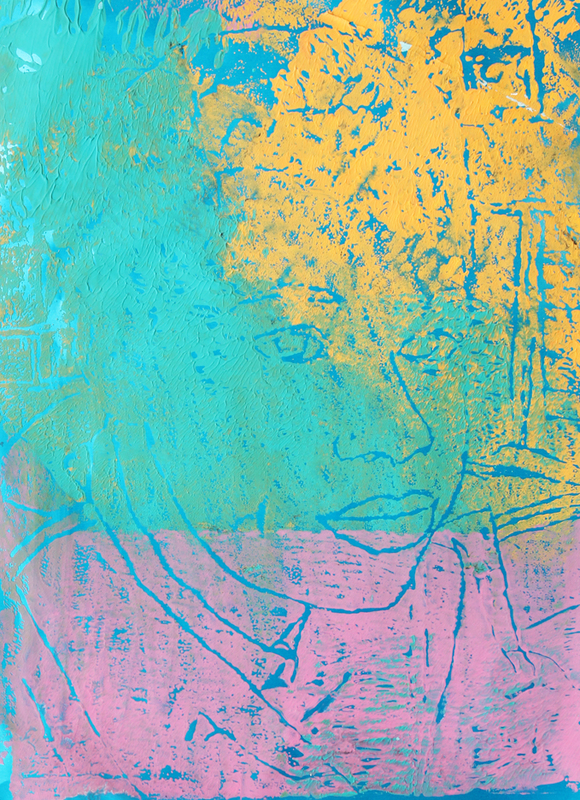 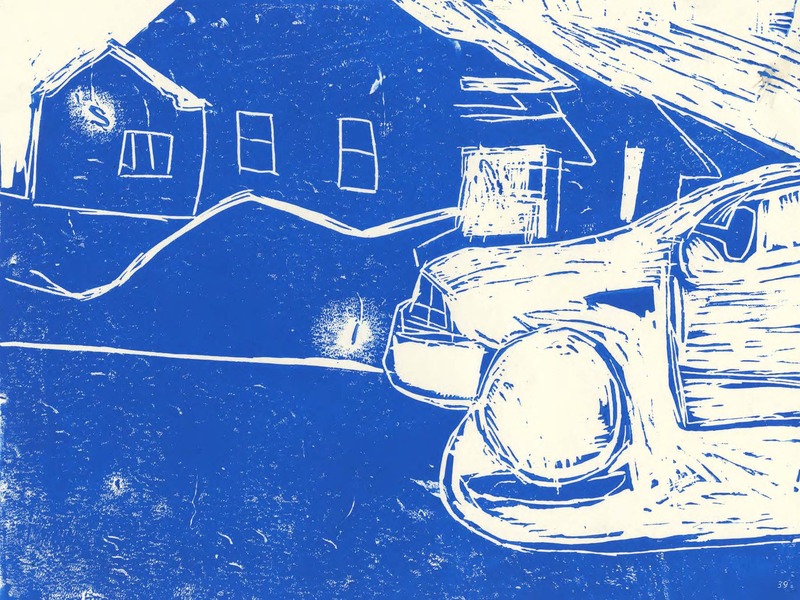 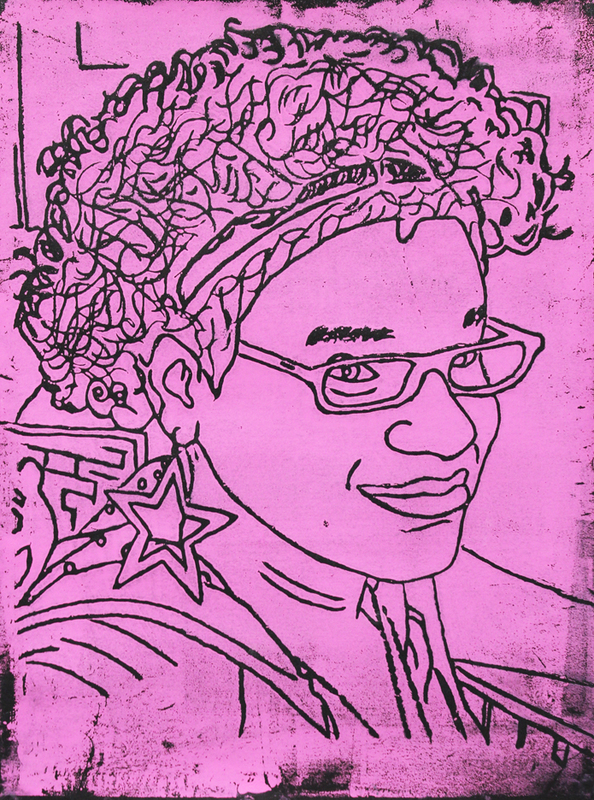 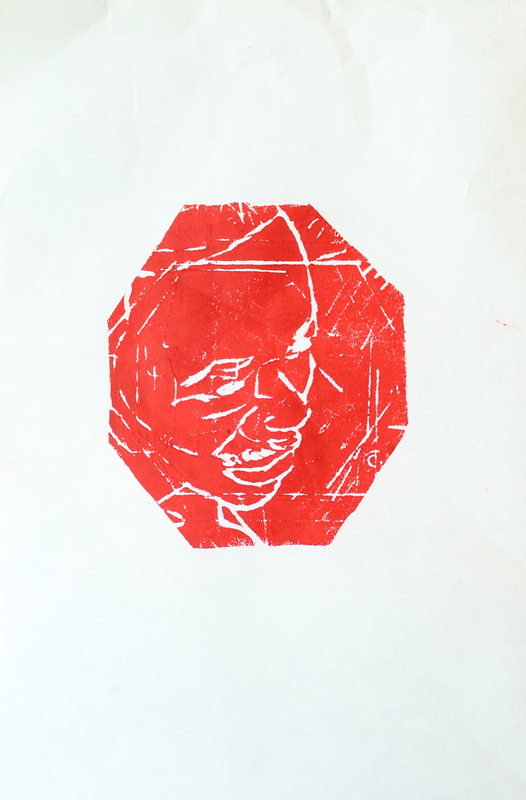 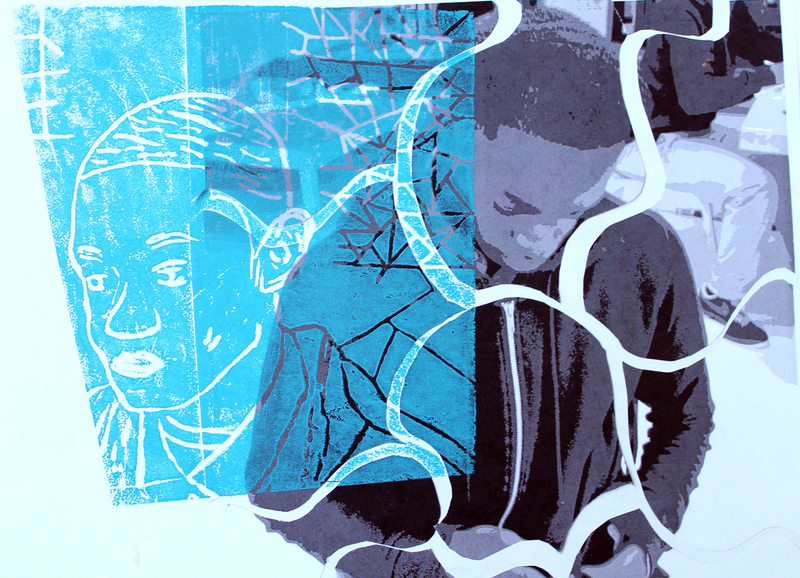 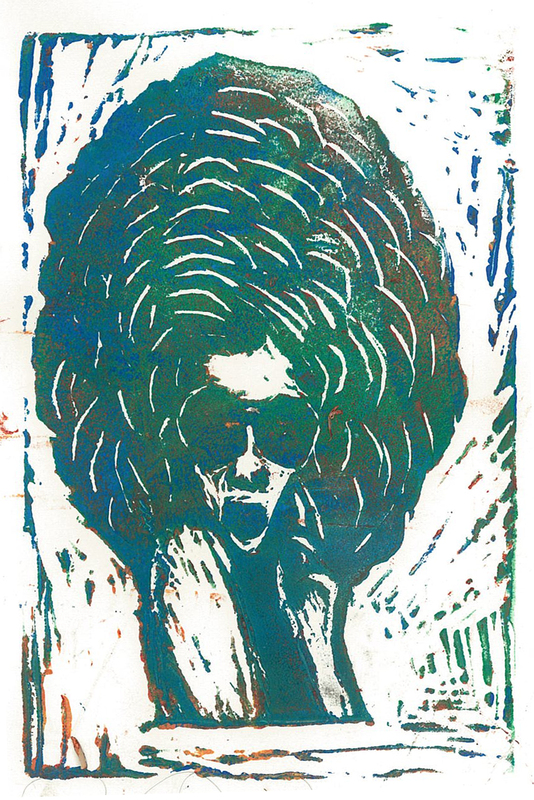 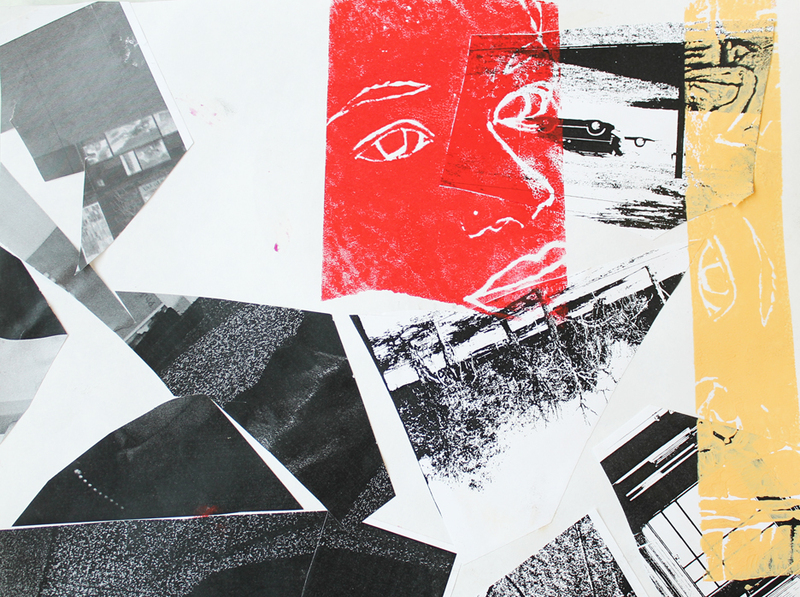 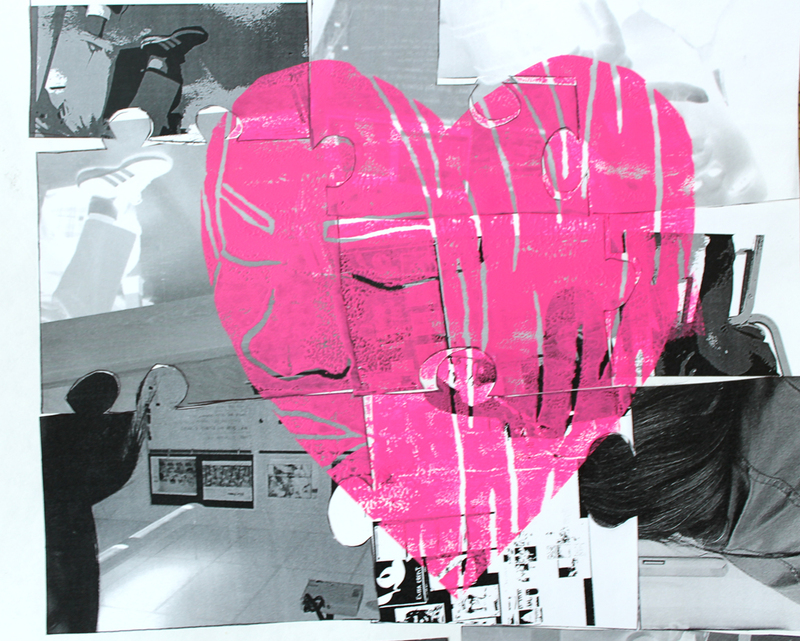 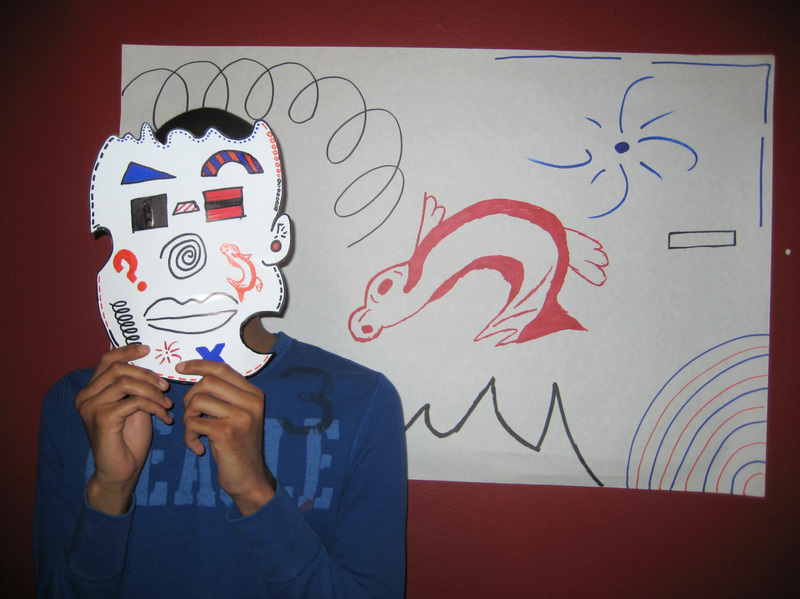 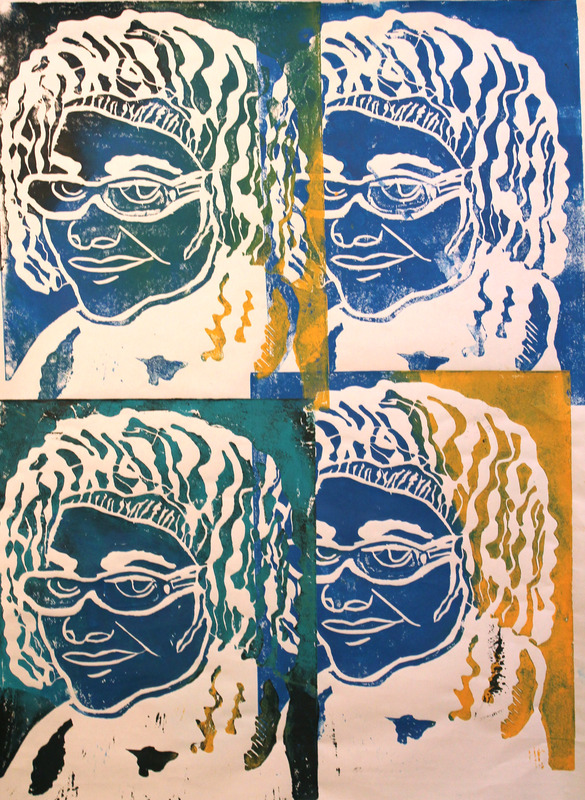 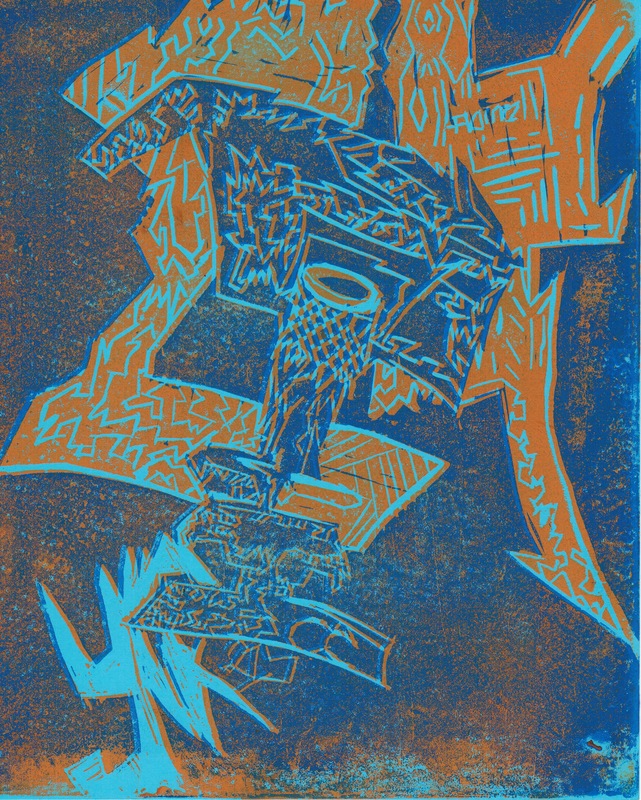 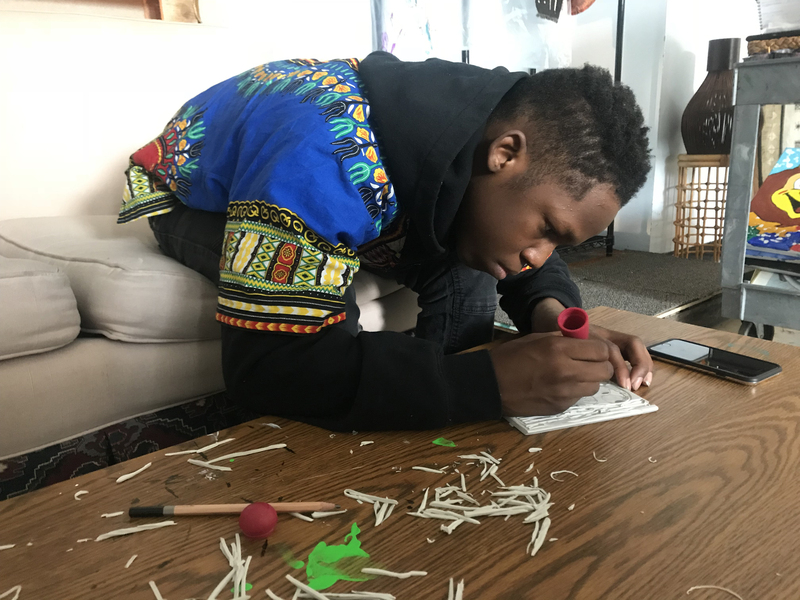 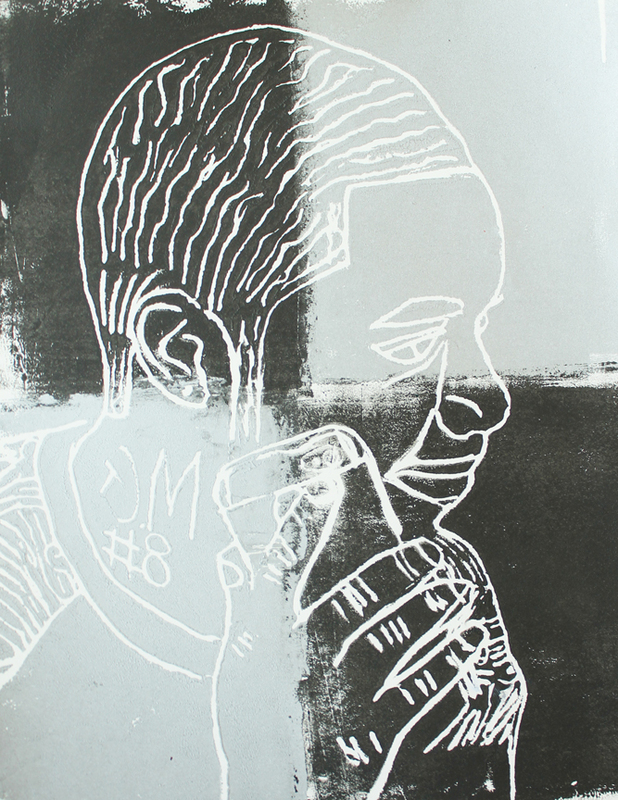 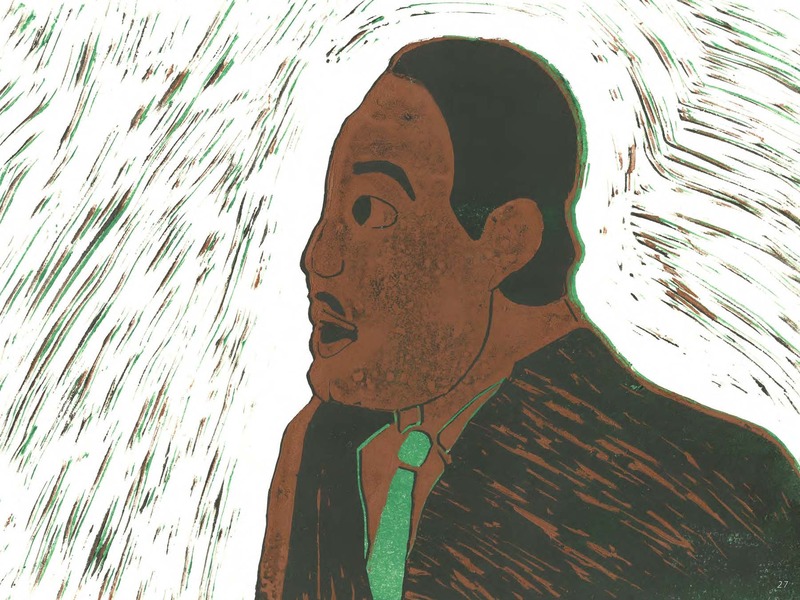 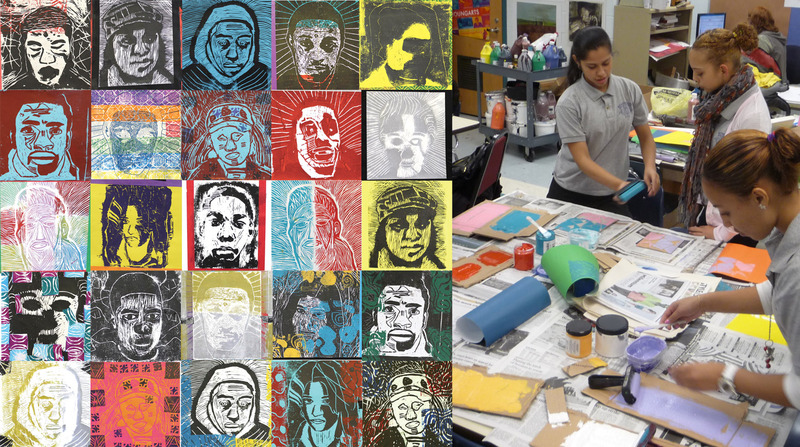 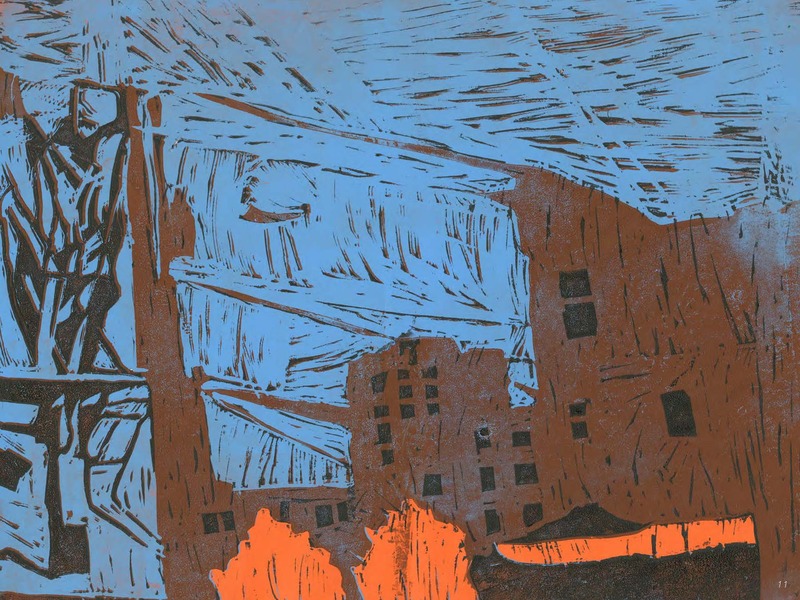 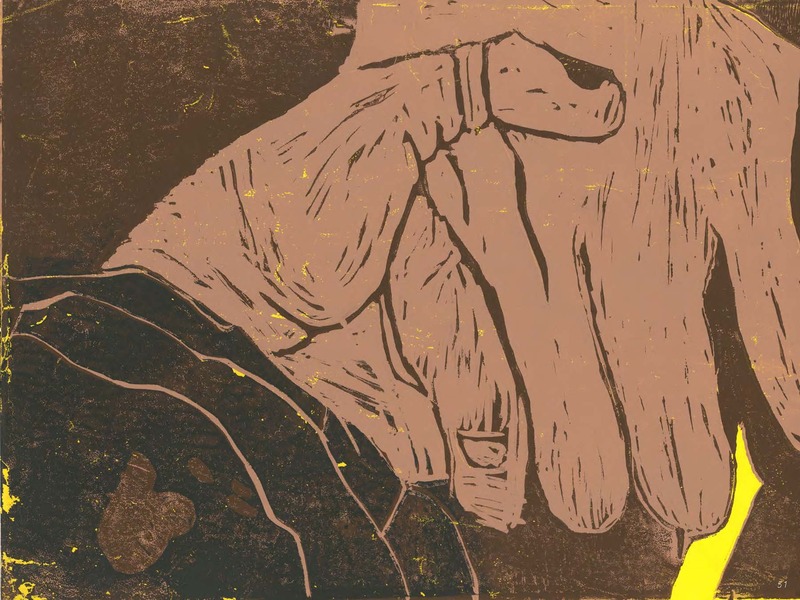 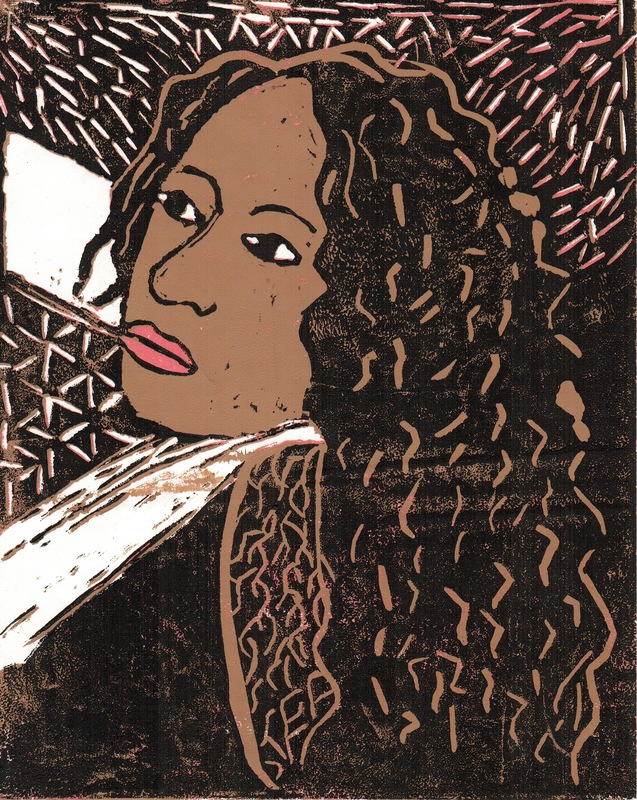 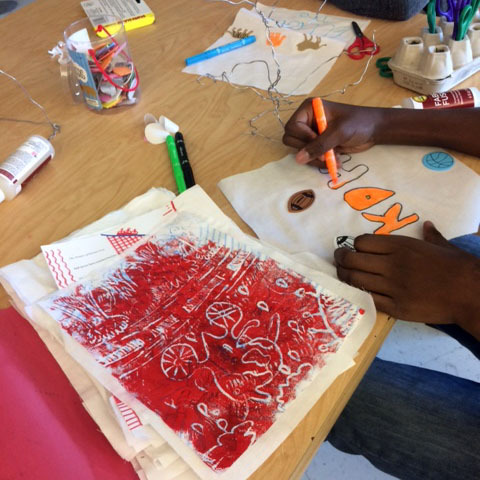 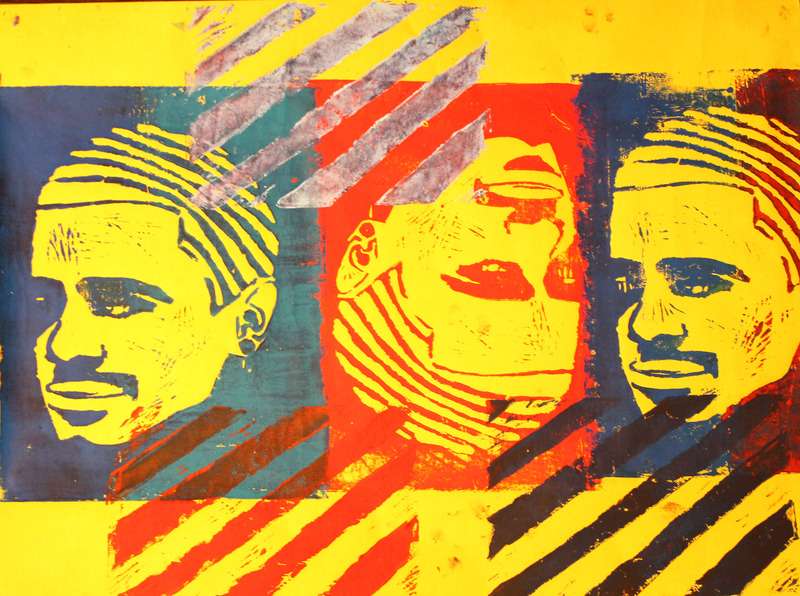 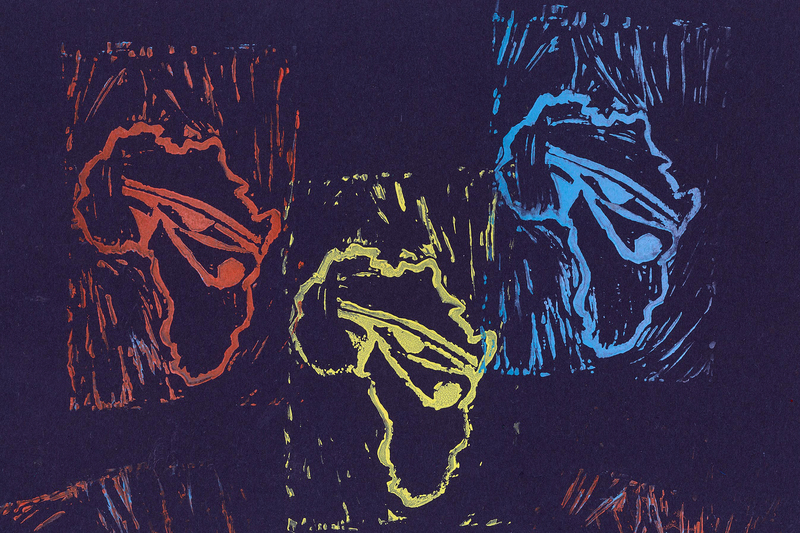 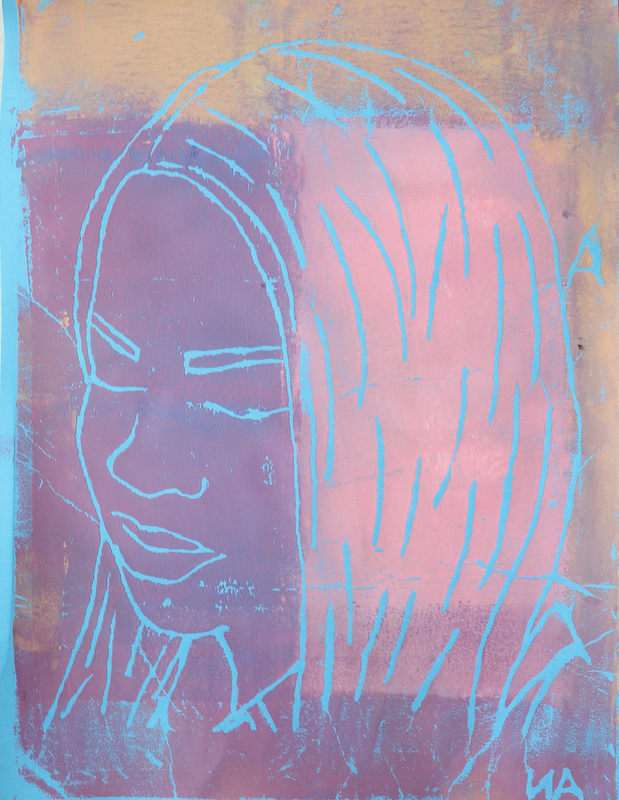 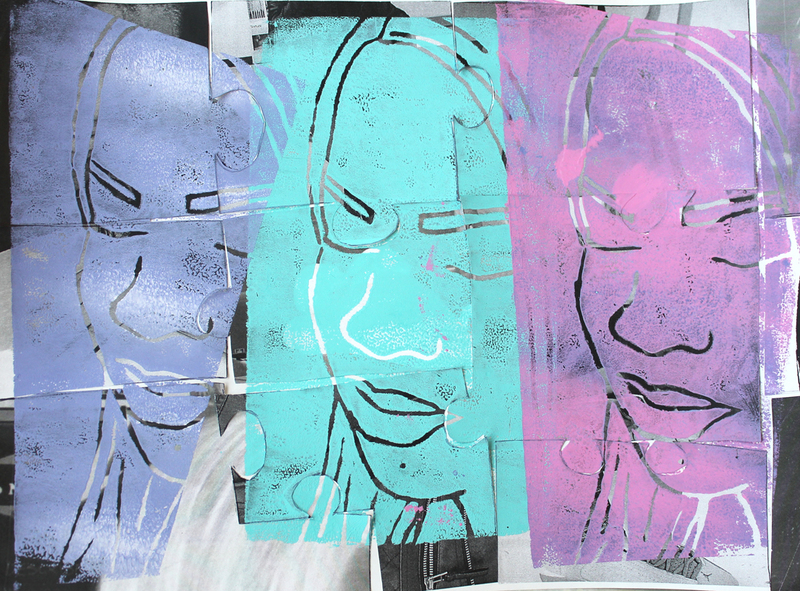 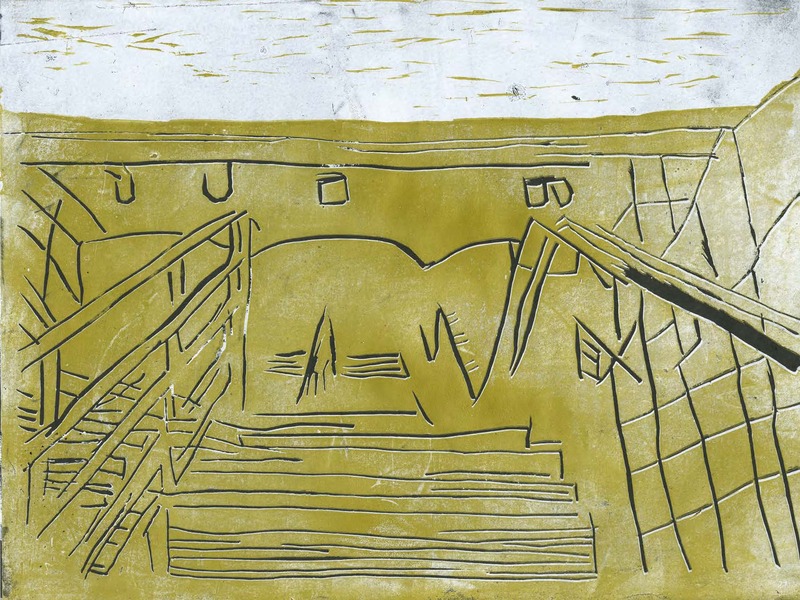 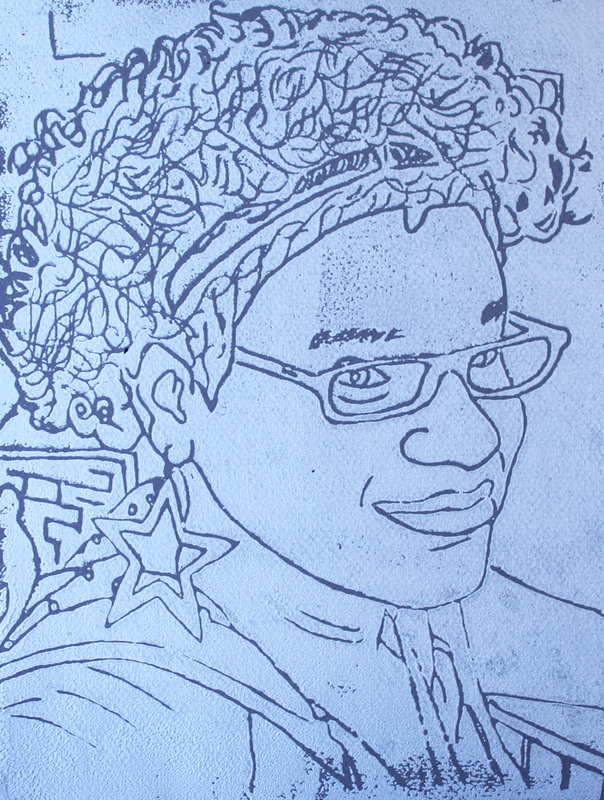 In this residency, students at The Attic Youth Center explored a variety of printmaking techniques to investigate their multiple and shifting identities. 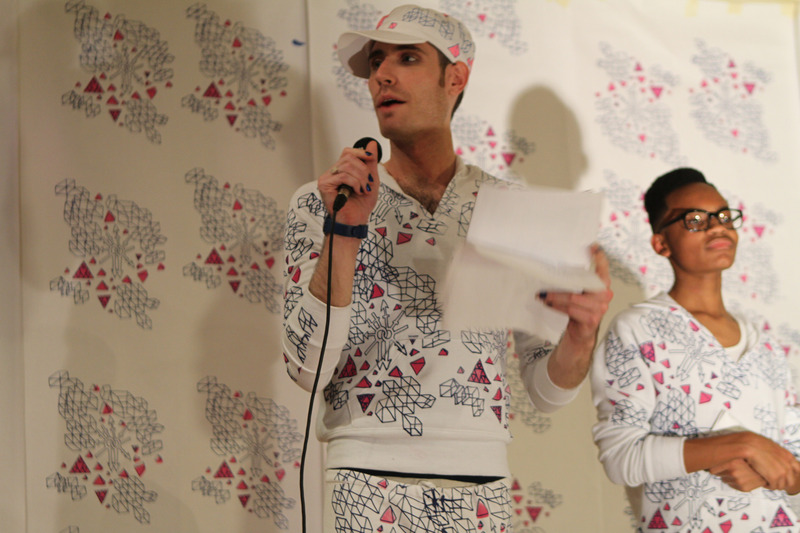 They used screenprinting, stamping, photocopying, linoleum printing and stenciling to create clothing, photographs and an installation (pictured here) that were used as a backdrop and in outfits for the annual drag show at The Attic. 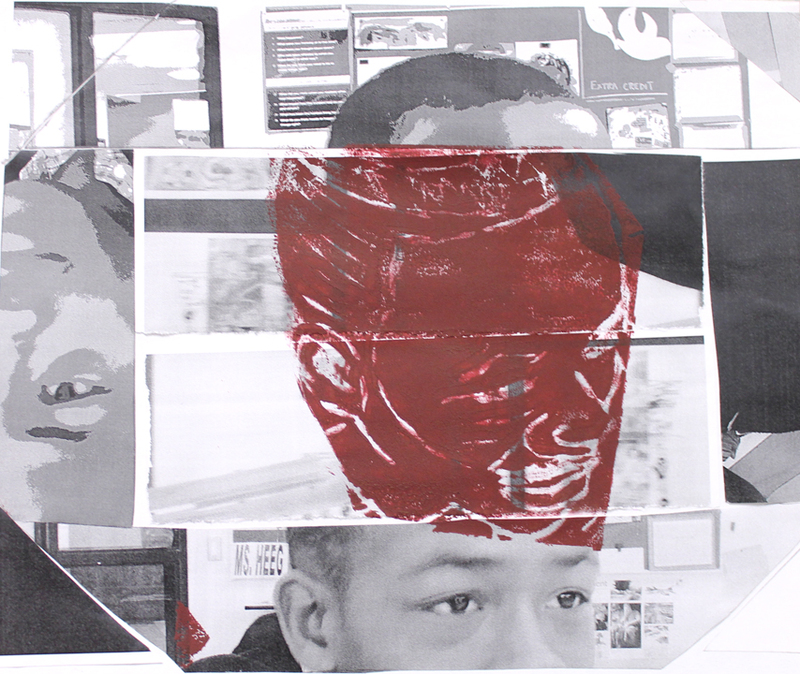 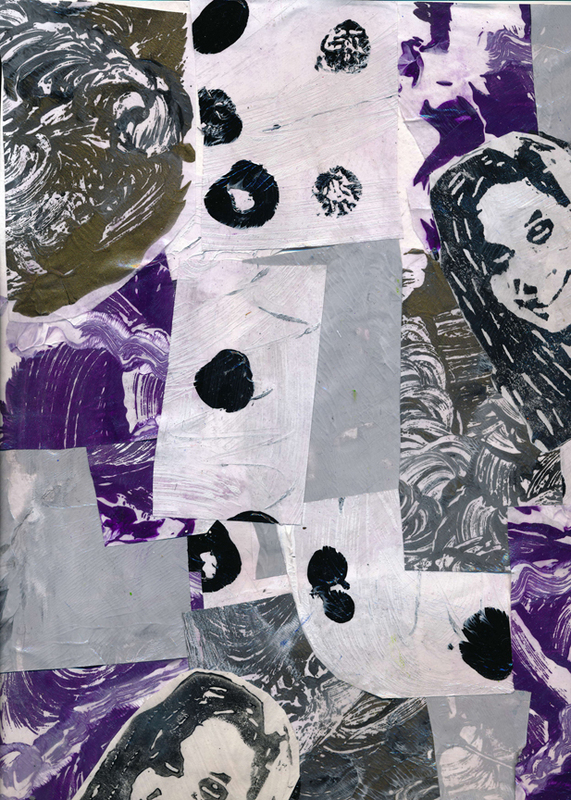 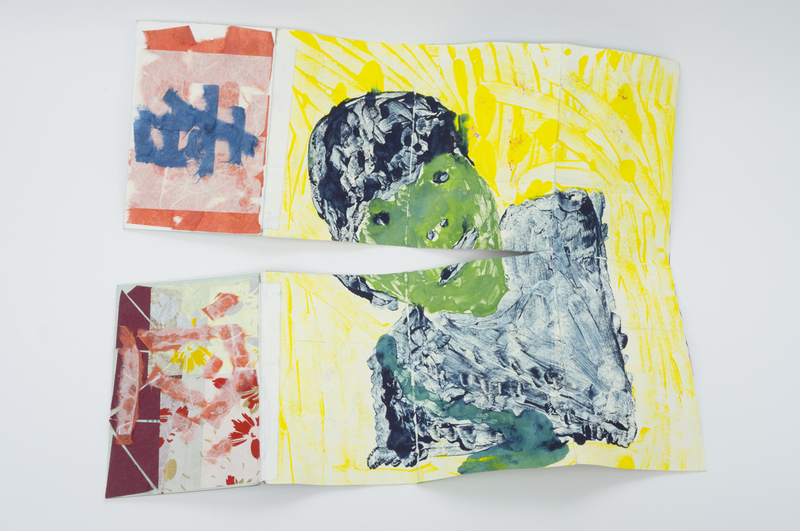 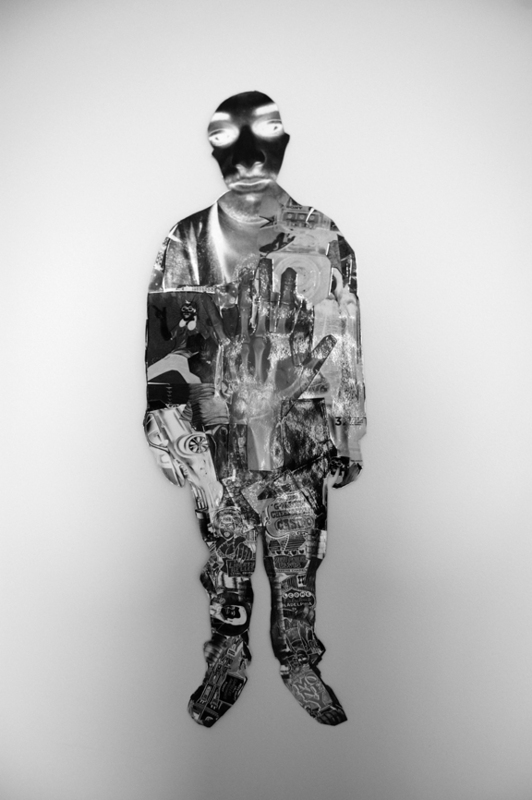 In this residency, students created layered self-portraits using printed patterns, exploring the ideas of camouflage and contrast. 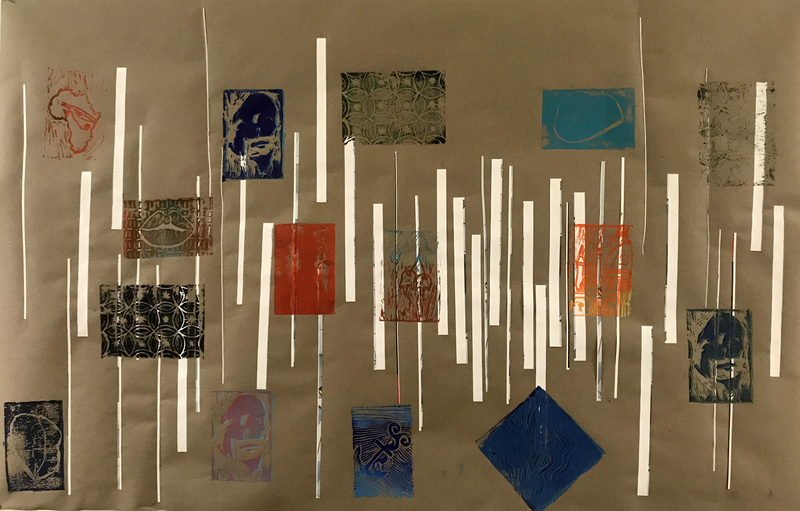 The project emphasized formal experimentation with pattern and color, and involved building up a multiplicity of layers through repetition and overlap. 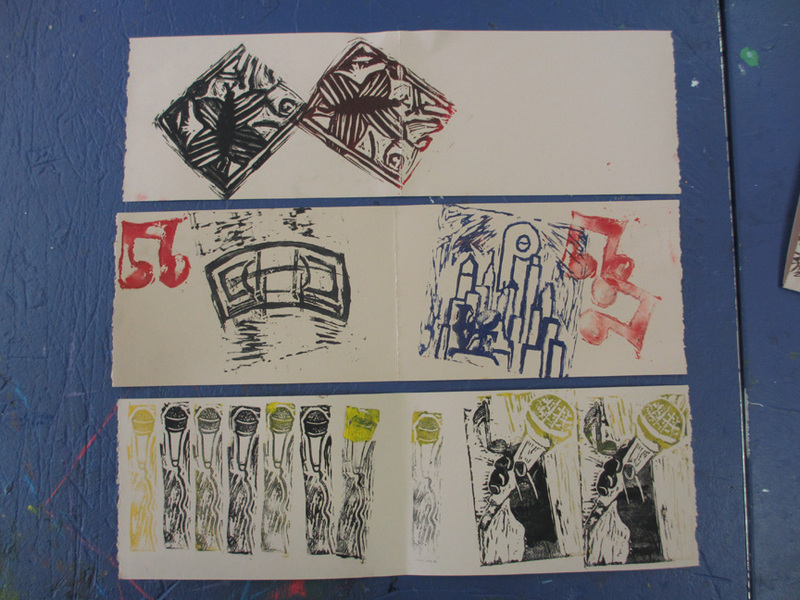 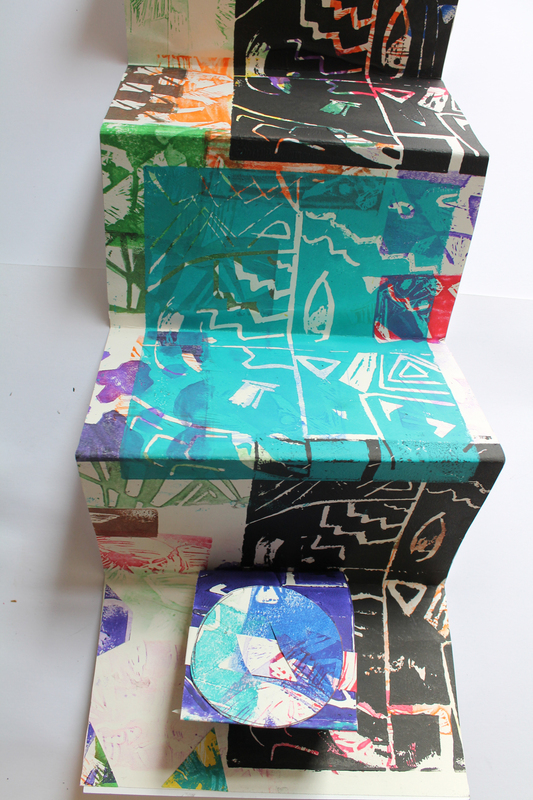 Students completed individual pieces, as well as a collaborative print on a large paper scroll. 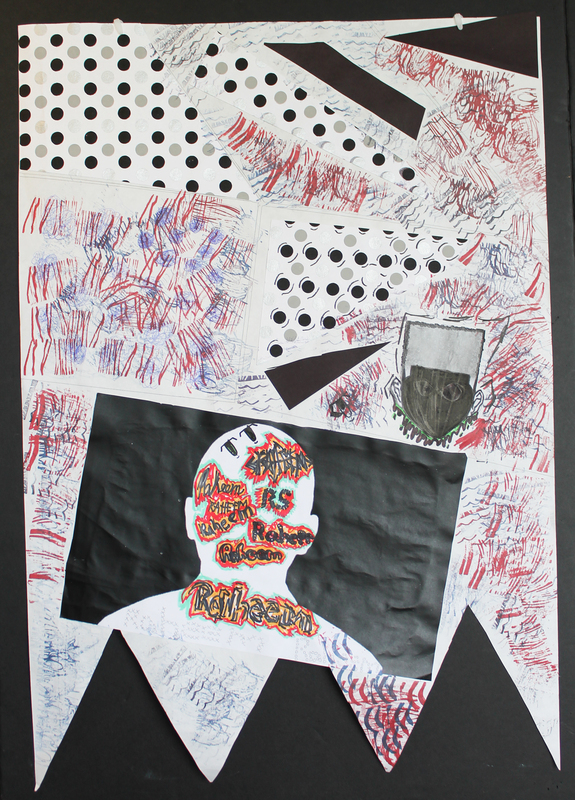 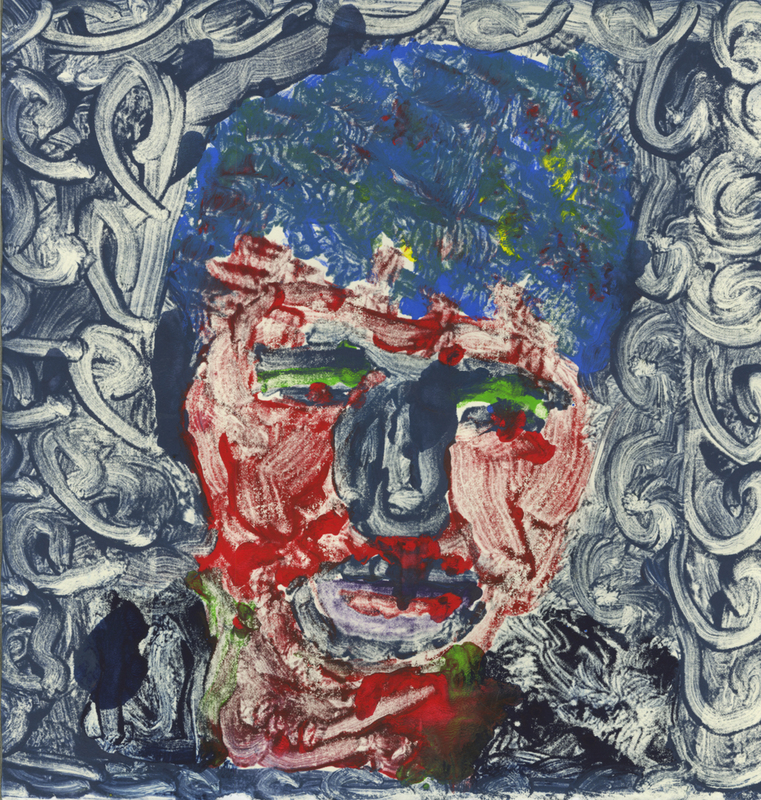 Students created self-portraits using pattern, text and camouflage, simultaneously hiding and creating images within patterns created by a repeated word. 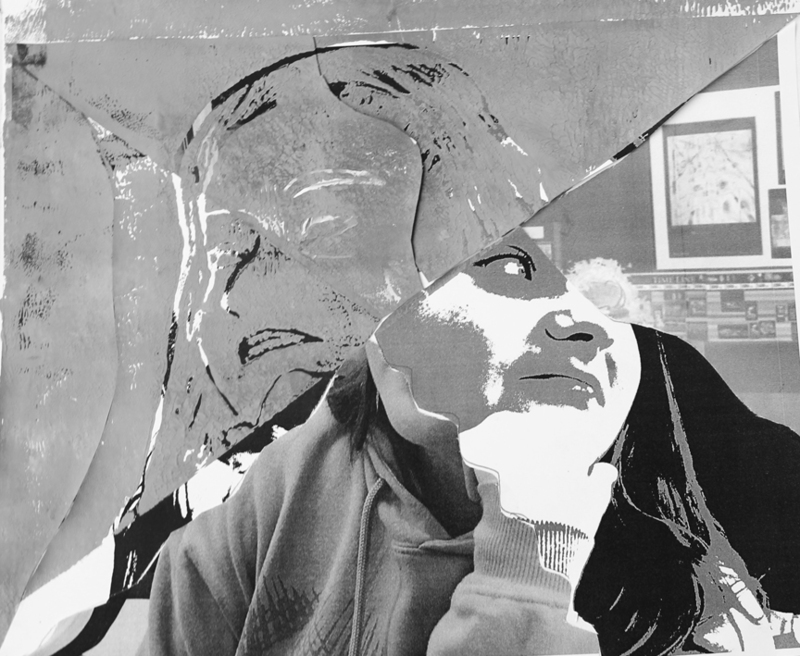 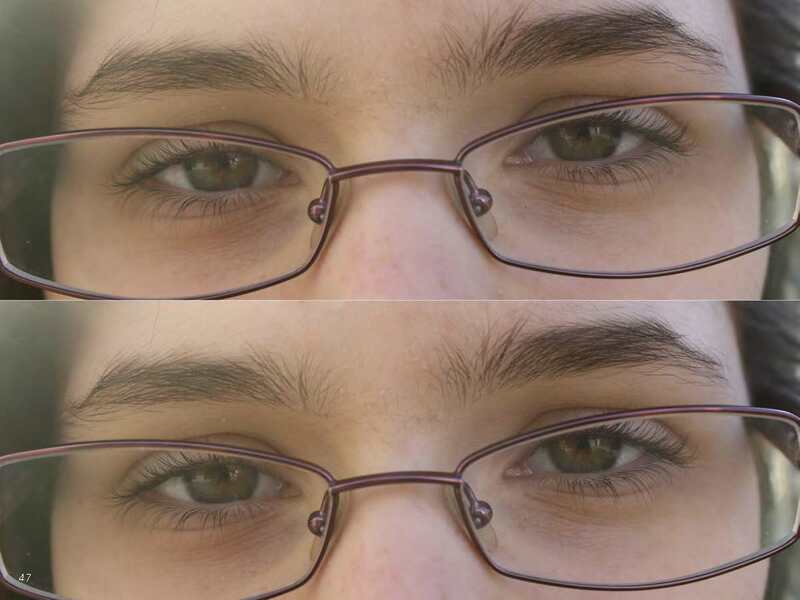 In juxtaposing image and text closely, students played with the meaning of both facial expressions and the chosen text. 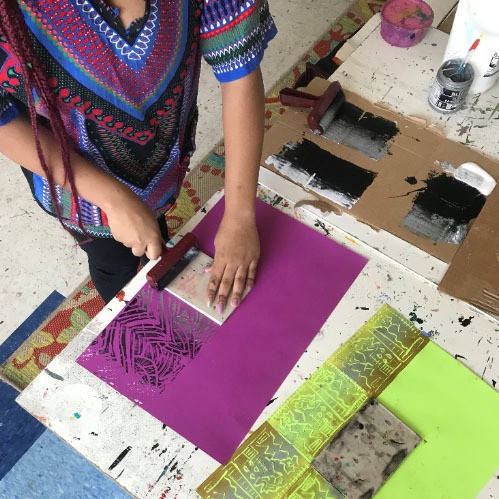 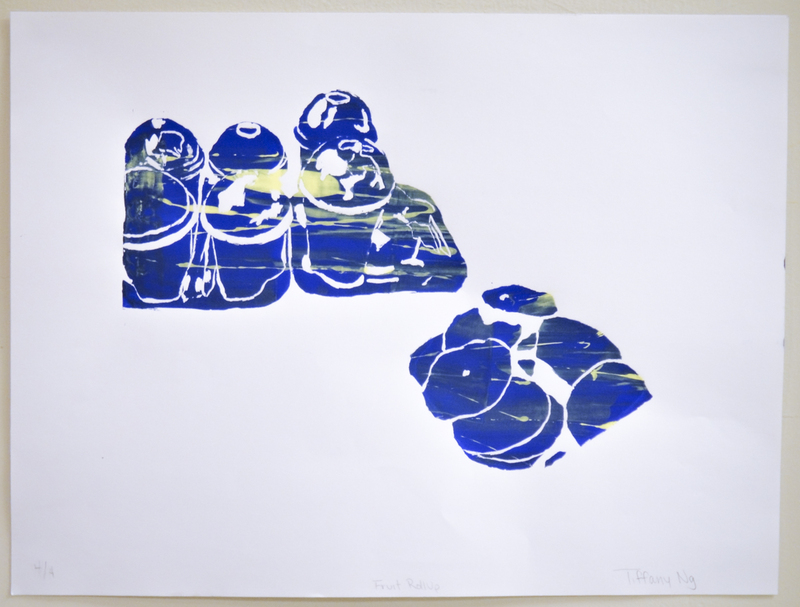 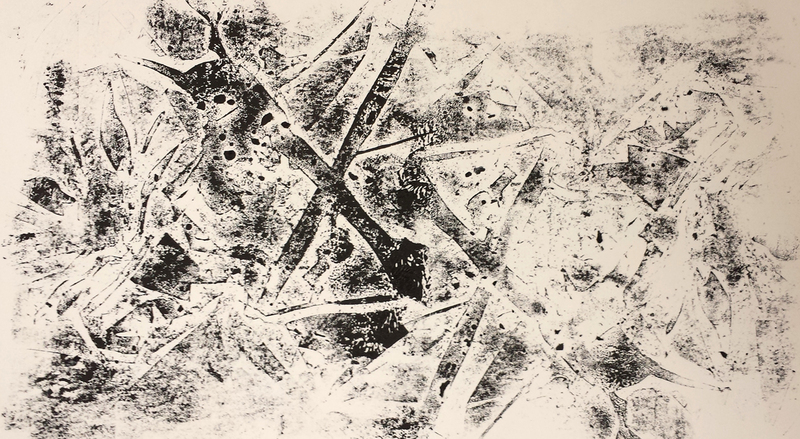 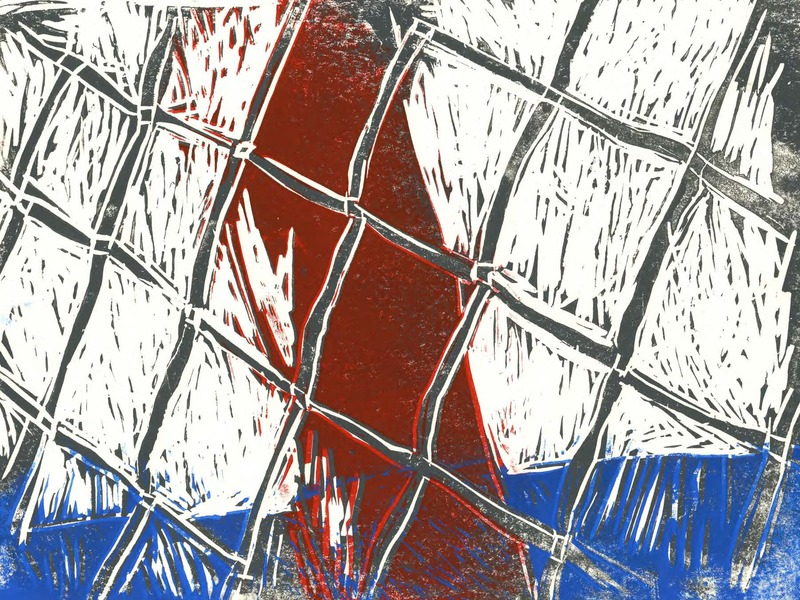 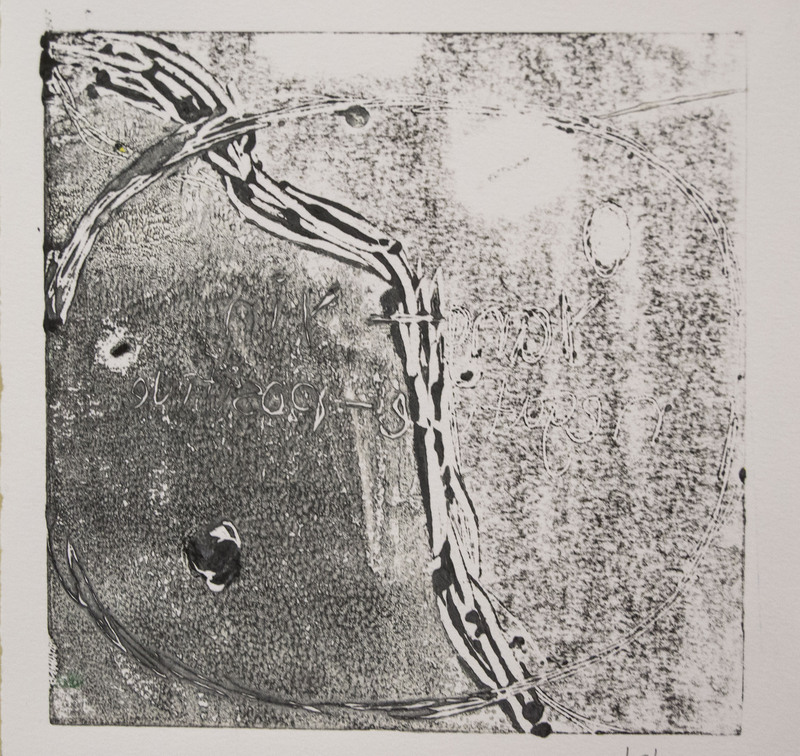 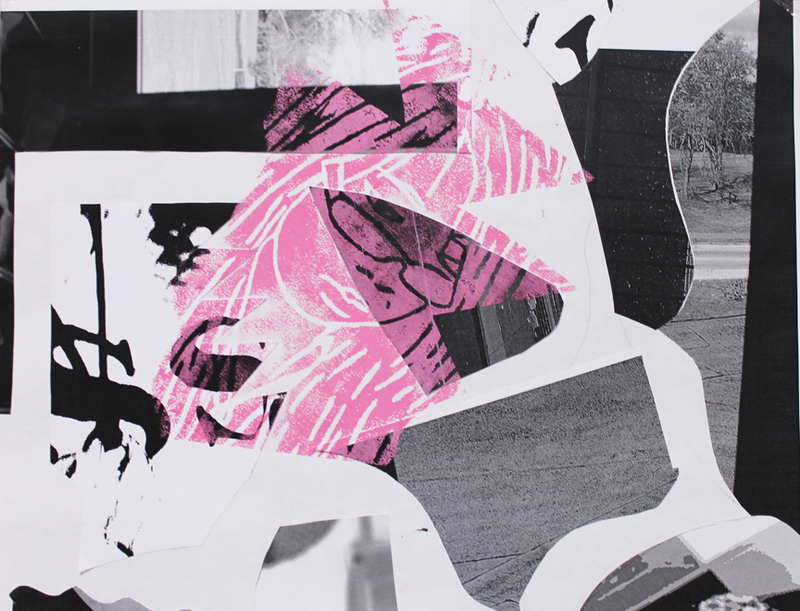 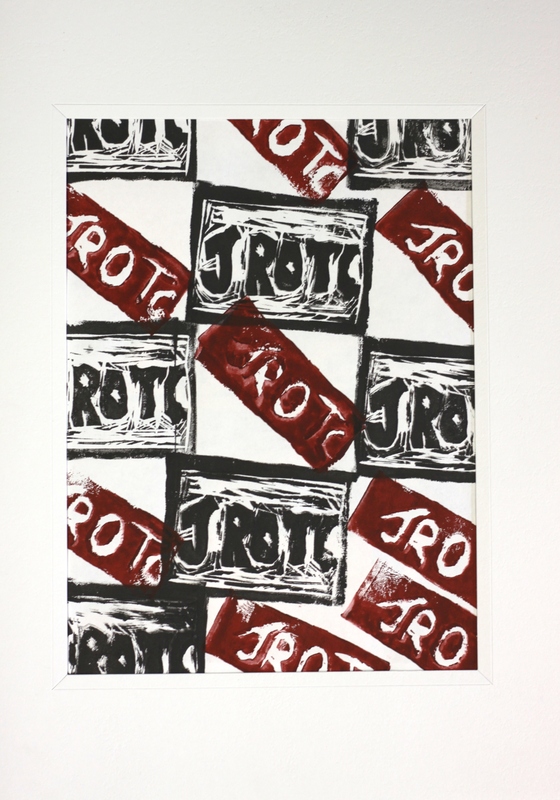 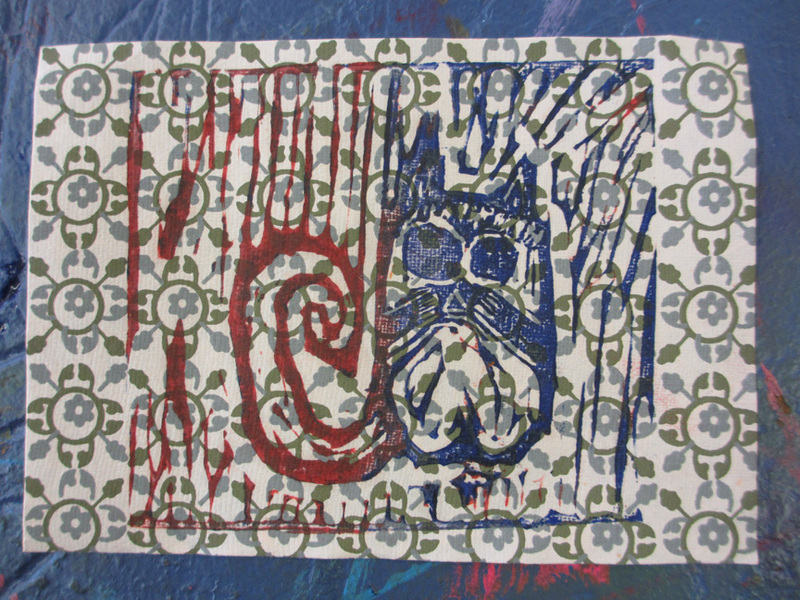 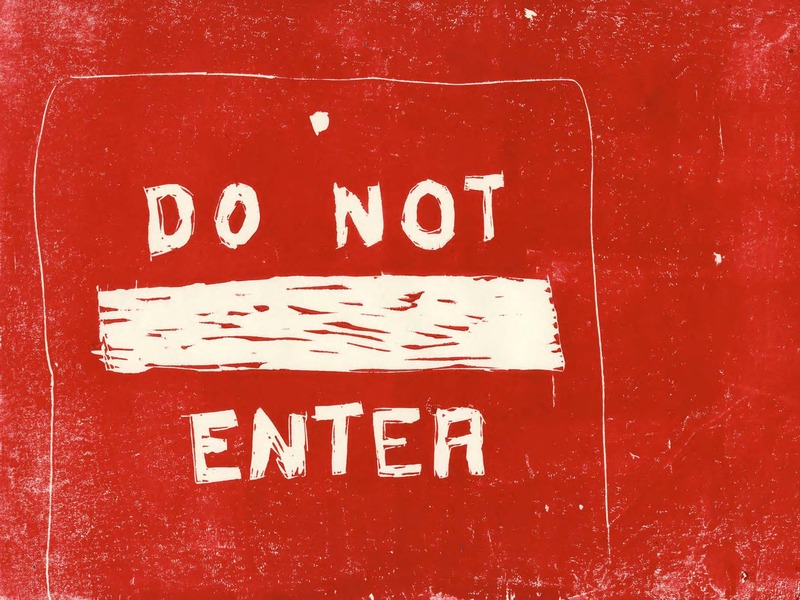 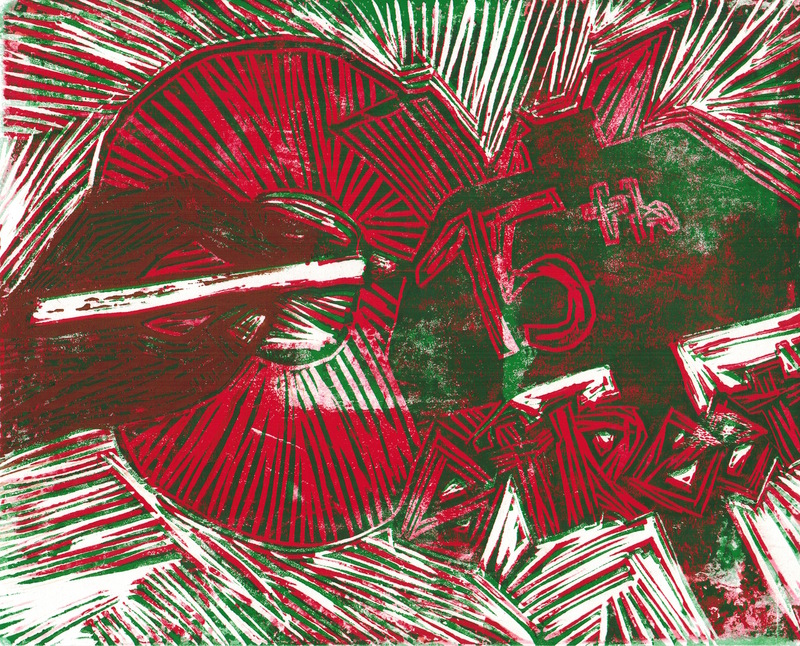 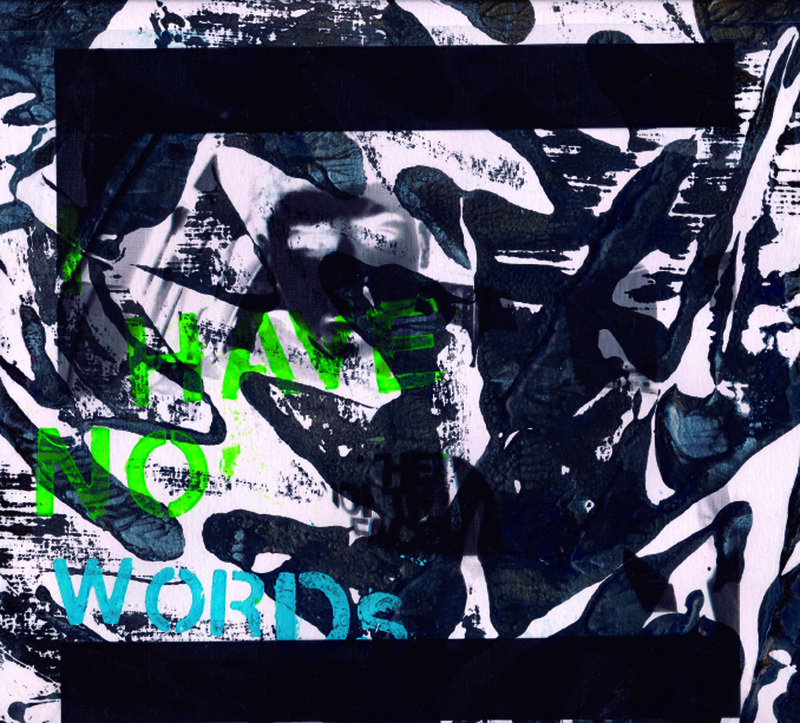 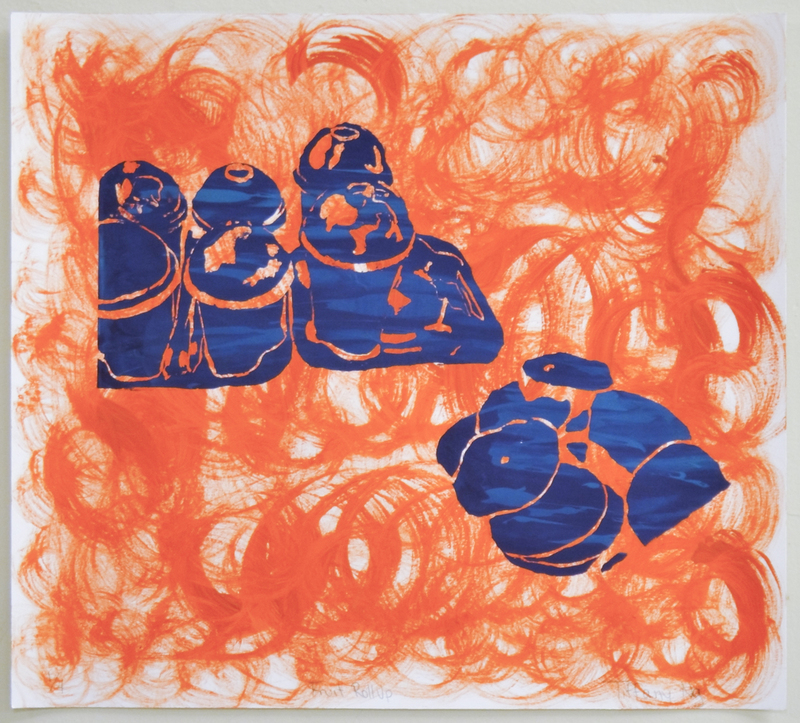 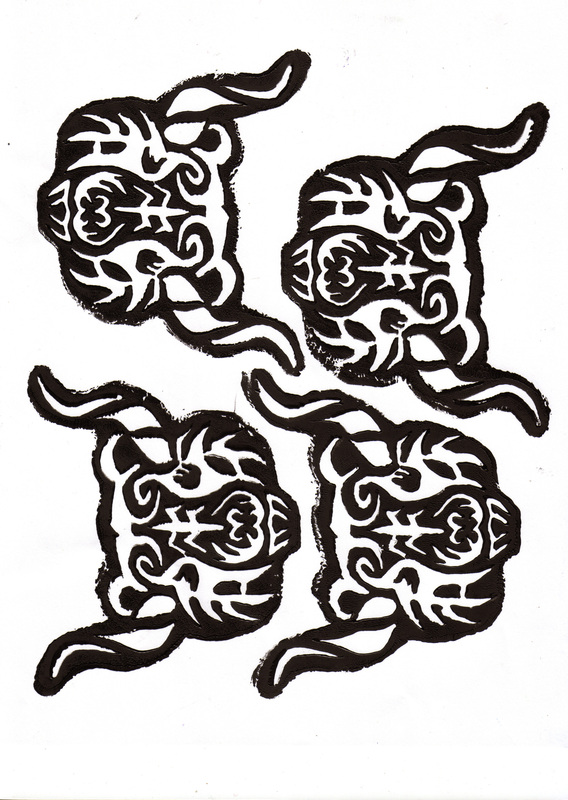 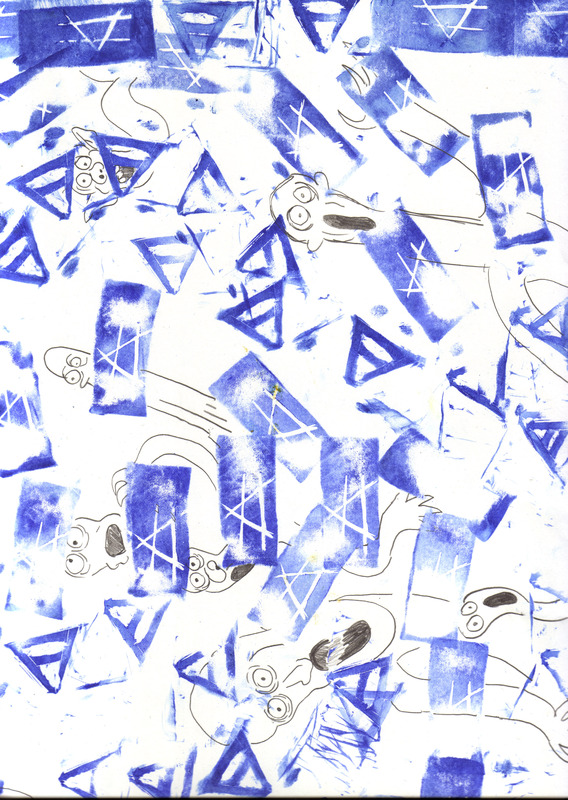 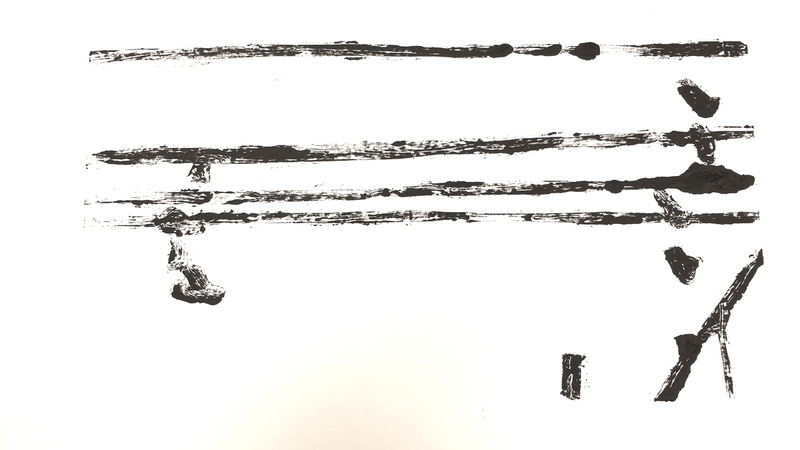 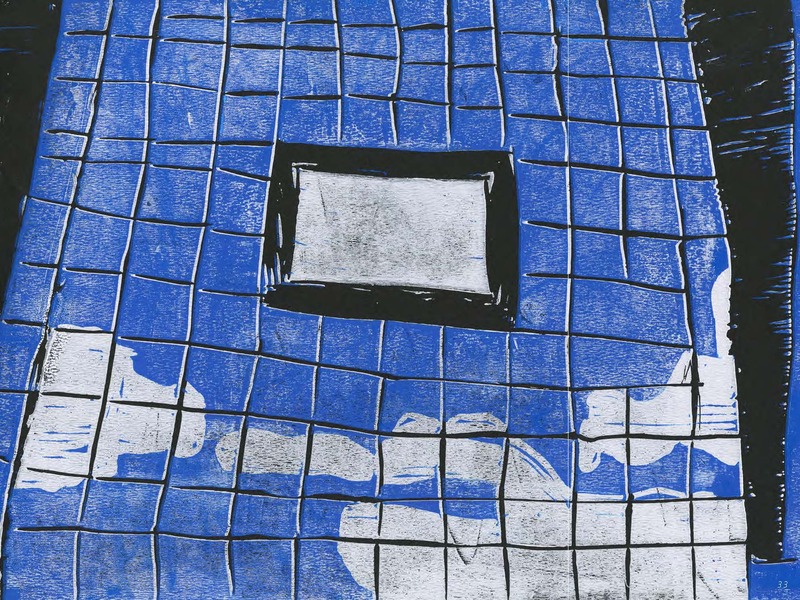 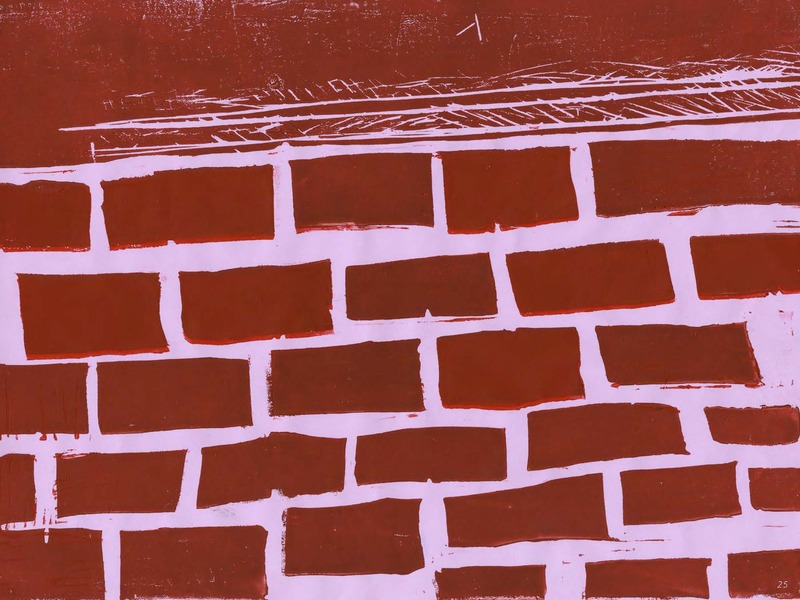 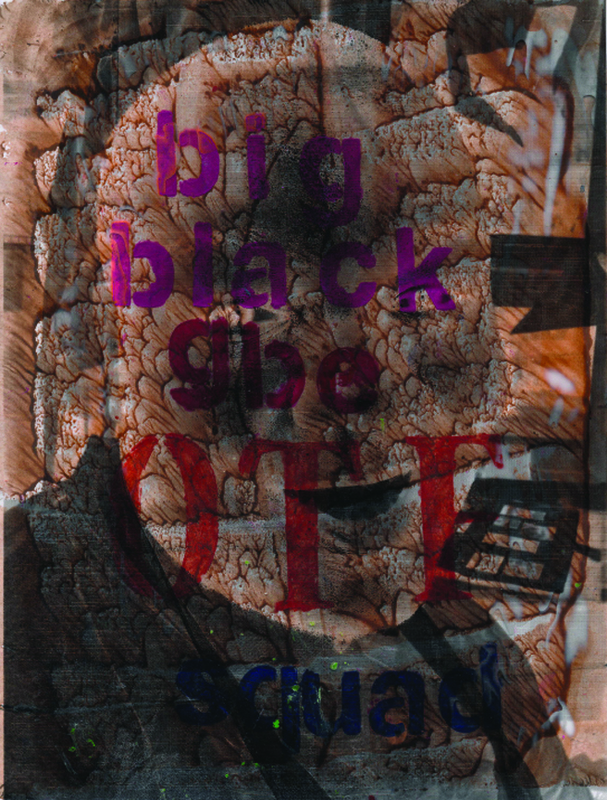 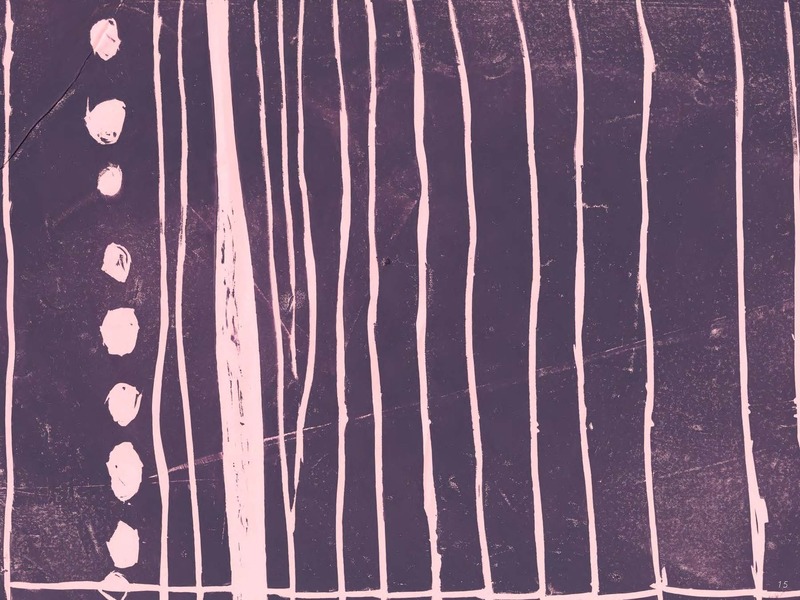 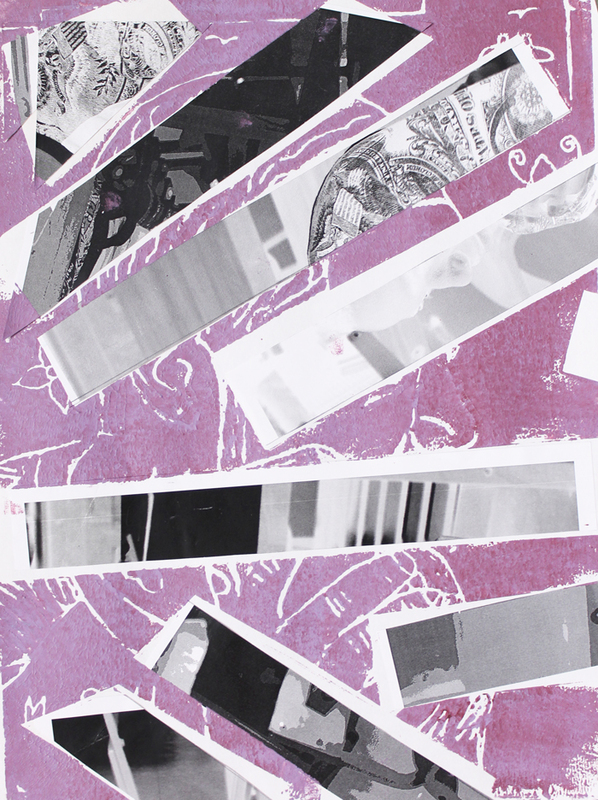 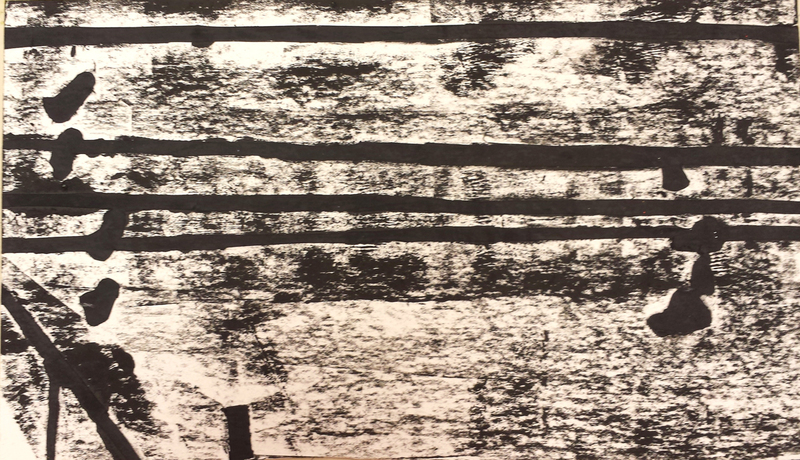 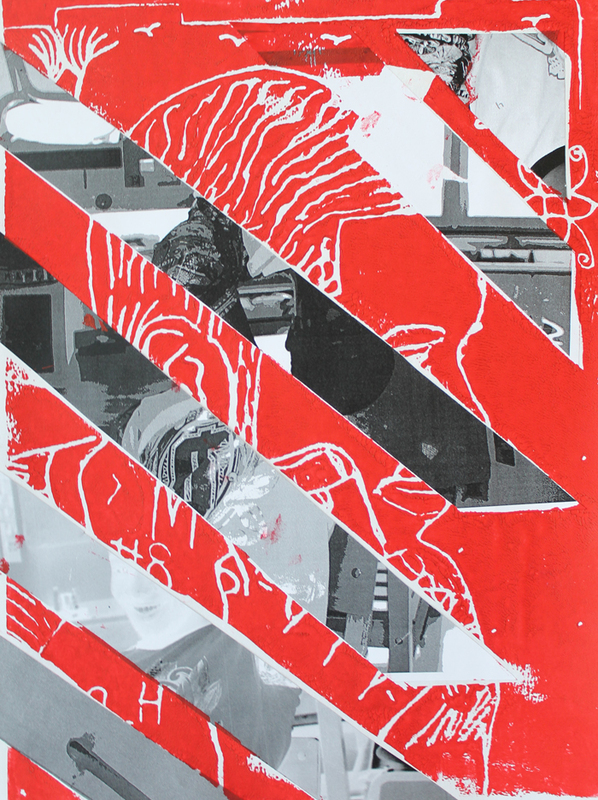 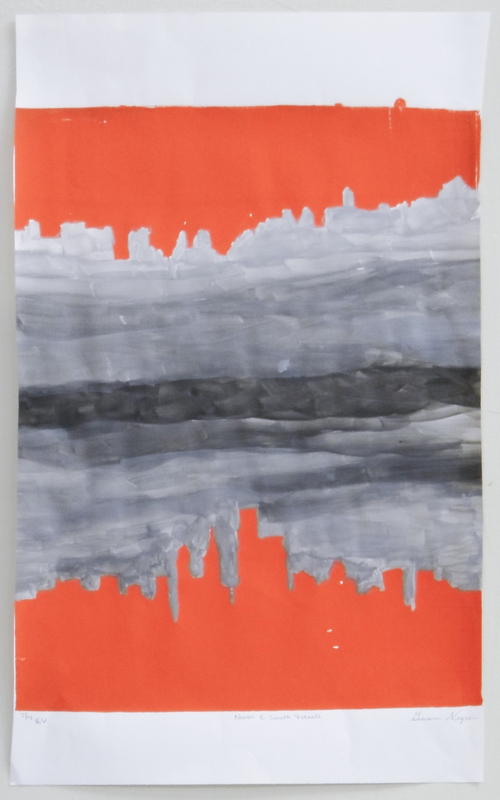 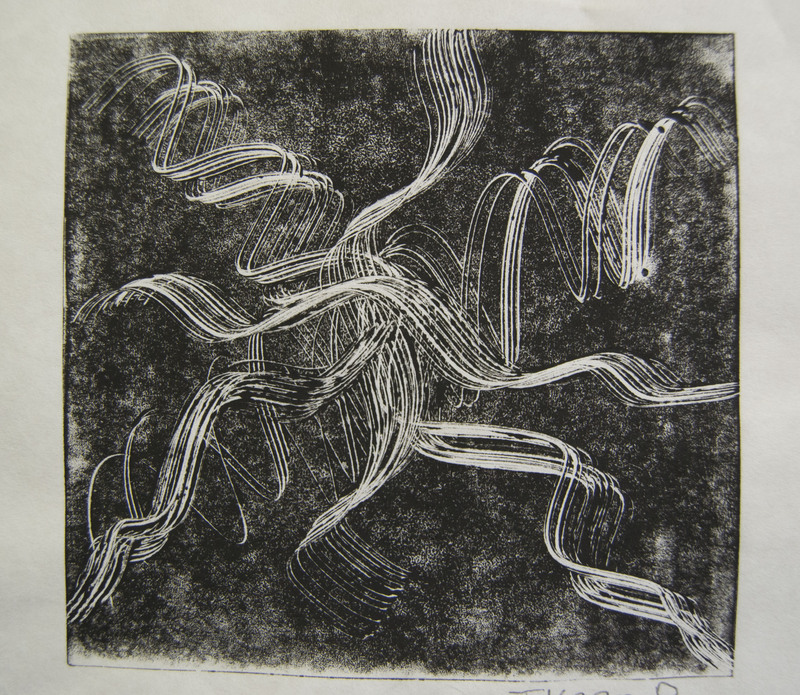 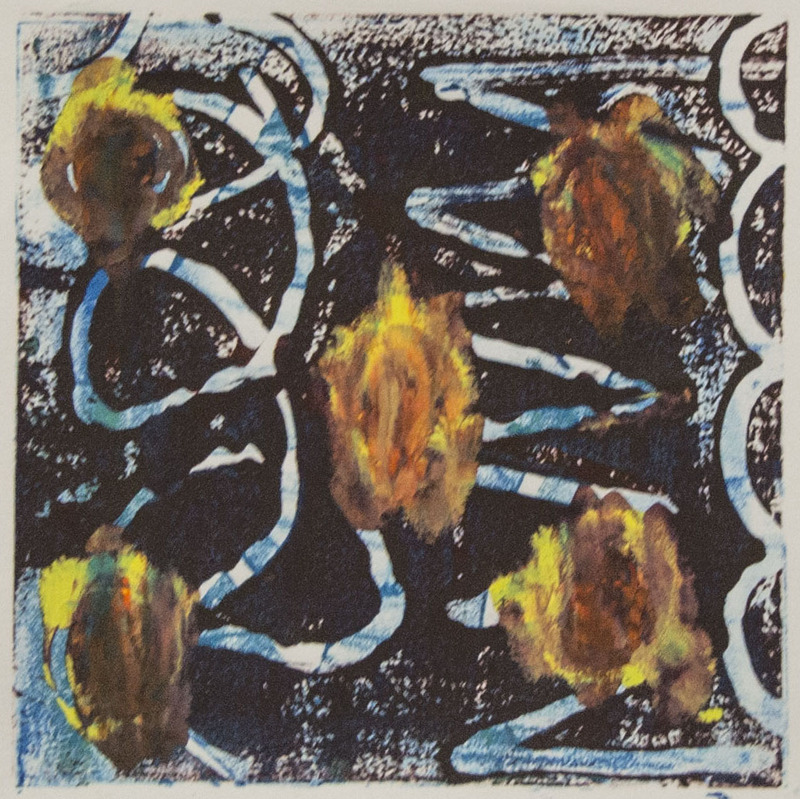 In this residency, students used text and imagery to explore a variety of printmaking techniques, experimenting with patterning and repetition to create and change the meaning of individual units. 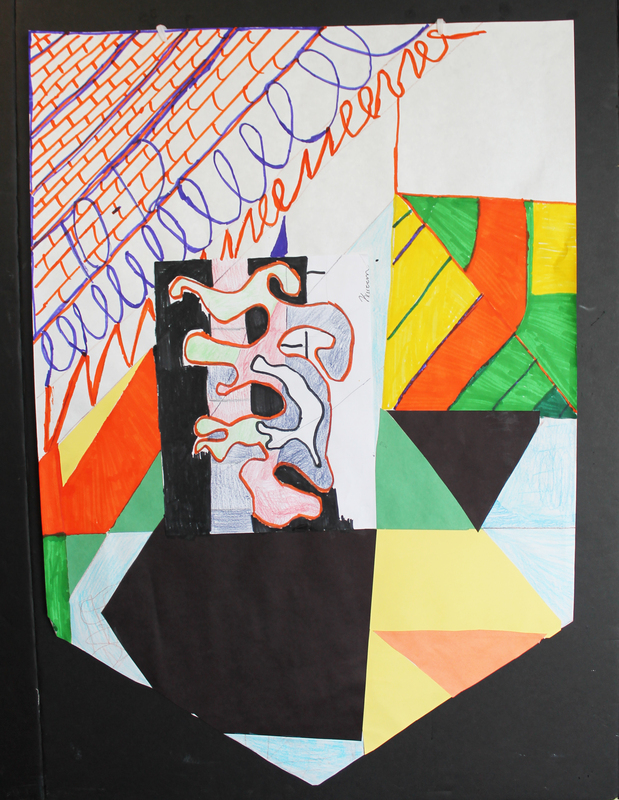 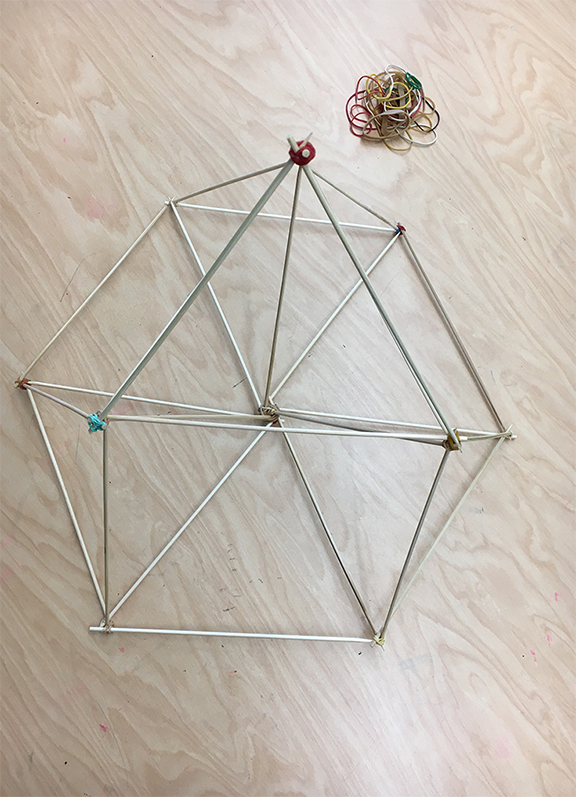 Inspired by Edna Andrade’s work, students explored formal themes of geometry, illusionistic perspective, pattern and dynamic color relationships as well as a conceptual interest in dismantling the distinction between “fine art” and its broader commercial applications. 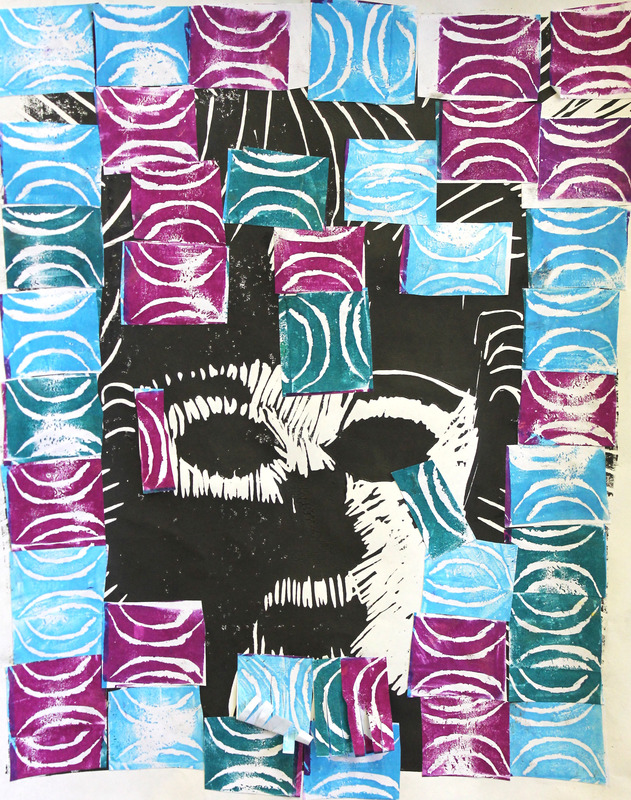 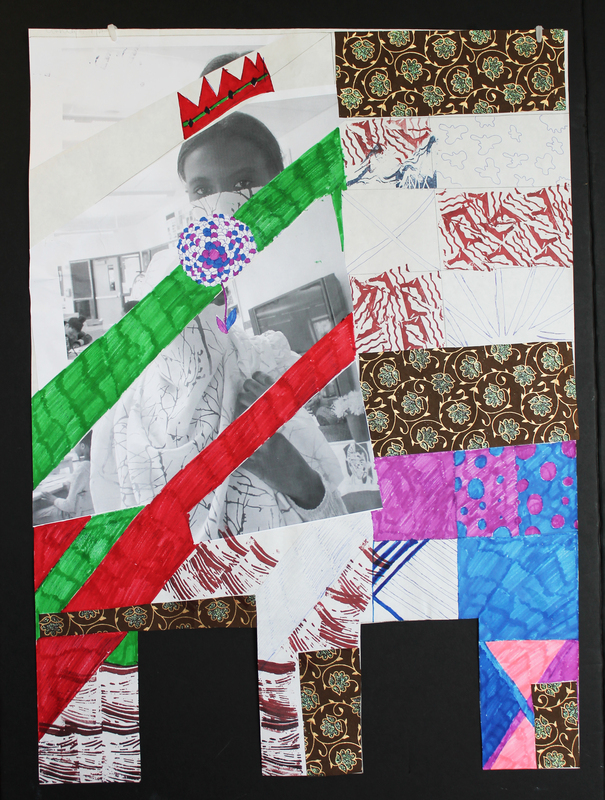 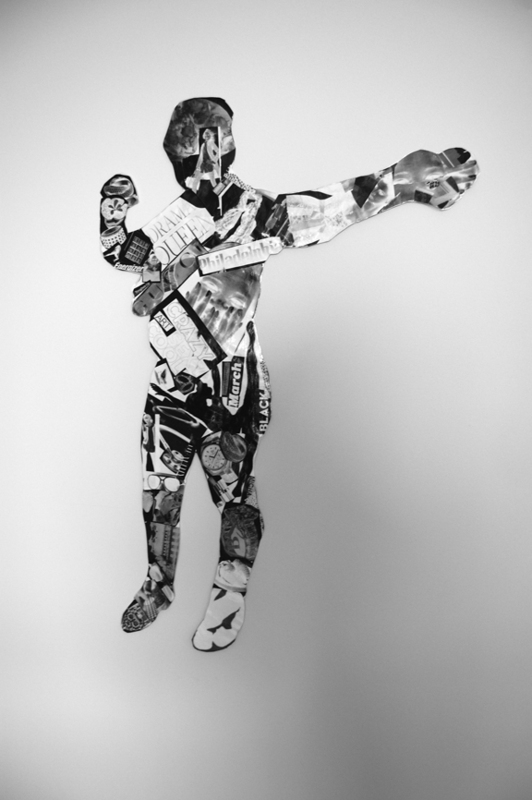 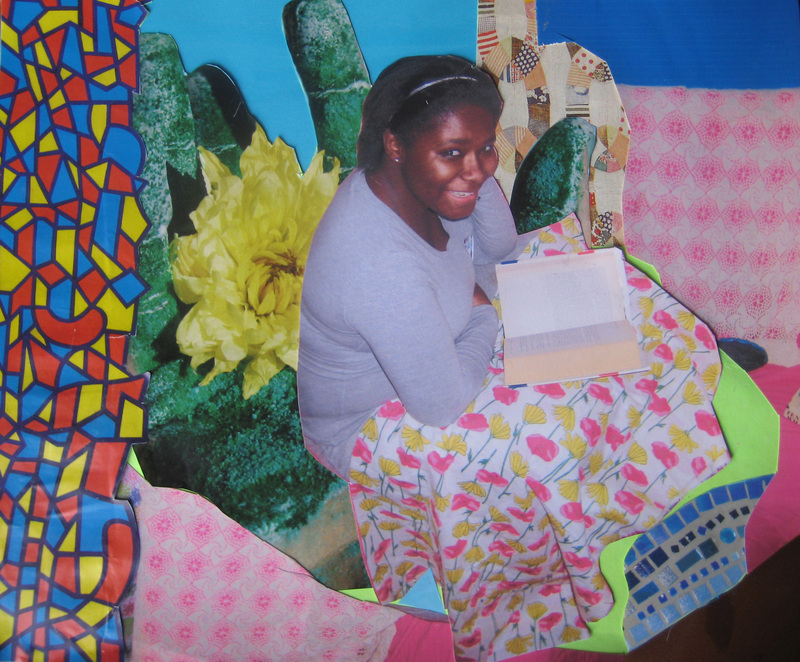 In this residency, students created layered self-portraits using printed patterns to explore the ideas of camouflage and contrast. 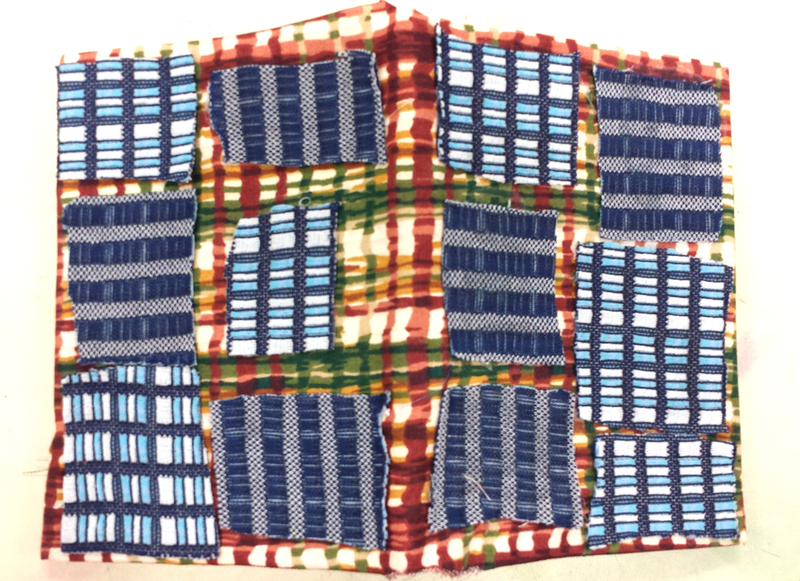 The project emphasized formal experimentation with pattern and color, and involved building up a multiplicity of layers through repetition and overlap. 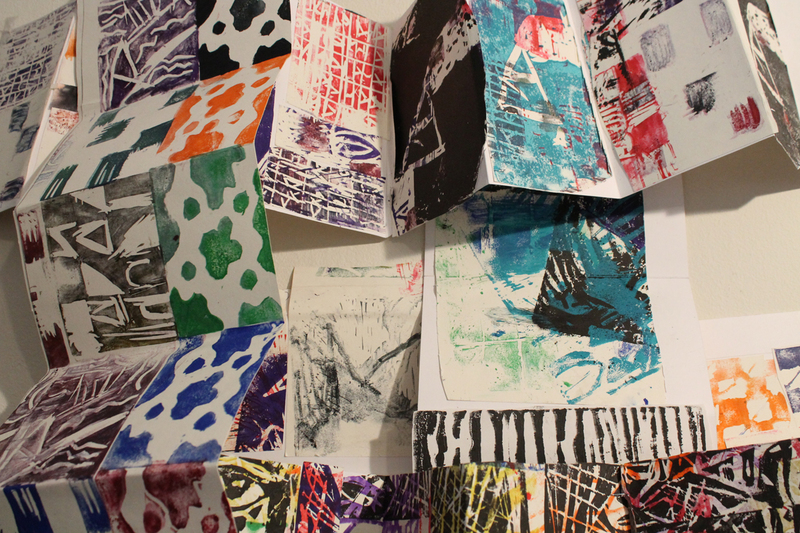 Students completed individual pieces, as well as a collaborative print on a large paper scroll. 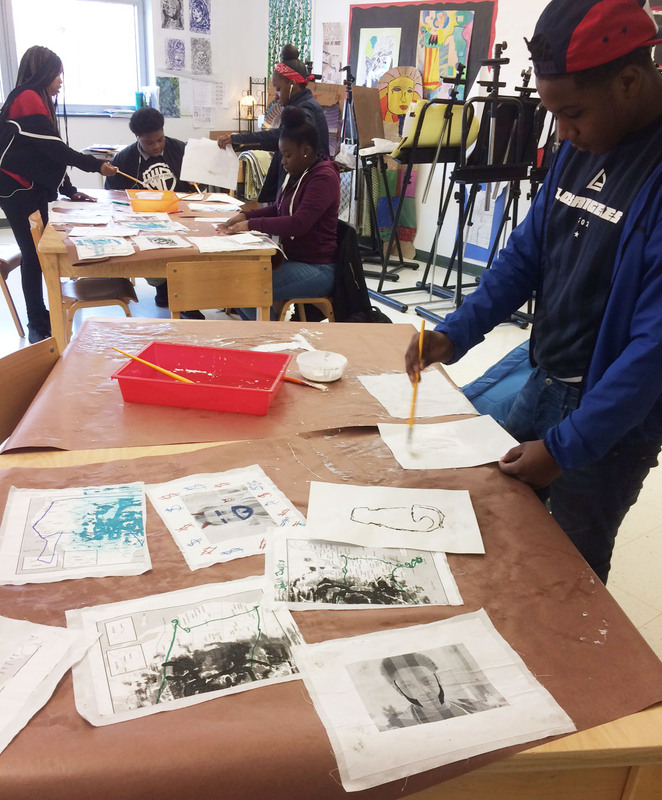 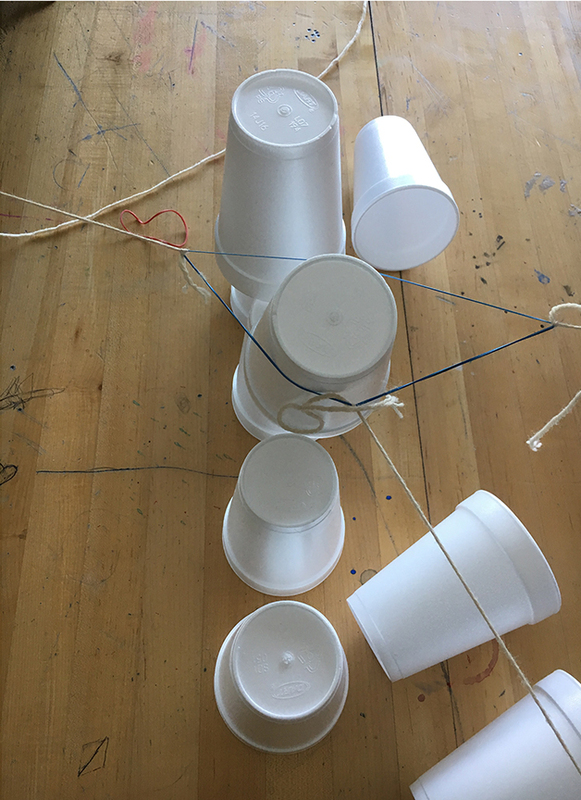 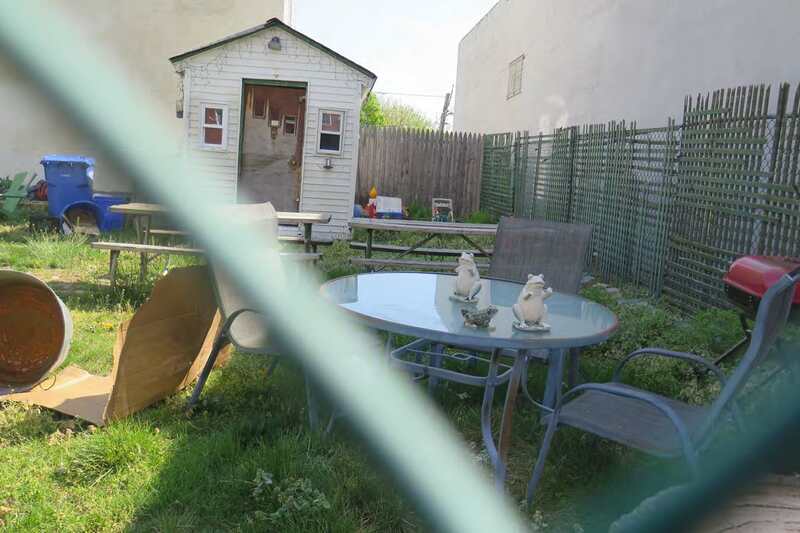 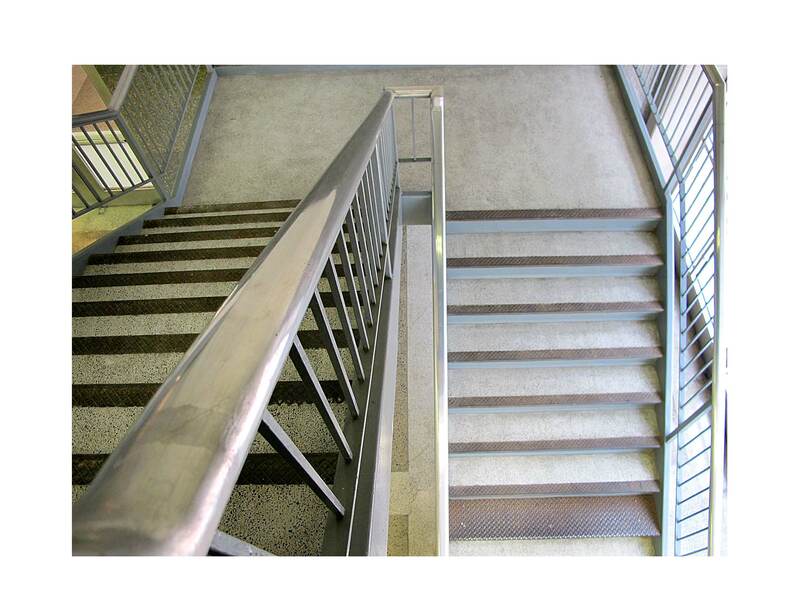 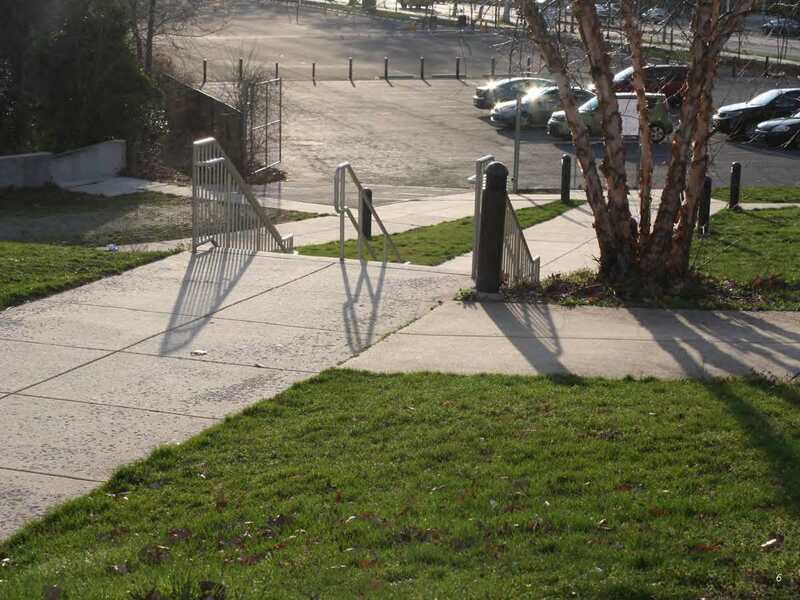 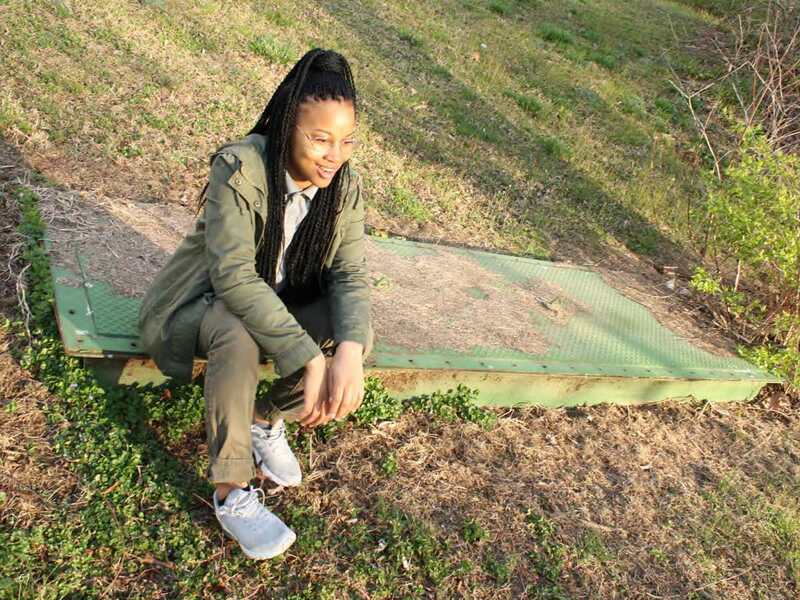 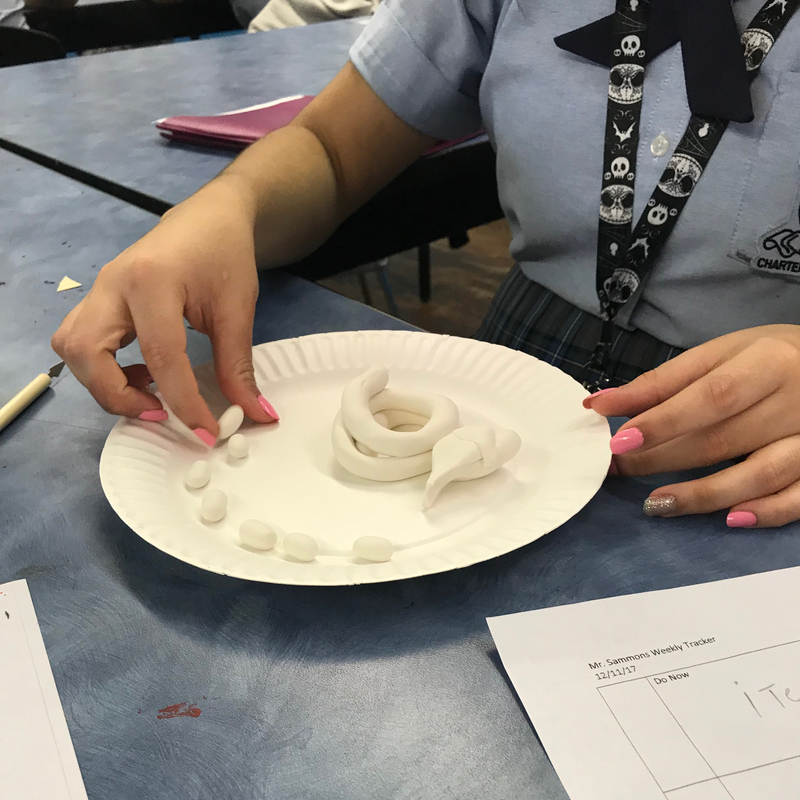 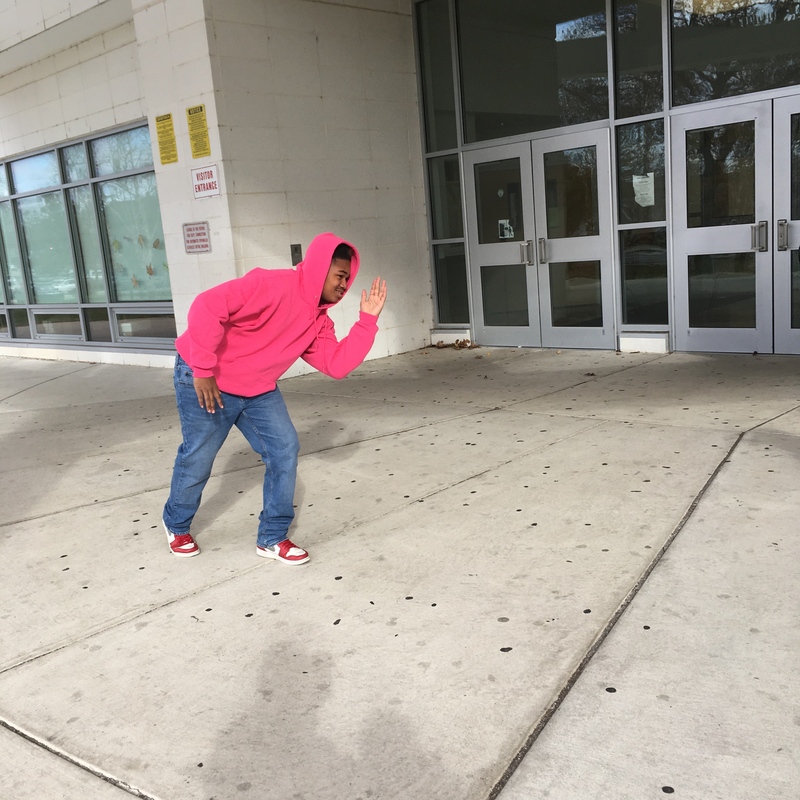 Students at Kensington Health Sciences Academy explored various mundane postures and settings they found themselves in during their everyday lives. 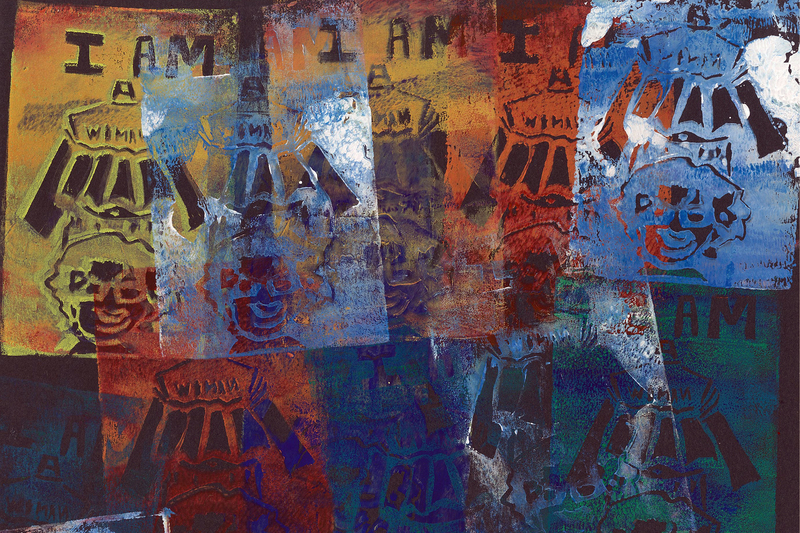 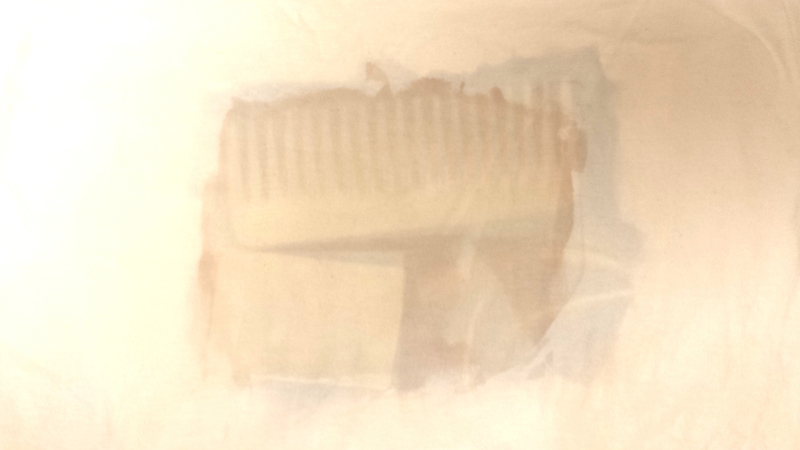 Using digital photography and light-sensitive printmaking techniques, they made works that addressed the role of "self" and created original t-shirts as an homage to their own environments and everyday lives. 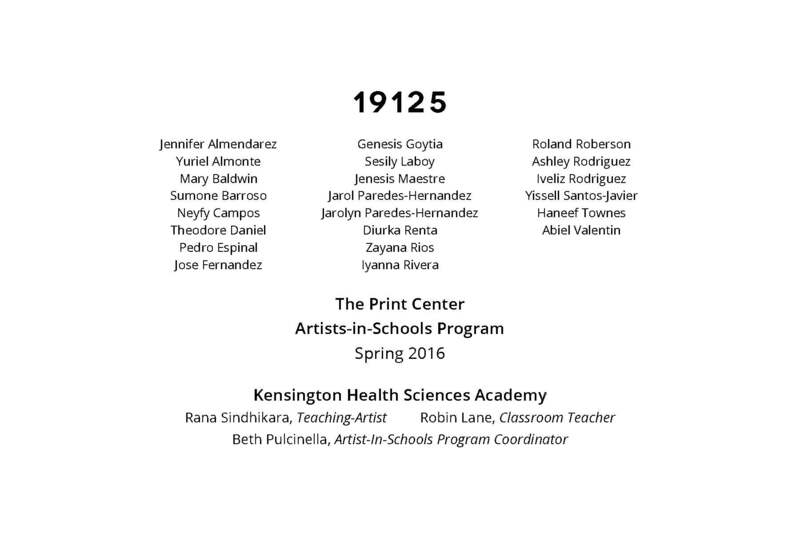 Student-artists in this gallery of work include Rafael Bizaldi, Katherine Esparra, Vianco Orozco, David Petraitis and Helen Reilly.